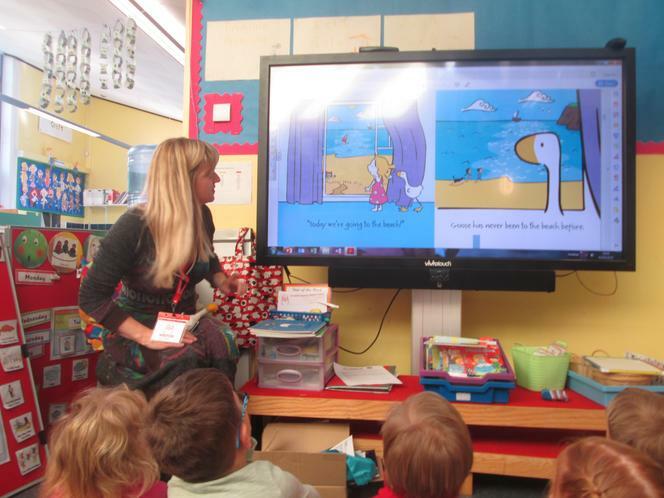 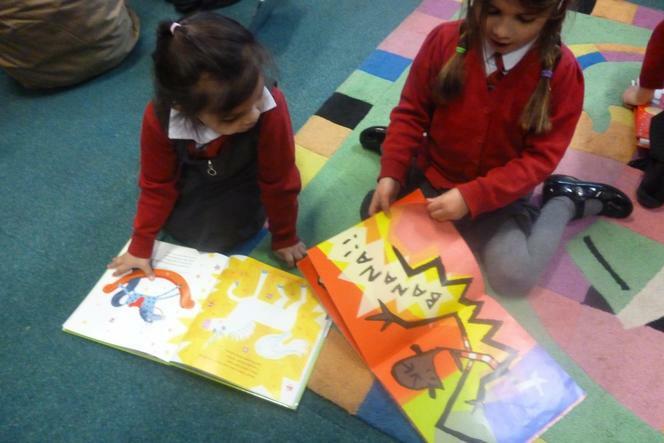 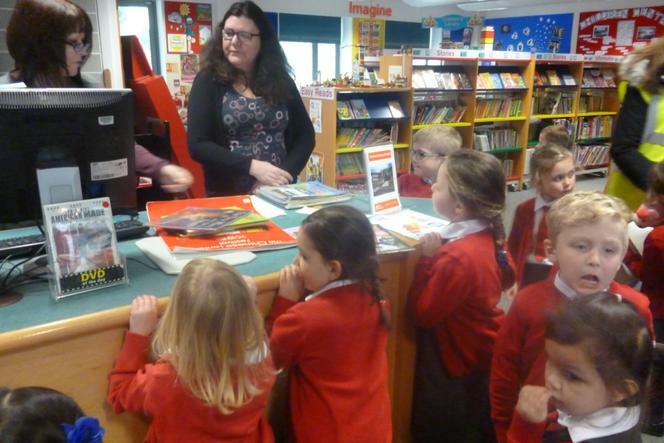 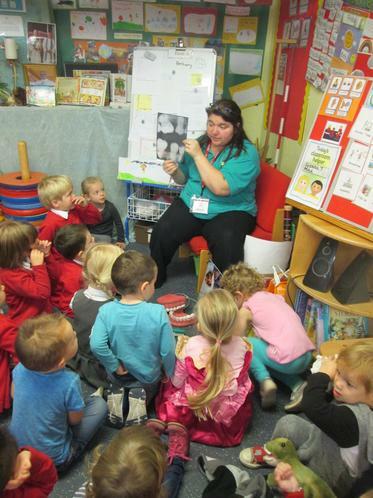 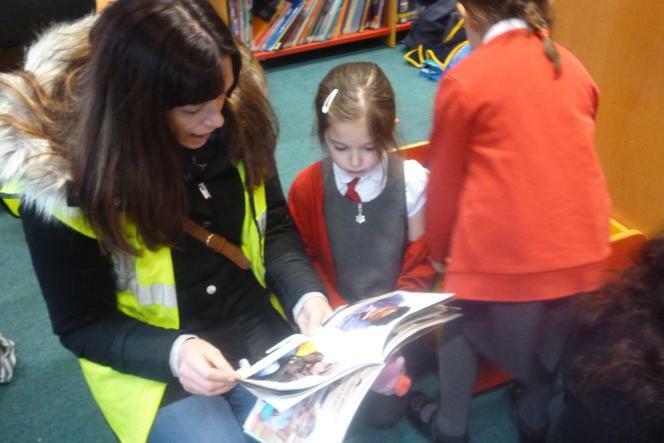 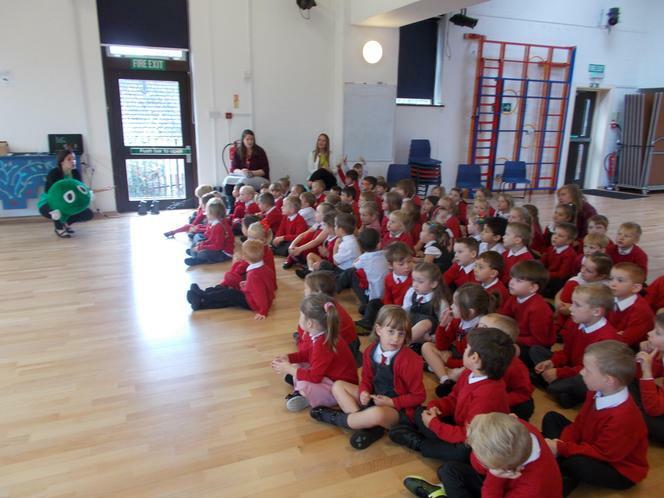 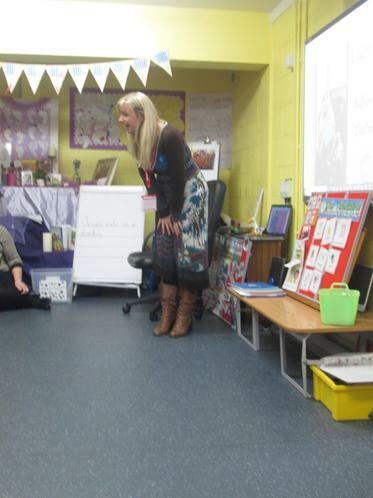 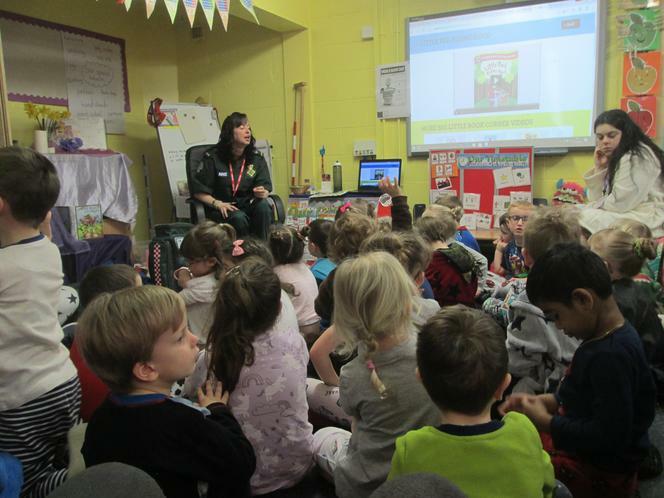 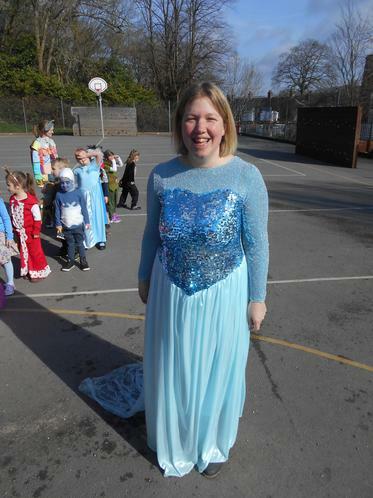 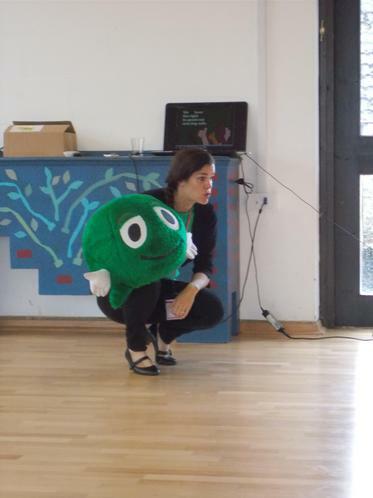 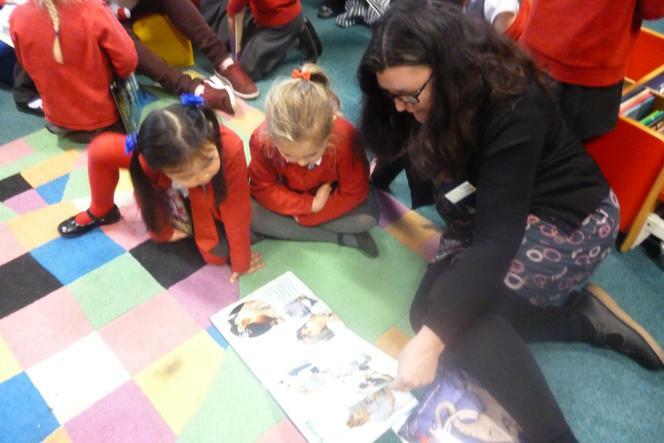 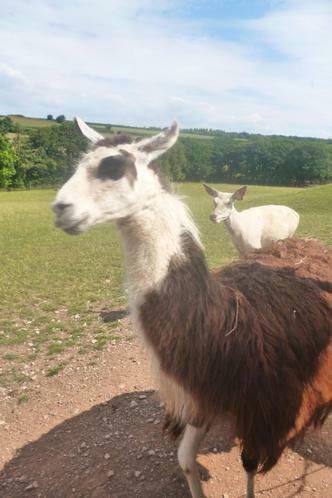 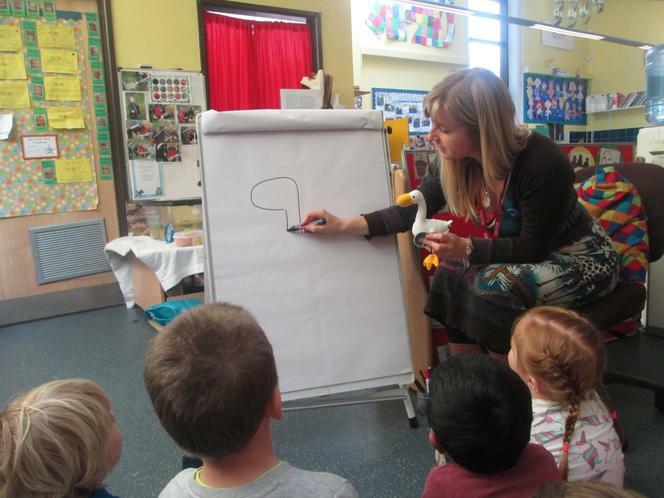 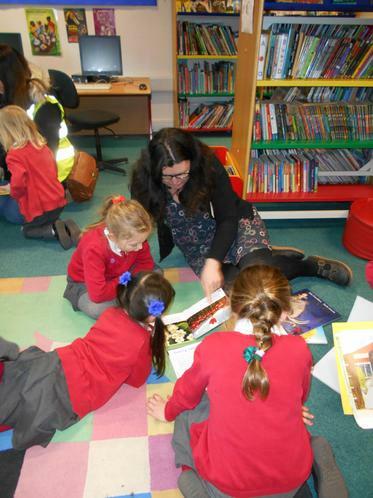 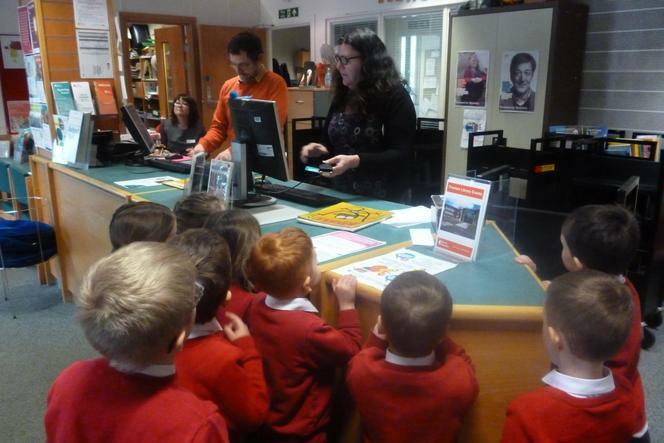 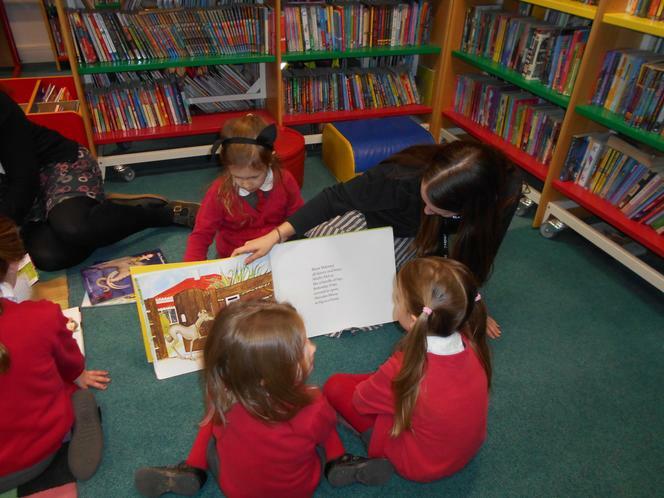 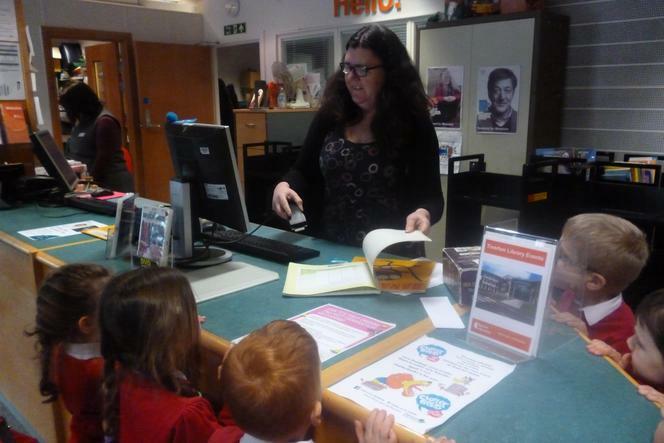 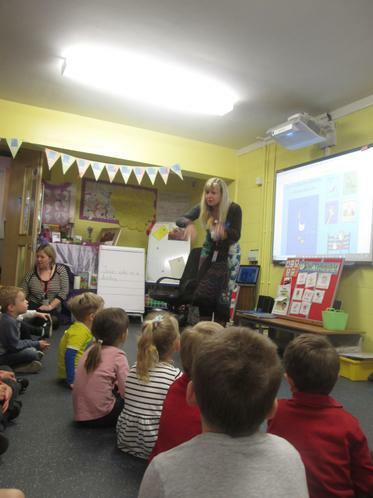 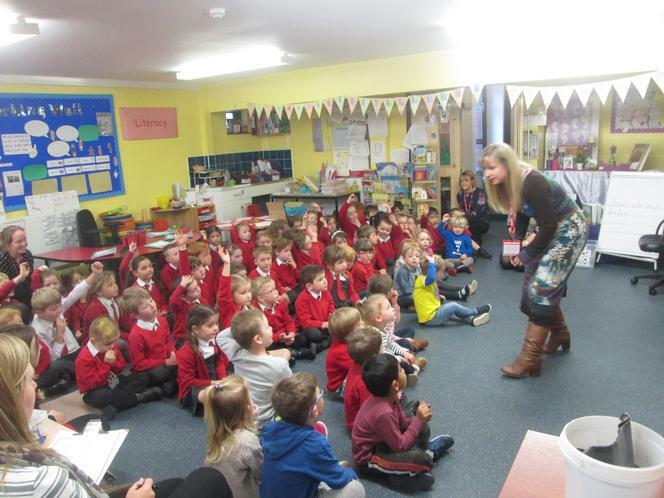 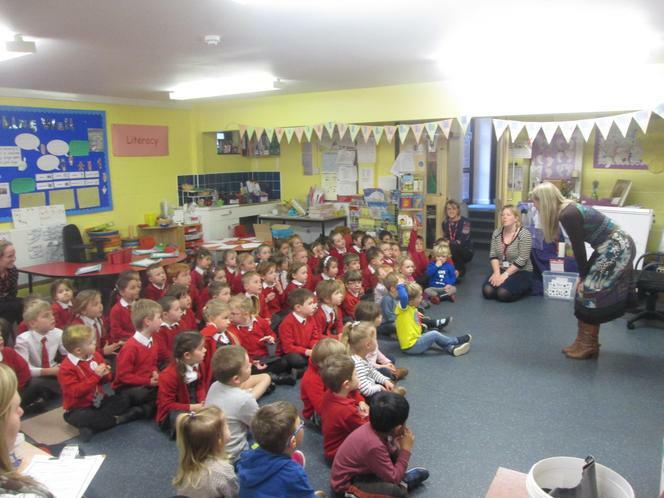 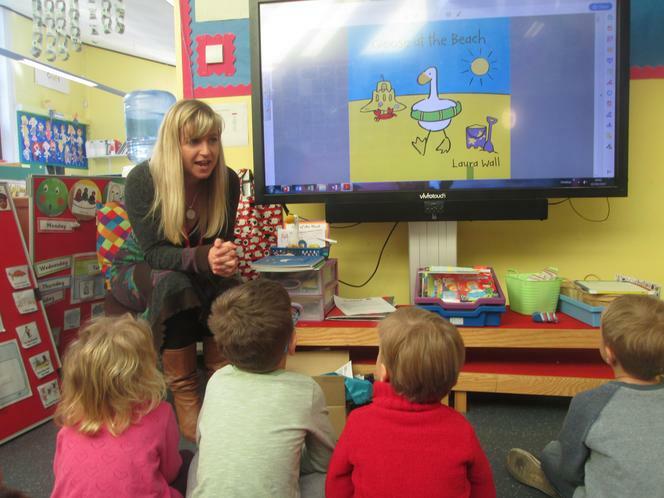 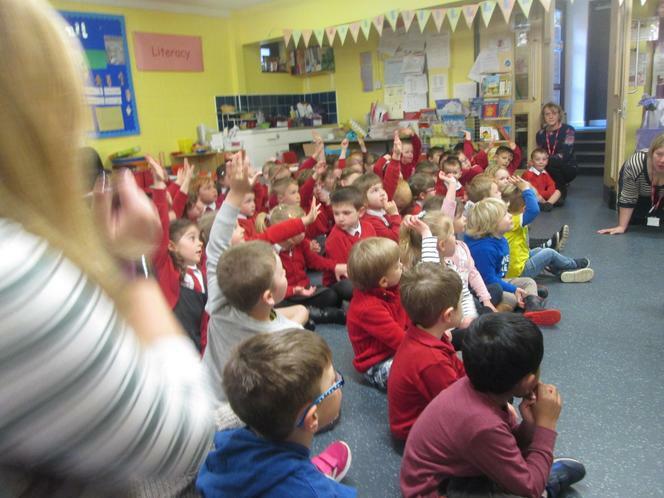 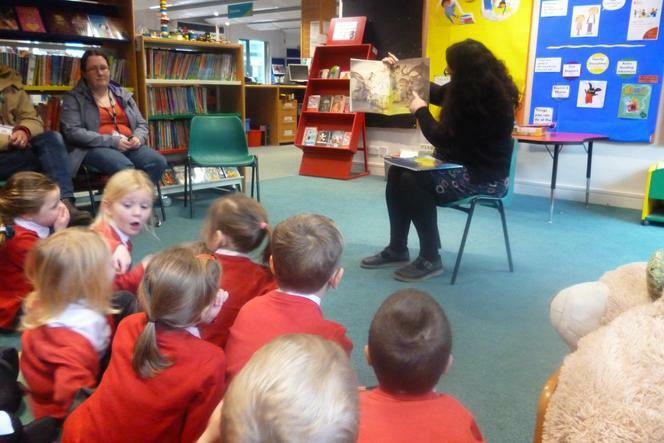 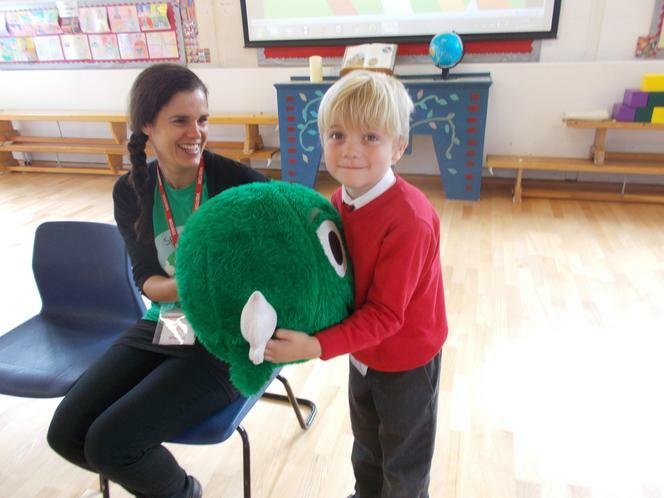 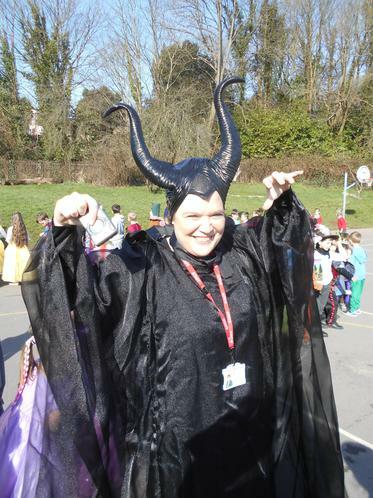 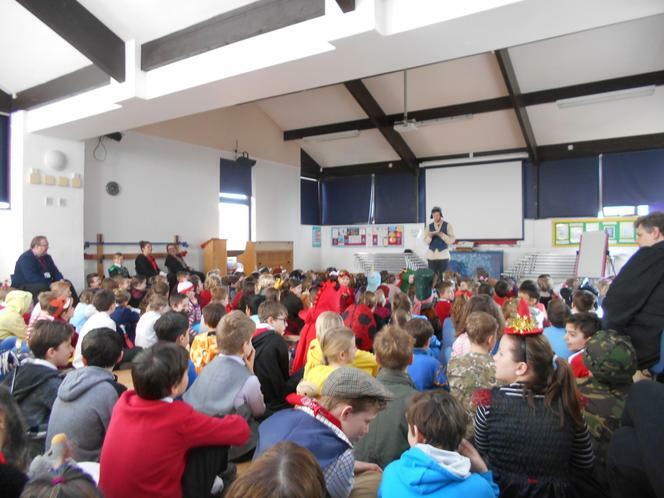 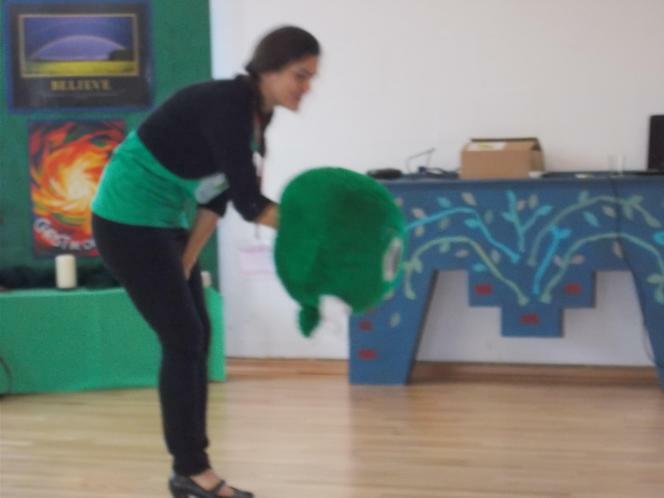 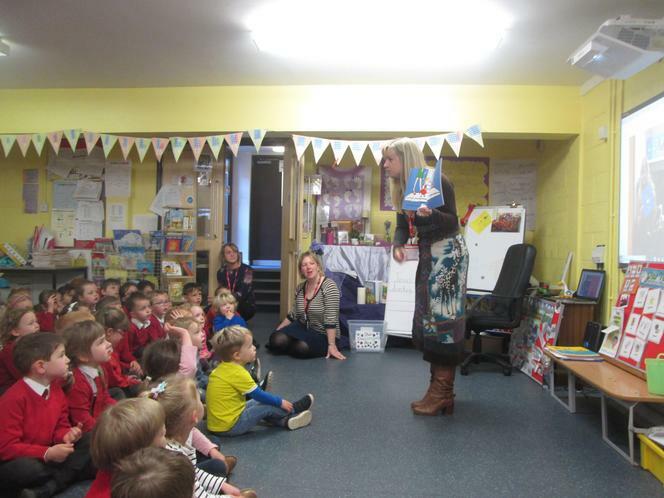 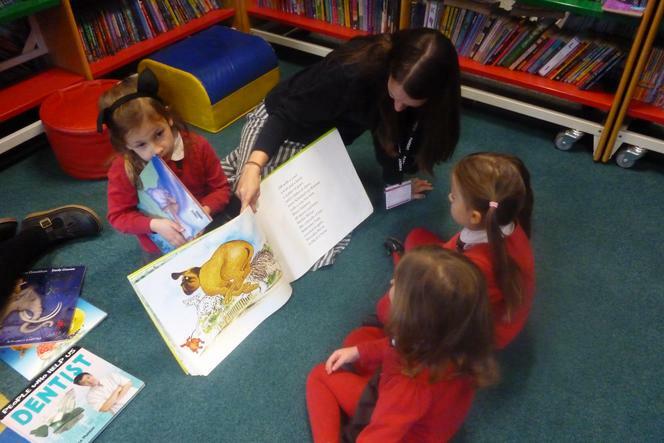 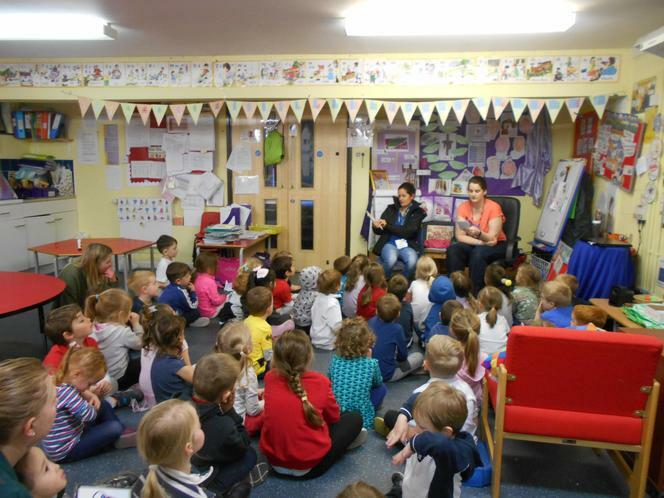 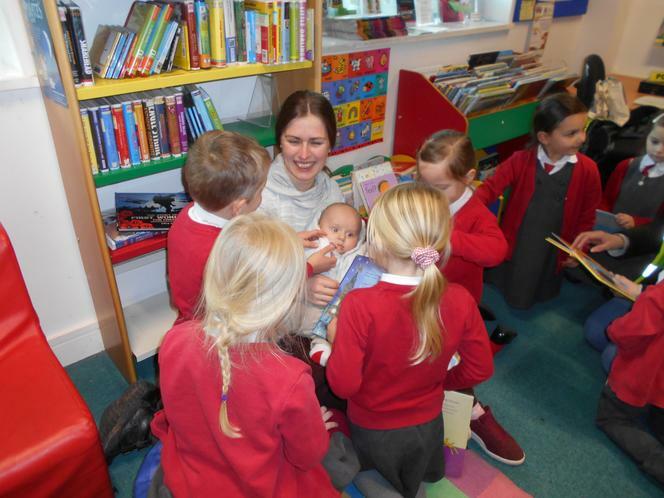 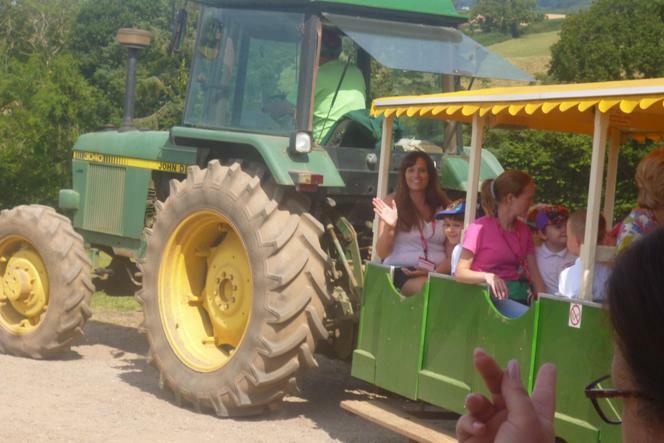 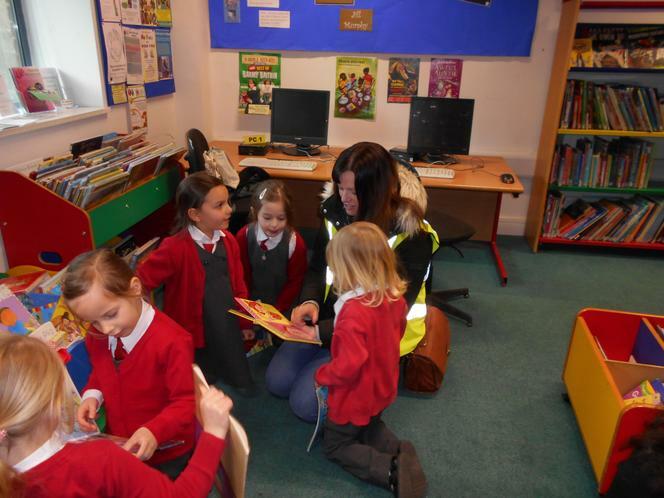 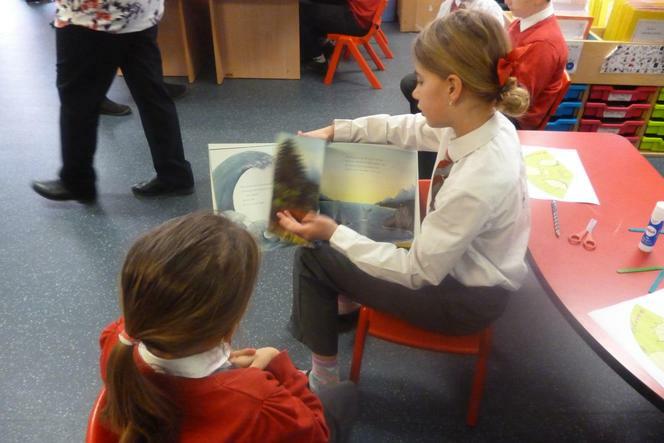 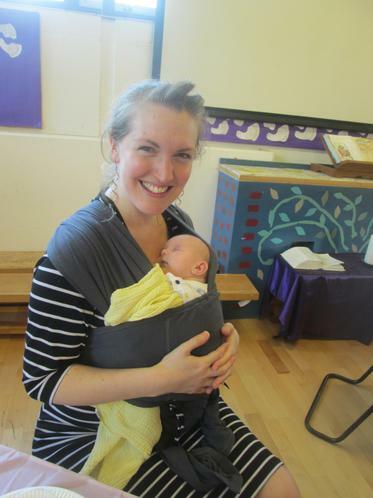 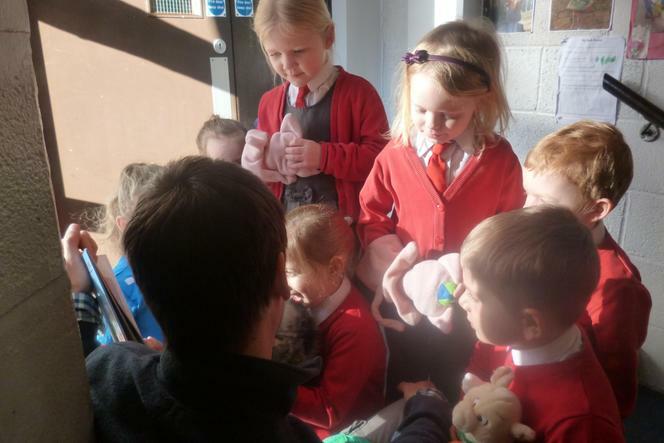 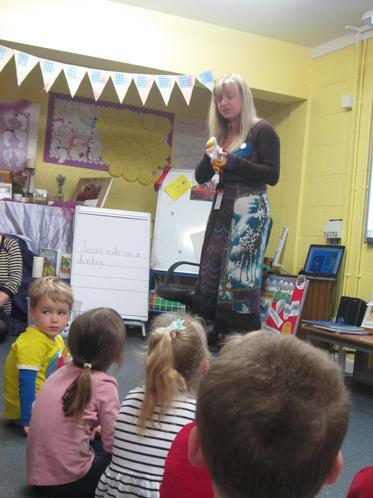 Author Visit - This week, the lovely Devon author and artist, Laura Wall visited Acorns. 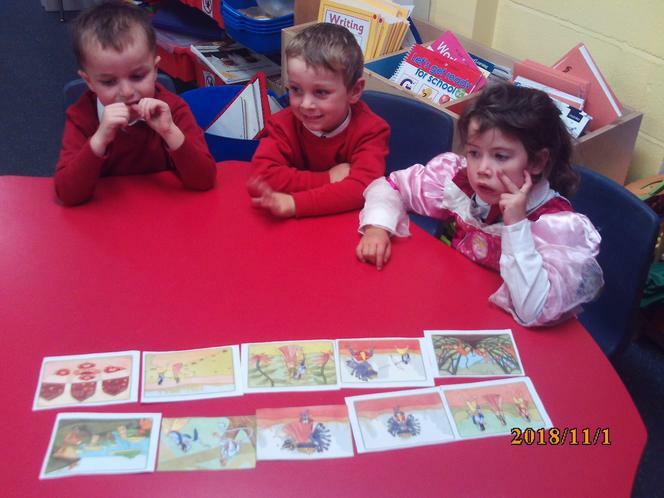 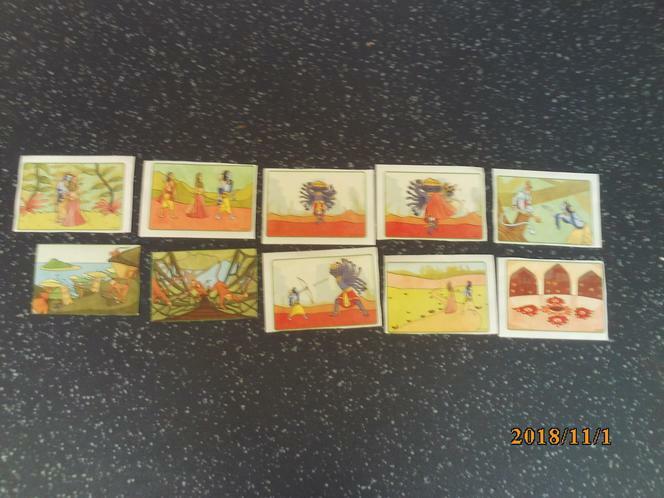 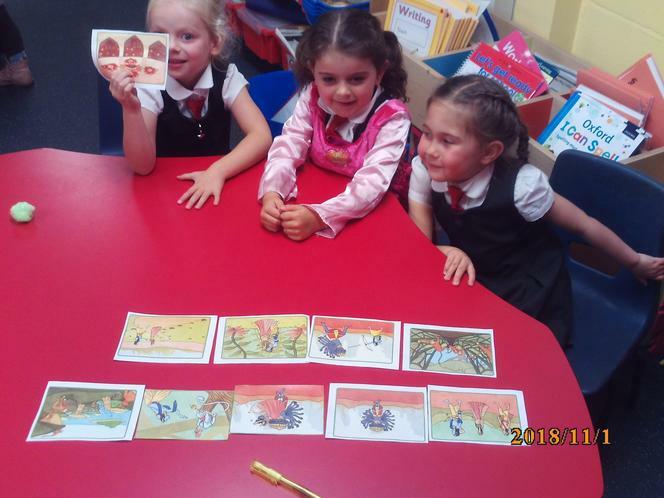 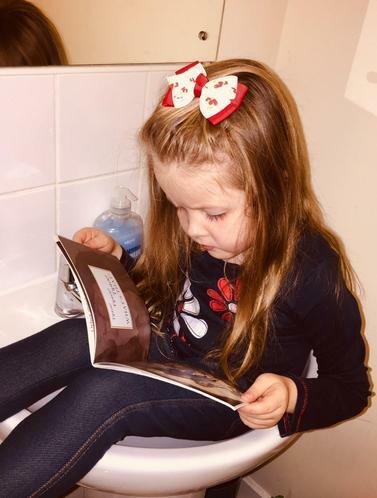 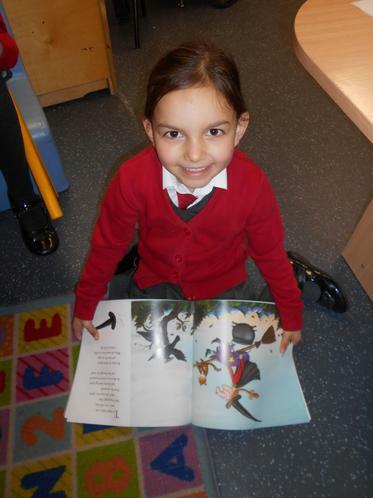 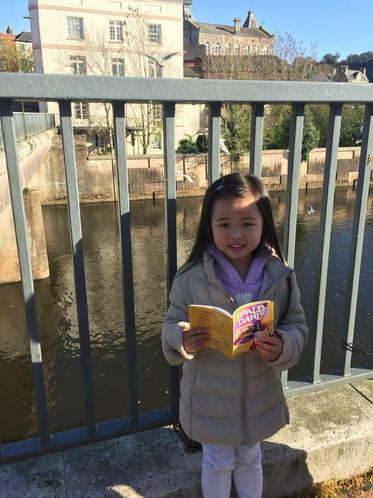 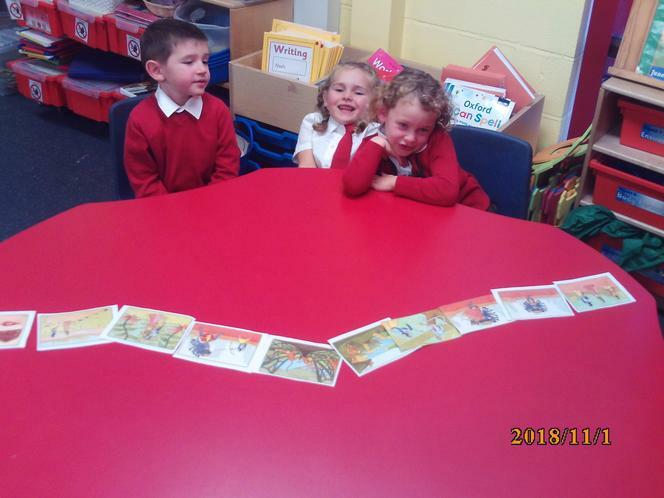 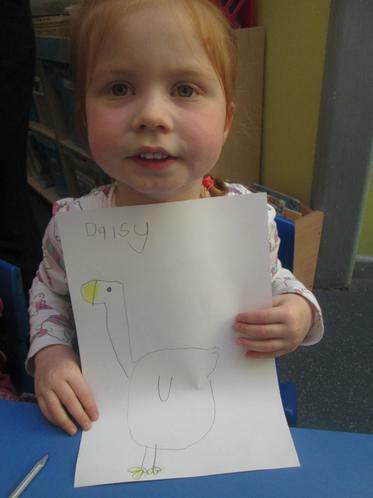 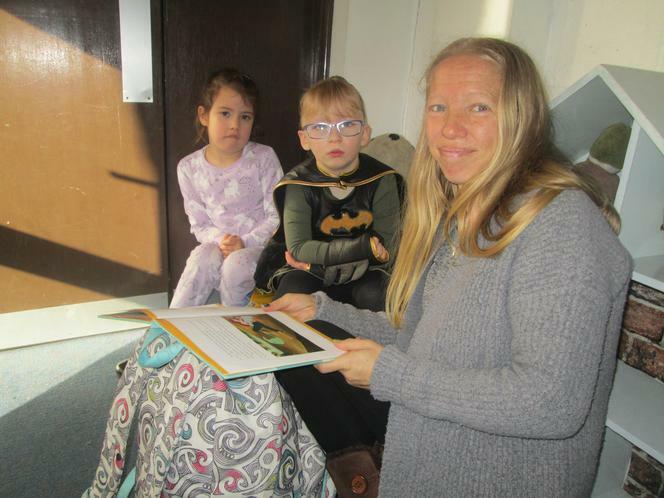 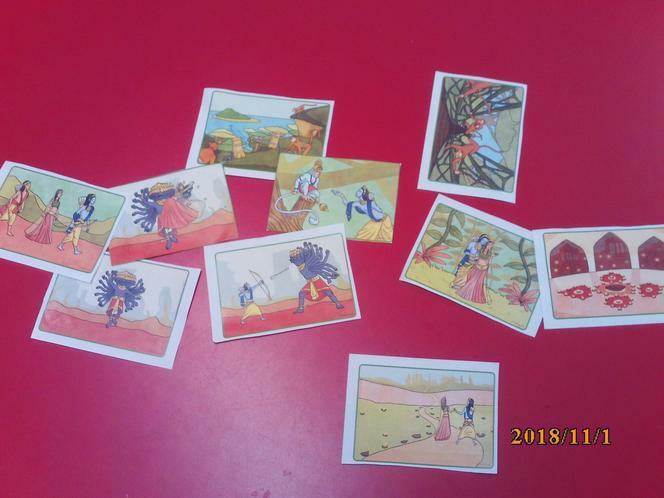 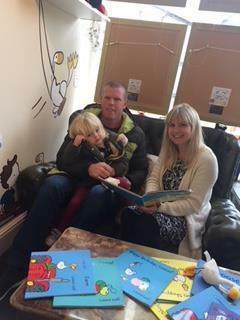 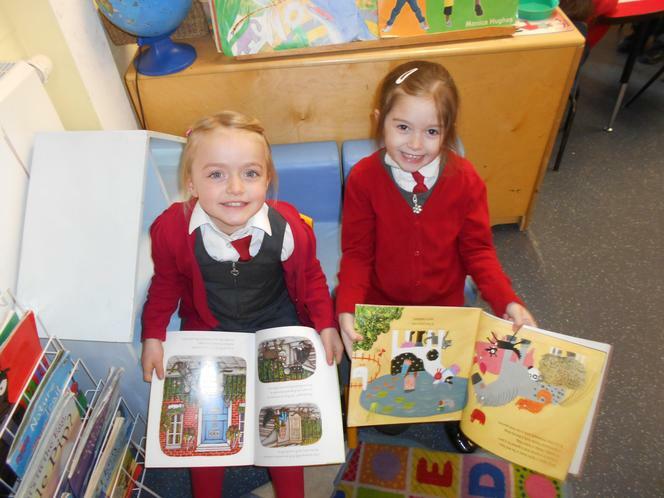 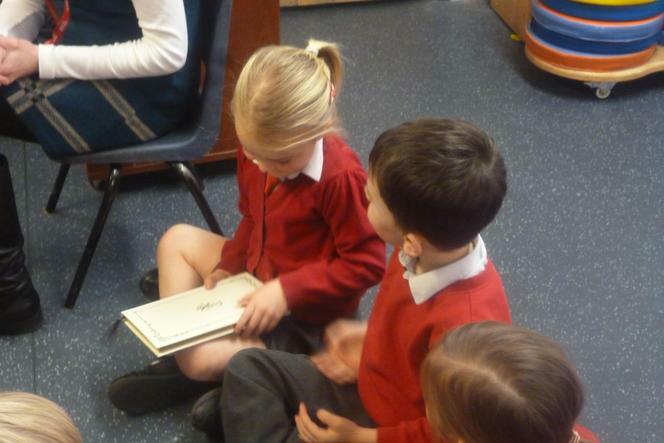 She delighted us with stories, illustrations and activities based on her series of Goose books. 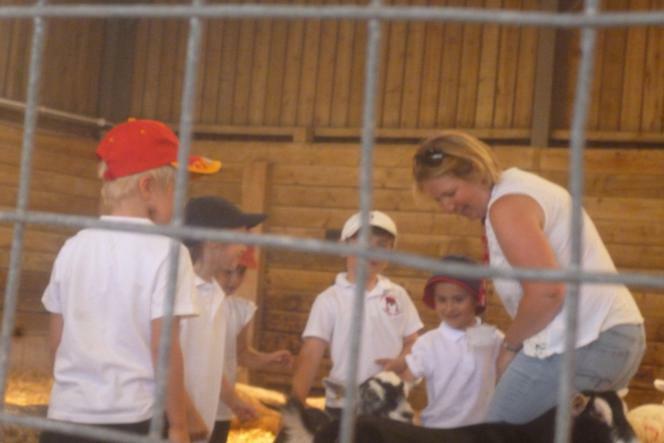 Thank you to our amazing PTA for paying for this brilliant experience. 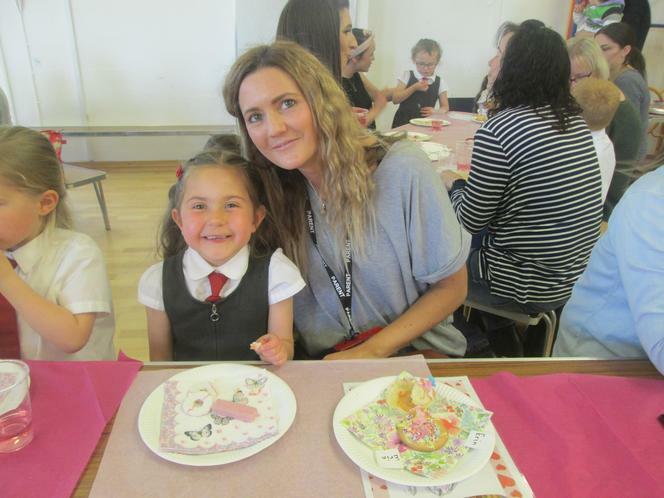 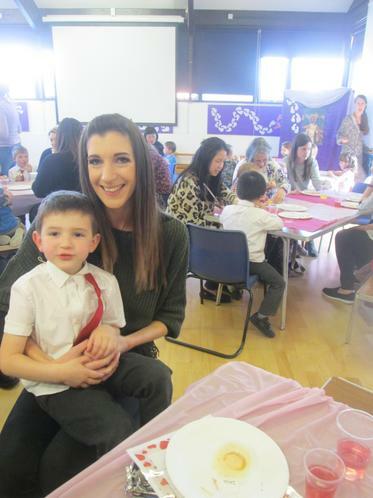 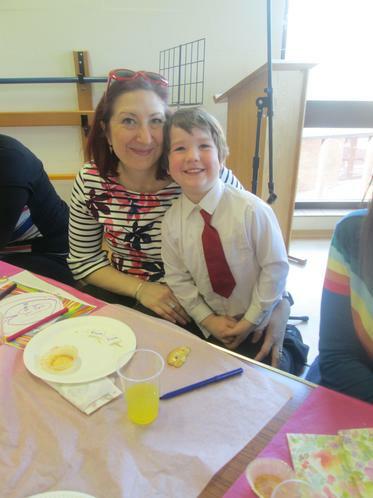 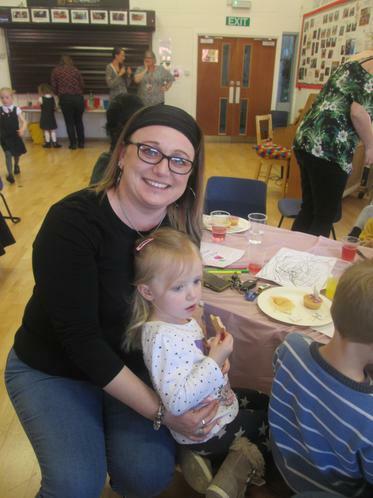 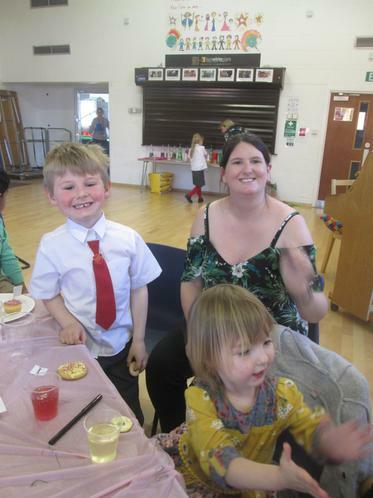 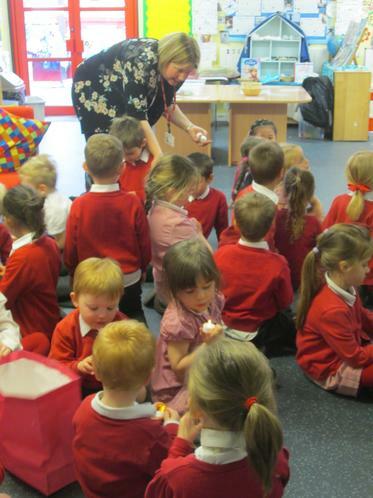 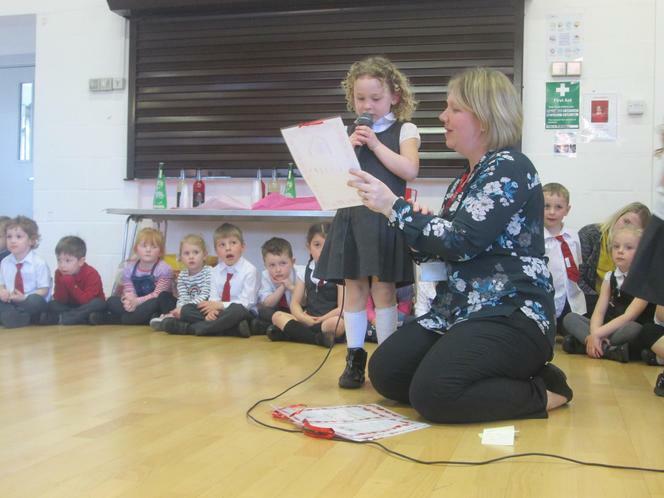 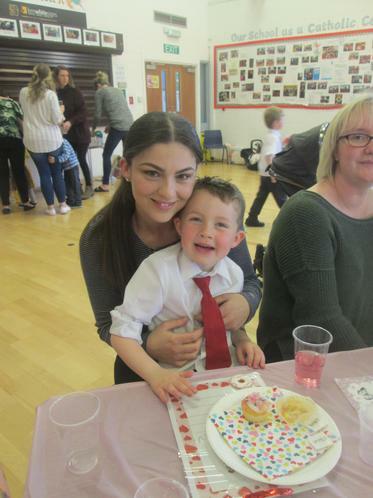 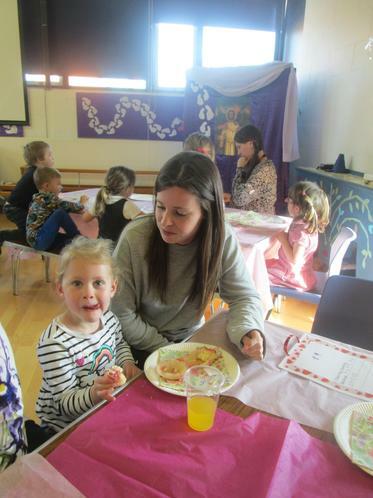 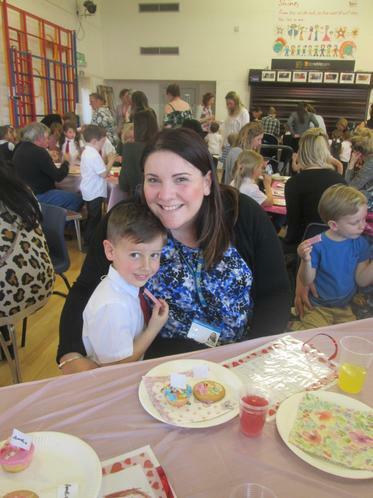 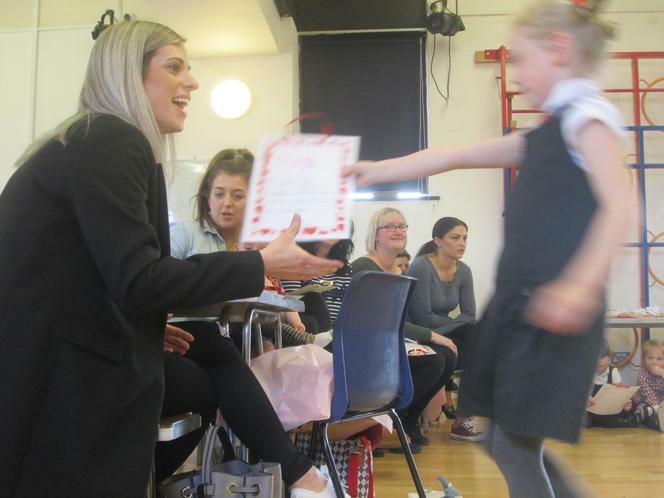 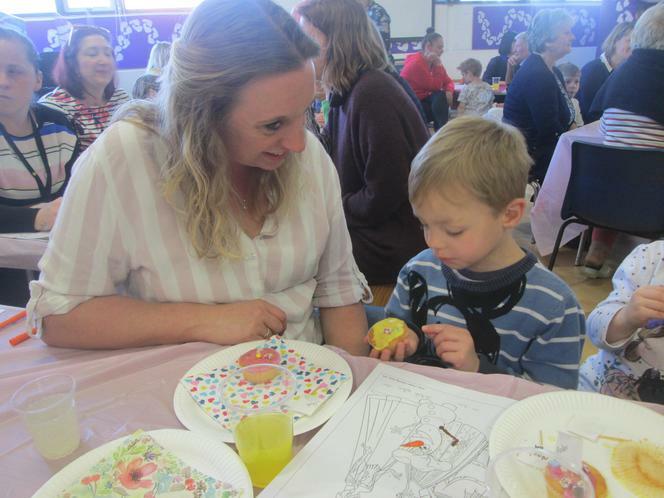 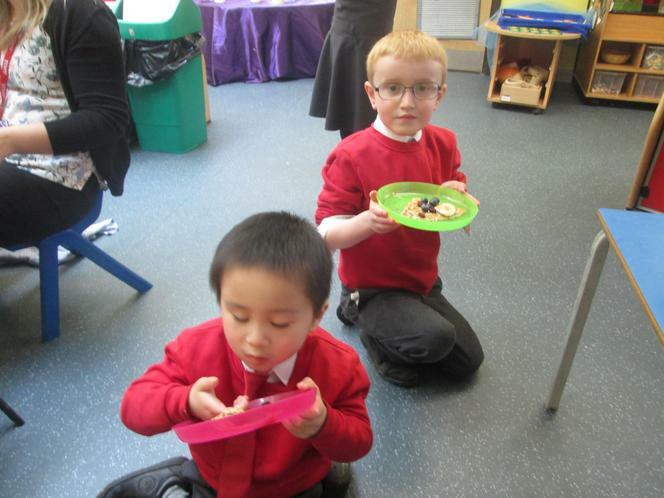 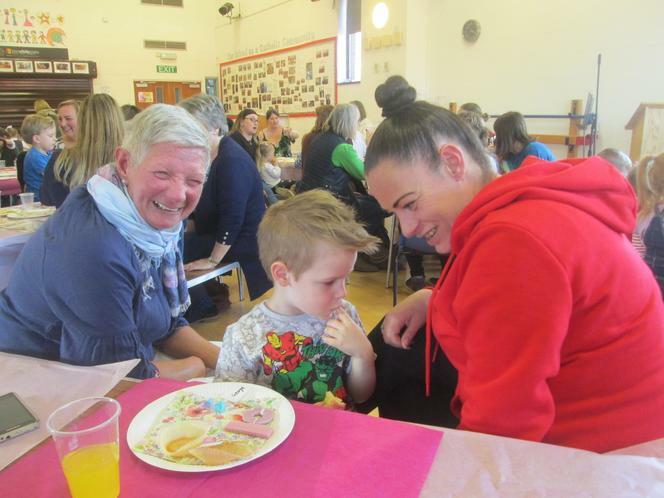 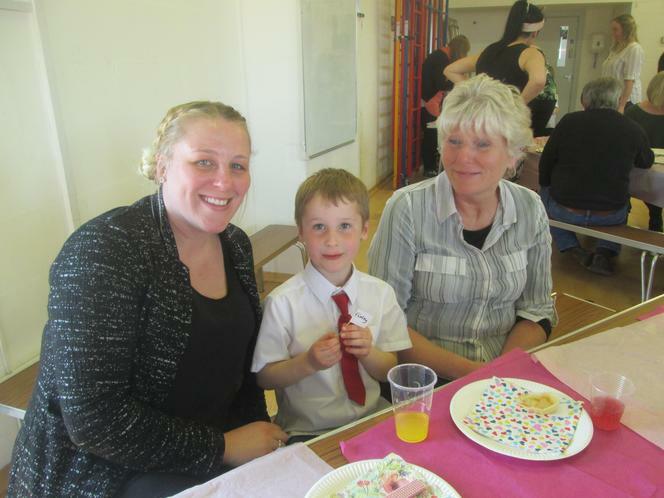 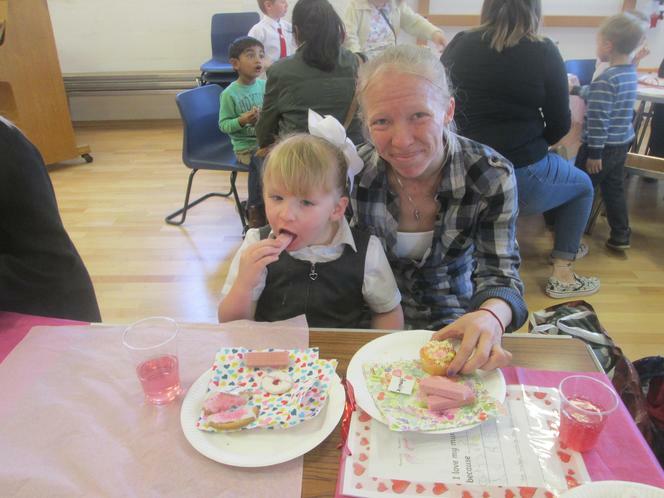 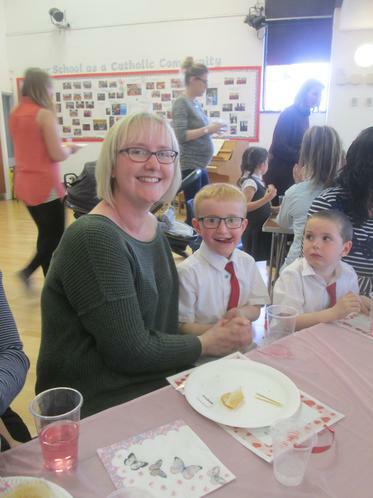 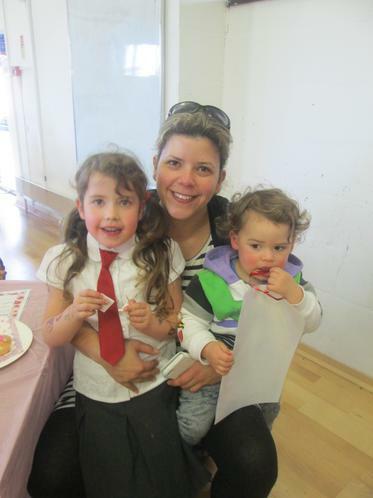 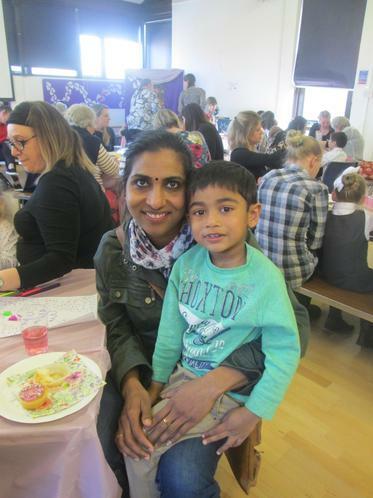 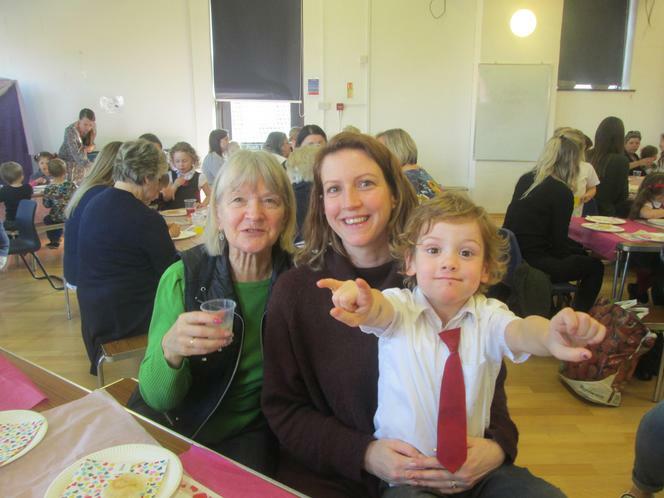 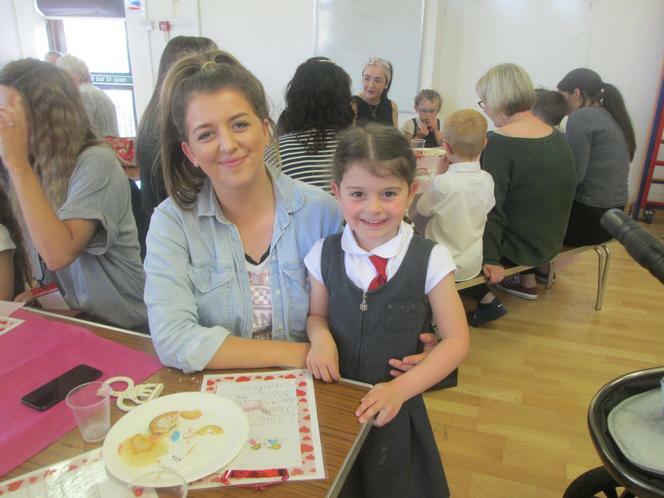 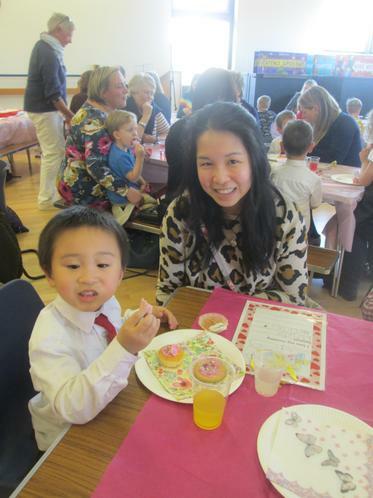 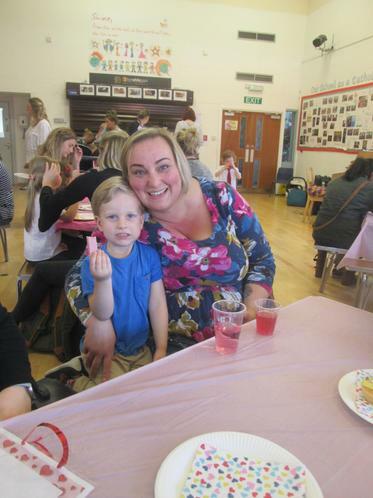 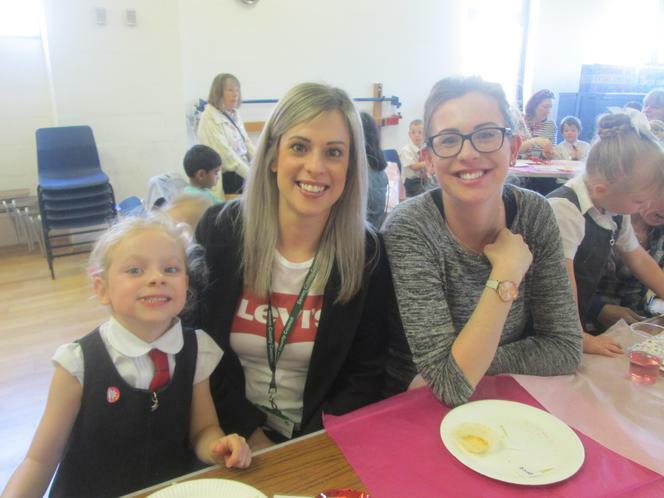 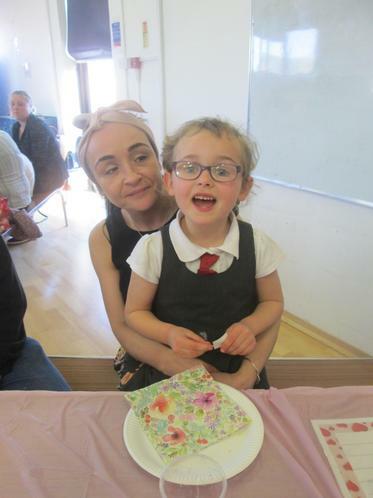 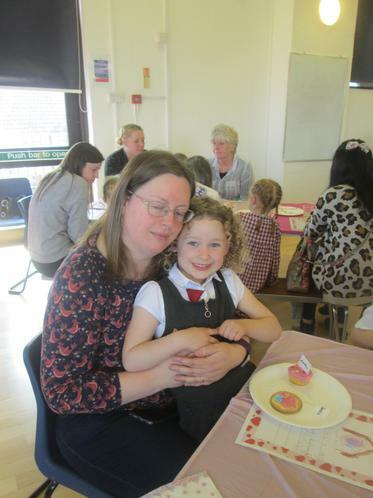 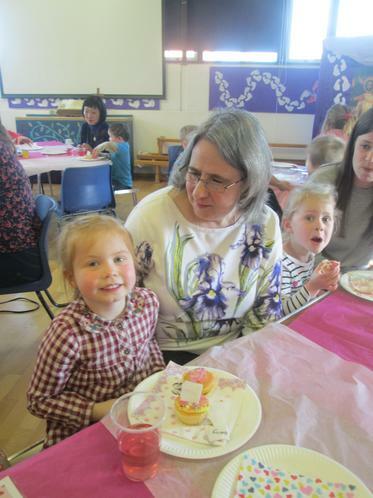 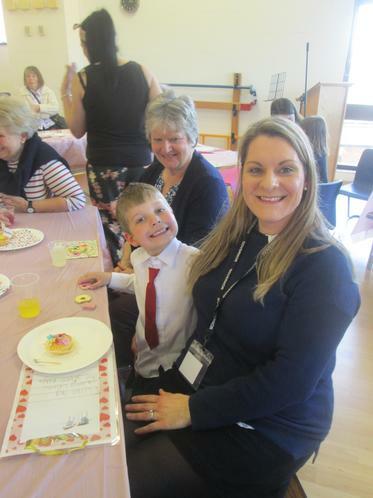 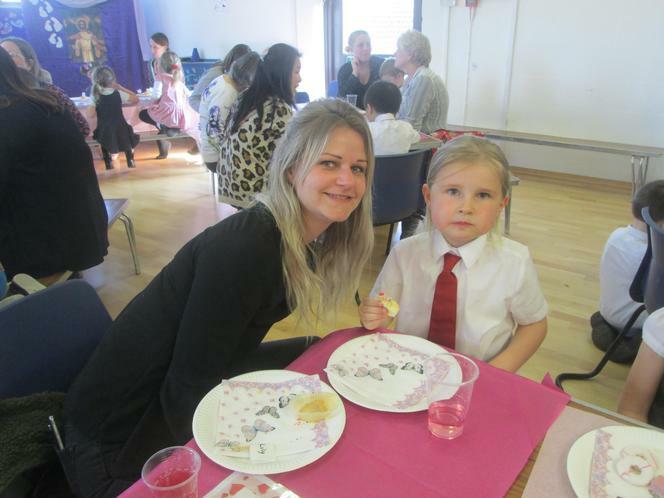 Our Mother's Day Tea Party - We sang to our mums and then presented them with cakes we had iced for them. 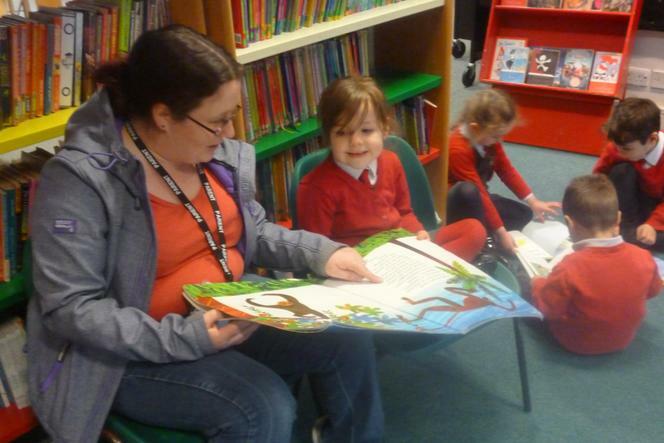 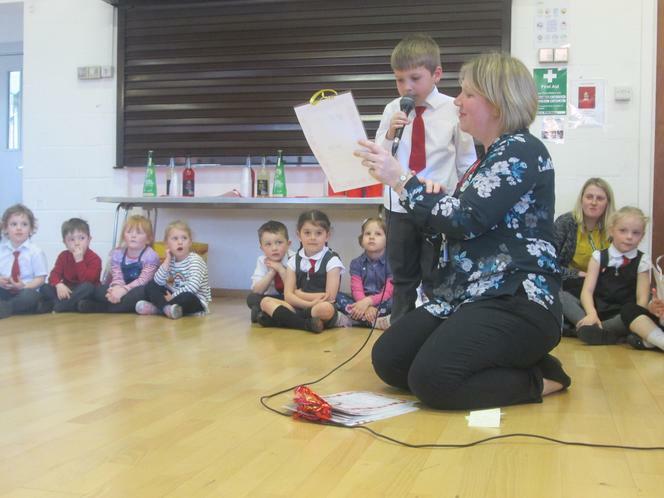 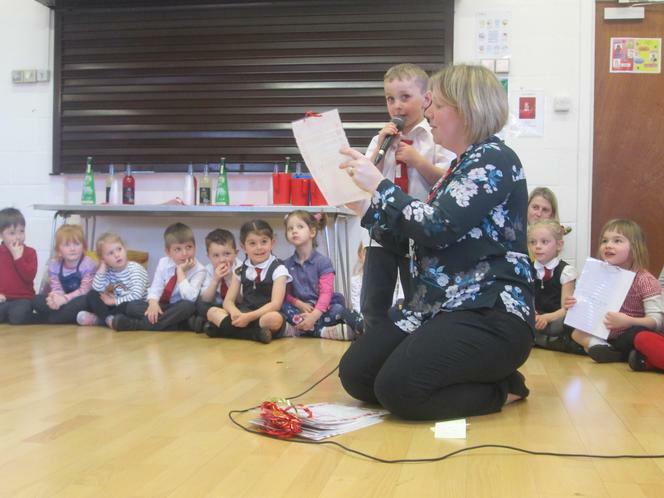 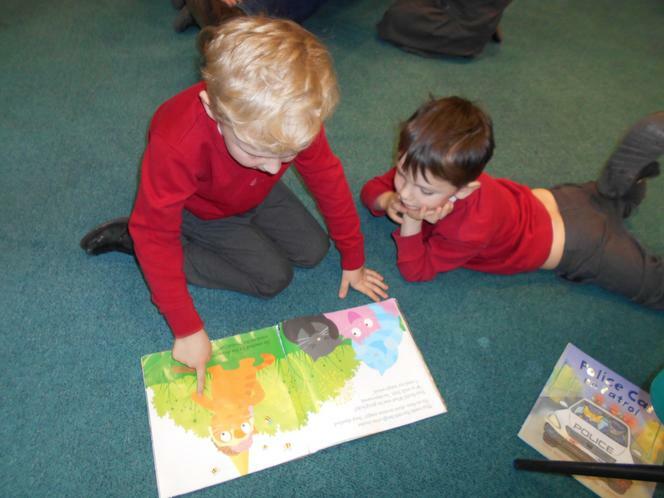 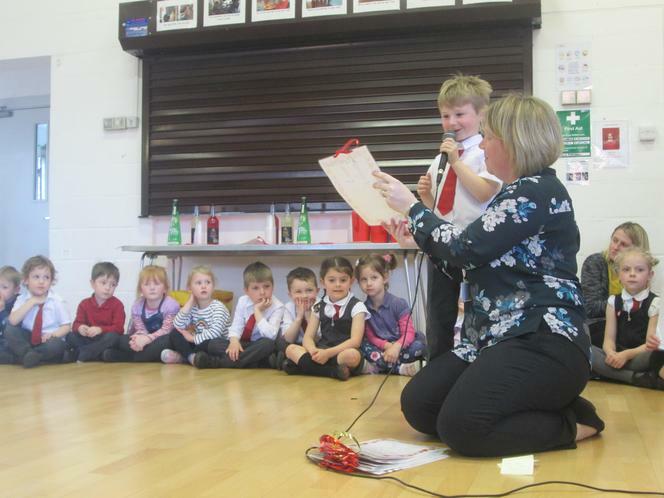 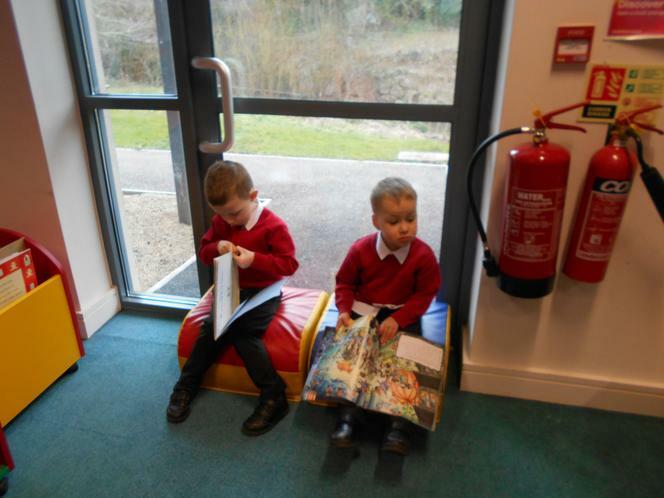 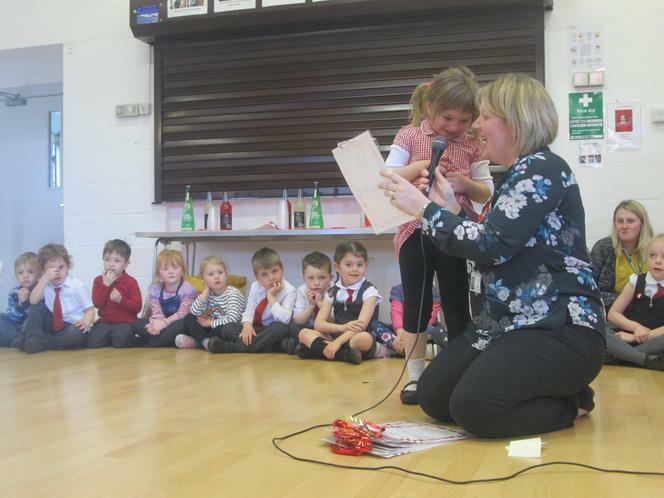 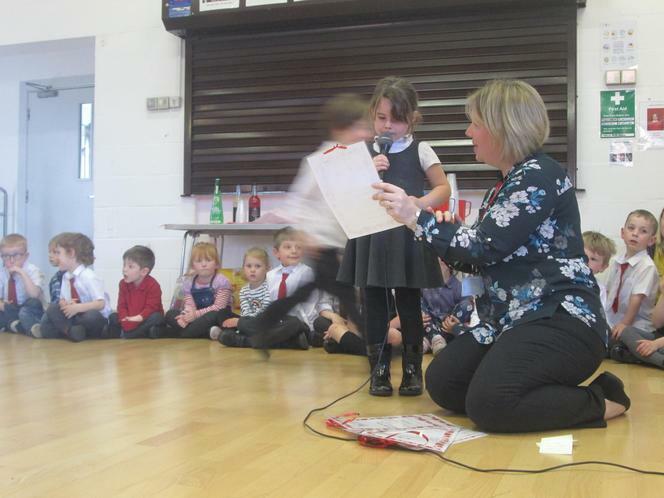 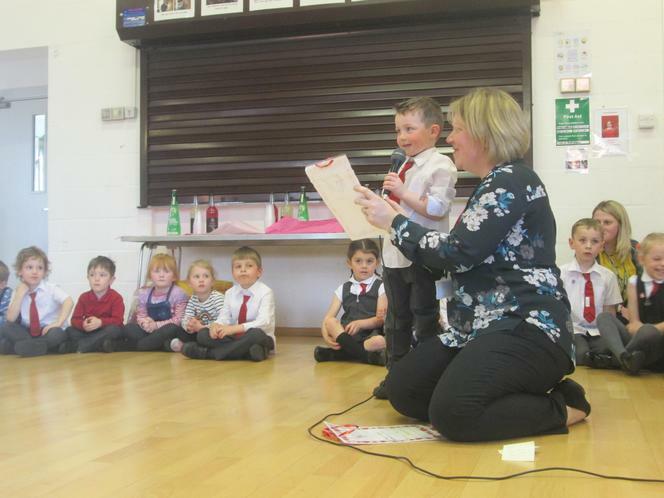 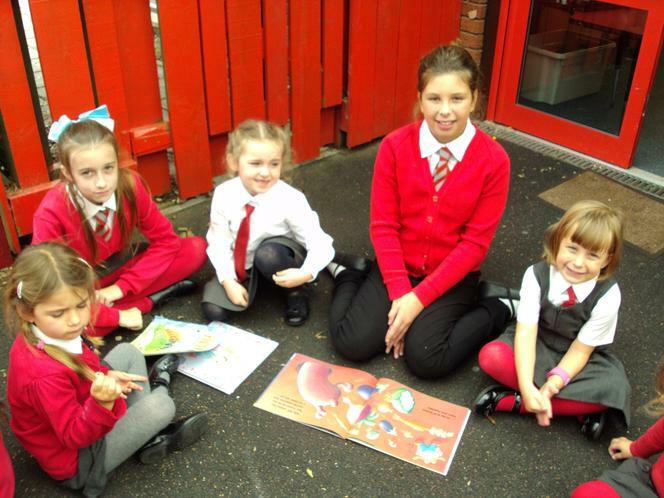 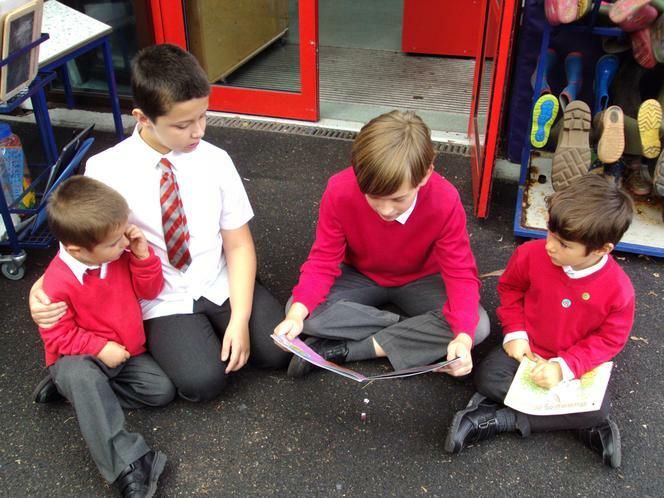 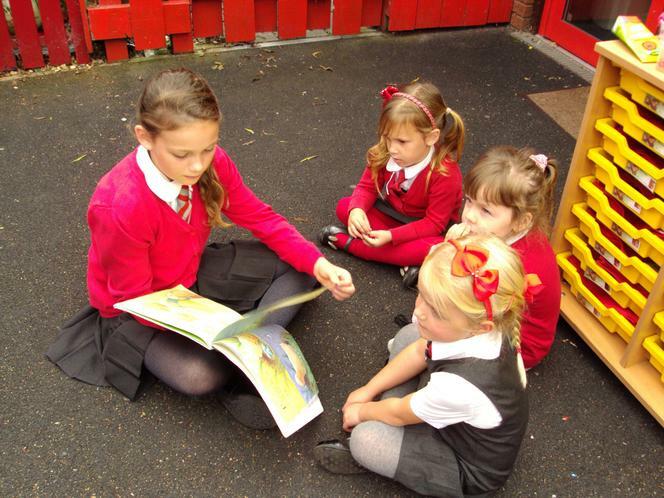 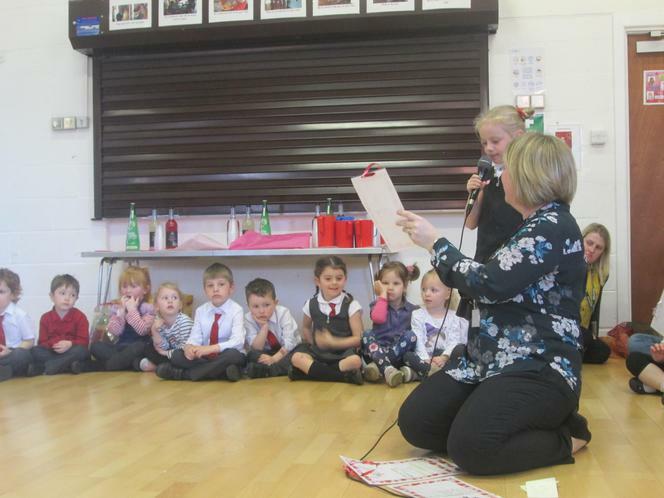 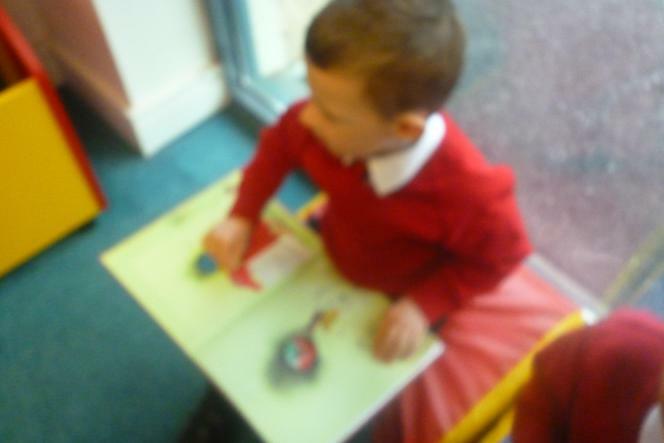 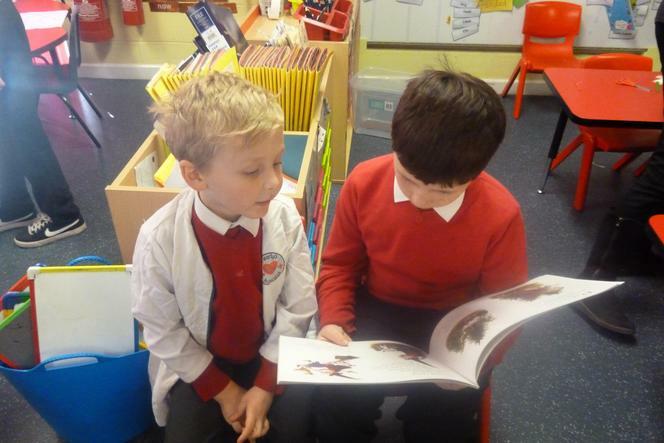 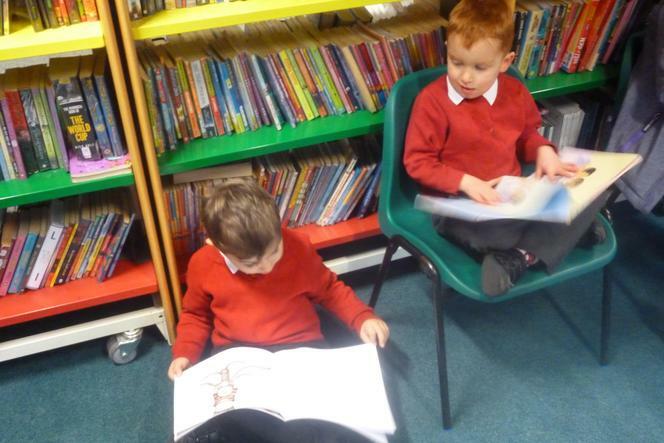 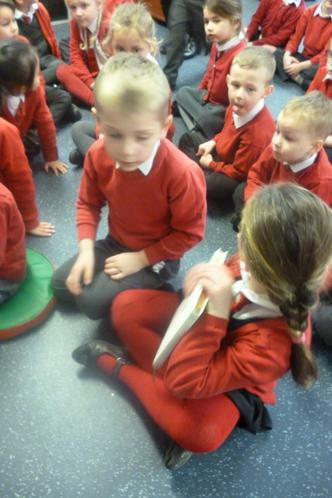 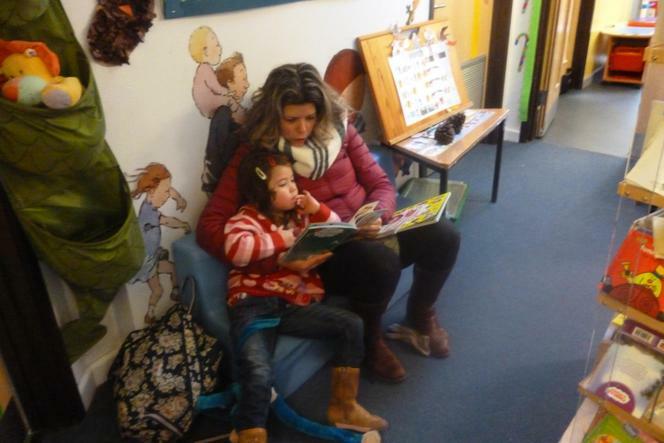 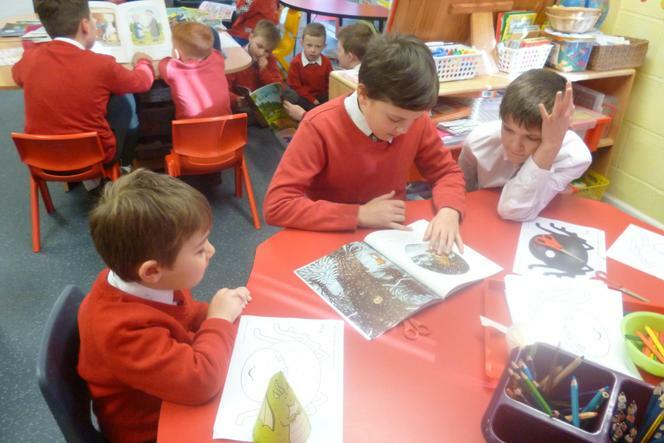 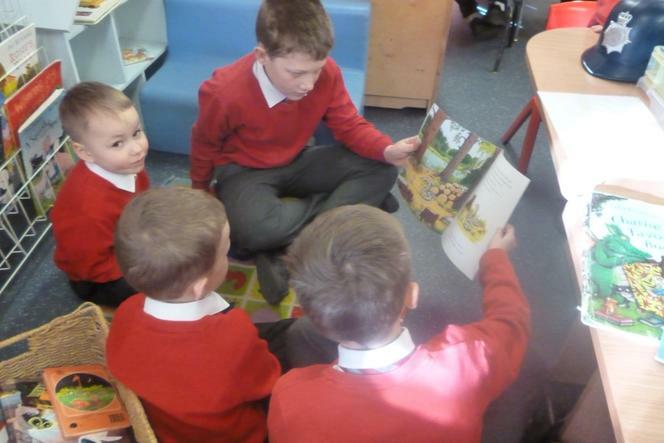 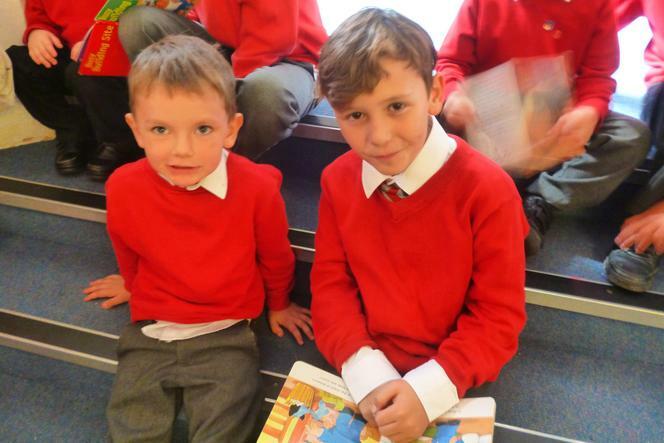 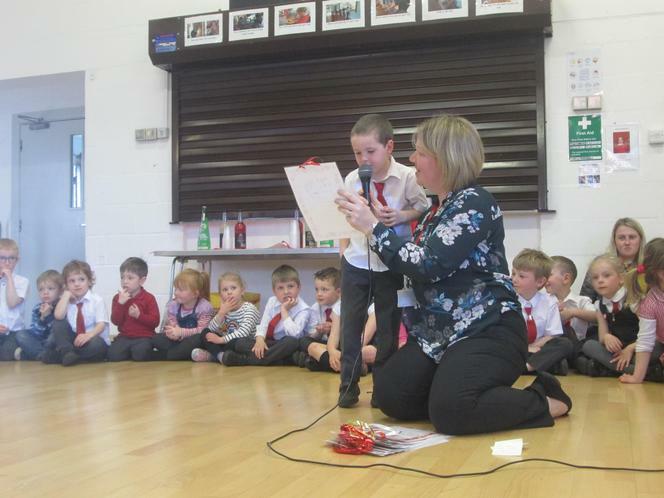 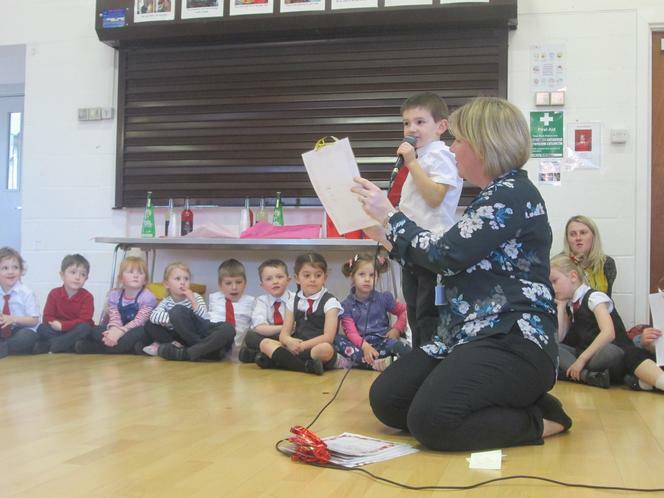 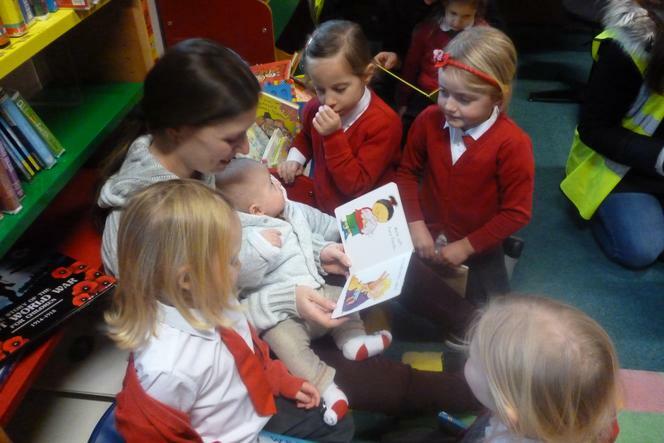 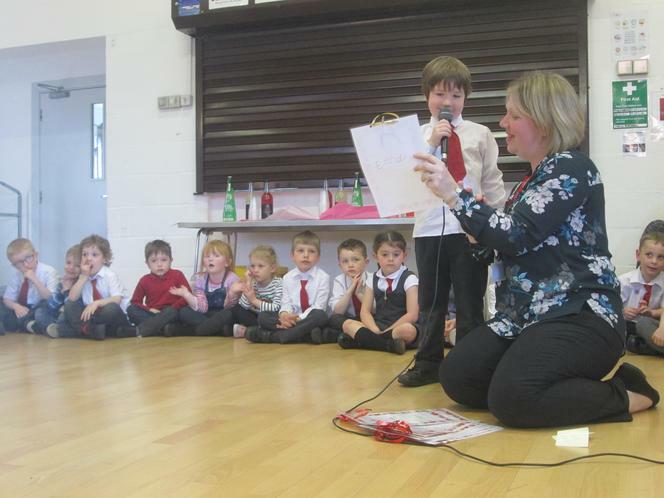 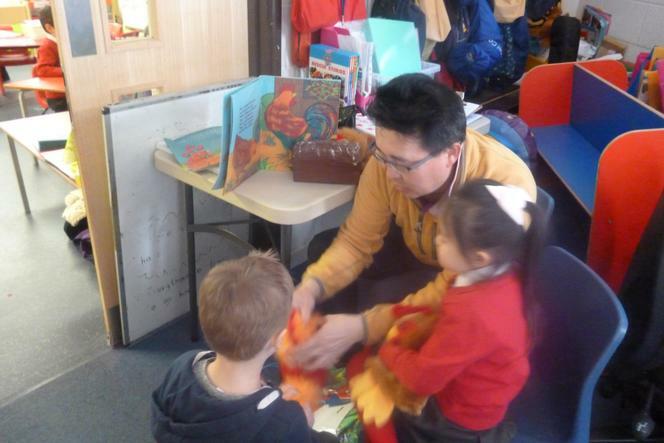 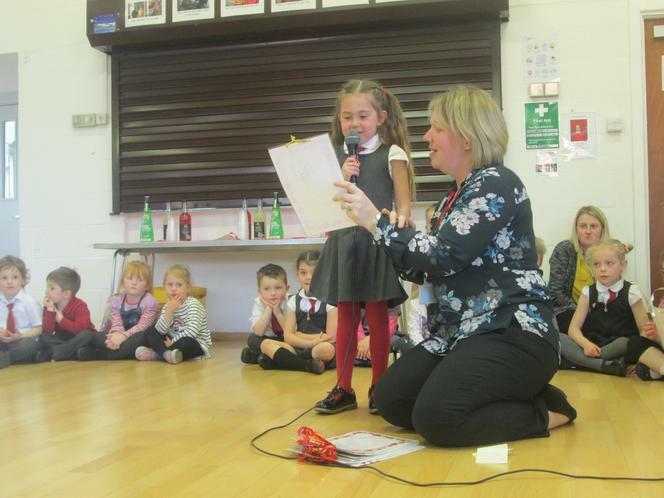 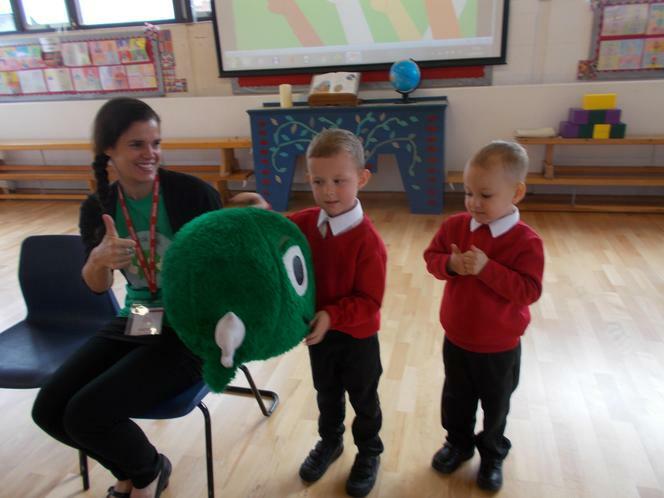 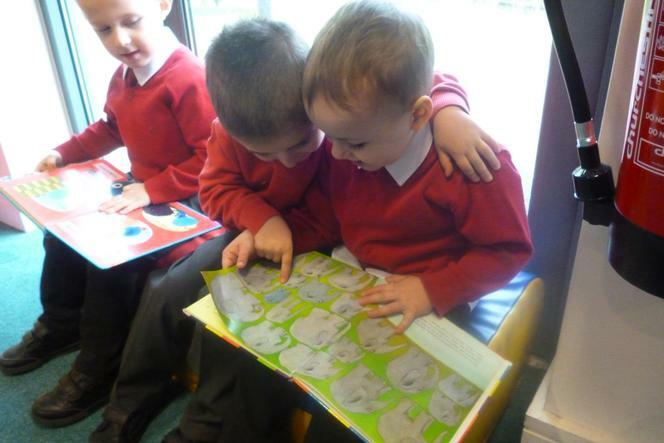 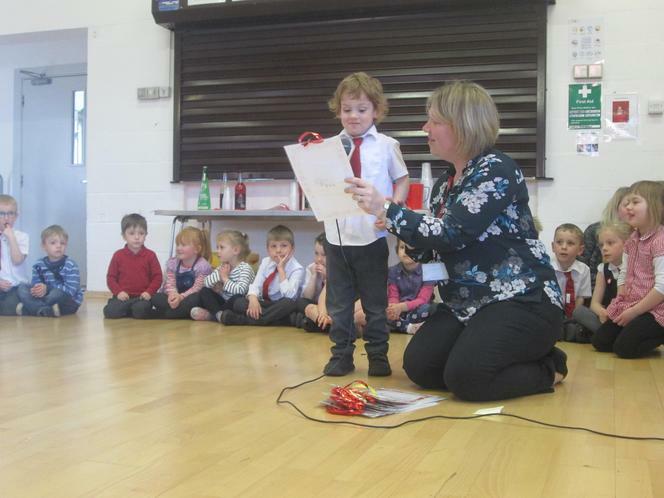 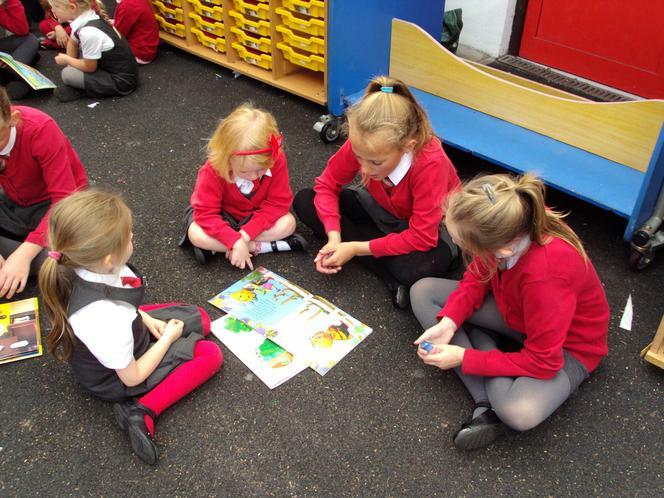 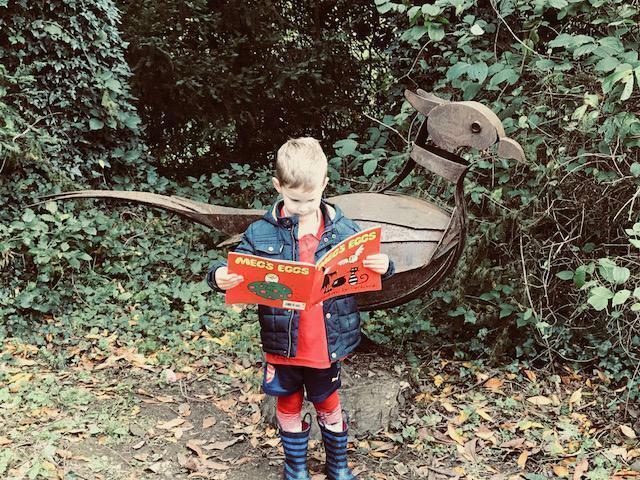 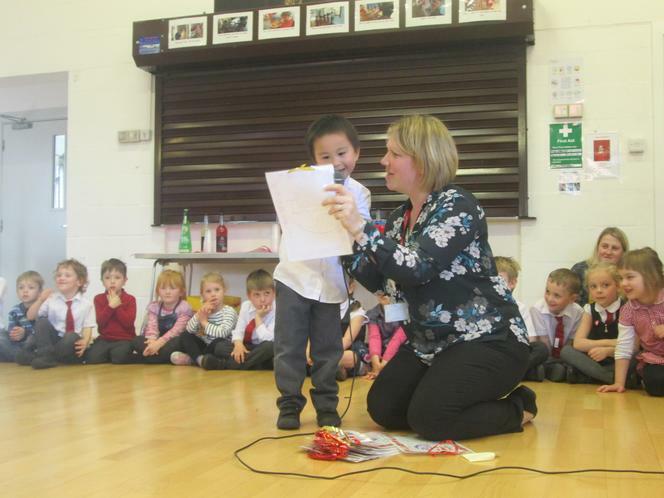 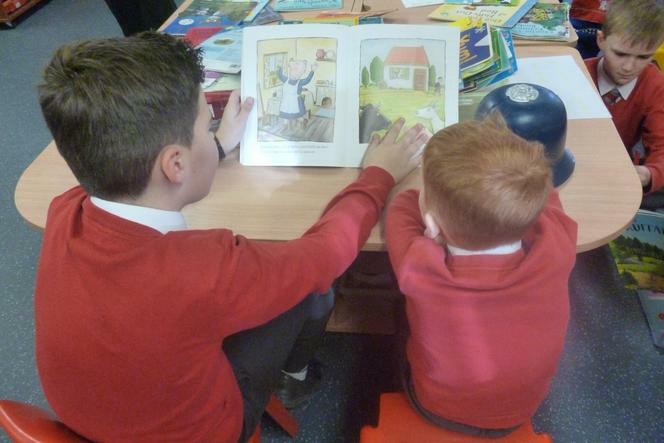 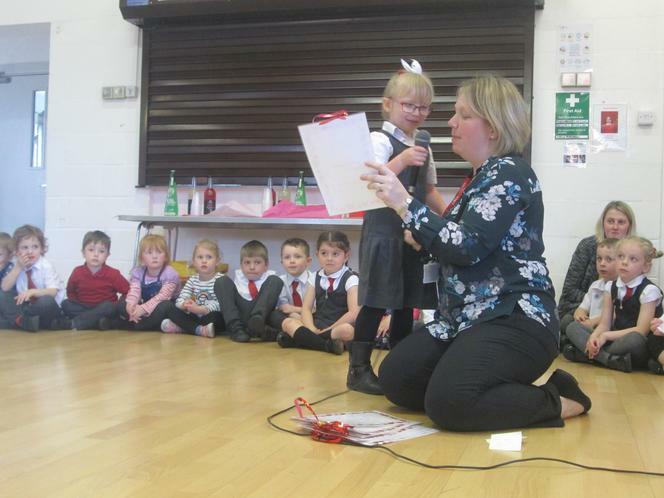 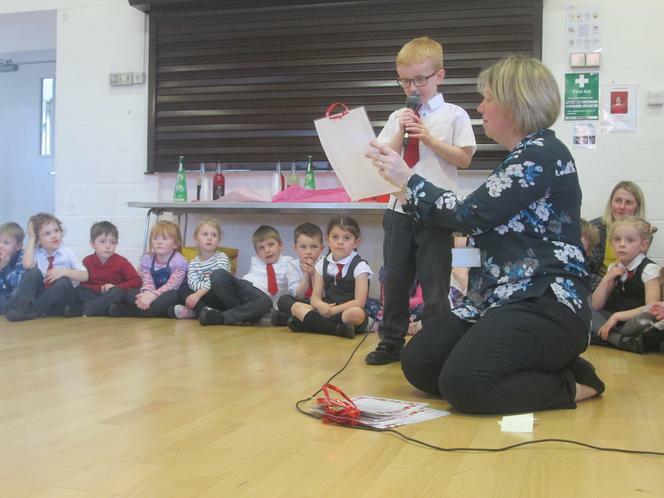 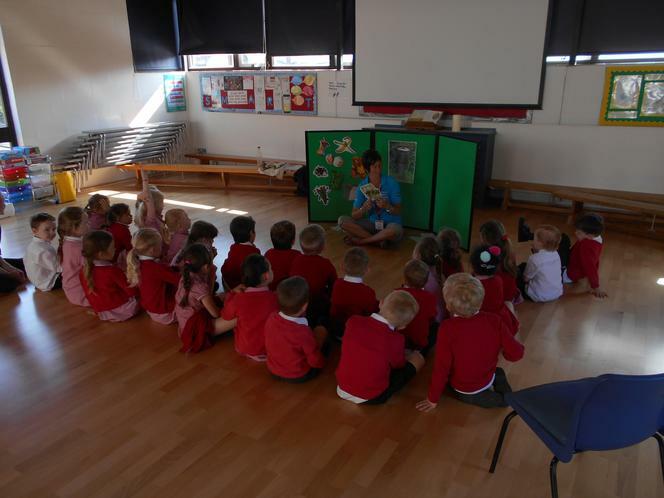 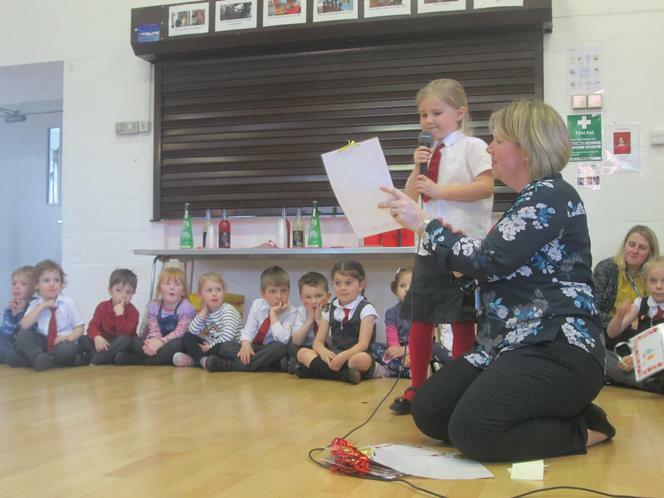 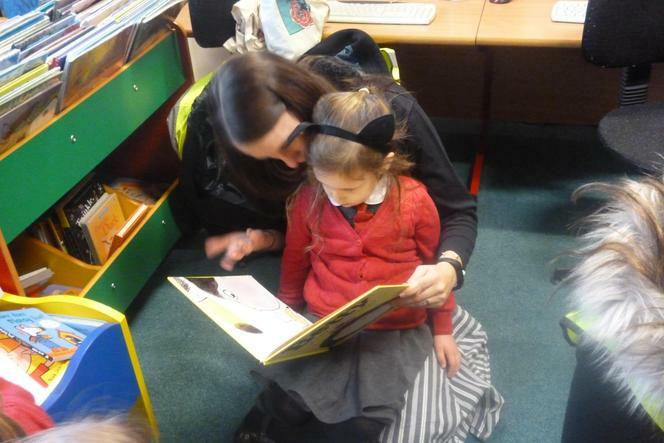 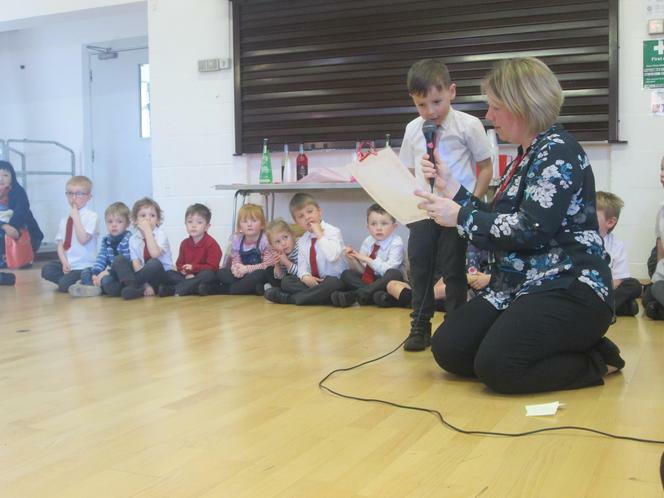 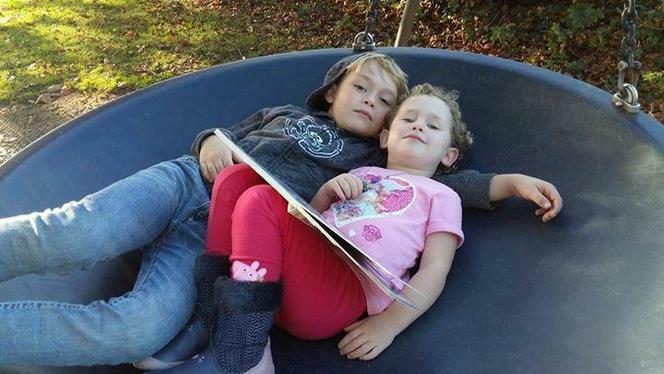 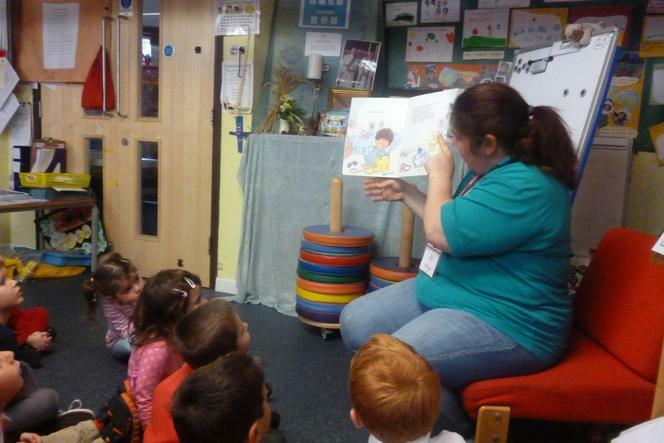 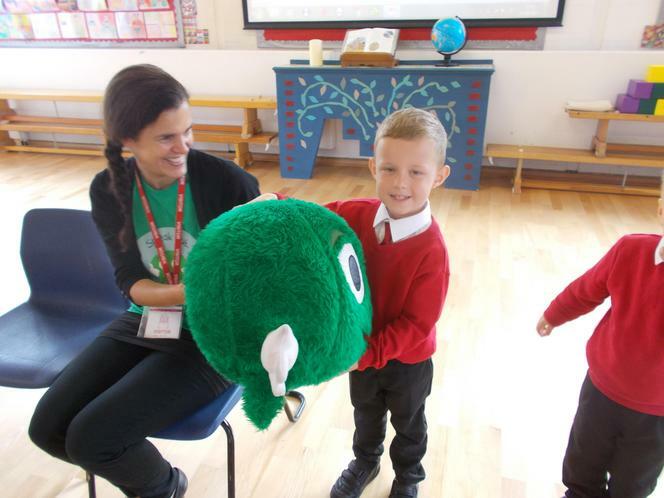 Big Acorns read aloud why they loved their mum. 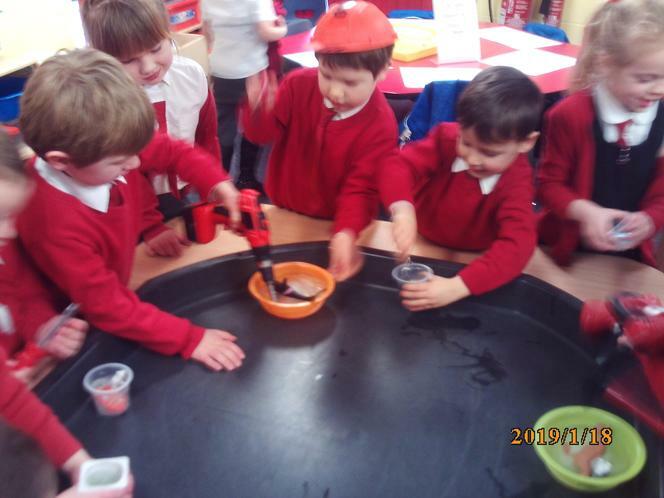 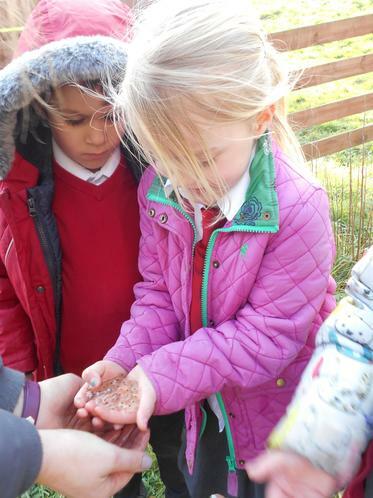 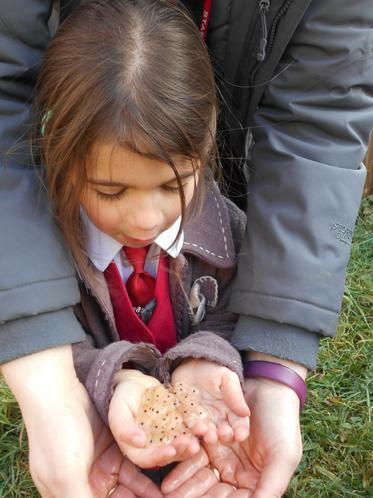 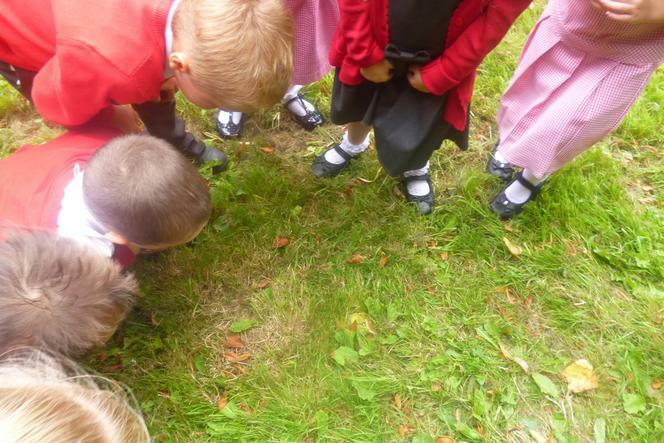 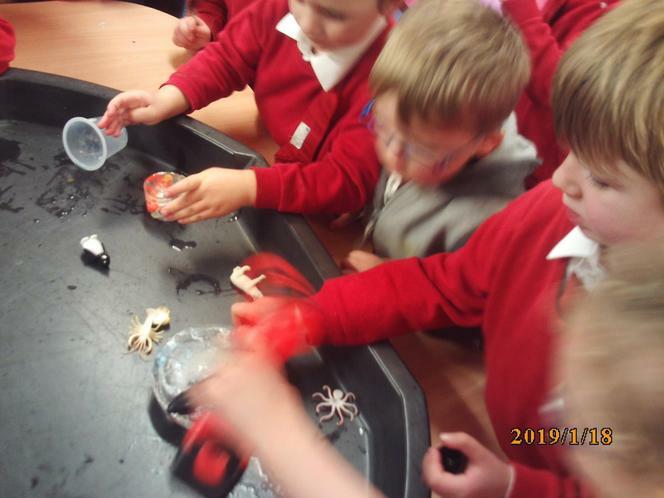 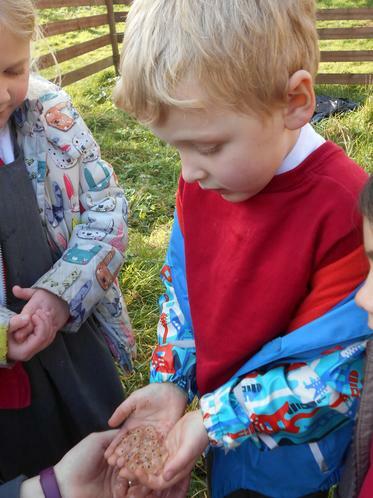 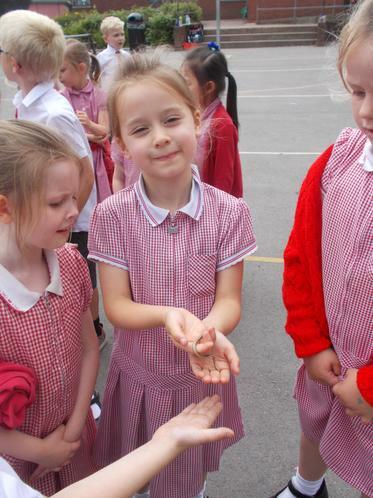 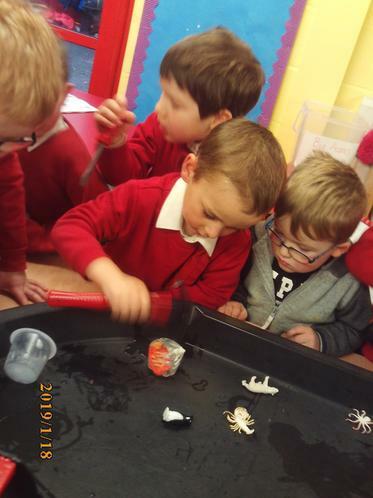 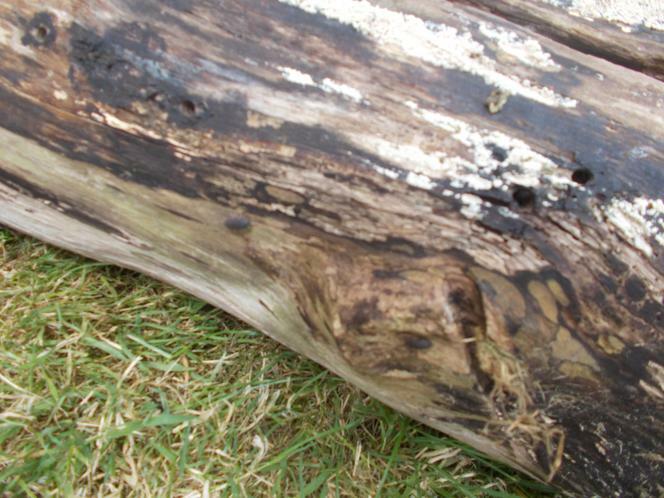 Collecting Frogspawn - Exploring the Lifecycle of a frog. 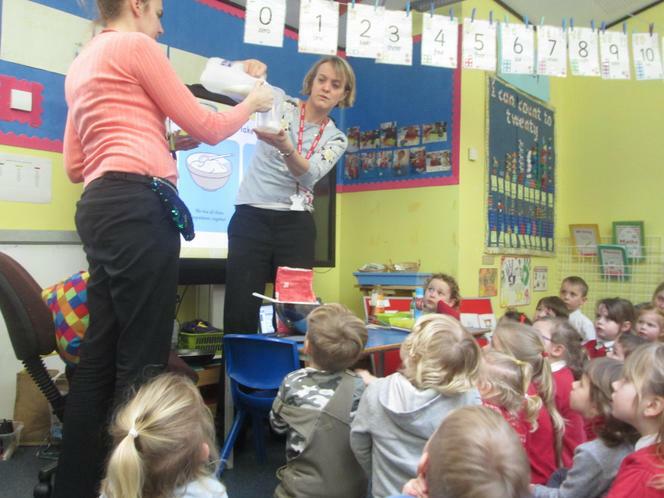 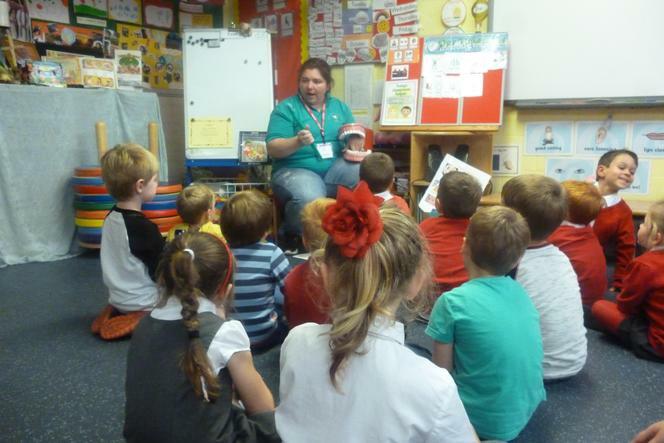 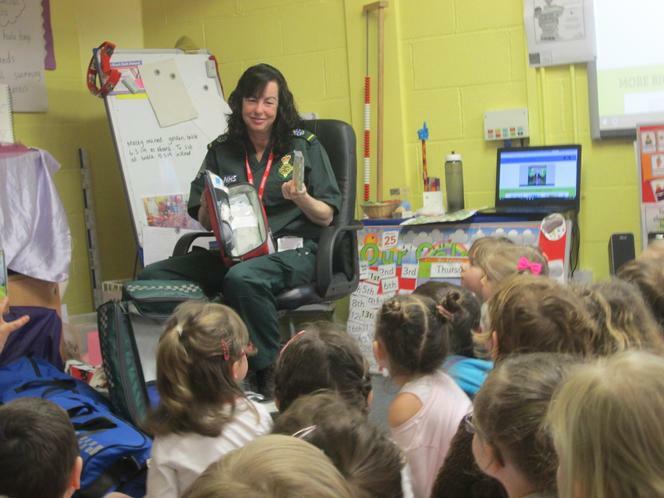 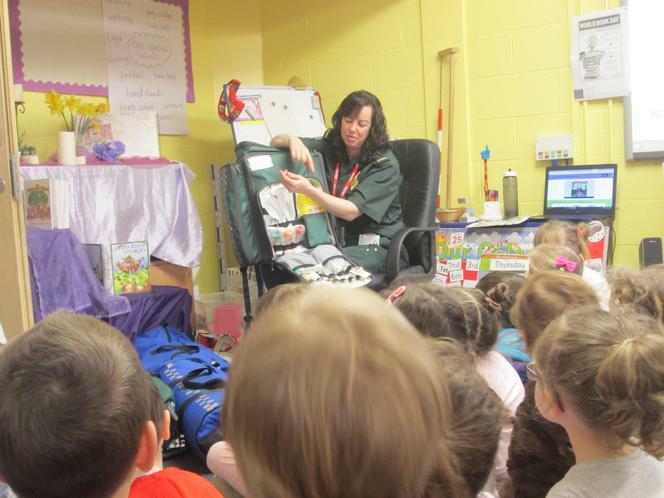 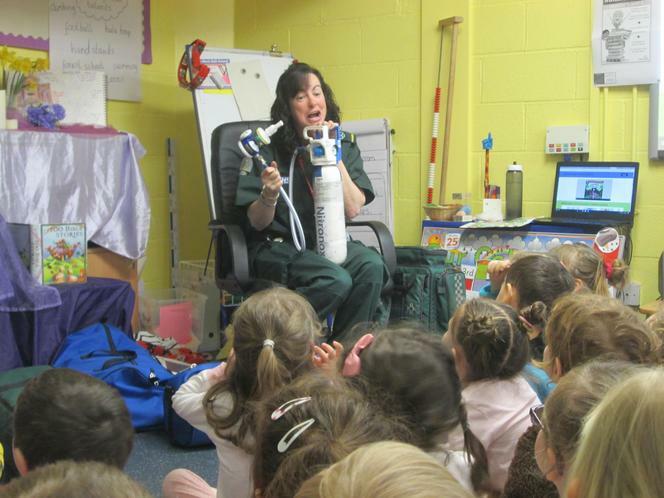 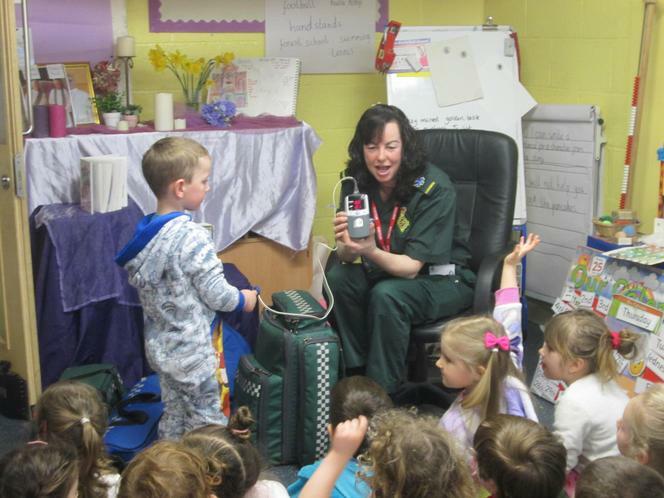 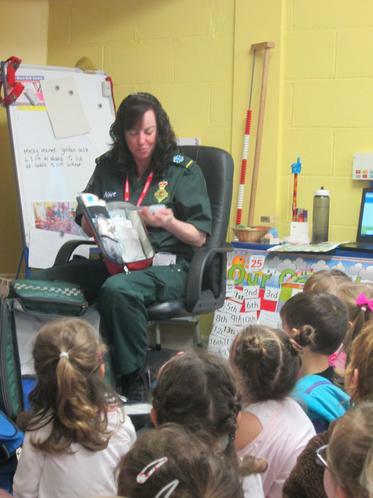 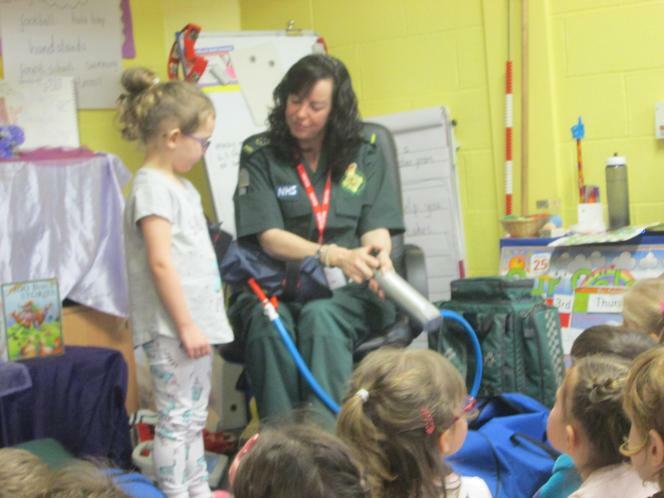 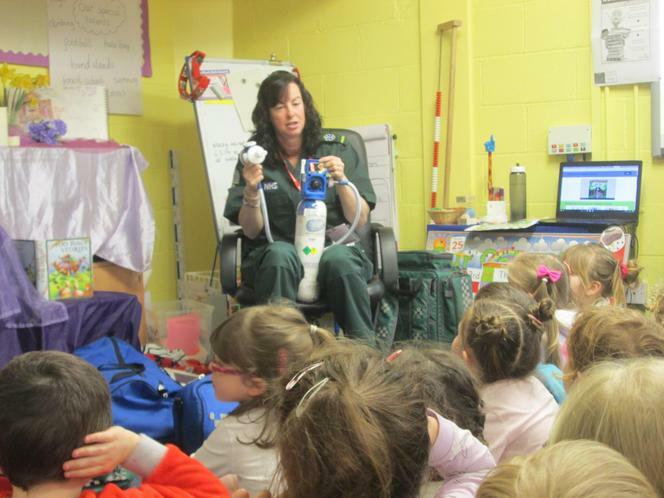 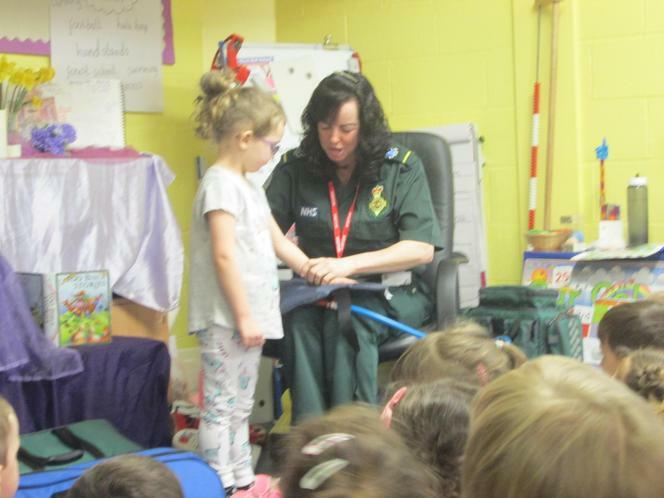 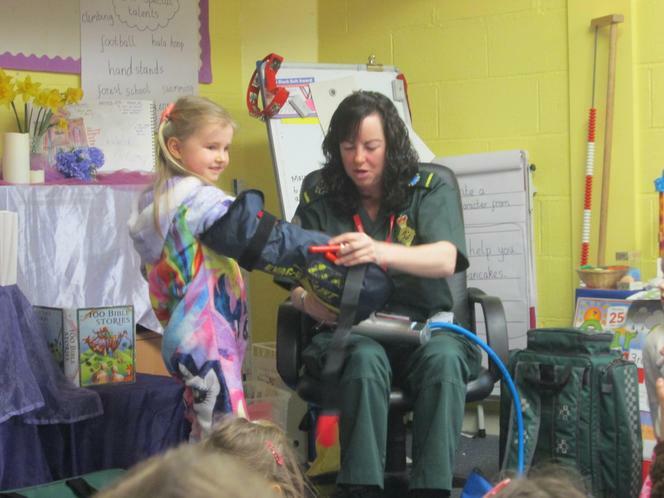 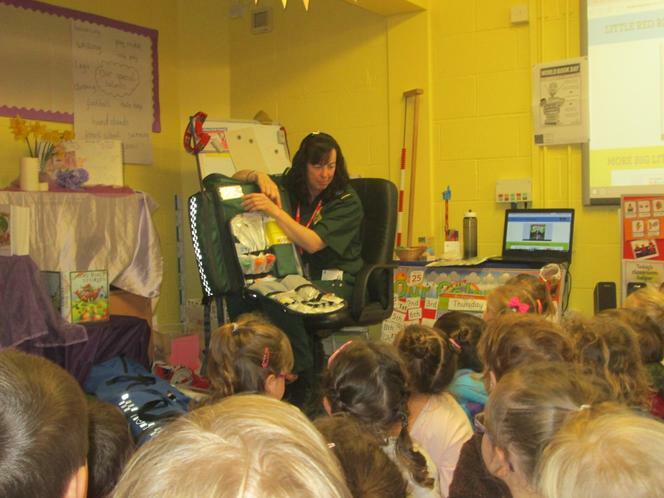 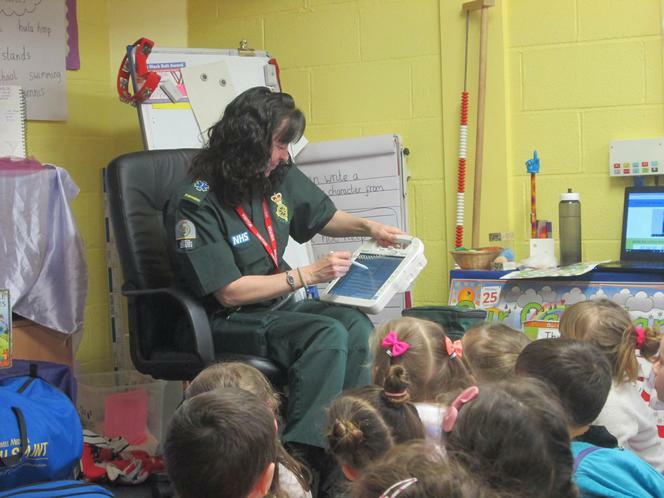 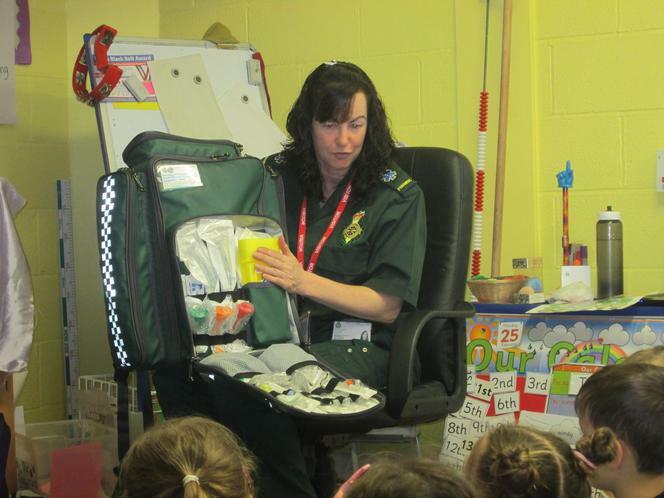 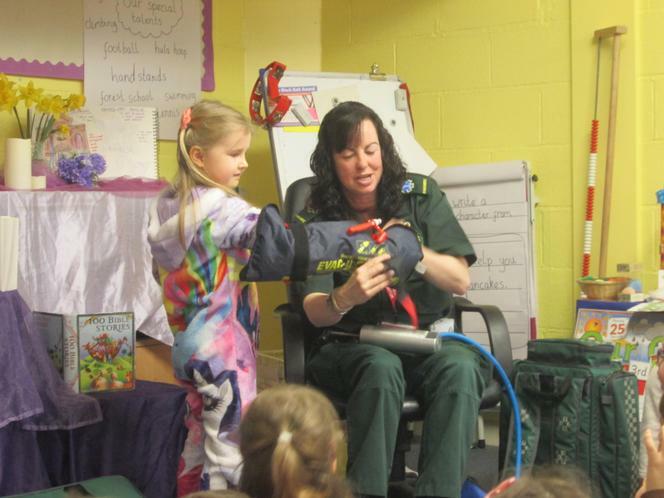 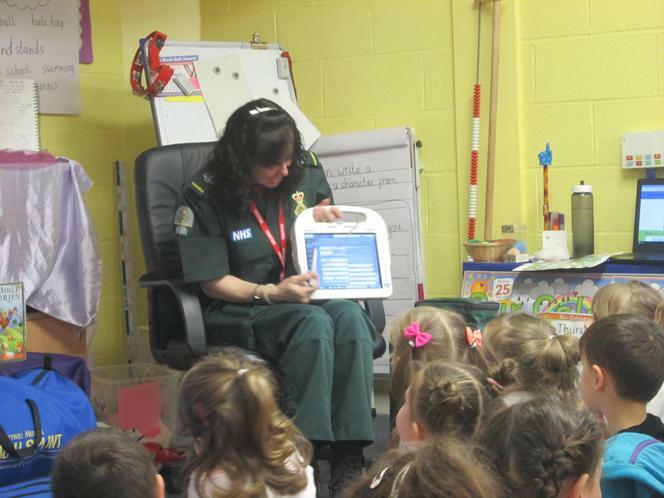 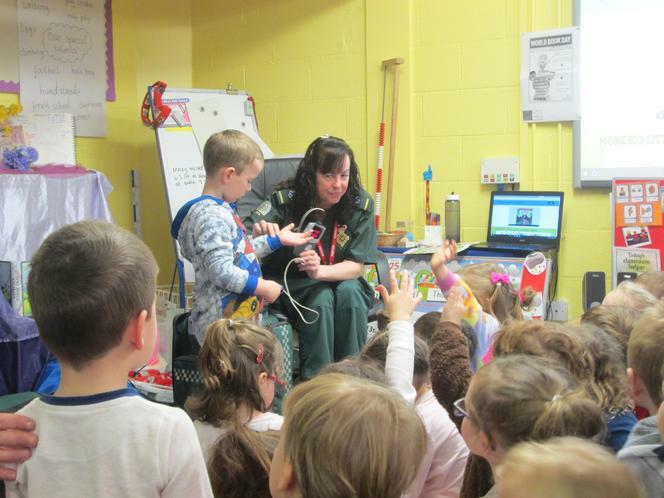 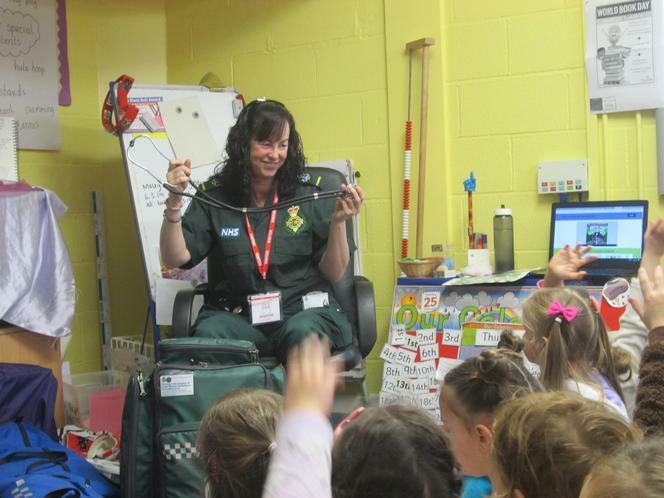 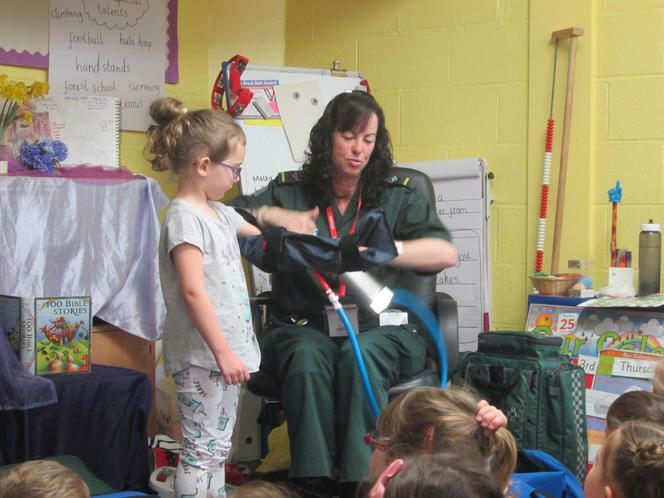 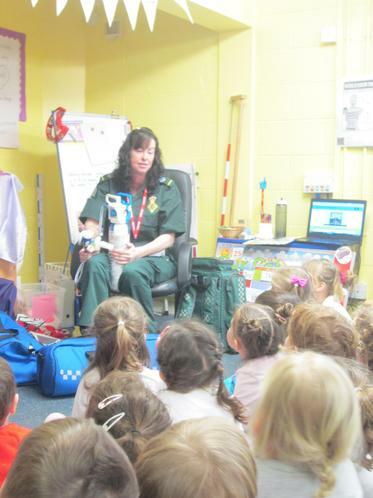 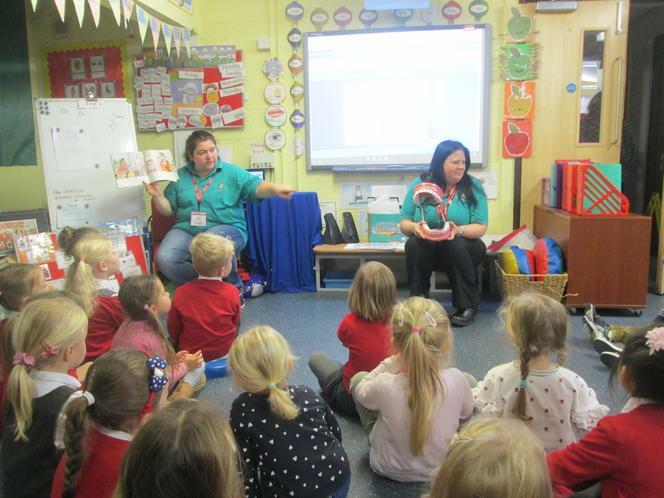 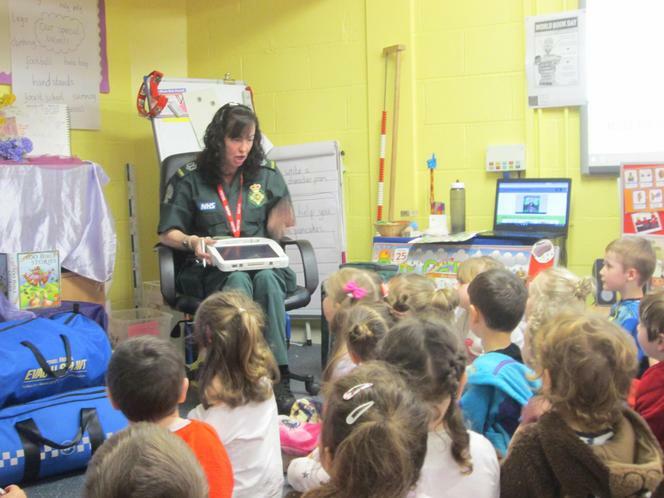 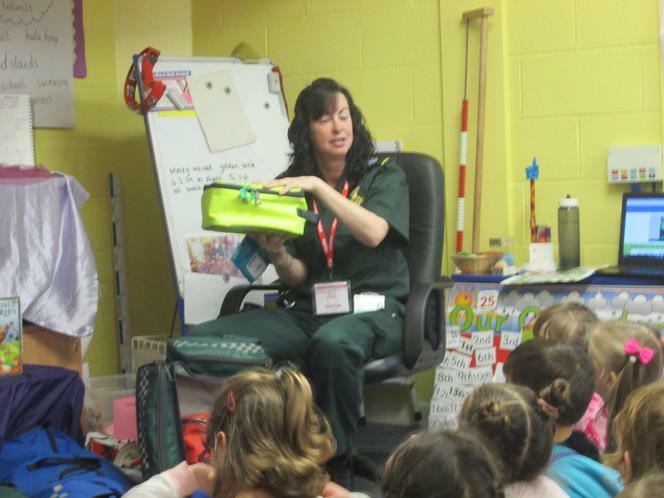 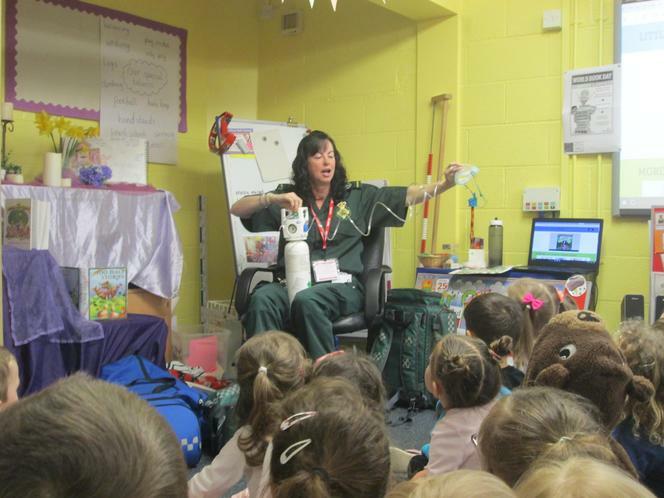 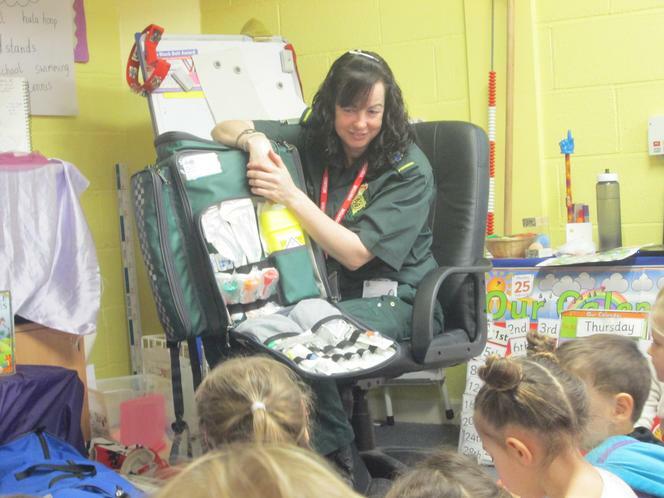 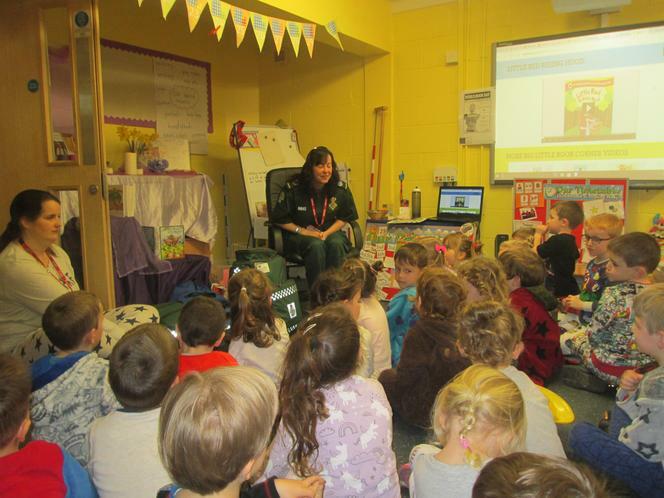 Visit from a Paramedic - Today, Acorns enjoyed a visit from Rachel (Freddie's mum) who is a paramedic. 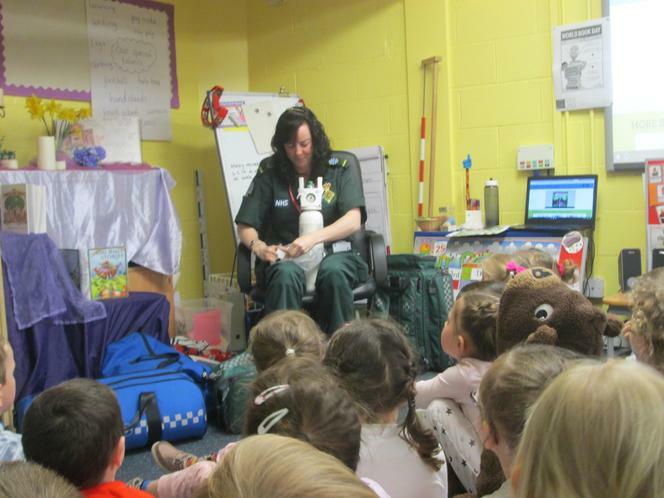 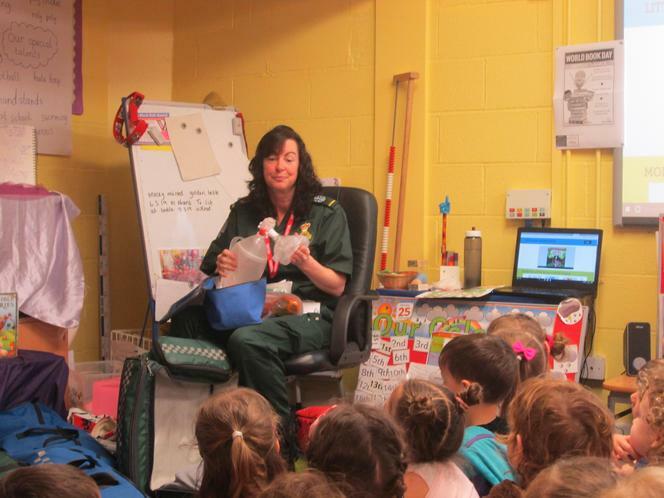 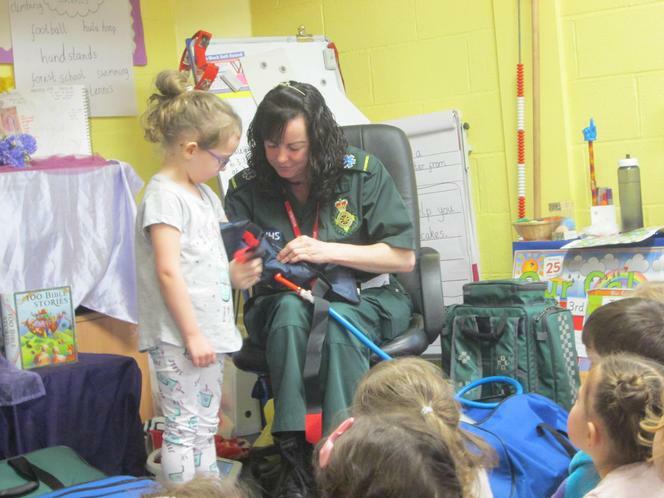 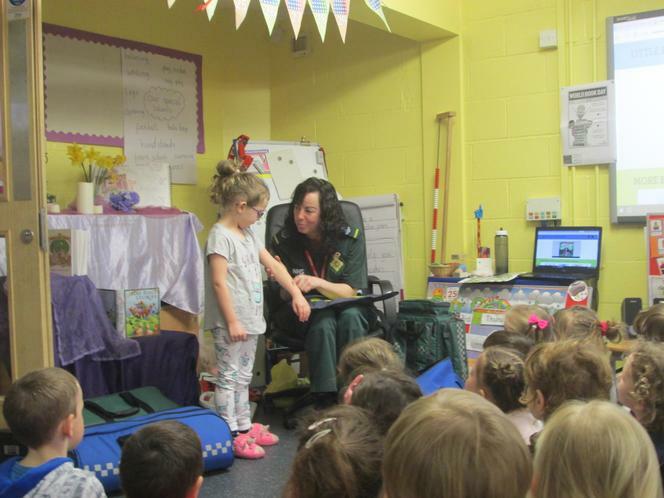 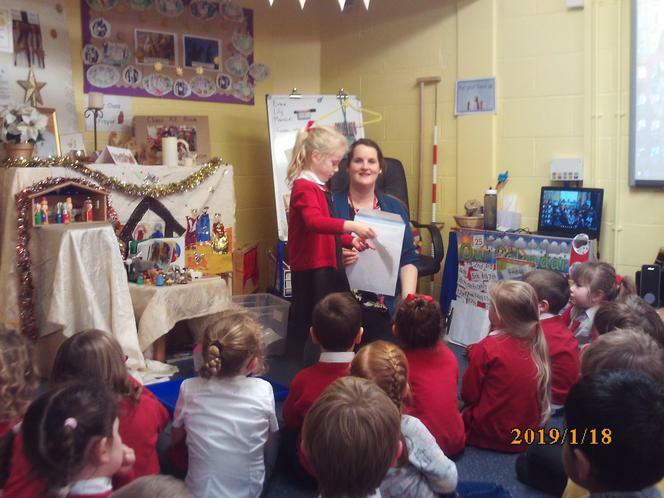 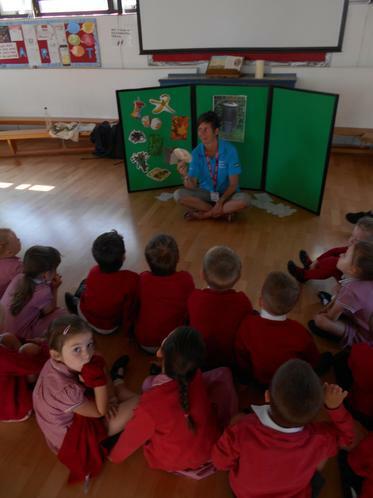 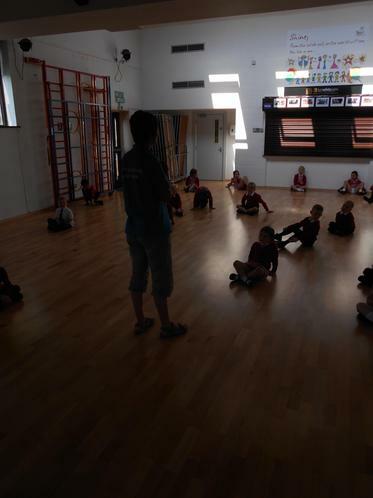 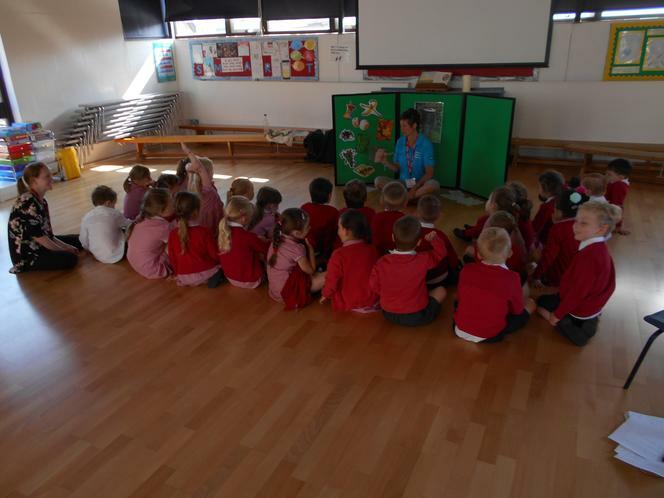 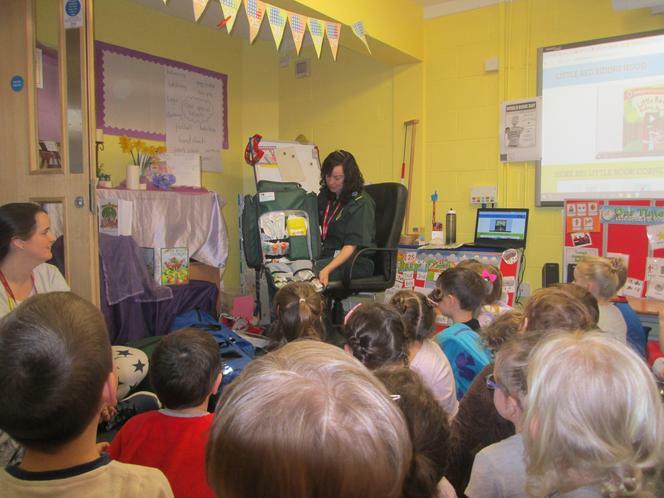 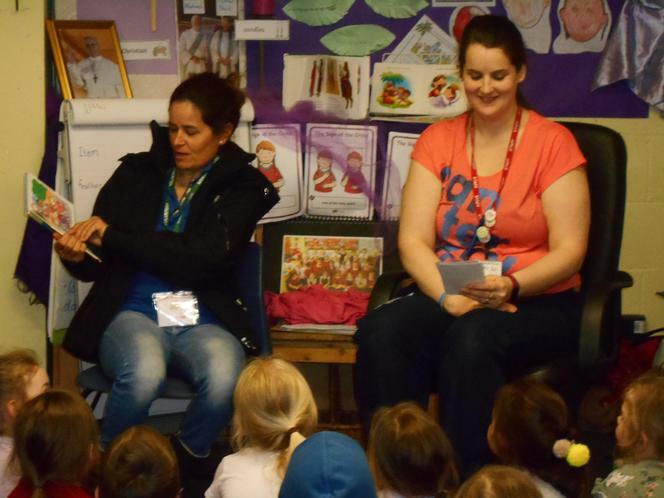 She talked to the children about her job as a paramedic, showed the children all of her emergency kit and talked with them about how to contact help in an emergency. 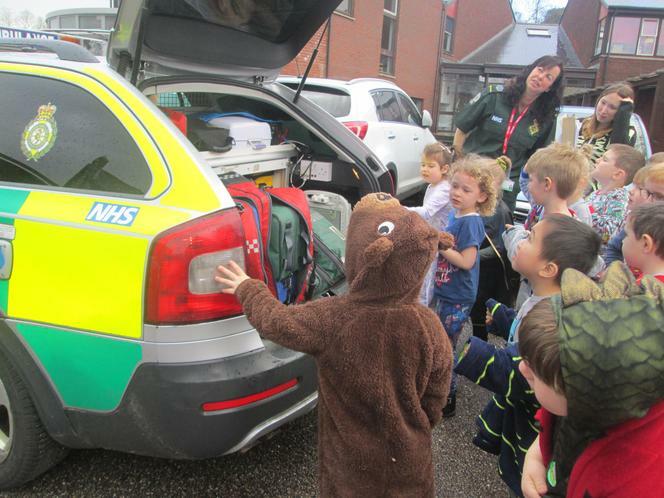 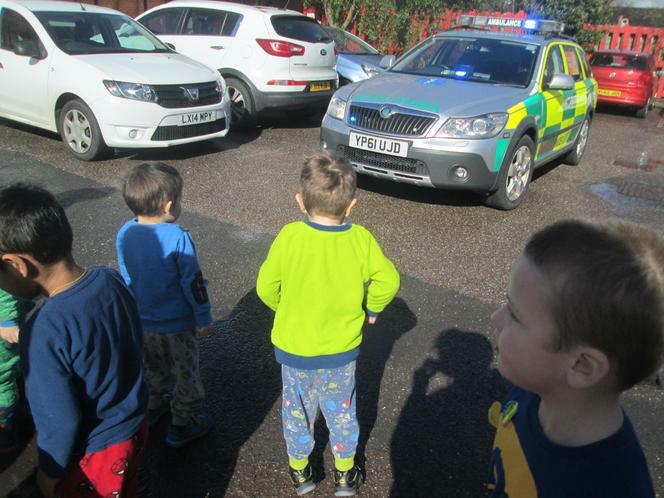 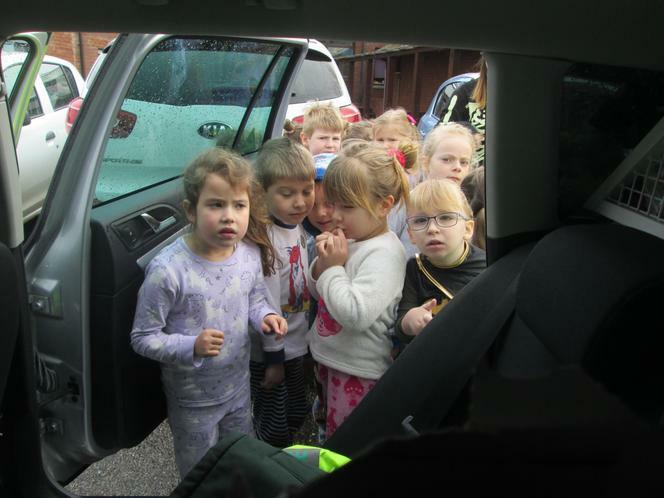 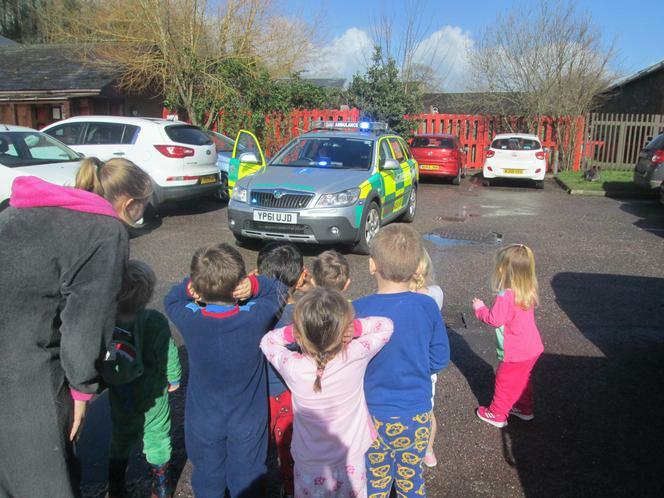 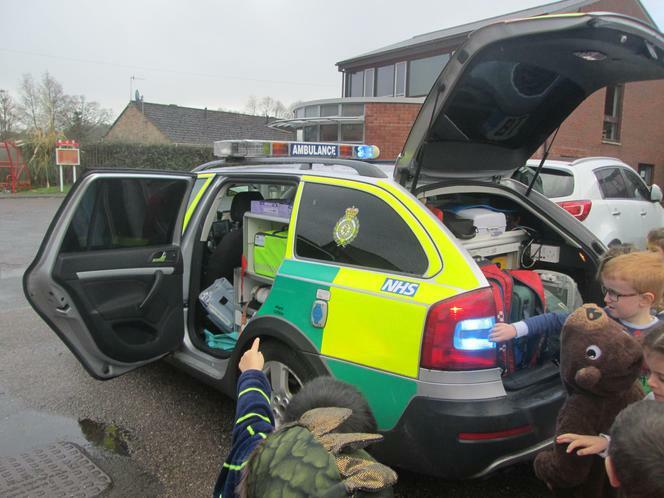 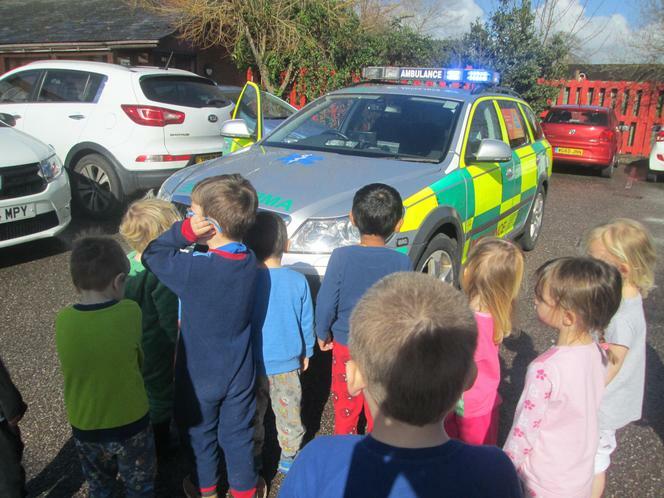 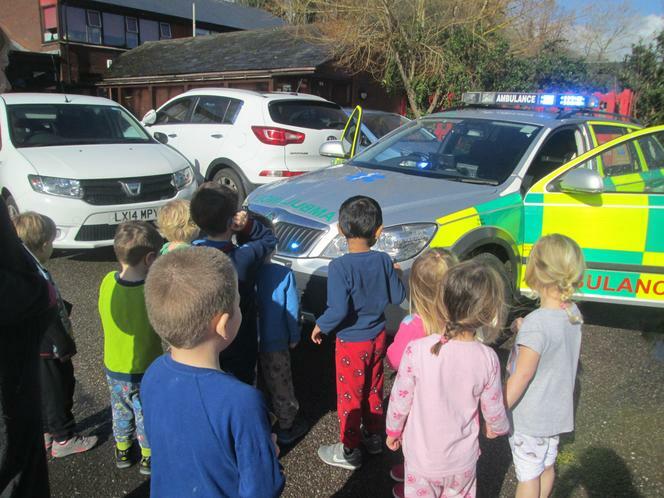 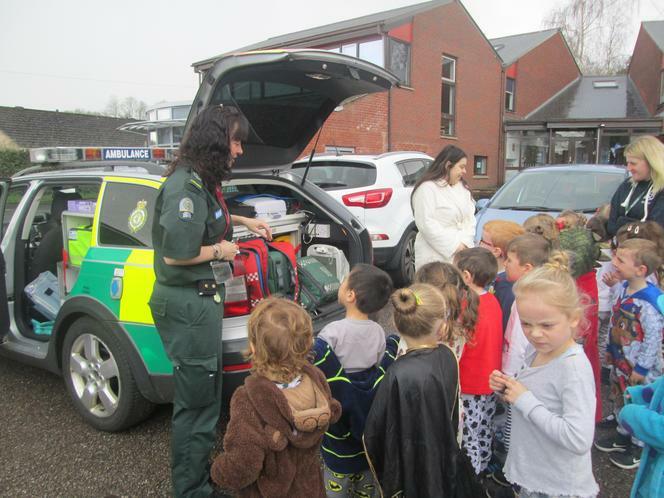 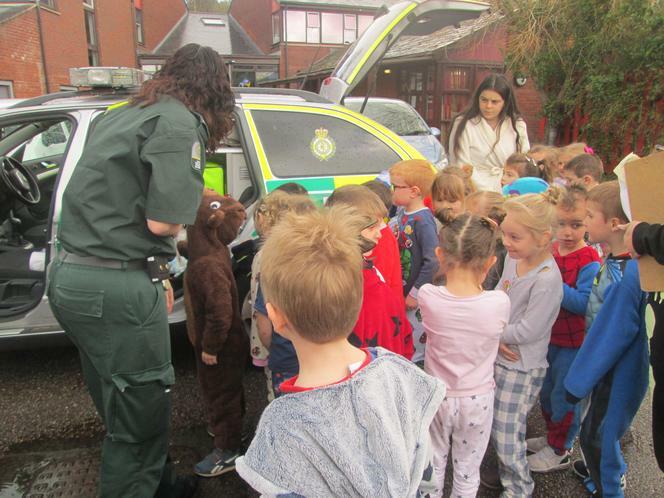 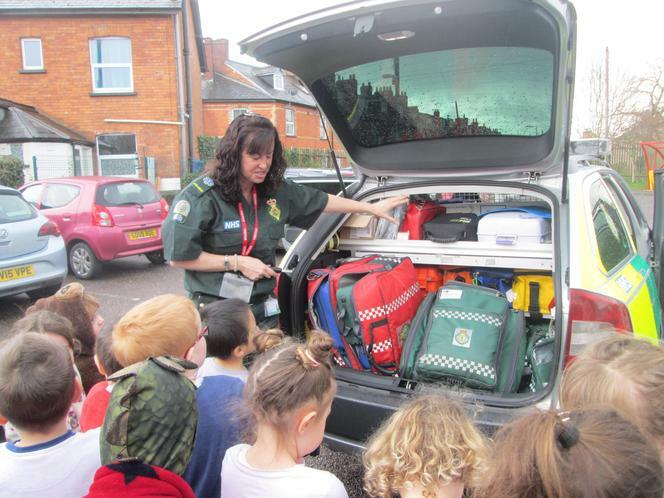 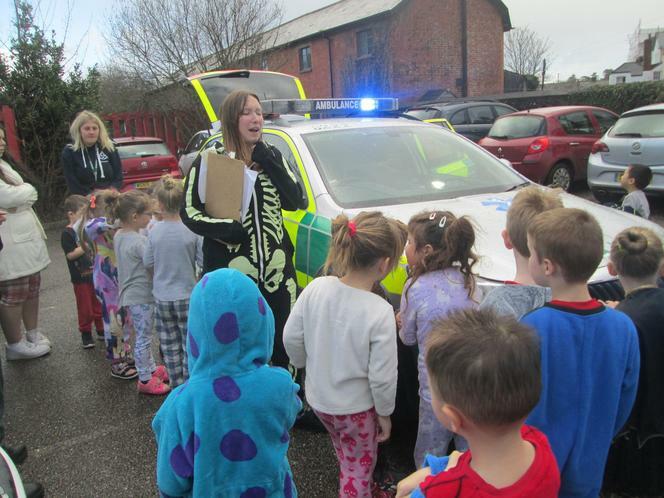 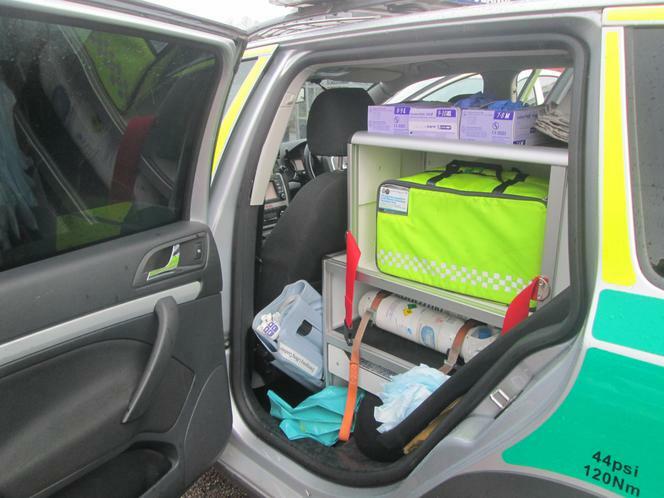 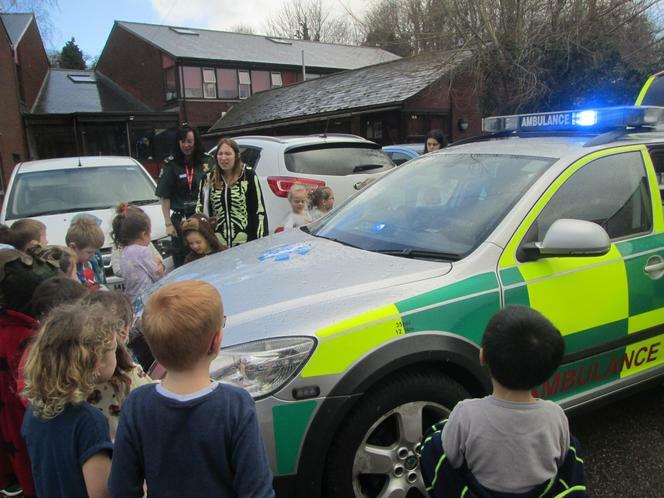 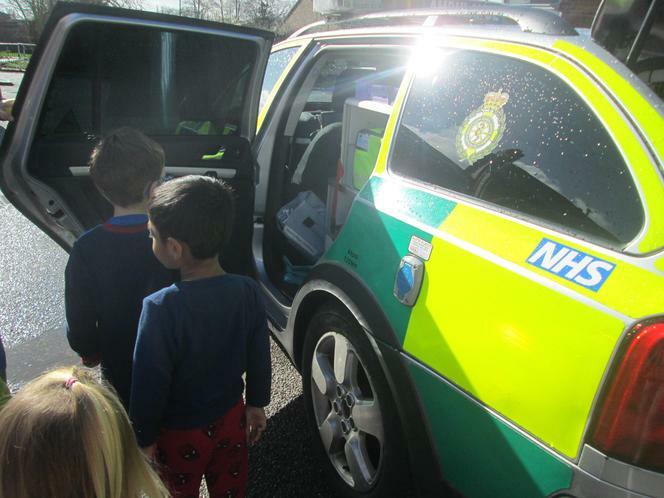 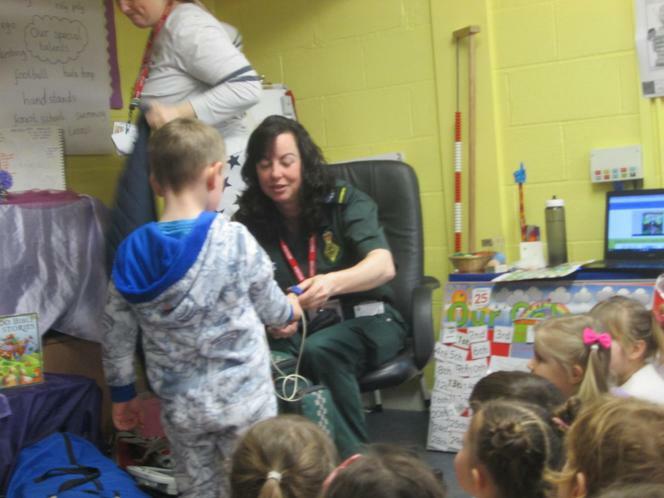 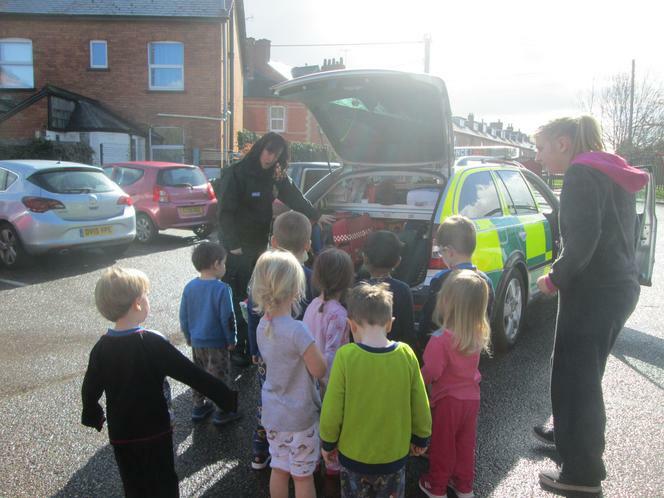 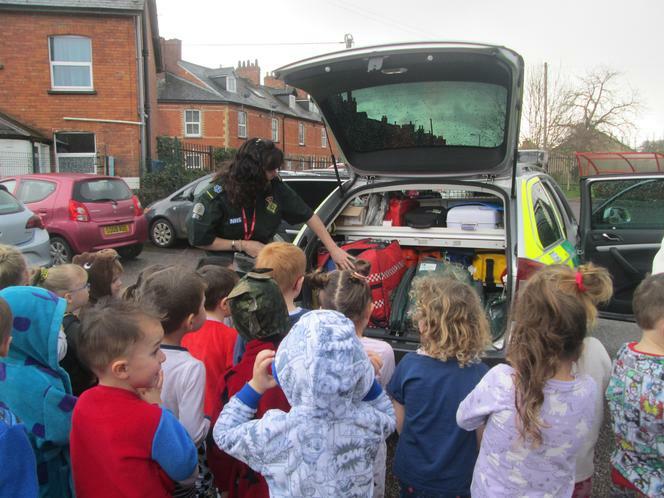 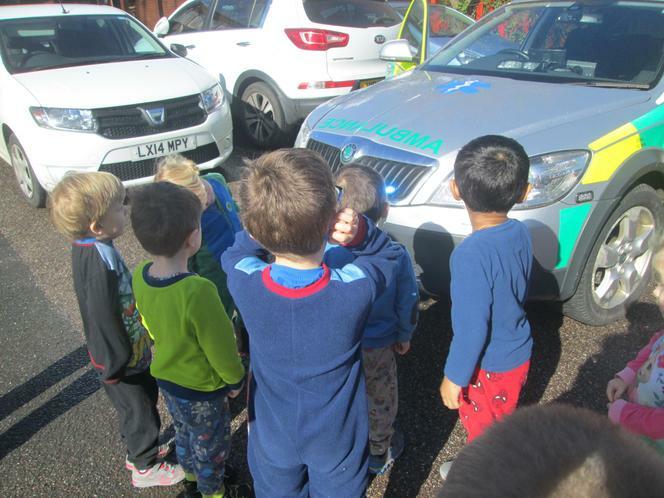 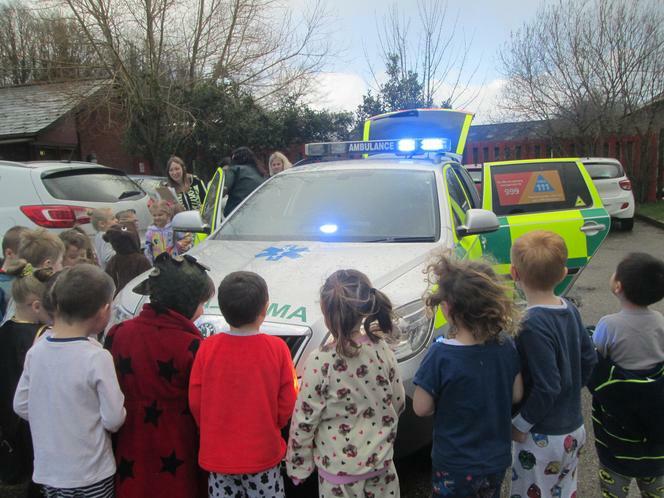 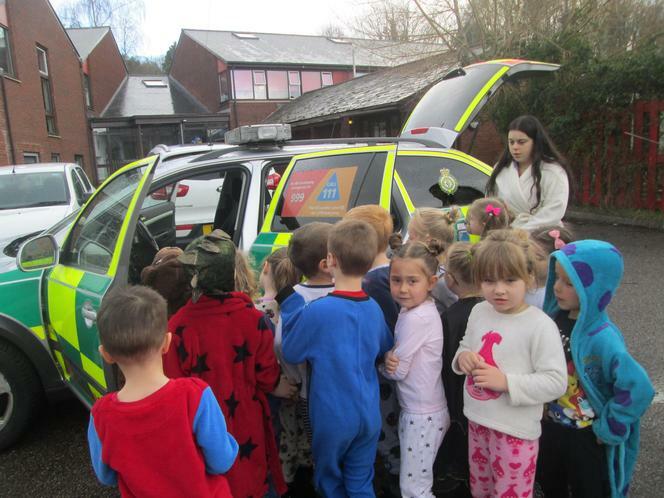 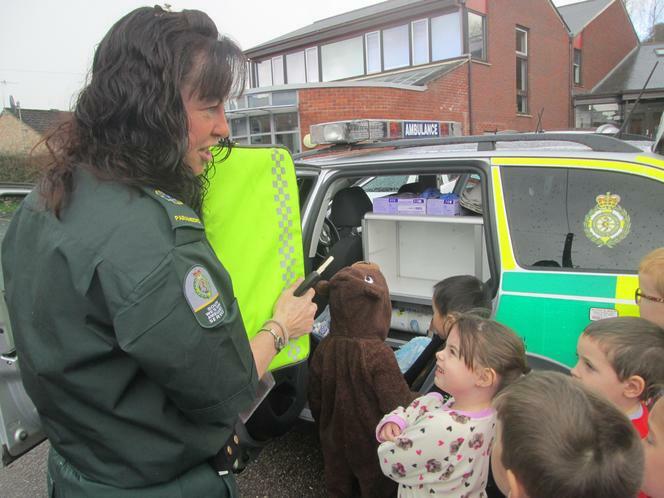 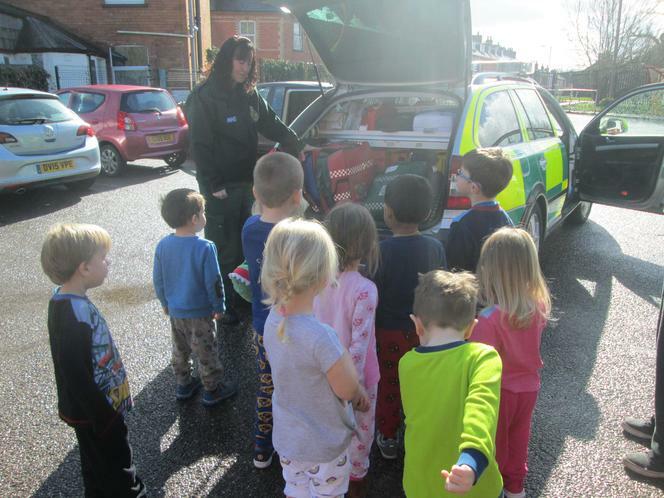 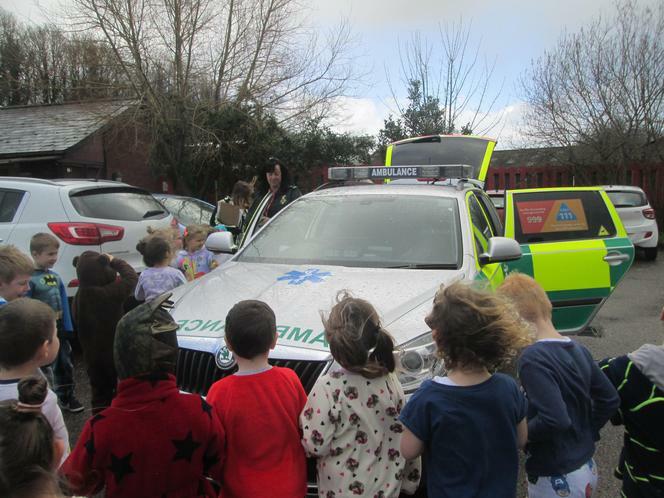 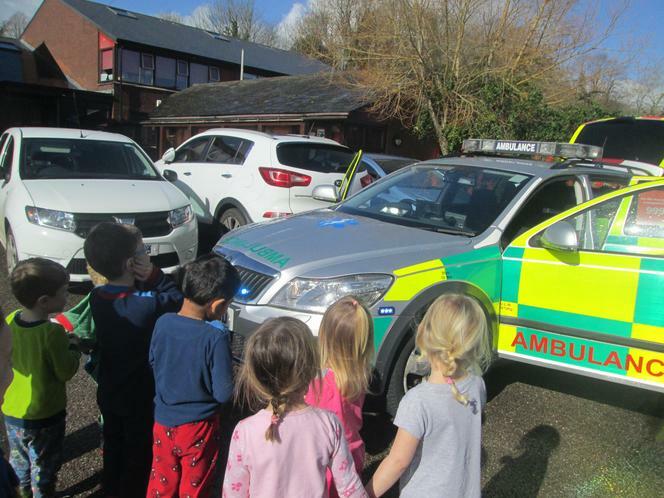 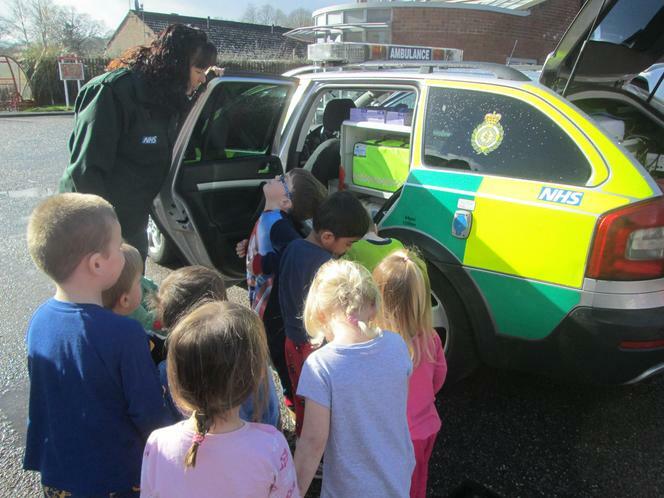 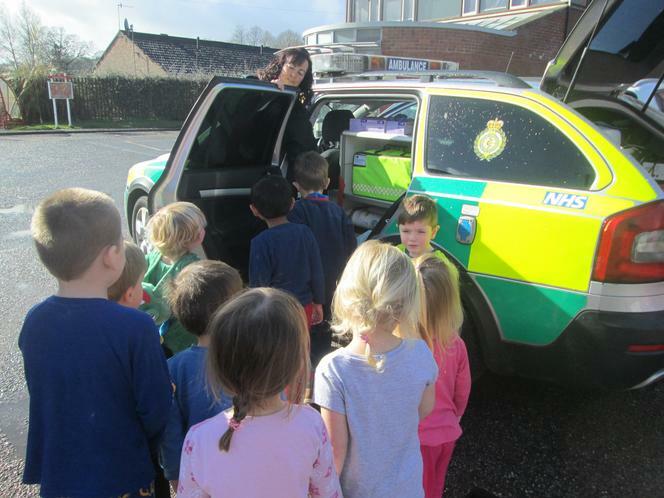 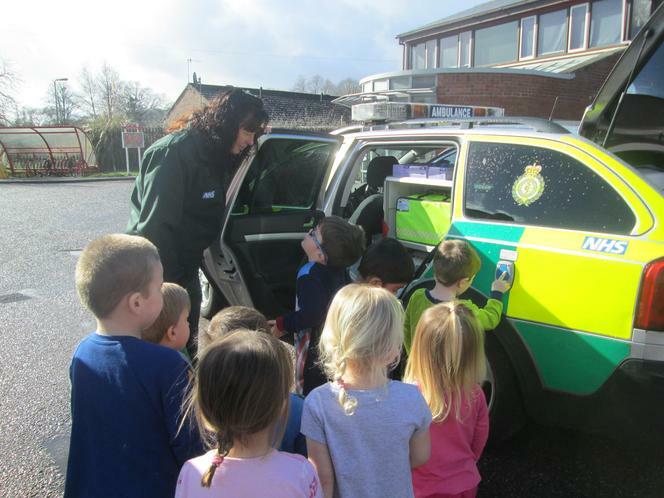 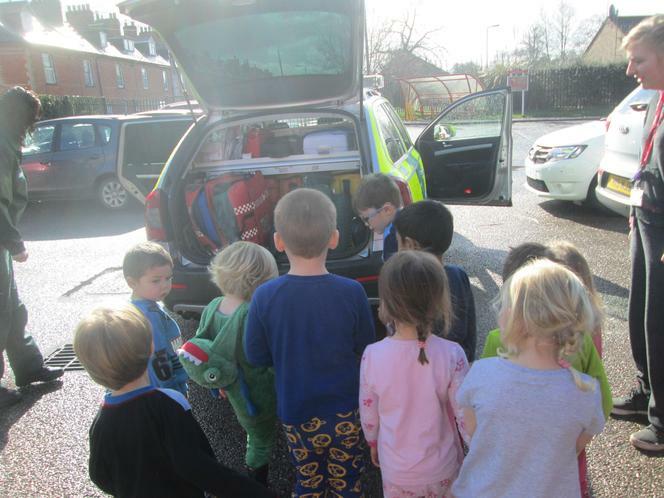 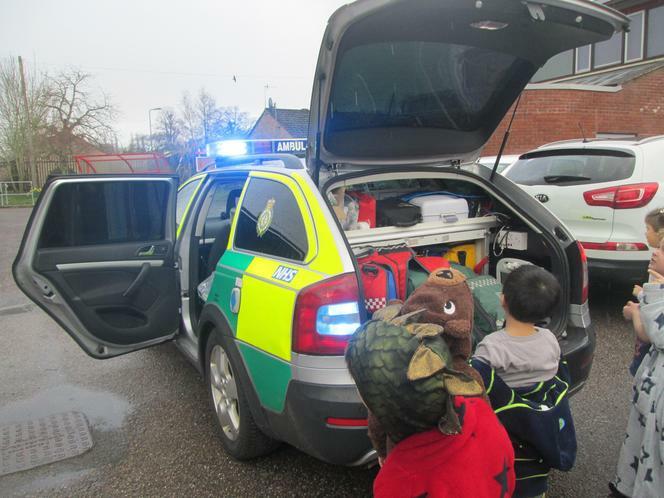 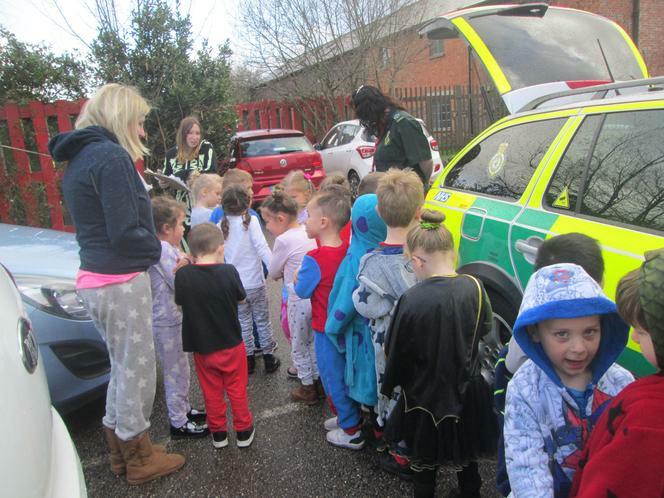 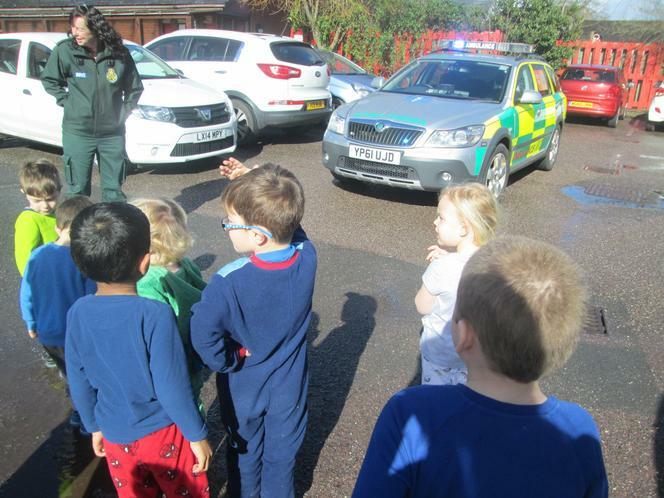 She brought her ambulance response car and the children enjoyed looking at all the medical kit inside and were treated to listening to the emergency siren and lights. 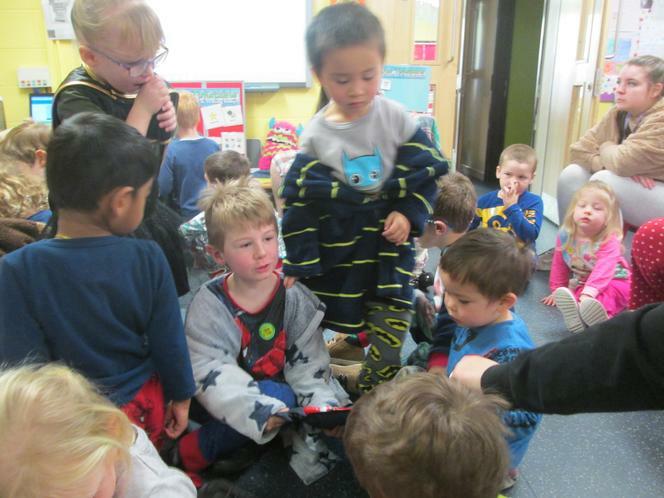 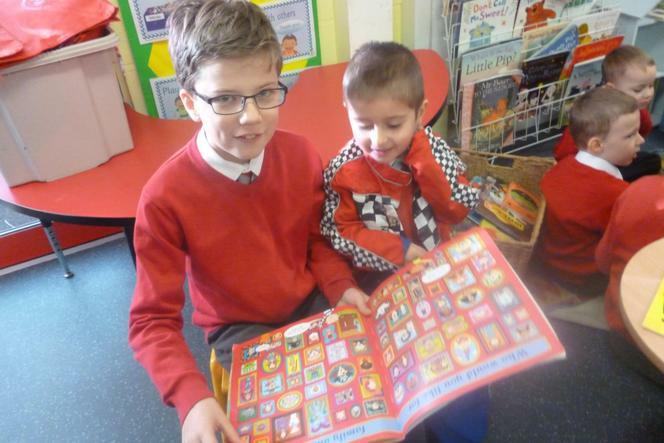 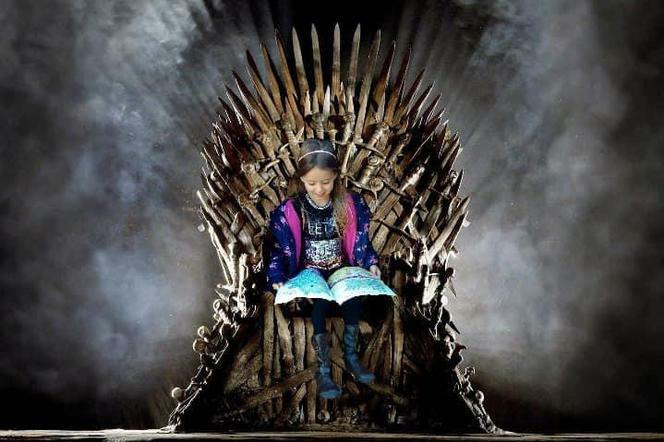 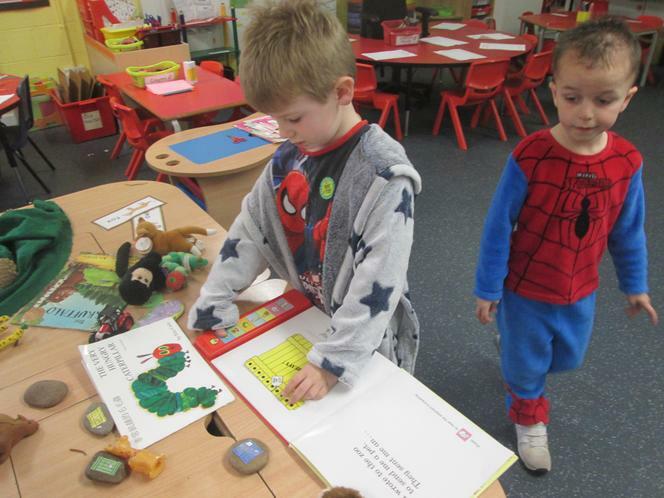 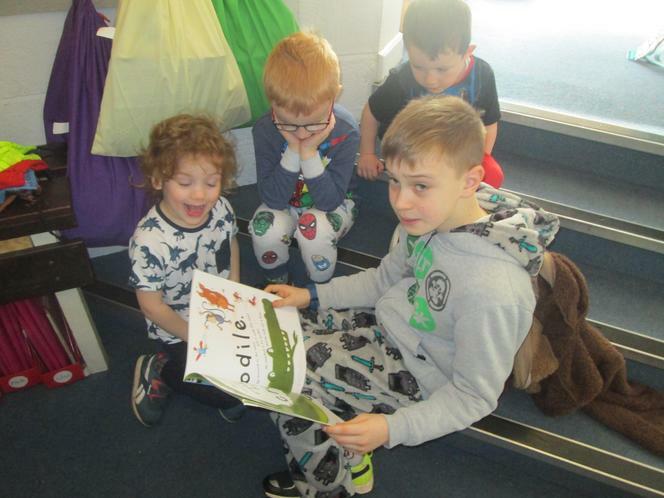 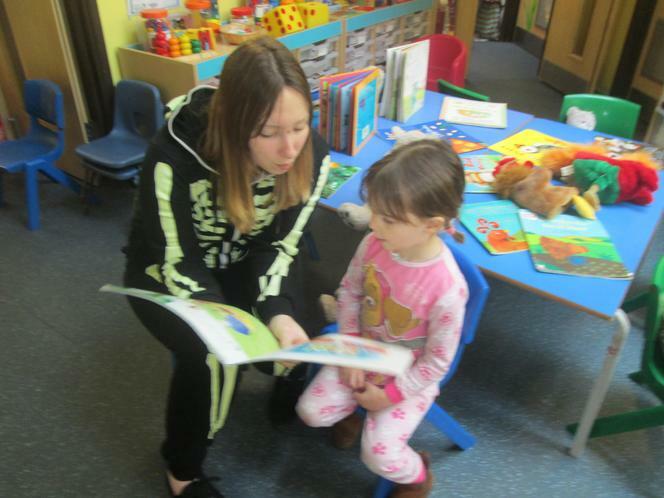 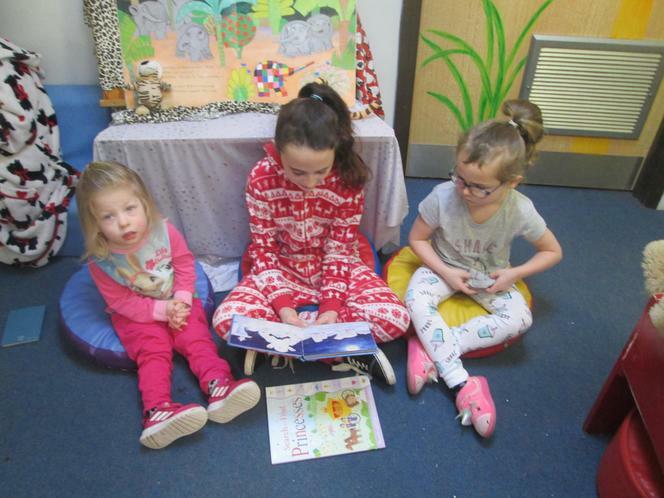 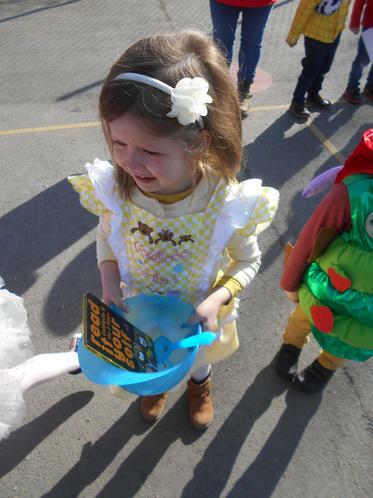 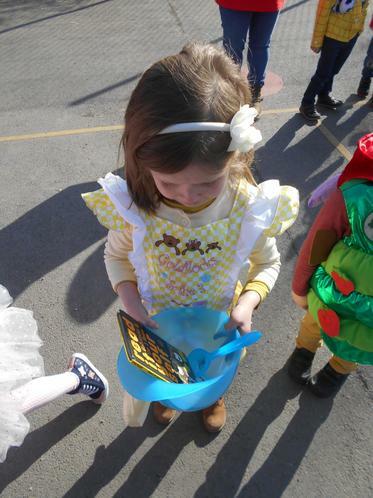 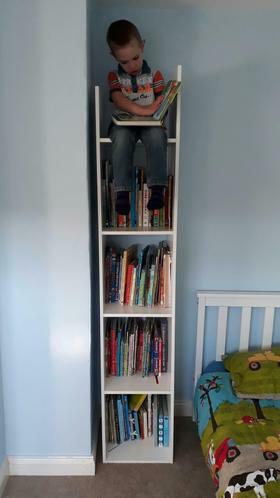 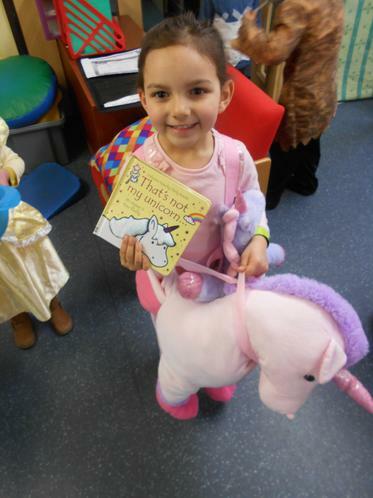 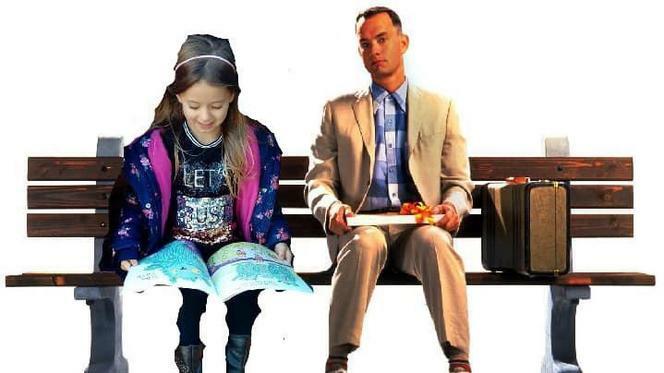 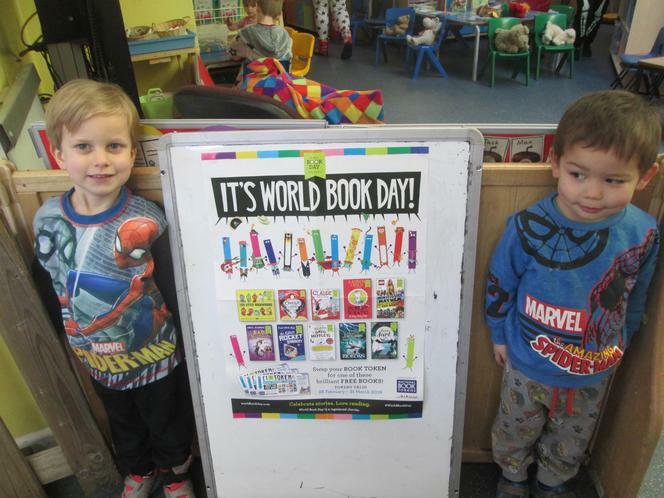 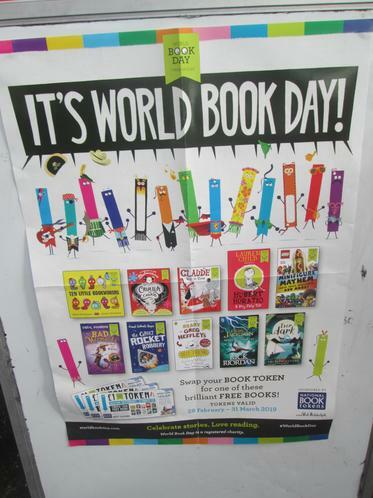 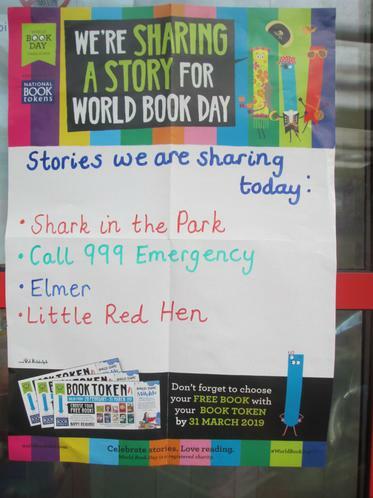 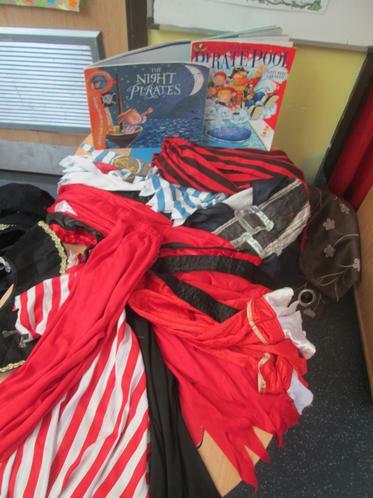 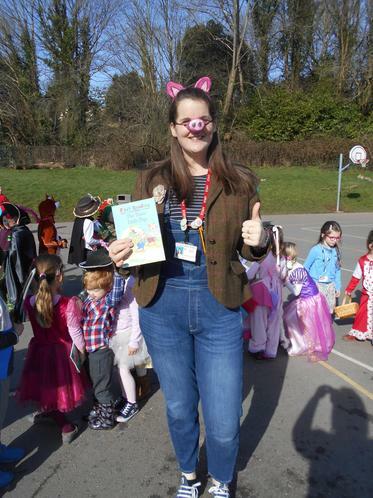 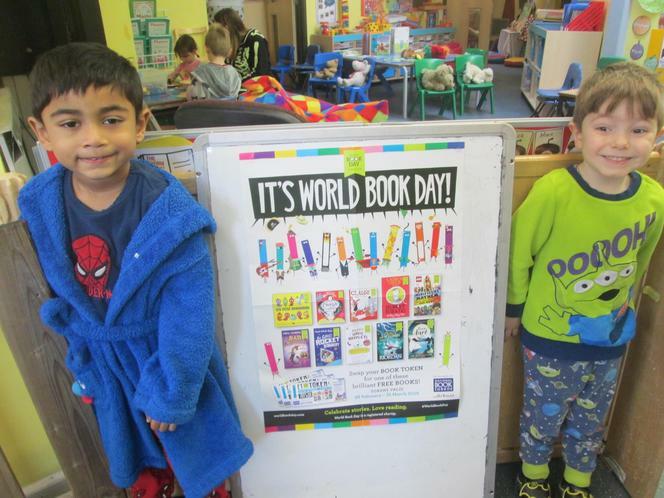 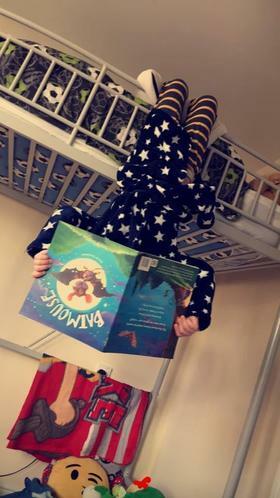 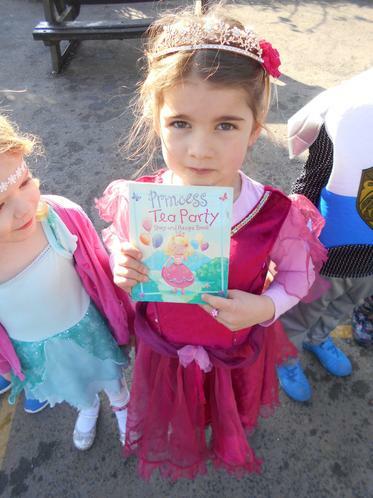 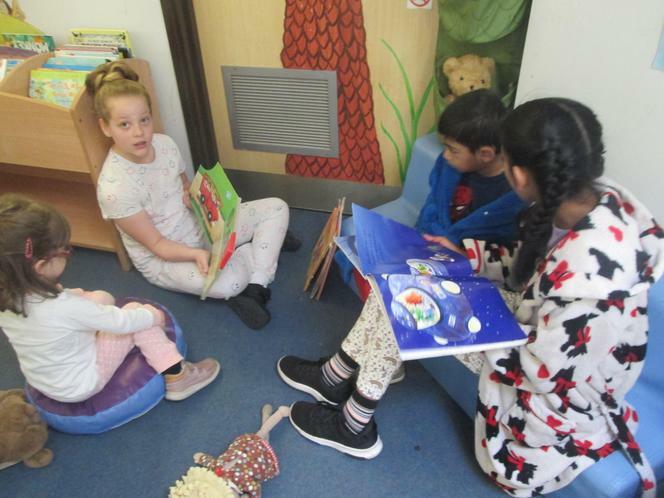 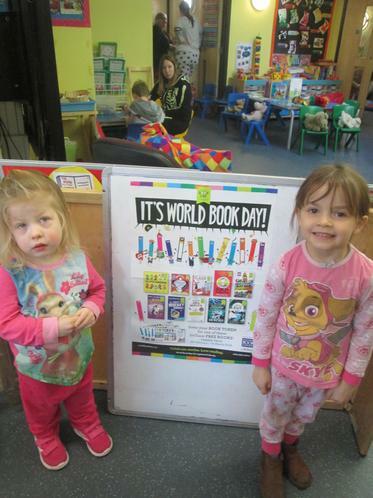 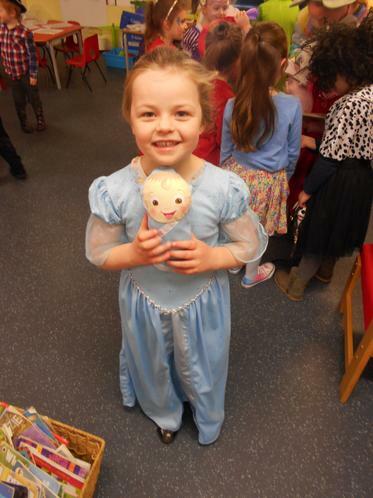 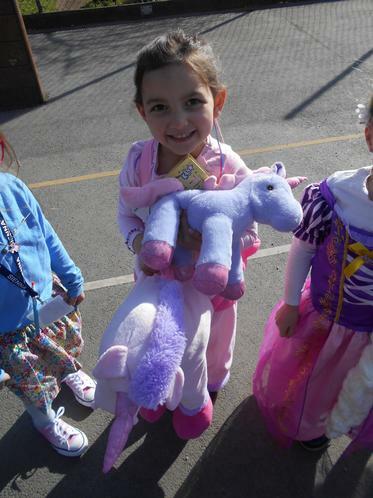 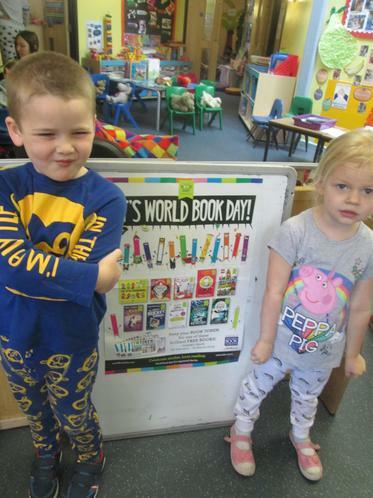 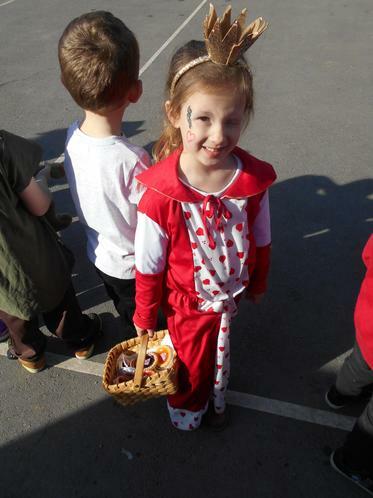 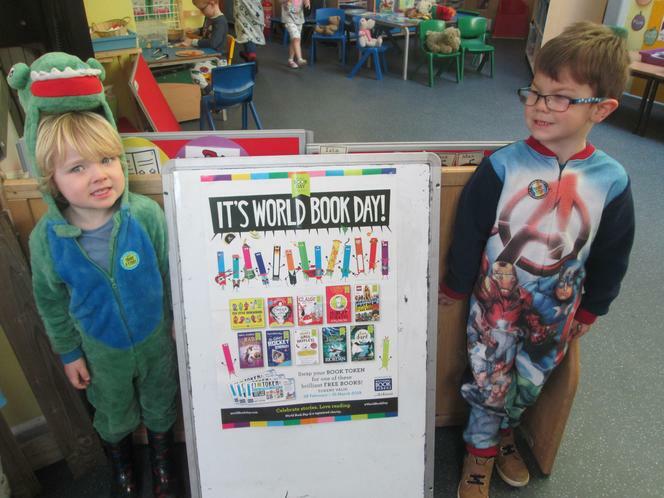 World Book Day - Today, we wore our pyjamas and brought our favourite bedtime story to school. 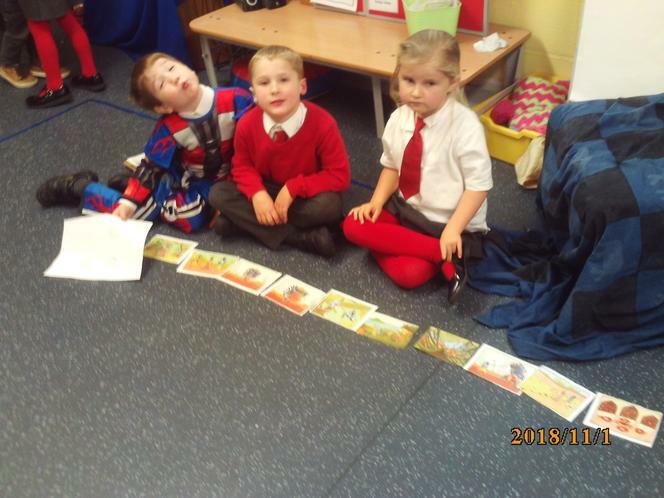 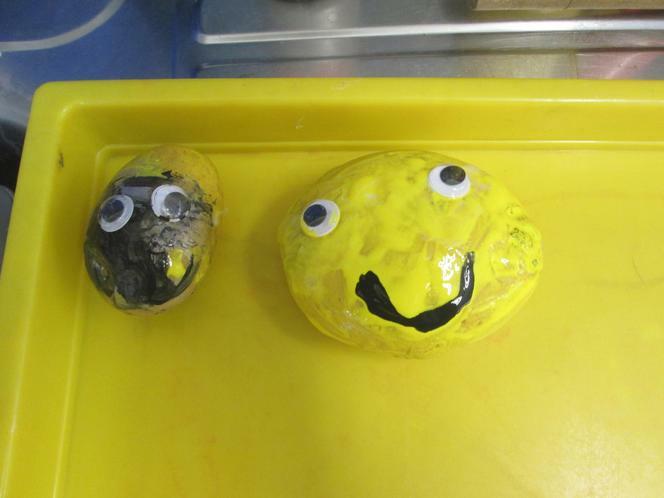 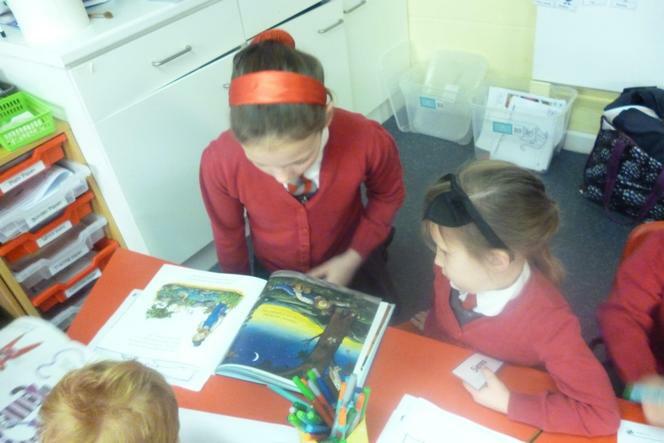 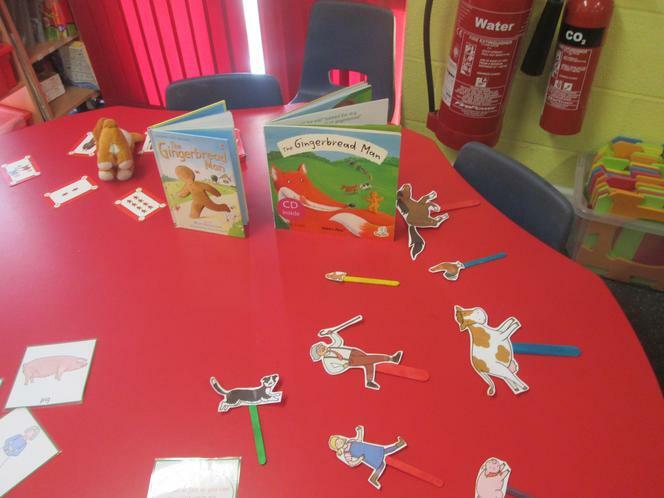 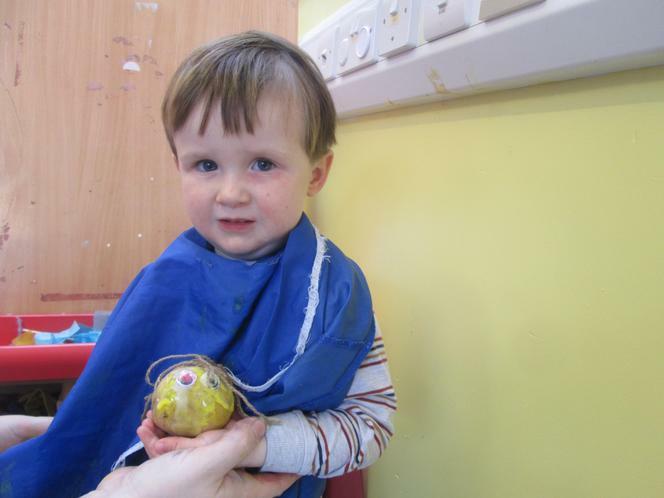 We enjoyed exploring different stories and designed our own 'booked potatoes'. 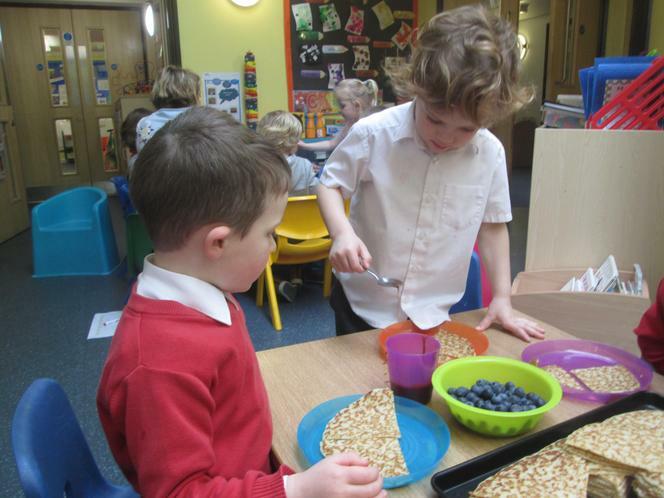 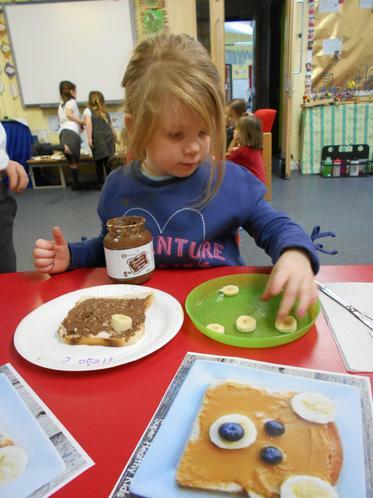 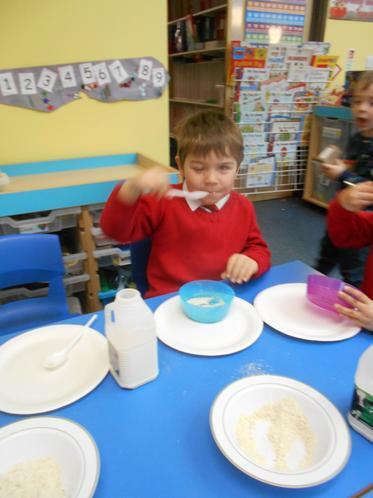 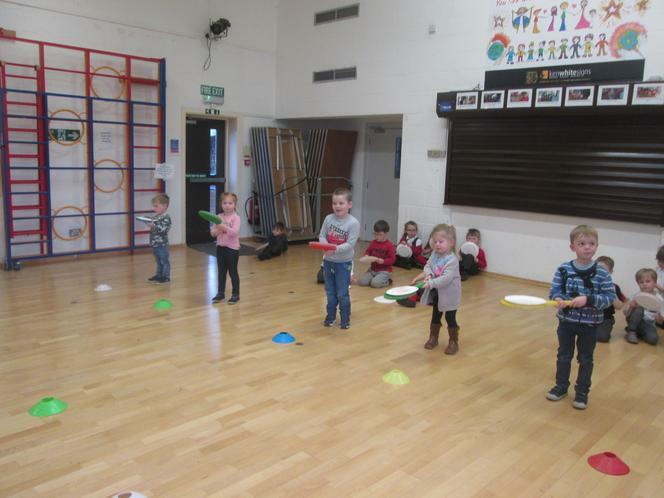 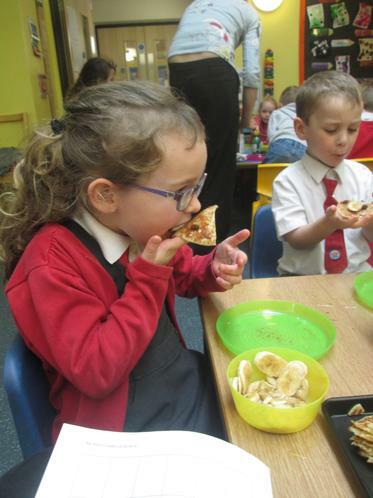 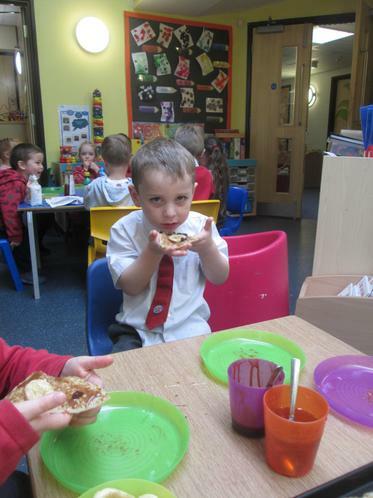 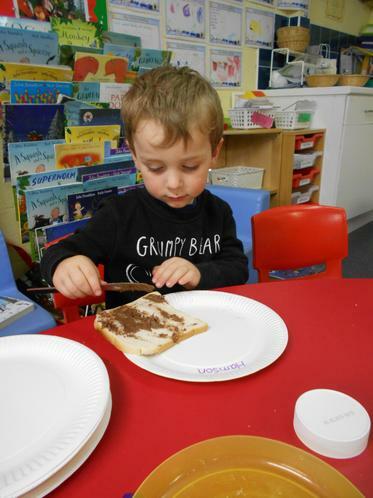 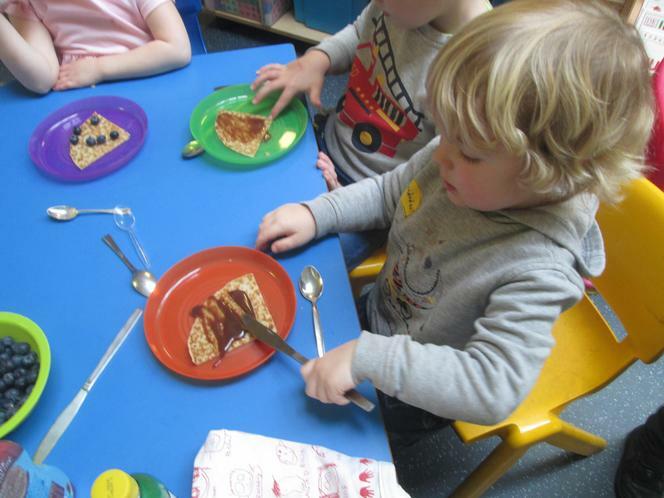 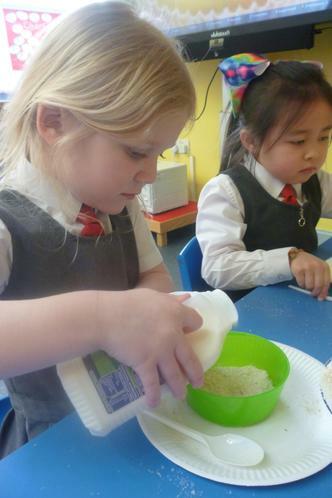 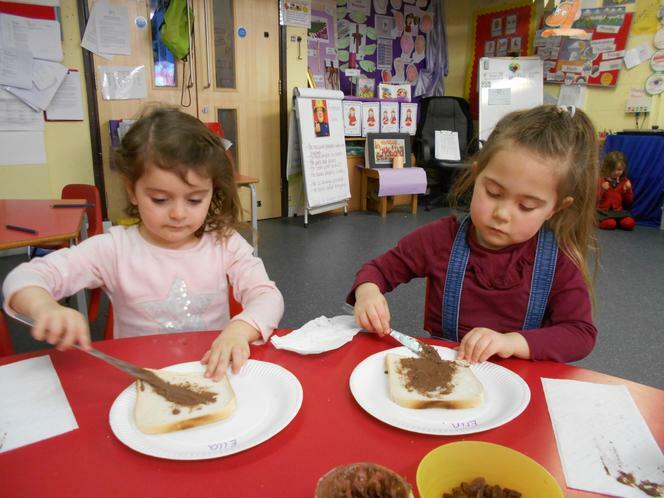 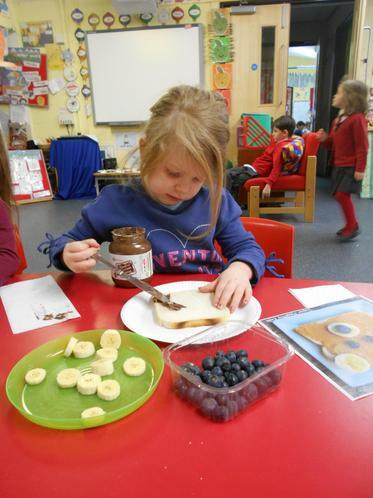 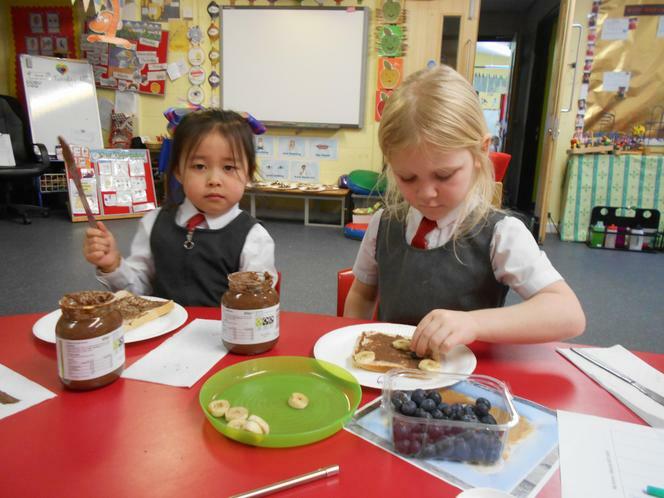 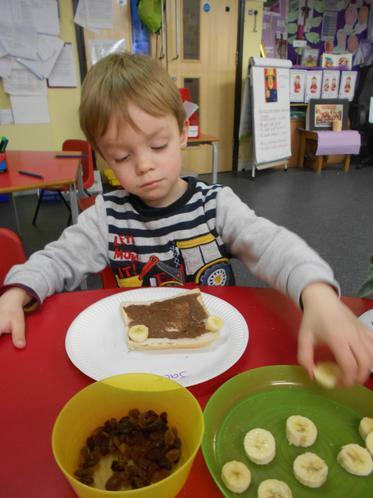 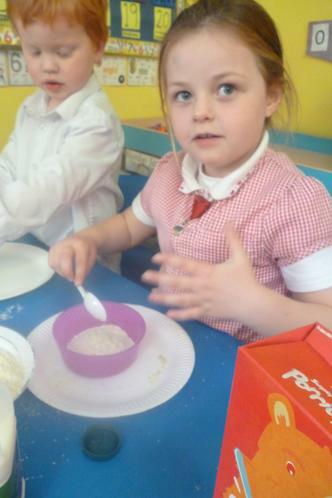 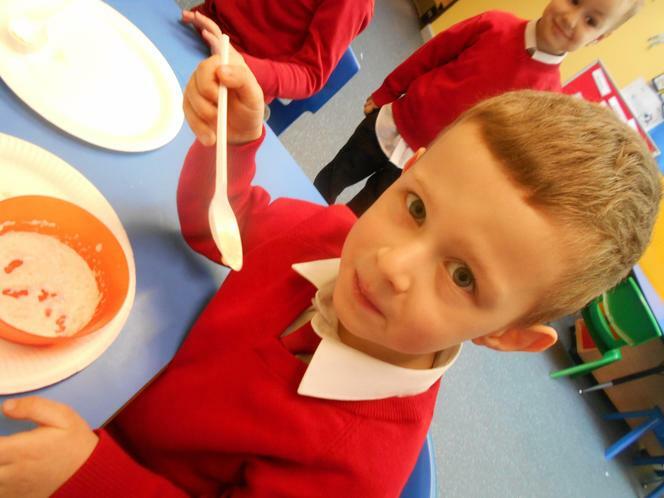 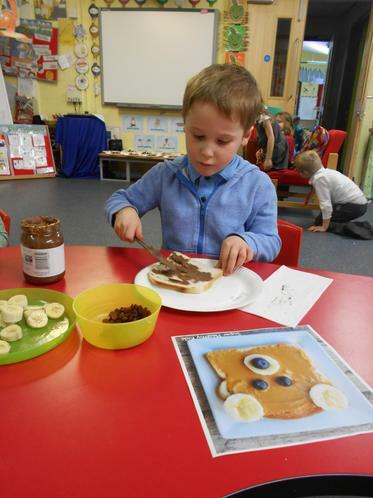 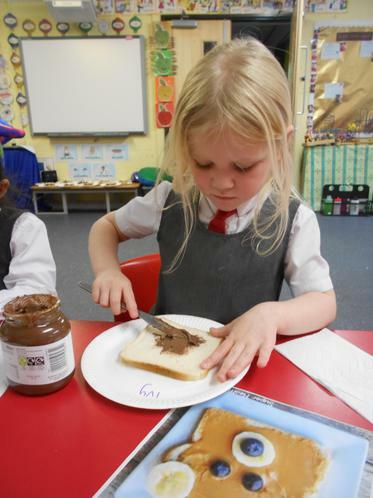 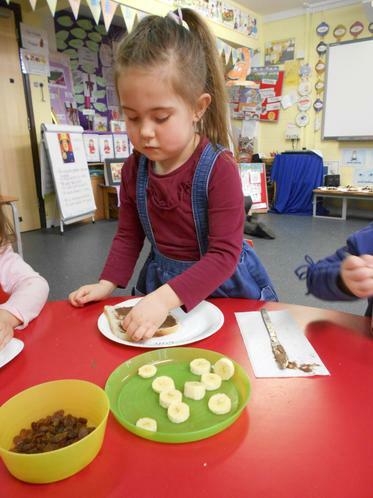 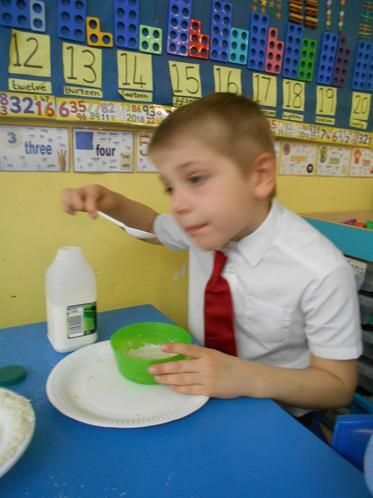 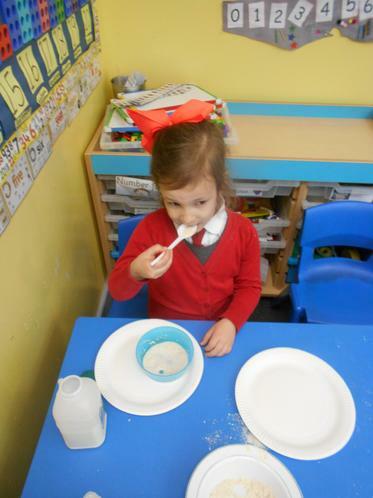 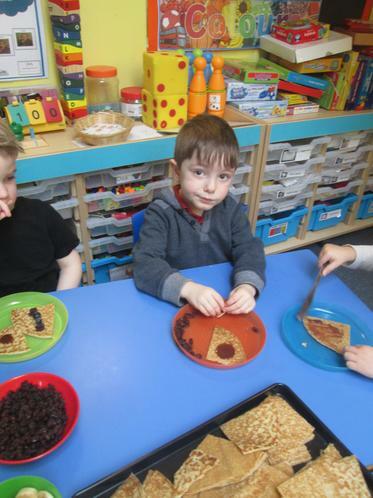 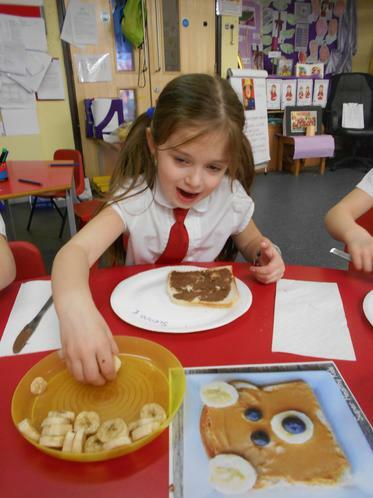 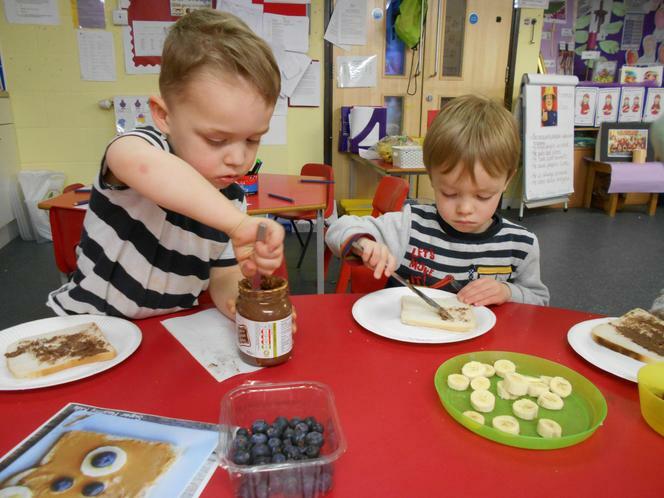 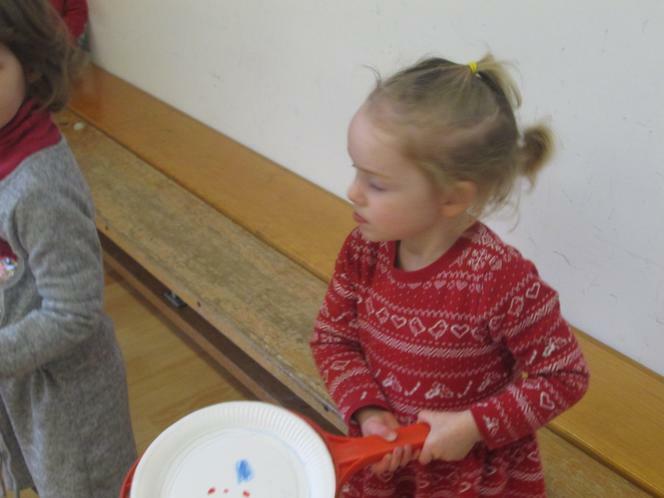 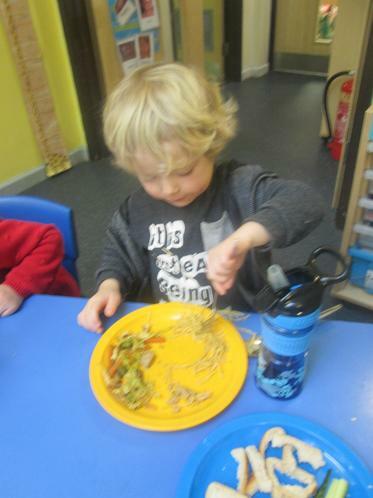 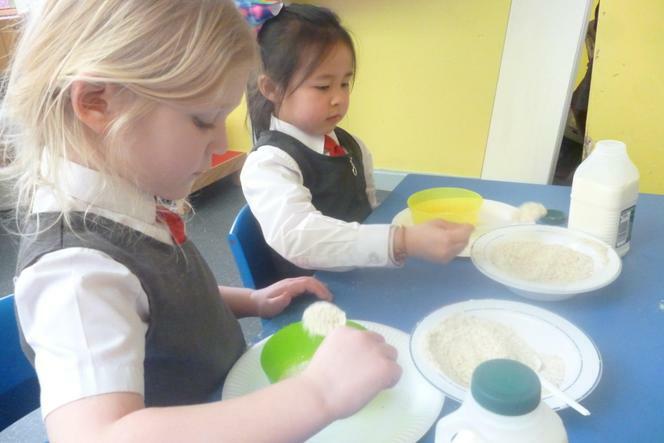 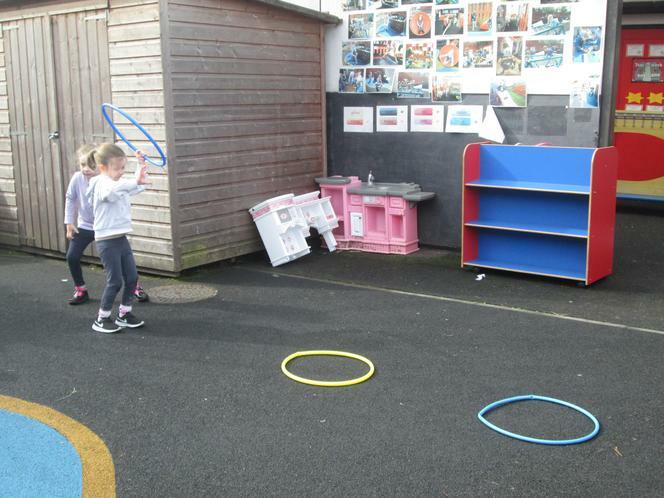 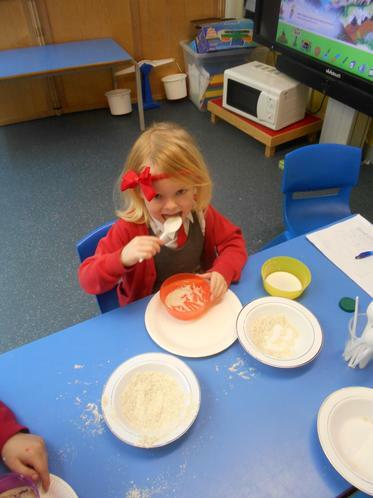 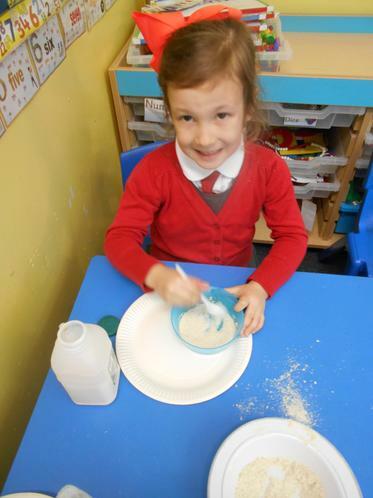 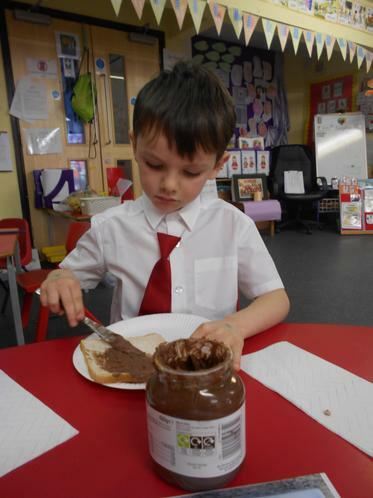 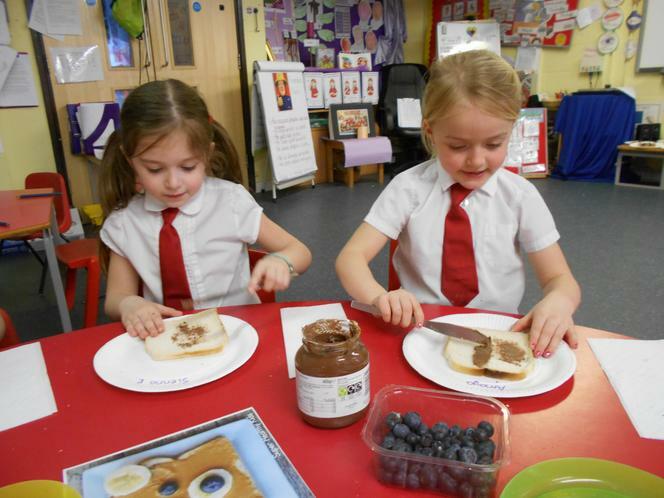 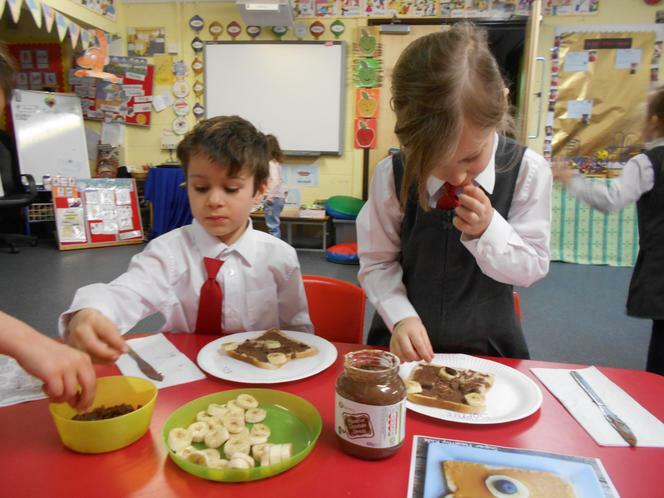 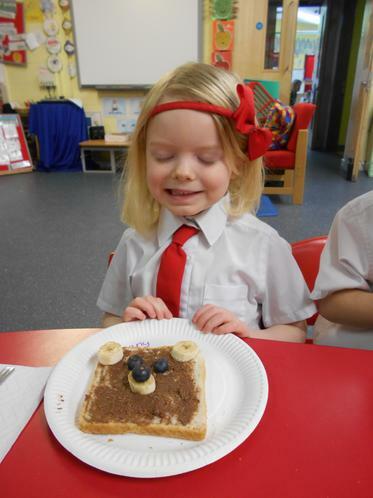 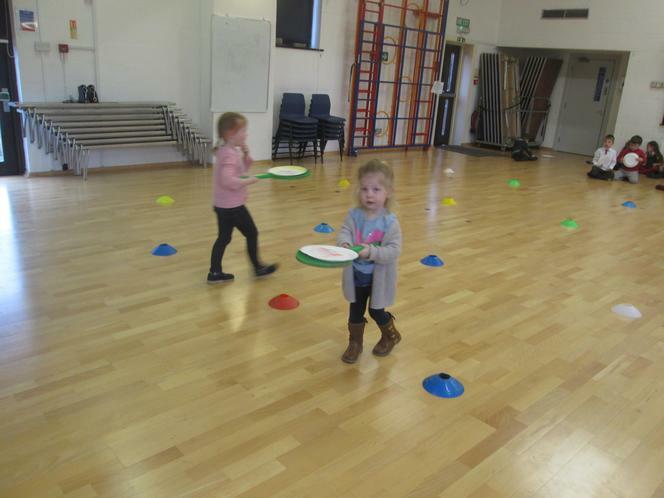 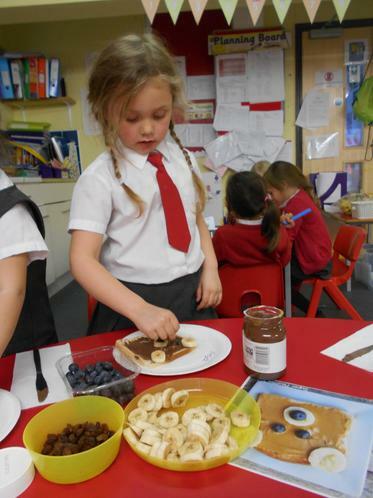 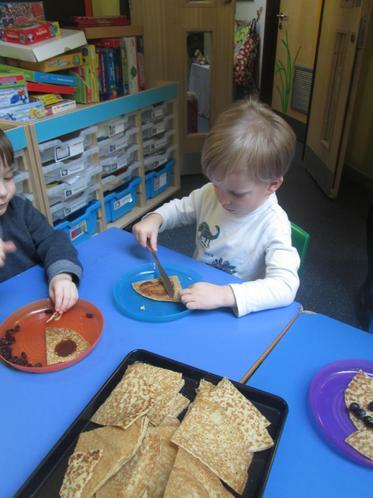 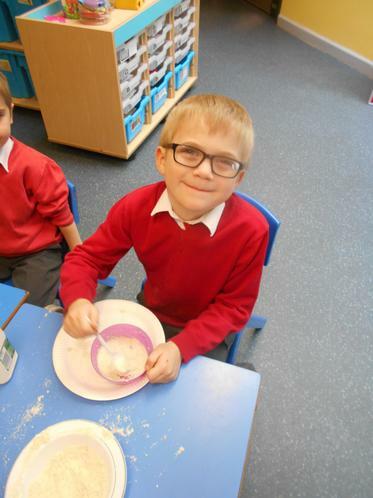 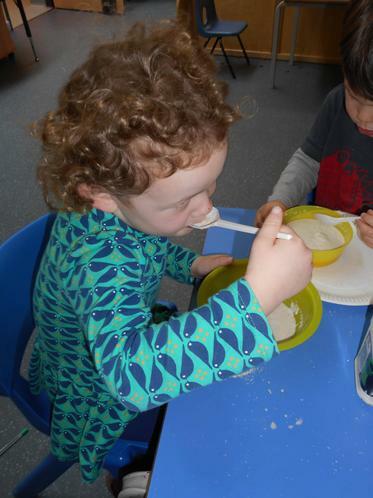 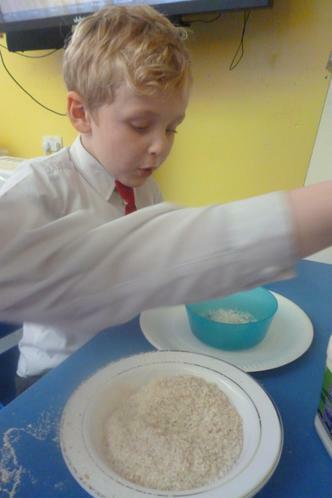 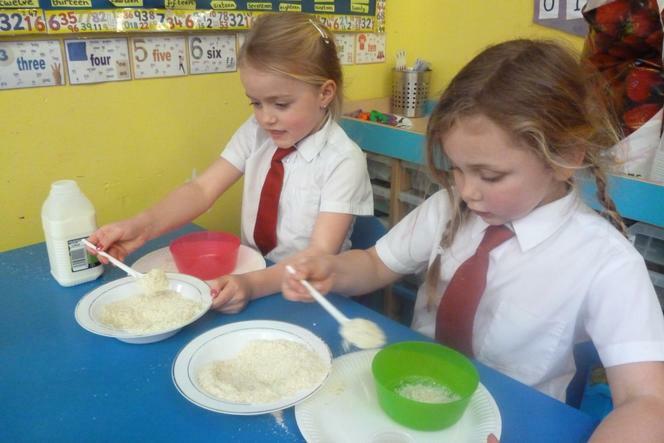 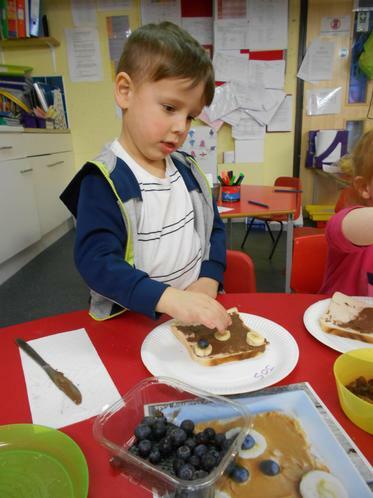 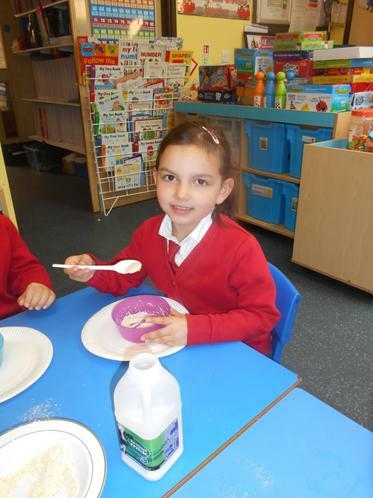 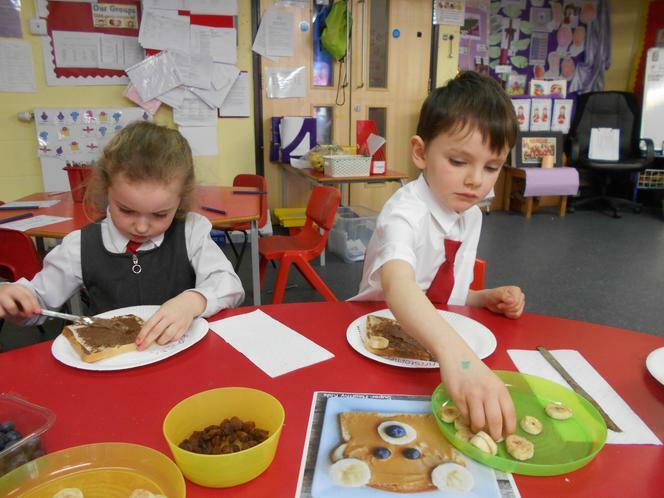 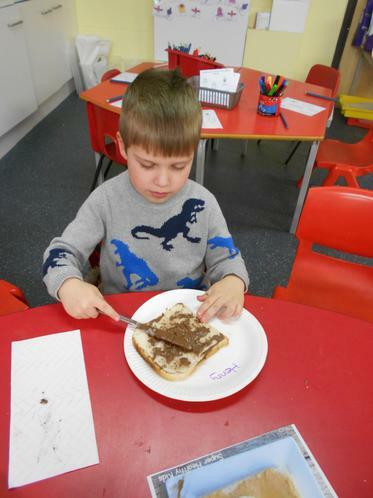 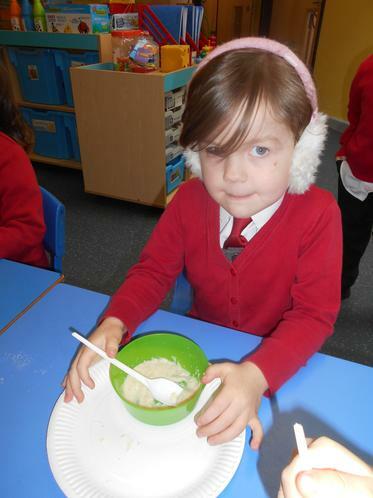 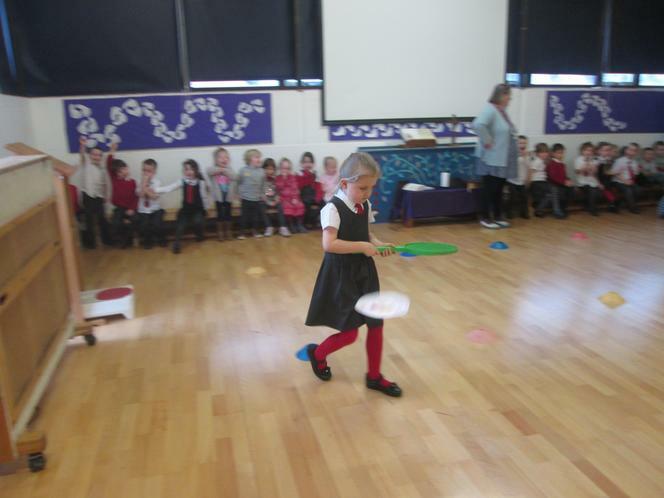 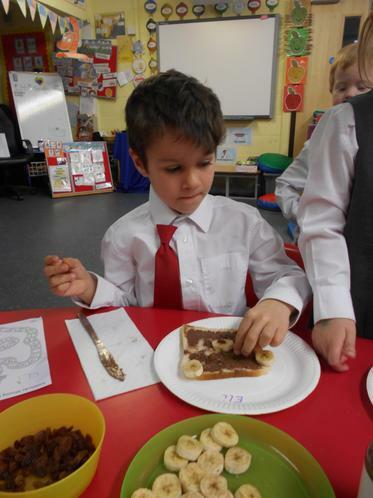 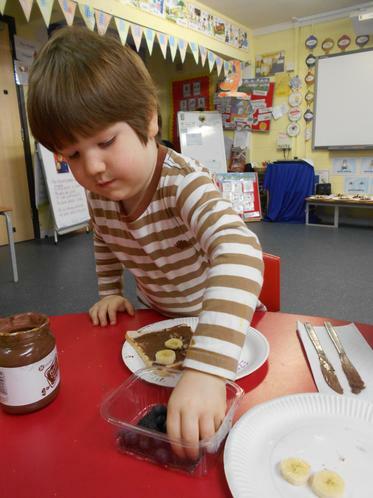 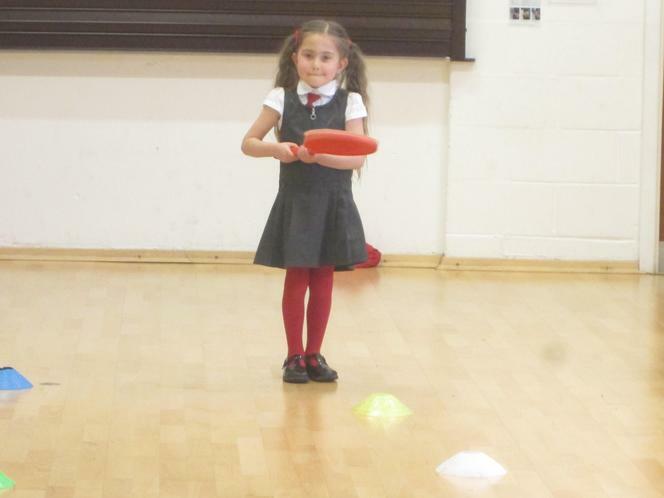 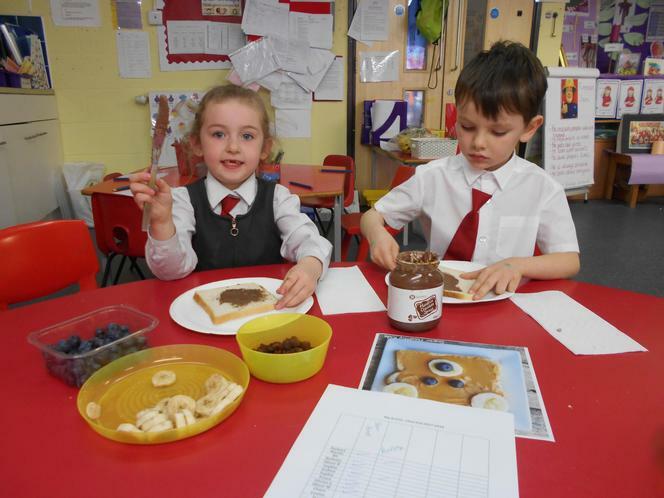 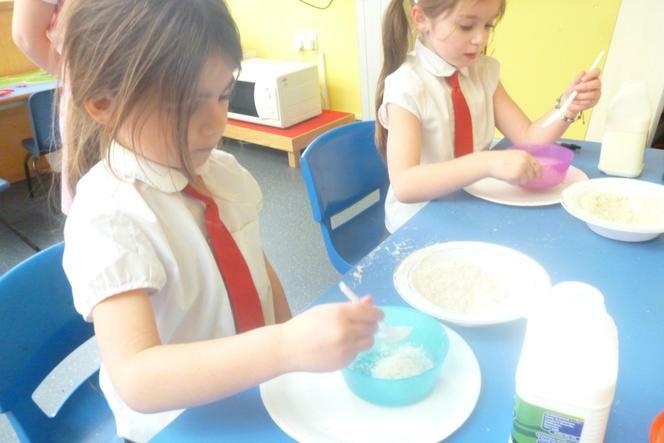 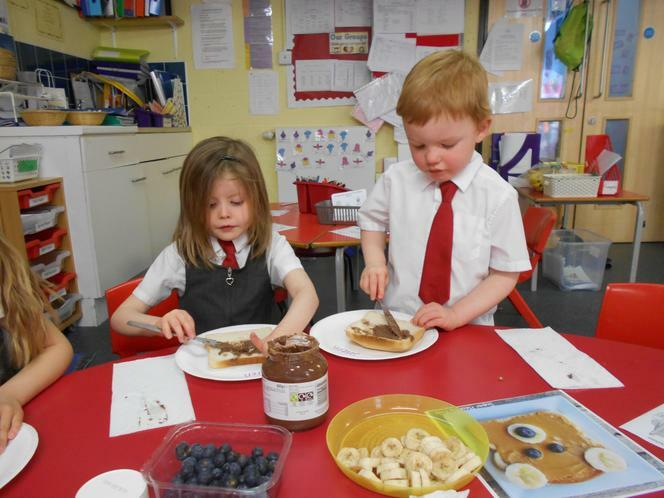 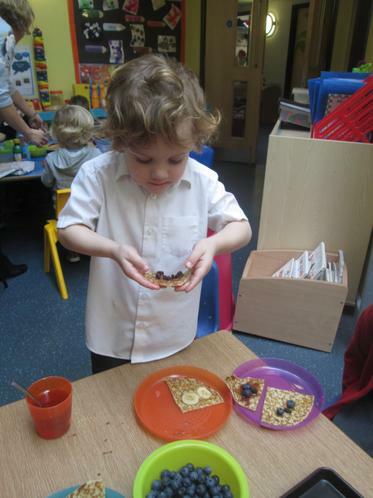 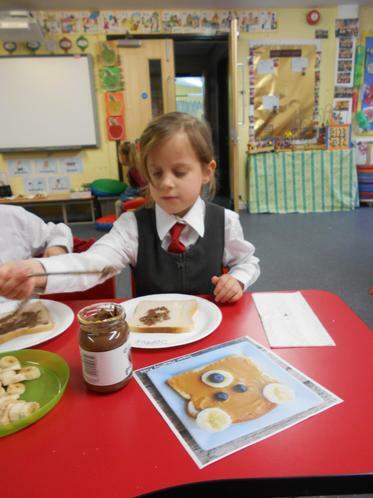 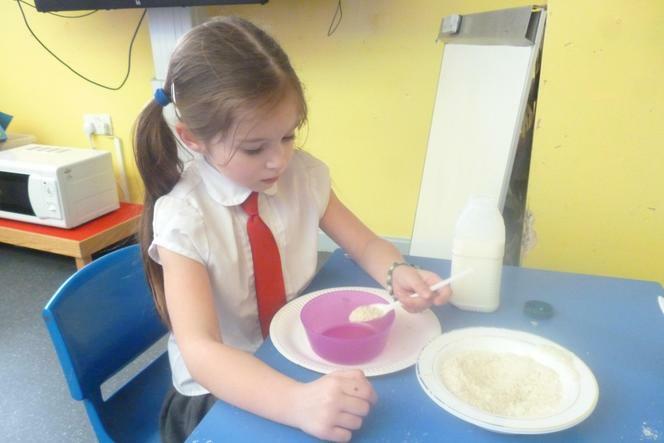 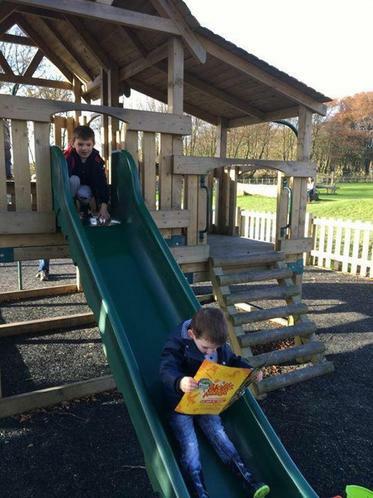 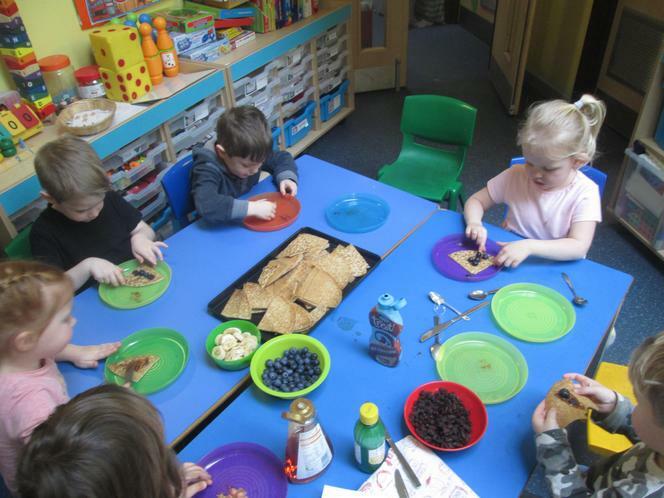 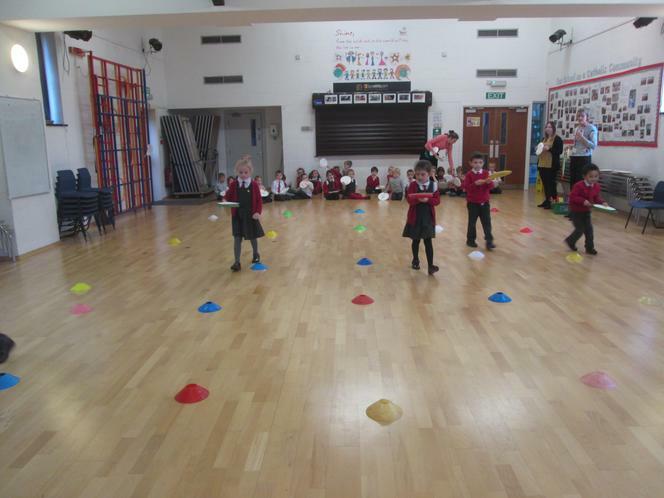 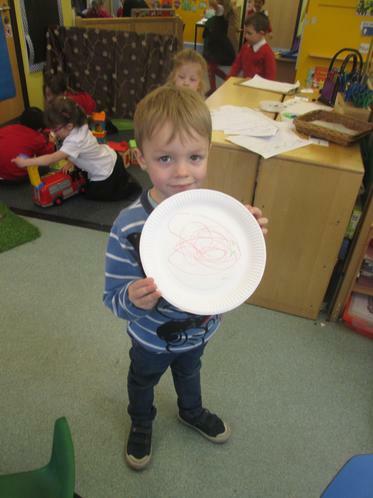 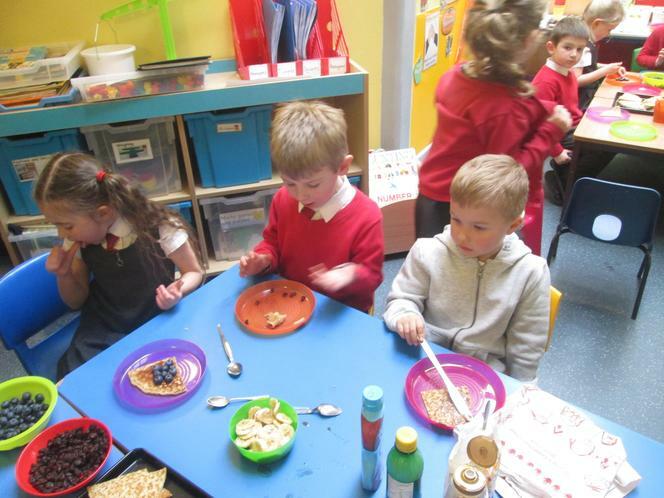 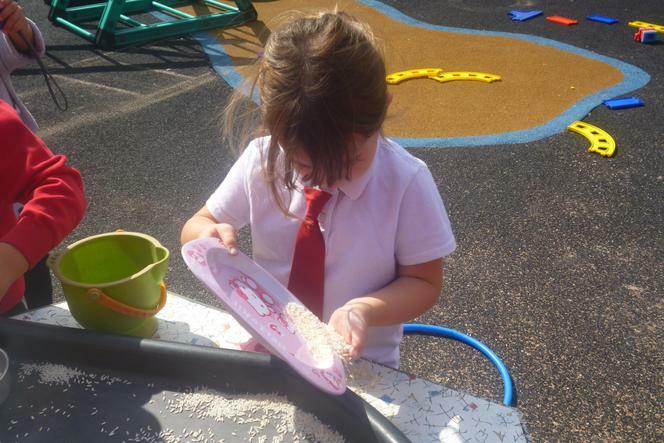 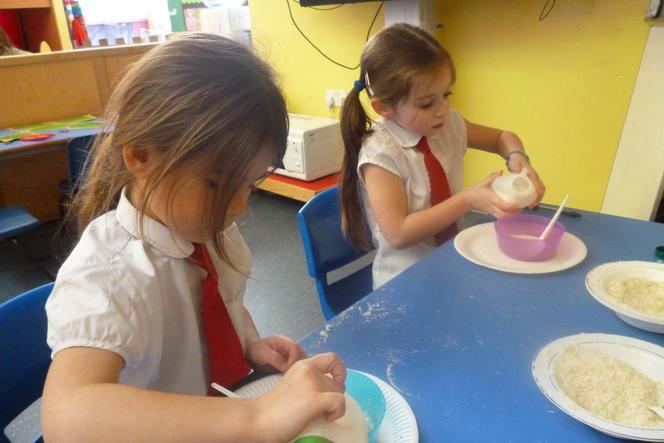 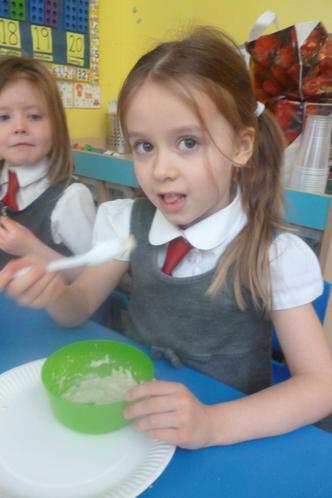 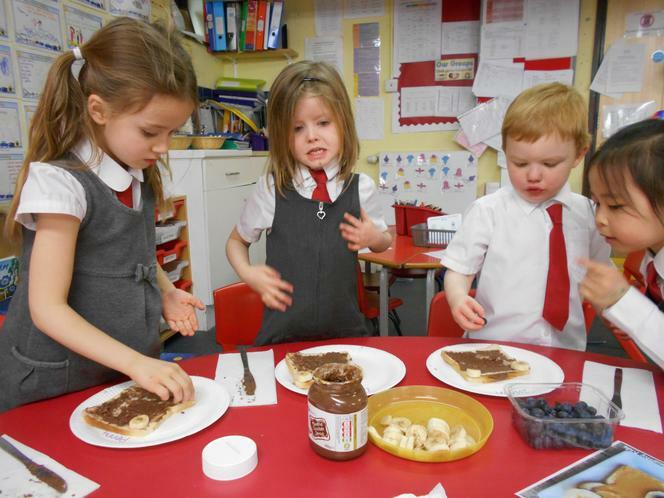 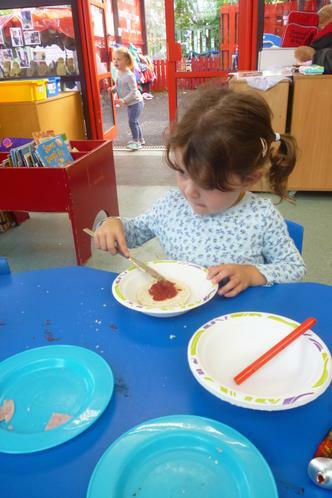 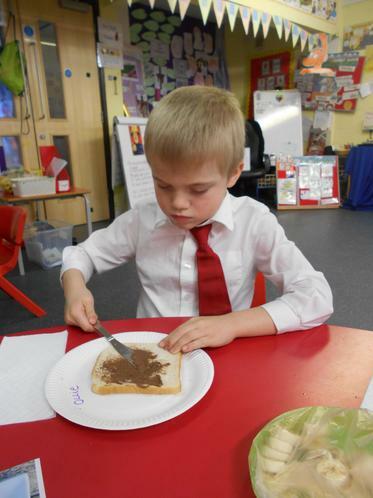 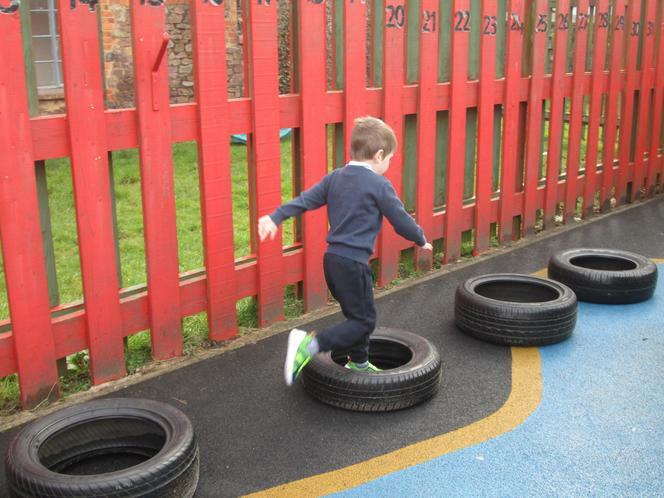 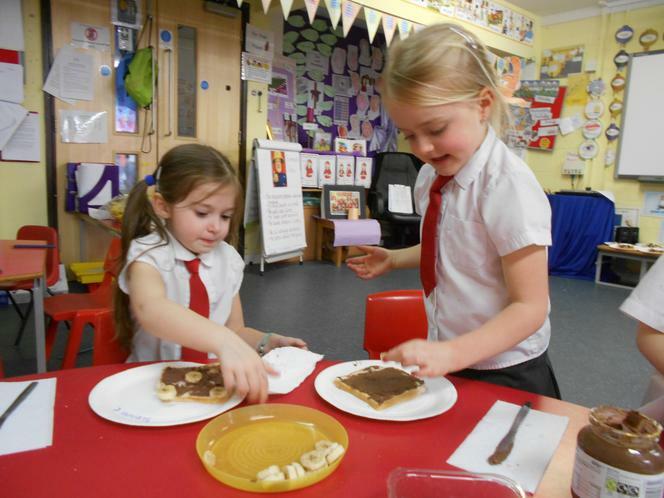 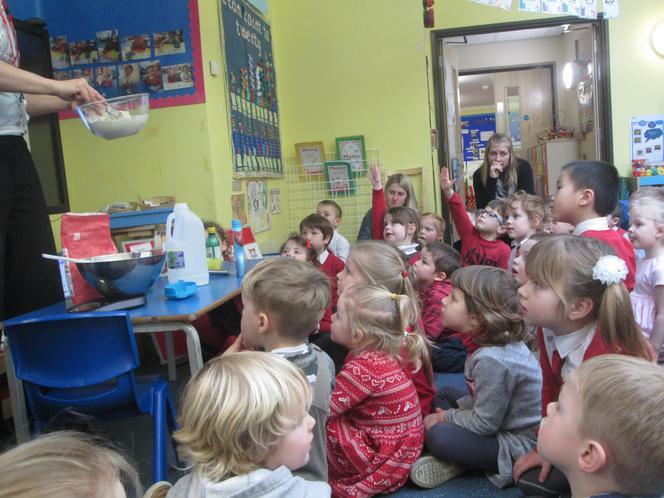 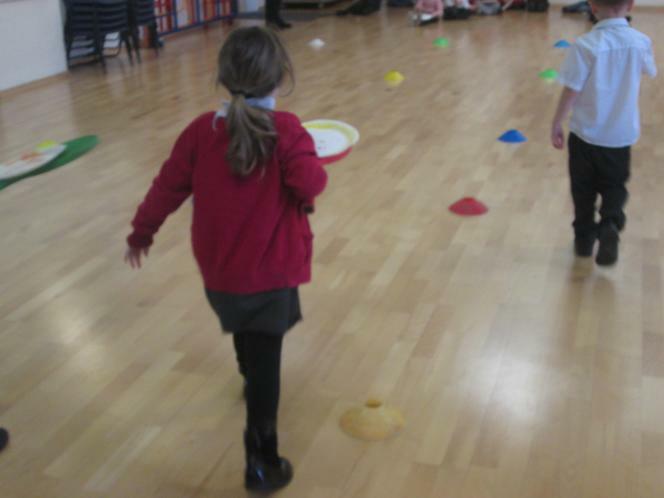 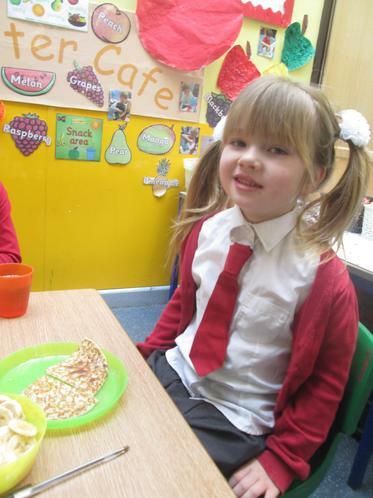 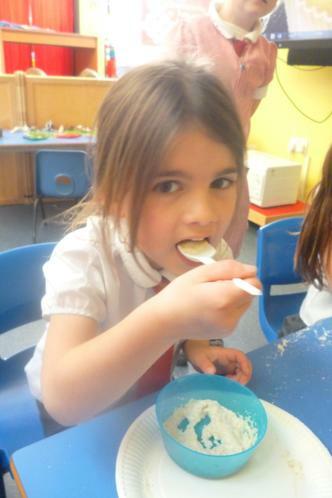 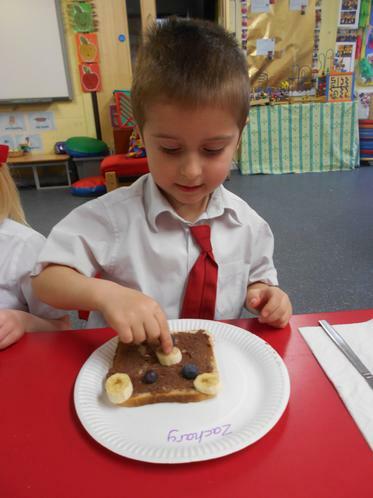 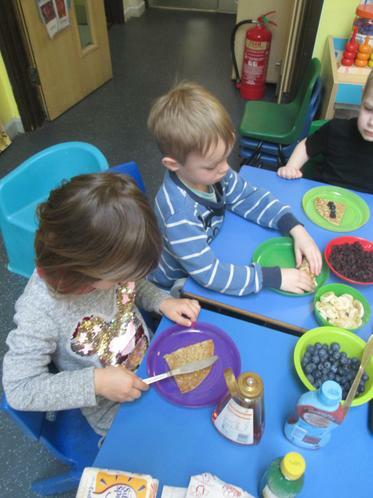 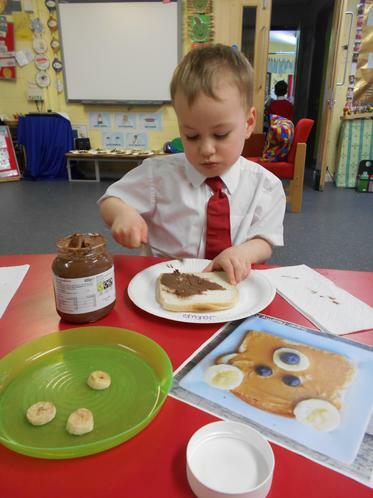 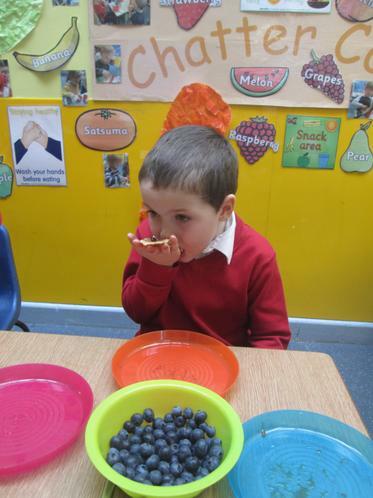 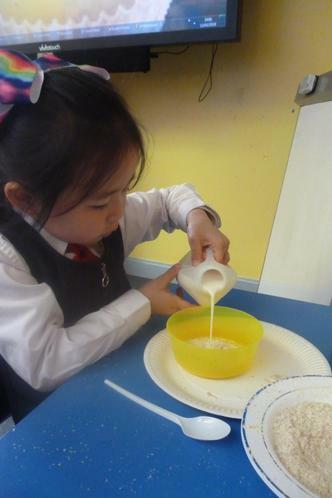 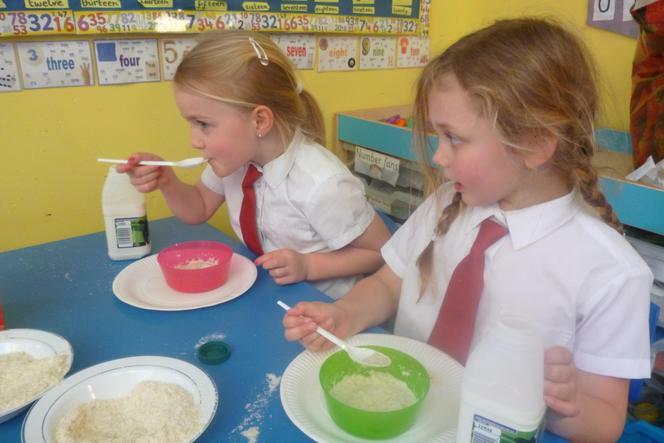 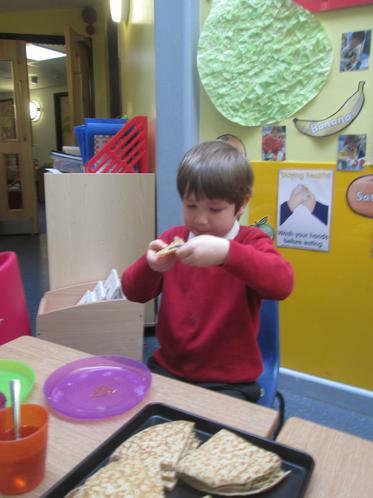 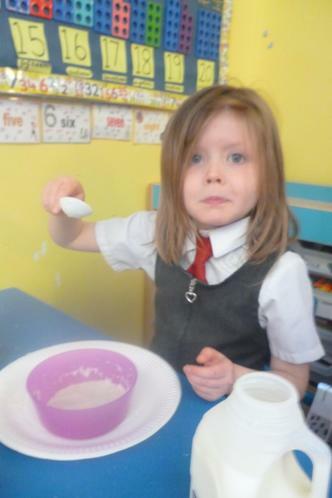 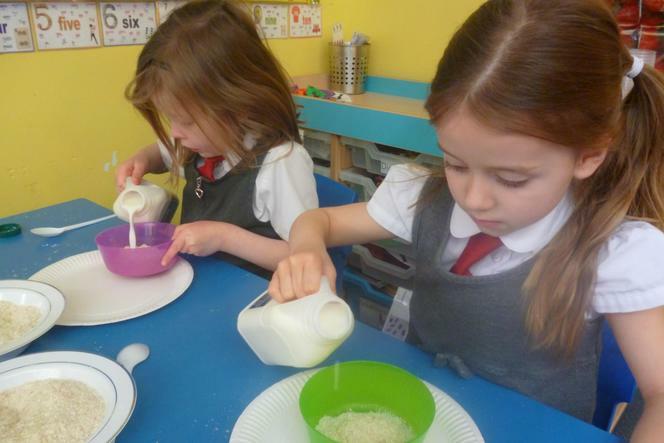 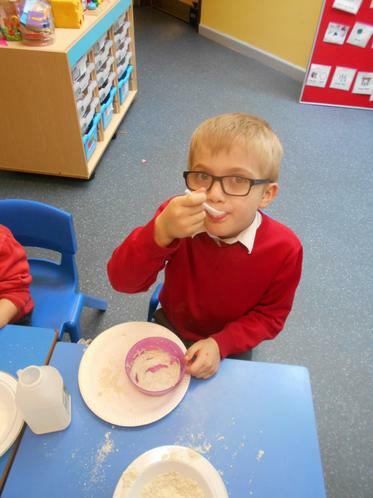 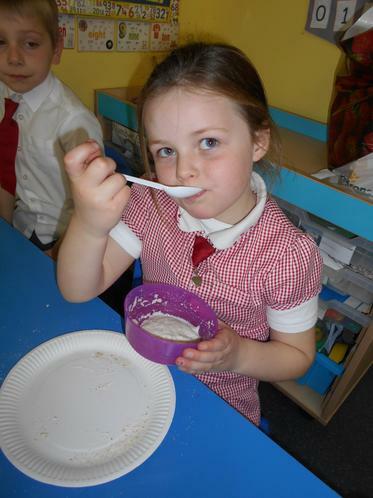 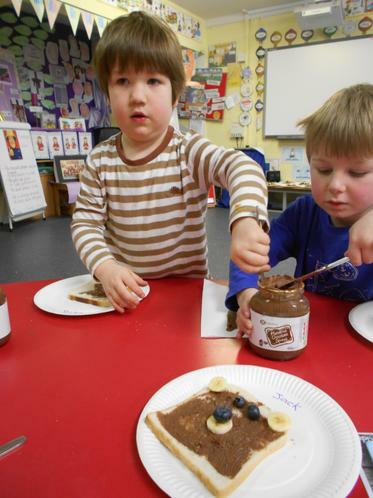 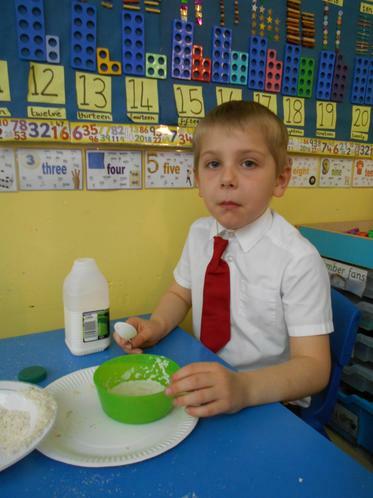 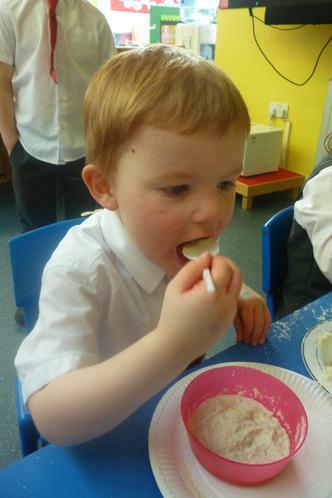 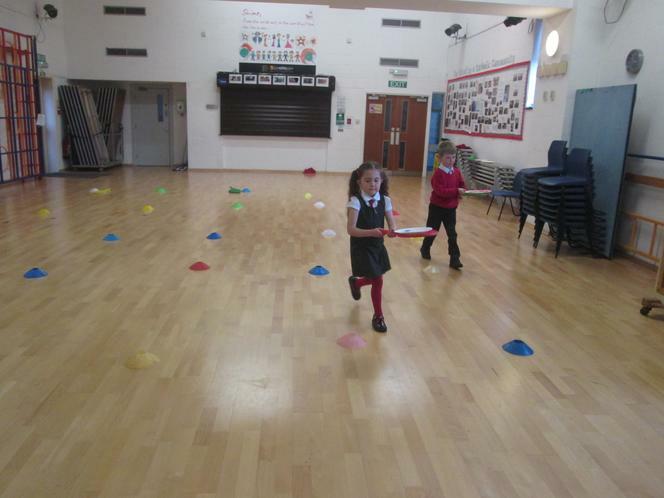 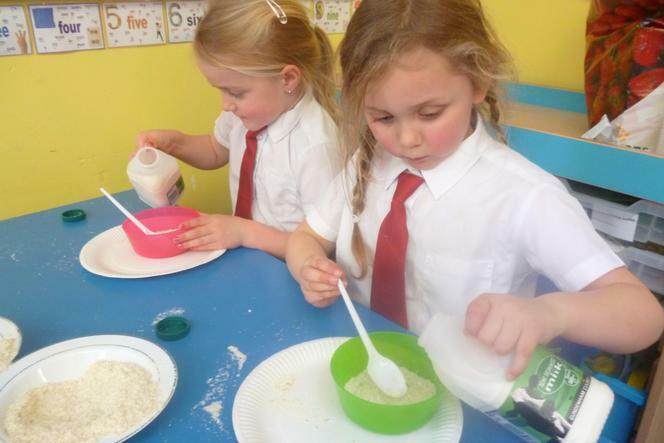 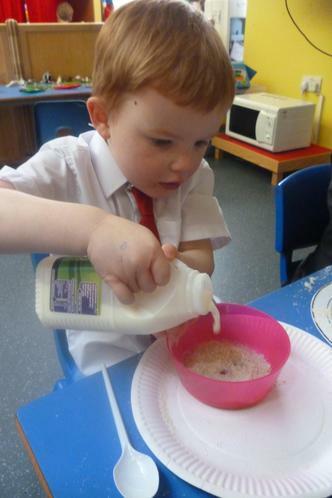 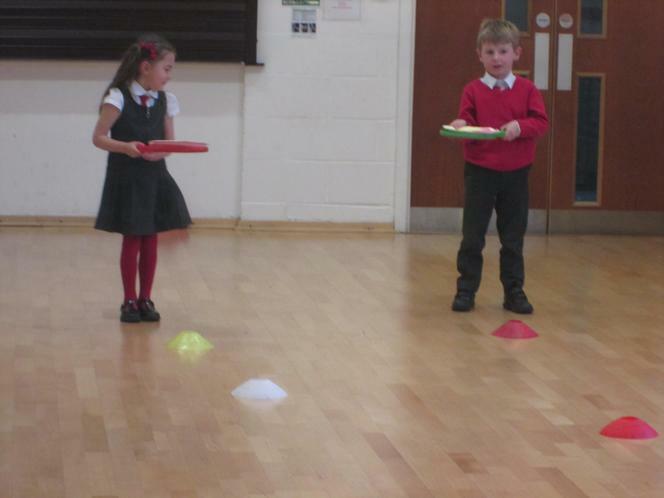 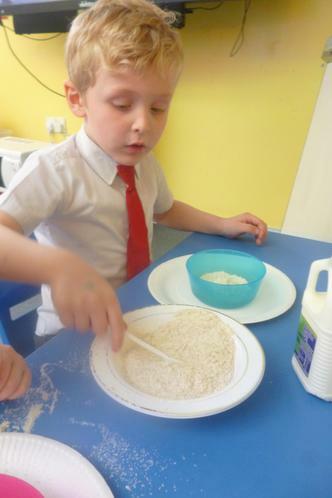 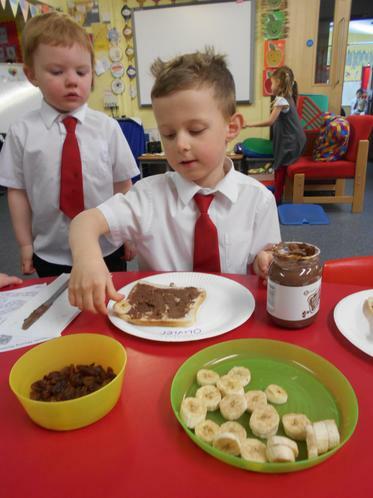 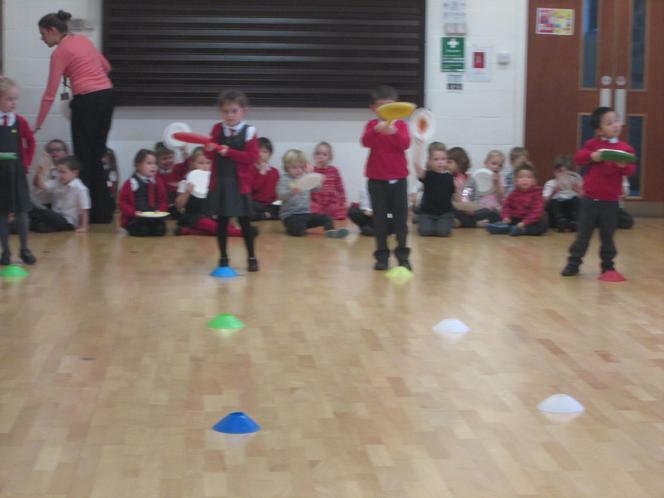 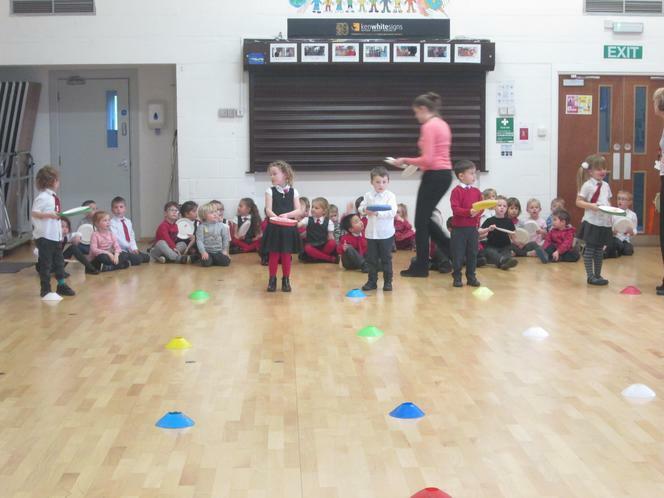 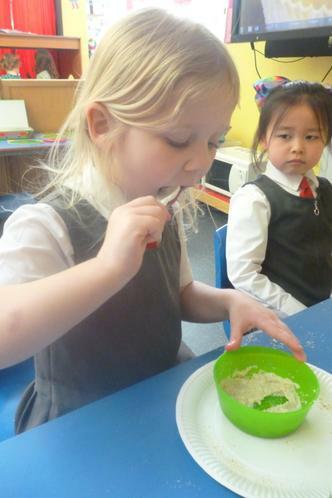 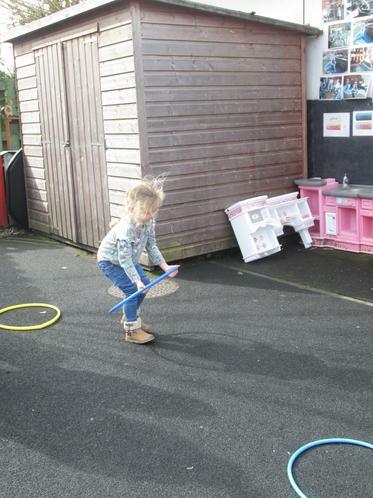 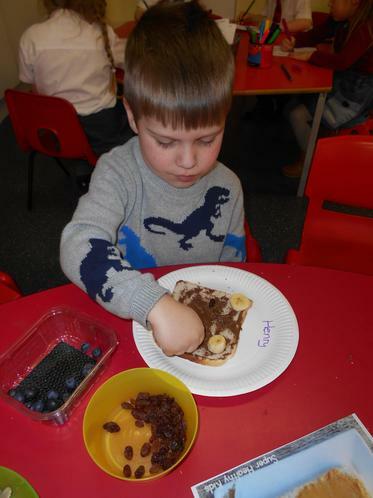 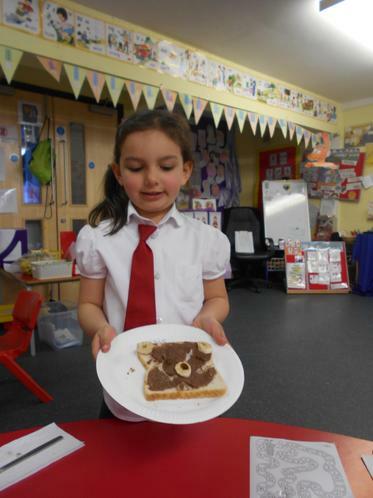 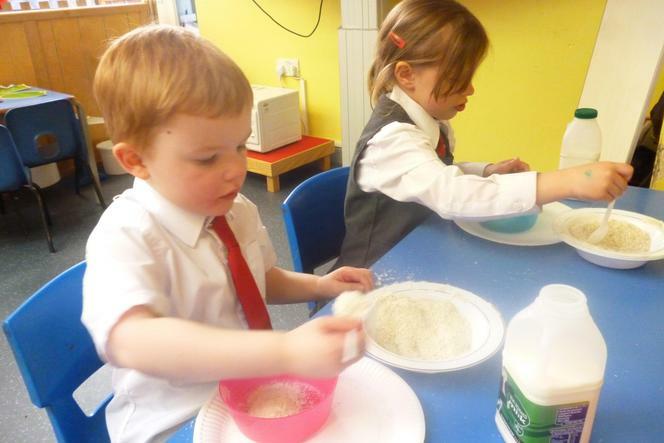 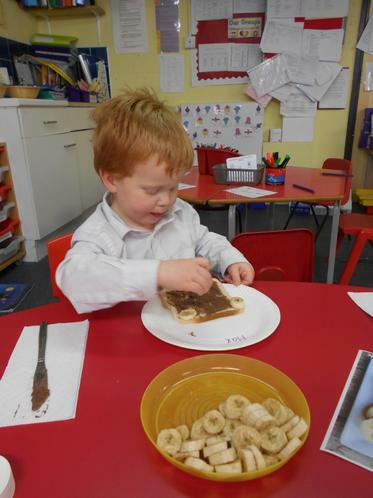 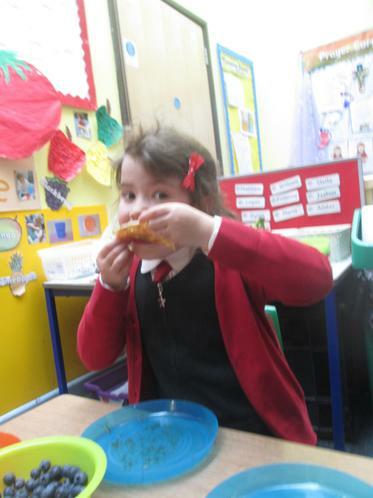 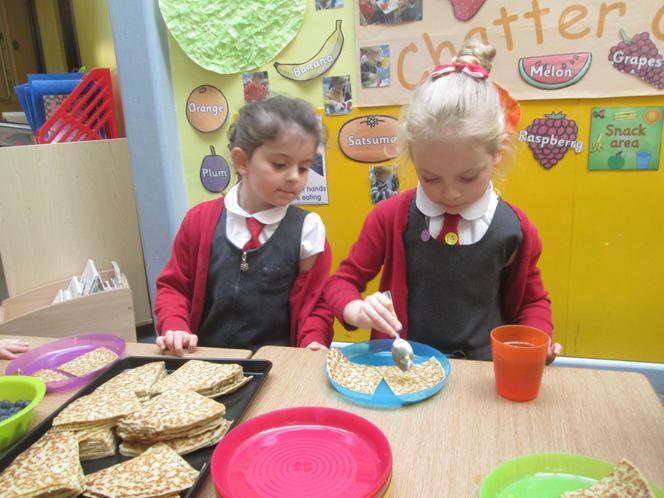 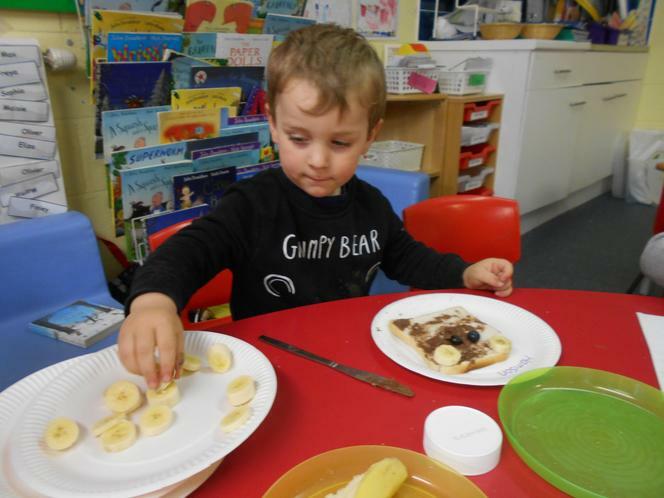 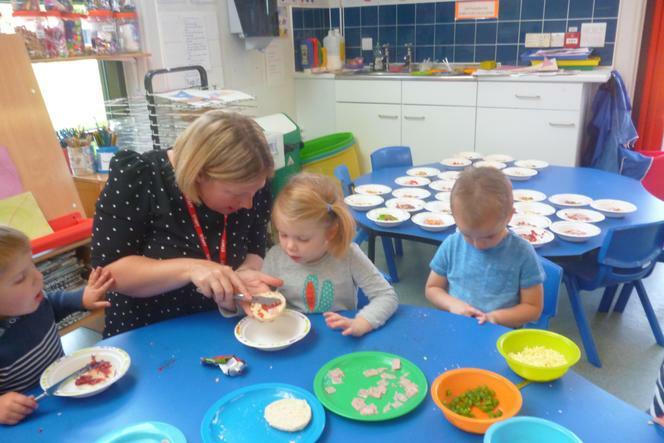 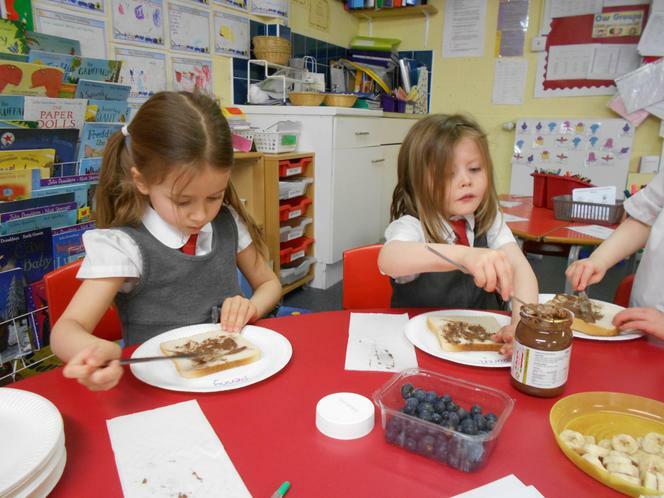 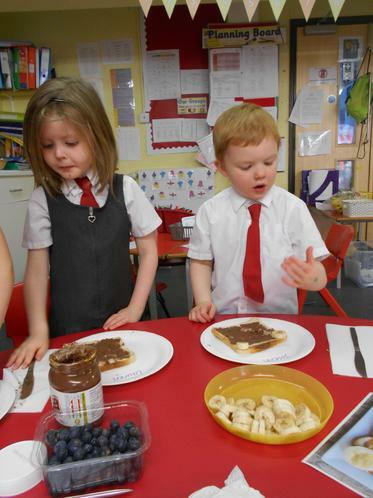 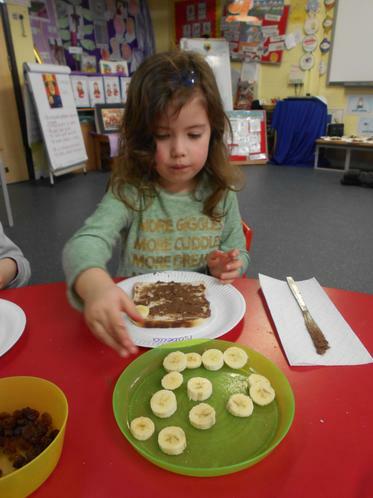 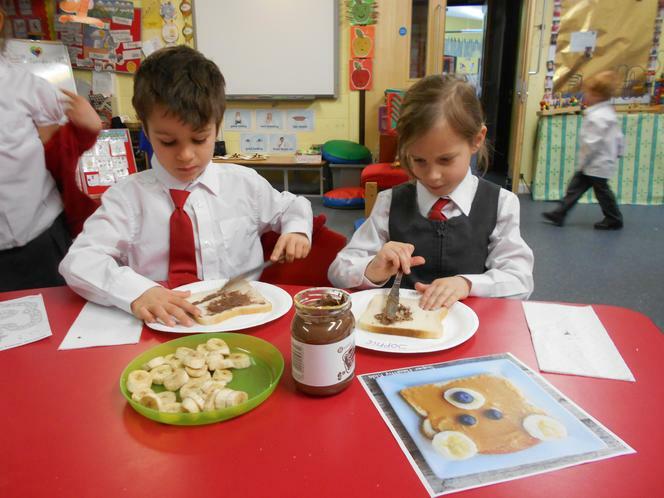 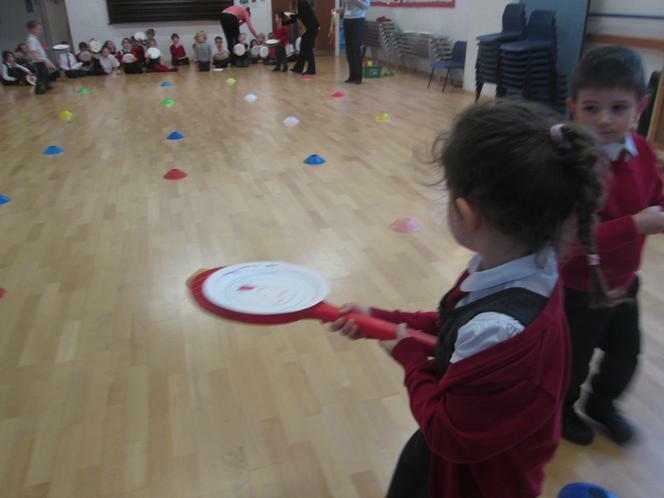 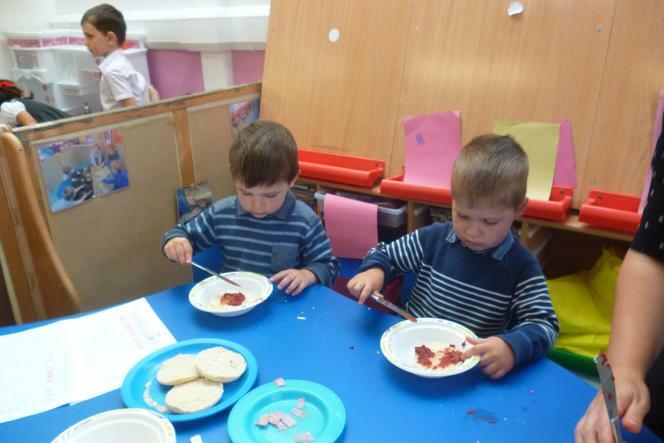 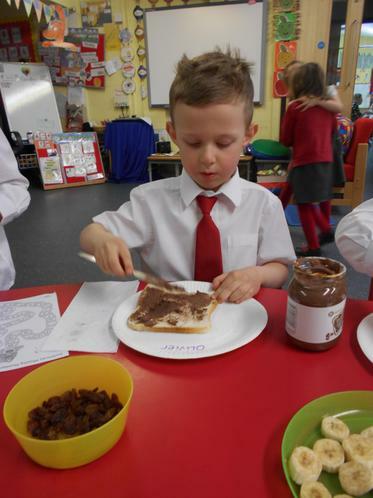 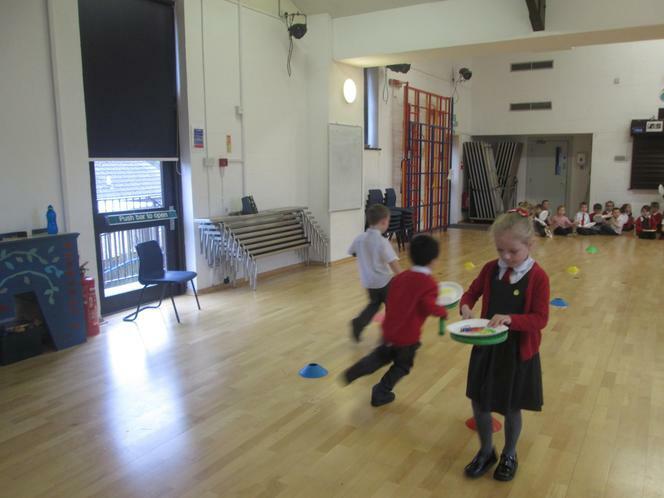 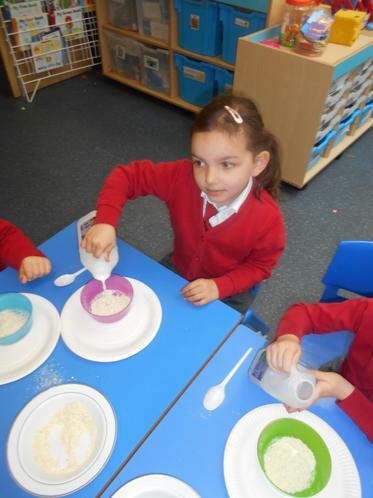 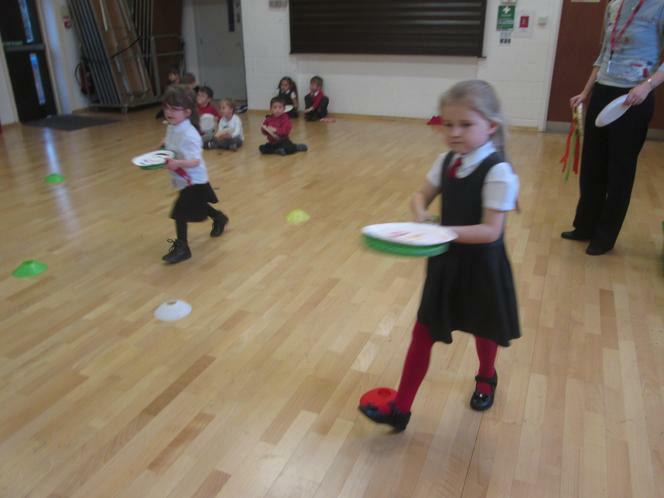 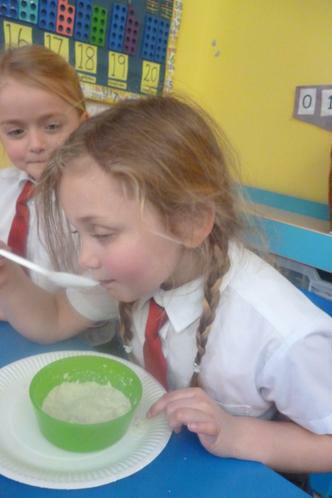 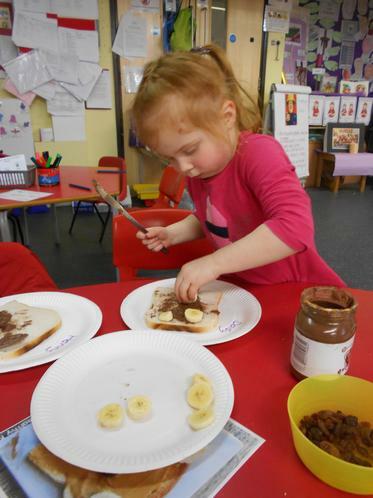 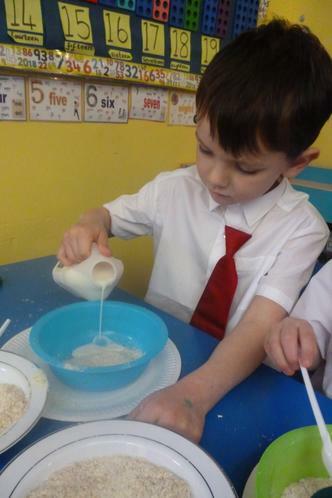 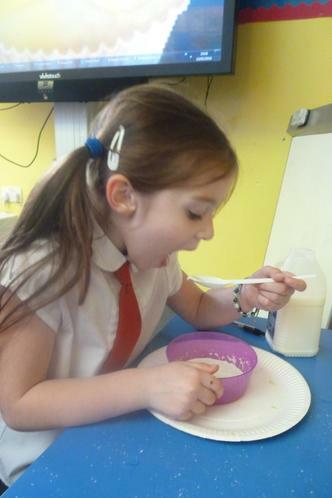 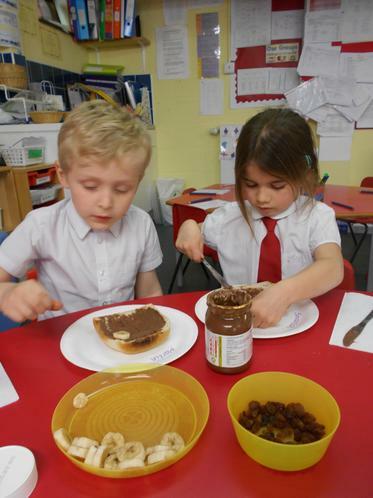 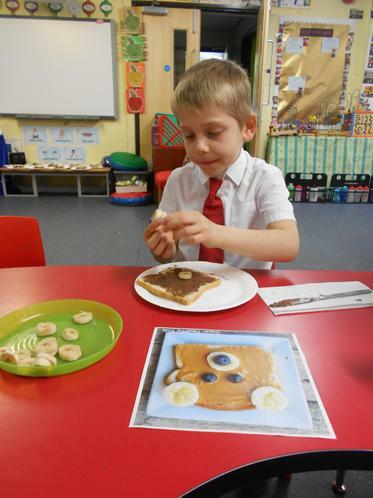 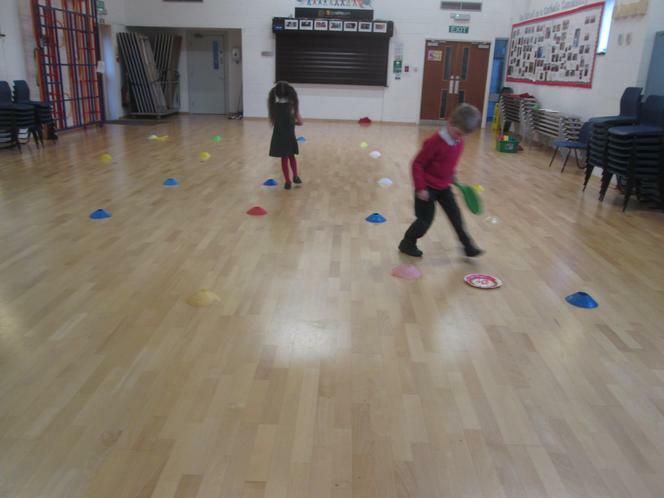 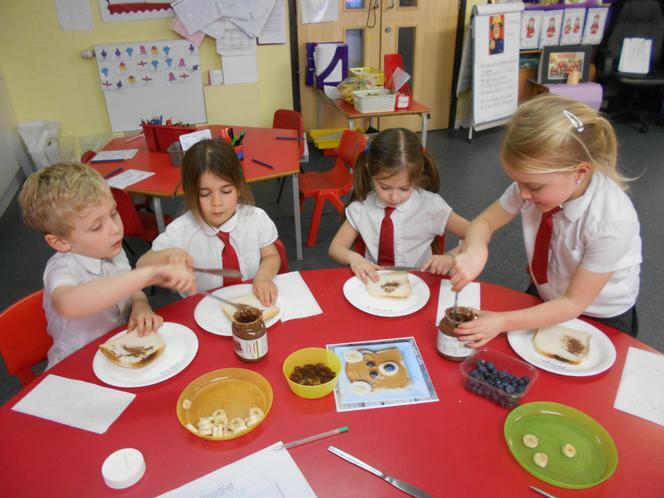 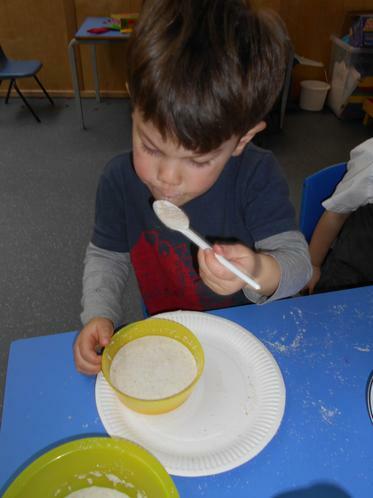 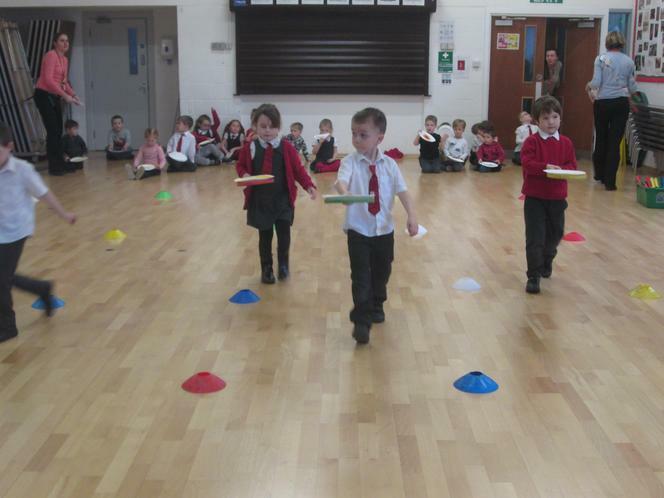 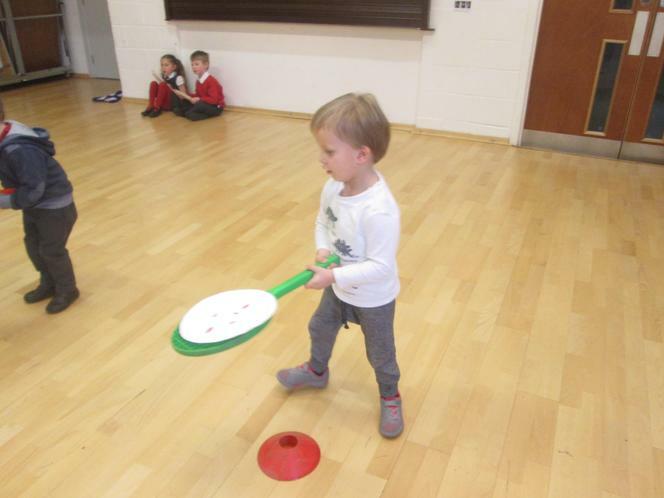 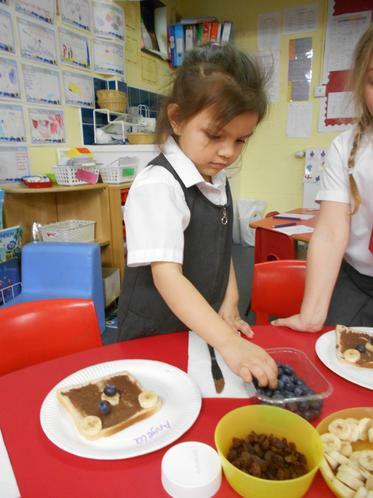 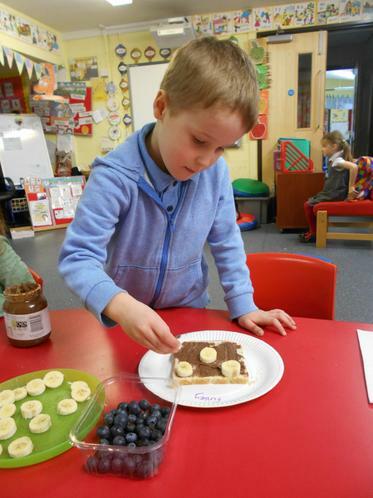 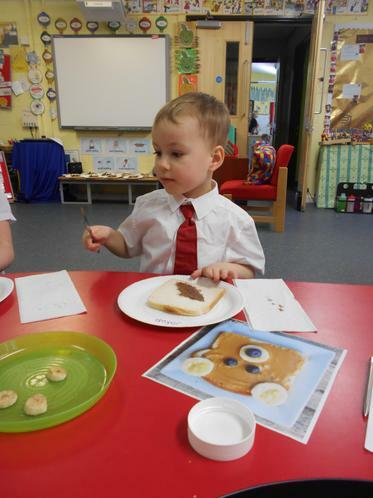 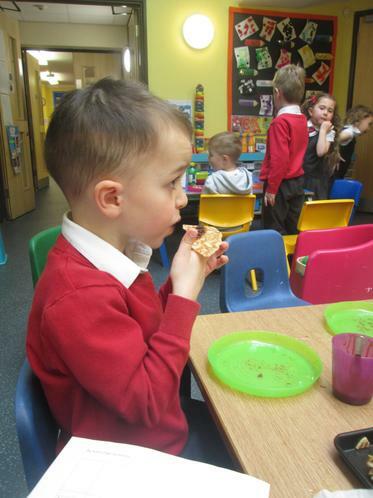 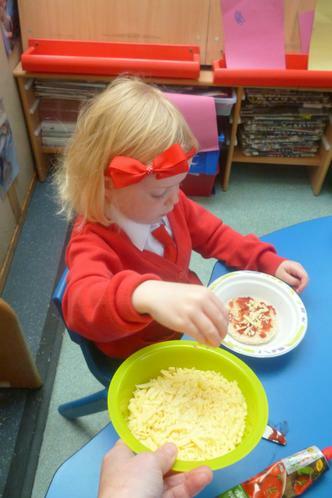 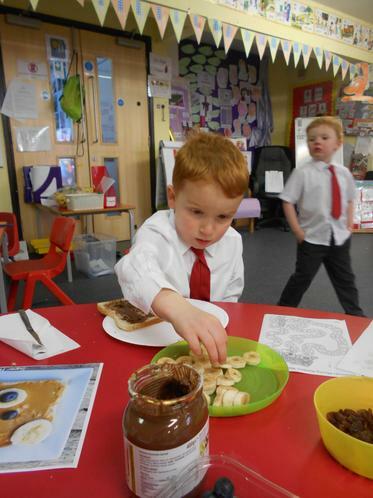 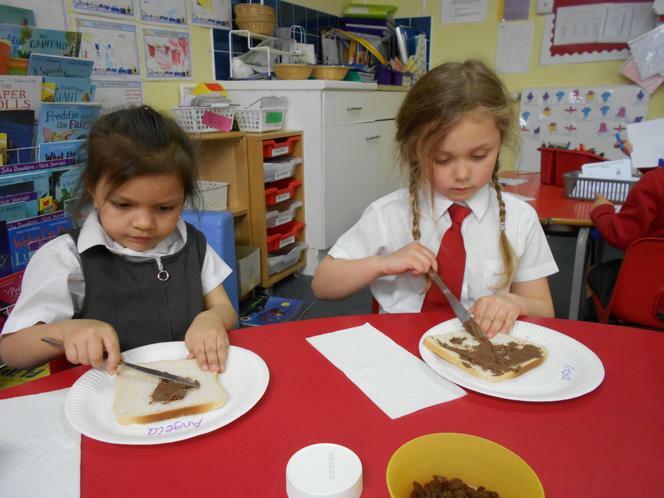 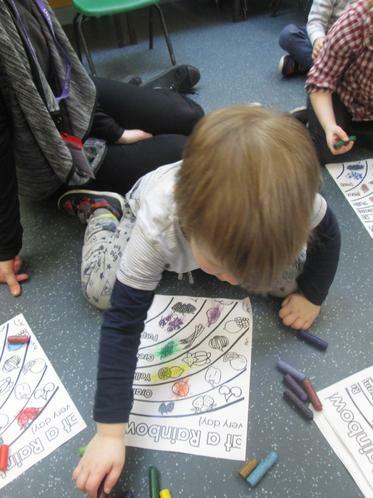 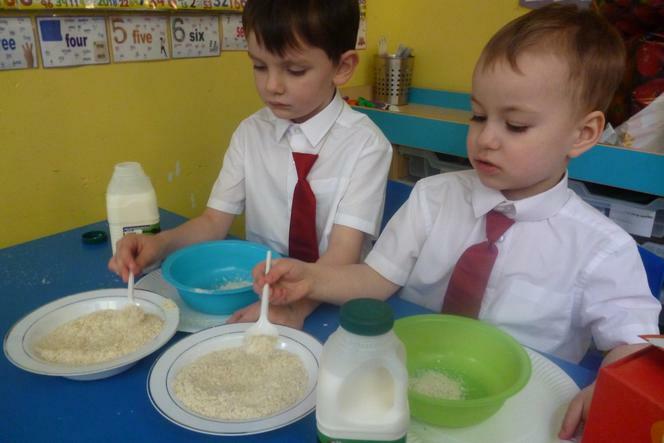 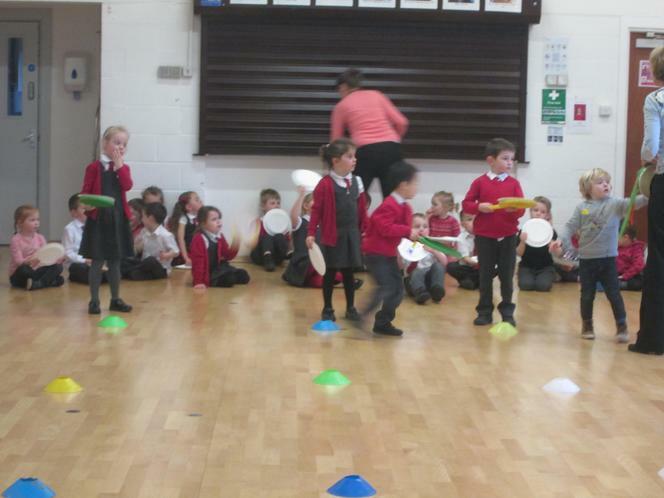 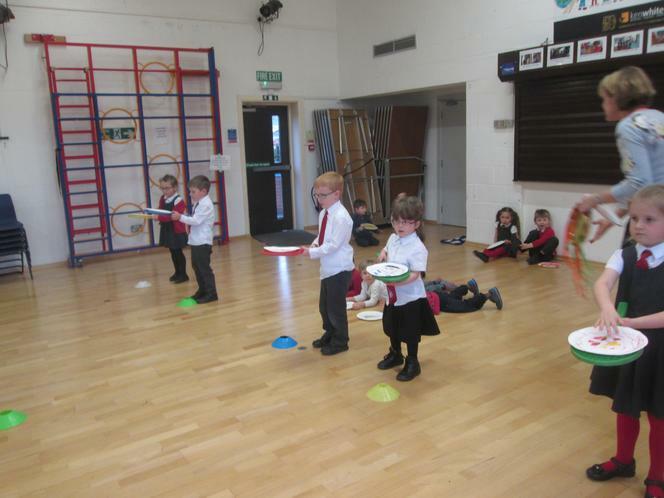 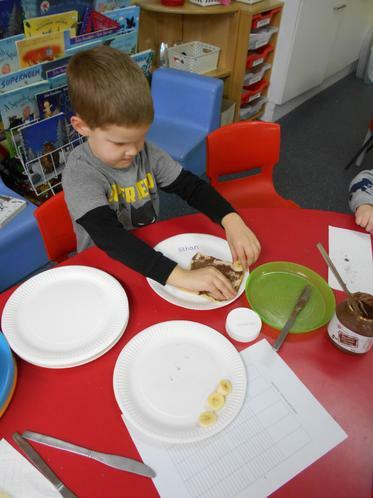 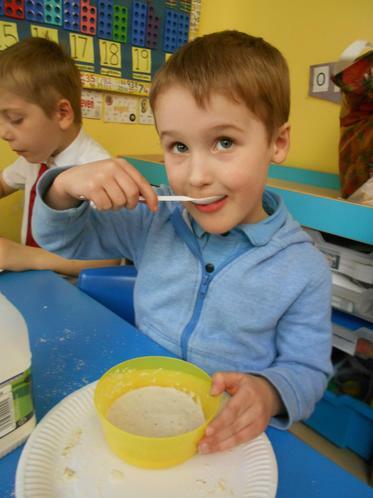 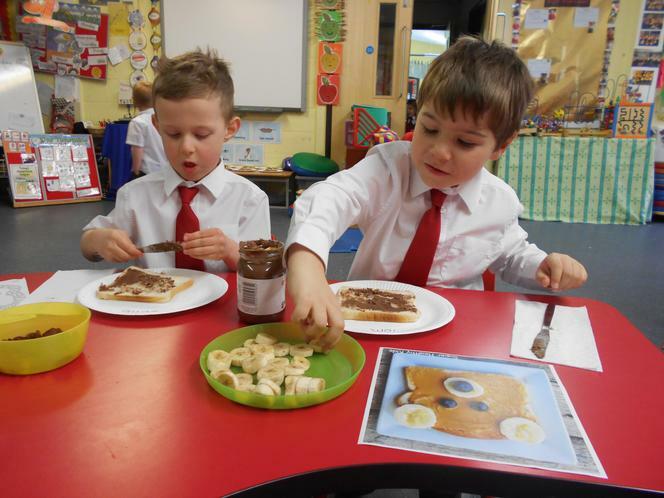 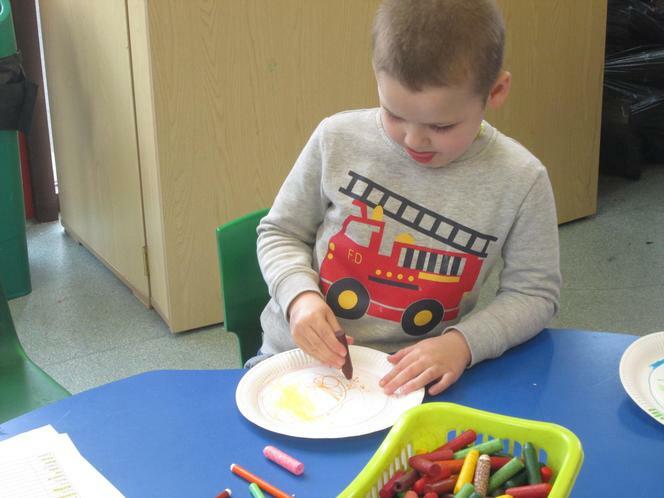 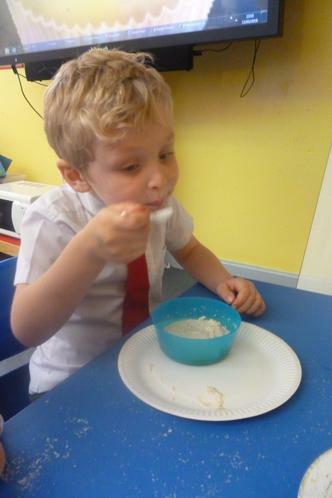 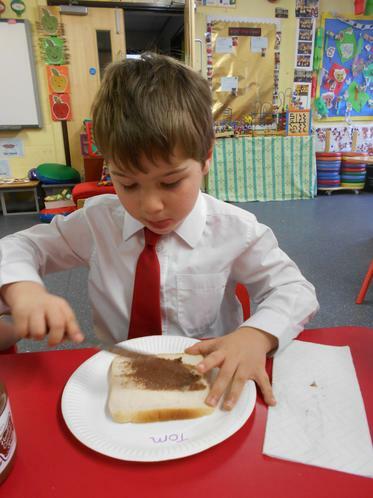 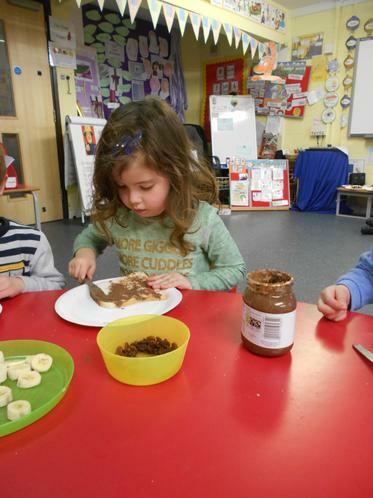 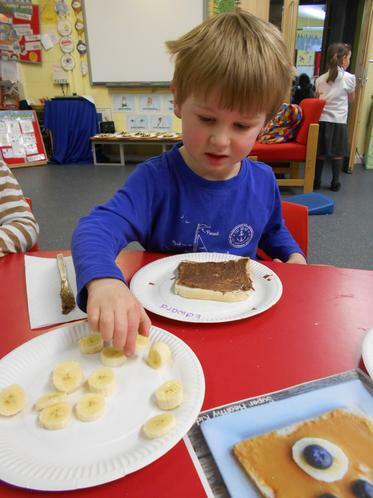 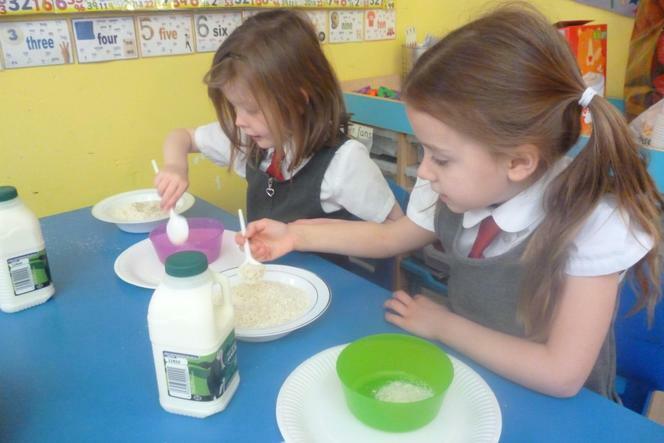 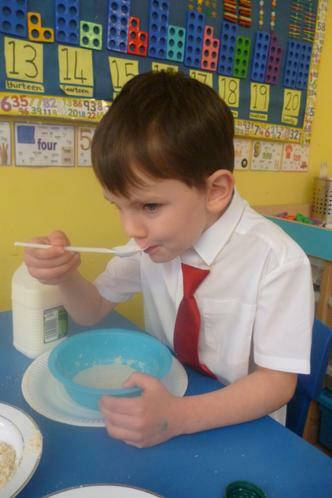 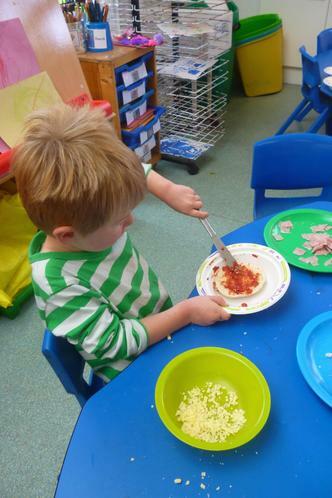 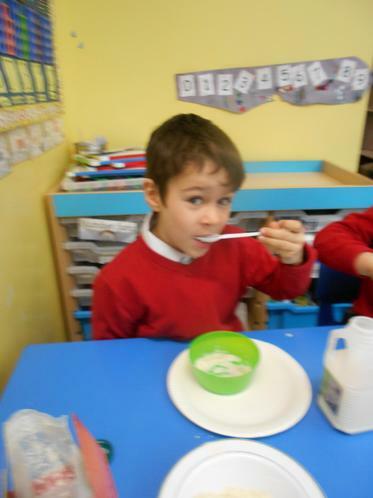 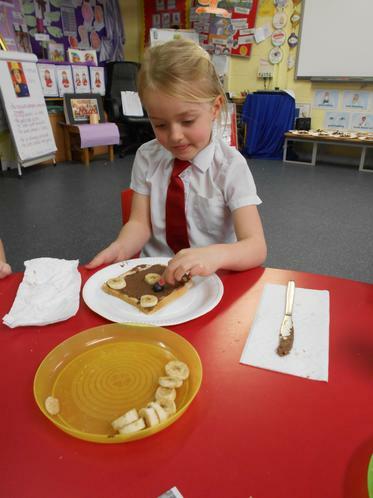 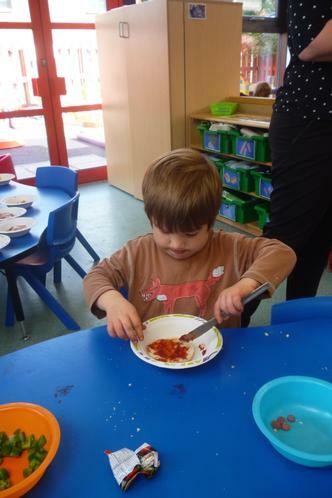 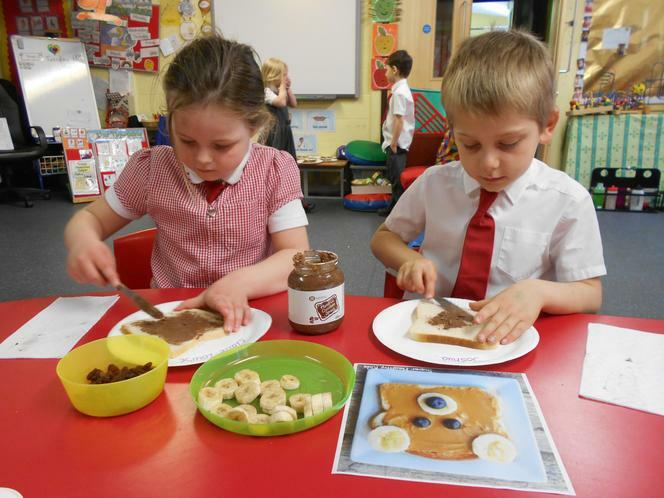 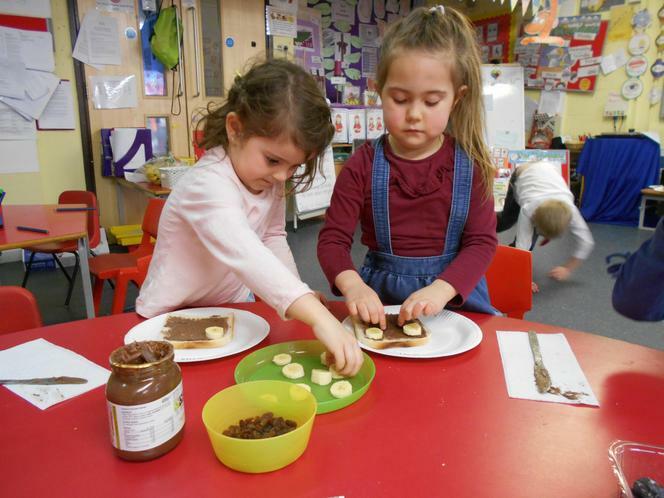 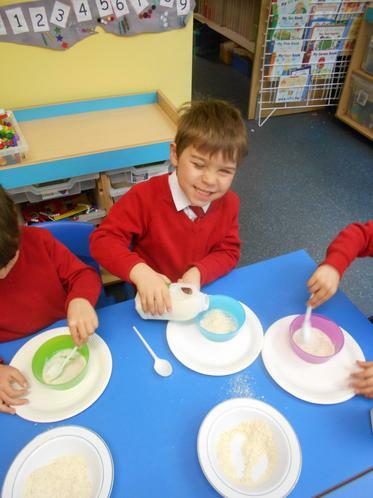 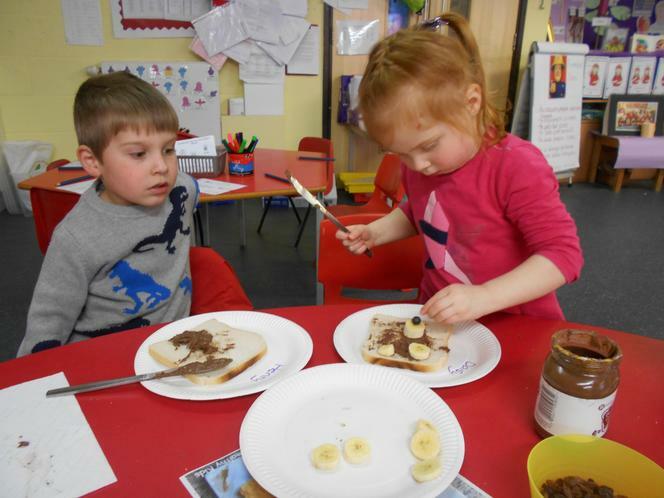 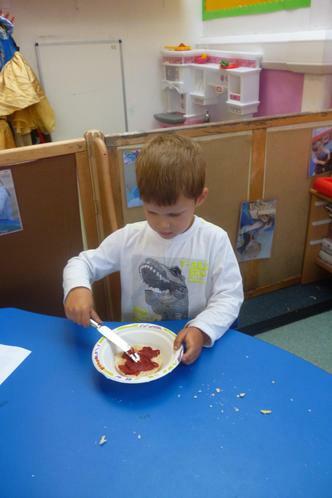 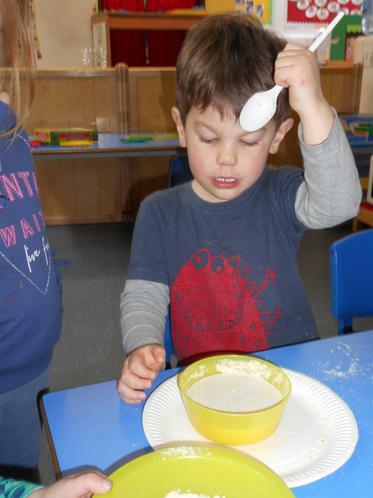 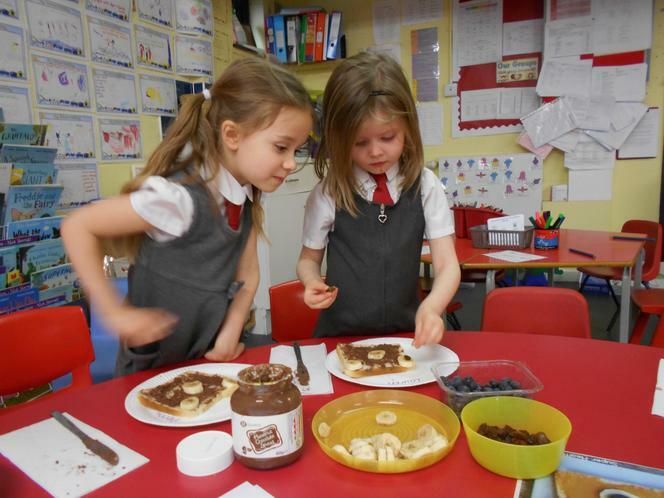 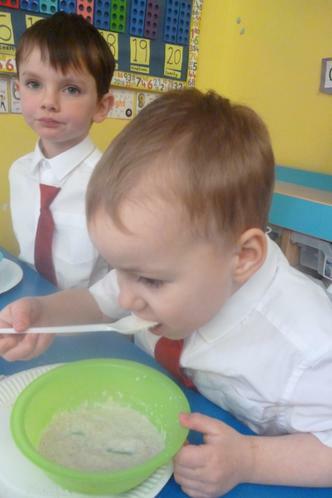 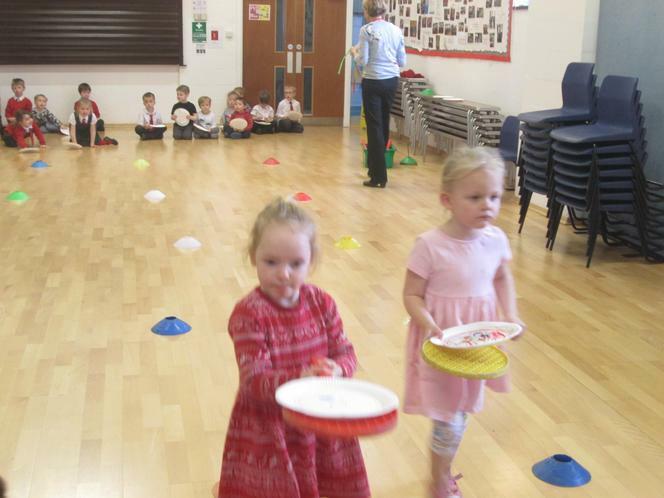 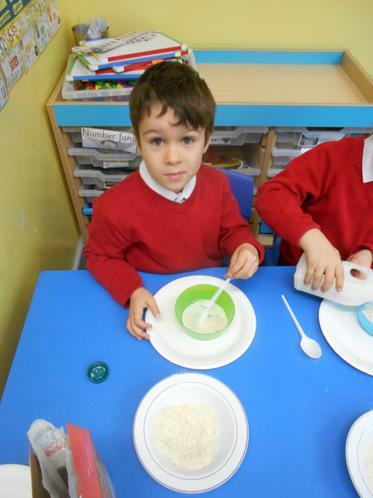 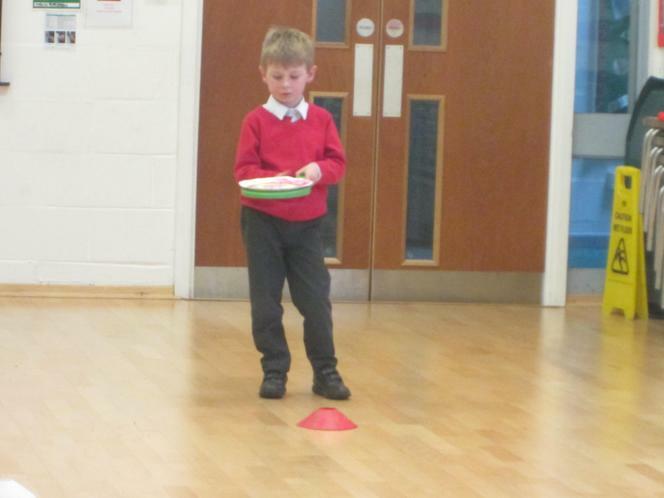 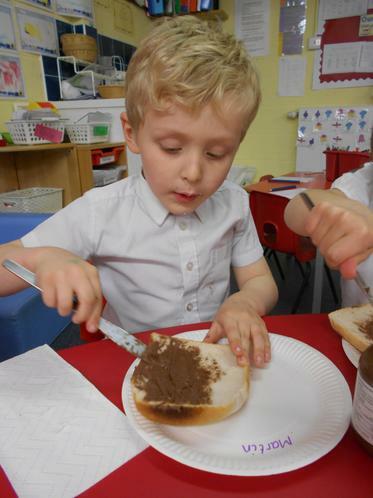 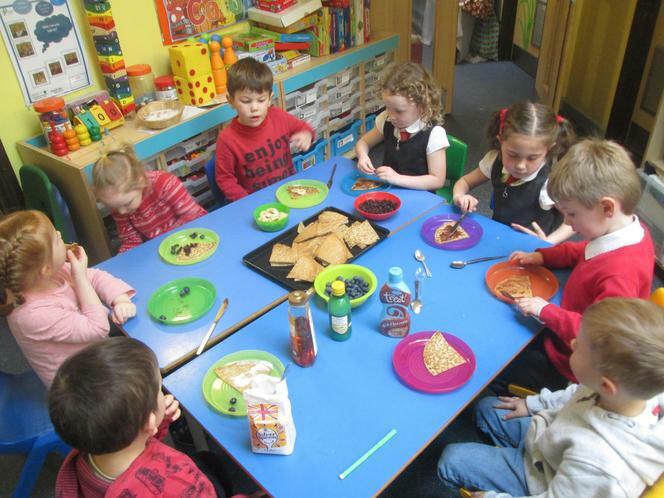 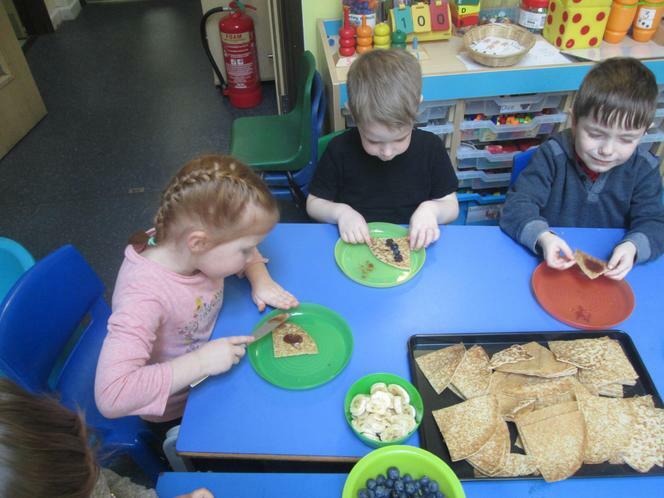 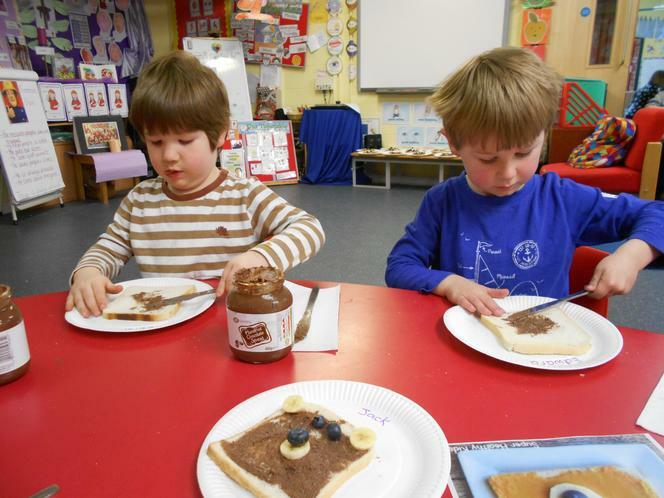 Shrove Tuesday (Pancake Day) : Today Acorns have enjoyed making their own pancakes, tasting different pancake toppings, designing a paper plate pancake with their favourite topping and having pancake races. 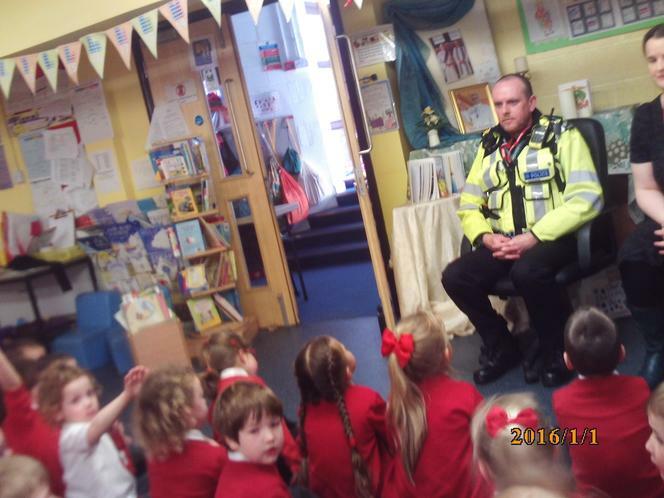 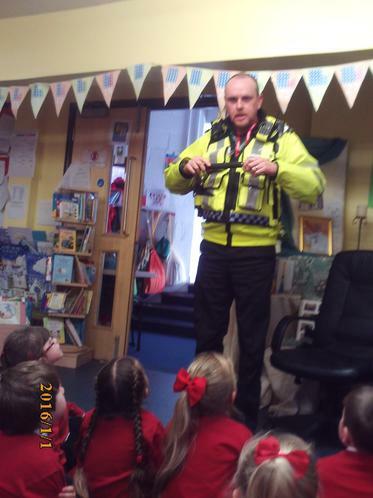 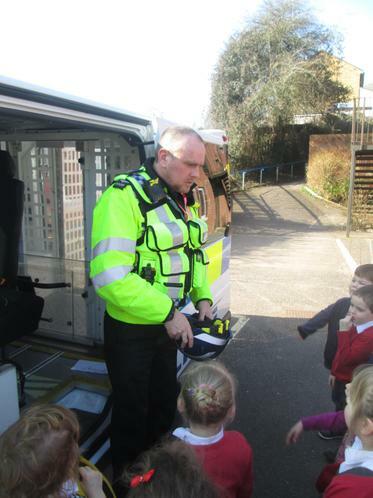 People Who Help Us: Today we had a visit from a Police Sergeant who talked to us about his job and showed us some of the tools and equipment that he uses in his role. 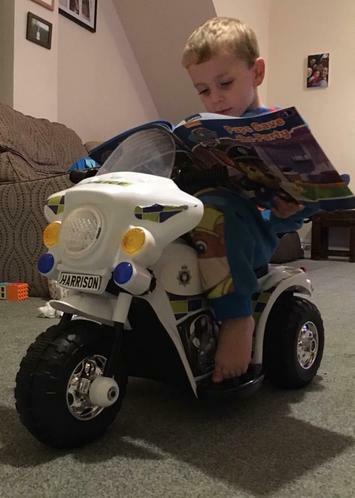 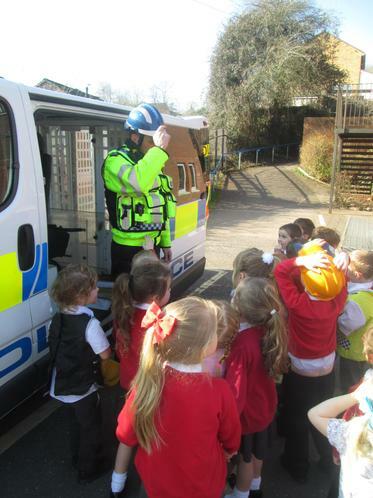 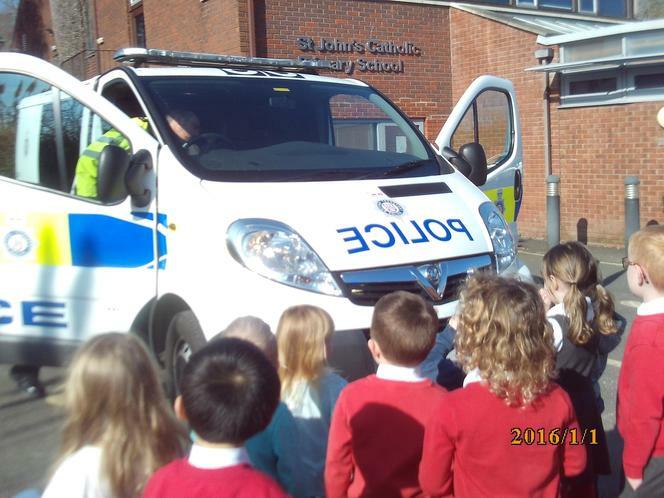 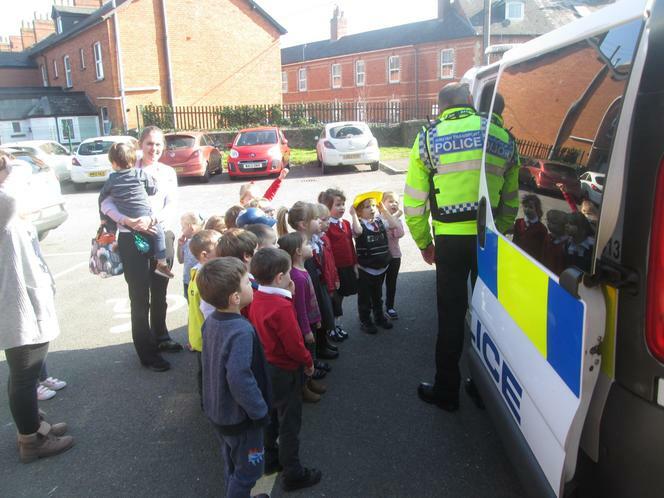 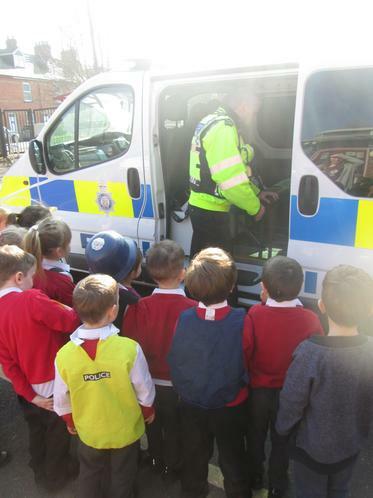 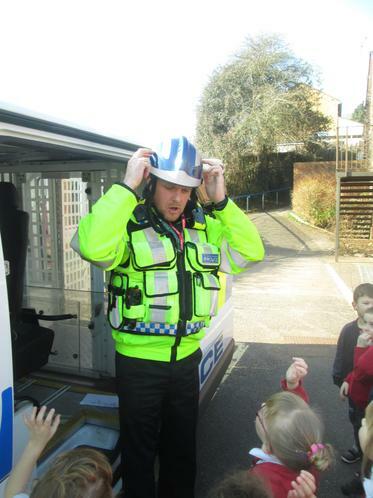 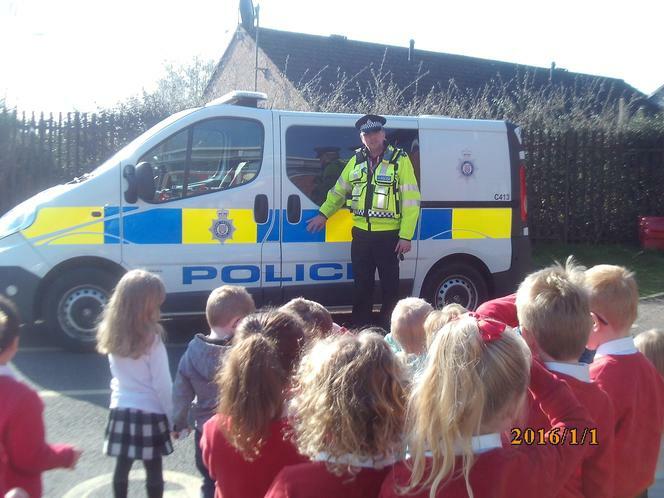 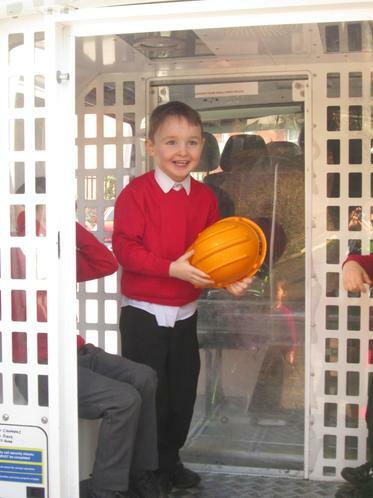 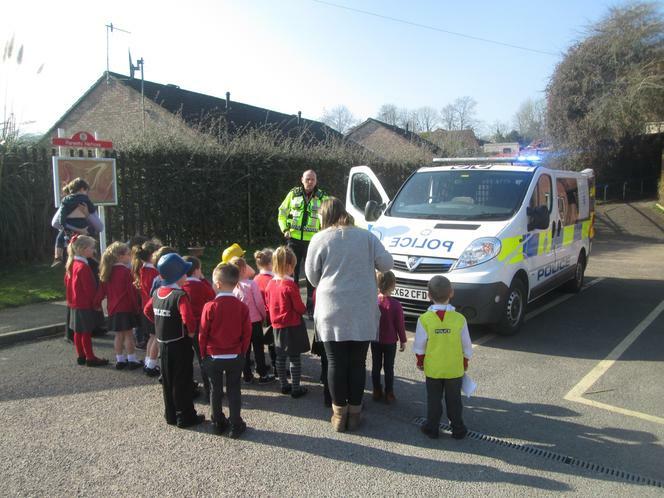 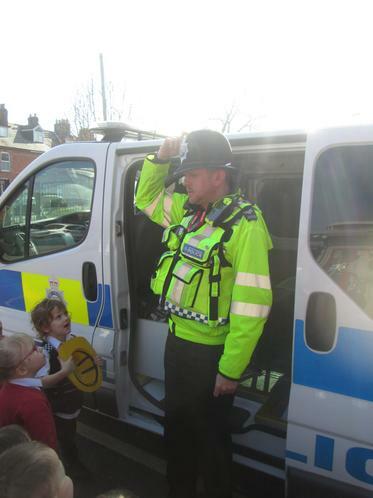 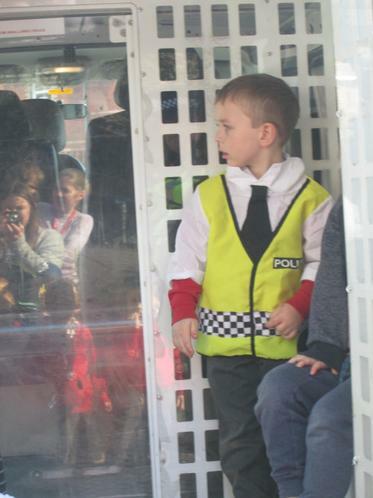 We also had a tour of his police van, saw the lights flashing and heard the siren. 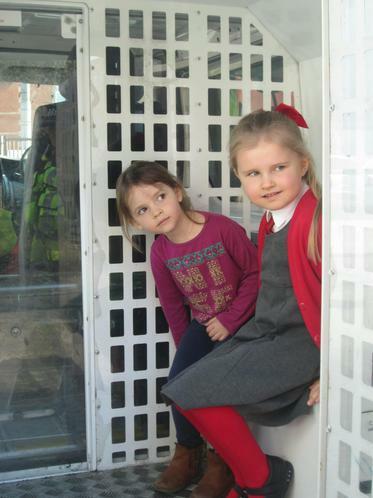 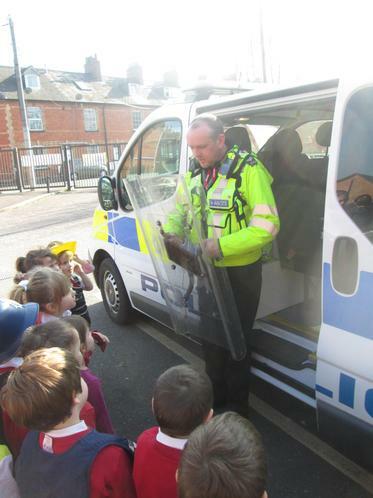 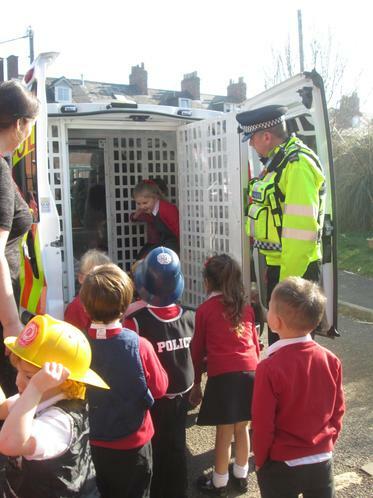 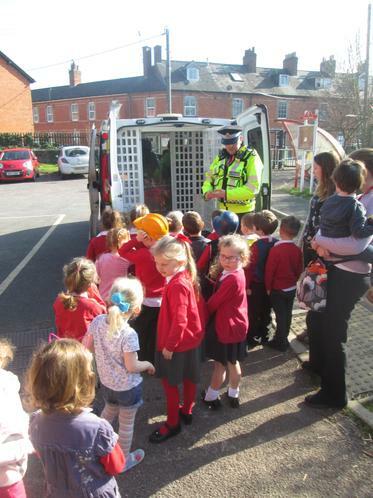 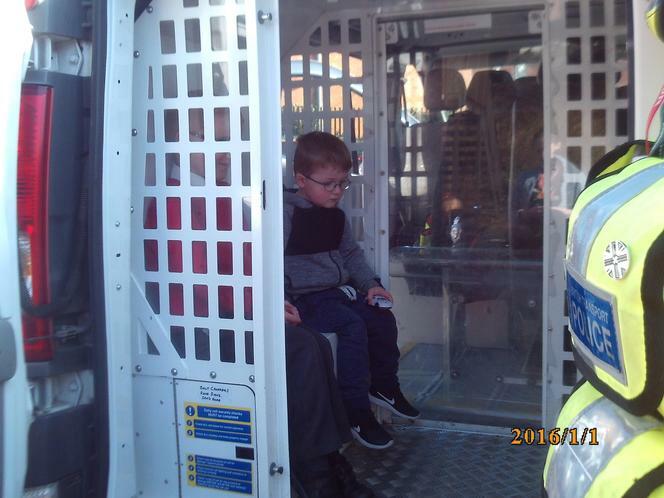 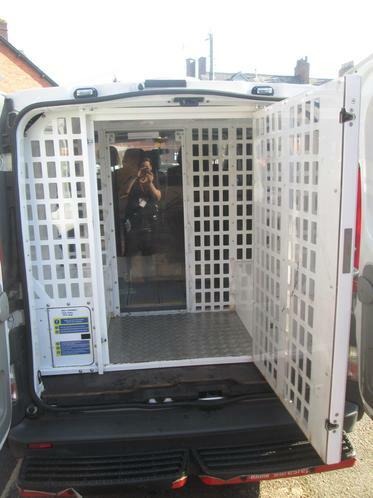 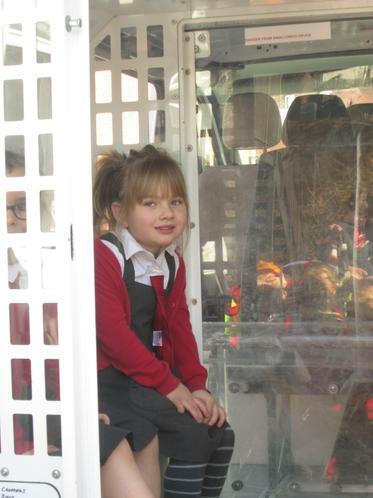 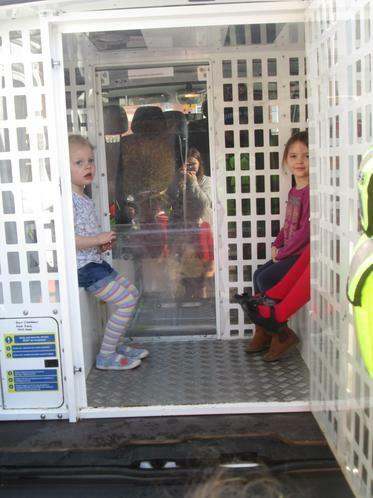 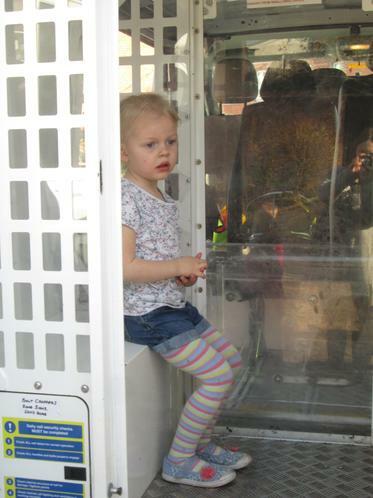 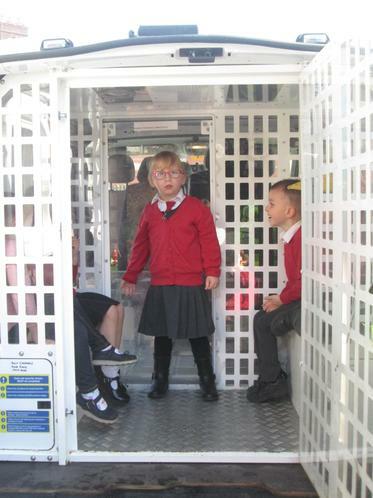 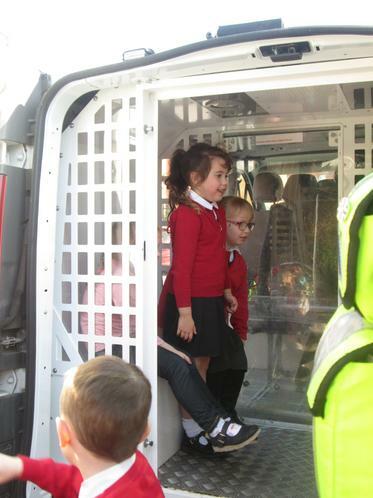 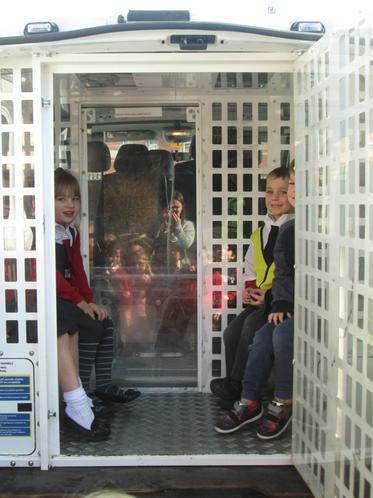 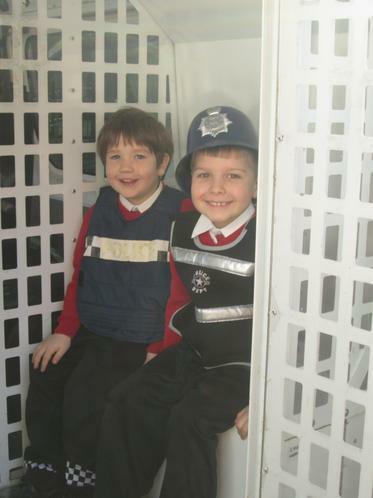 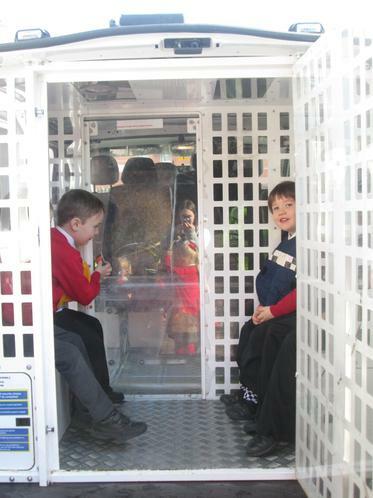 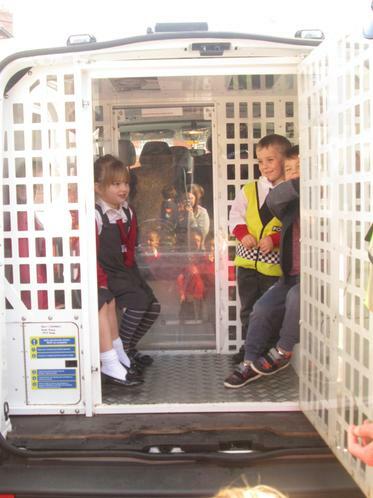 Children had the opportunity to sit in the cell in the back of the van. 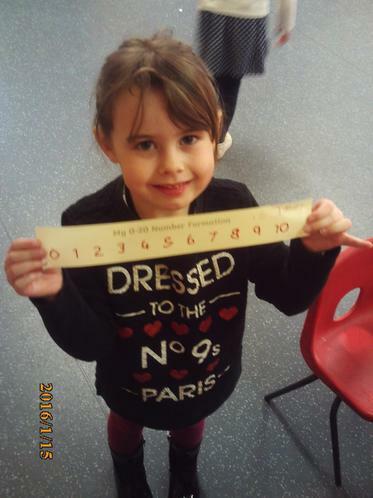 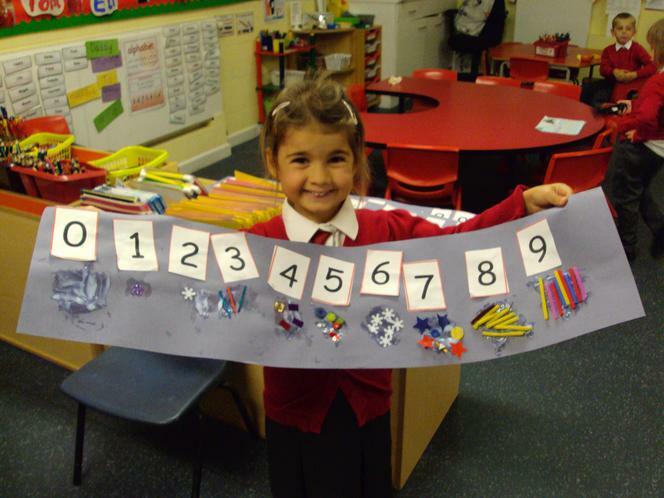 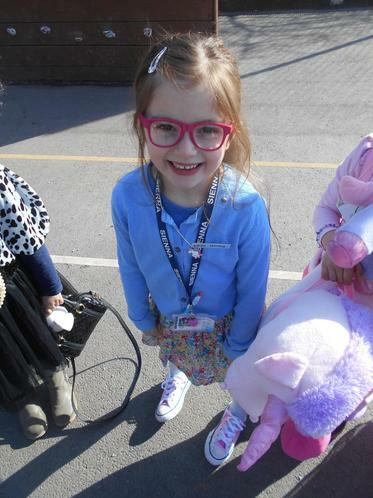 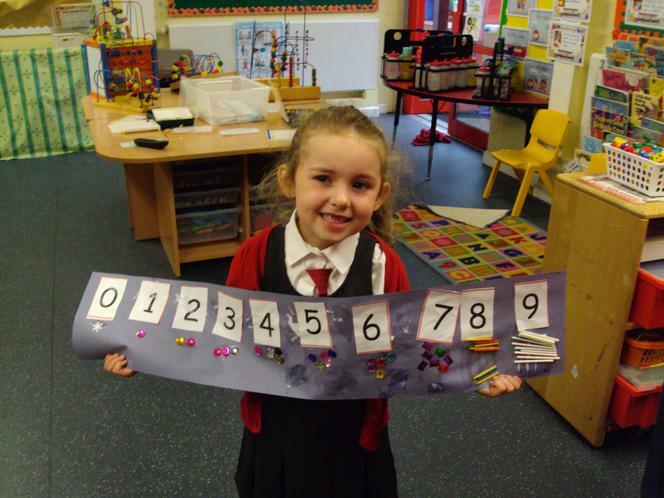 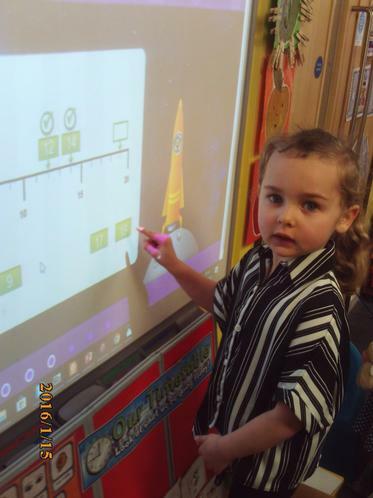 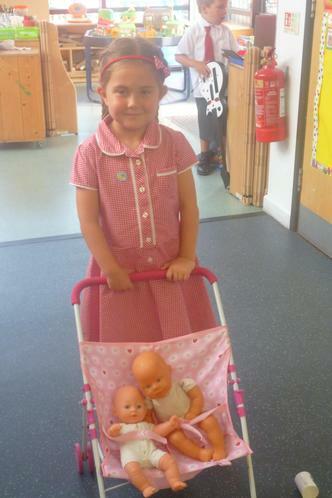 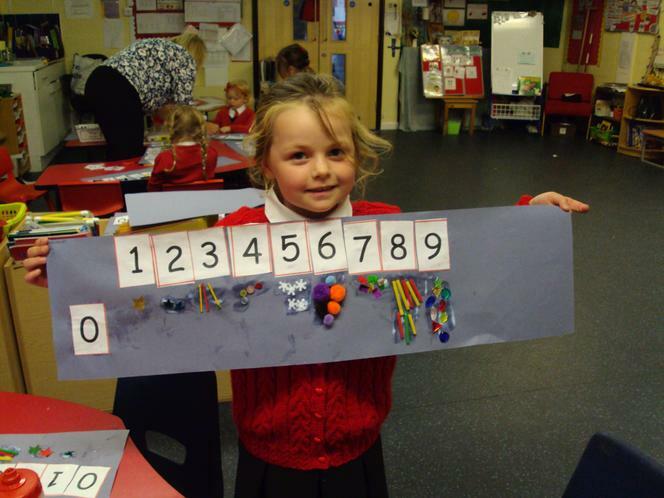 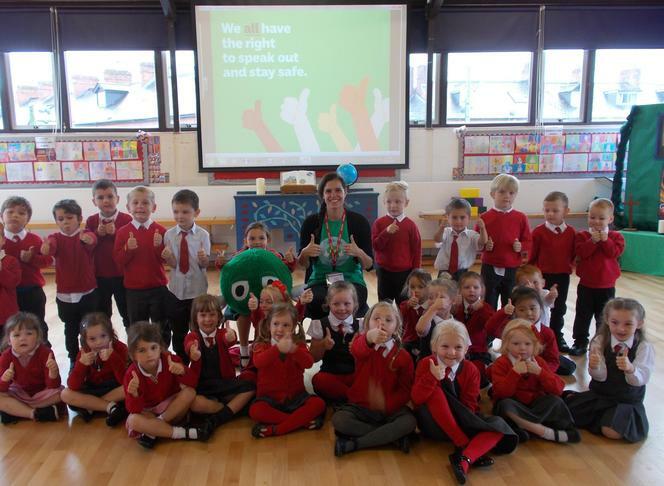 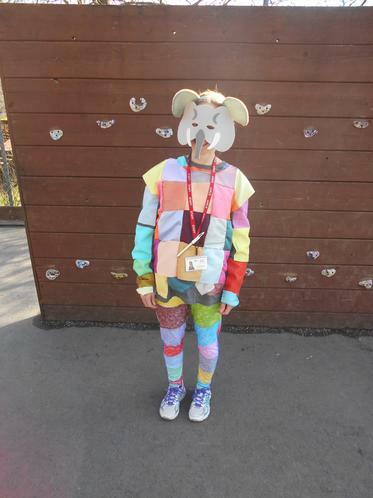 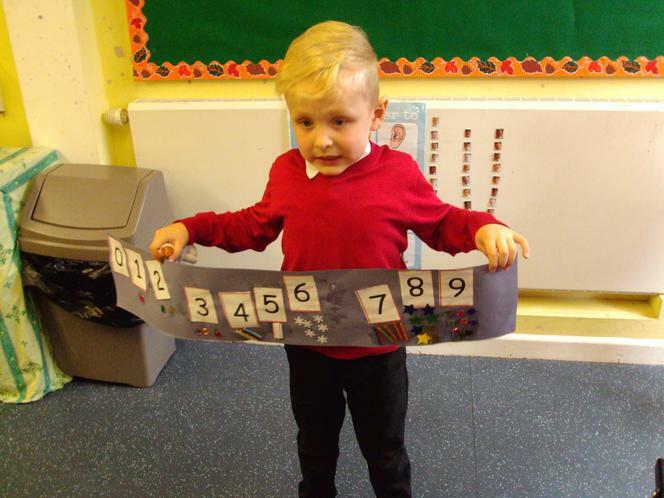 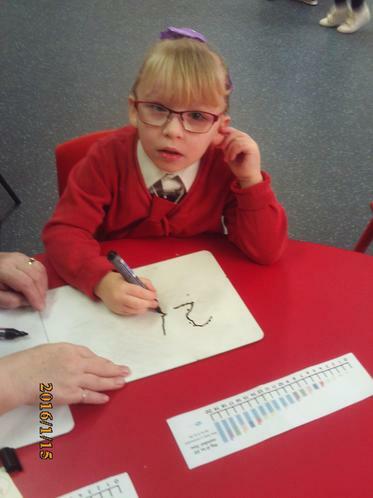 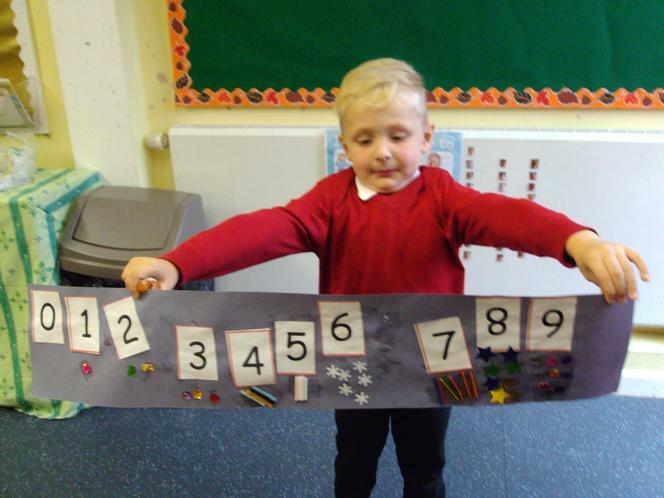 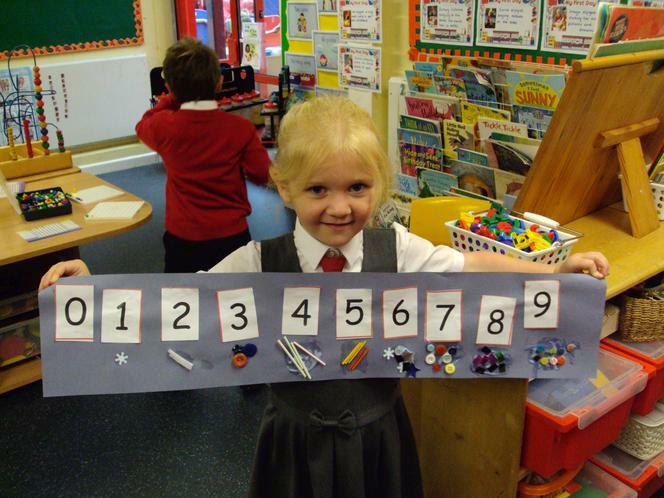 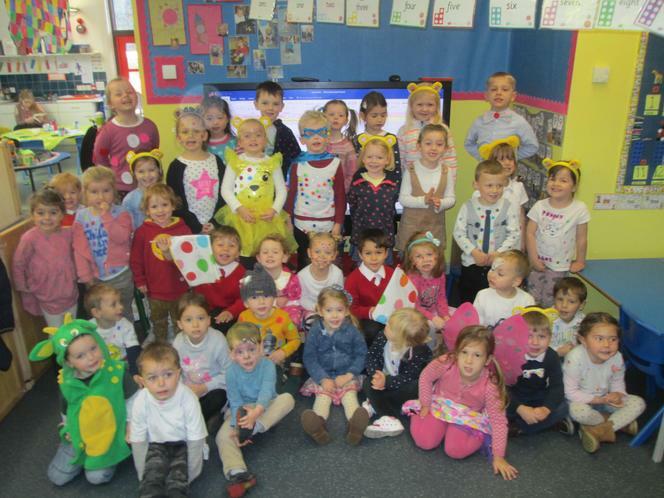 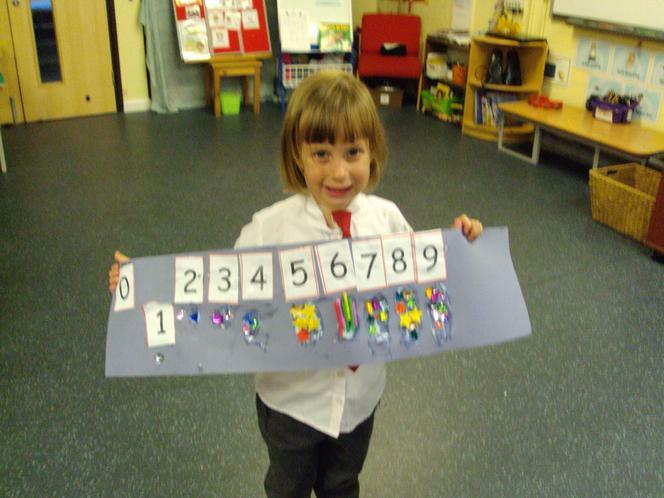 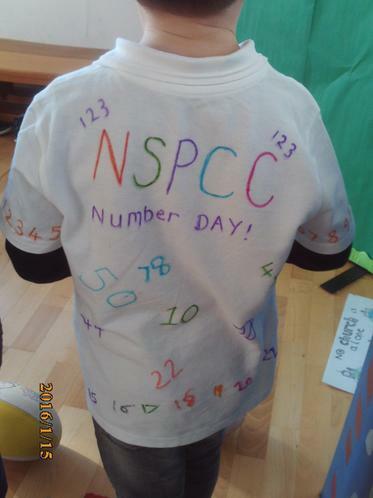 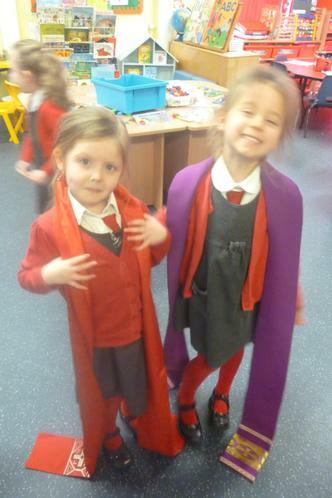 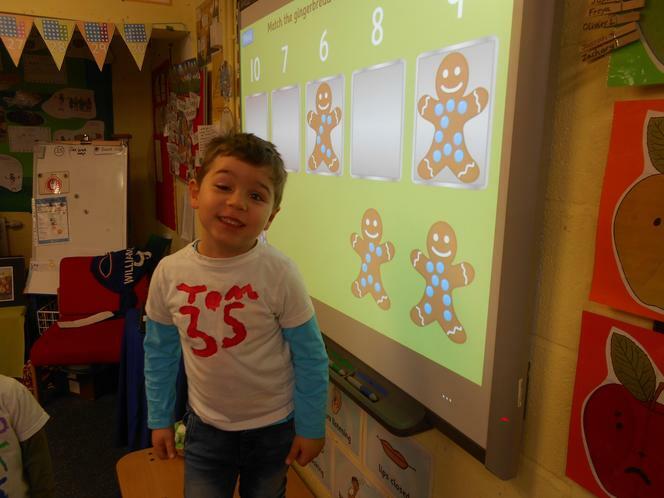 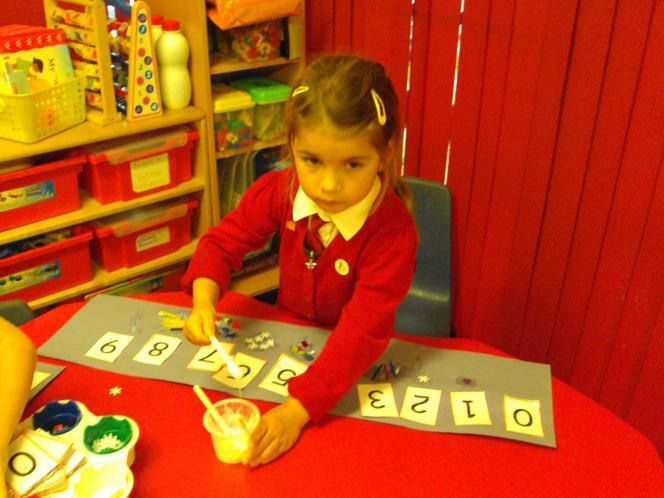 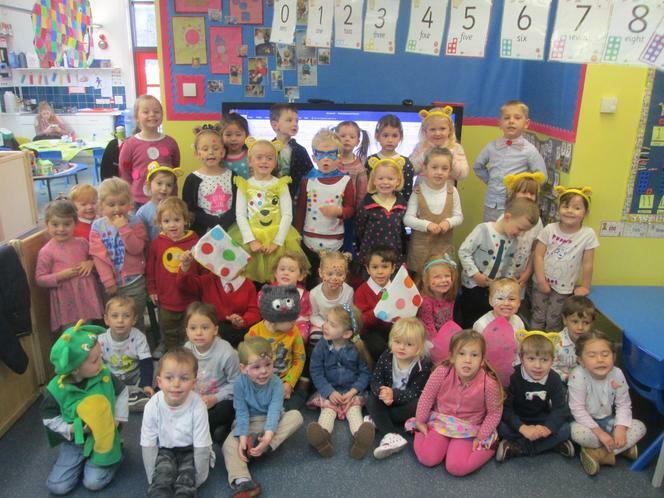 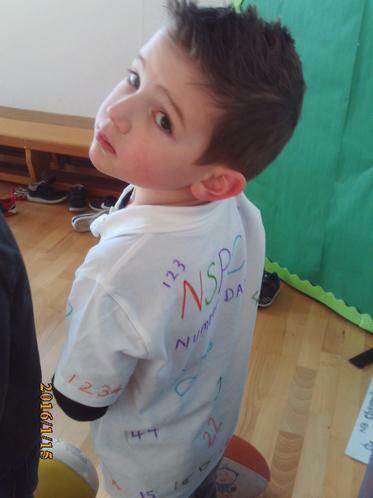 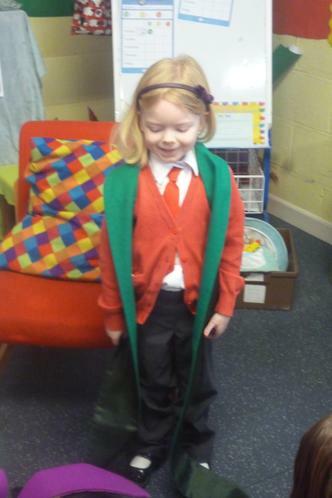 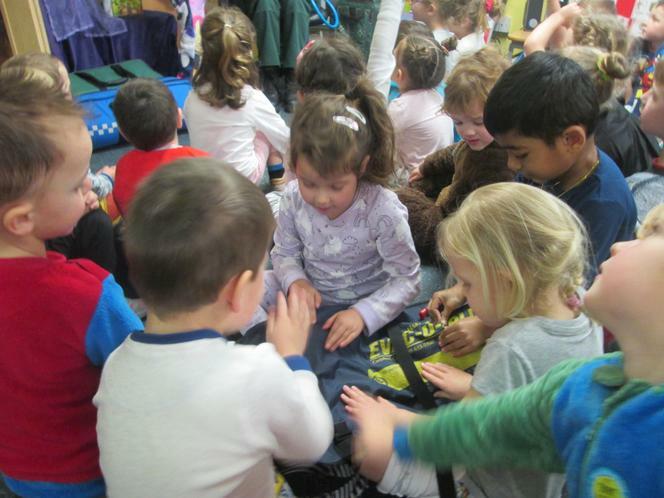 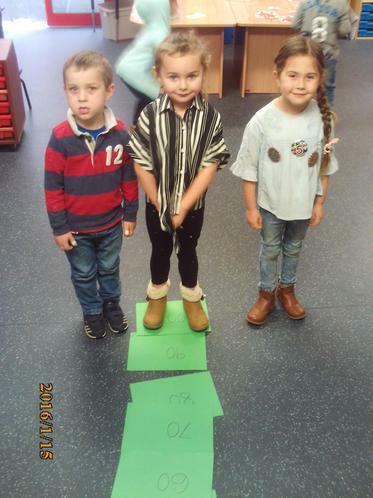 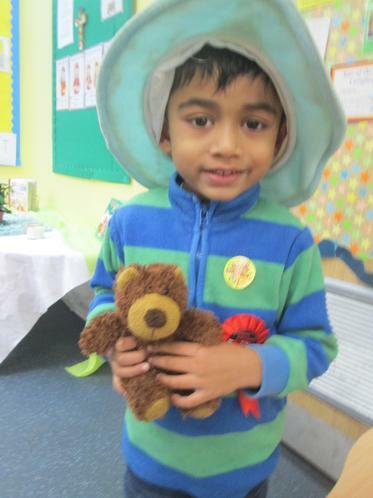 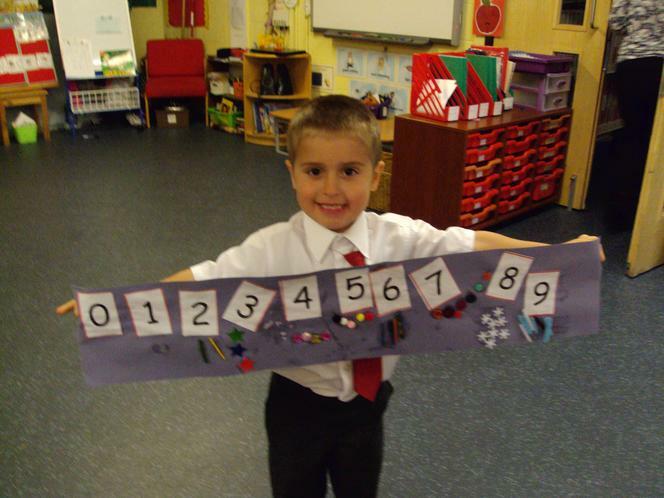 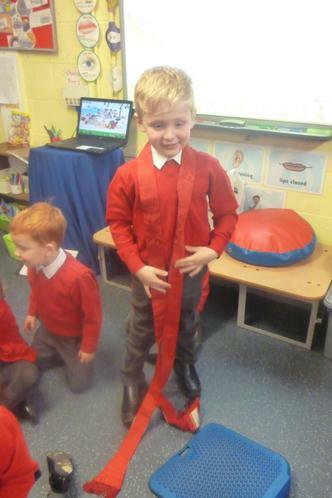 NSPCC Number Day - Today Acorn's dressed up in numbered clothes and we completed many number challenges in class. 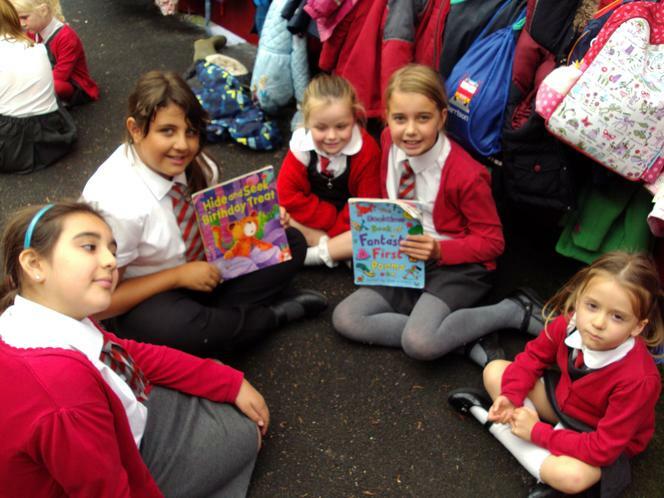 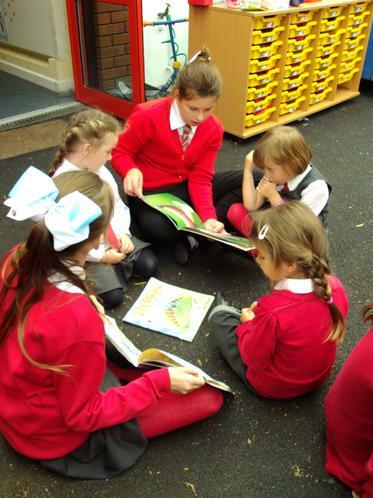 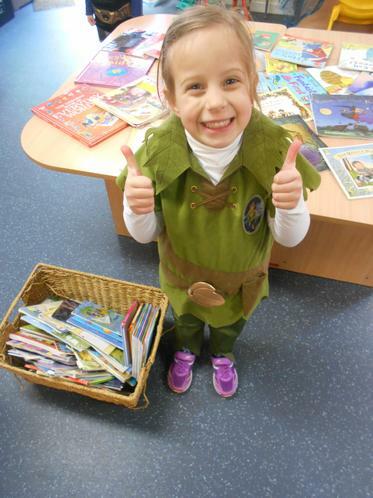 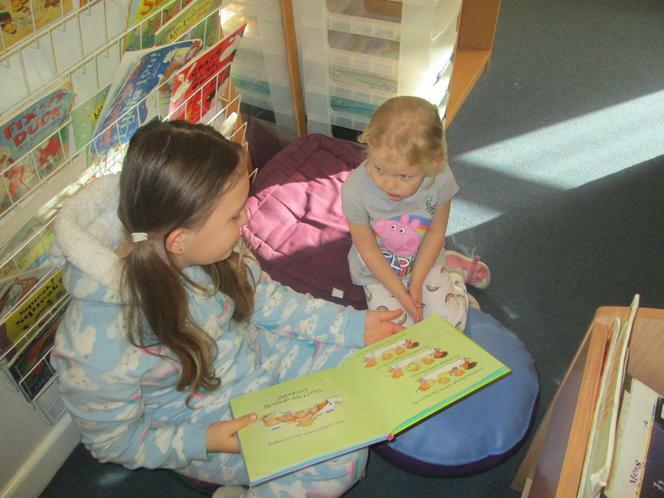 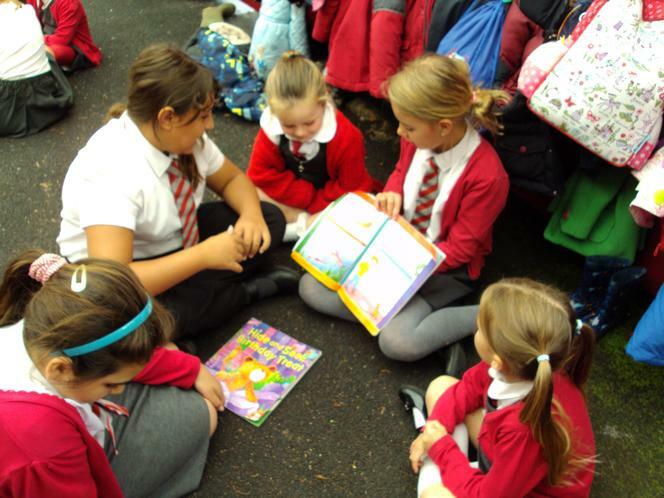 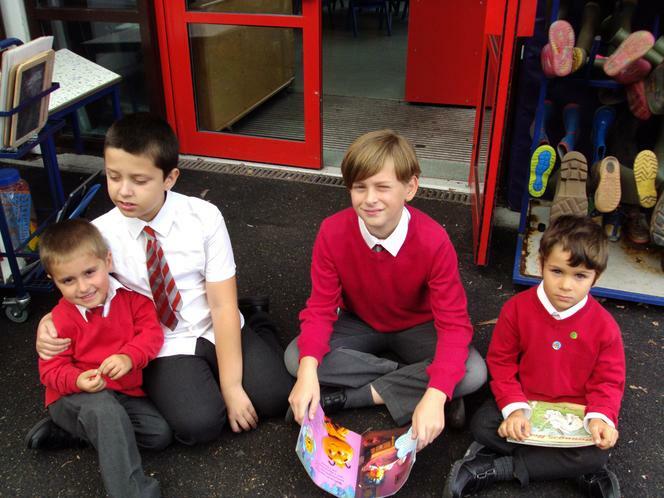 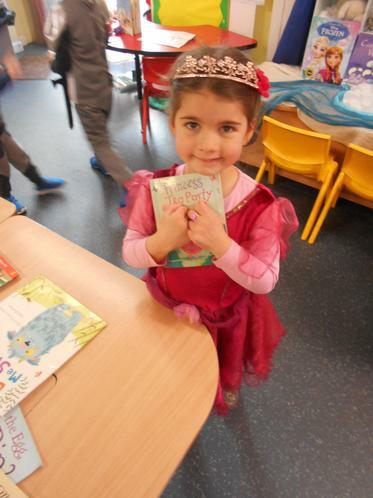 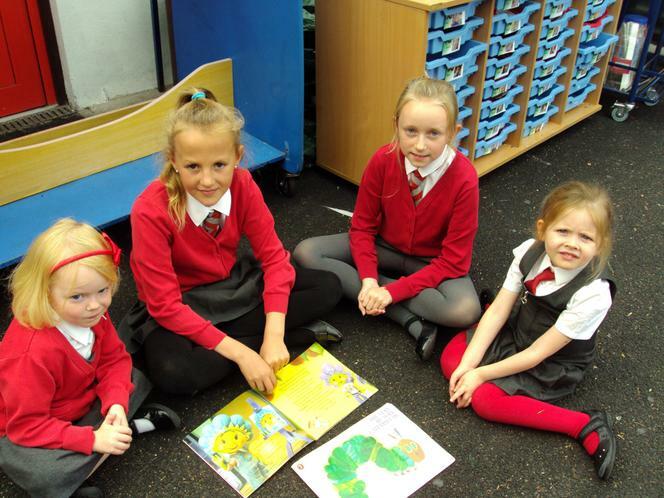 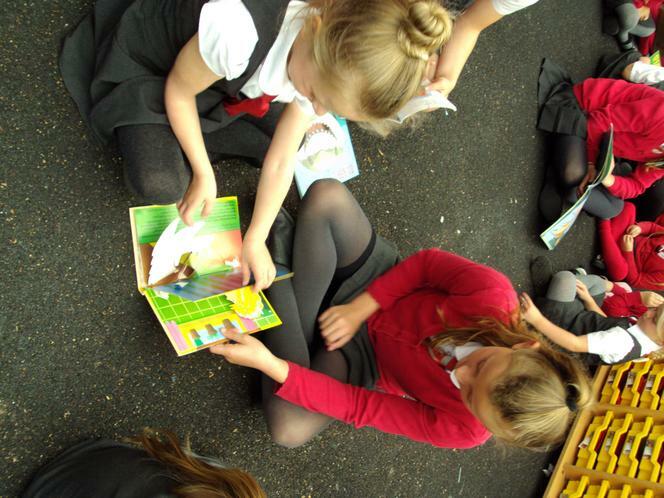 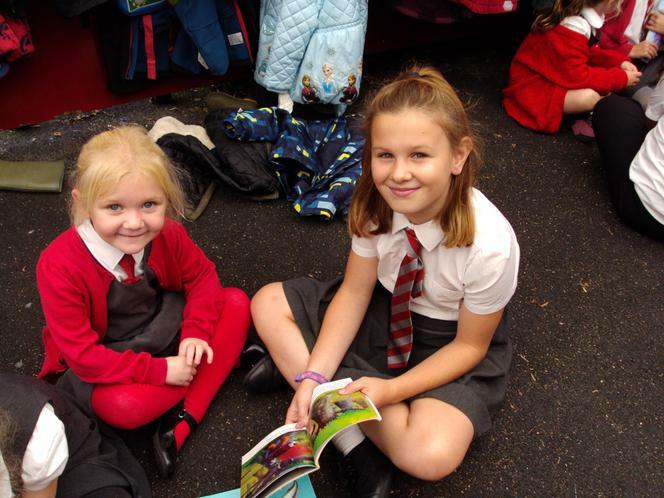 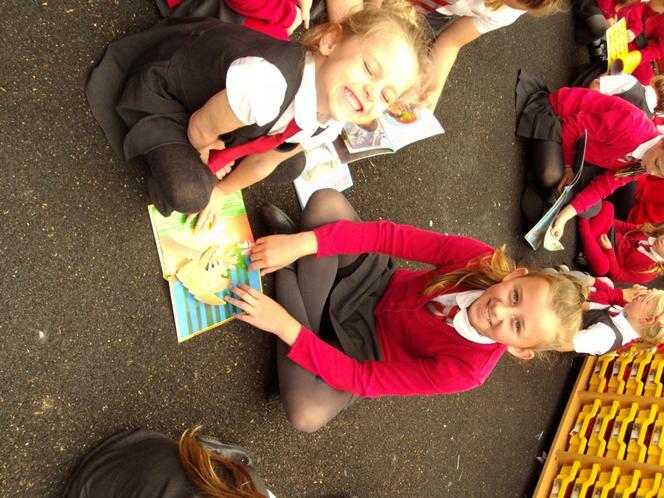 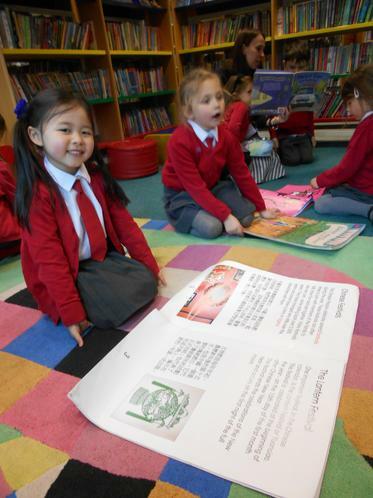 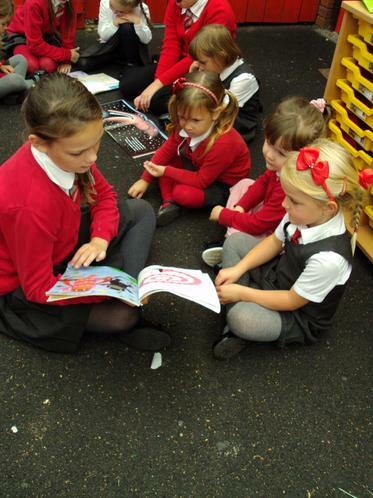 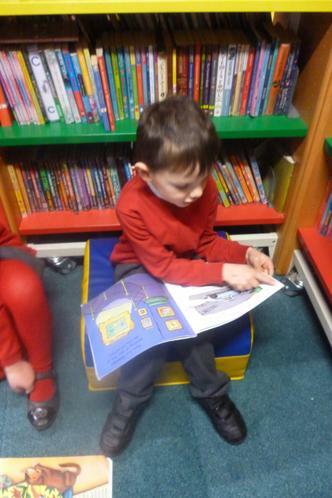 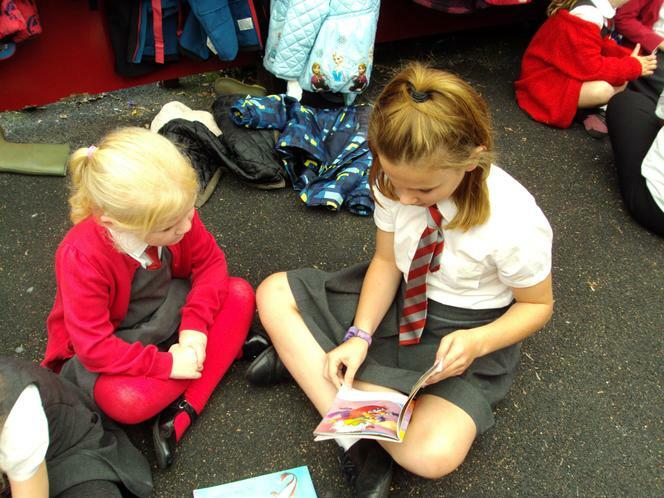 We enjoyed a cake sale and a book sale all to raise money for NSPCC. 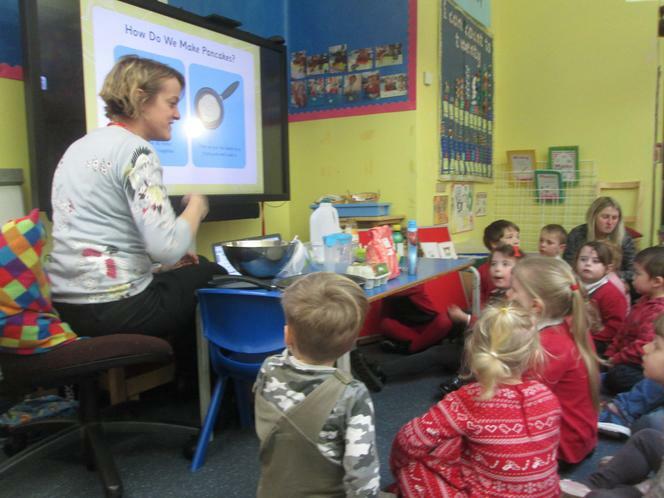 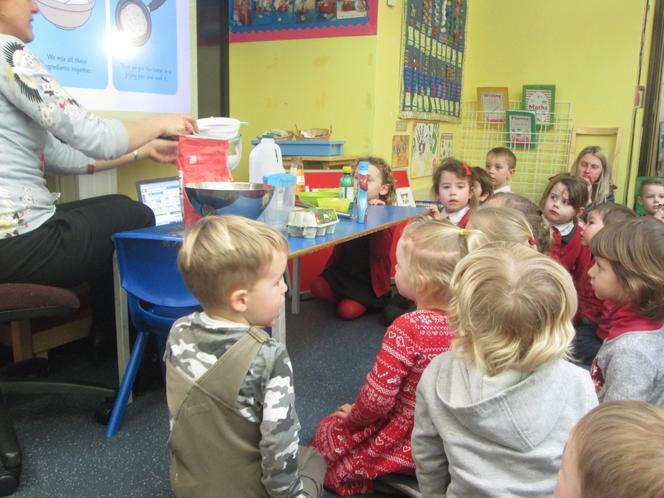 Today, Mrs Williams (Lydia's Mum) visited us to talk about her work as a dietician. 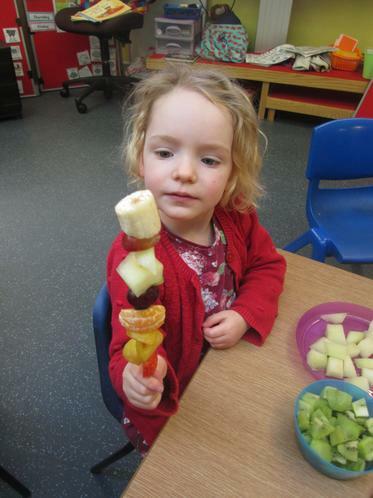 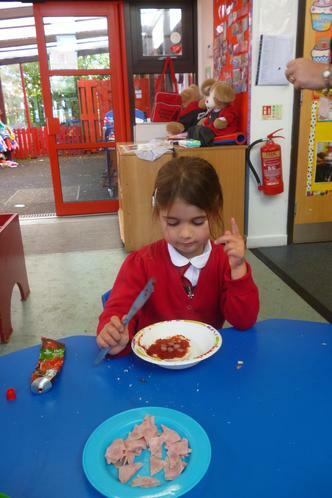 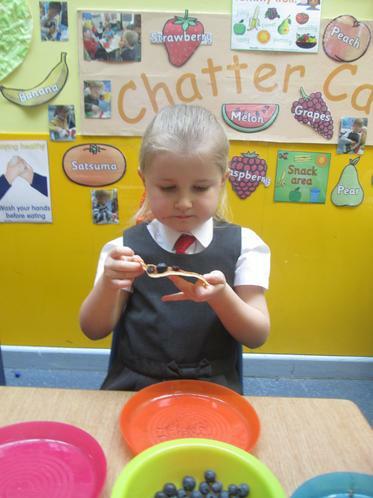 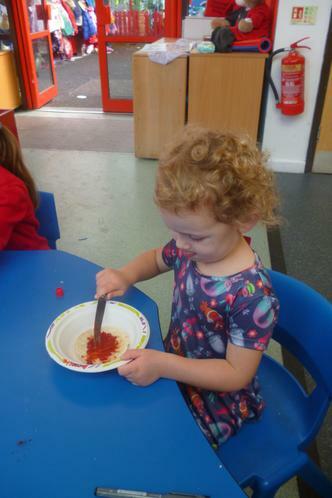 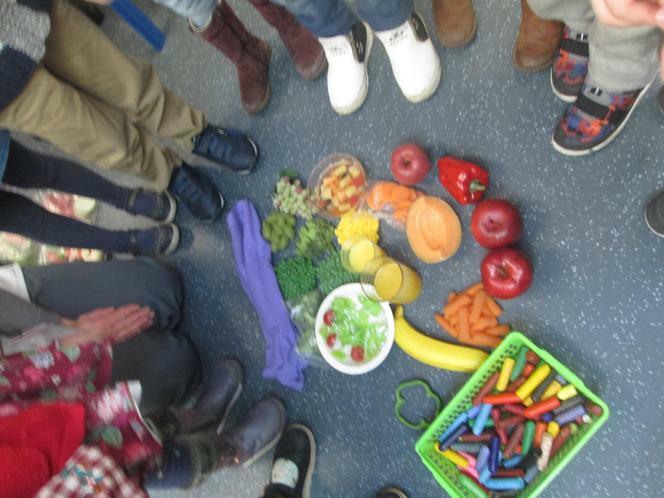 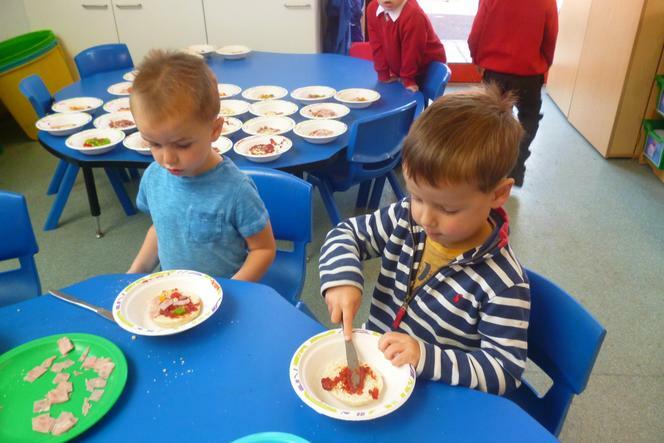 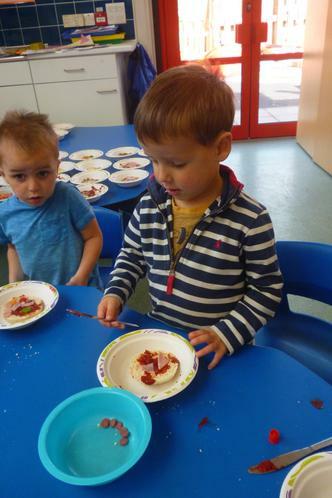 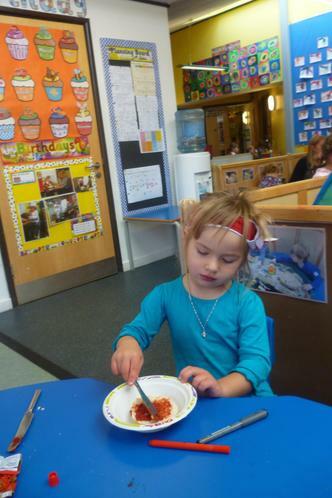 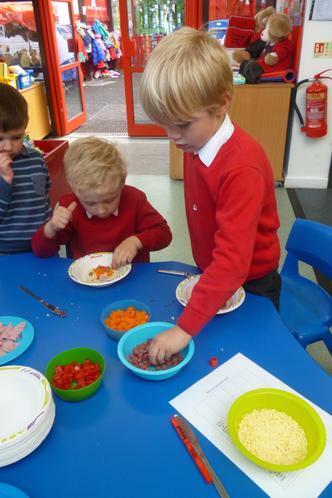 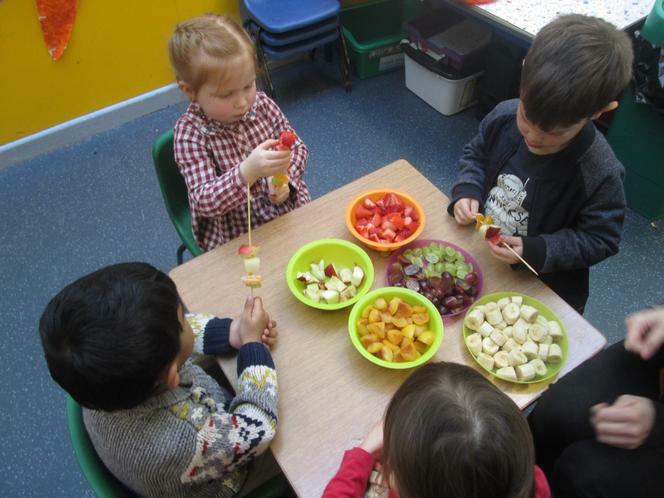 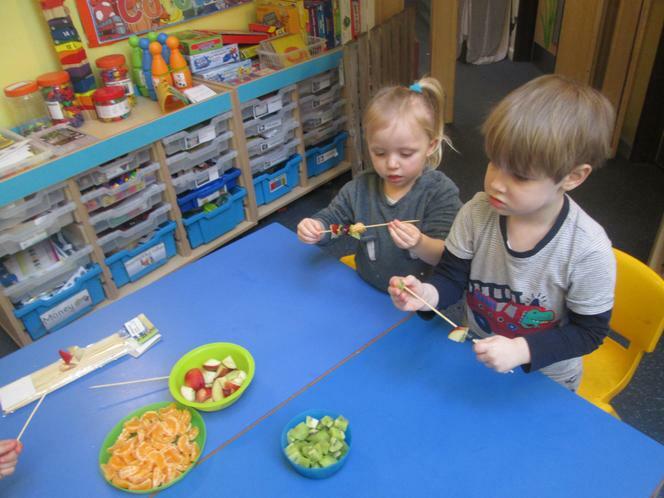 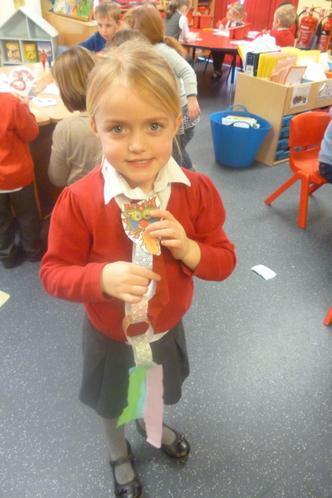 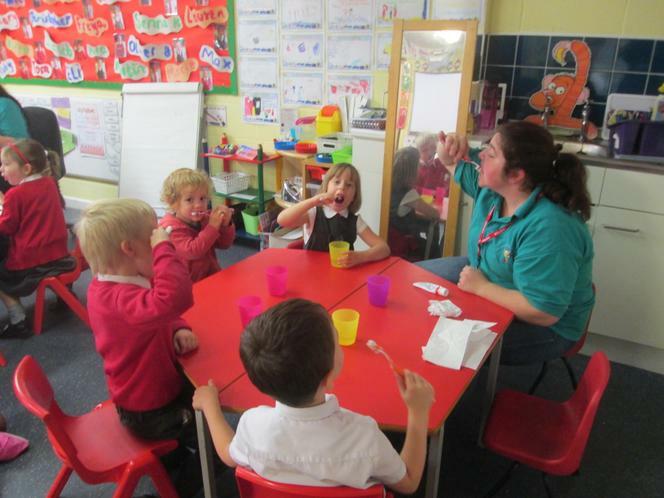 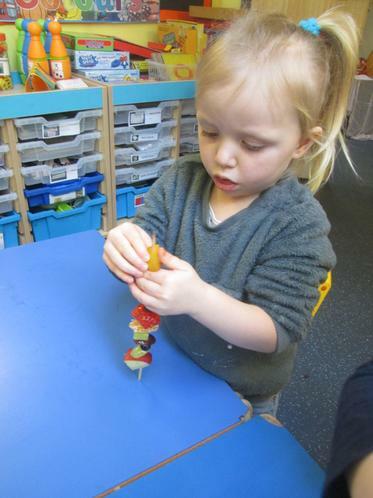 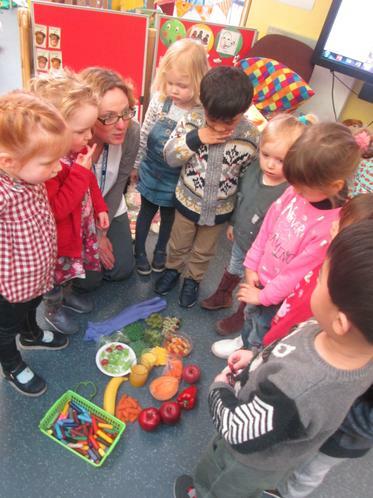 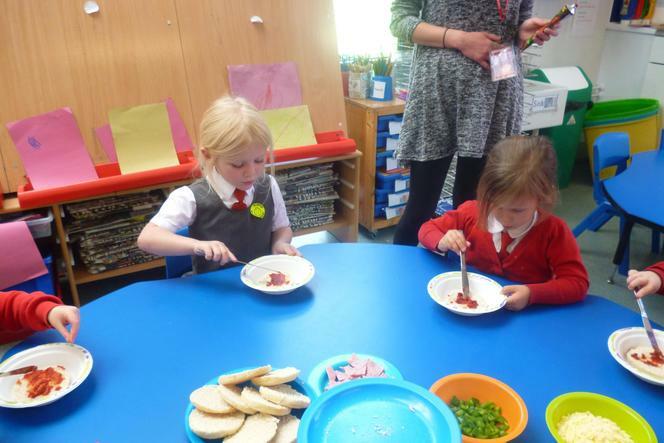 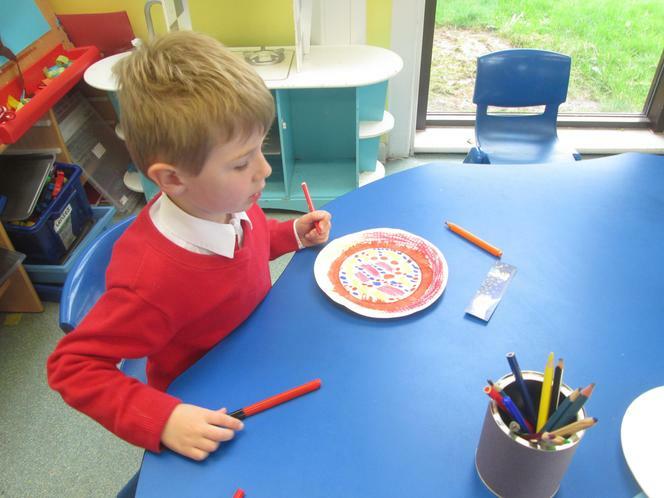 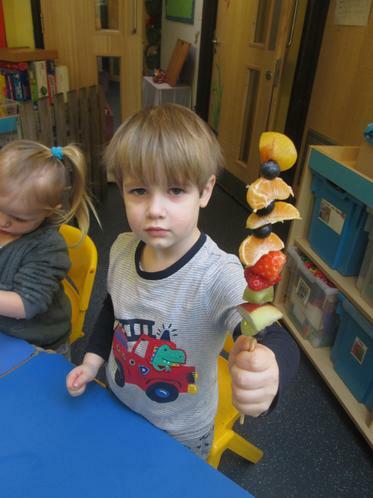 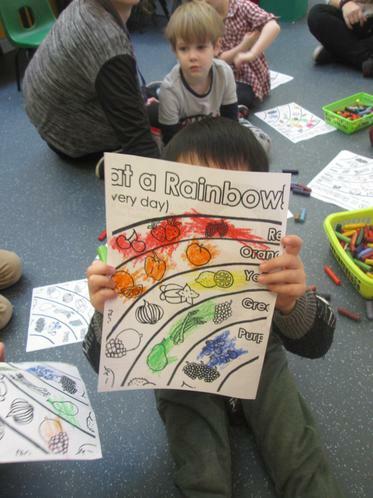 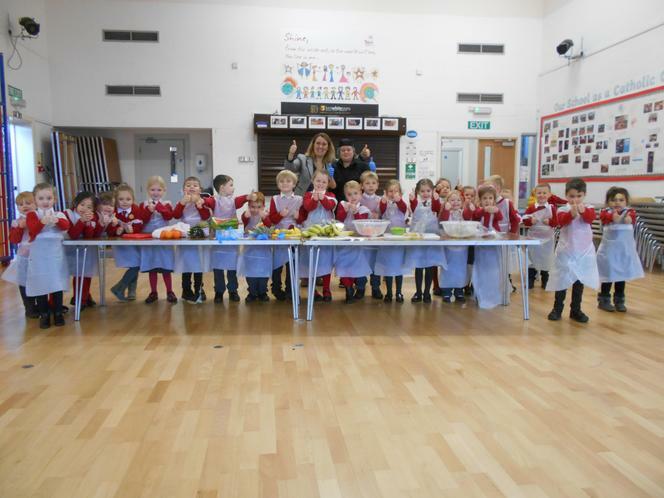 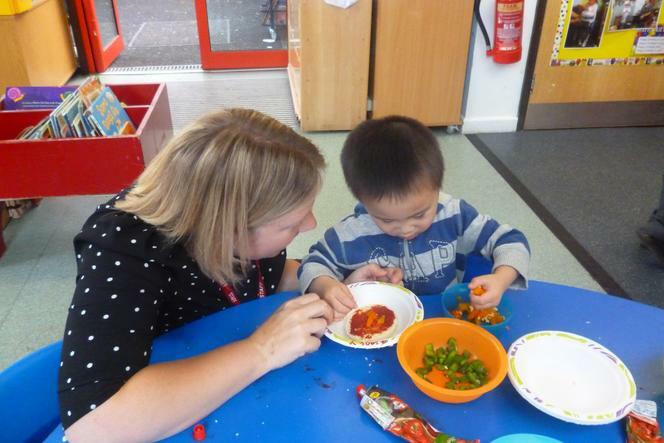 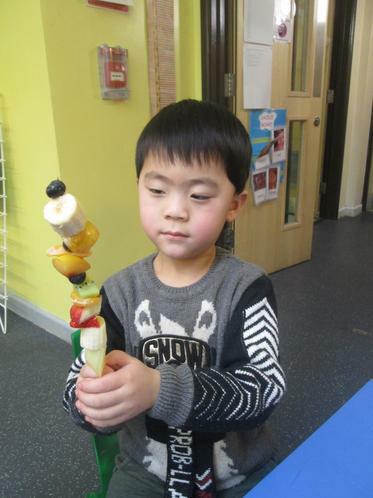 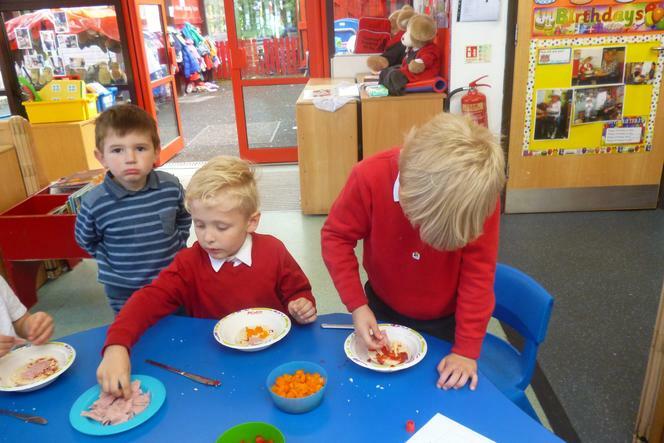 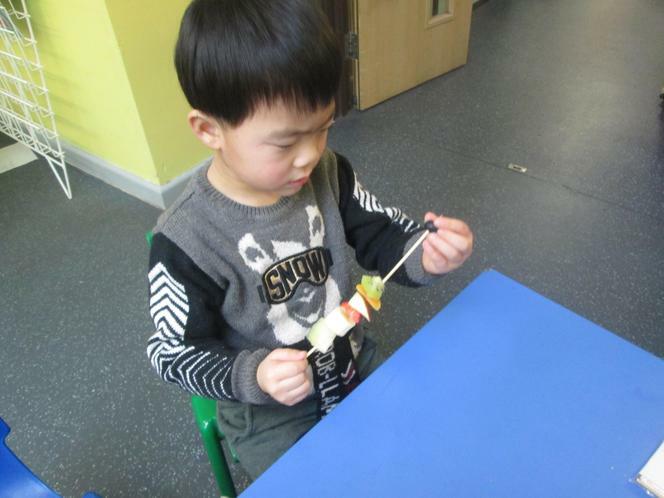 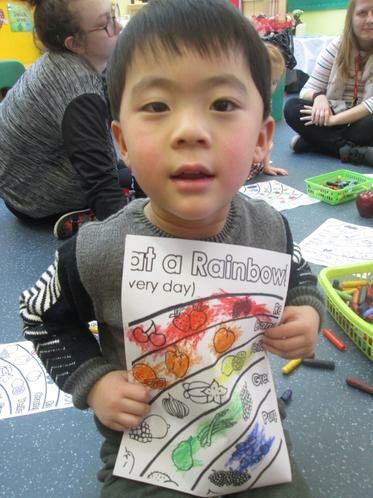 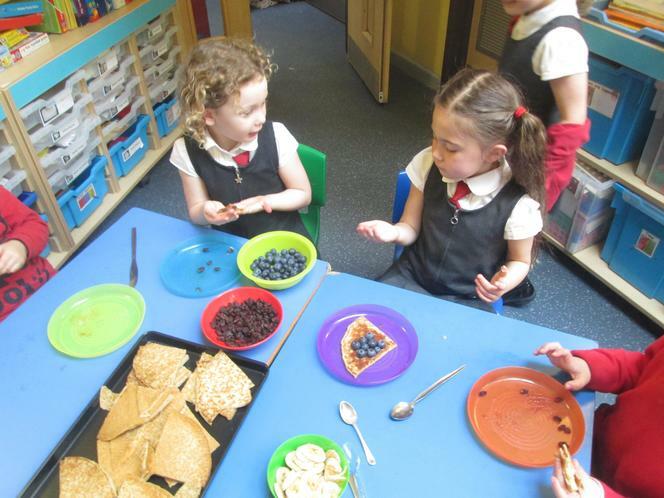 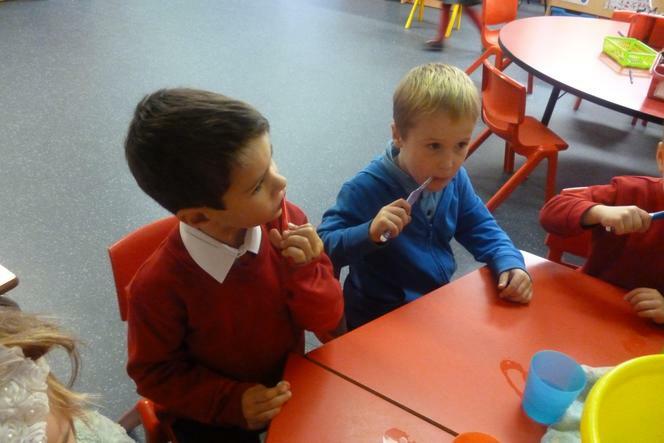 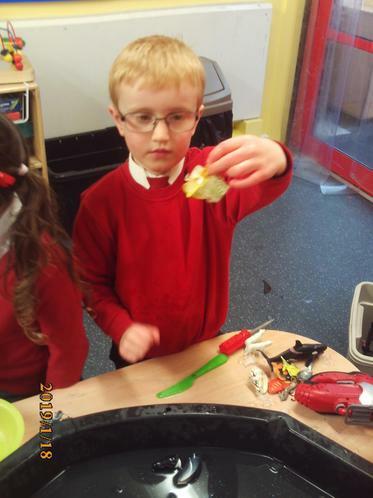 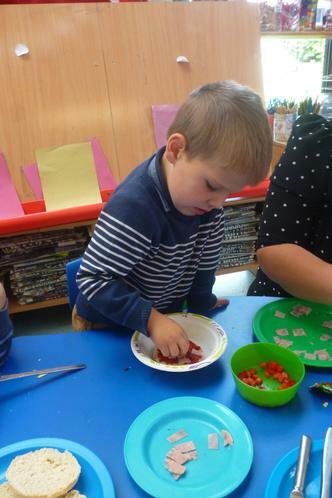 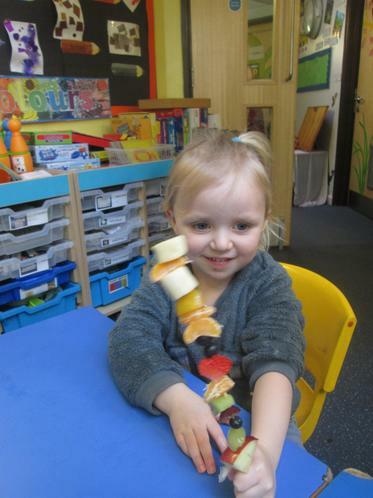 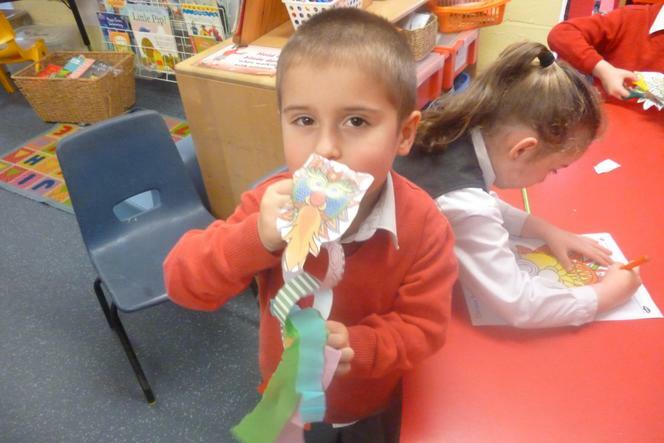 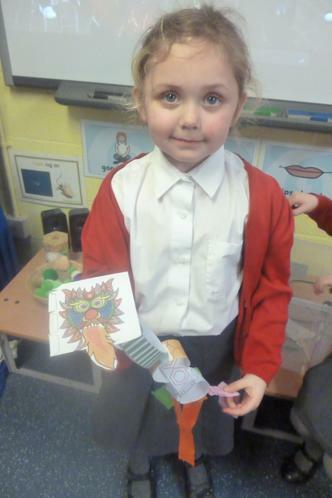 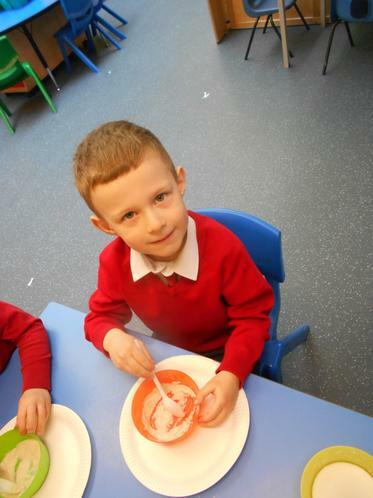 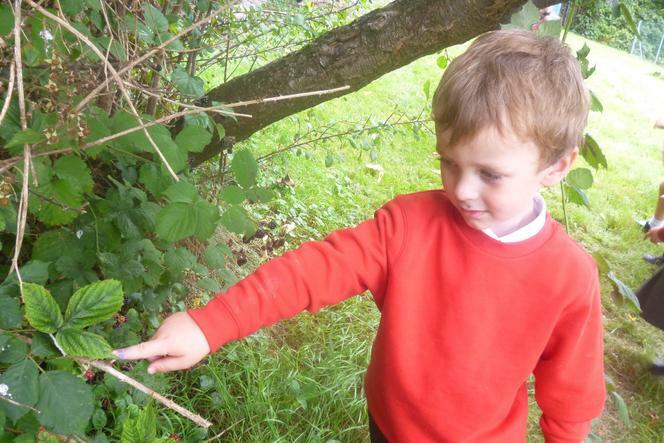 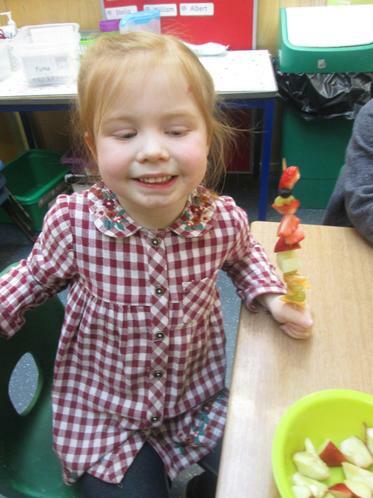 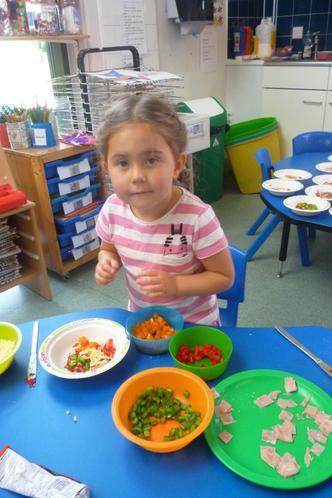 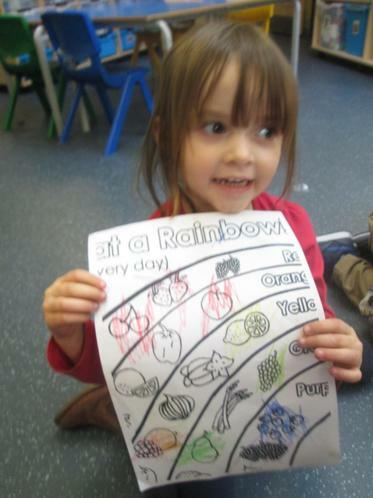 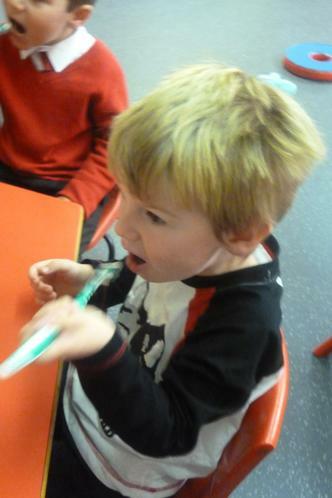 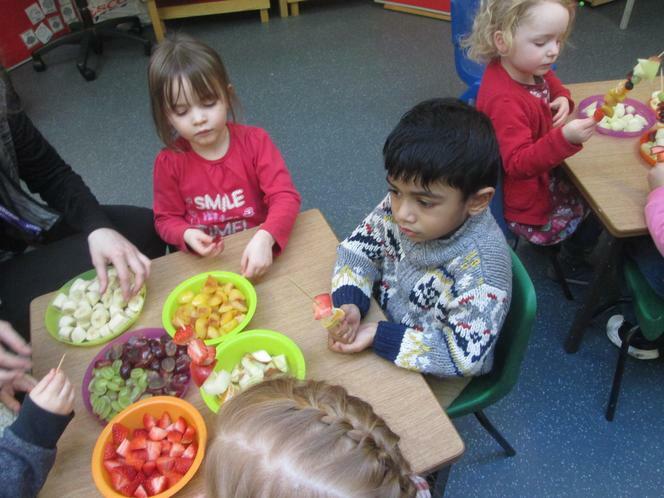 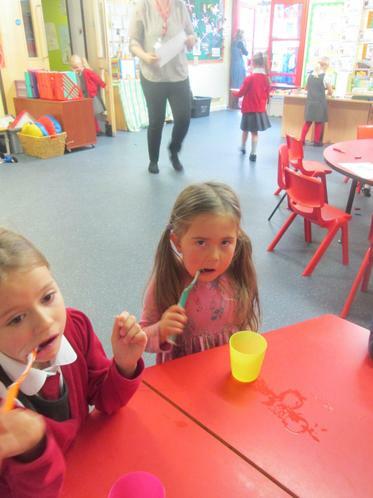 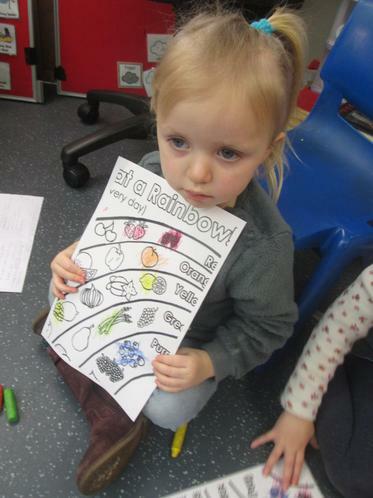 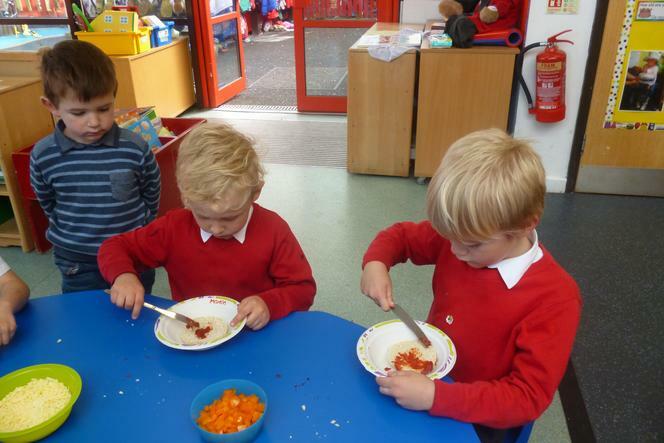 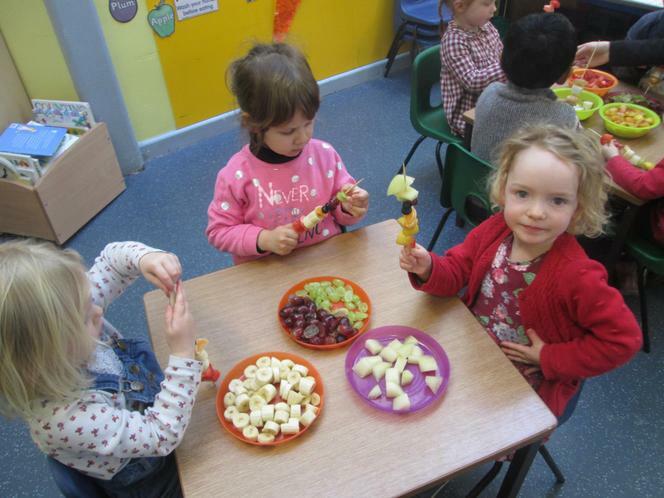 We learnt about eating a healthy rainbow fruit diet and then we made rainbow fruit skewers. 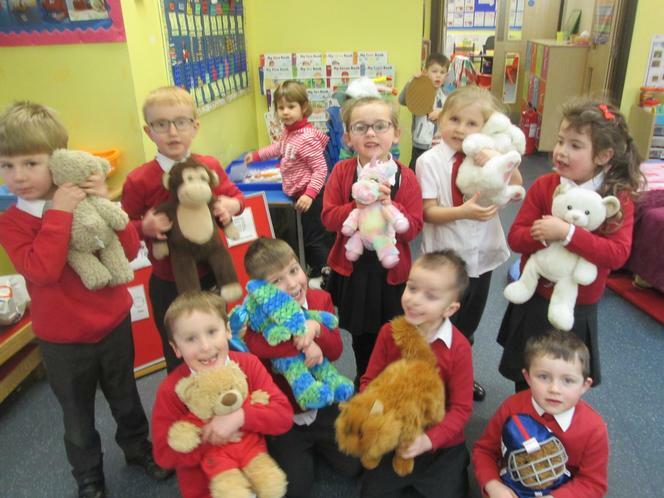 We brought in our teddies for a sleepover to raise money for CHAT (Churches Houses Action Team) and help homeless people in our locality. 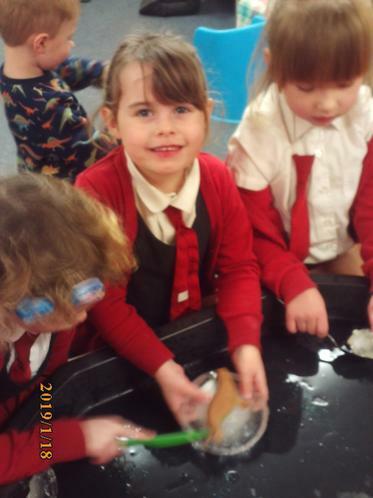 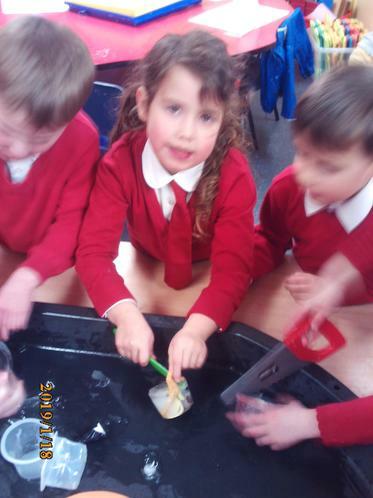 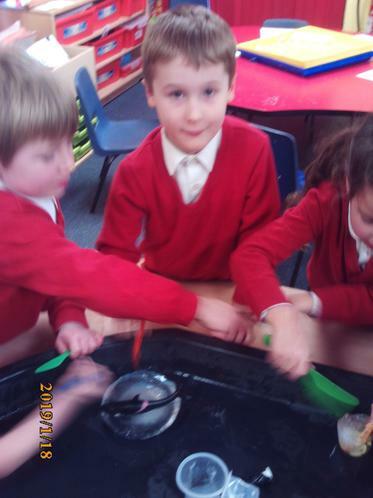 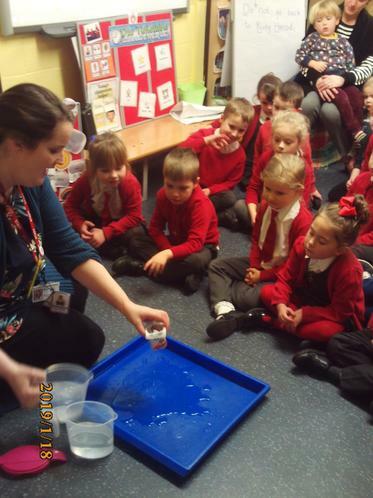 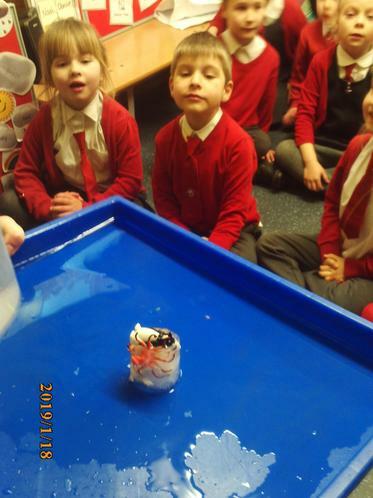 Learning about winter and investigating ice. 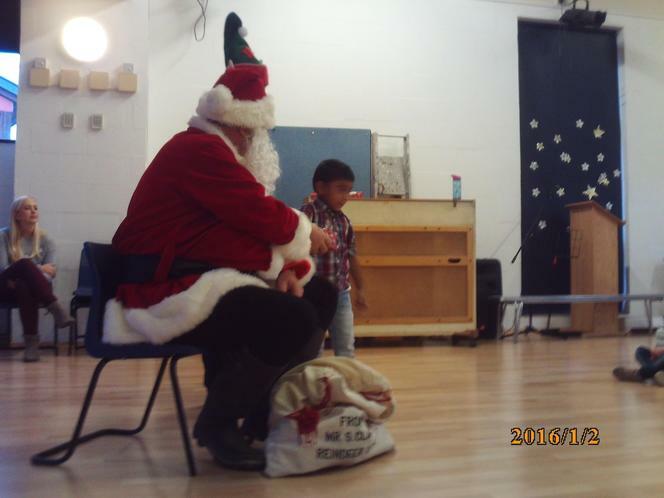 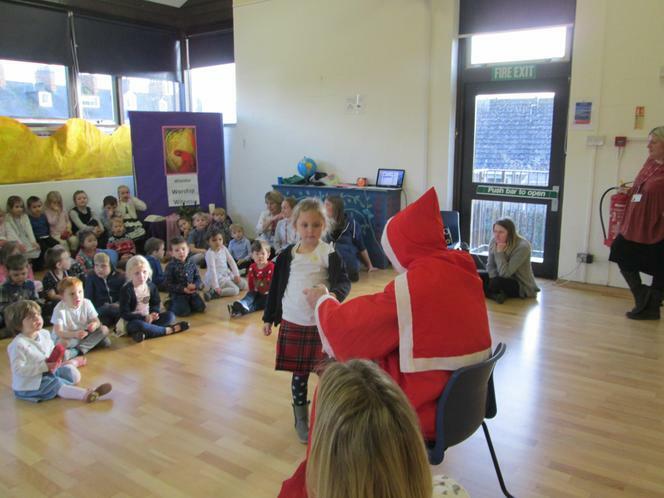 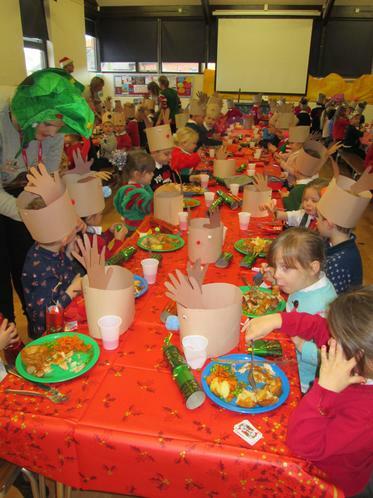 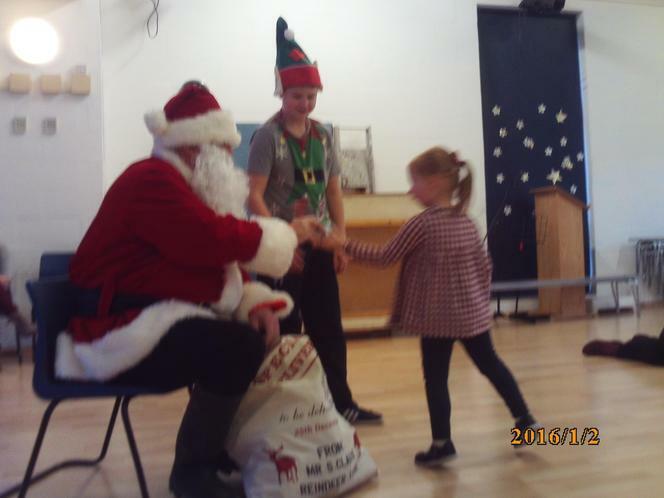 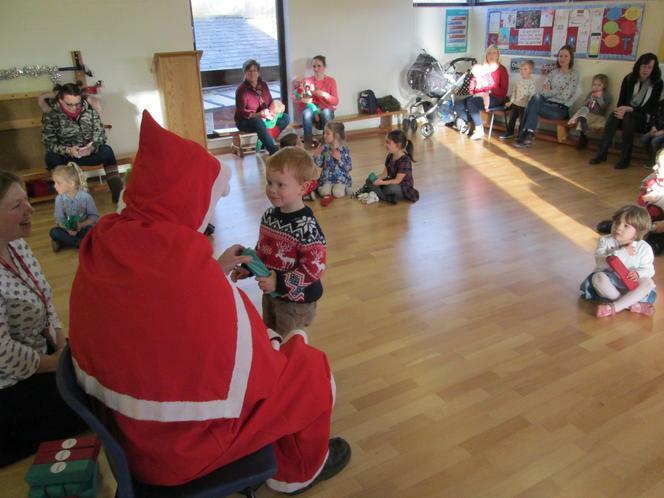 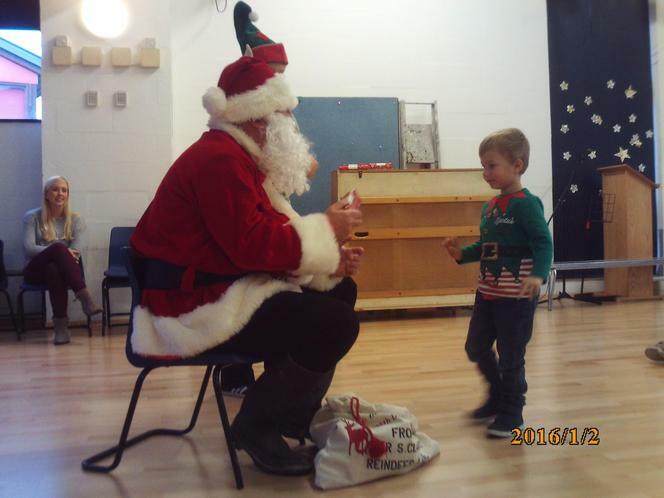 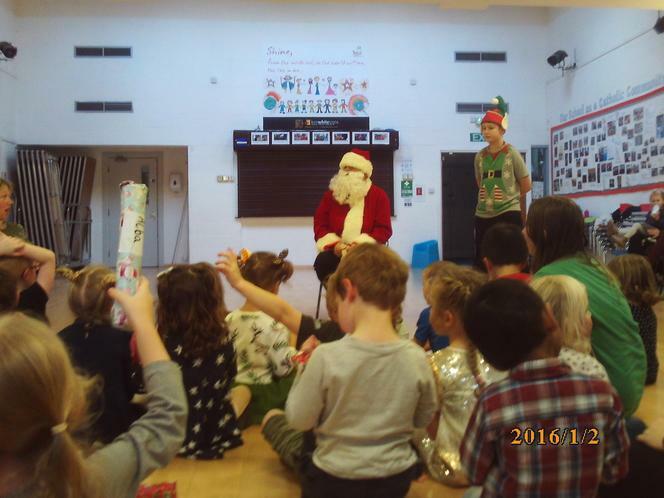 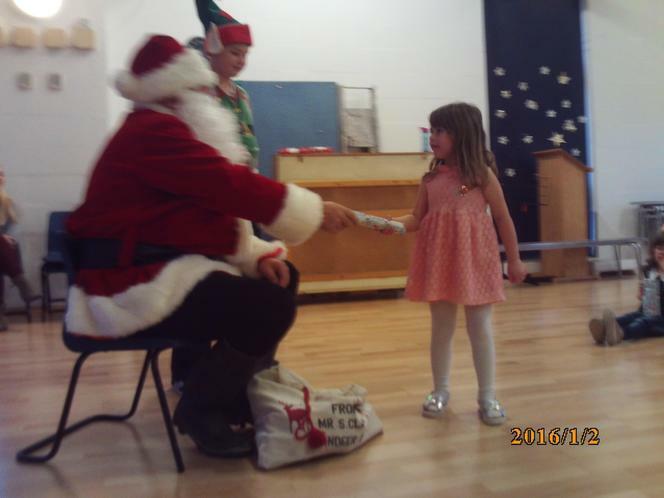 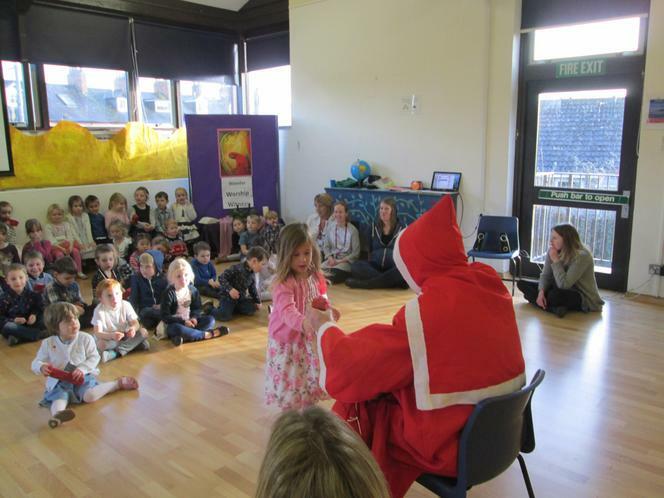 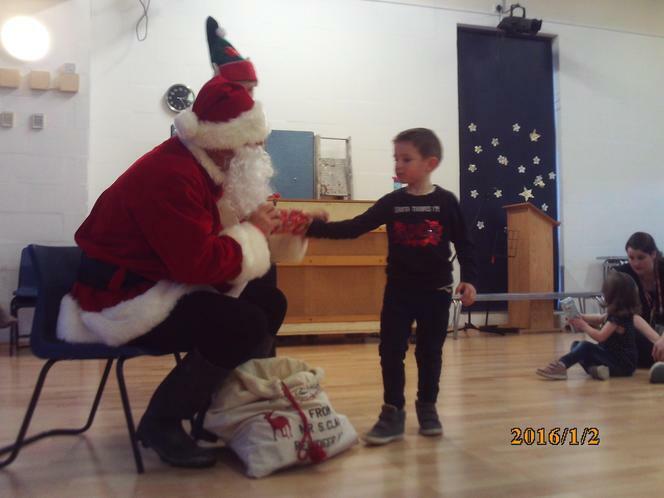 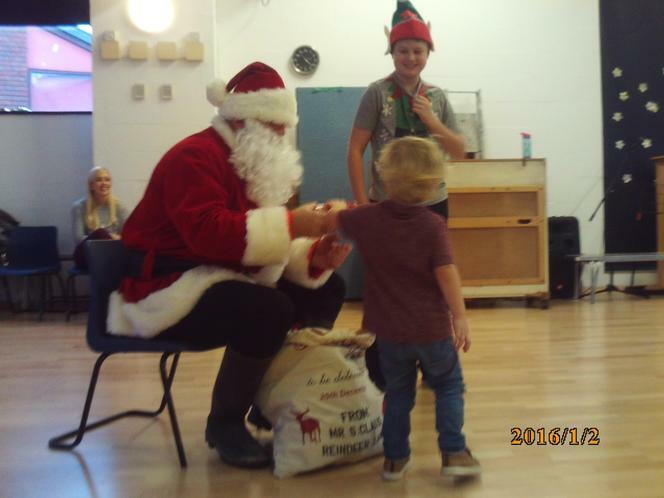 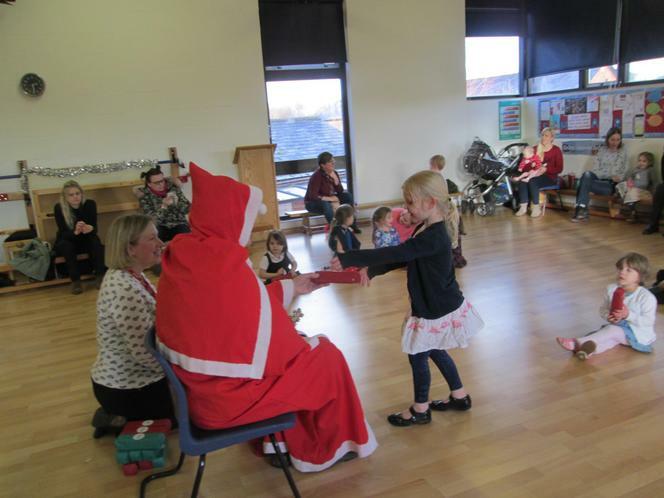 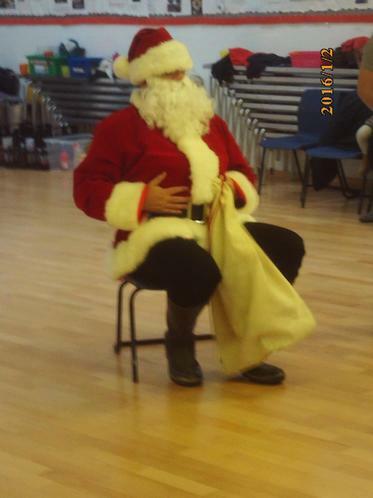 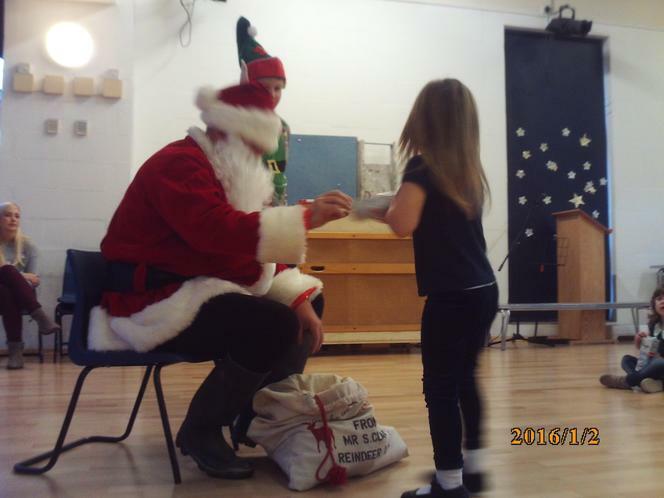 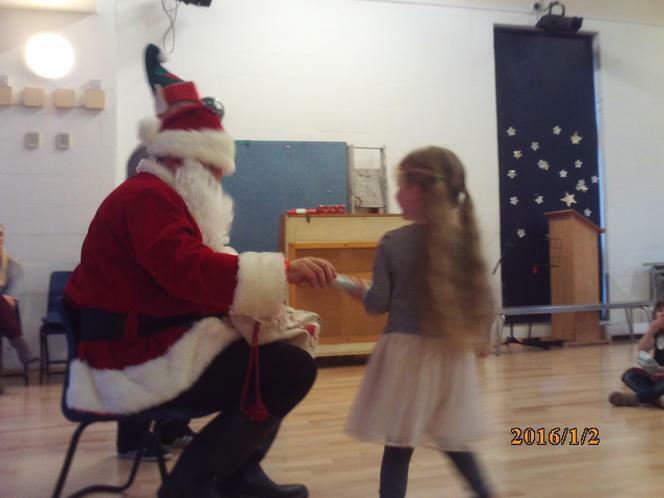 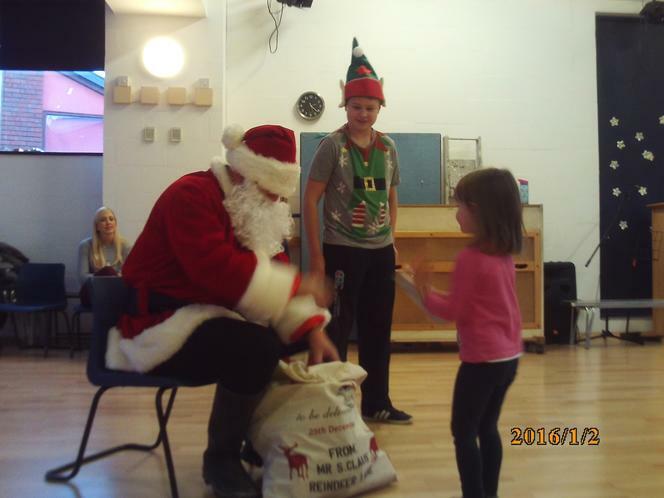 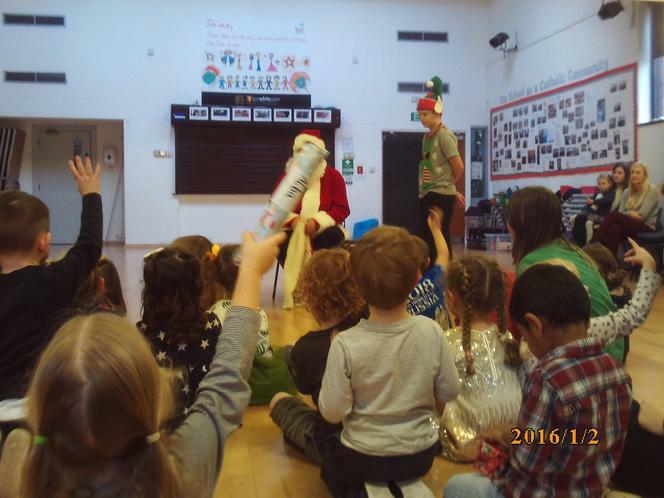 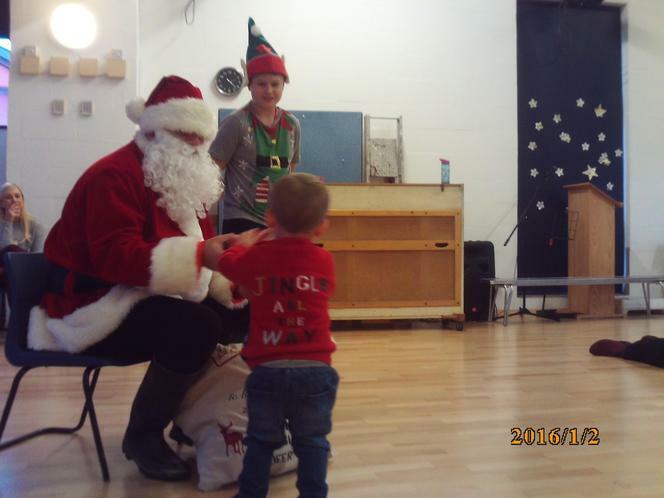 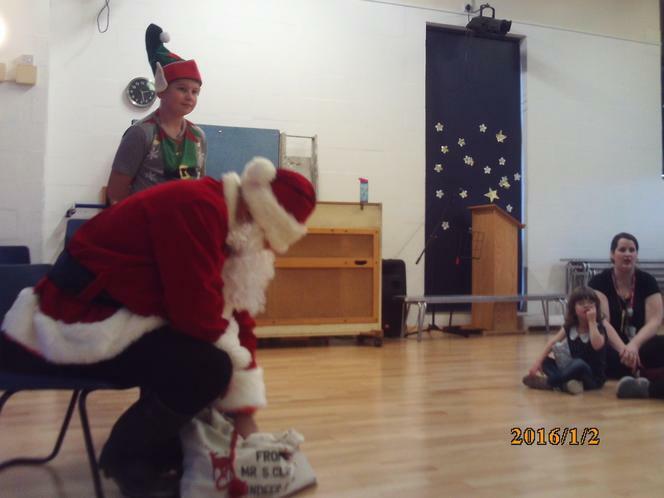 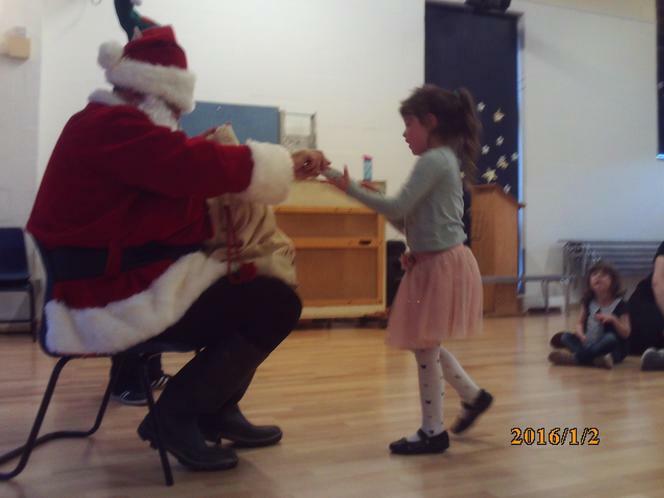 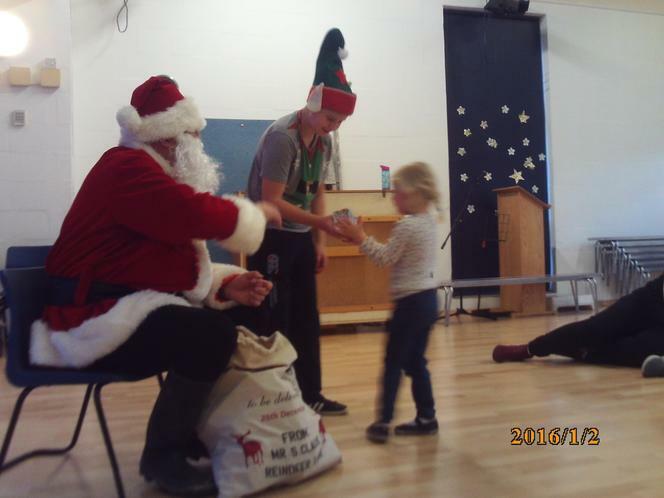 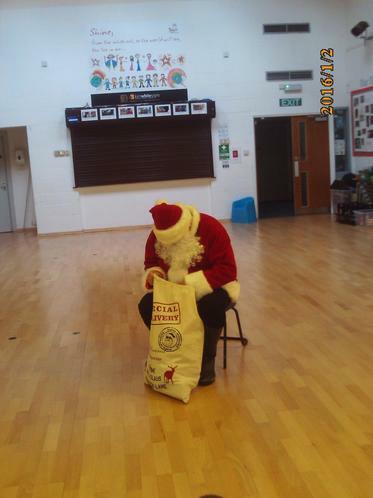 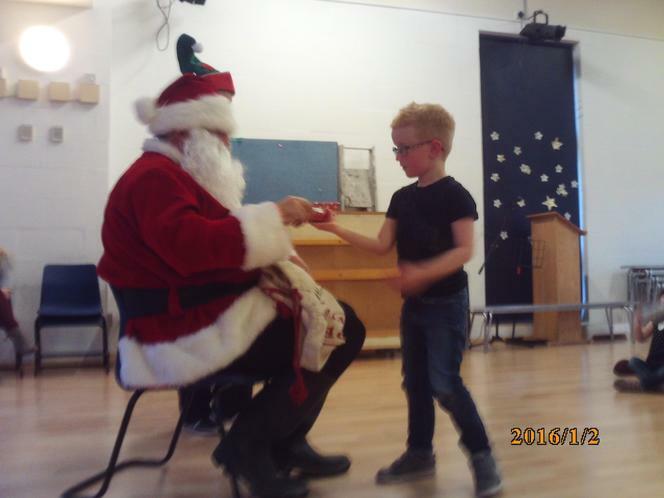 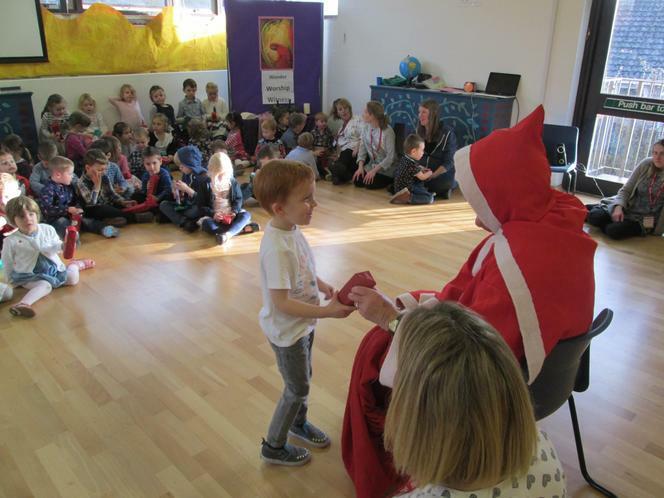 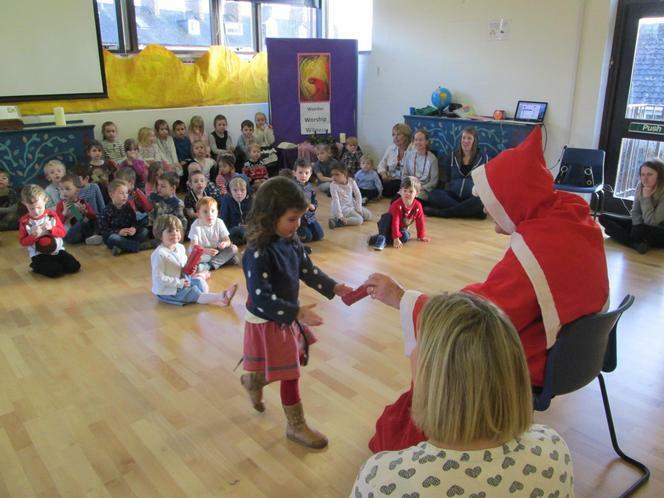 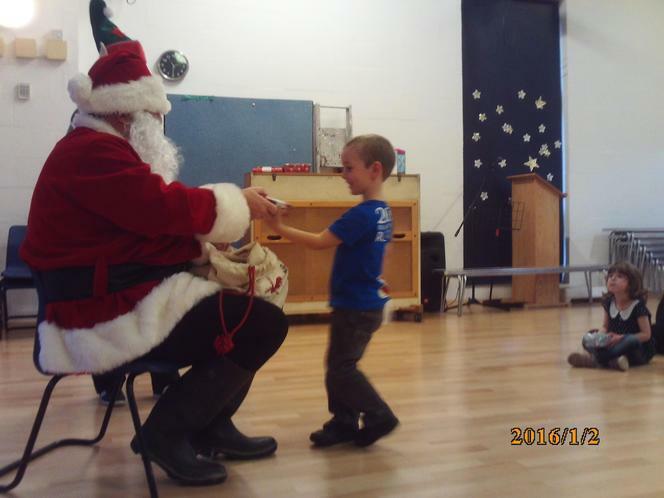 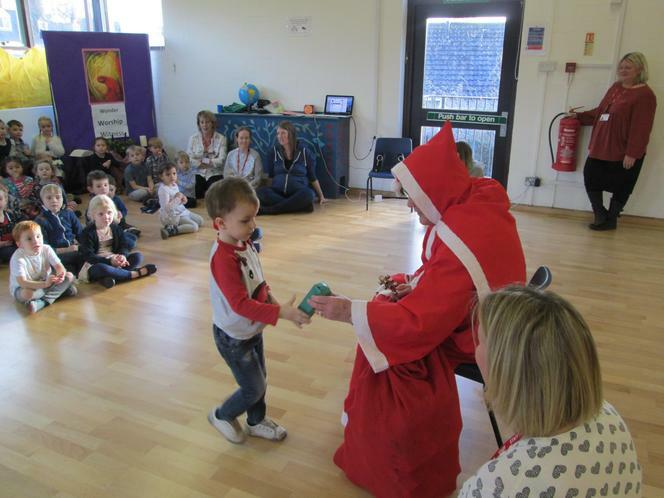 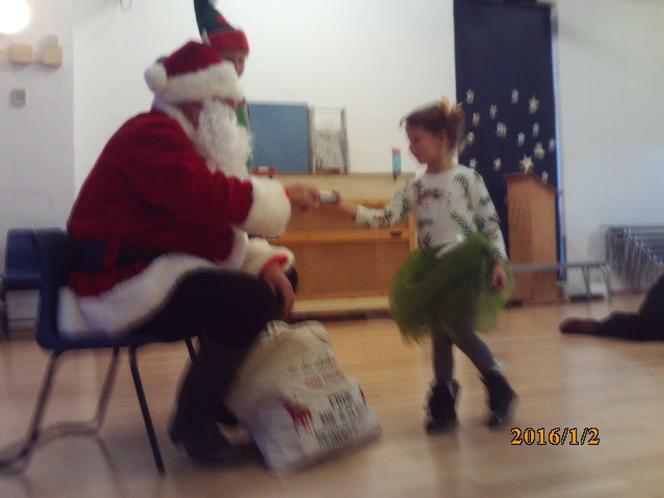 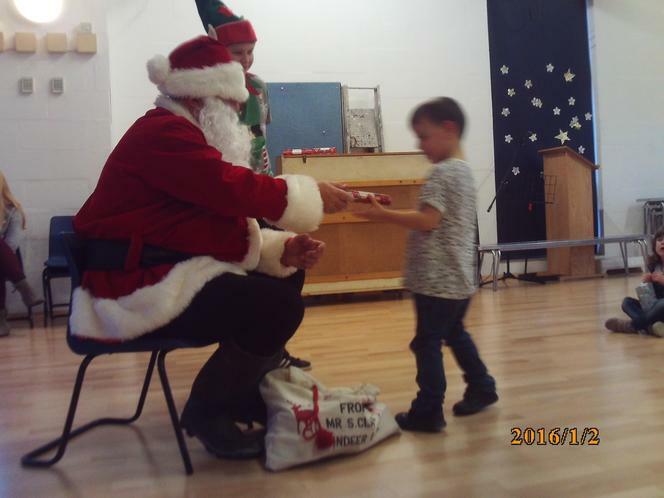 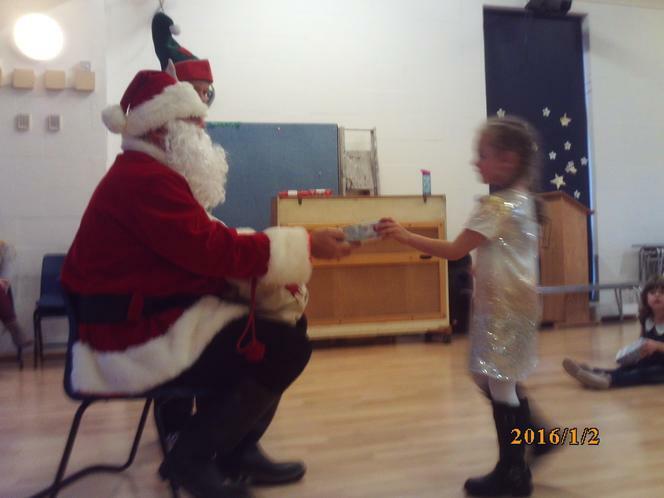 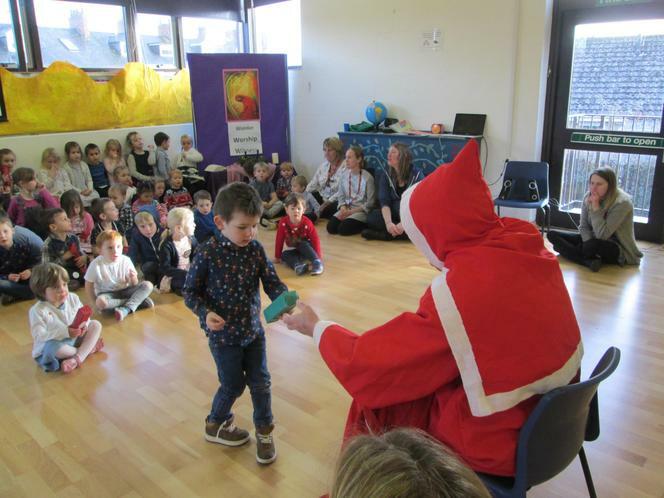 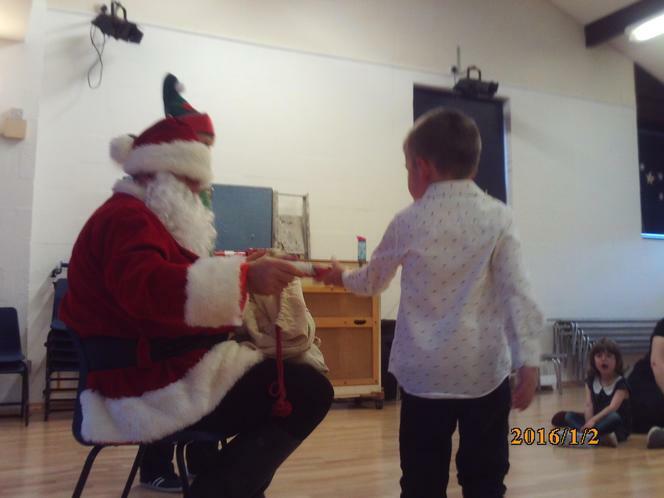 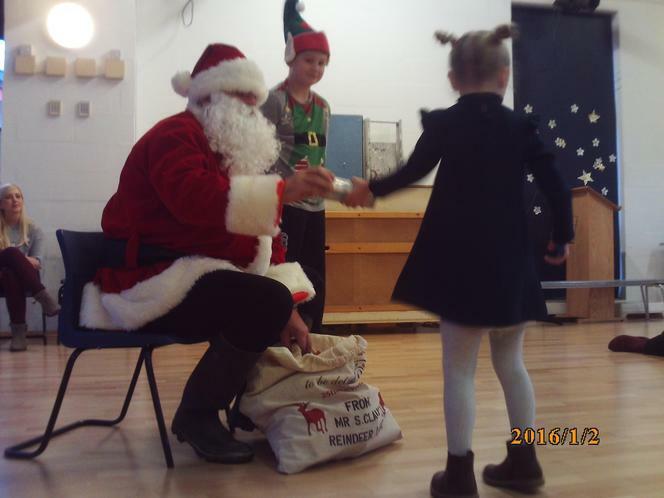 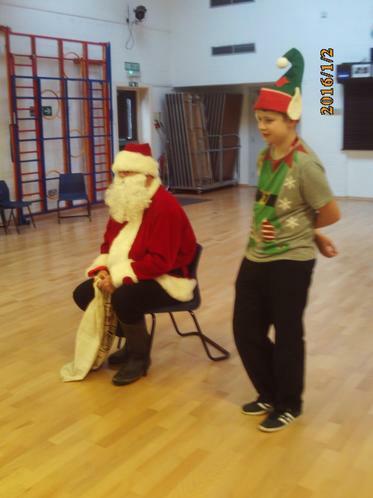 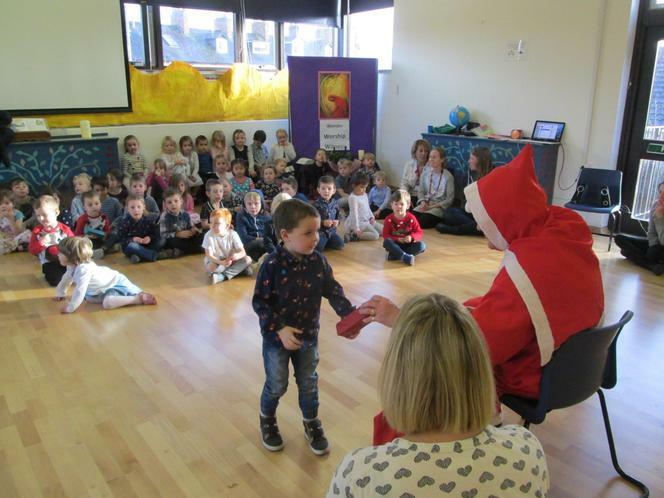 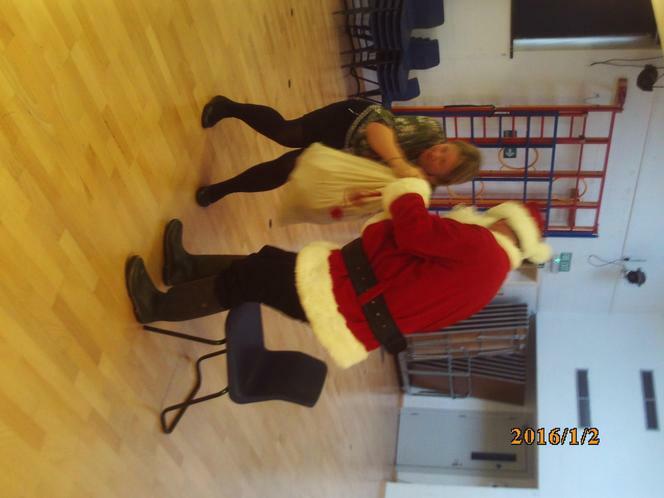 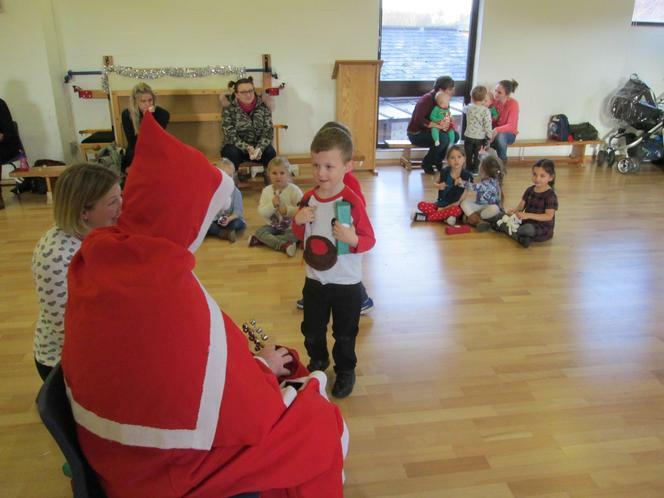 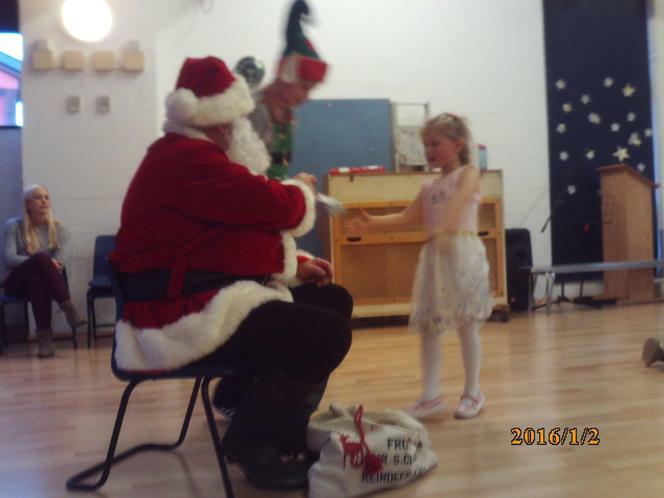 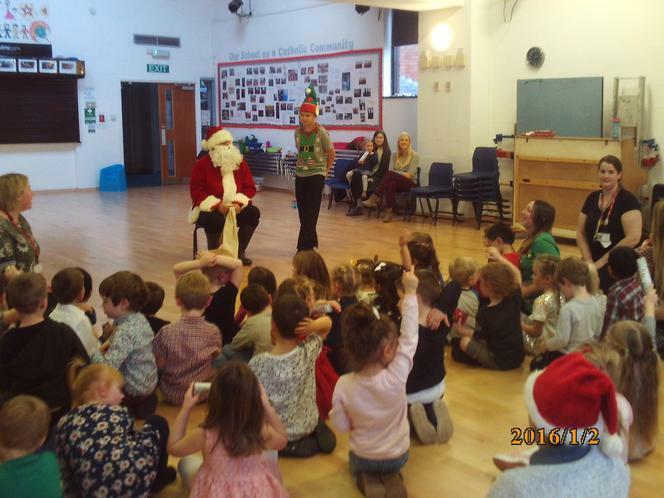 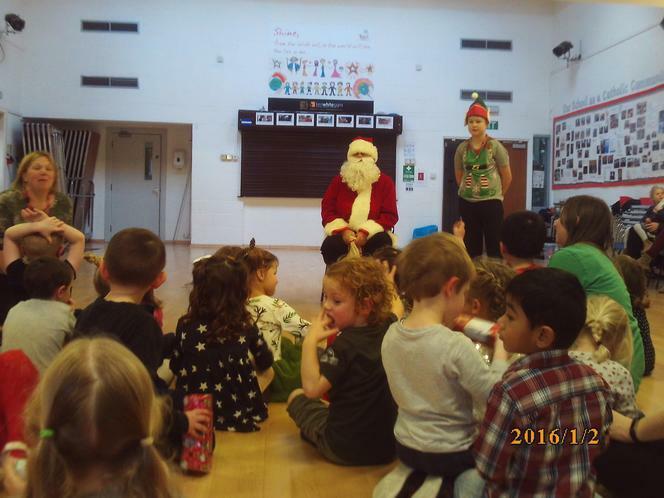 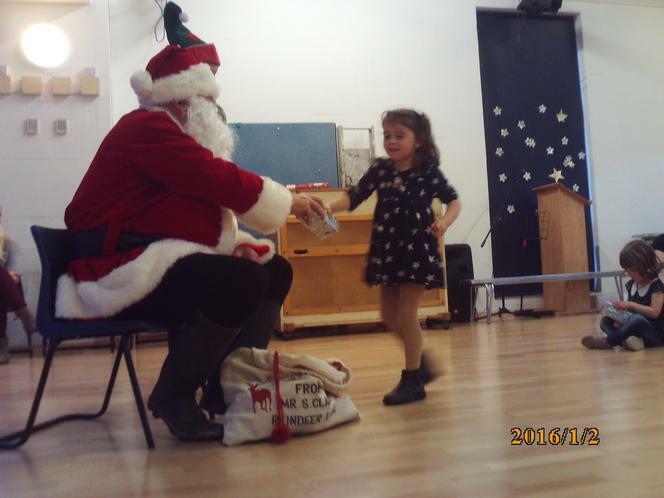 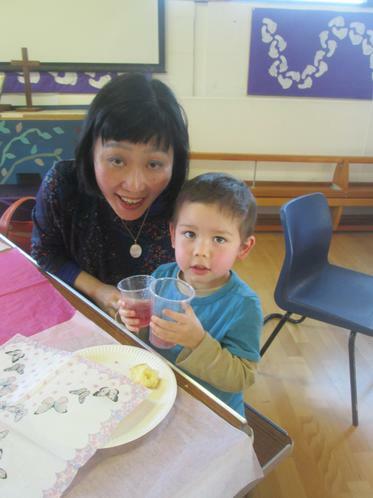 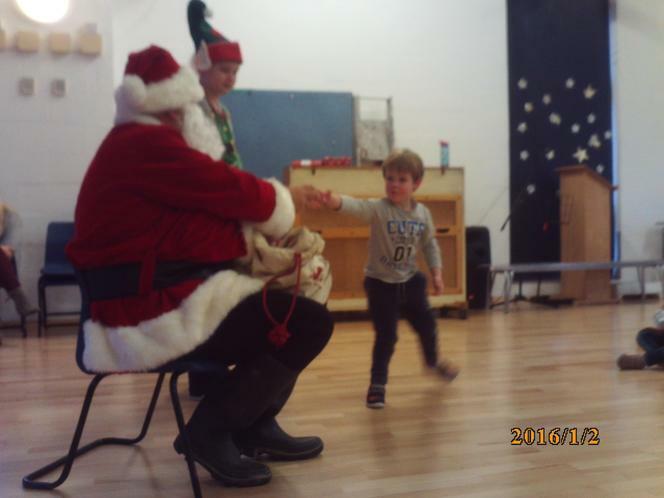 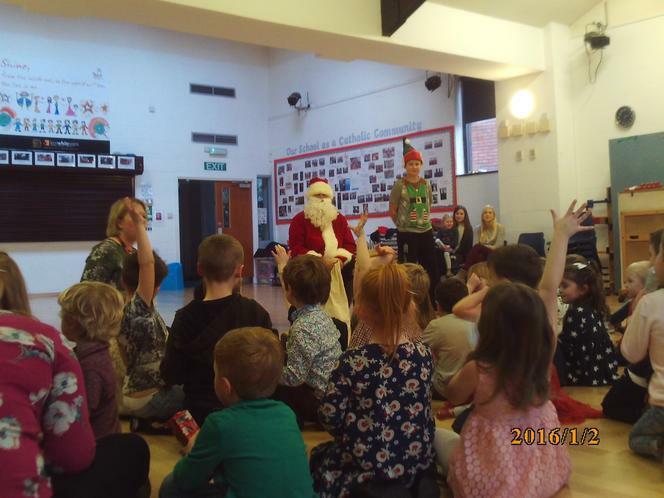 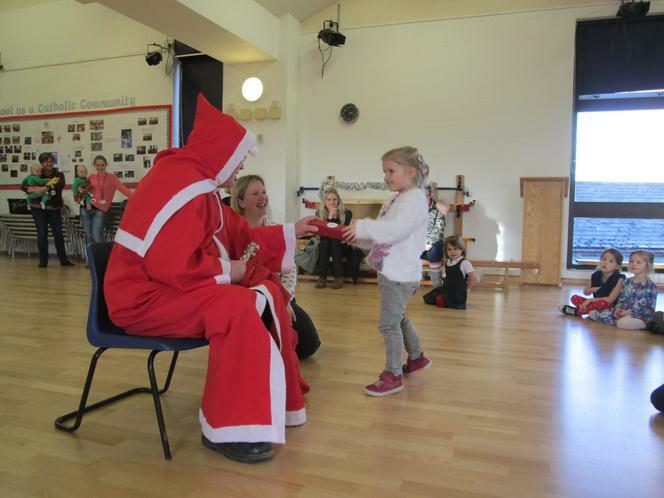 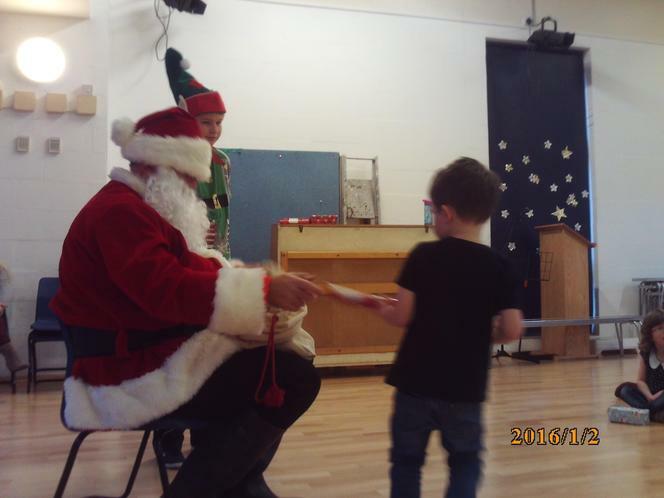 Acorn's Christmas Party and a Special Visitor! 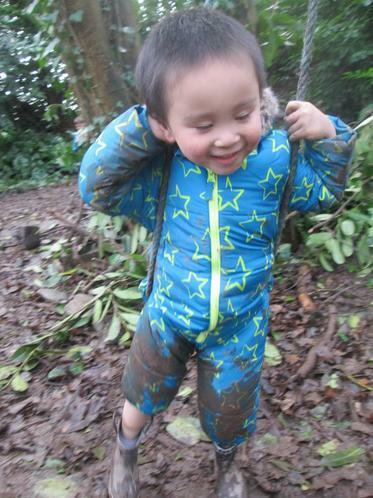 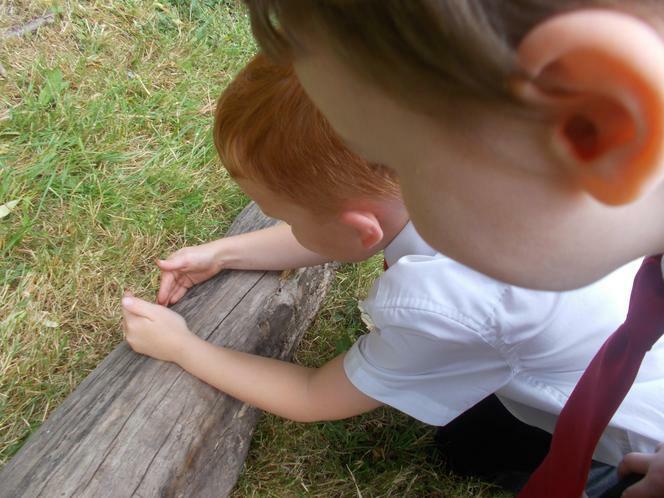 Having fun outdoors bug hunting and exploring the outdoor equipment. 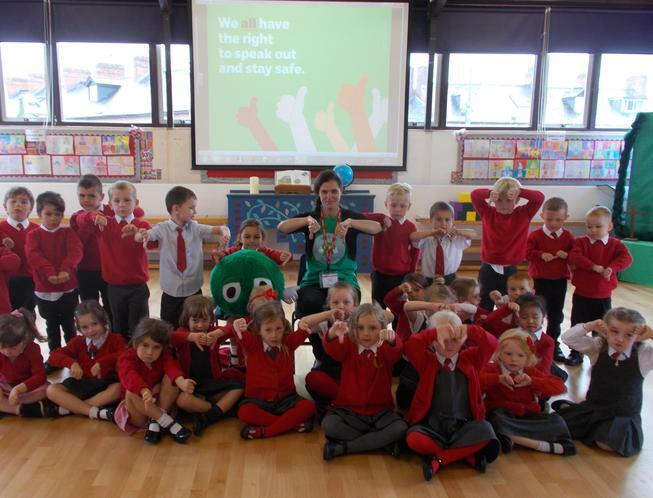 To celebrate the end of our three sessions at Tiverton Swimming Pool the children got to meet and high five Armband Alfie. 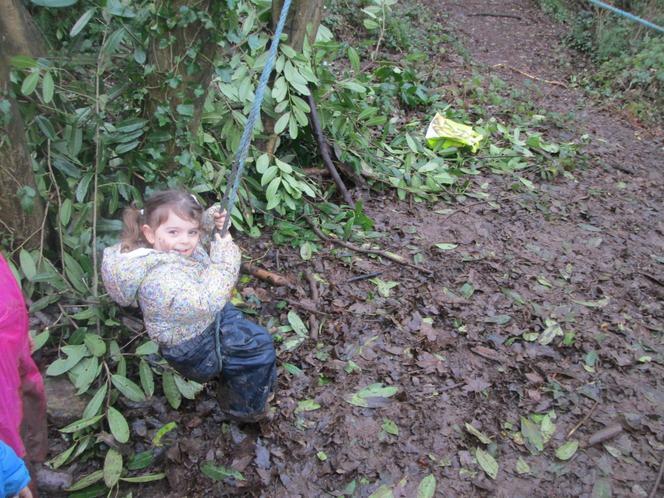 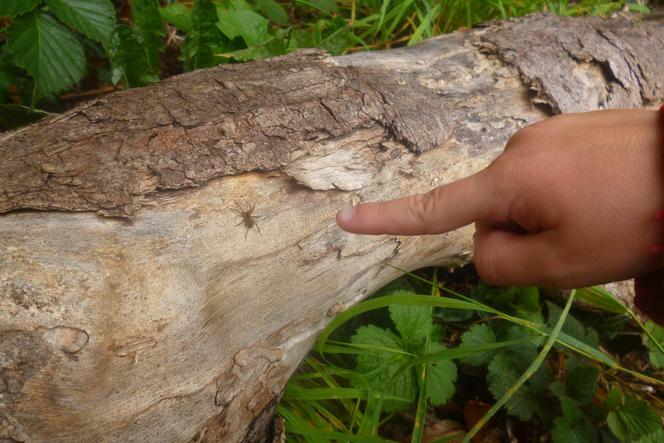 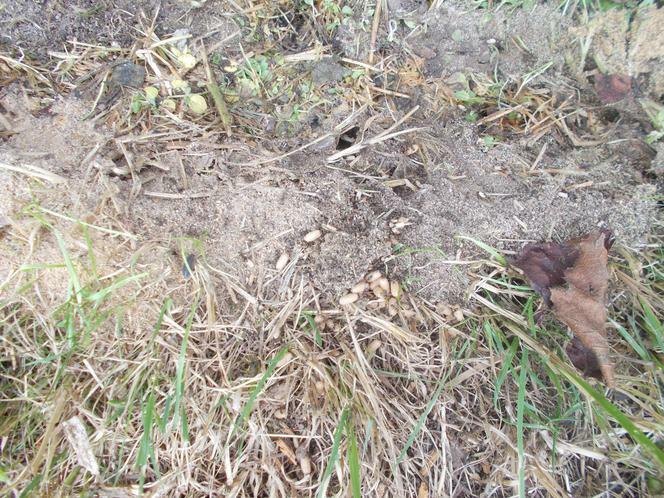 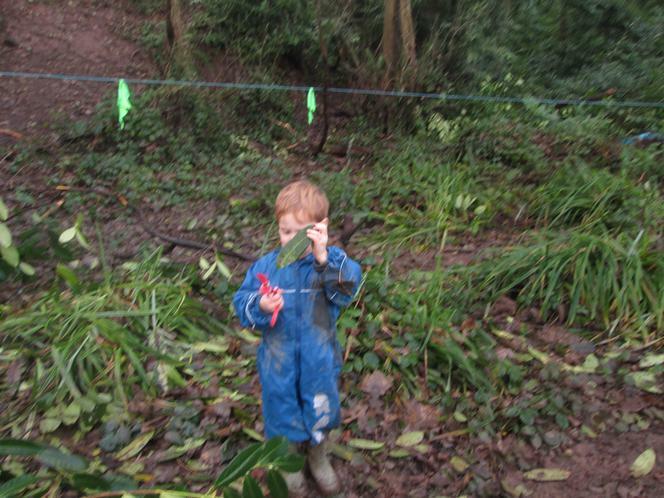 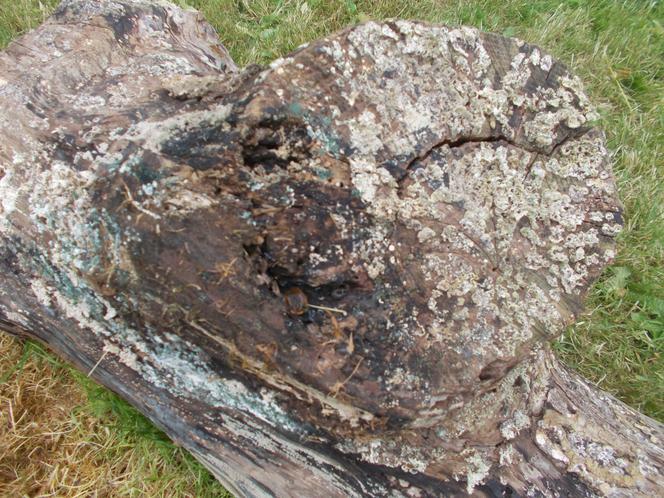 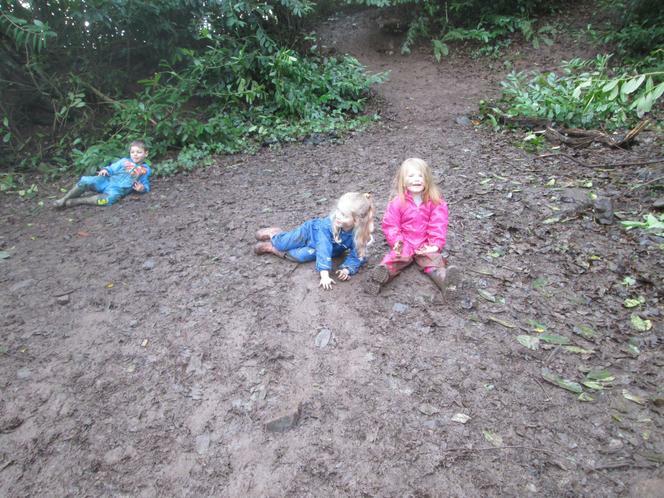 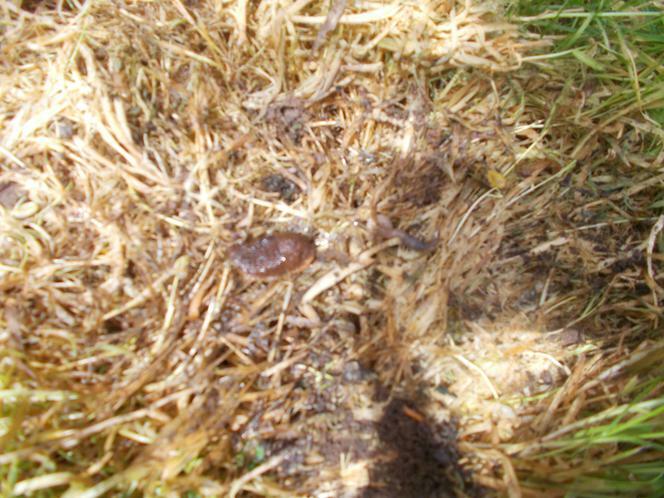 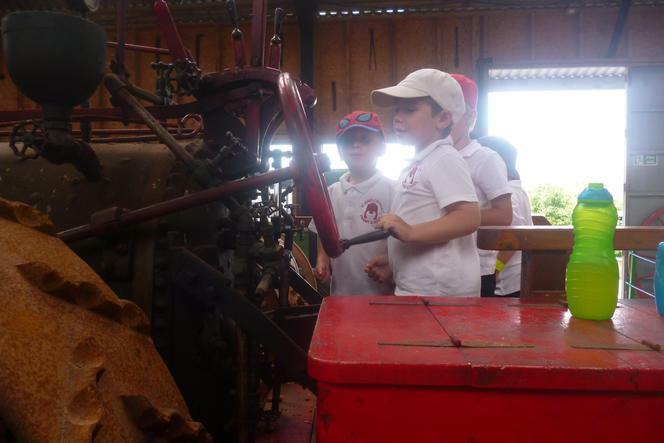 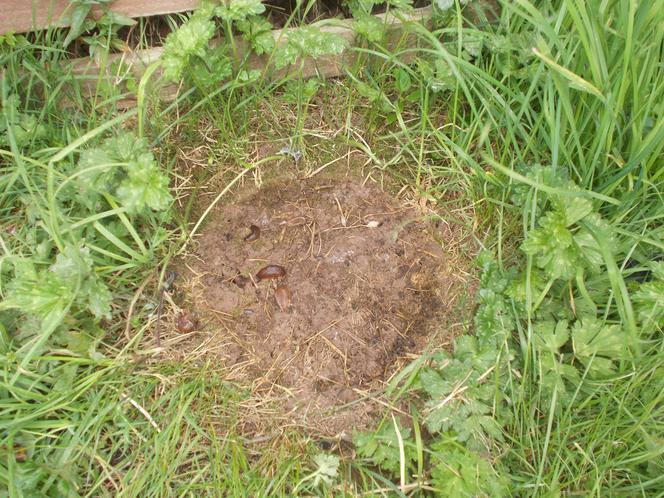 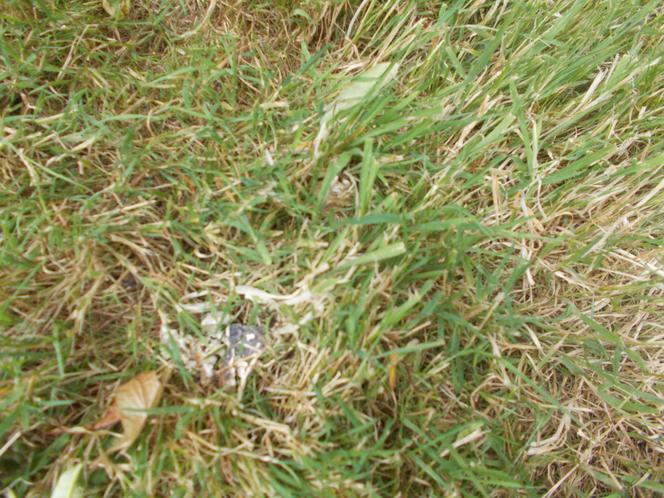 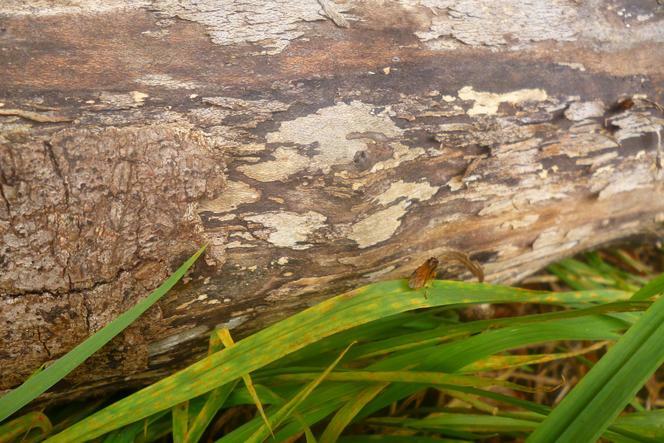 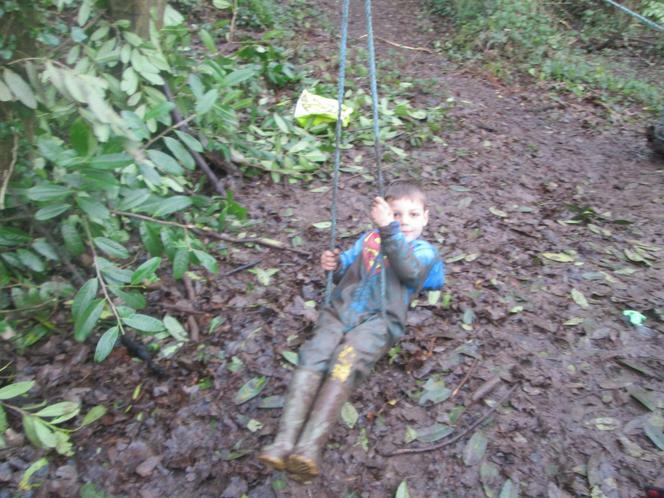 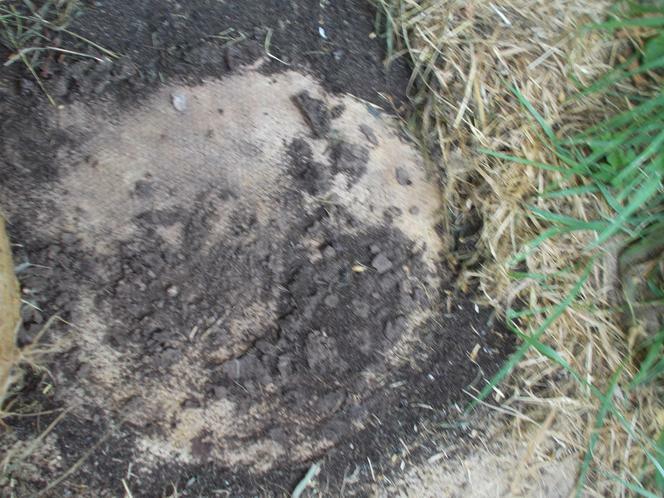 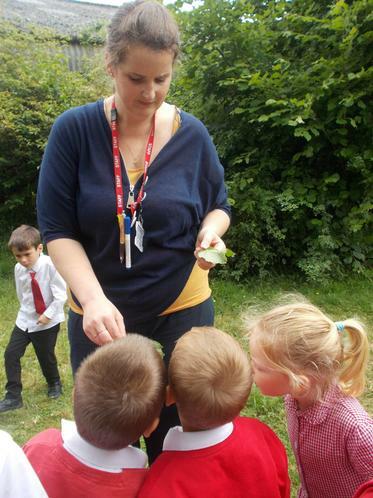 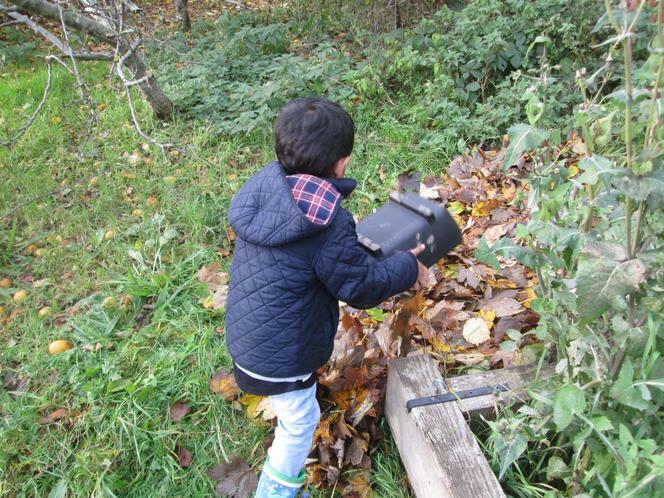 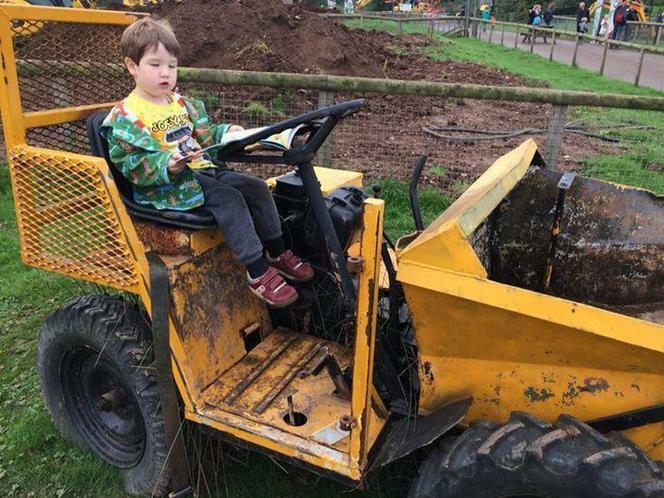 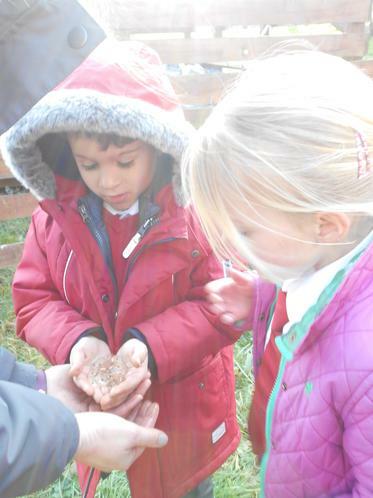 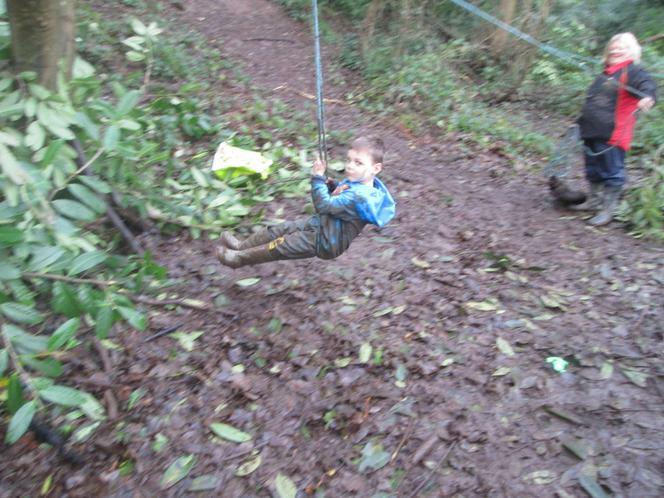 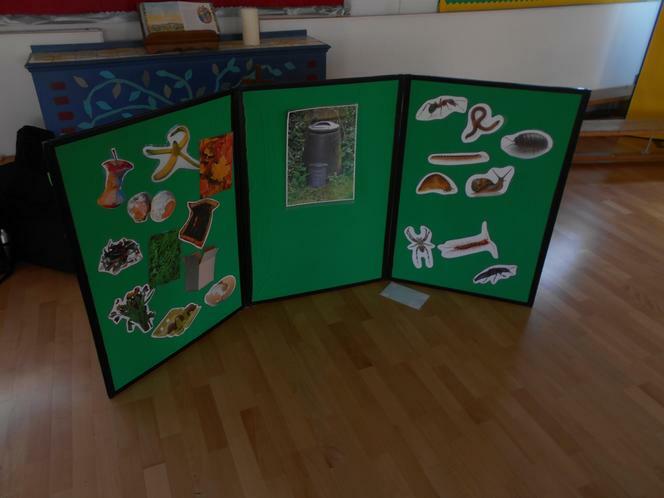 Recycle Devon Workshop on Minibeasts and Composting. 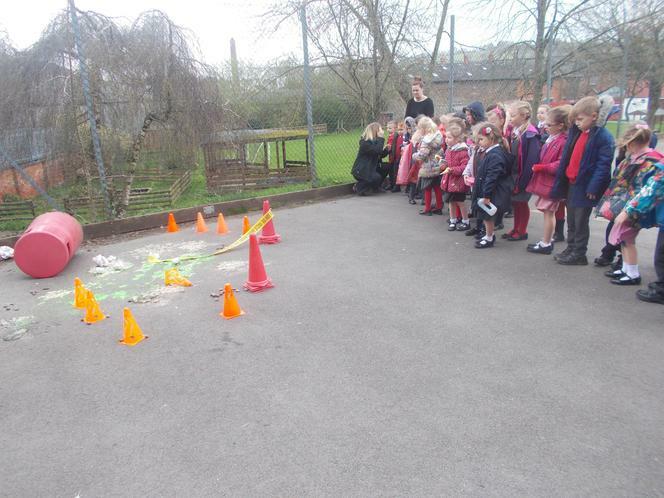 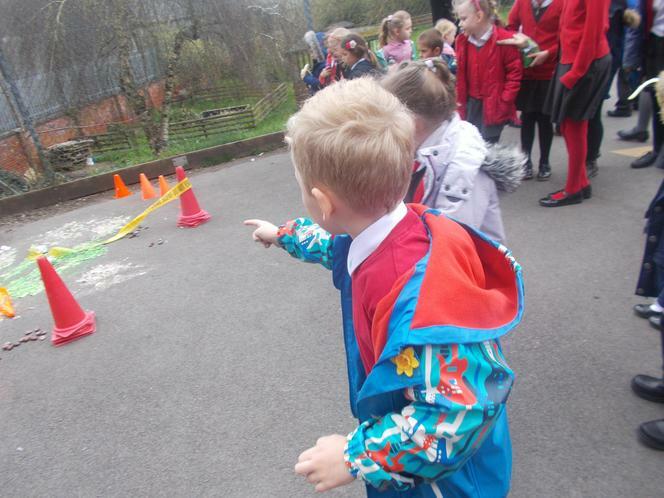 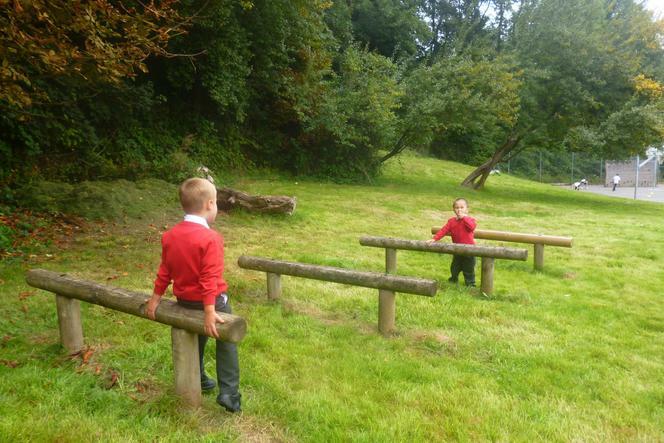 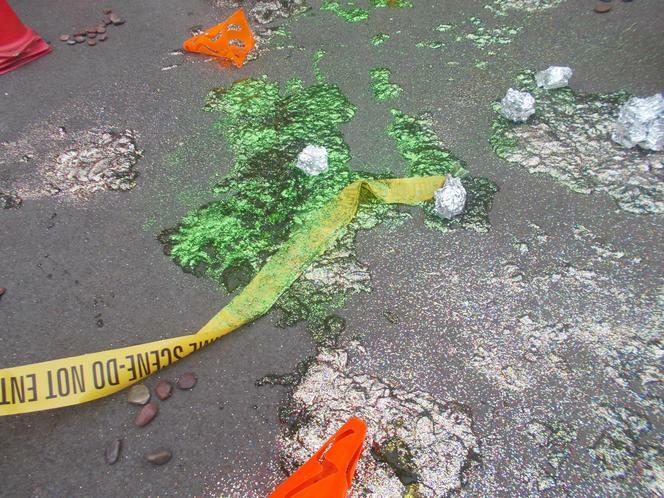 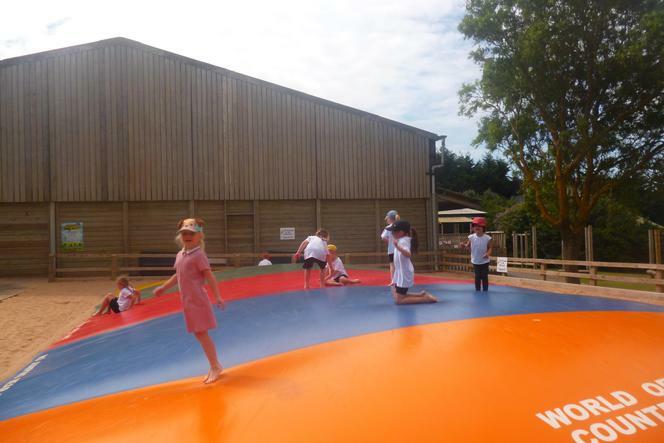 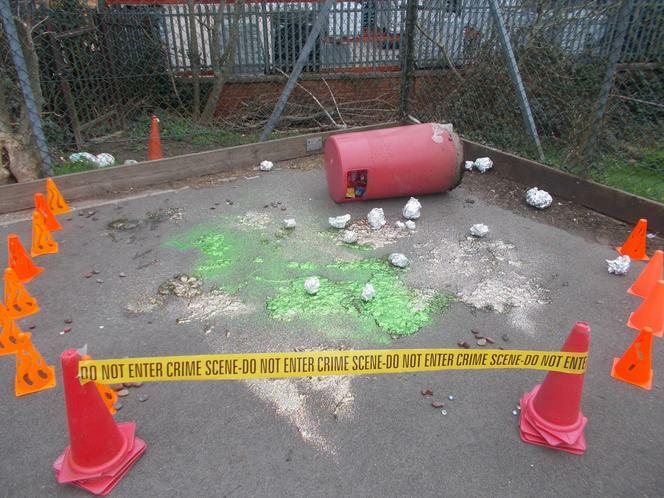 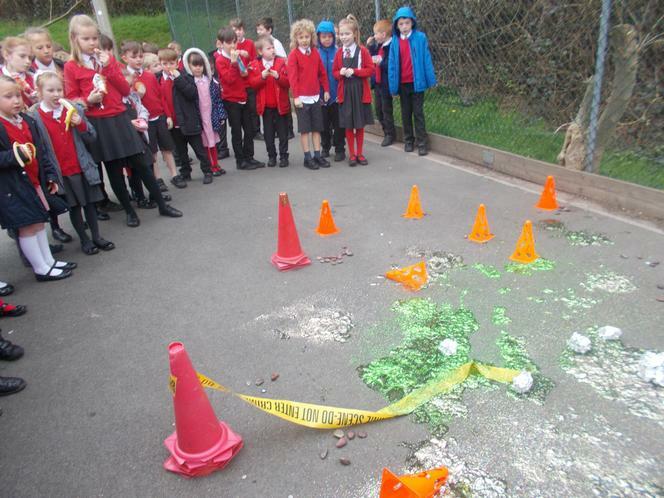 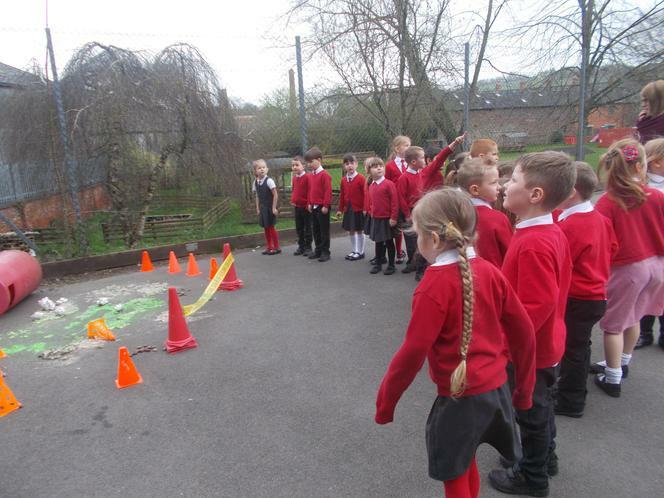 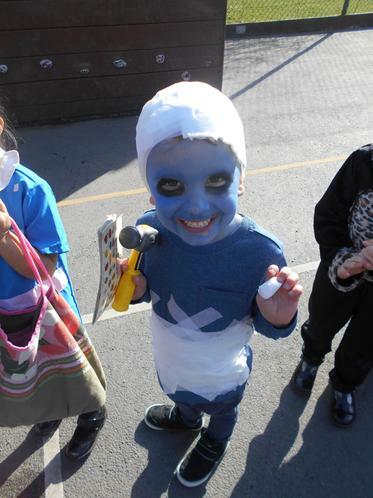 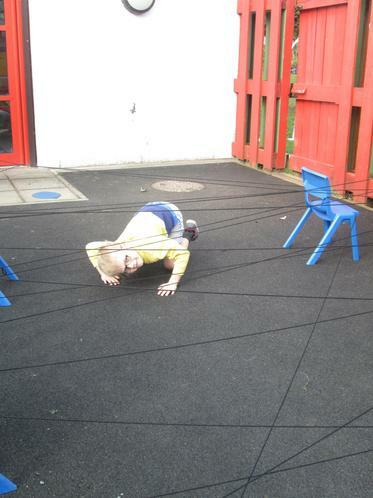 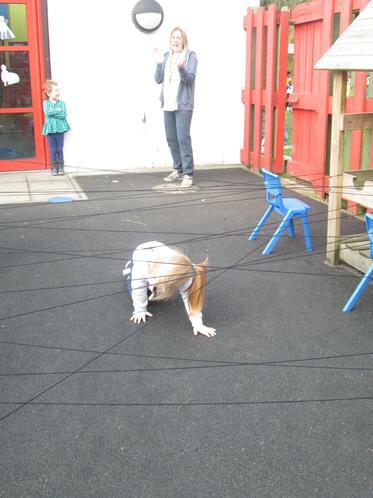 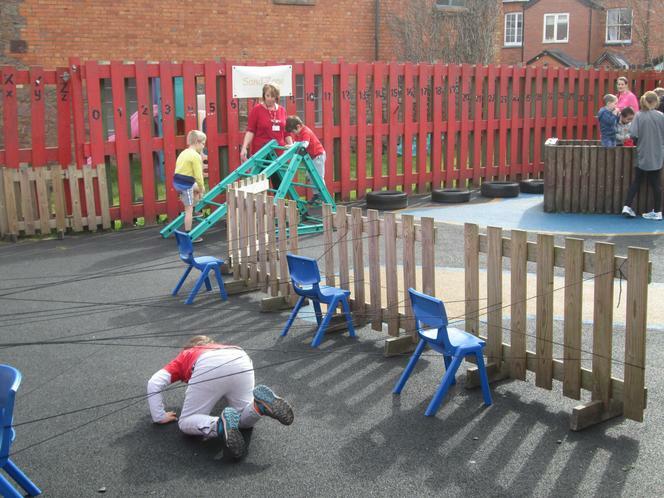 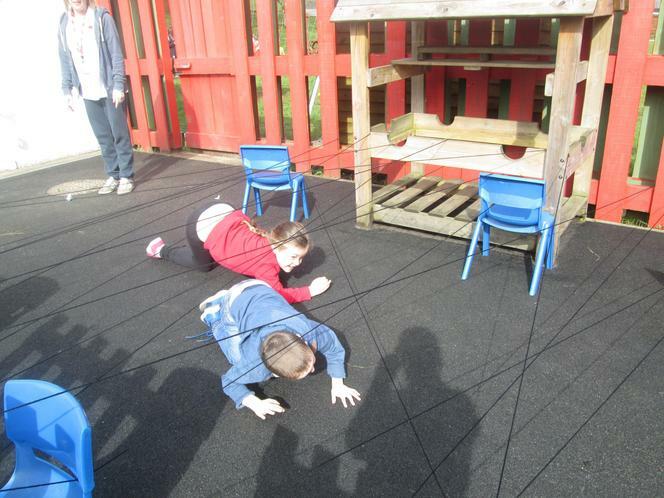 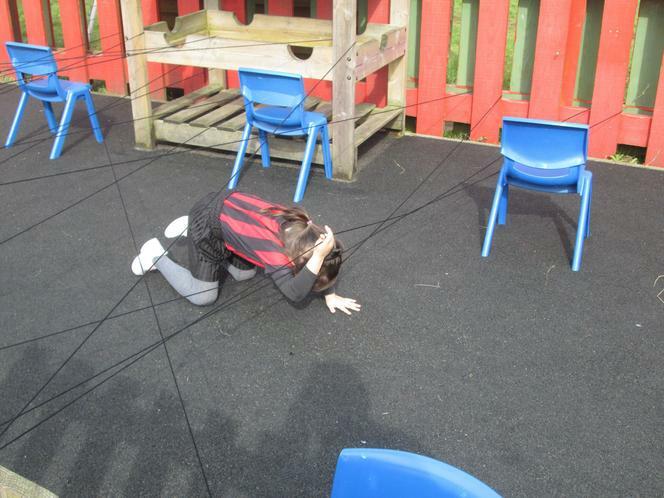 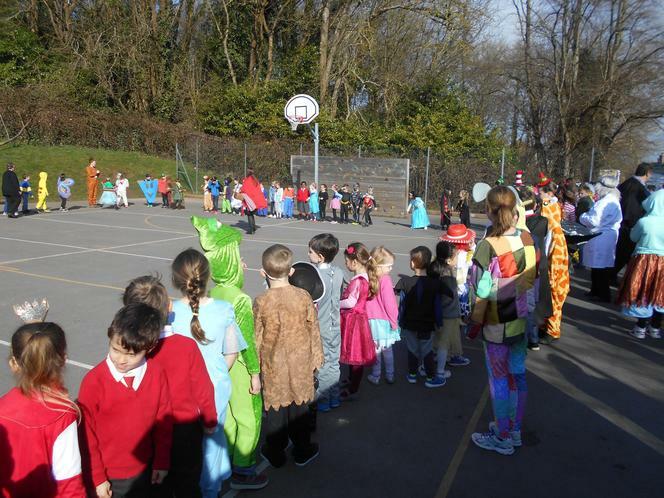 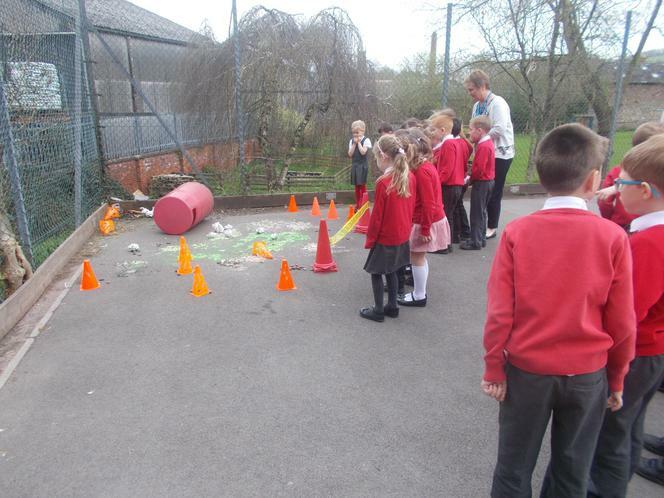 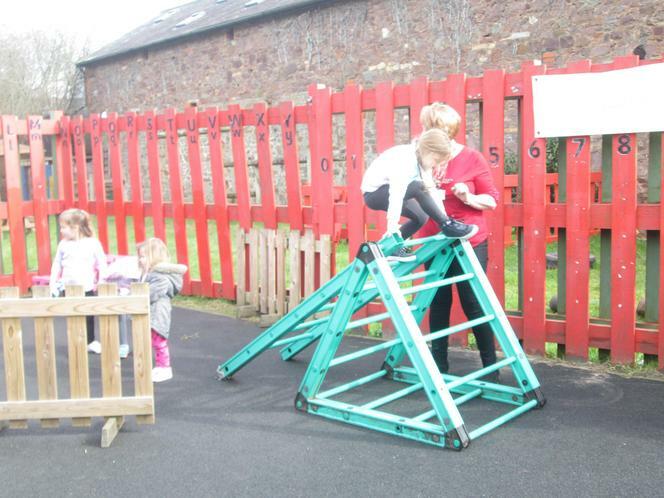 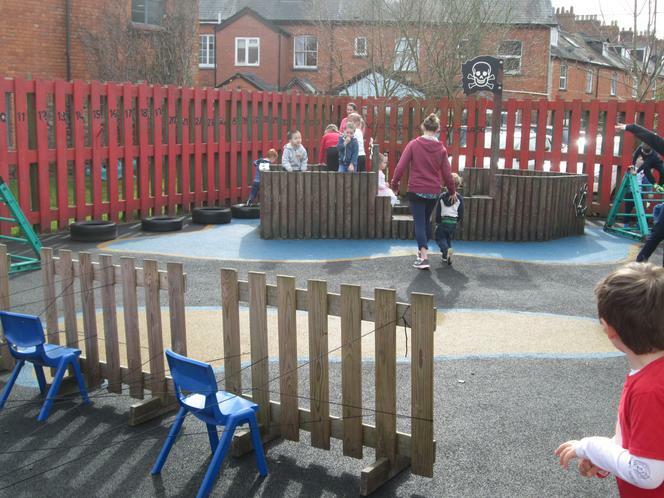 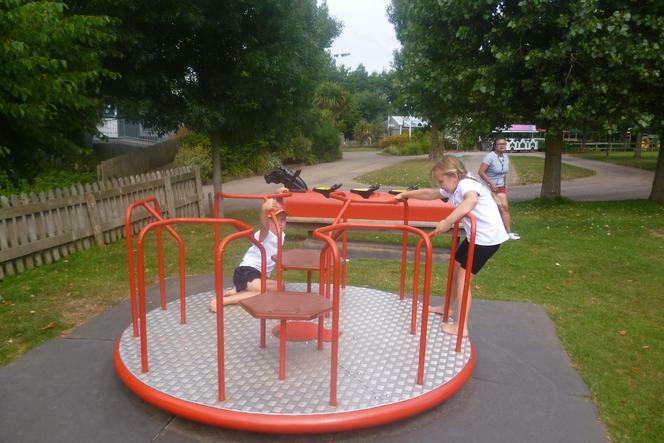 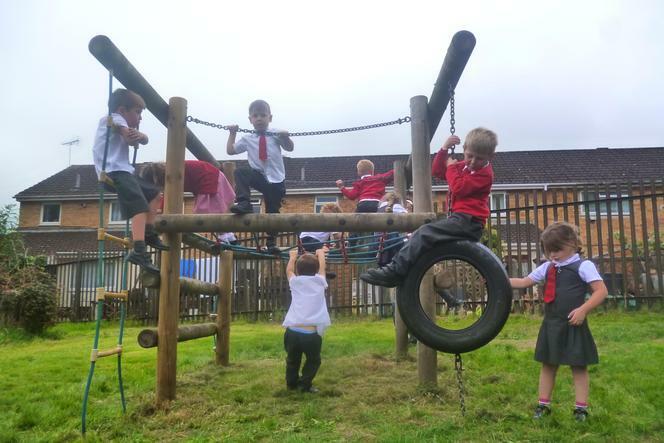 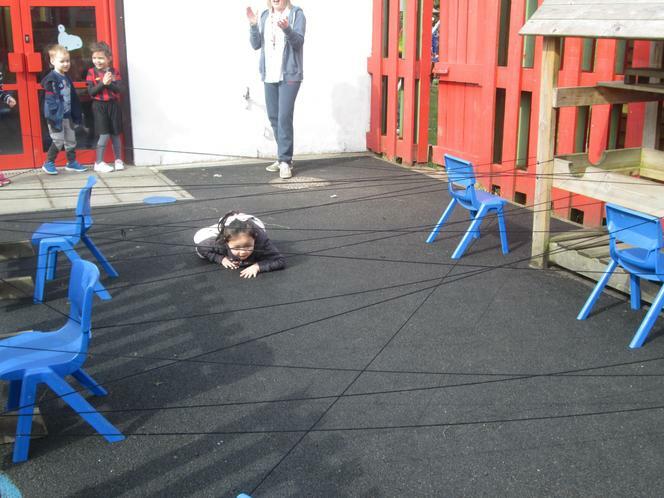 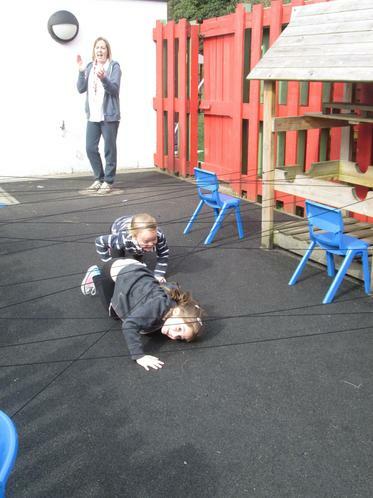 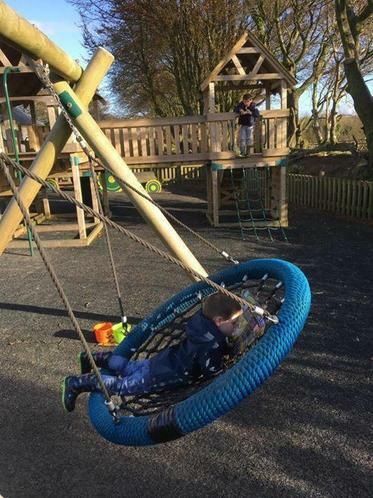 Breaking News - Aliens crash land on our school playground! 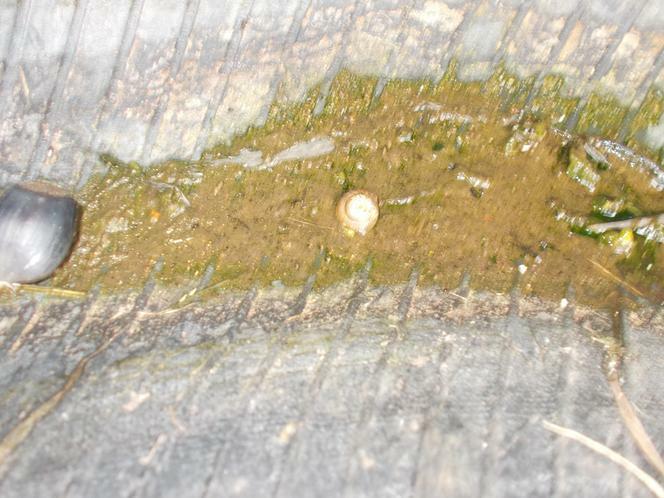 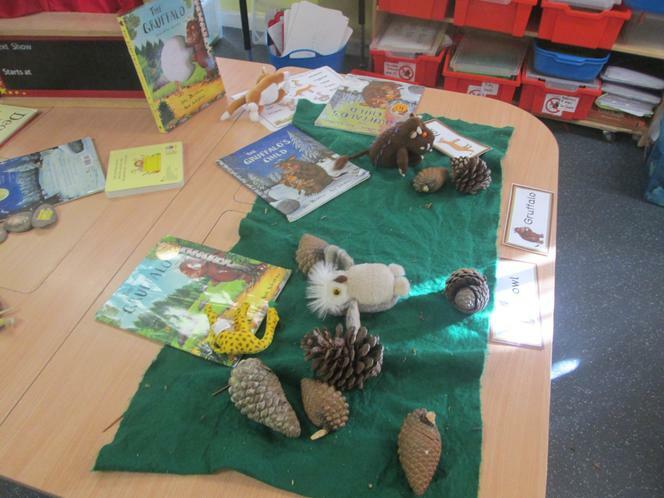 Today was an exciting day for Big Acorns. 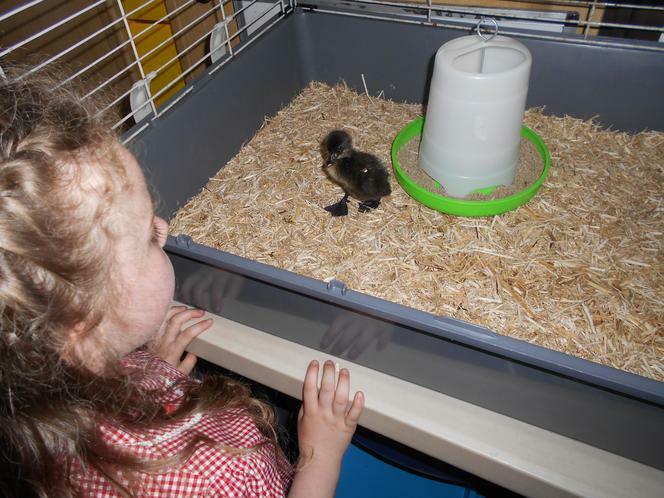 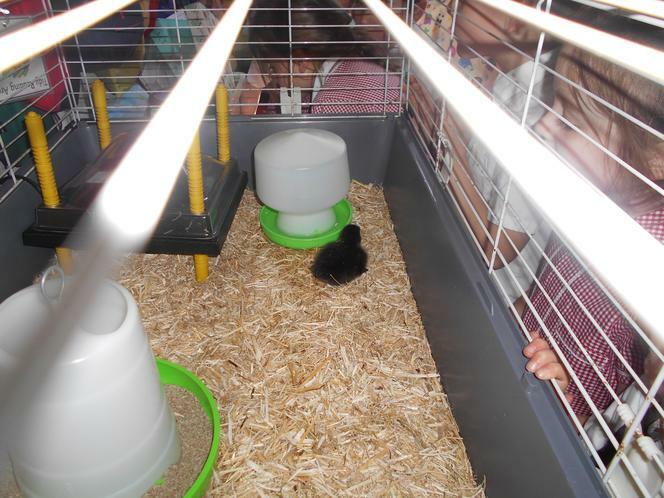 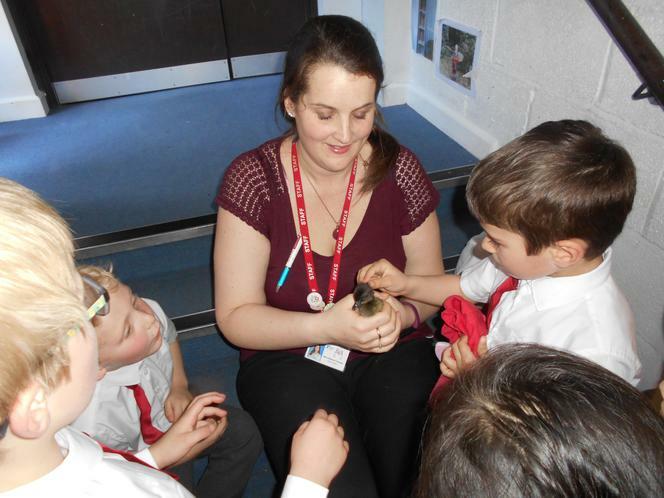 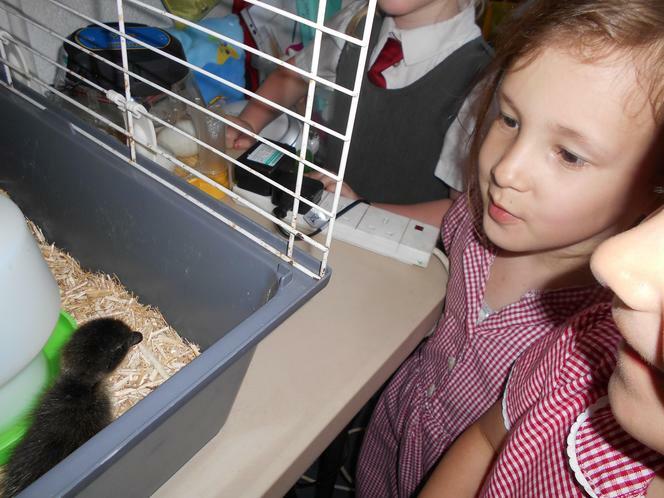 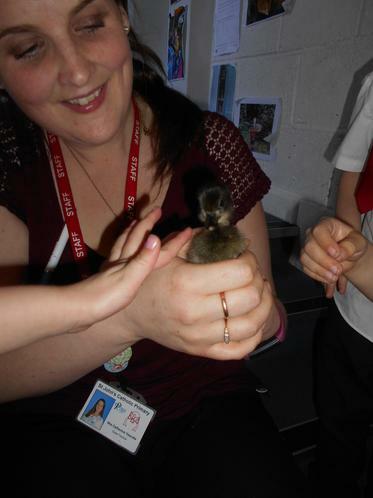 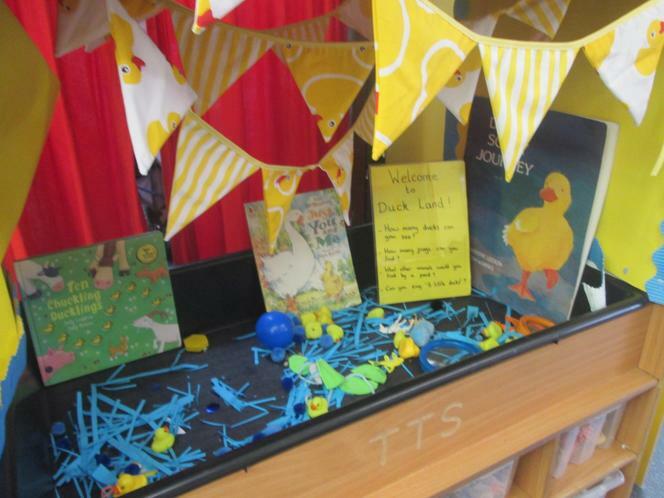 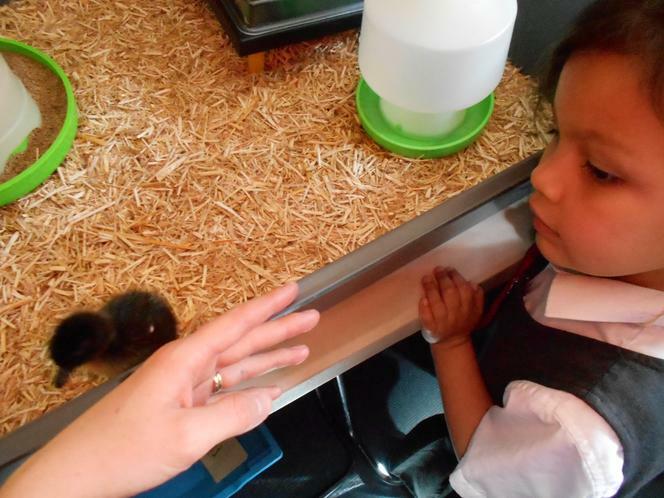 This afternoon we were in charge of the school duck eggs in an incubator and the one duckling that has hatched already called Donald. 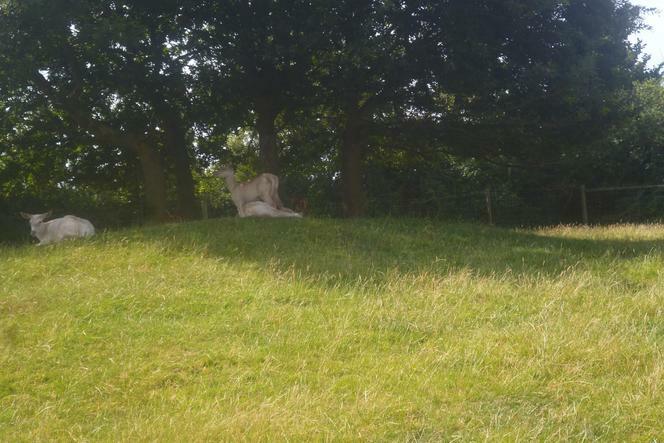 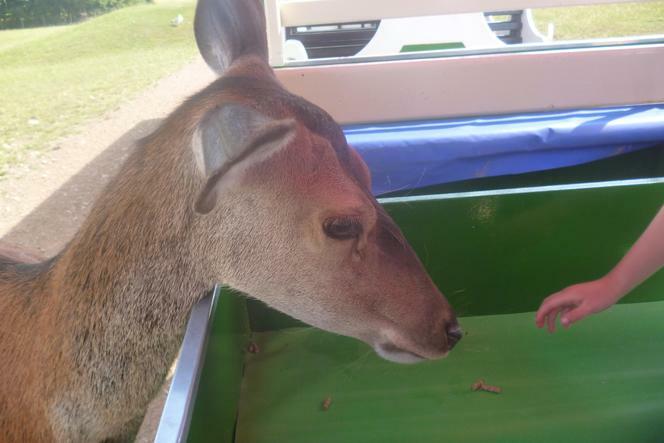 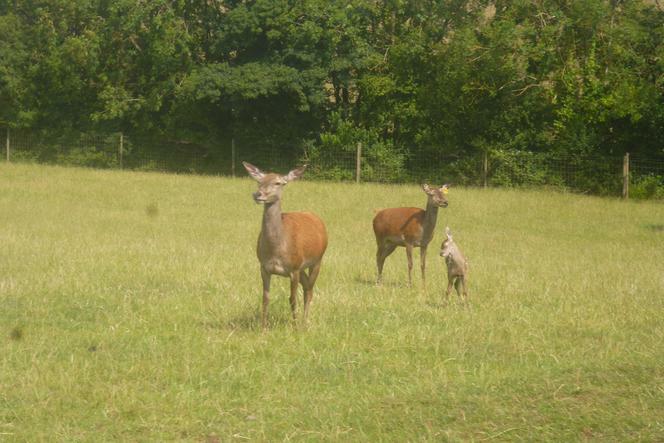 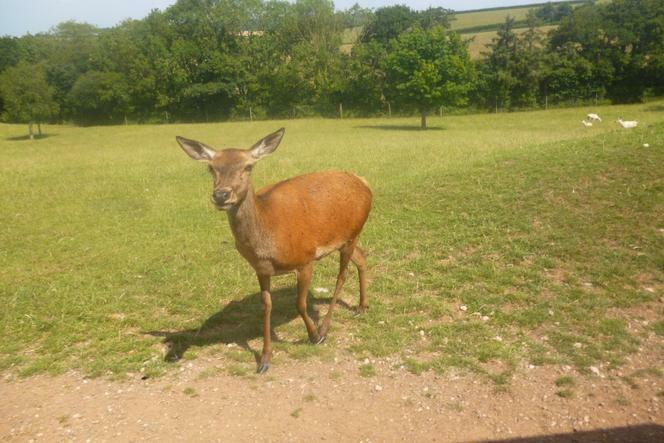 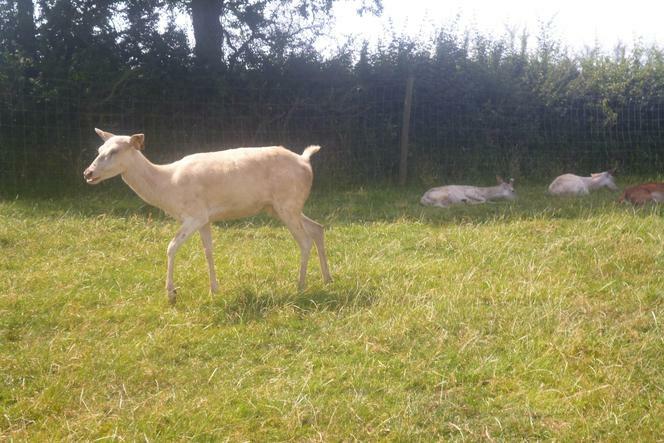 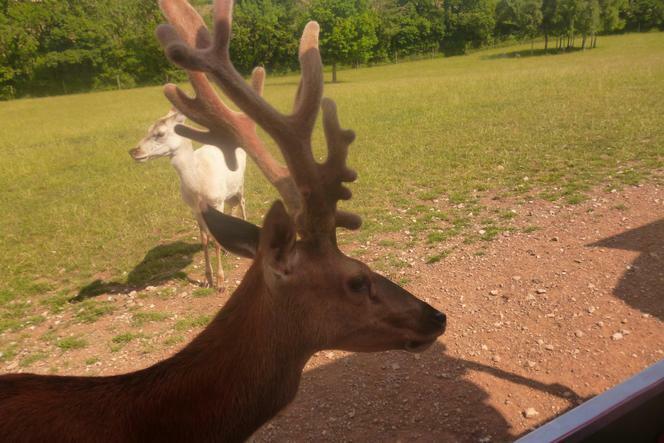 He was a very welcome and cute guest albeit a little noisy! 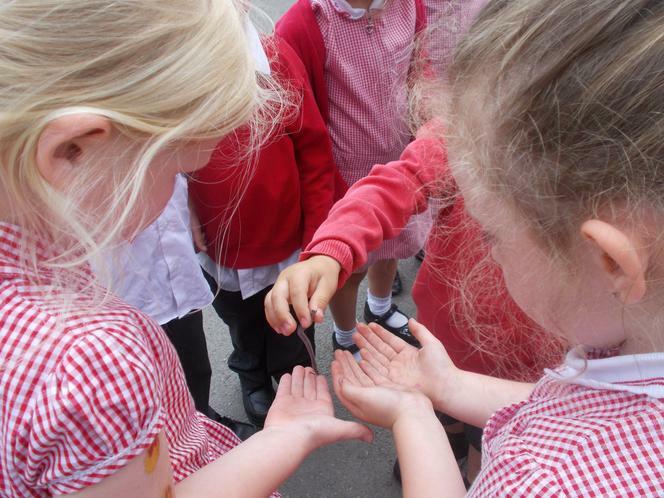 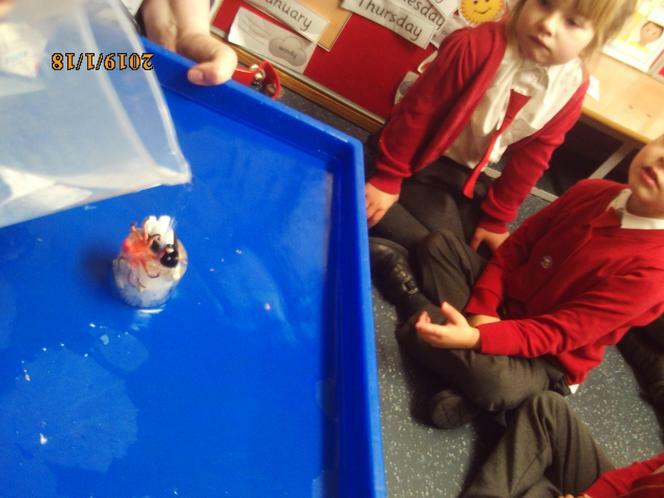 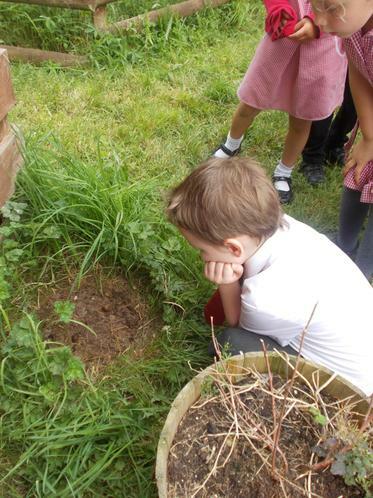 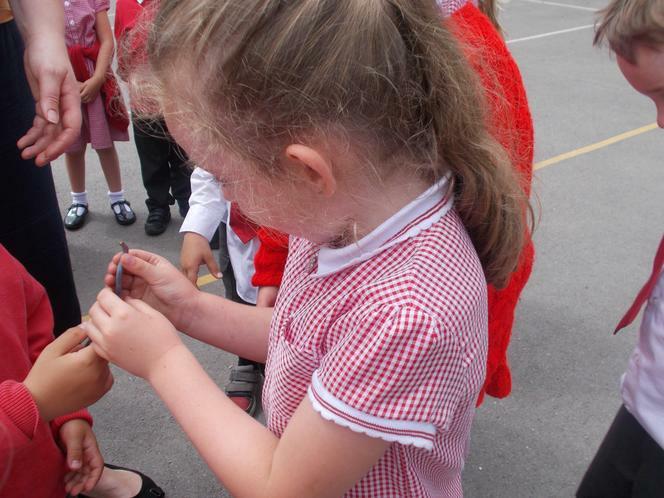 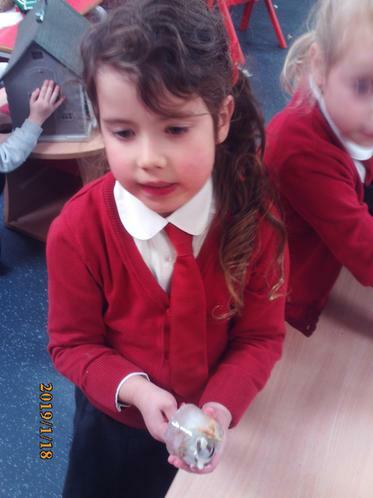 We observed the eggs and noticed some cracks but unfortunately no more hatched whilst we were looking after them. 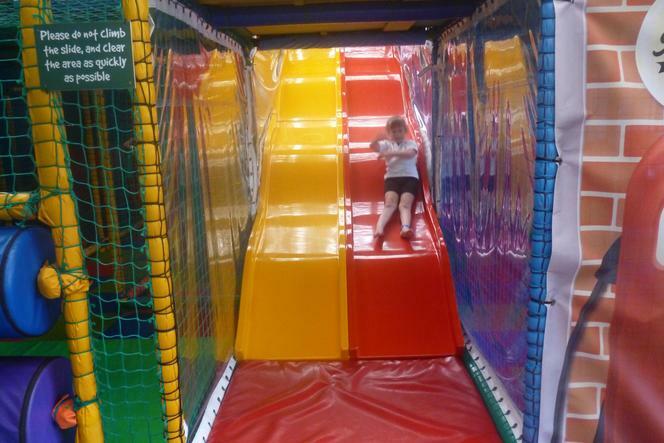 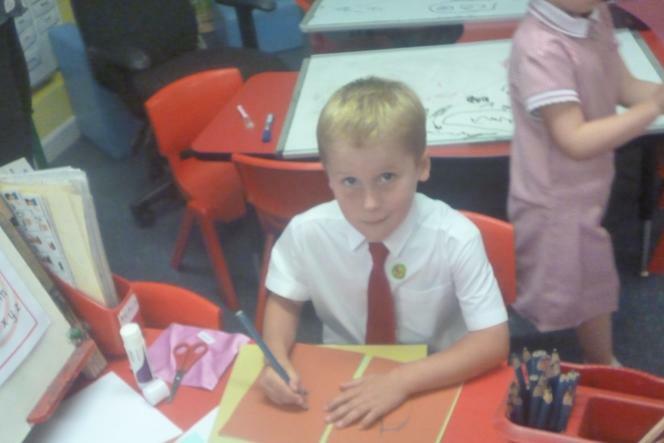 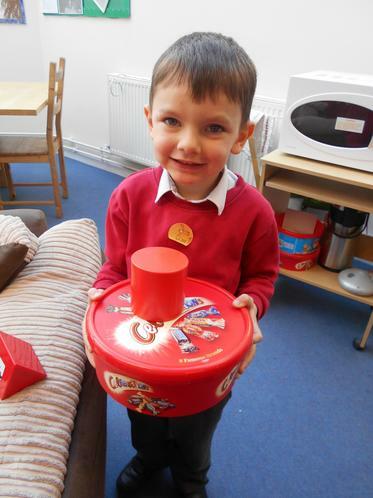 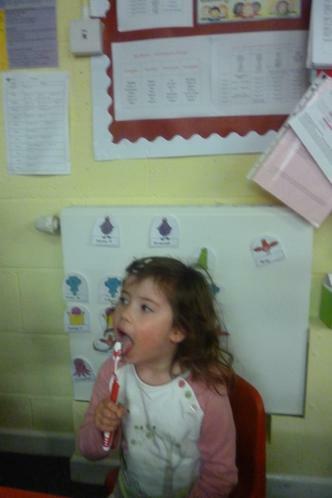 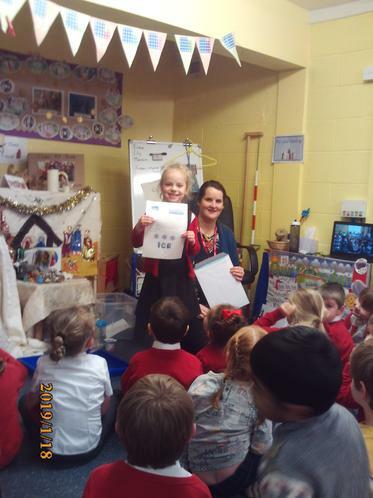 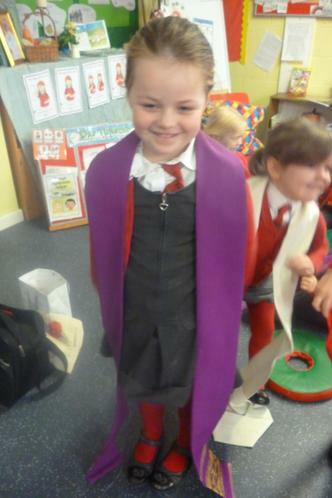 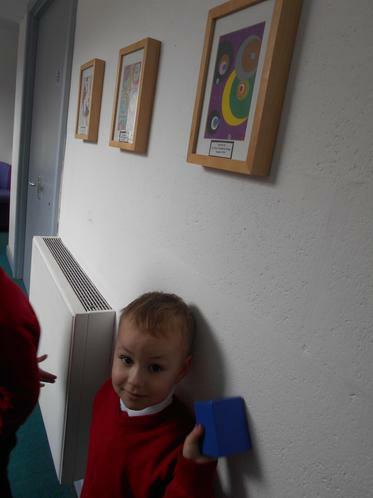 We also had our class reward for excellent whole class behaviour. 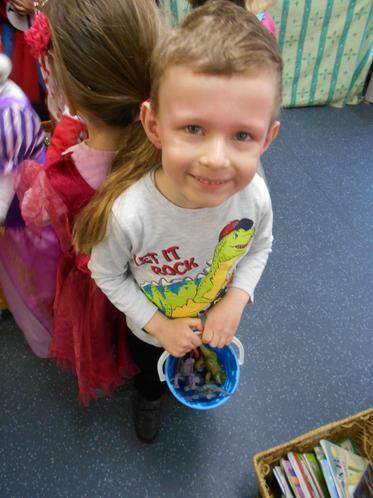 Just before the Easter holiday Big Acorn's managed to fill the pom pom behaviour jar and they voted on what treat they would like choosing a film and some popcorn. 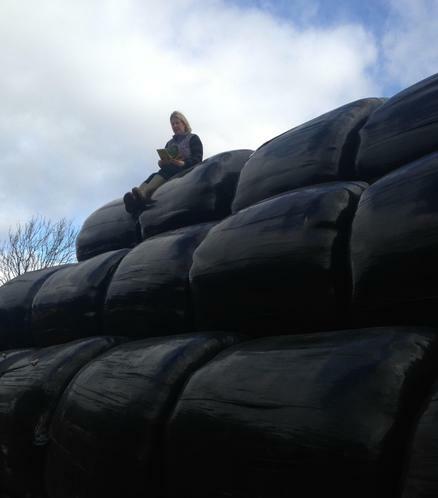 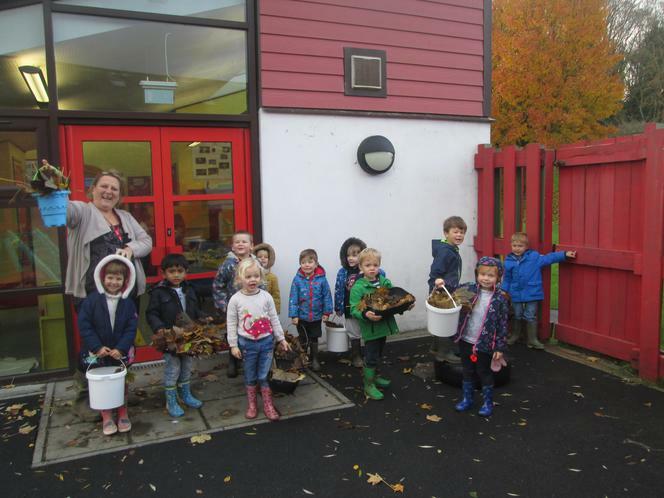 Well done big Acorn's and keep it up! 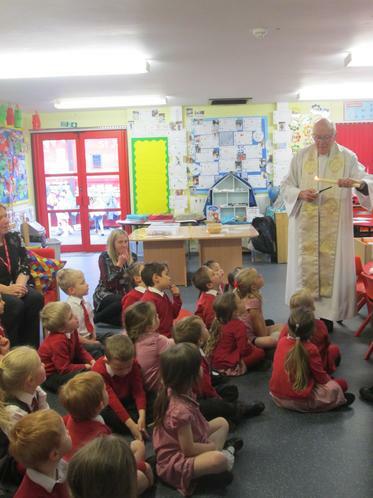 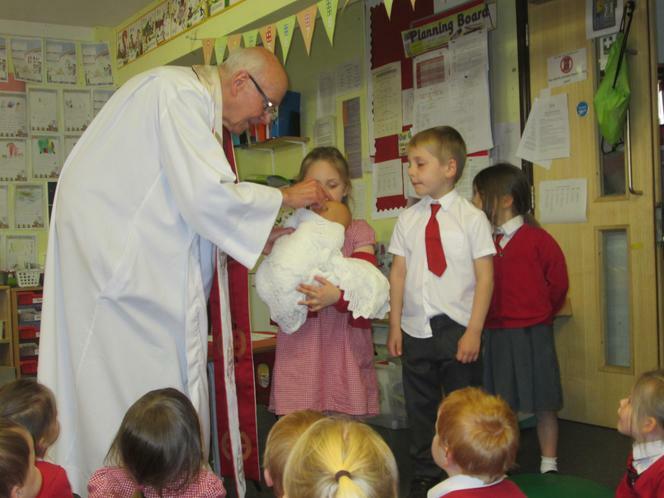 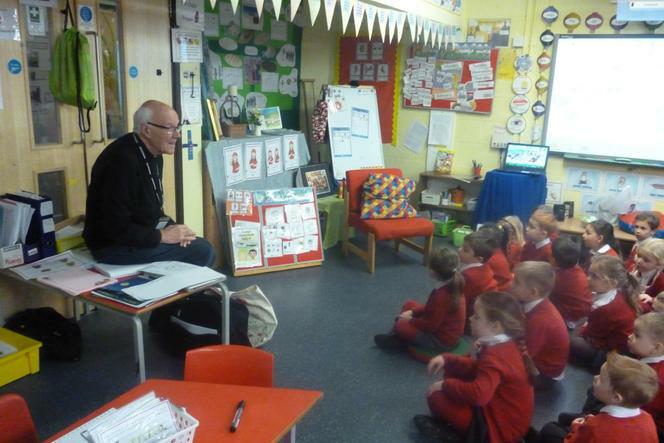 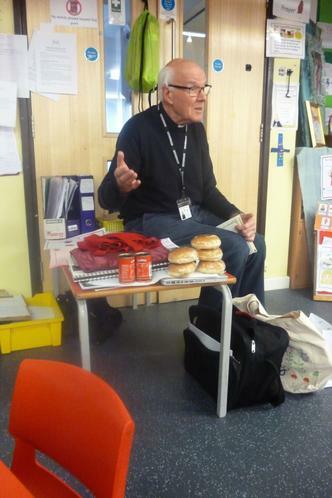 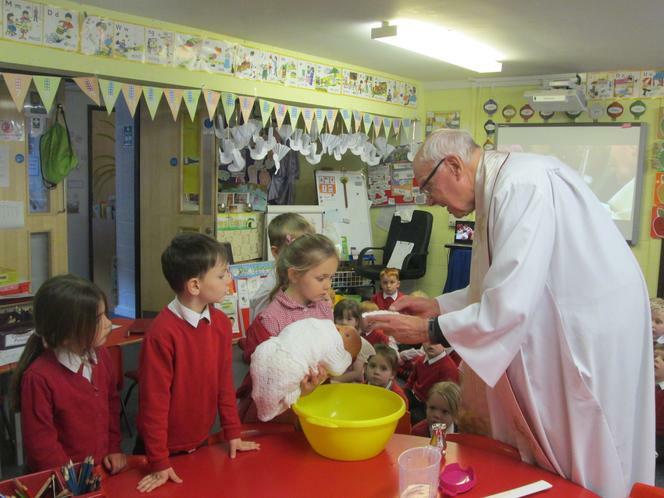 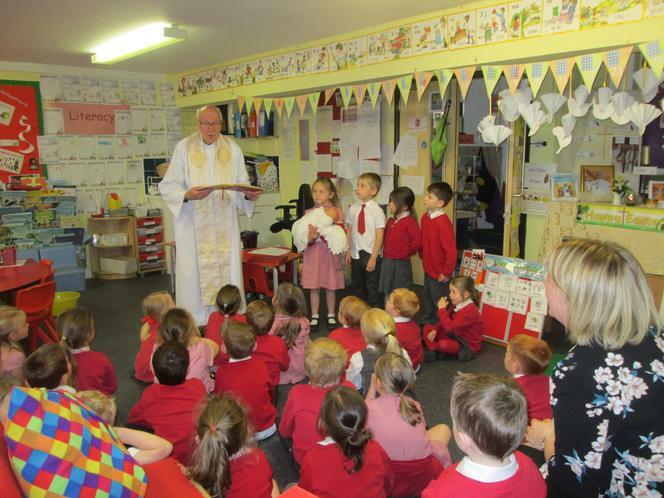 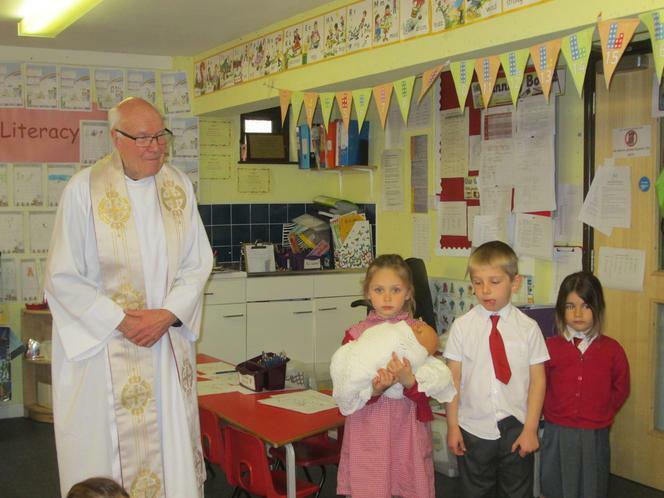 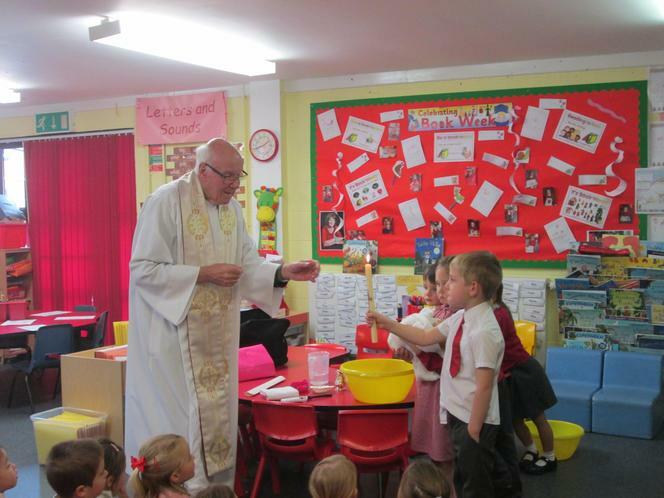 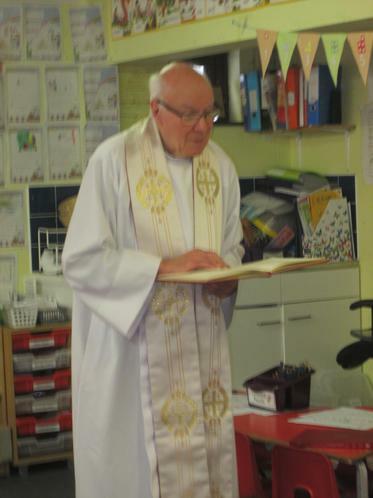 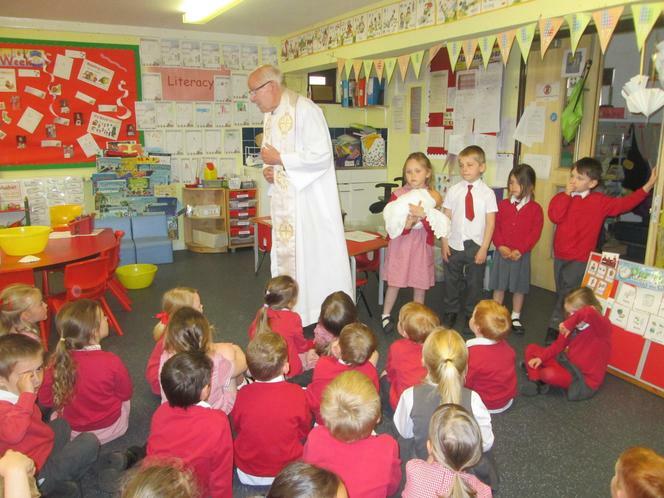 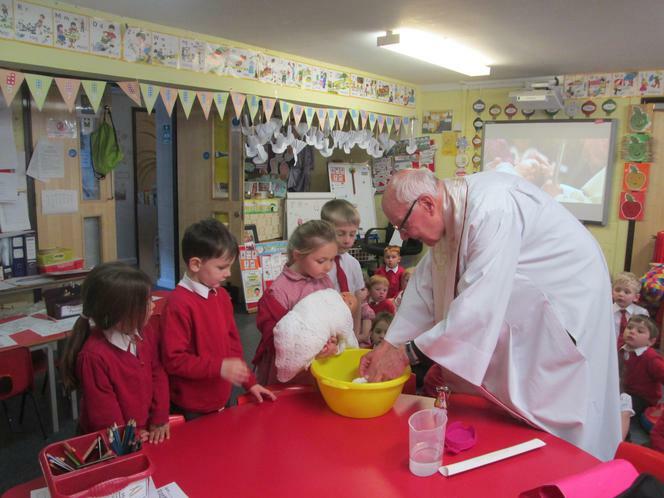 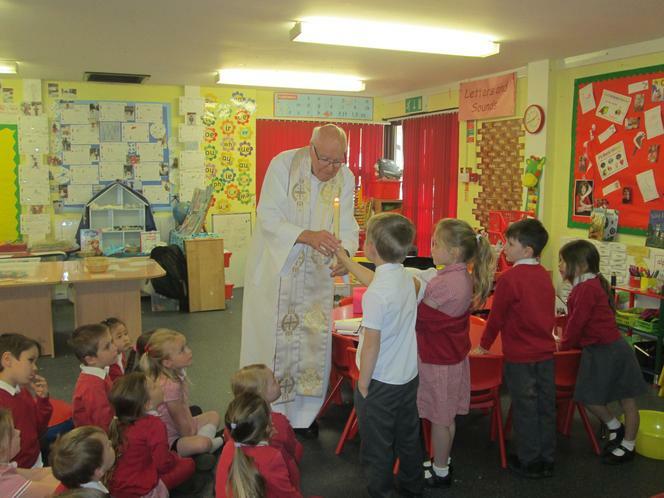 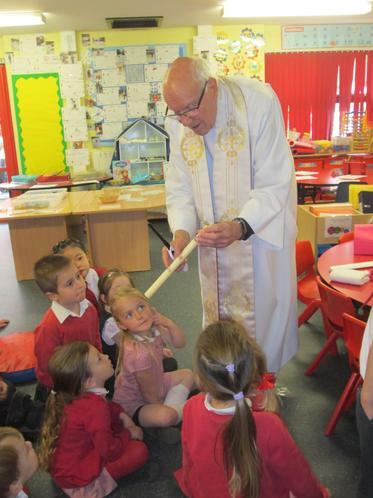 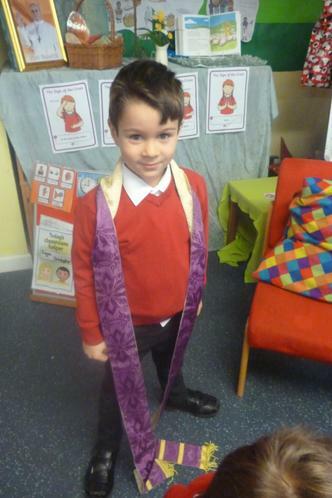 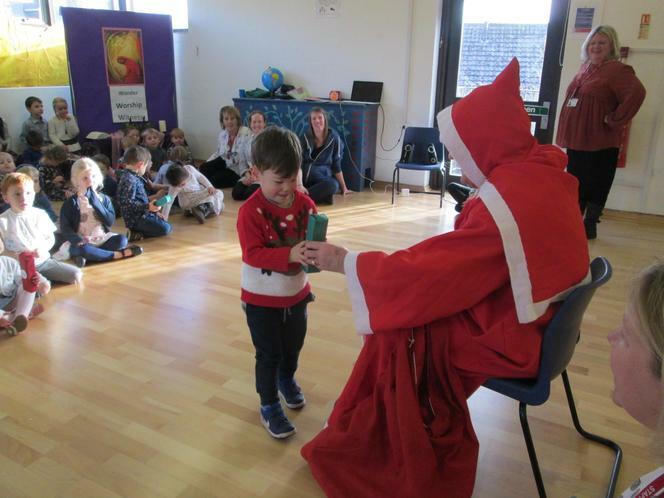 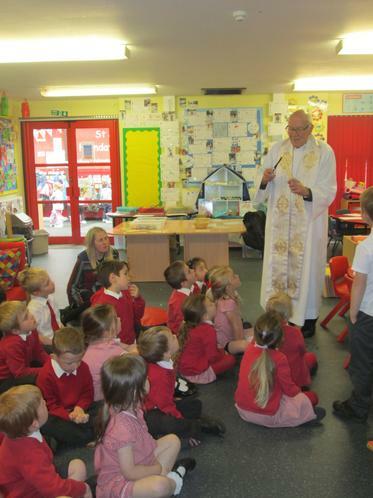 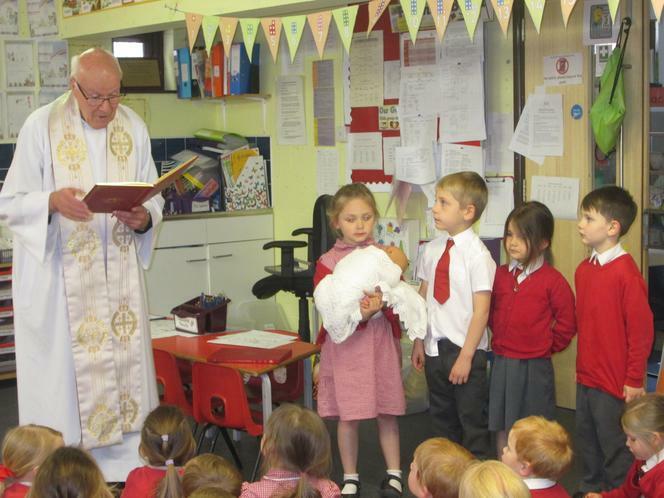 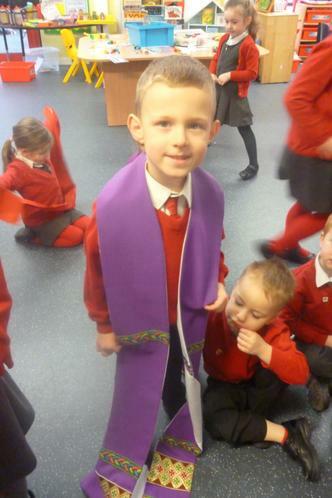 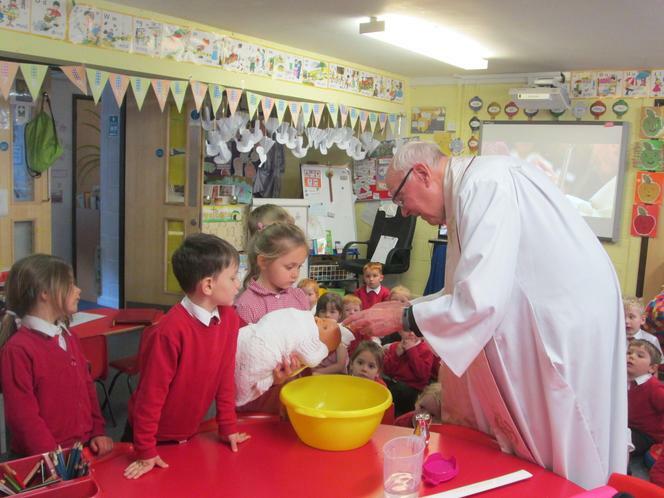 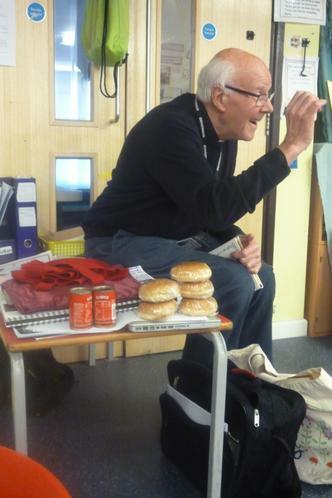 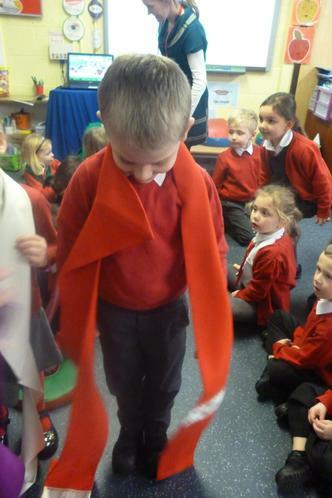 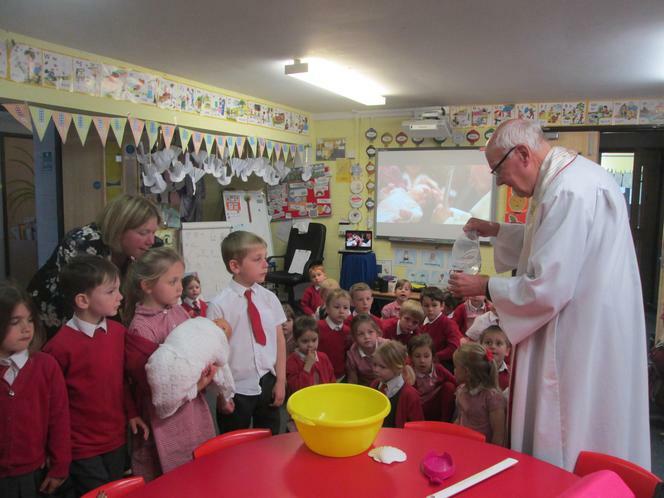 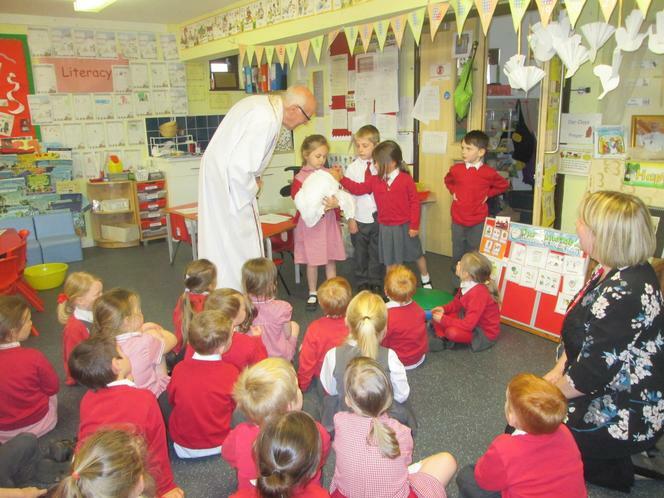 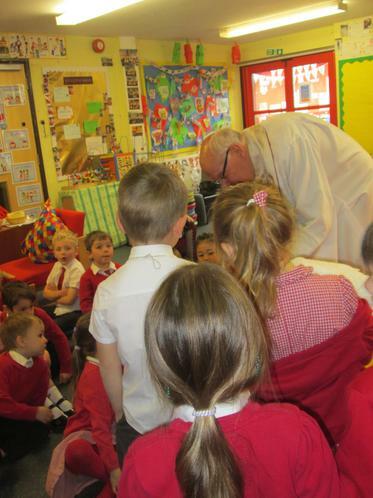 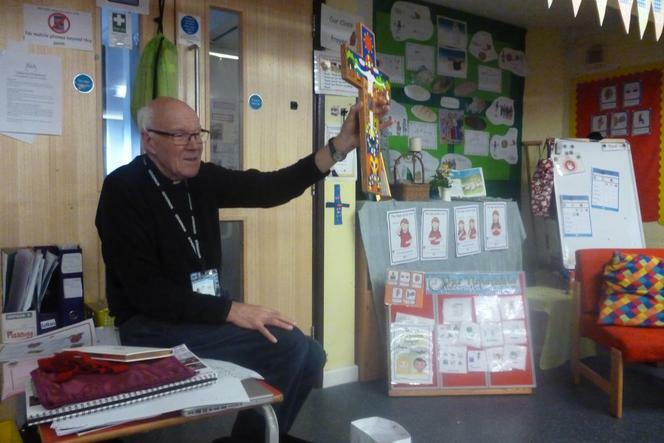 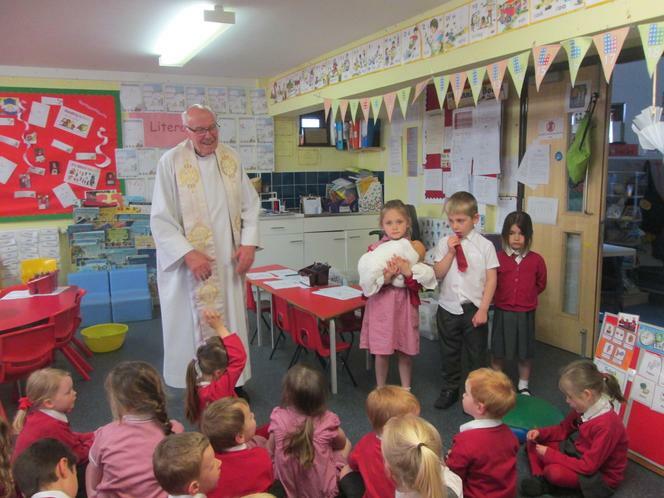 Big Acorns had a visit from Father Paul to learn about the role of the Parish Priest. 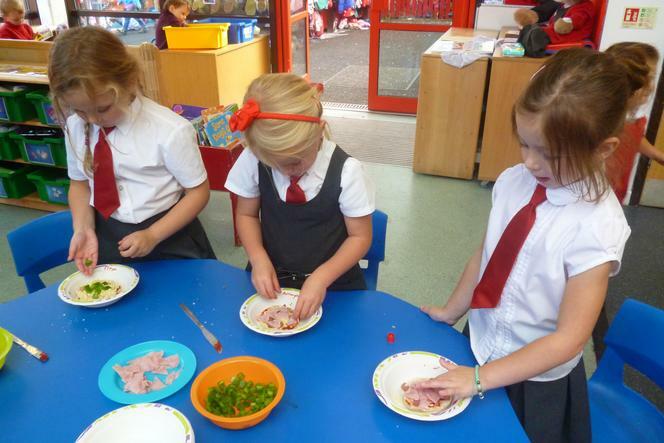 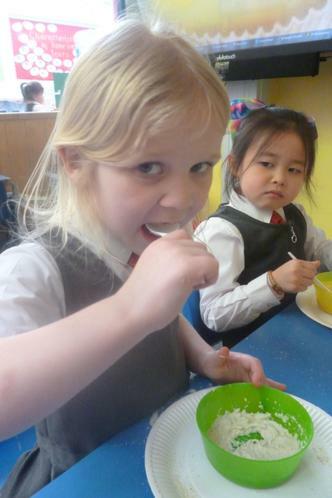 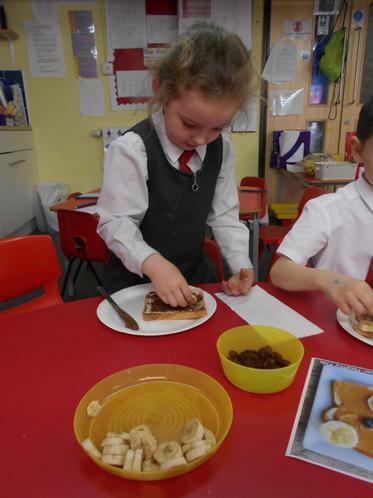 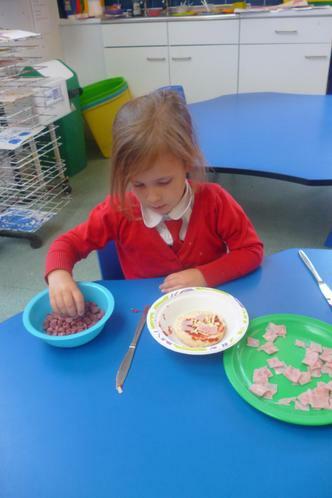 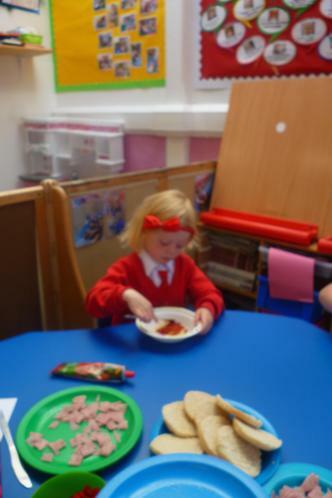 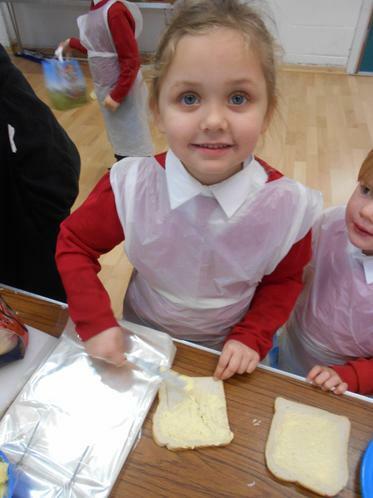 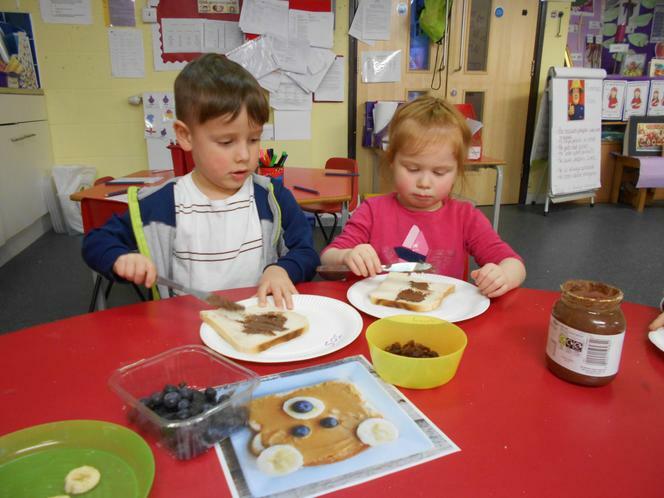 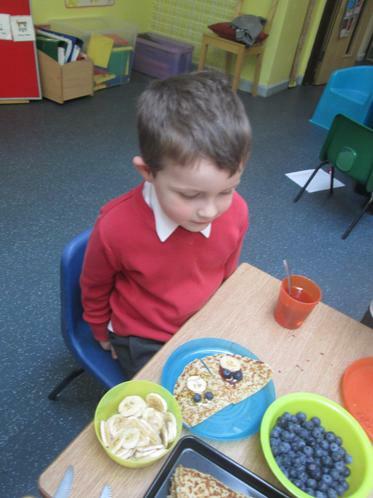 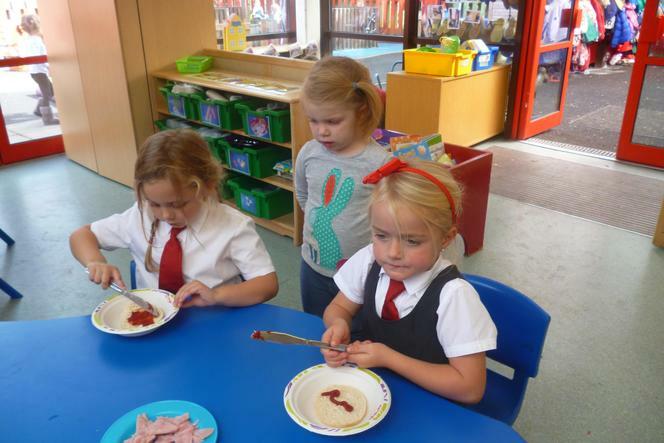 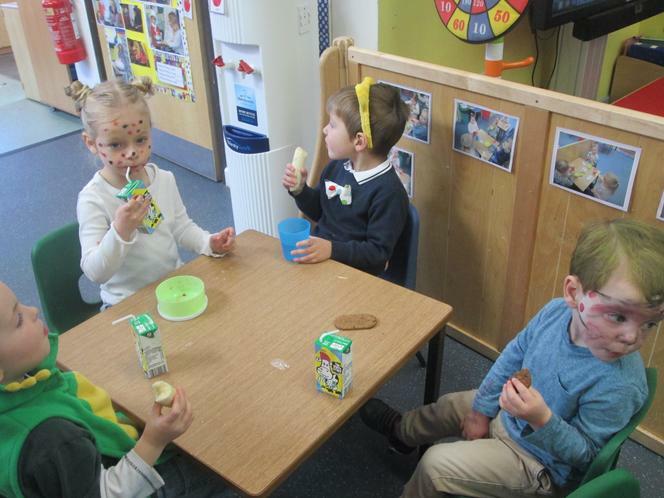 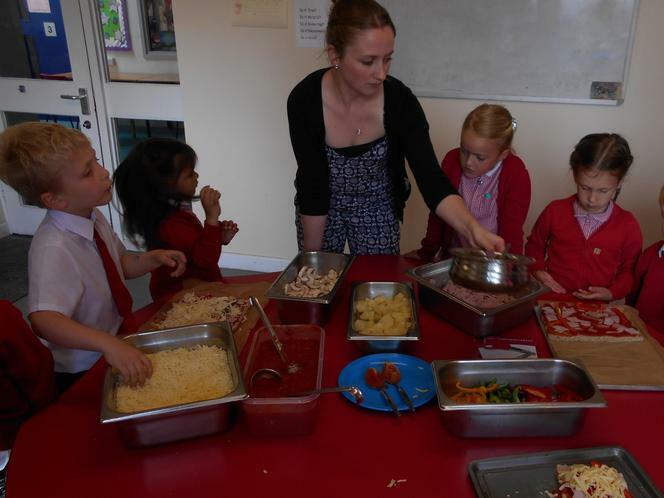 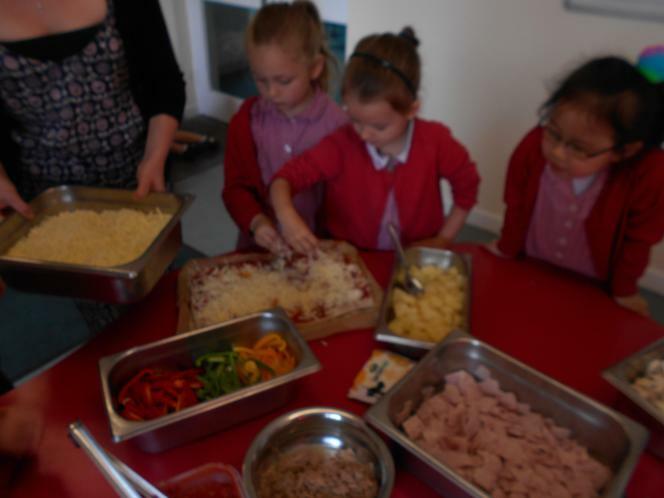 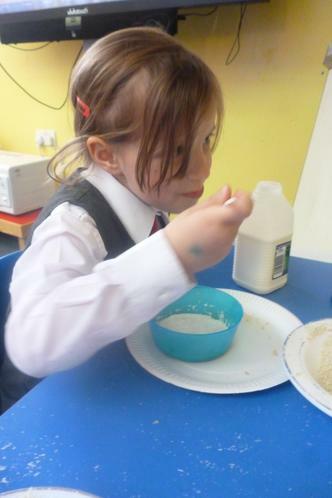 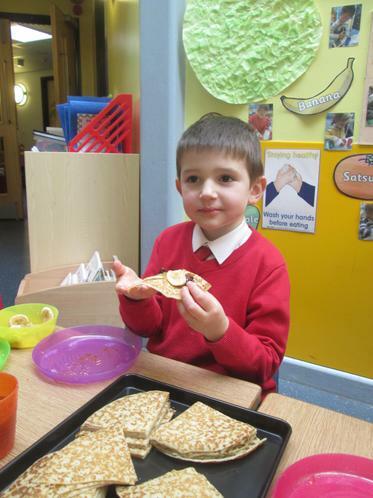 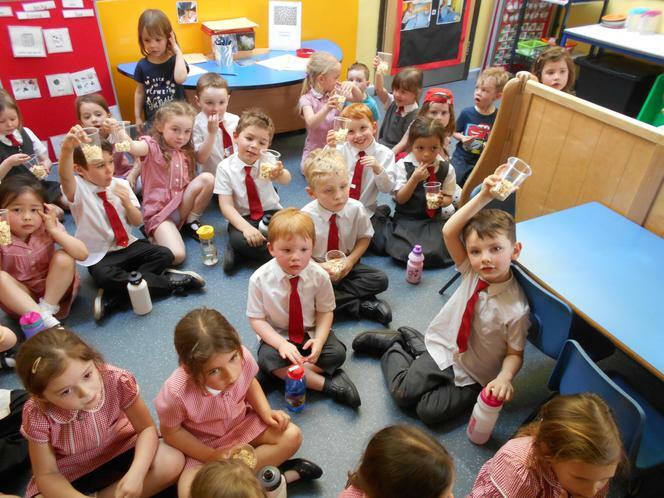 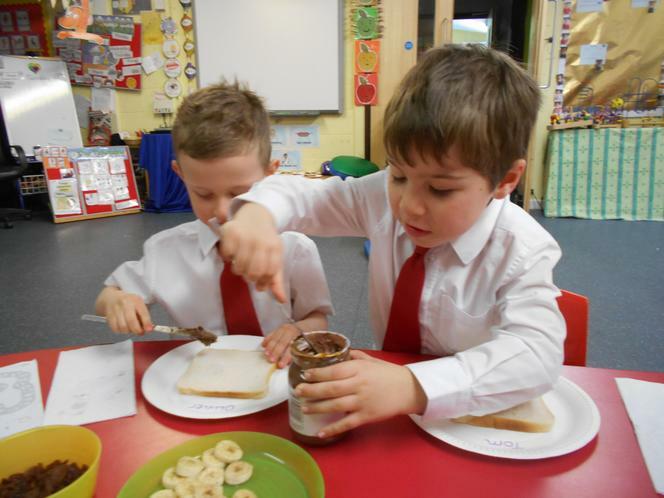 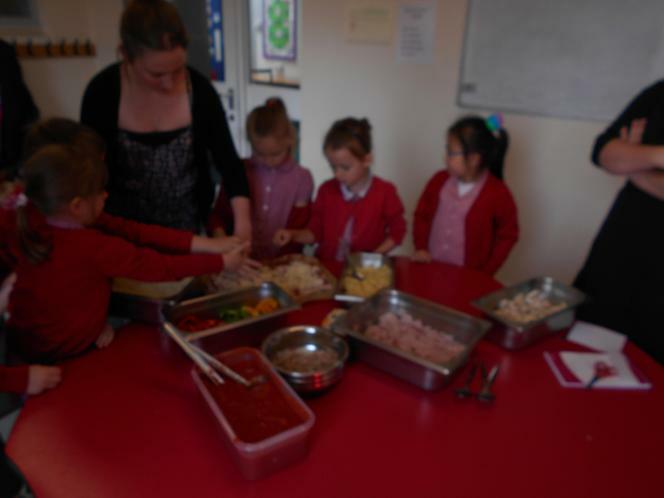 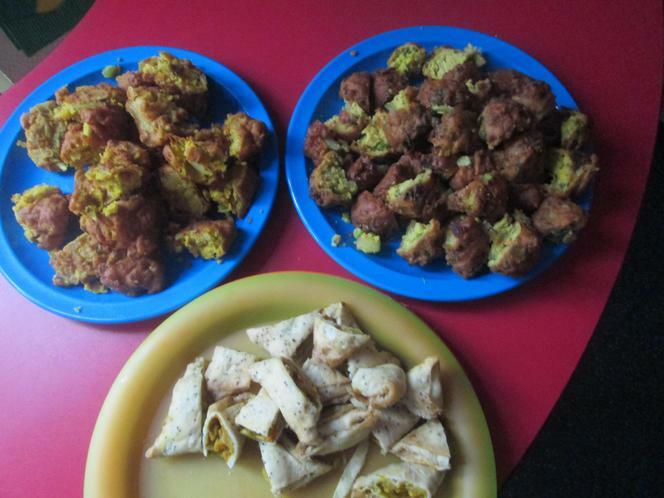 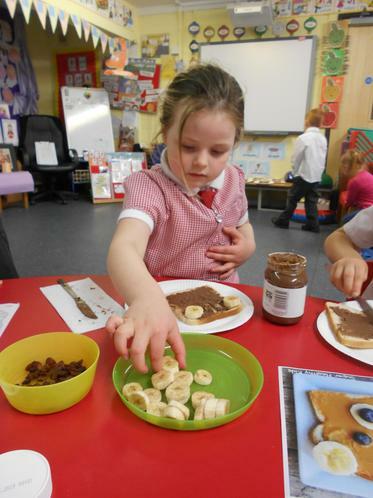 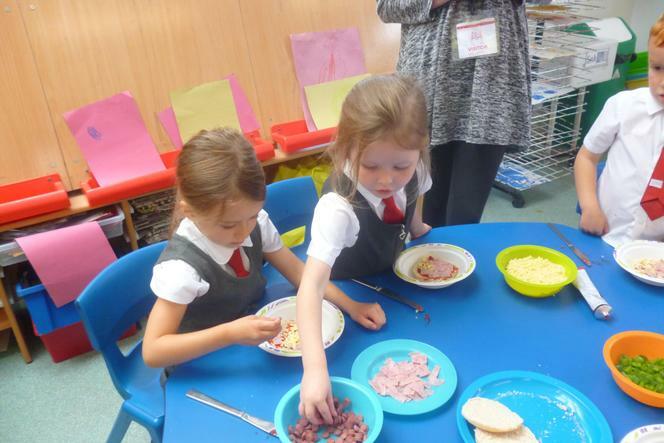 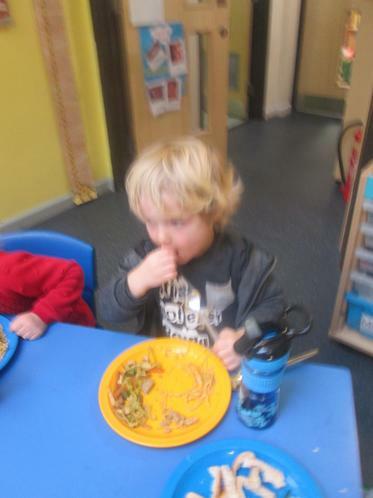 Big Acorns enjoyed making their own packed lunches this week. 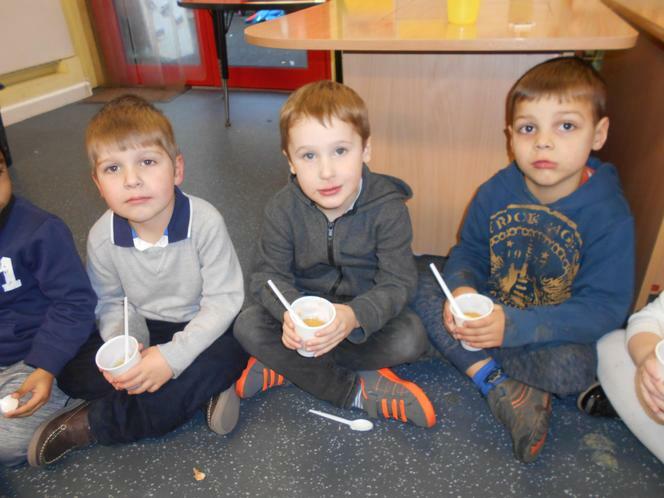 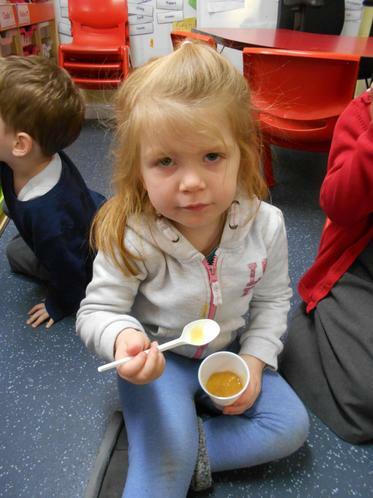 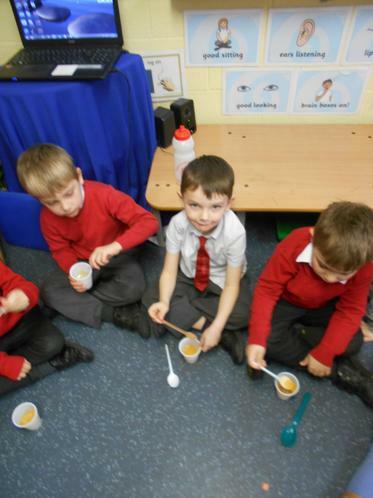 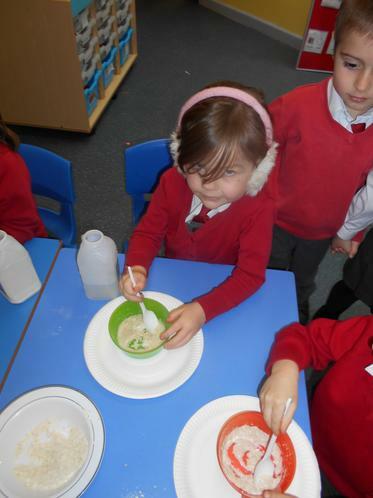 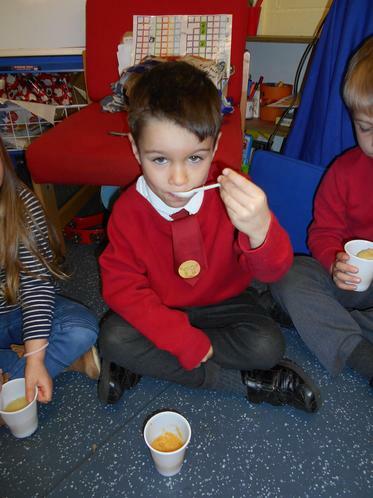 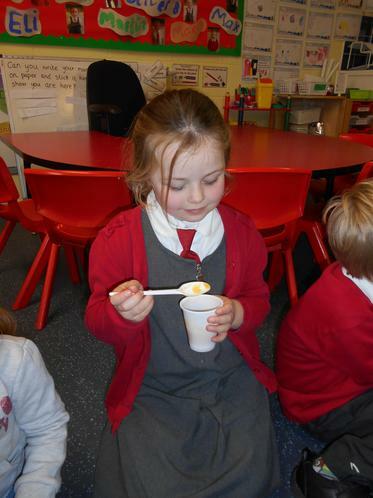 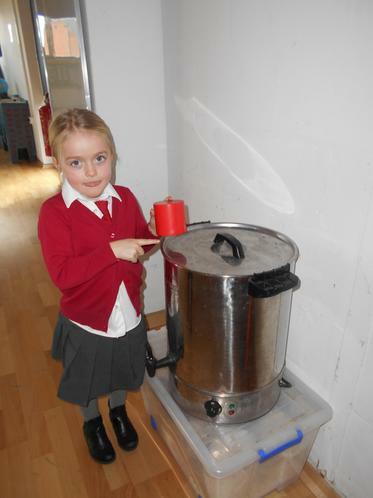 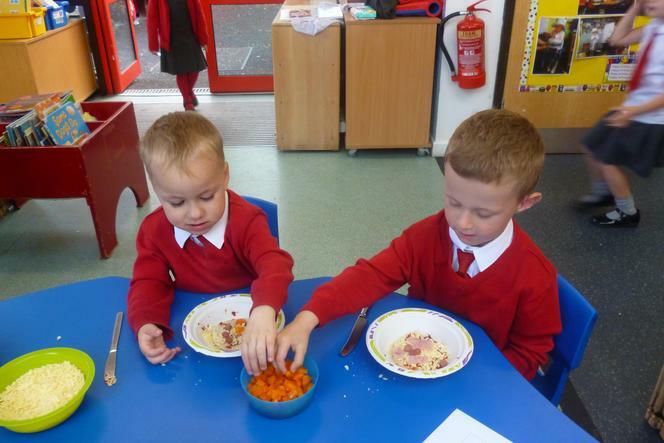 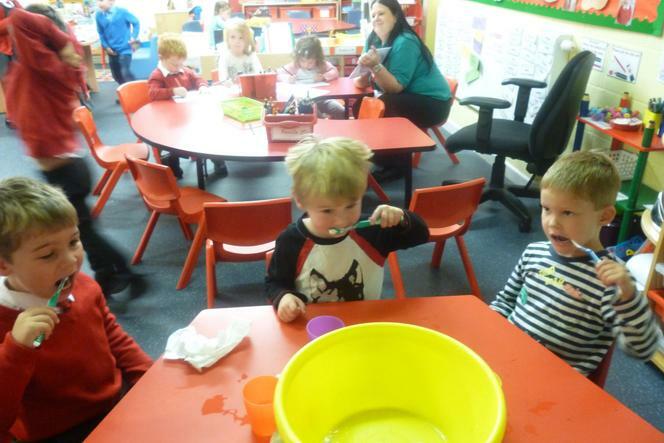 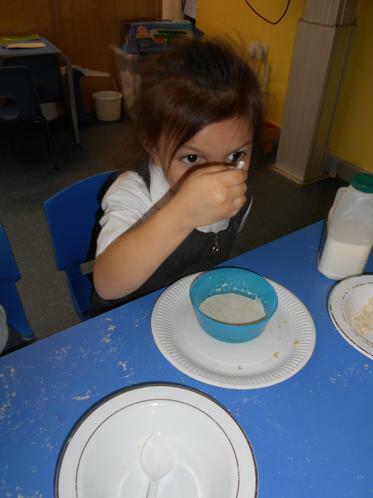 They also made and tasted vegetable soup. 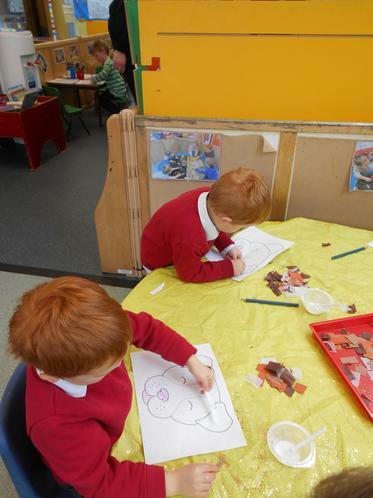 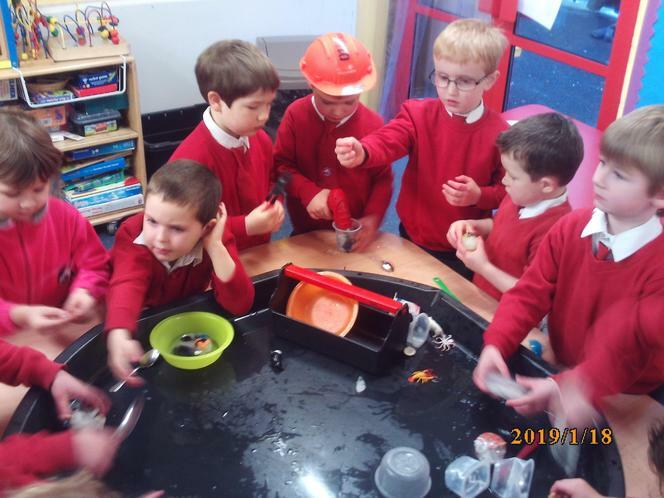 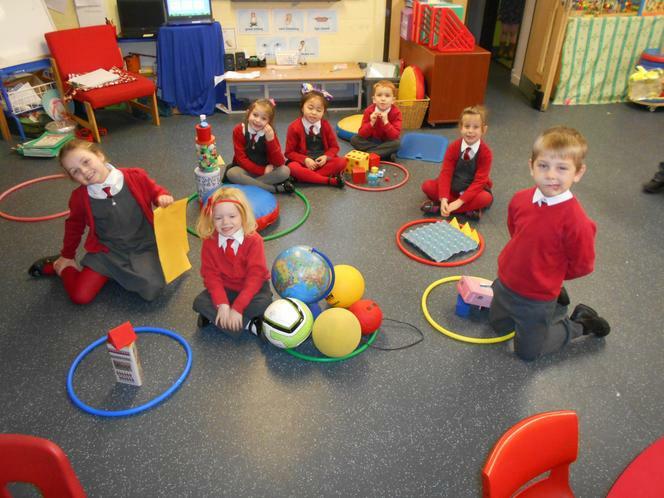 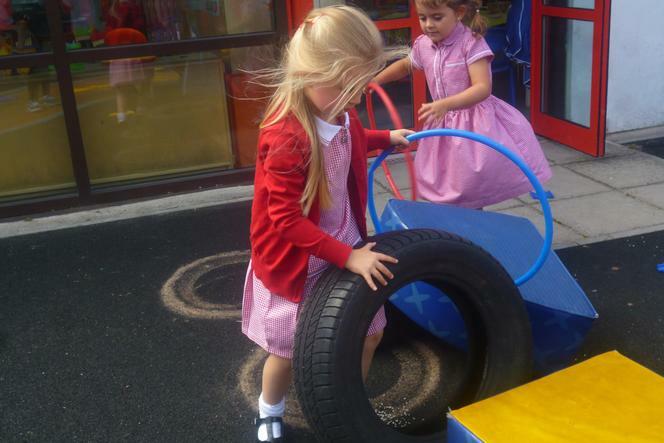 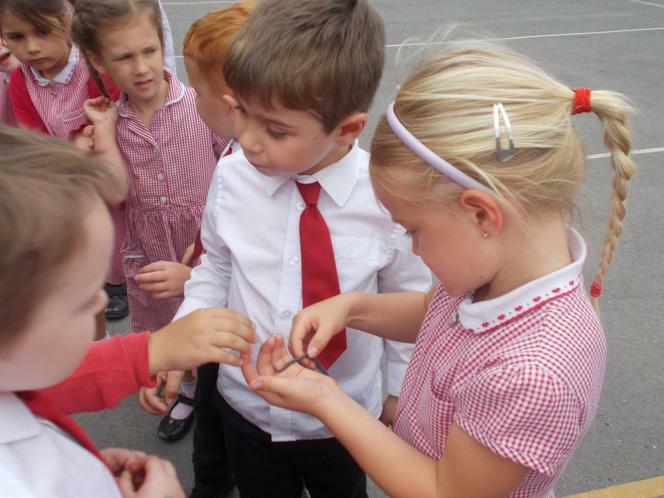 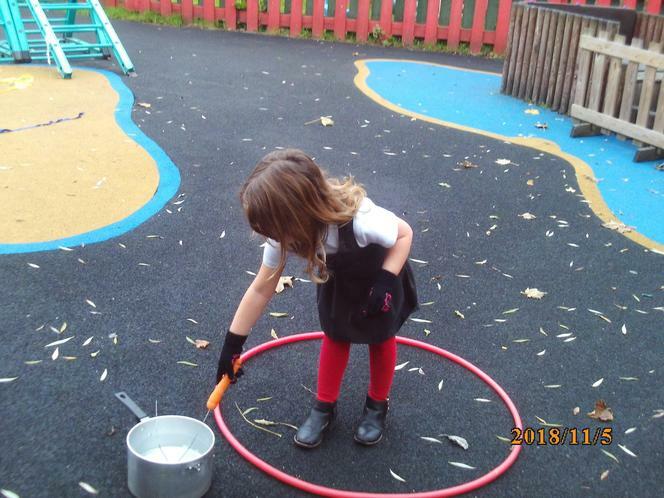 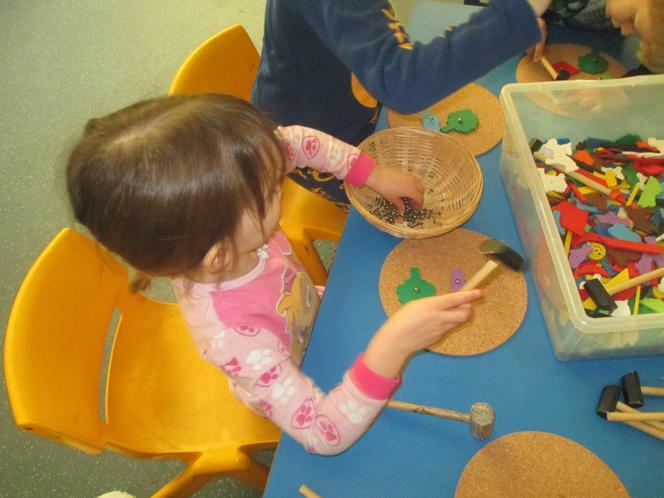 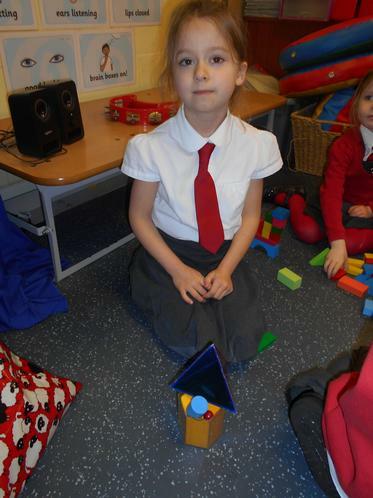 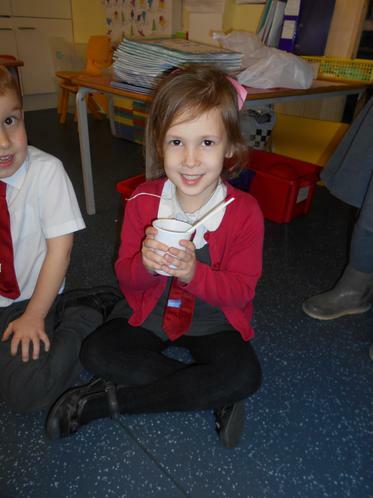 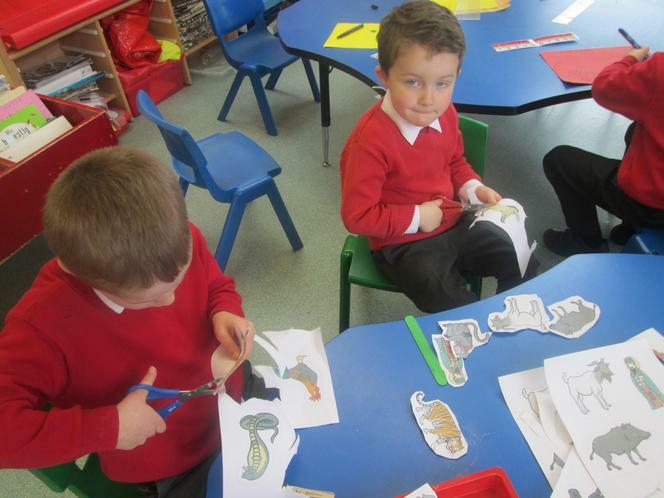 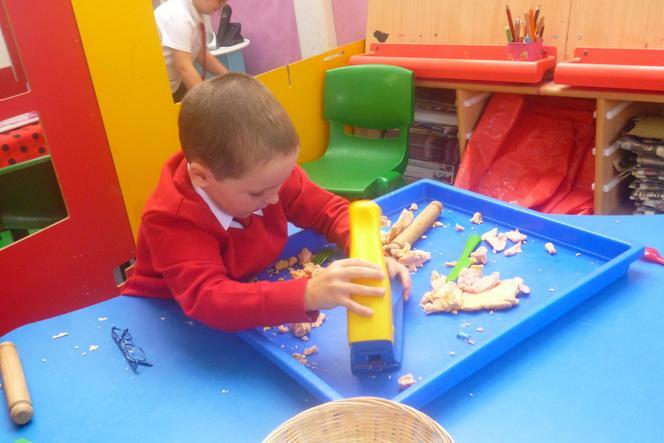 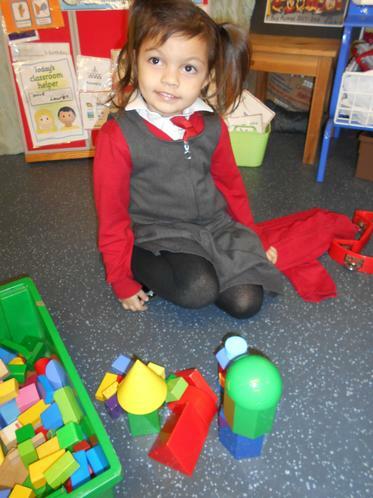 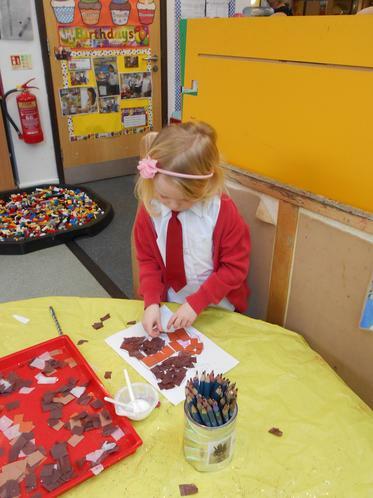 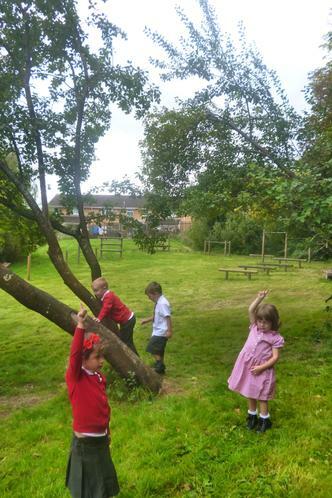 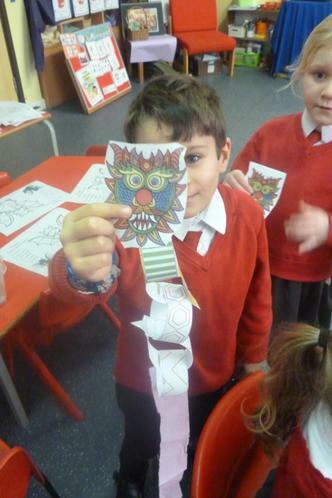 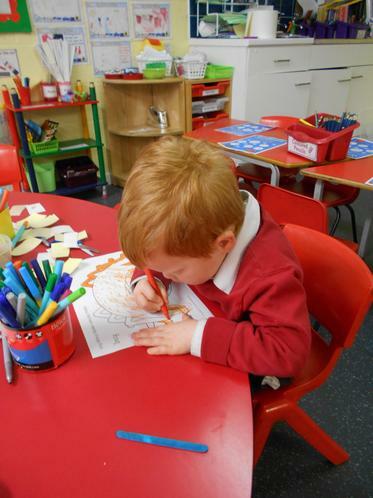 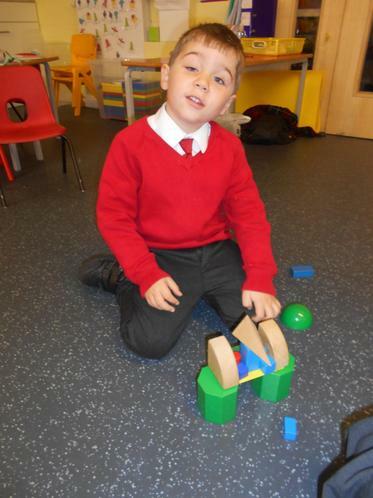 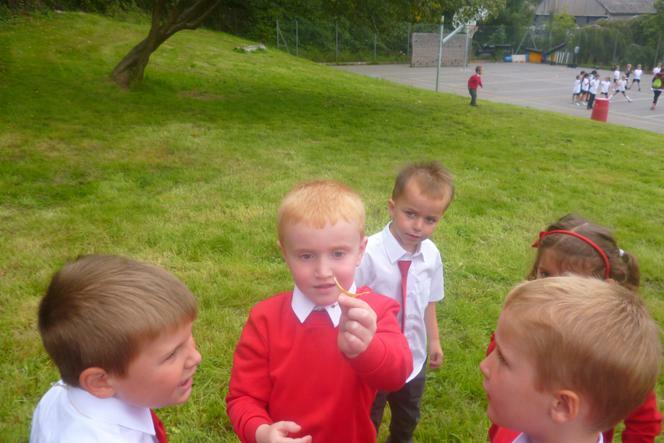 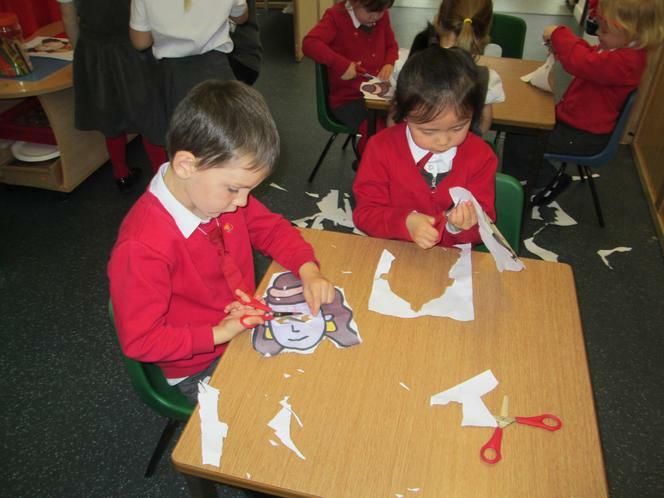 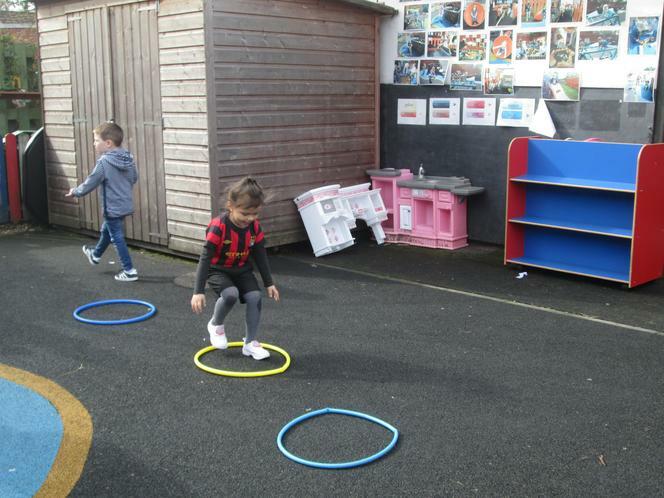 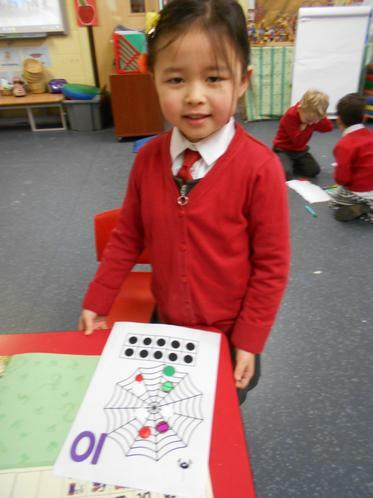 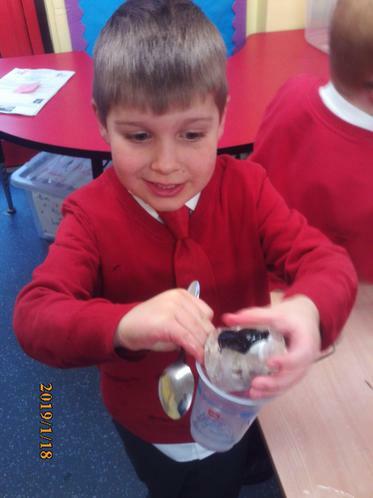 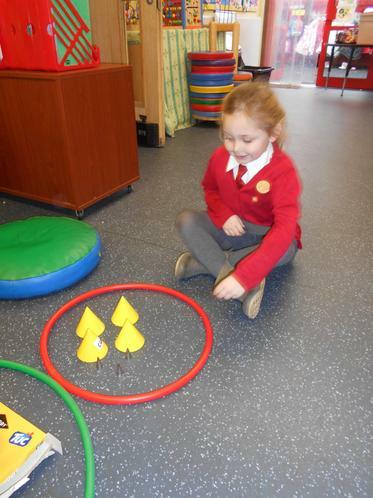 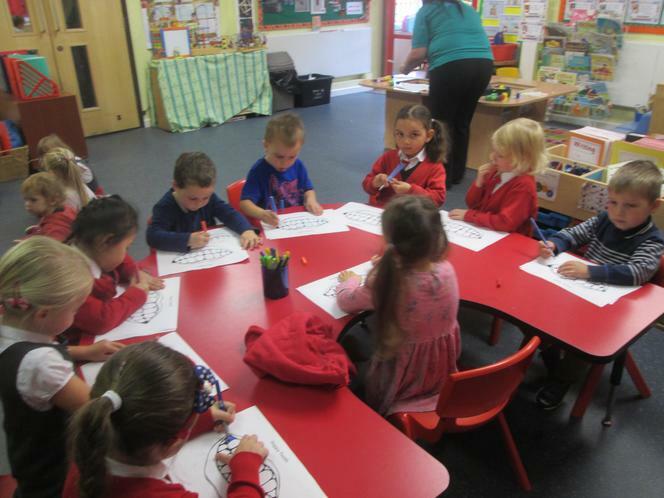 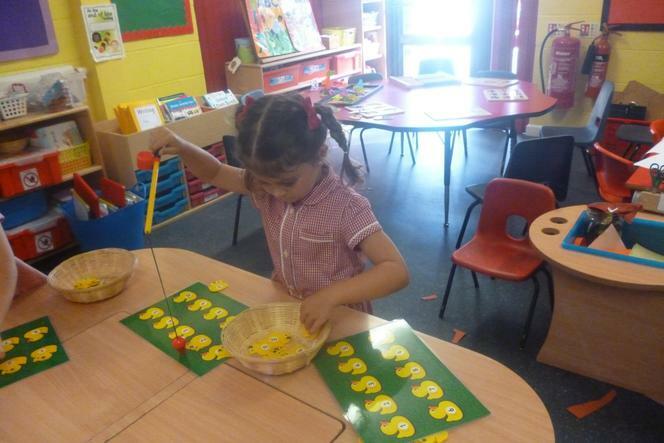 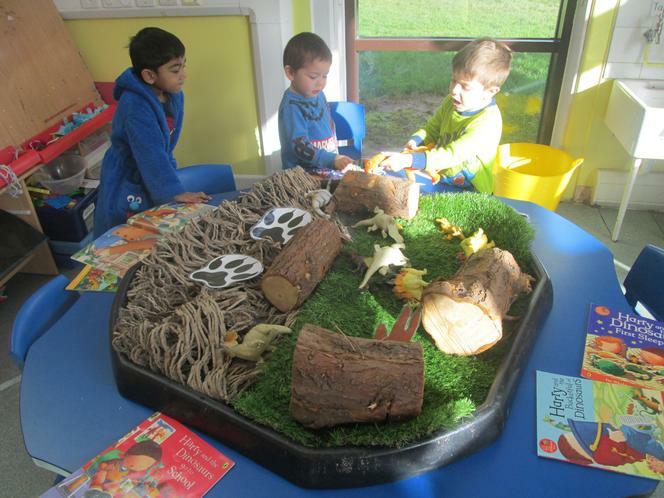 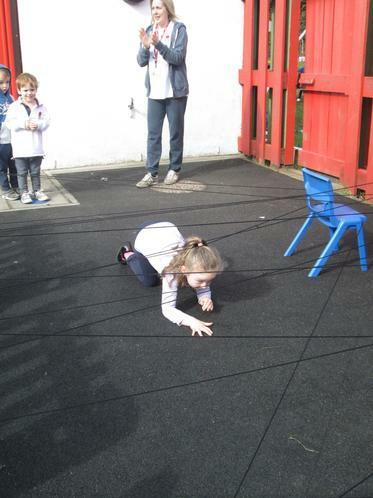 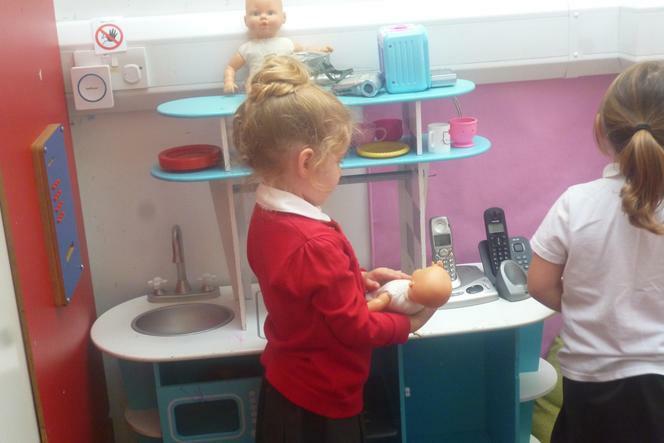 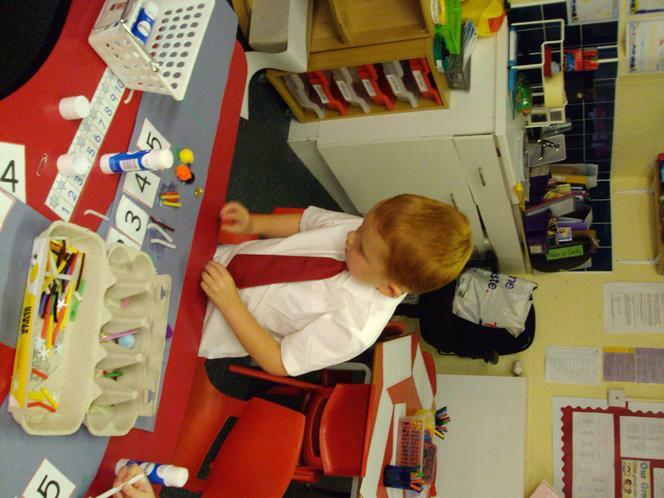 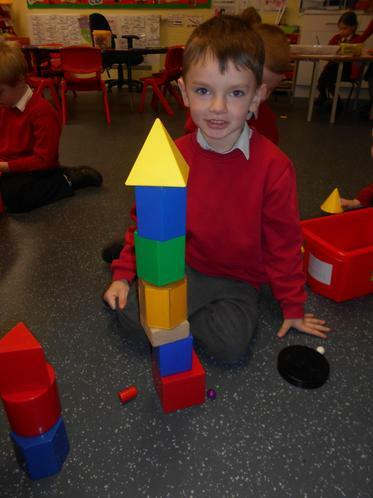 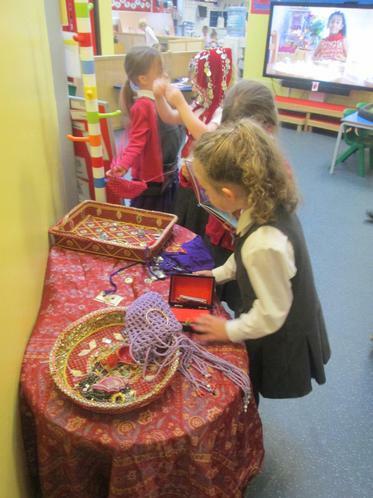 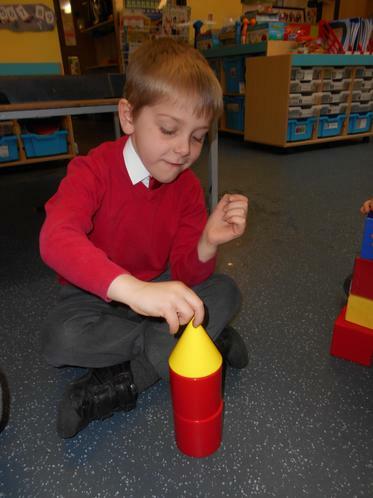 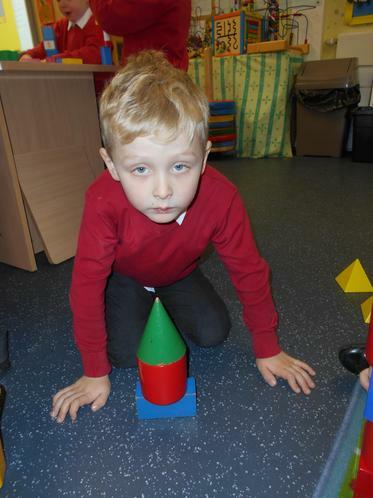 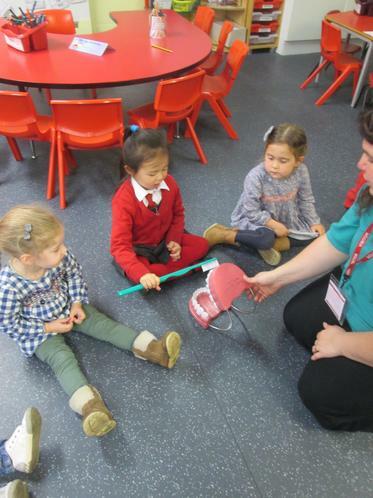 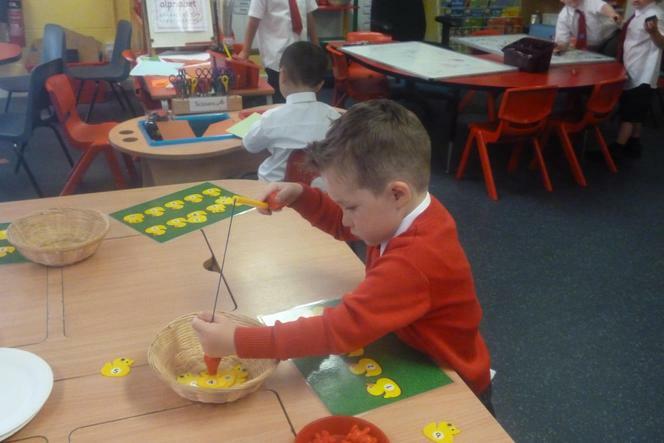 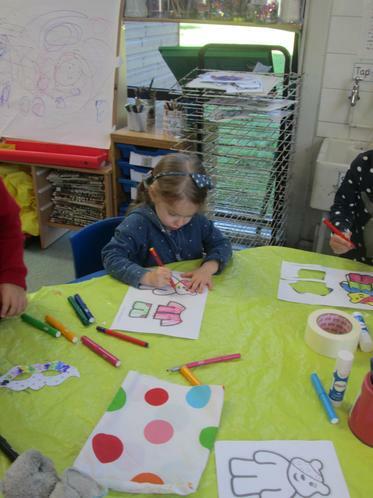 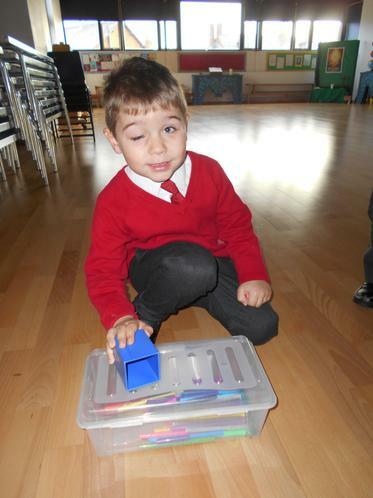 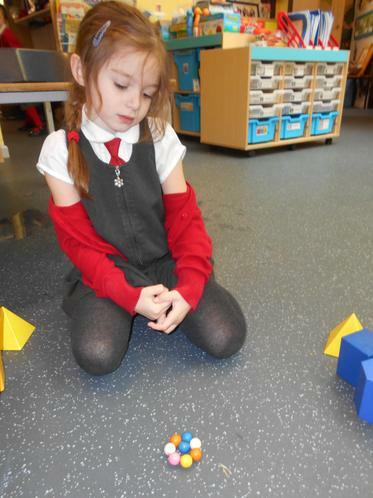 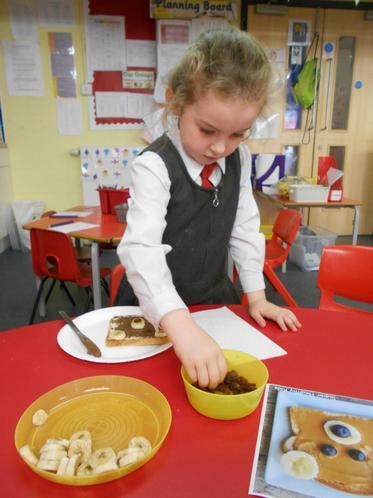 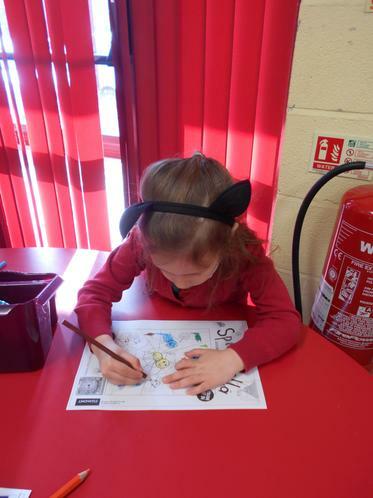 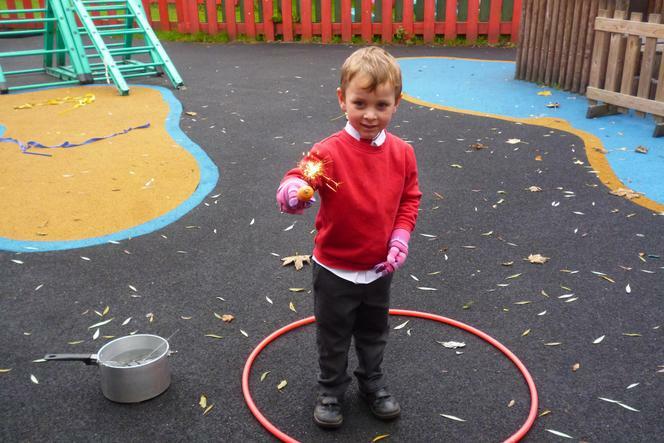 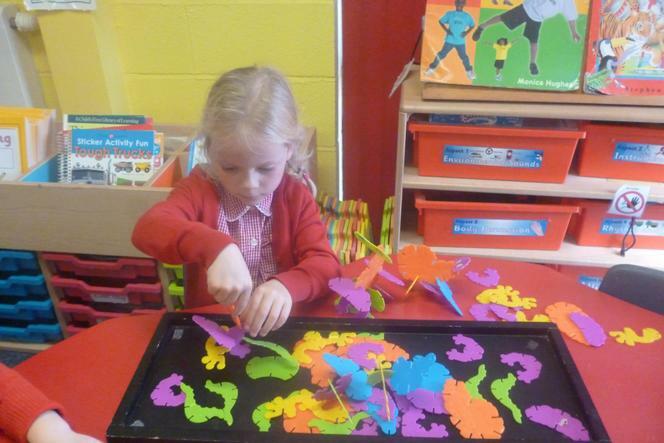 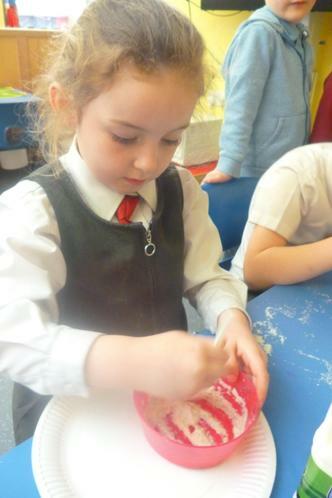 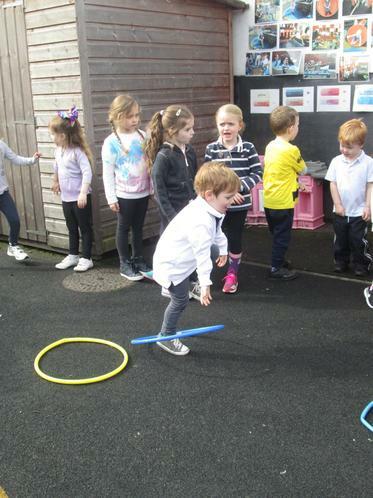 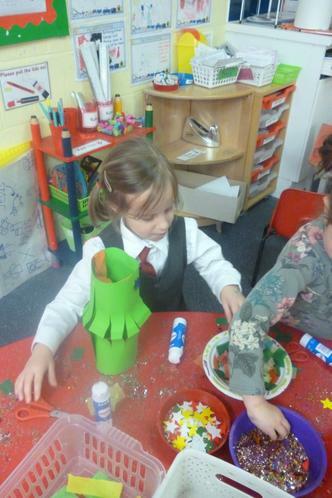 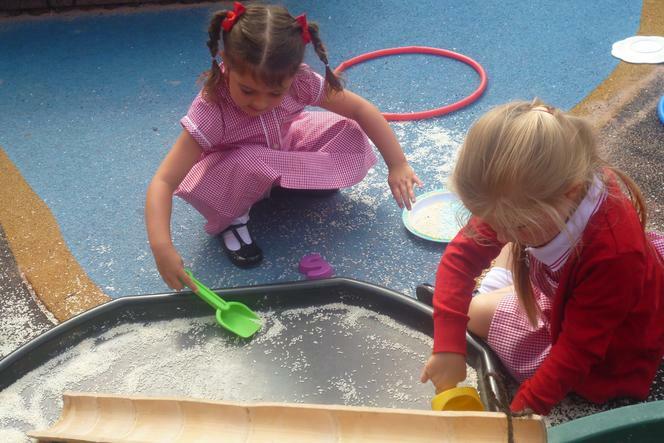 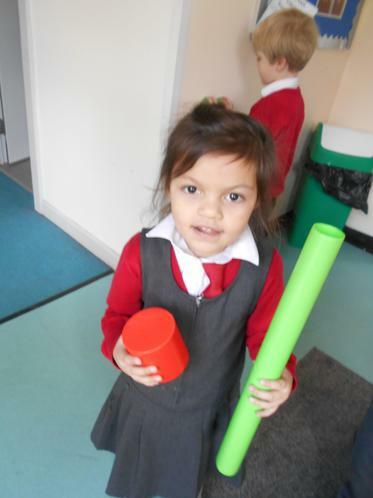 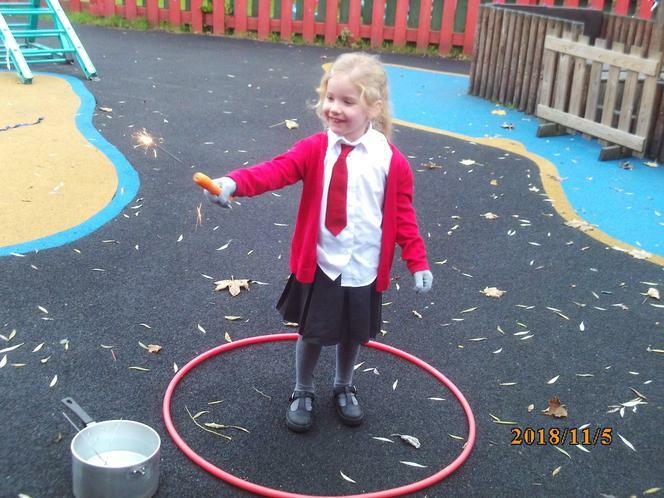 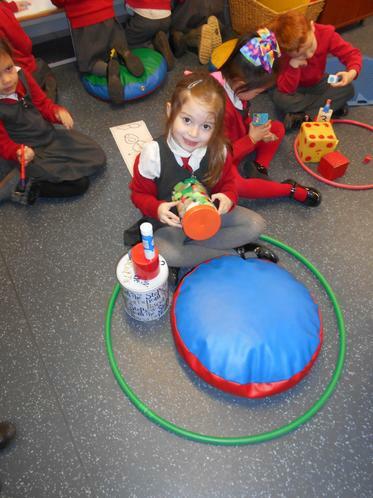 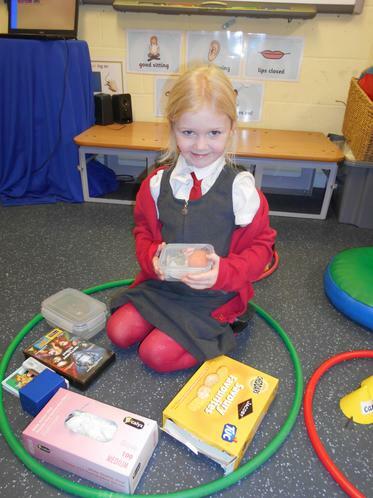 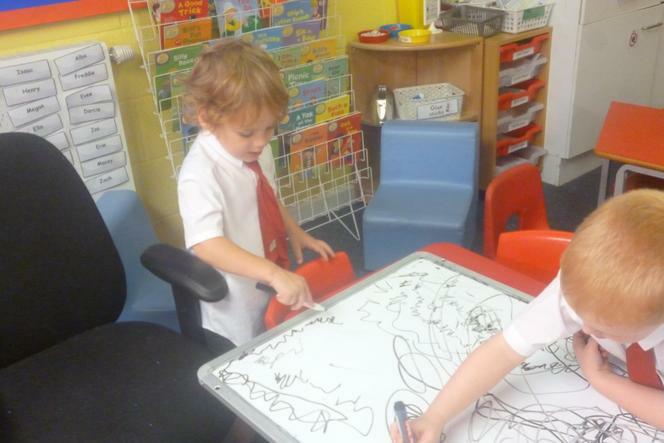 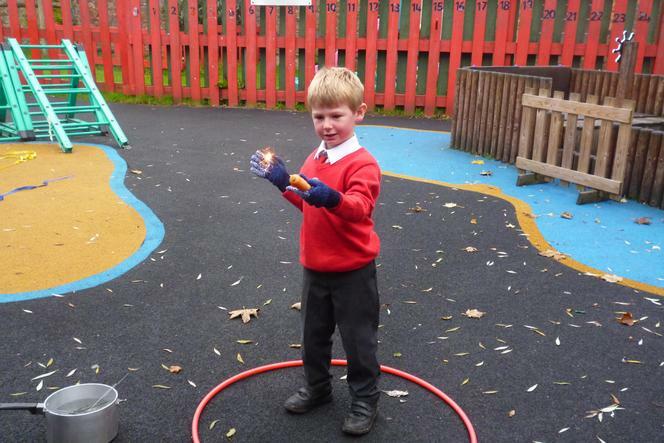 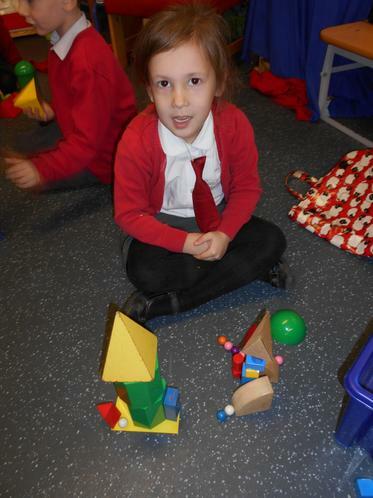 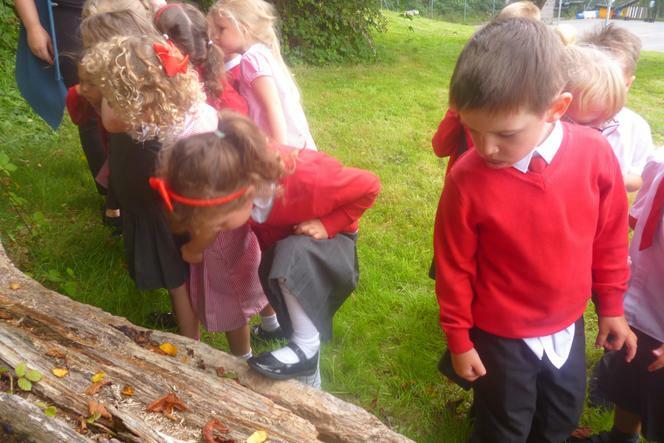 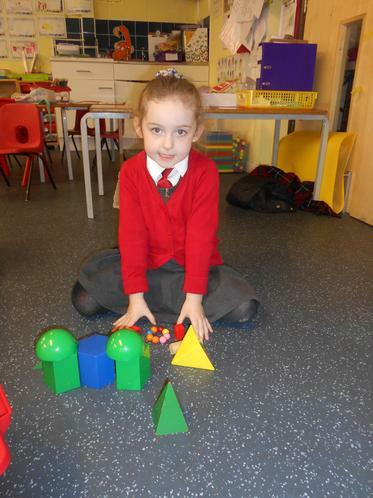 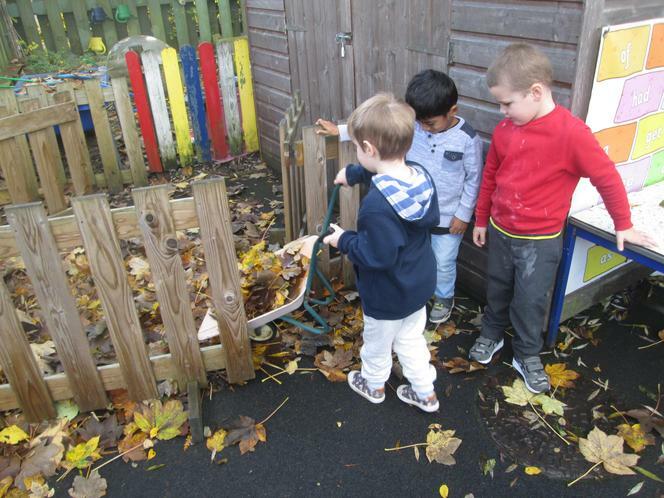 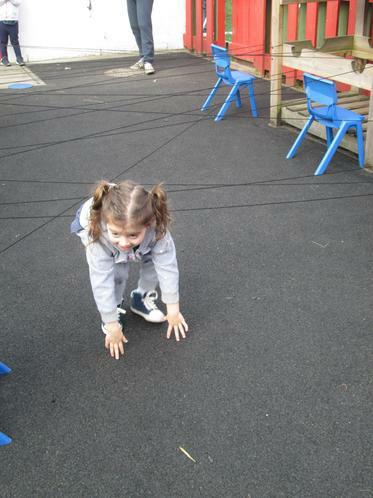 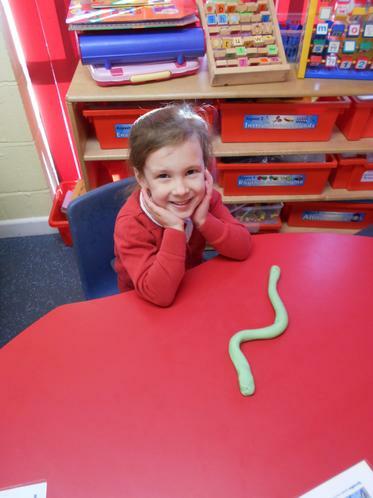 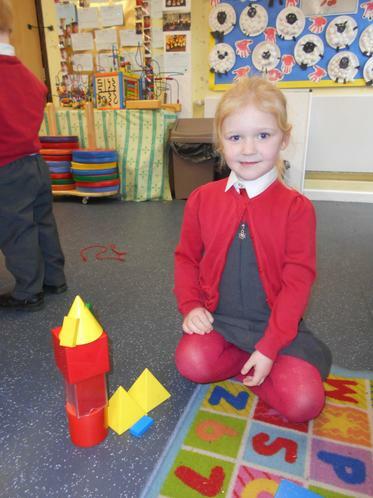 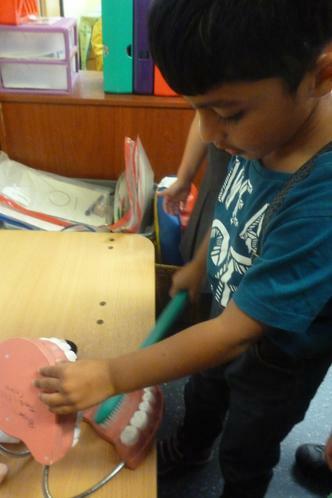 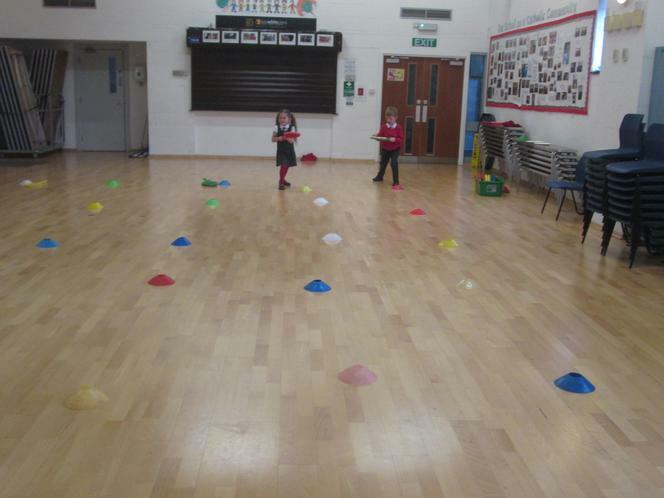 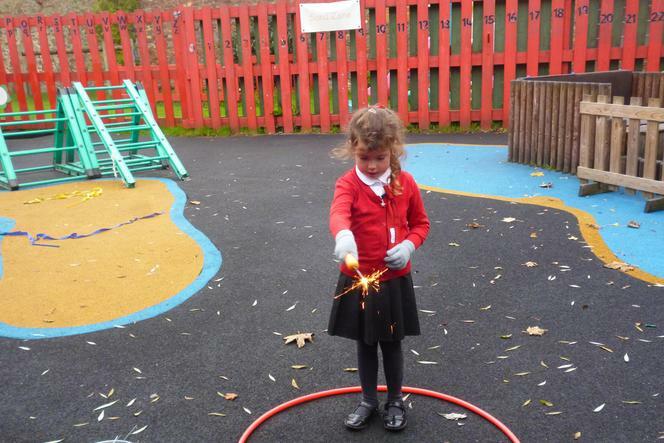 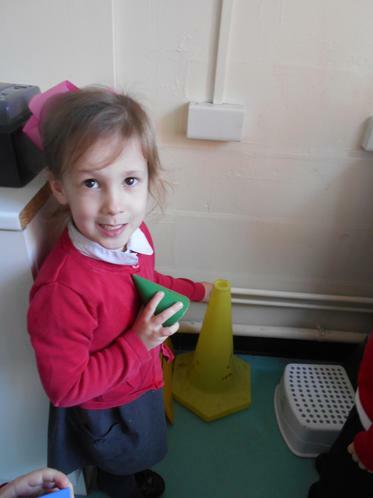 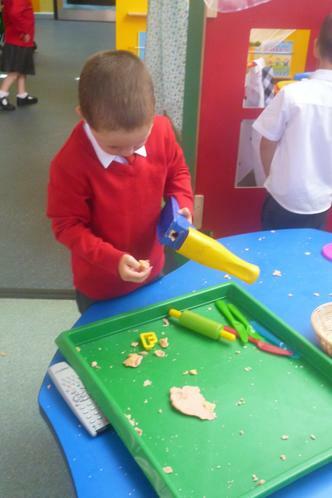 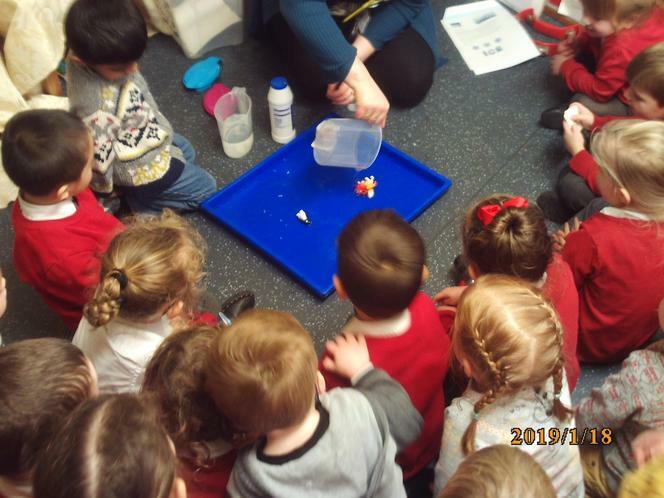 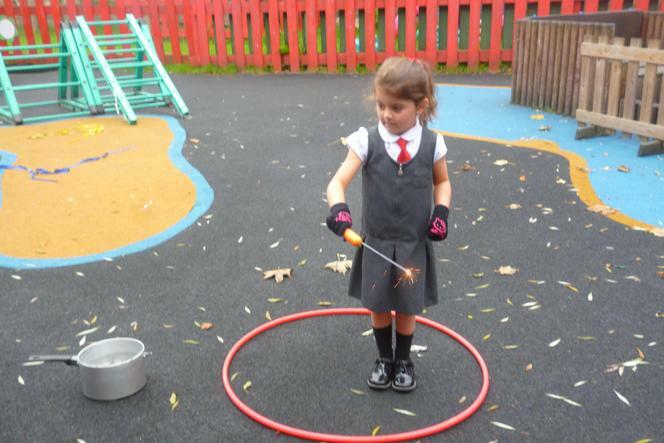 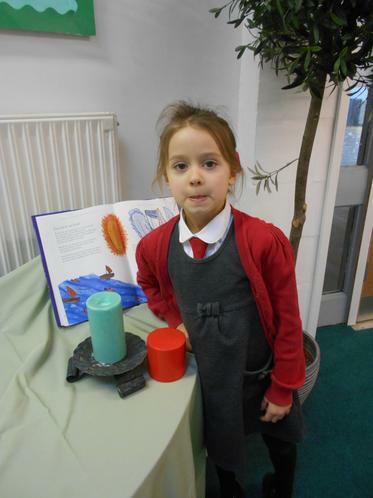 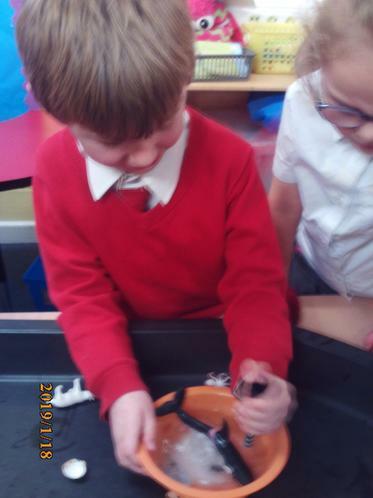 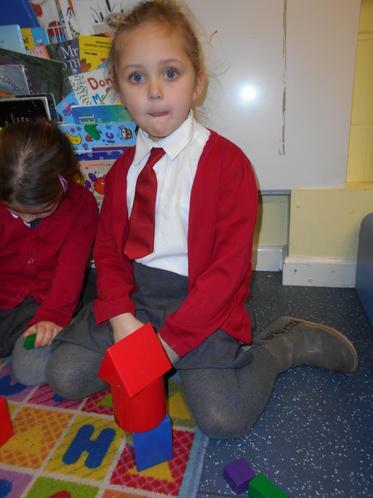 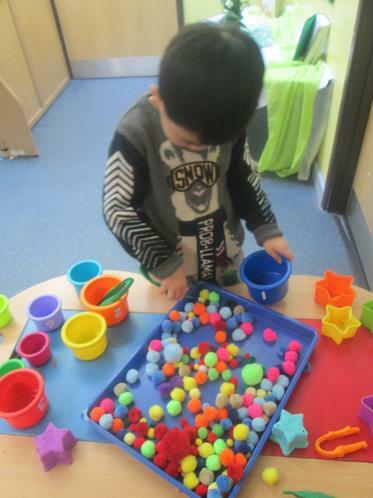 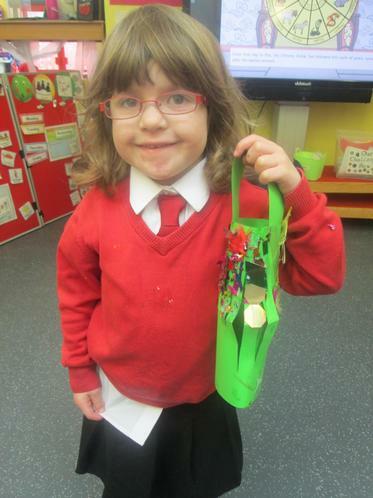 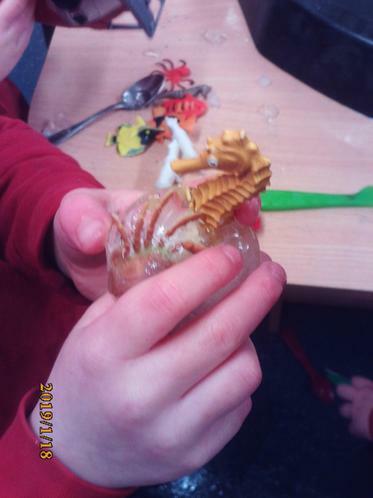 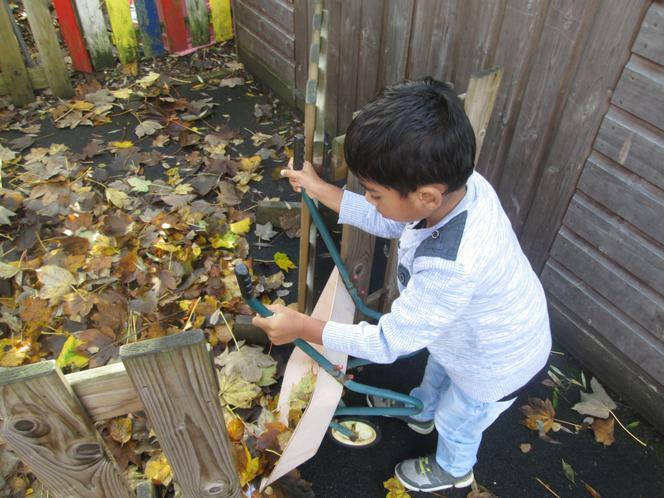 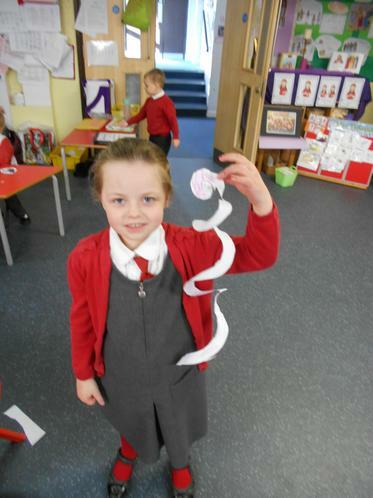 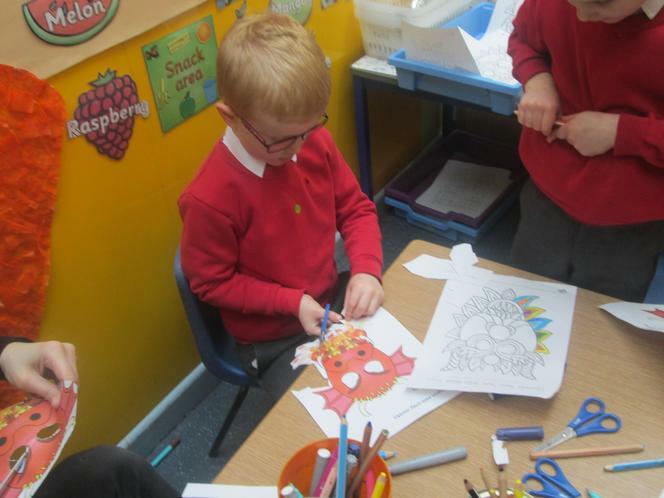 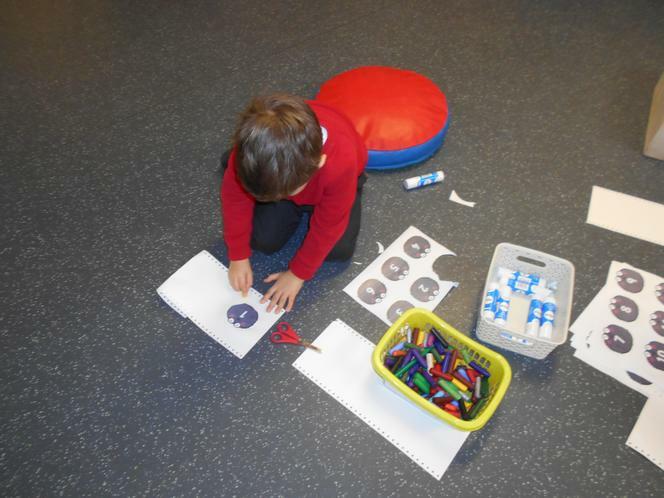 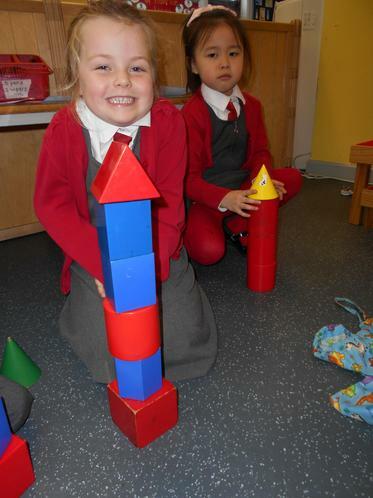 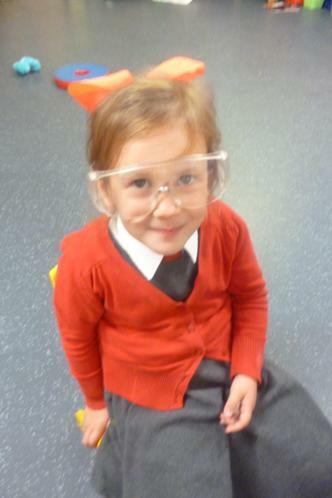 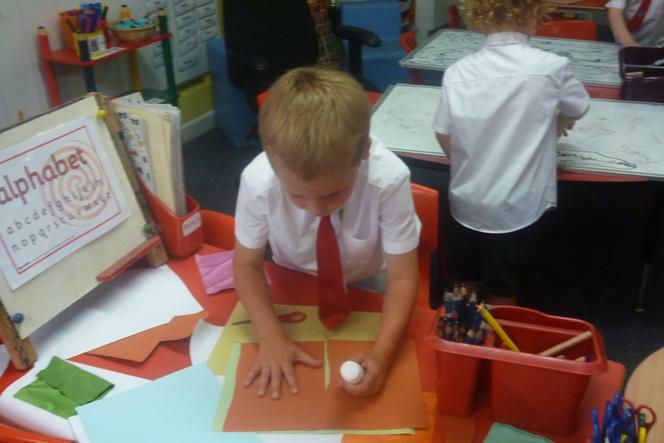 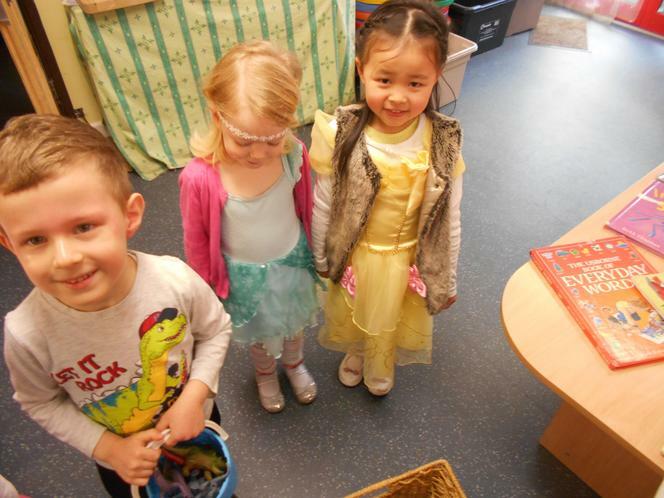 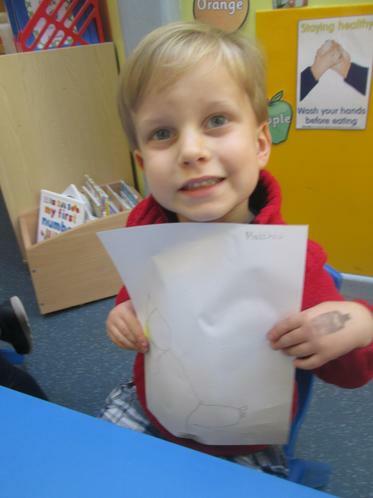 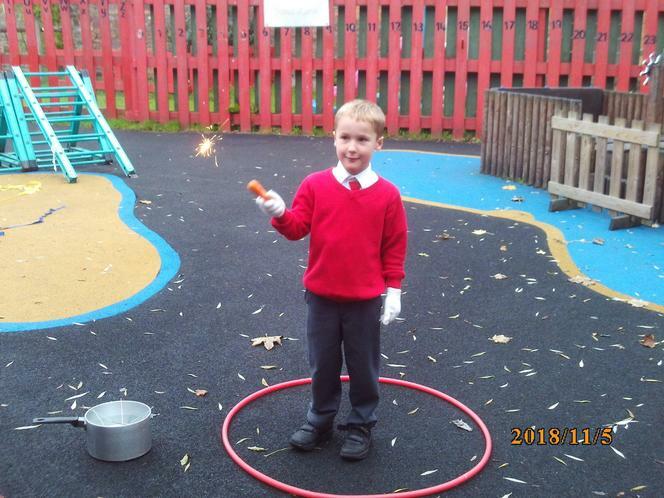 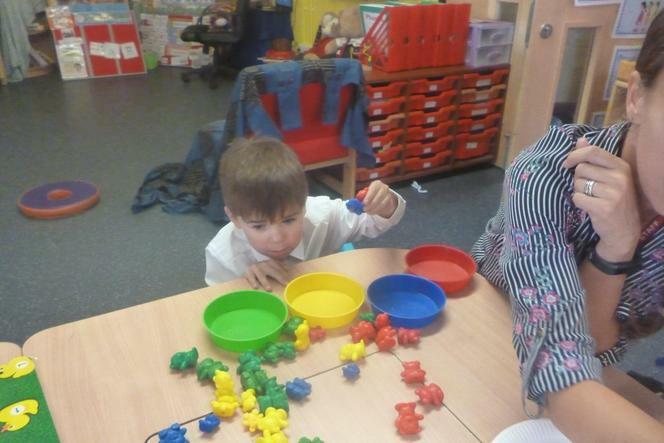 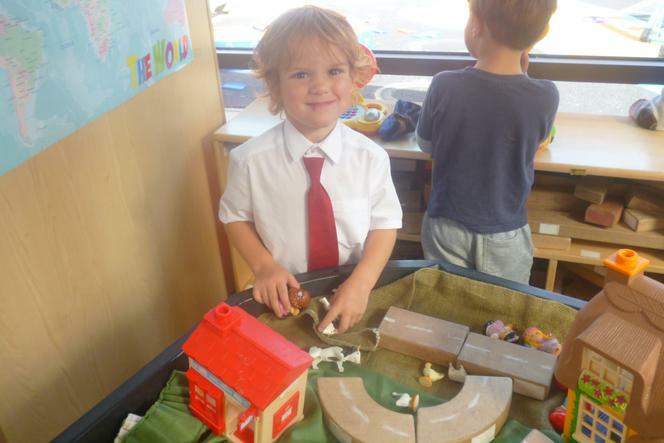 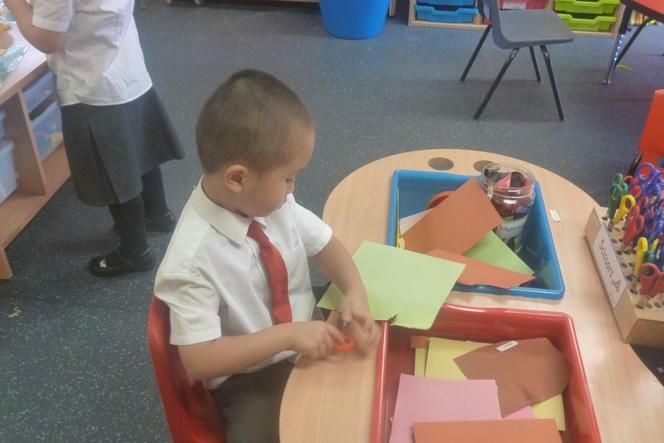 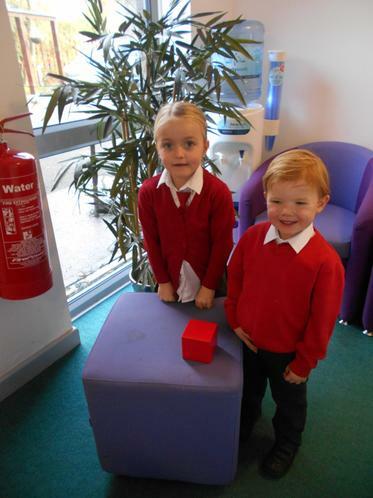 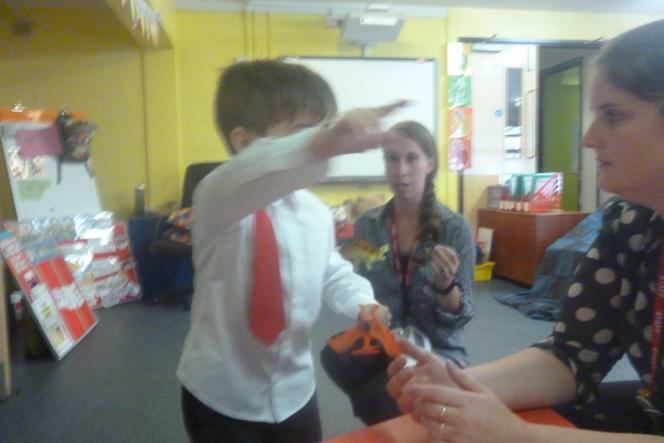 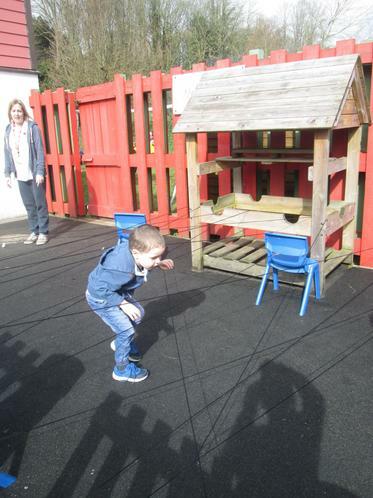 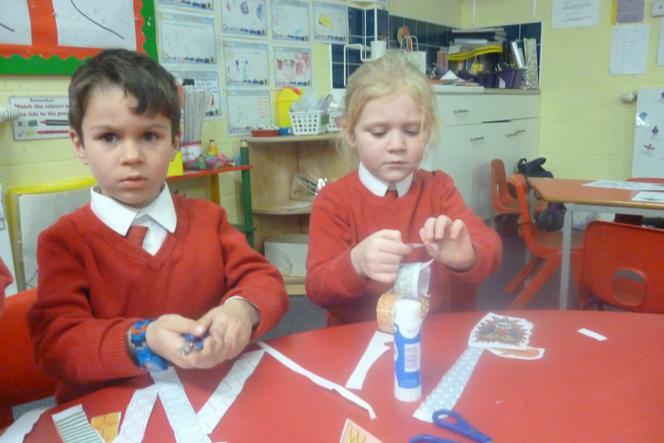 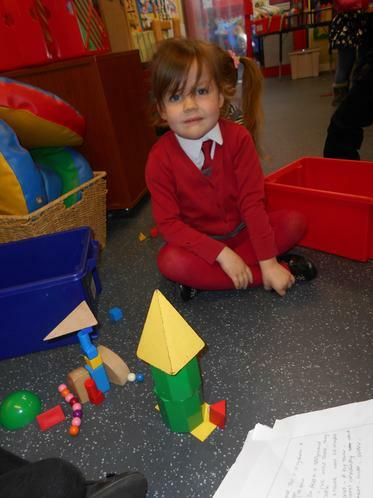 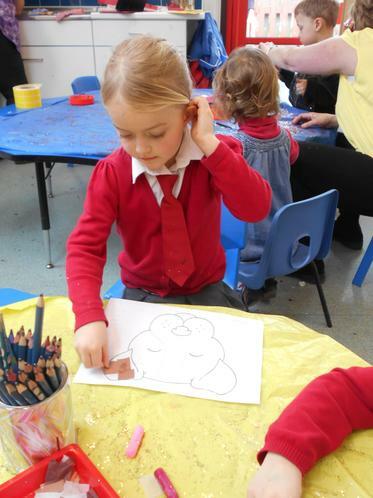 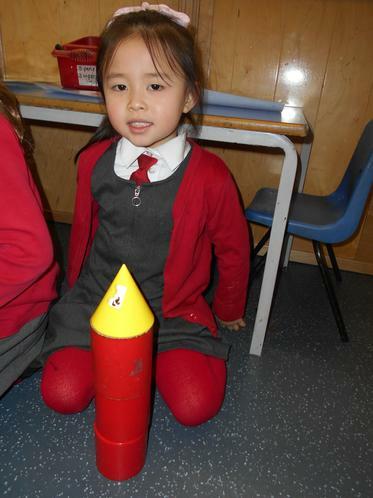 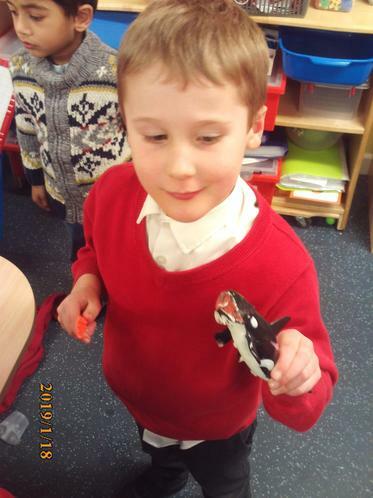 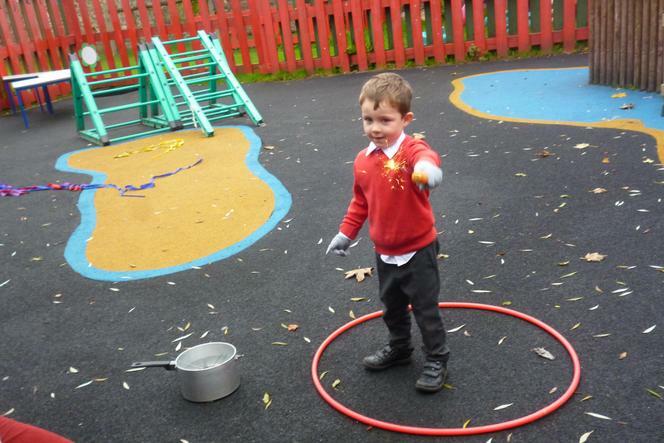 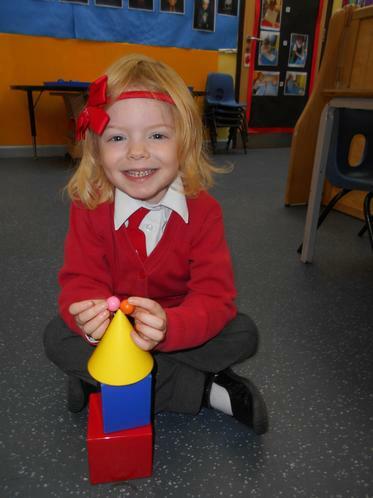 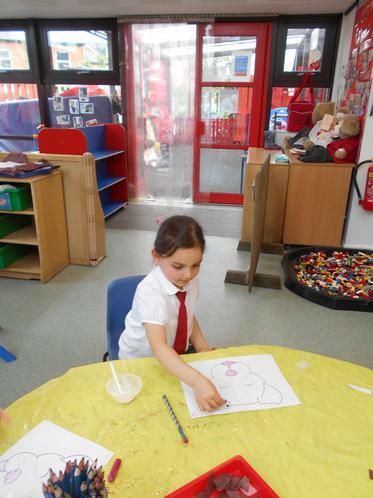 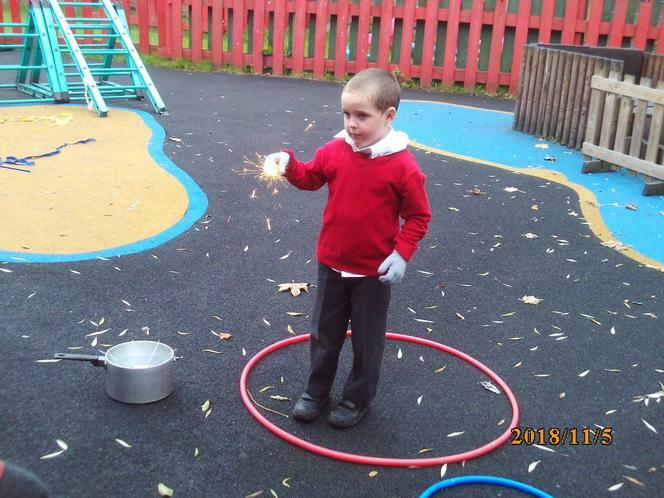 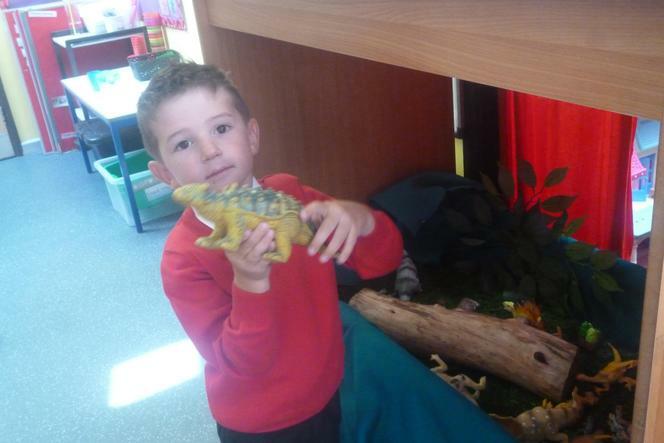 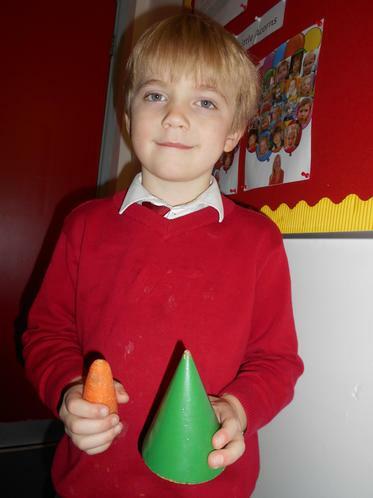 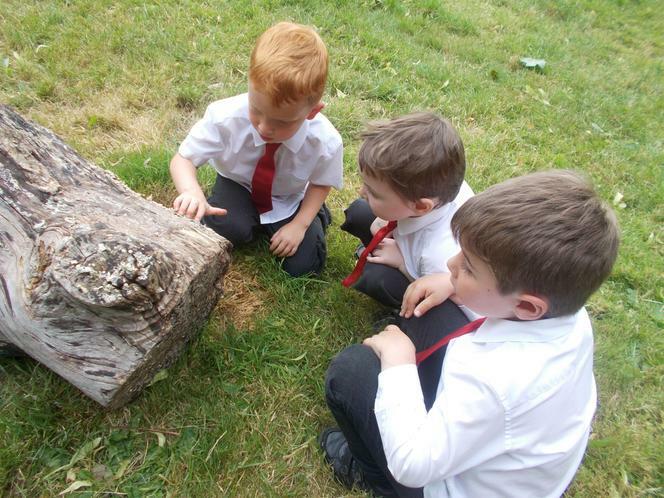 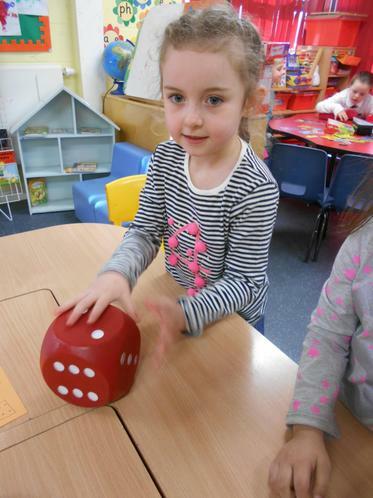 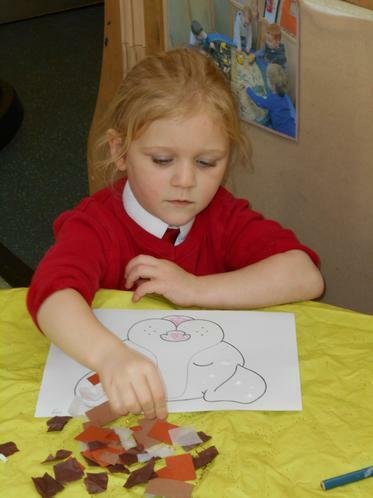 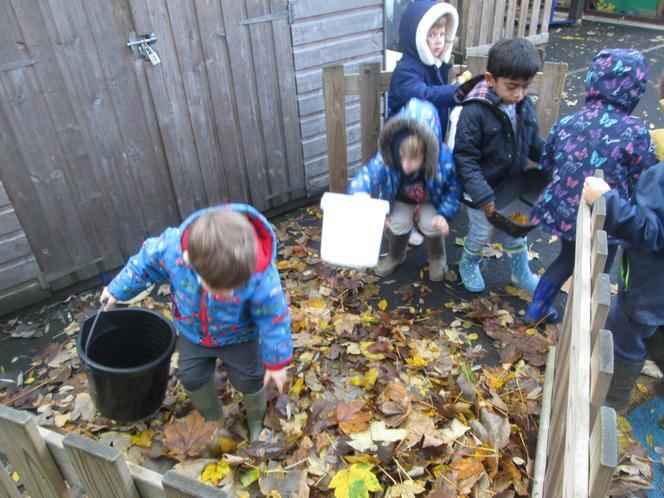 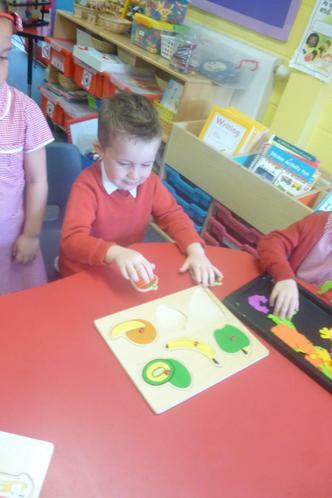 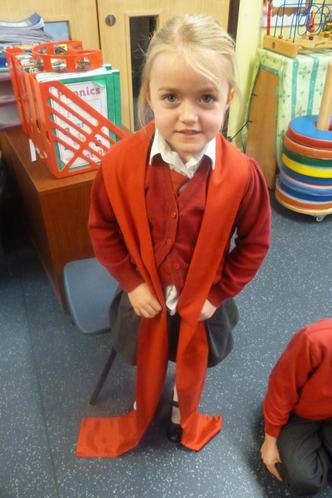 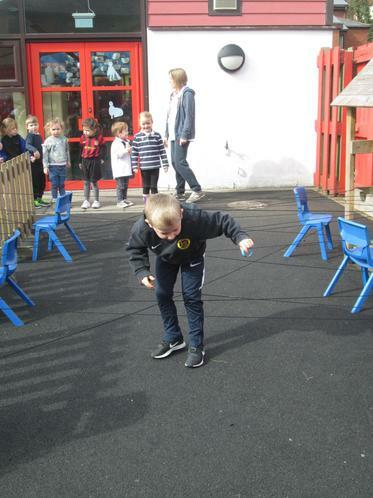 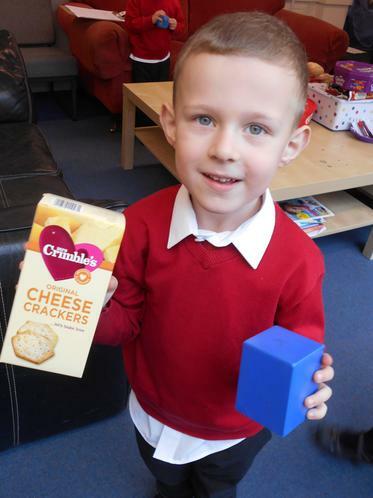 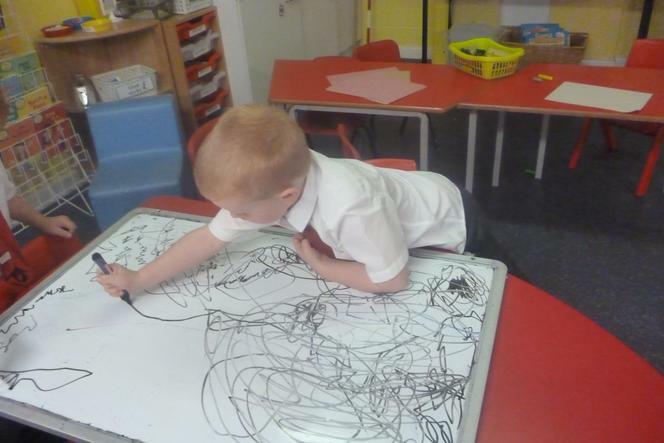 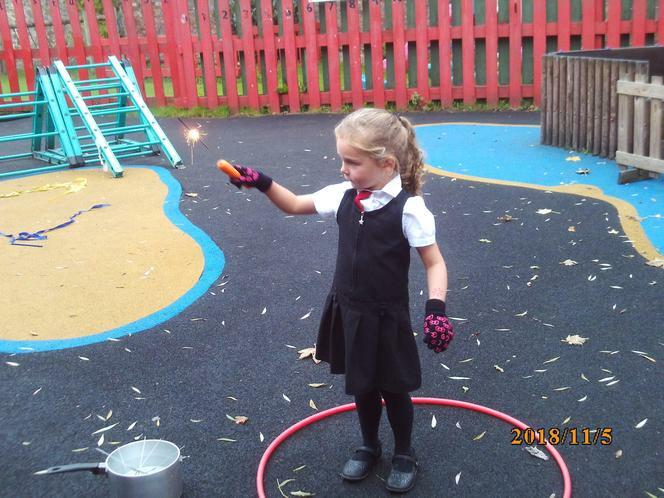 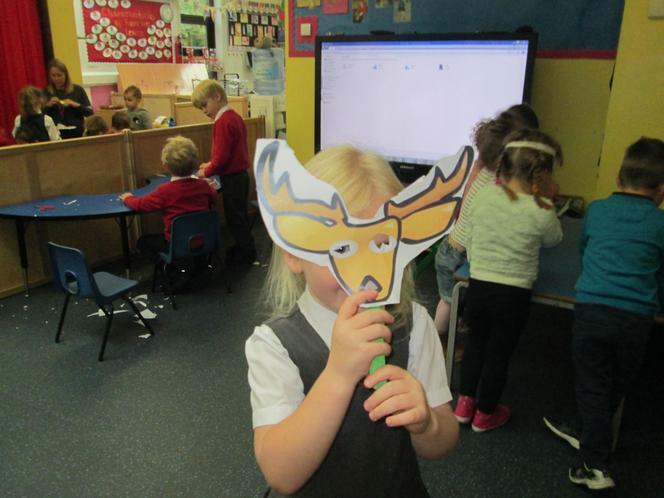 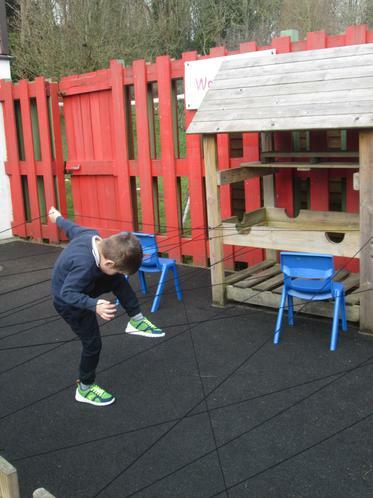 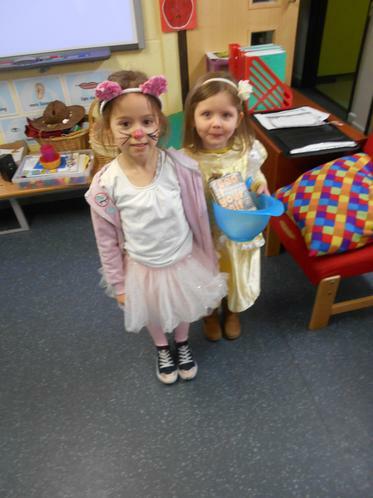 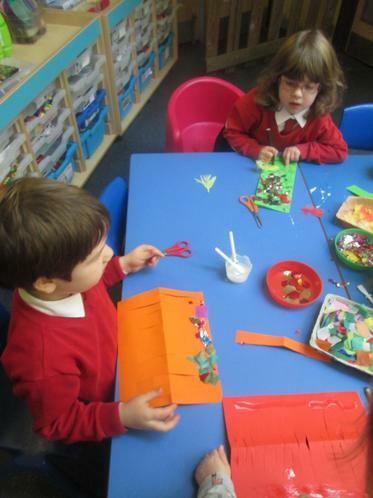 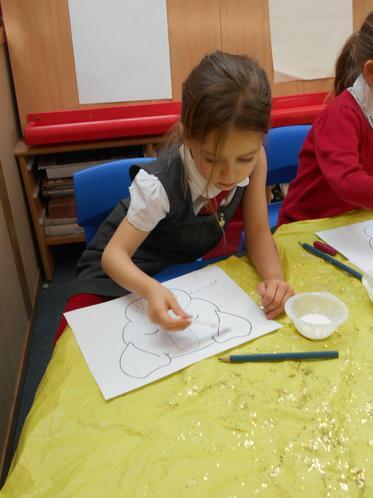 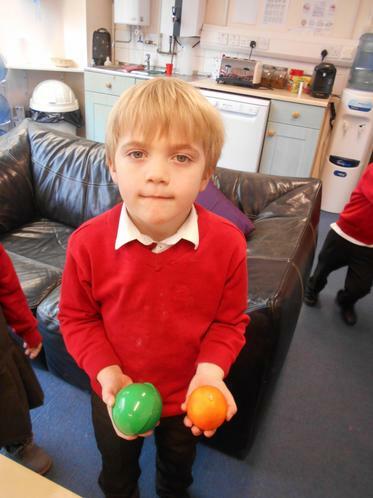 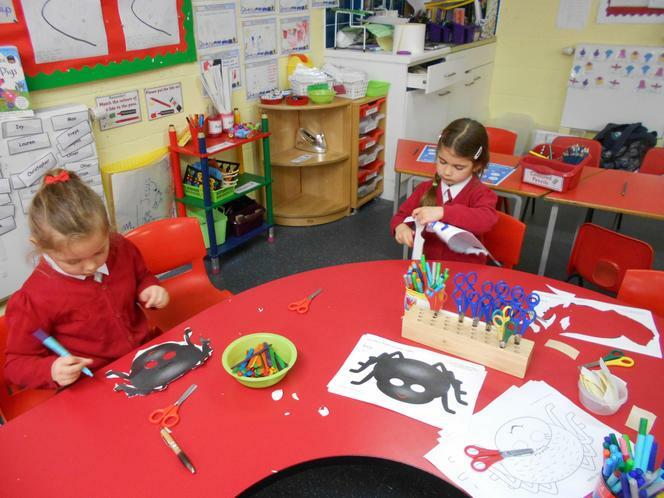 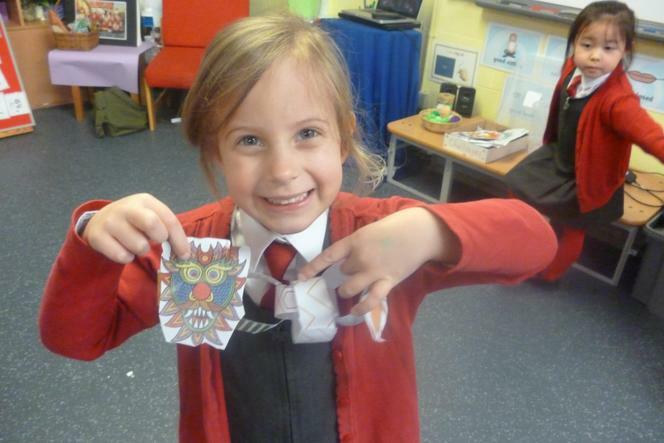 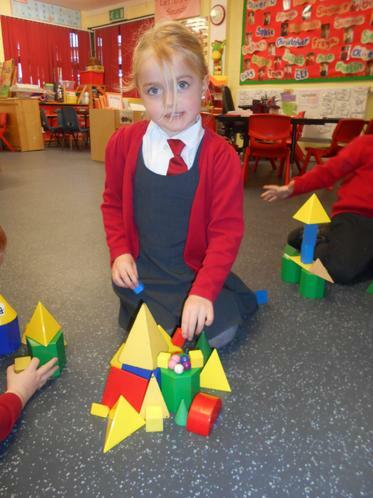 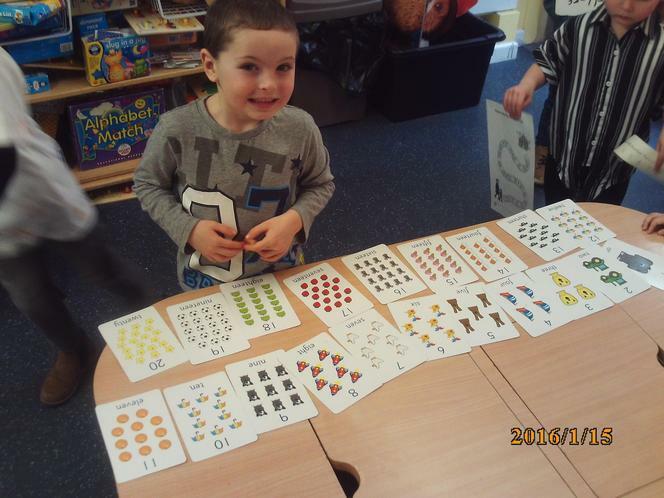 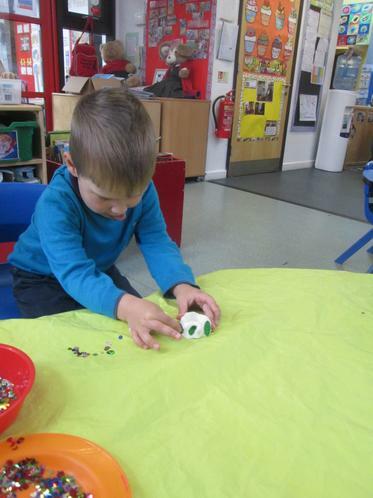 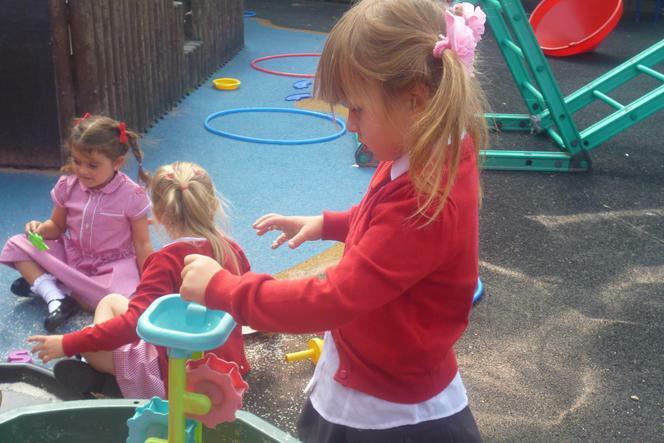 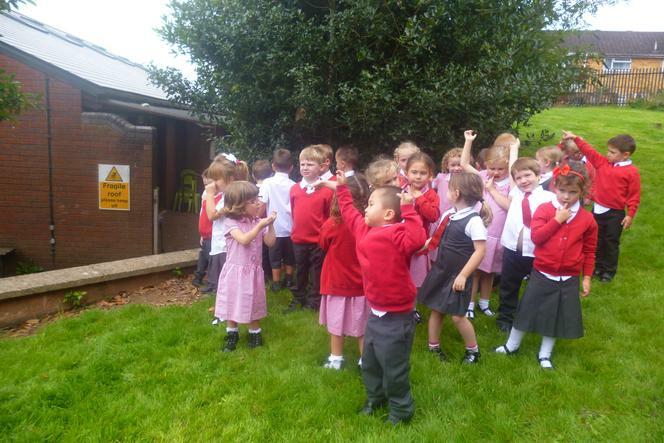 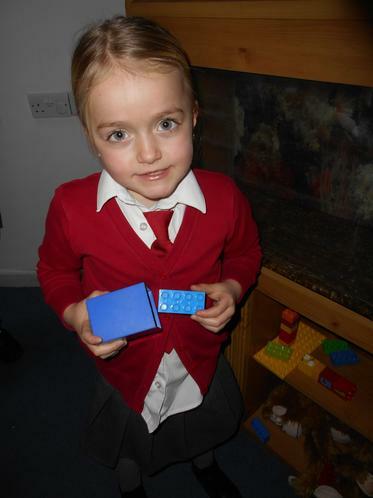 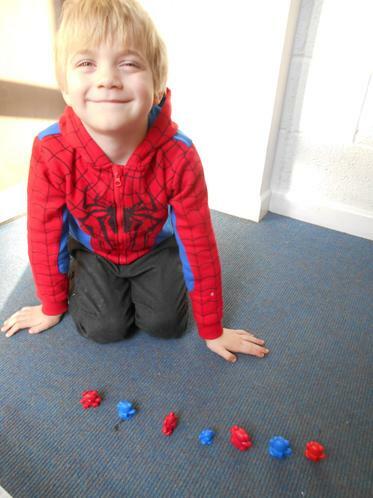 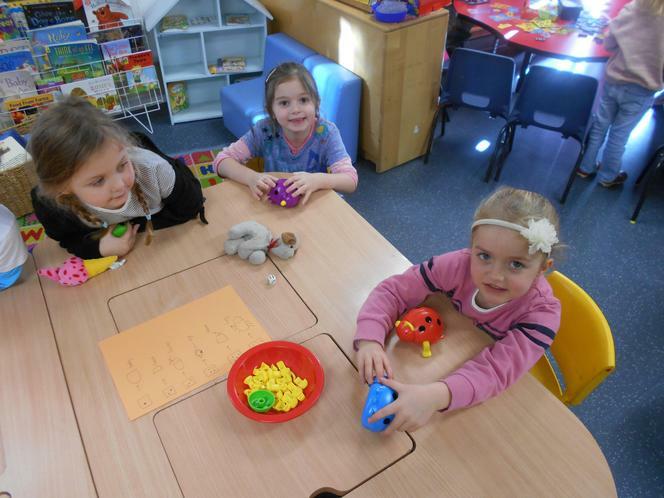 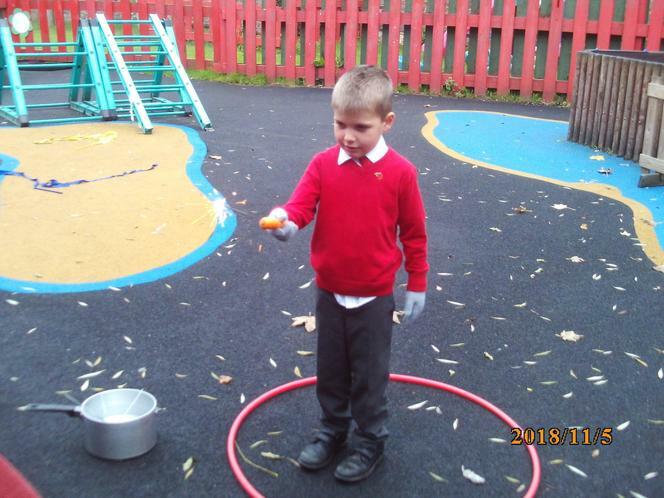 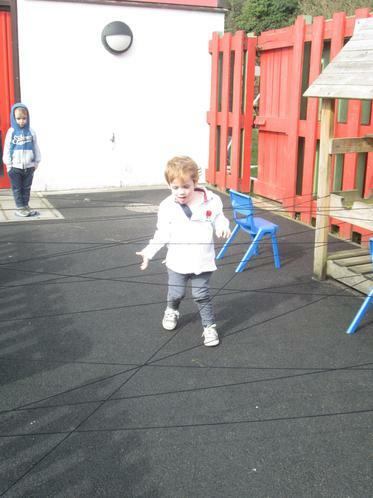 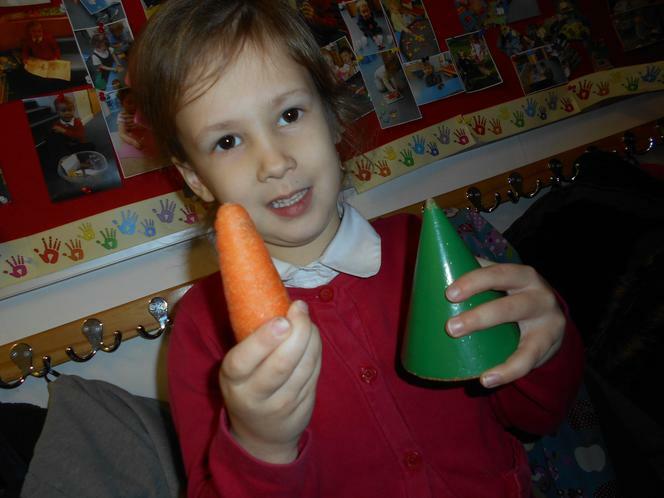 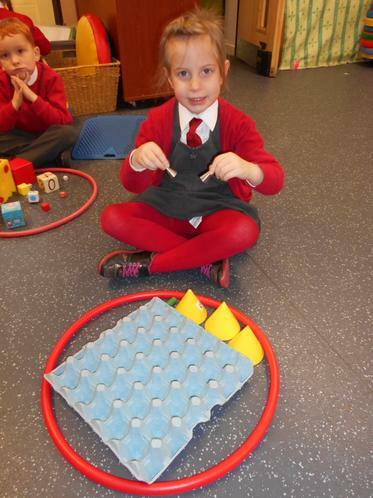 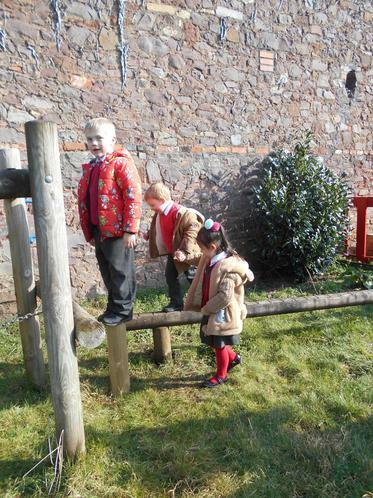 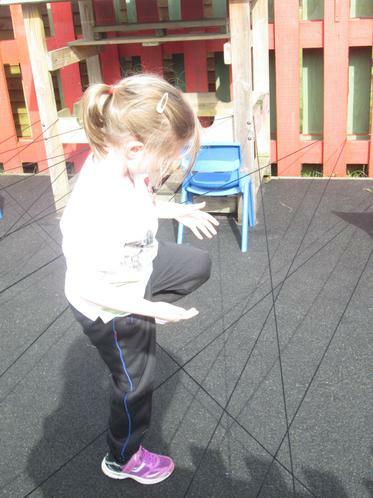 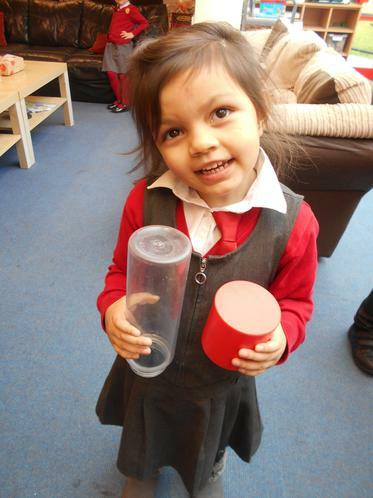 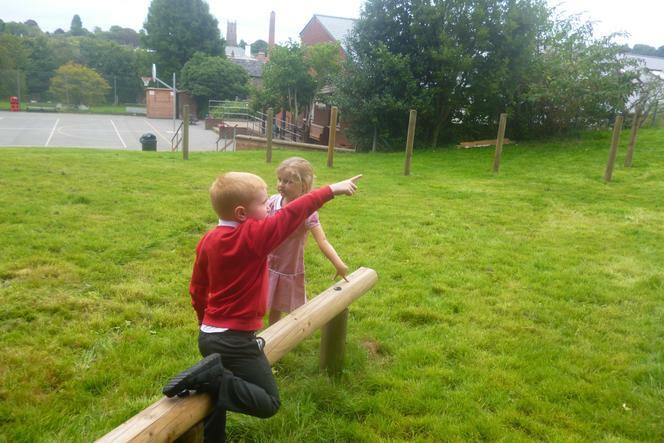 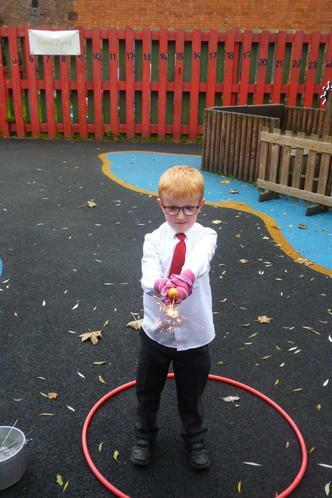 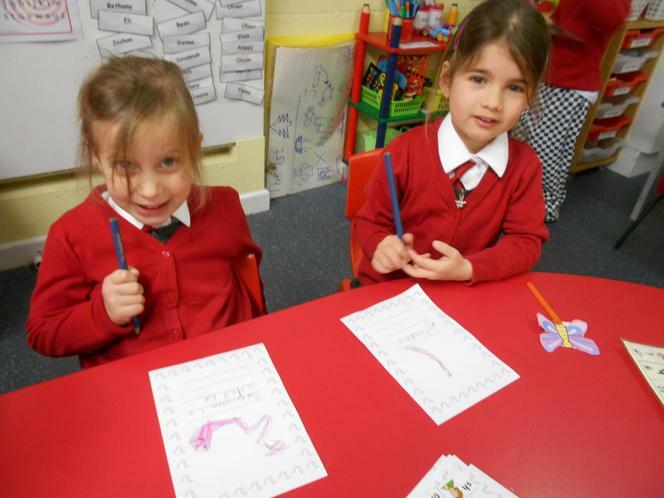 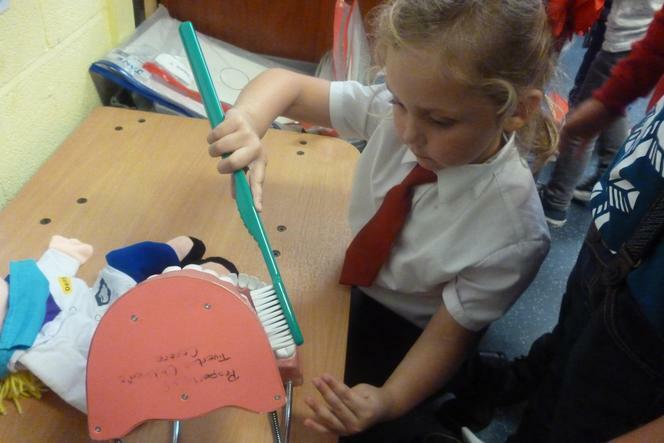 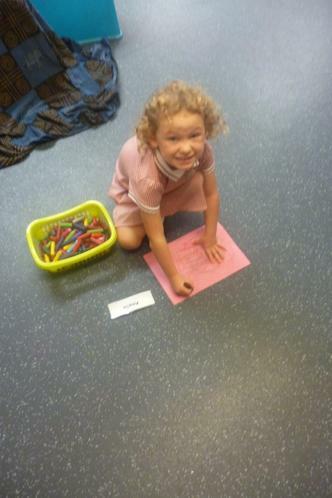 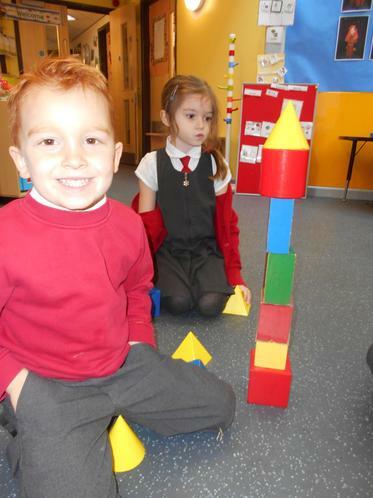 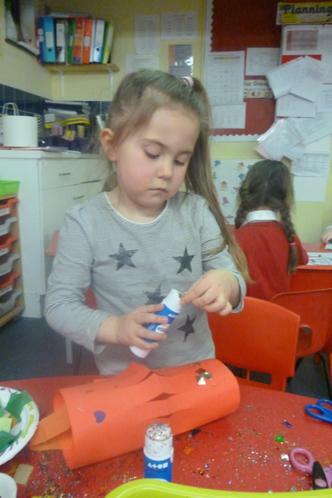 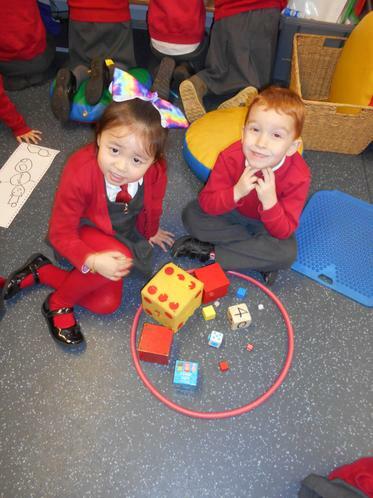 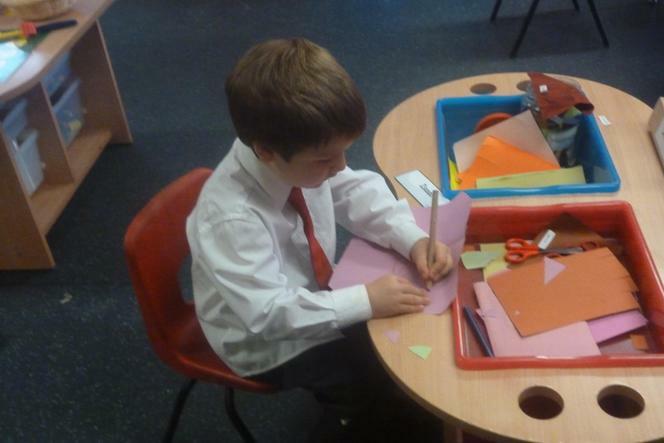 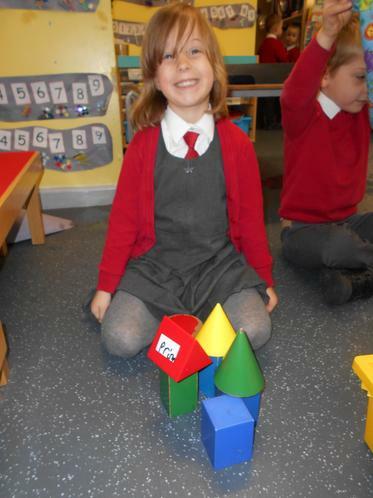 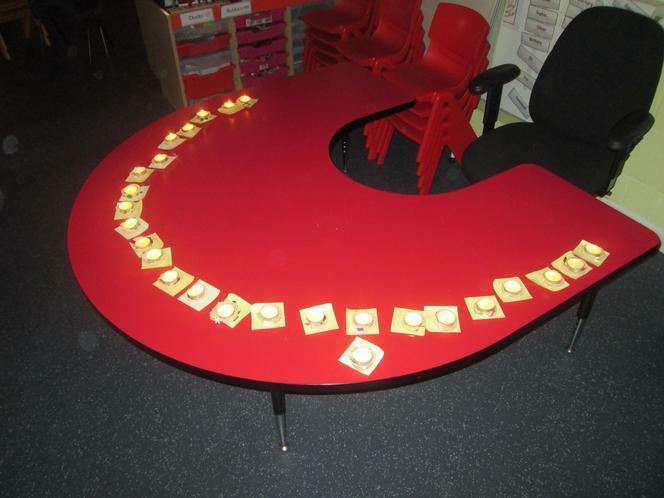 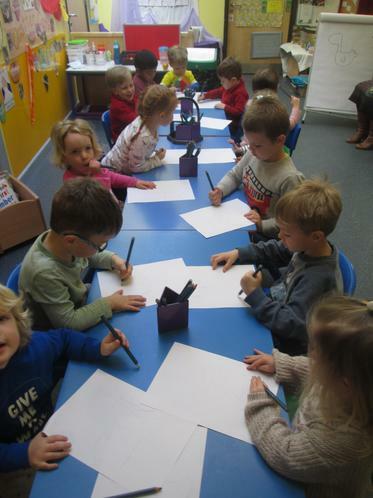 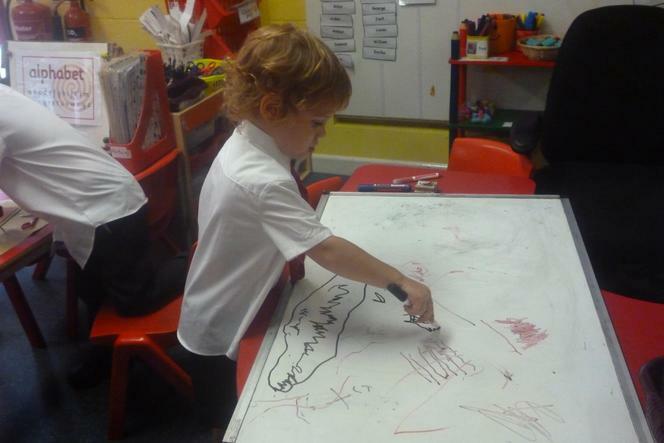 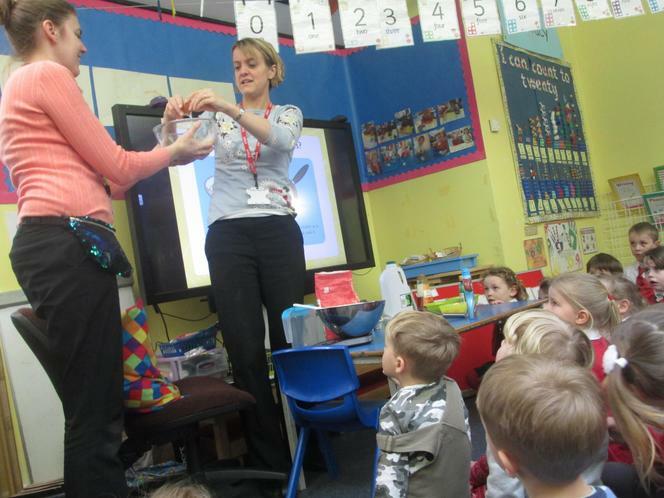 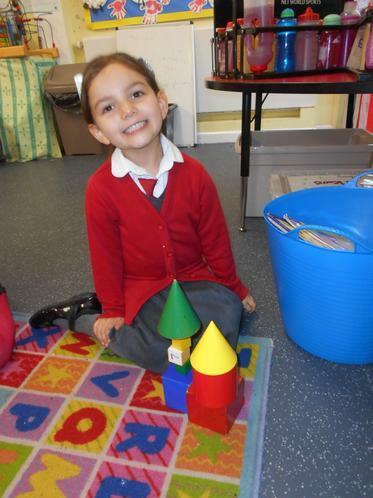 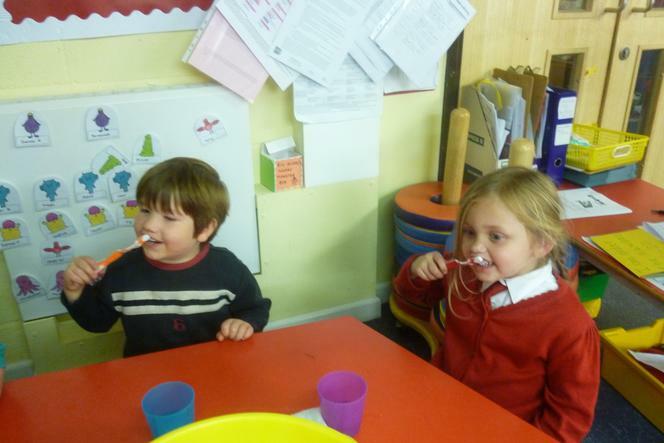 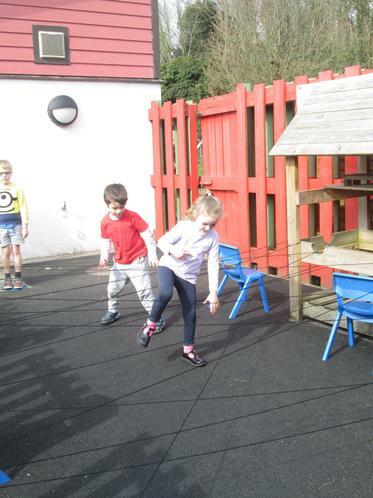 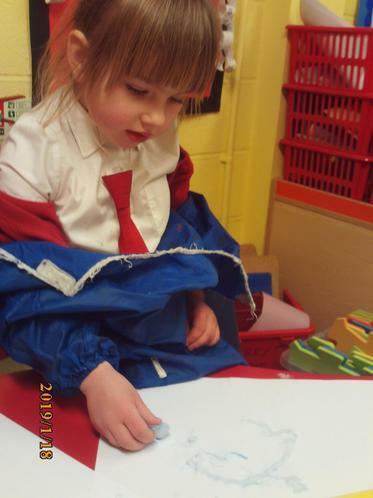 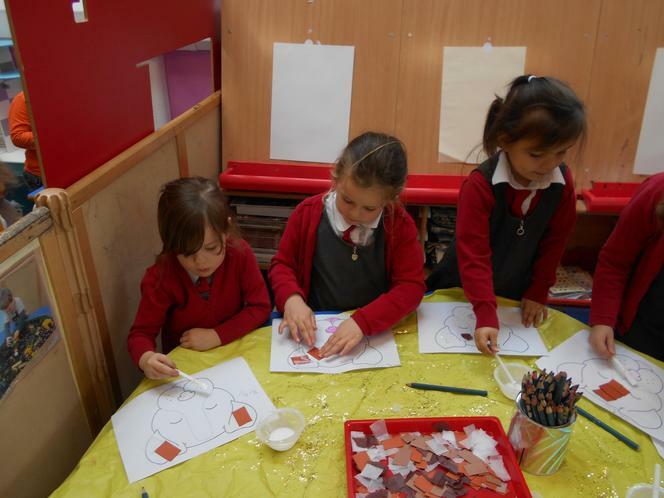 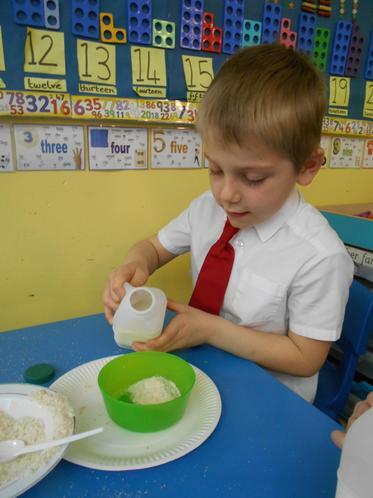 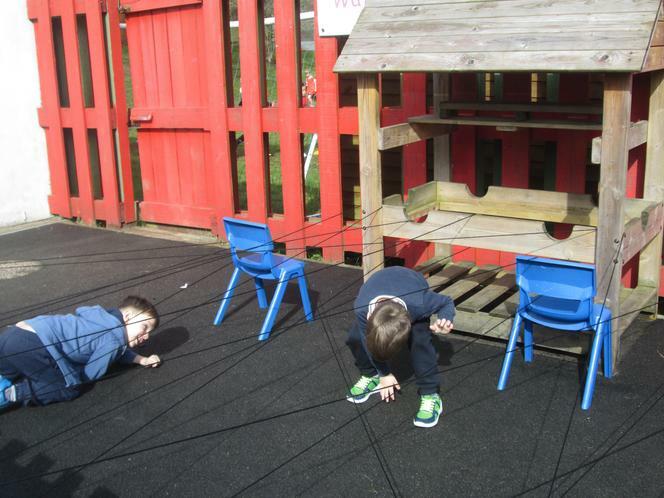 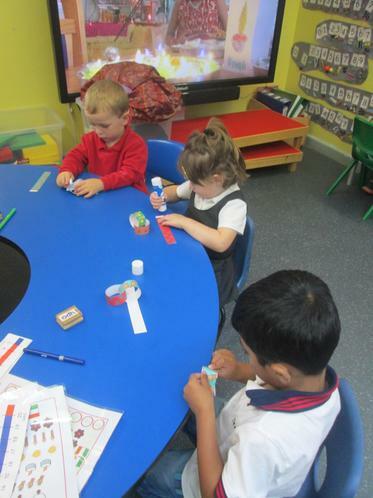 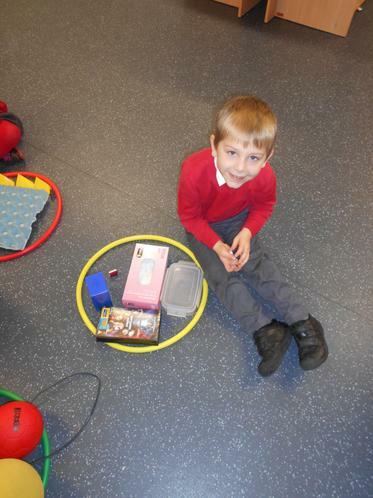 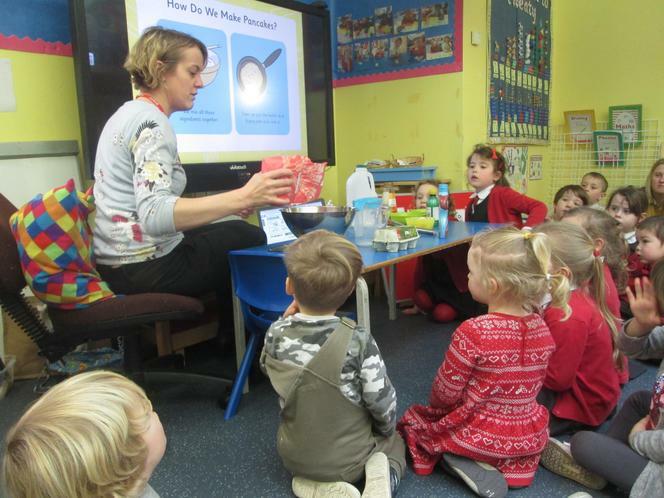 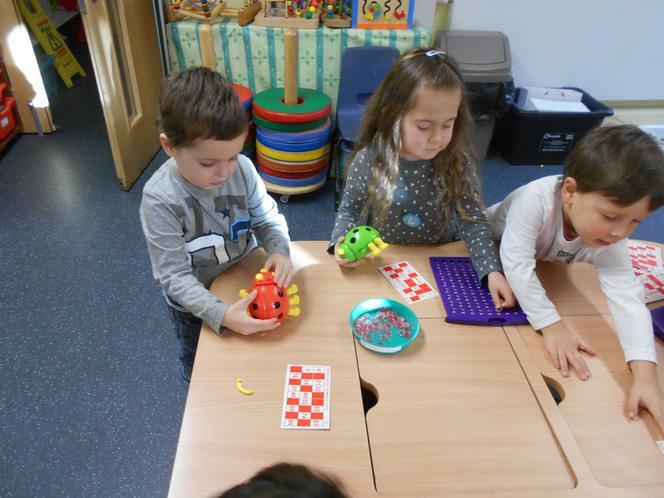 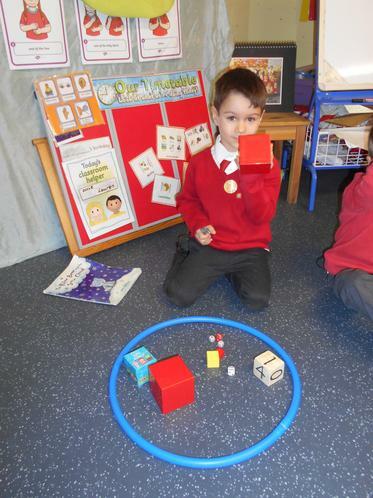 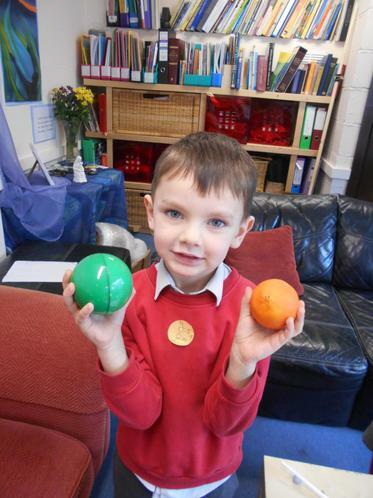 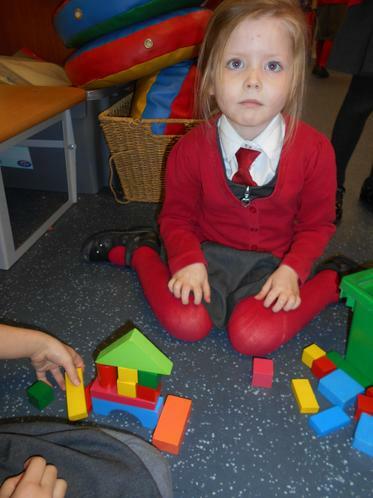 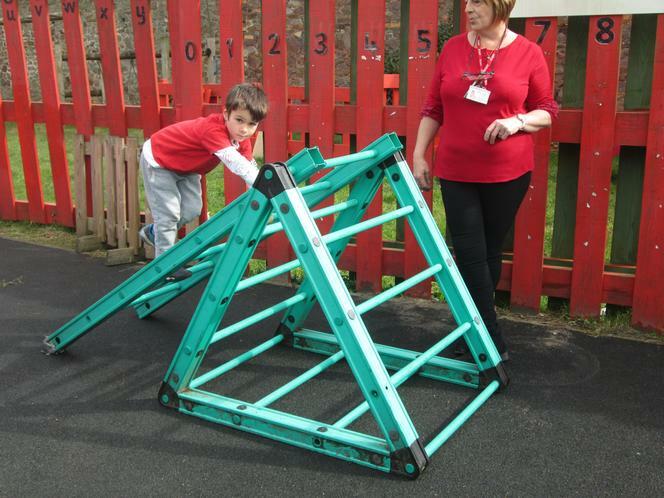 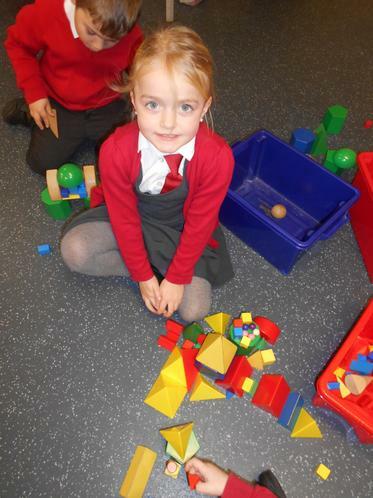 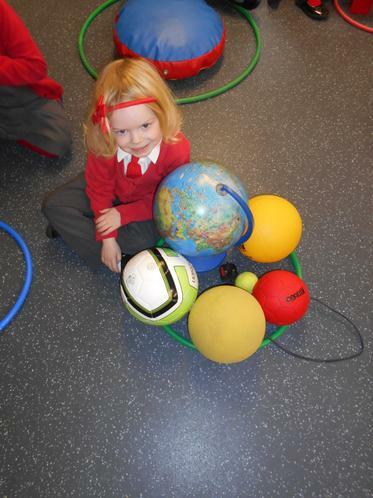 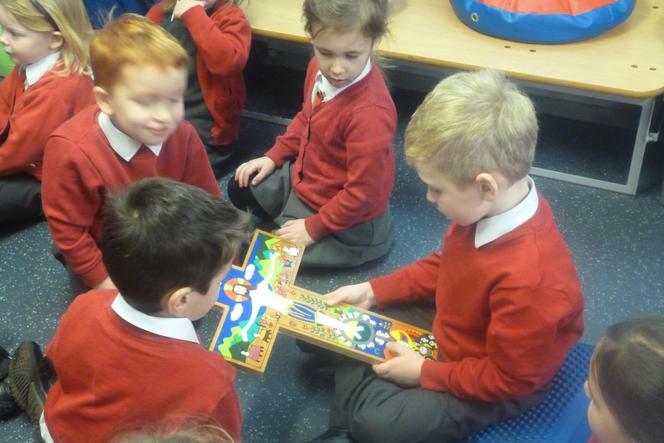 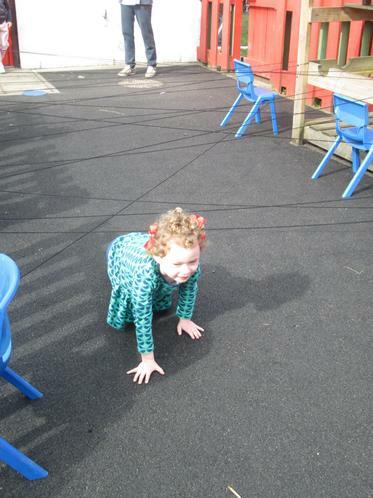 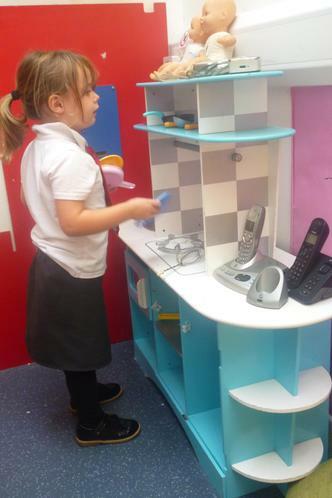 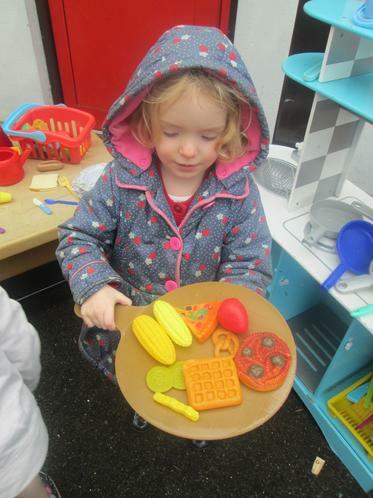 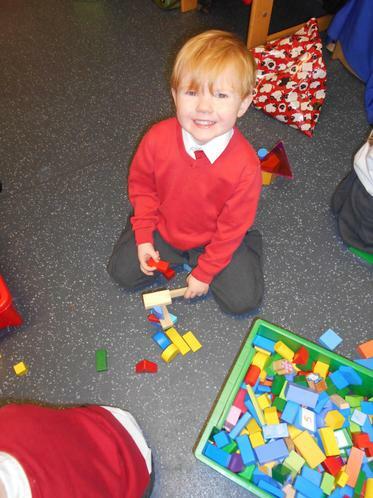 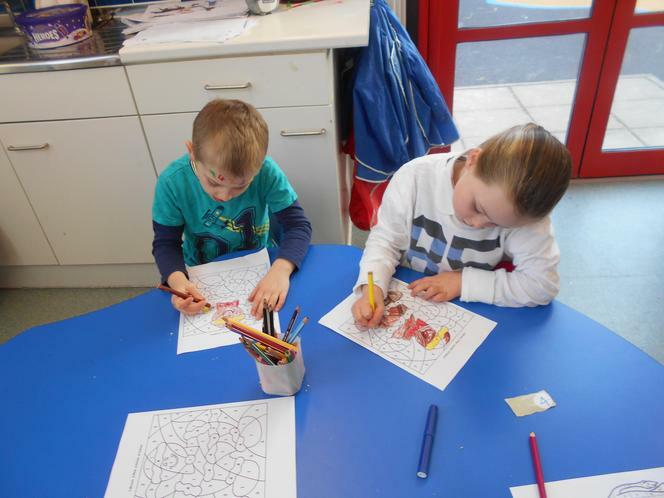 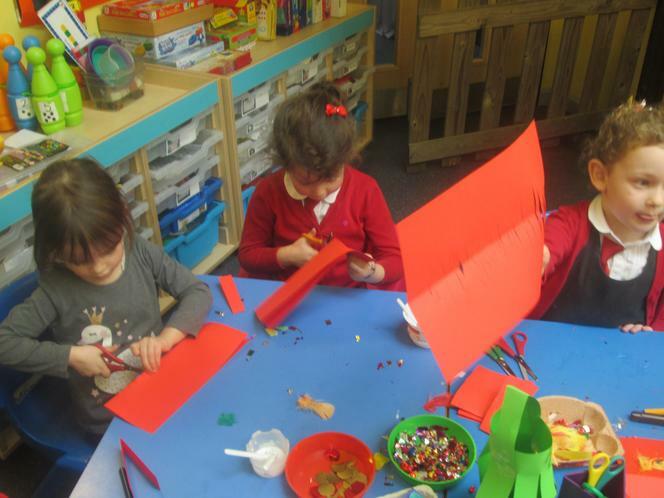 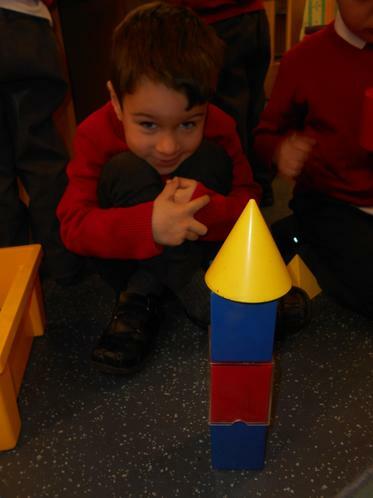 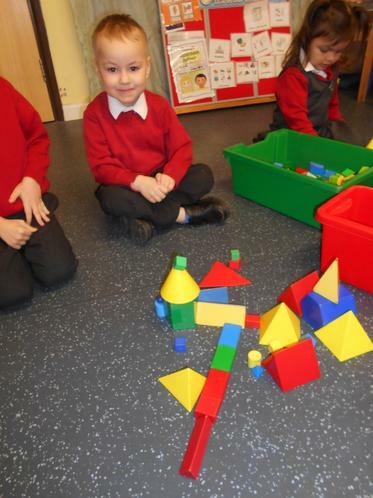 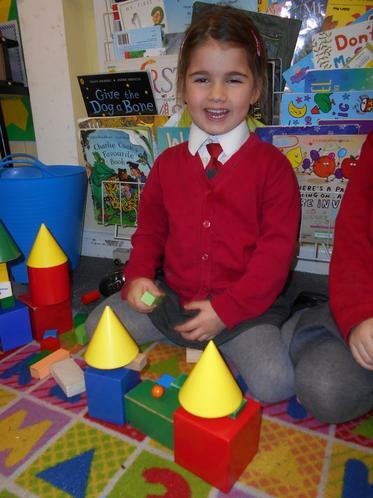 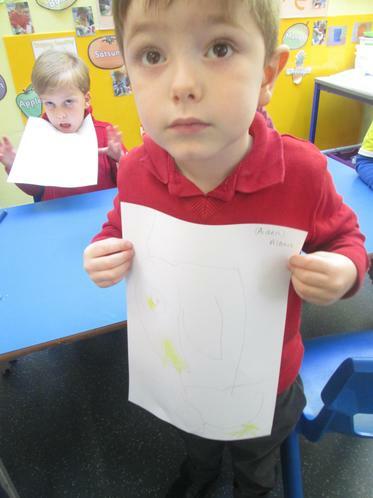 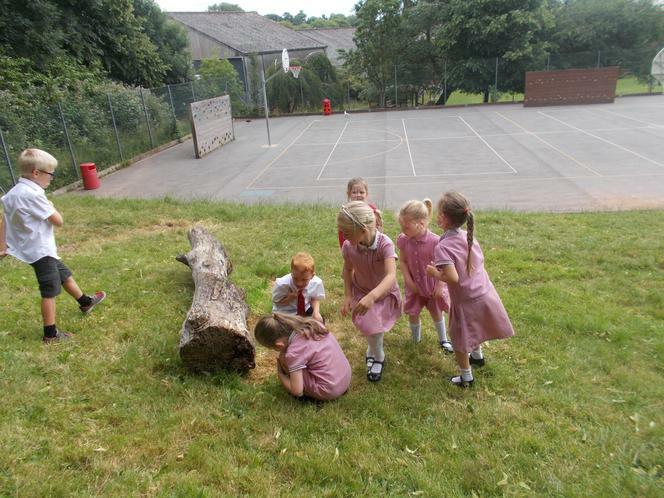 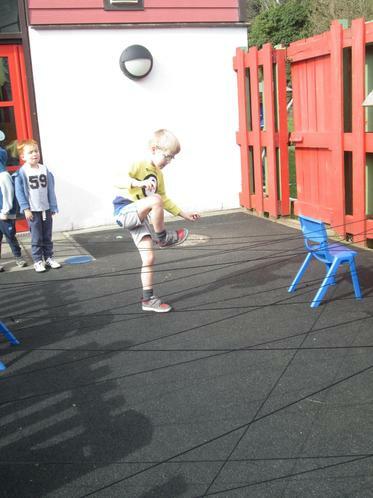 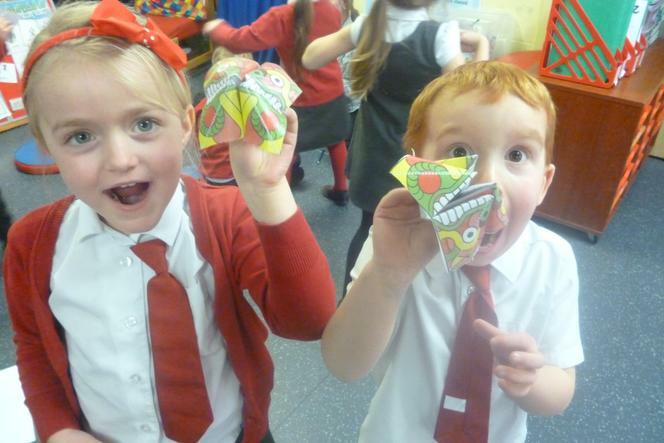 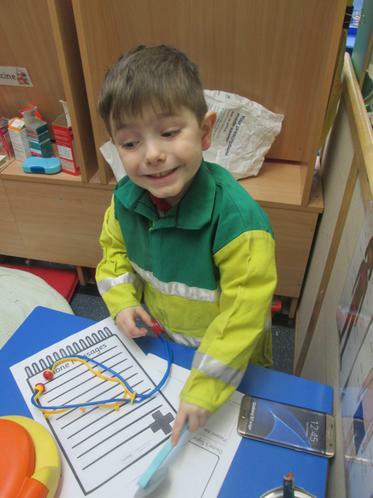 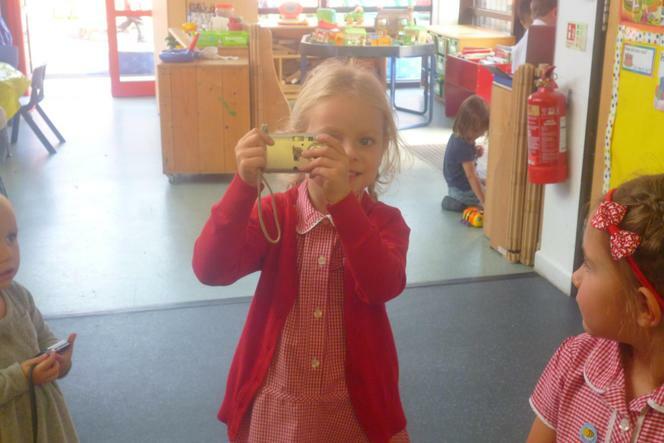 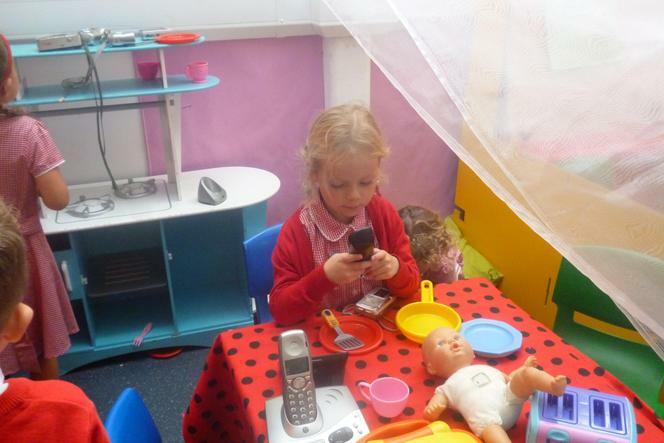 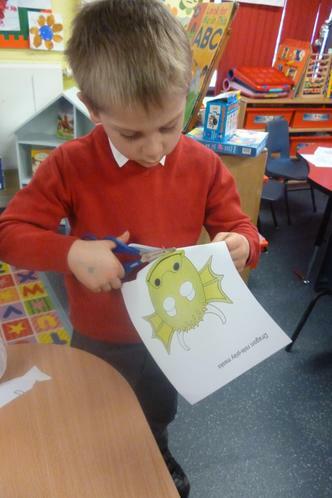 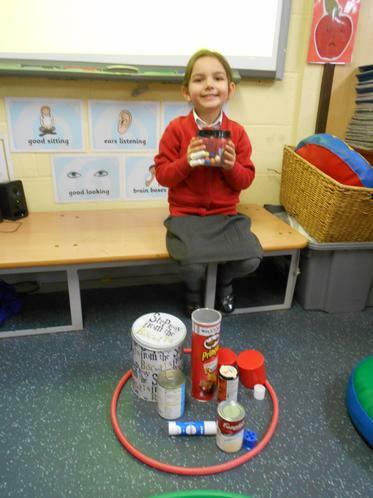 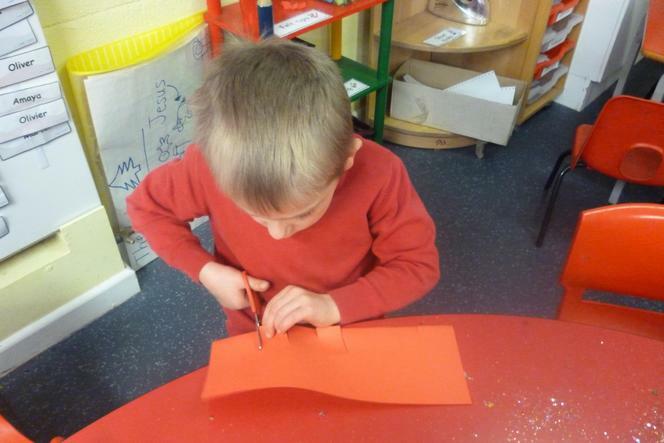 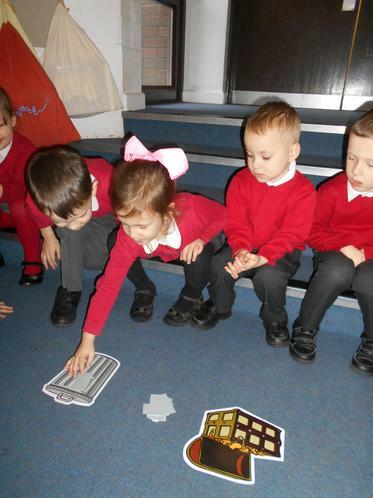 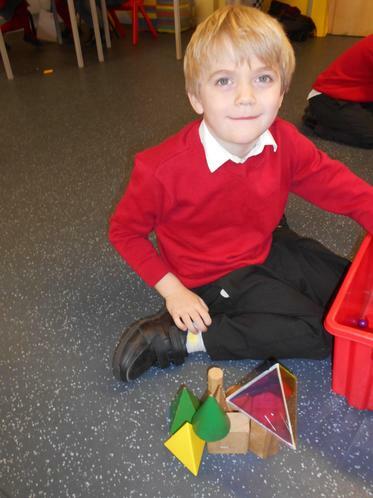 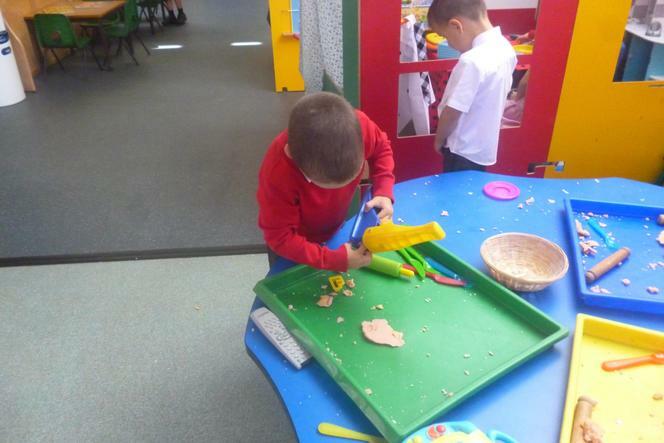 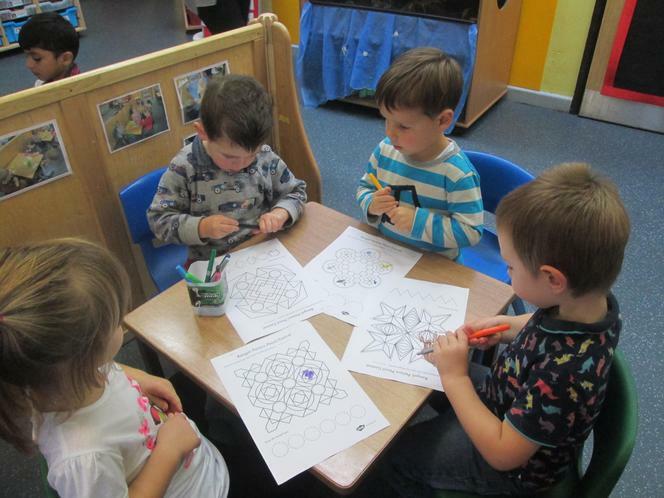 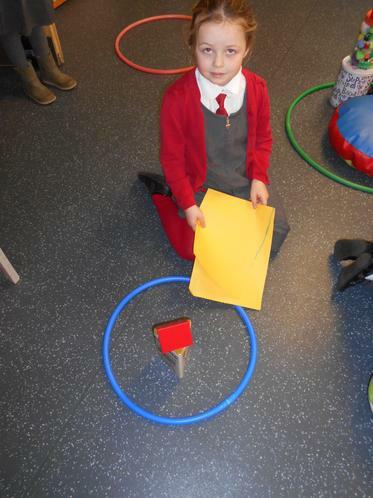 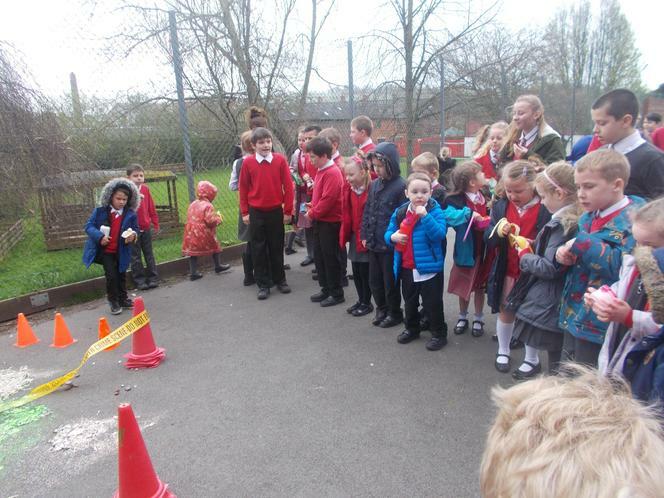 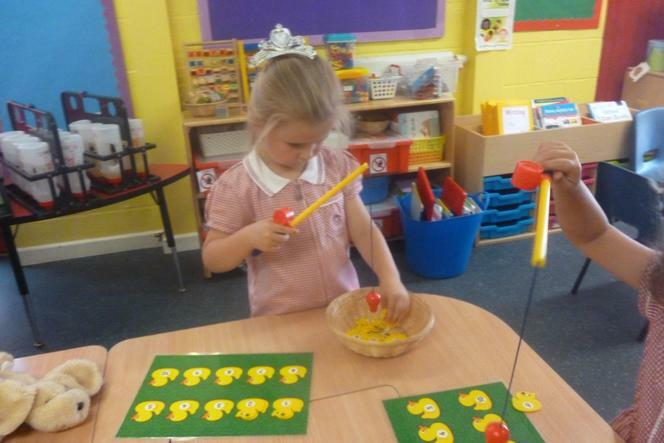 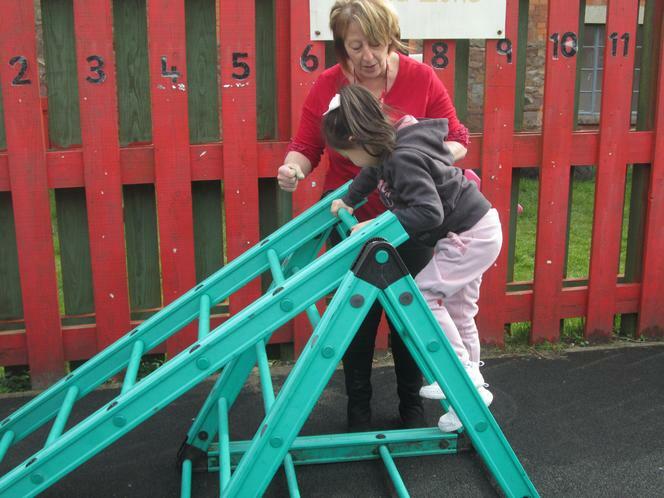 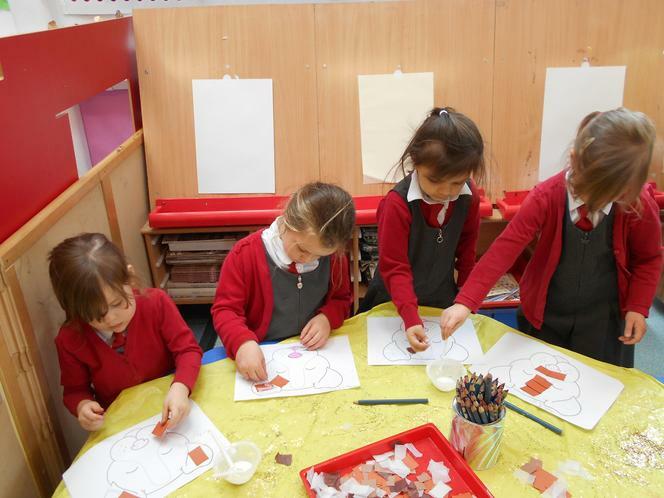 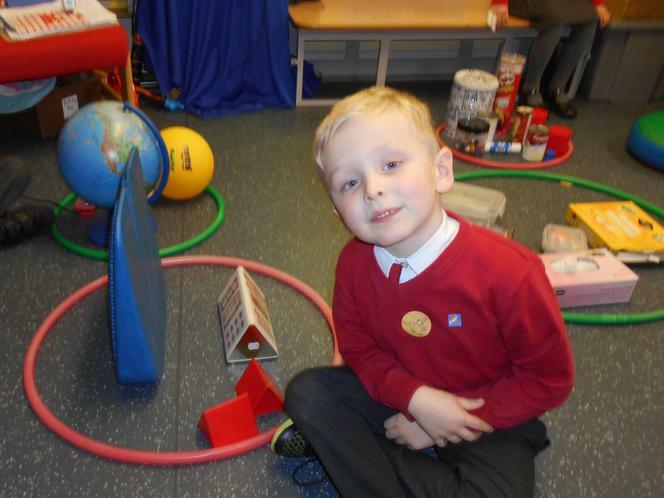 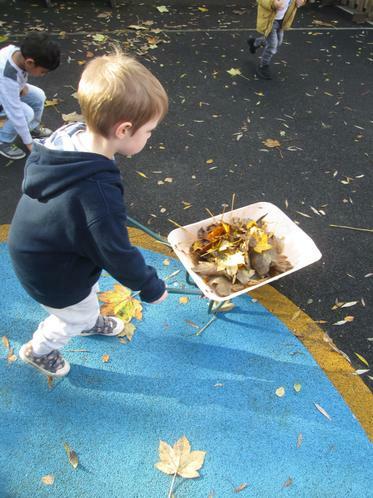 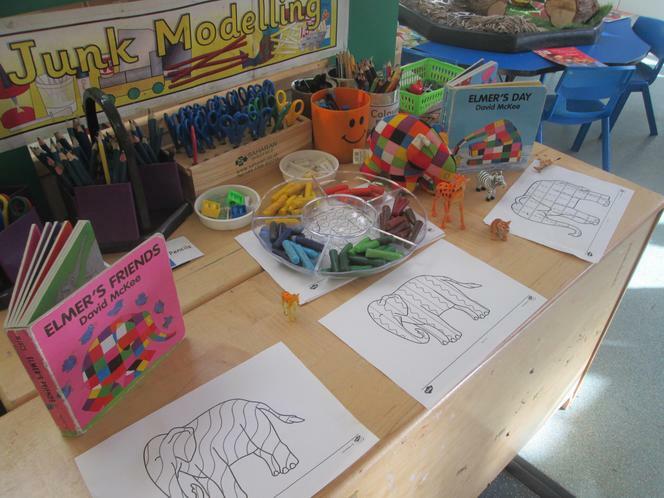 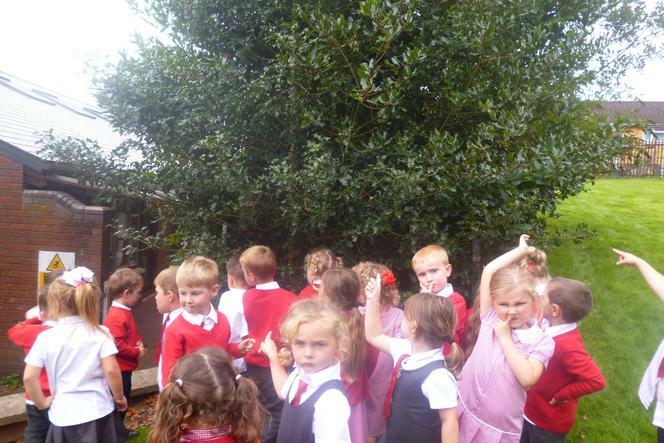 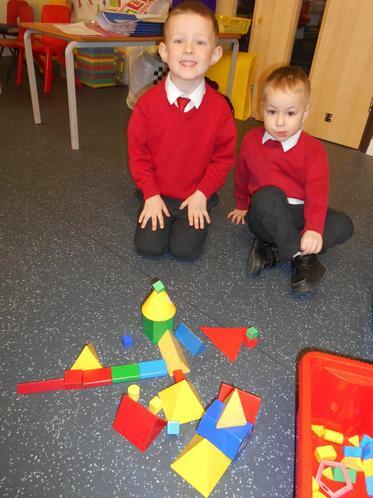 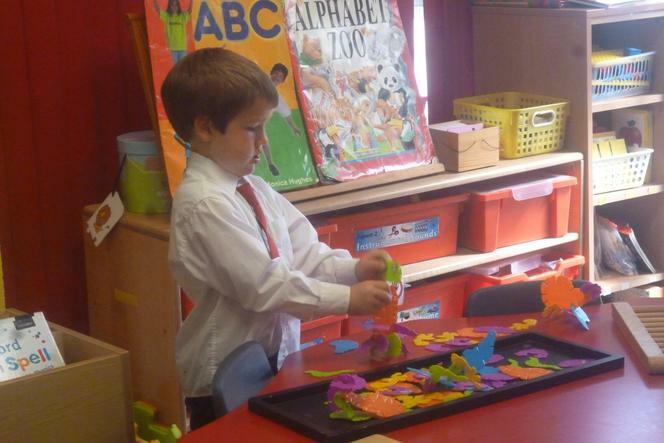 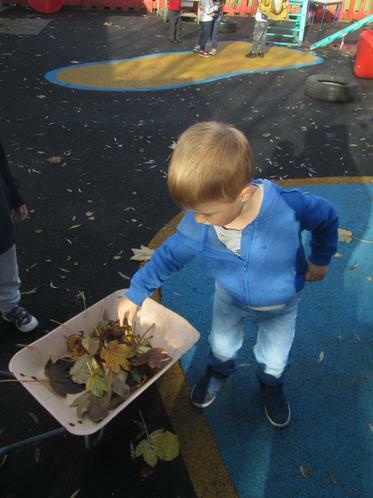 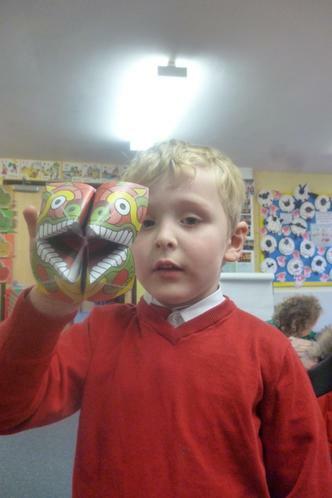 Big Acorns have been exploring 3D shapes including making shape models and going on a shape hunt around school. 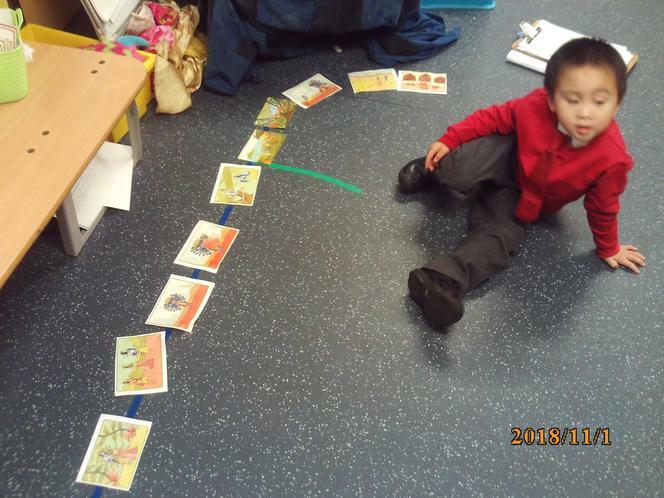 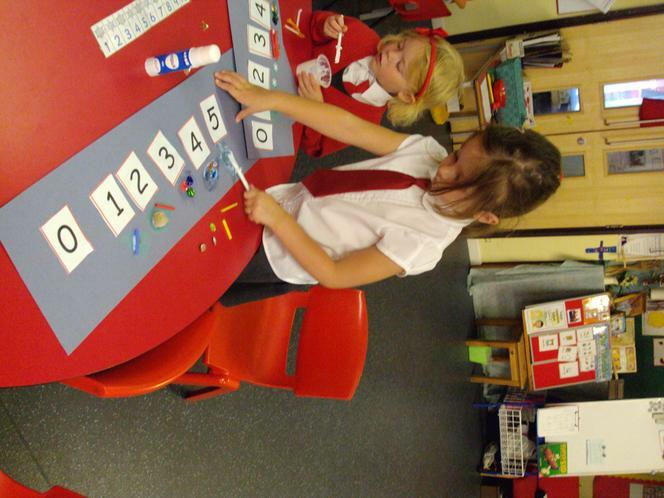 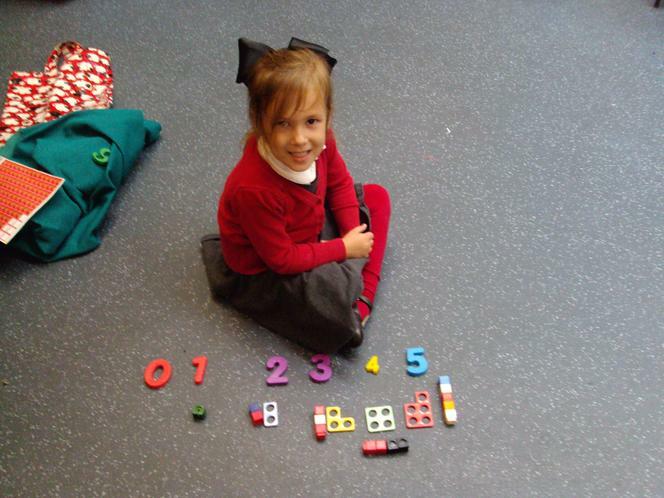 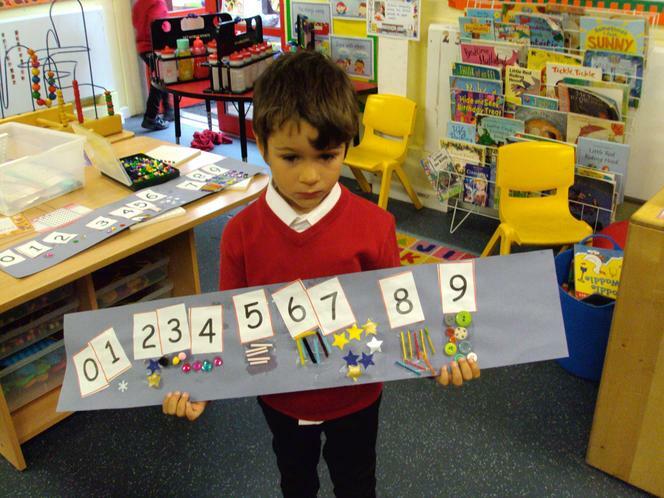 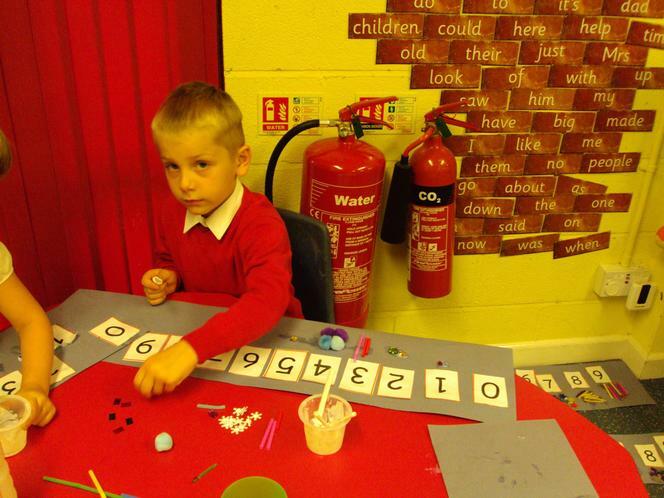 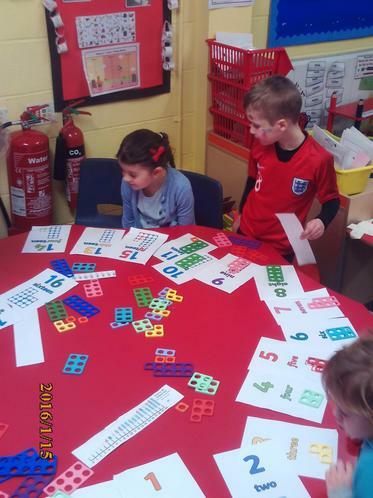 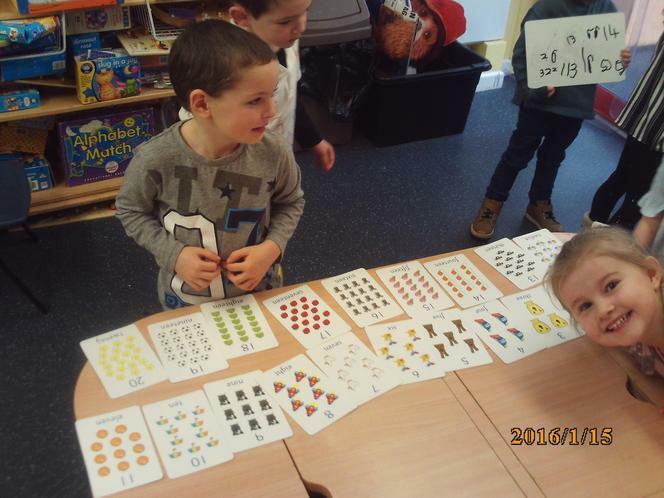 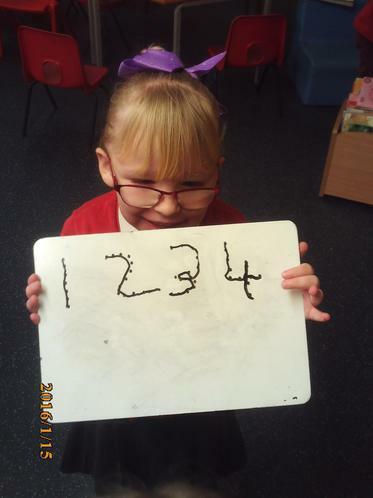 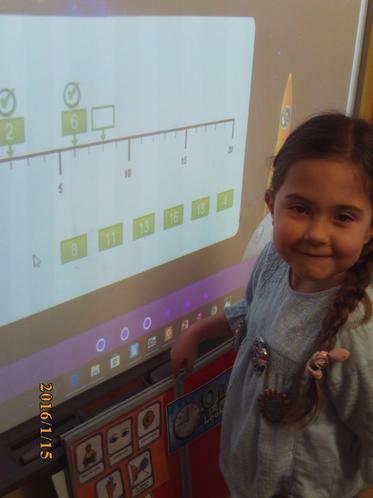 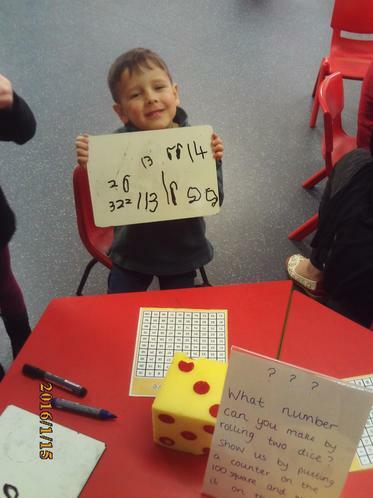 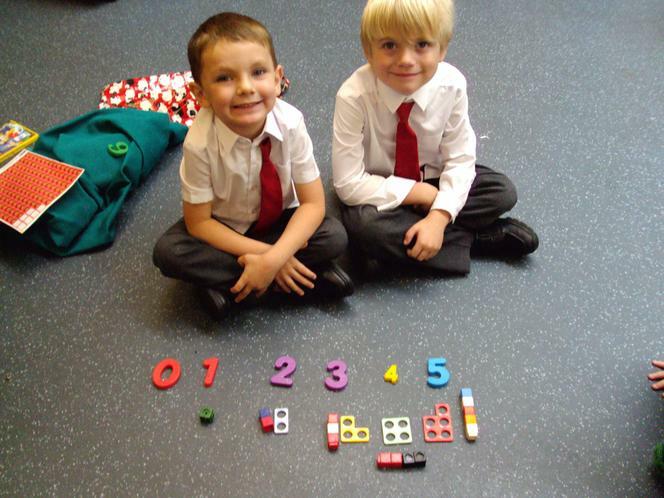 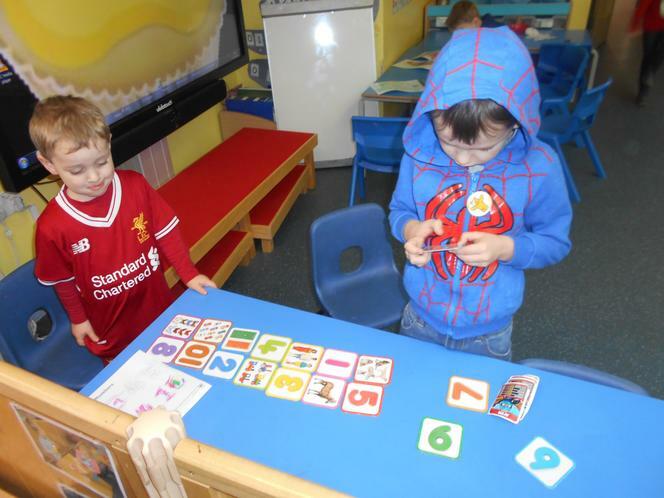 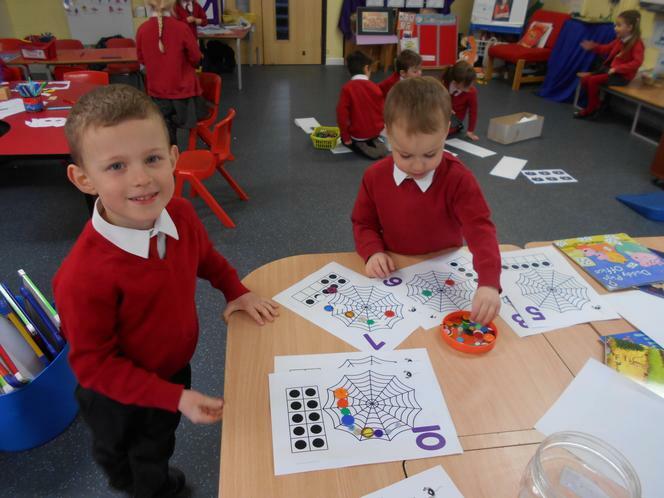 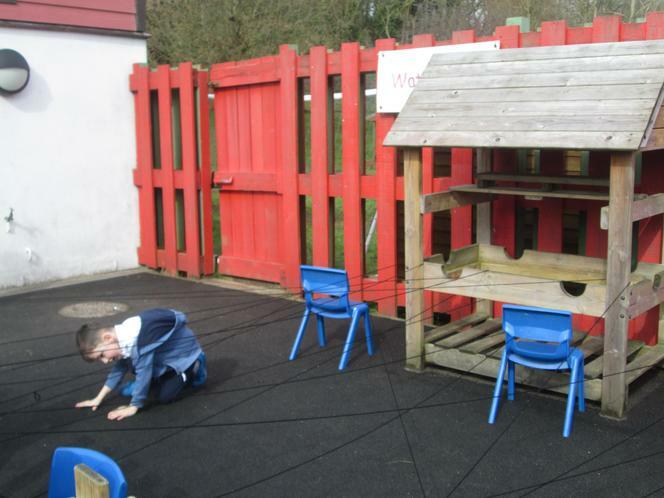 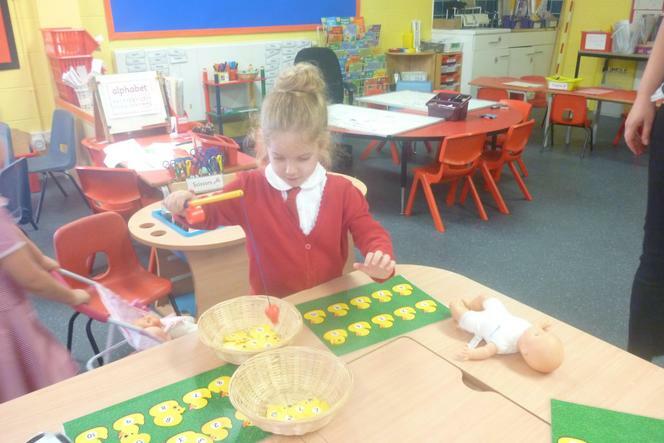 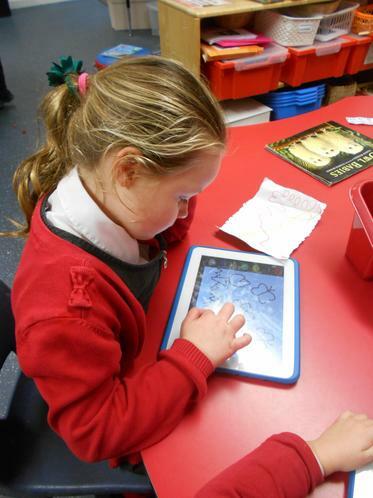 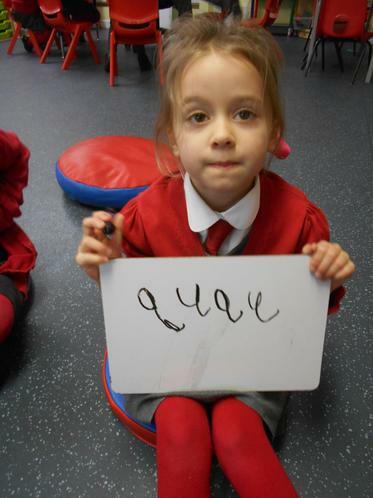 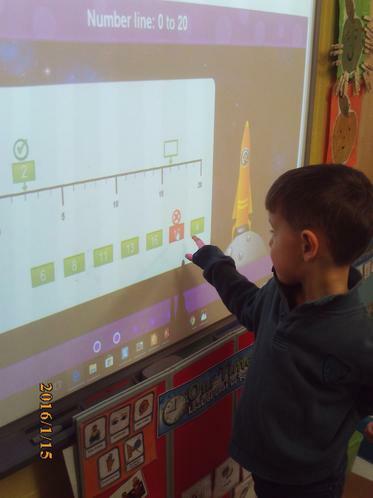 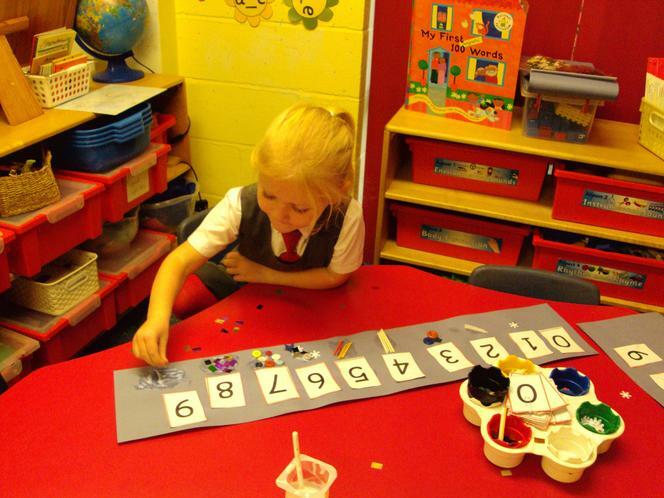 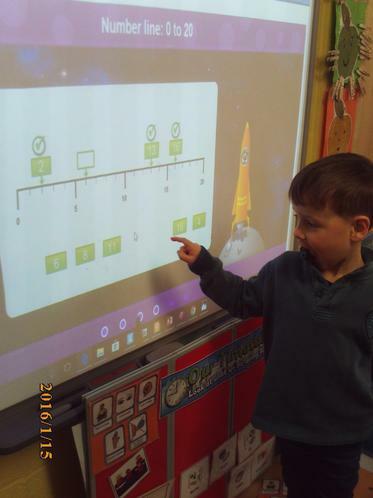 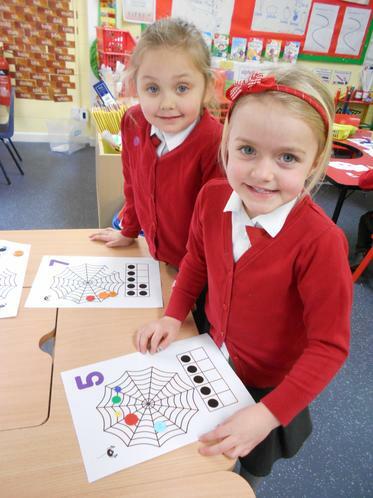 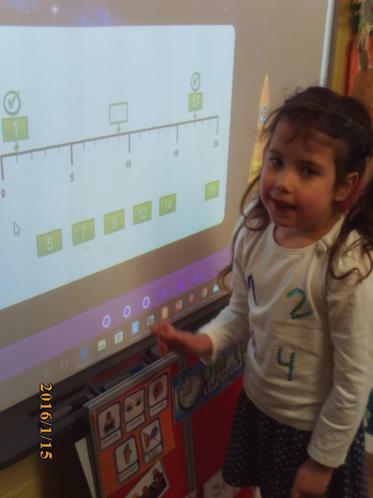 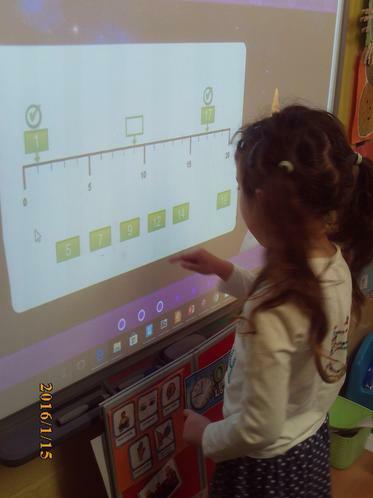 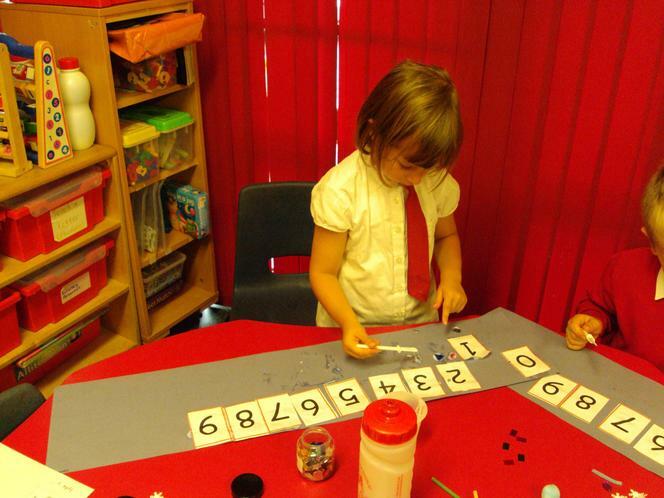 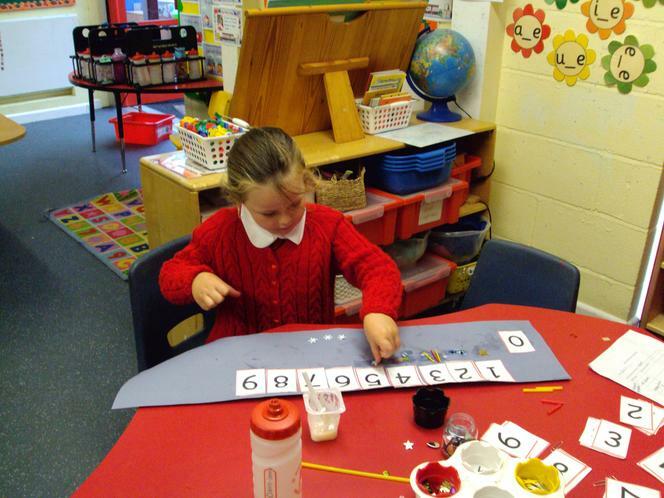 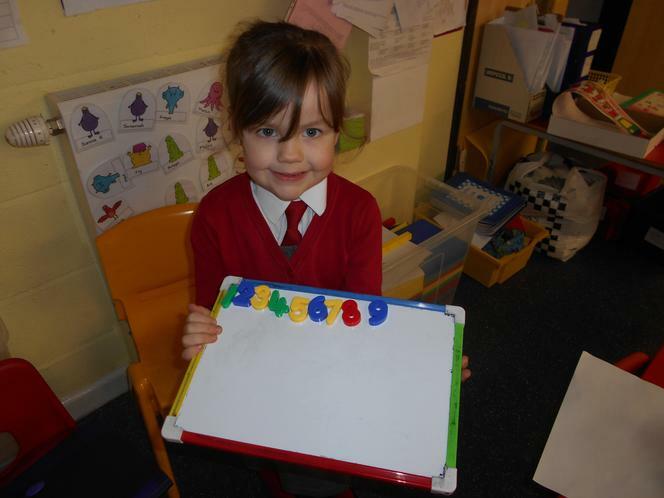 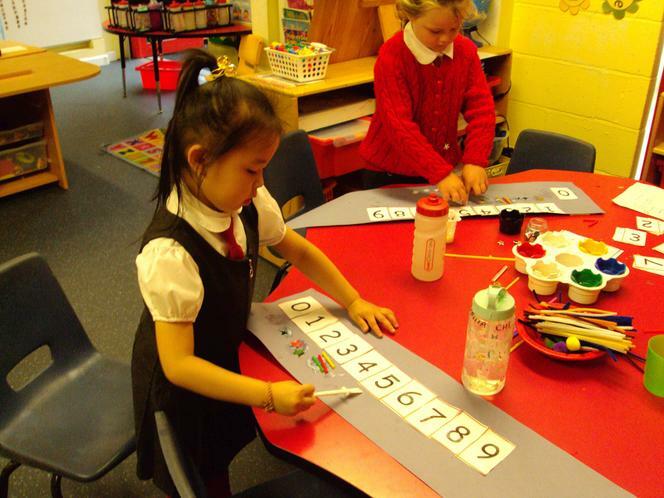 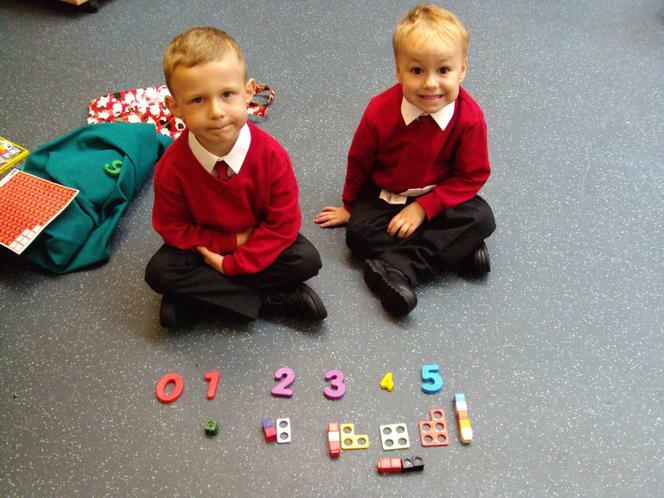 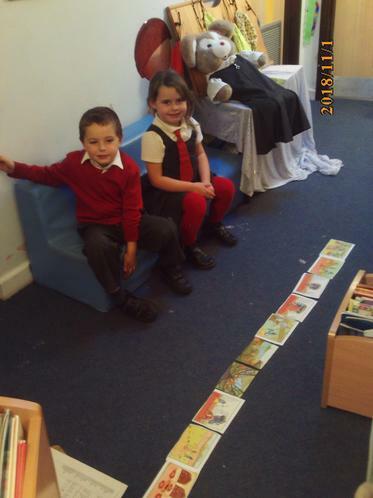 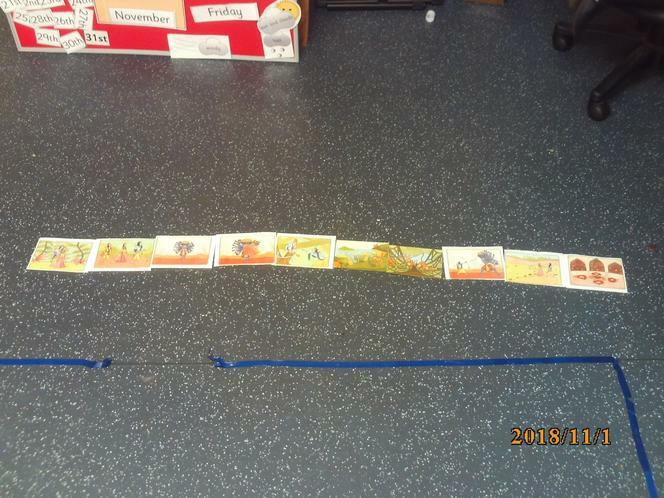 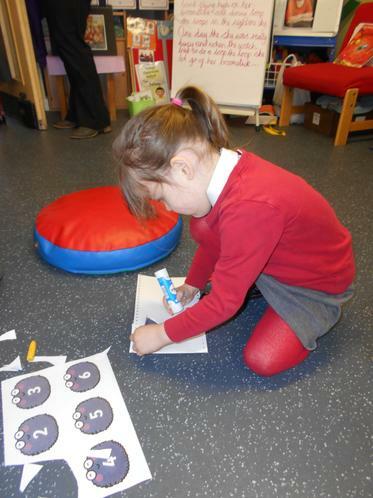 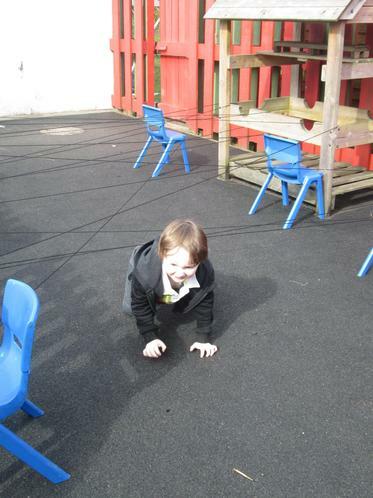 Children accessing the continuous provision independently for recognising numerals. 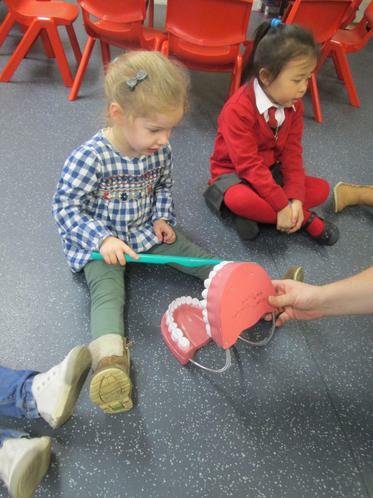 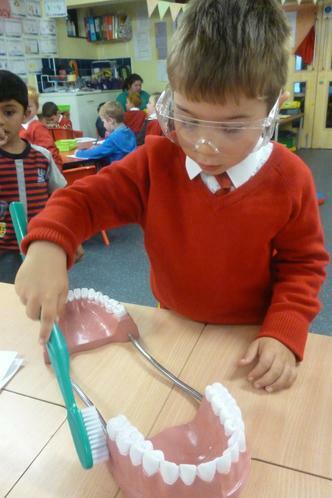 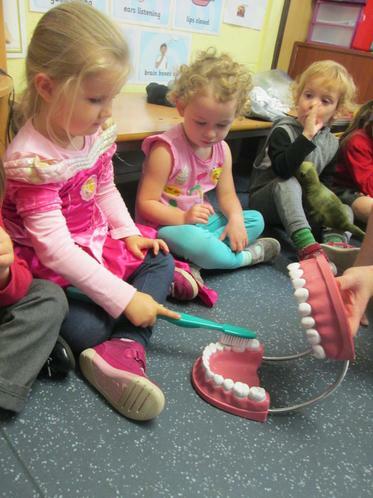 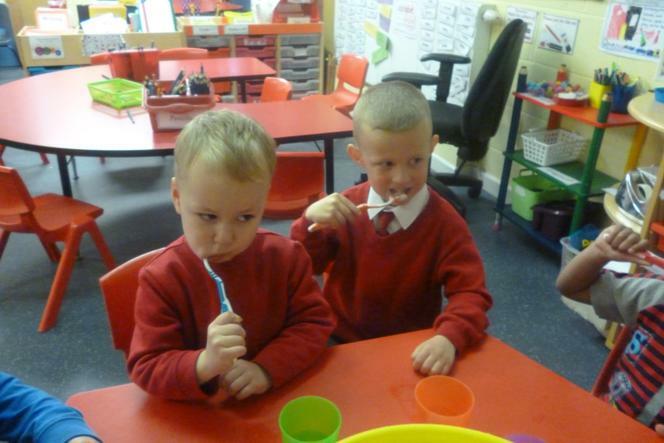 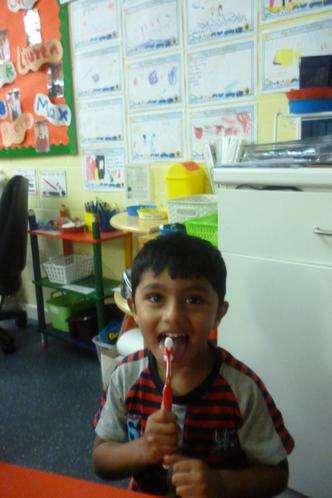 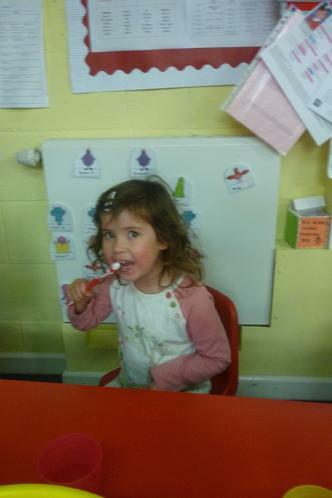 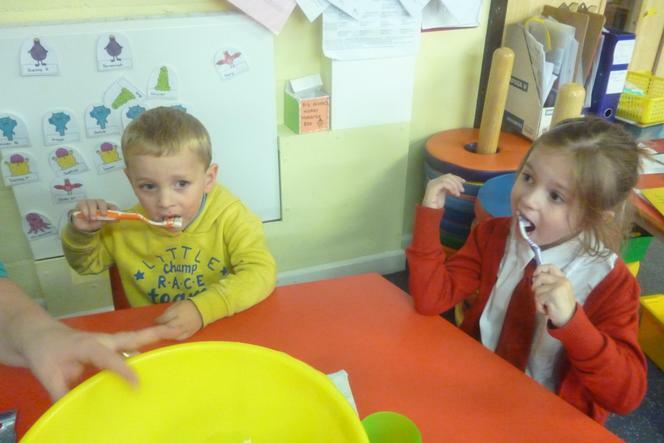 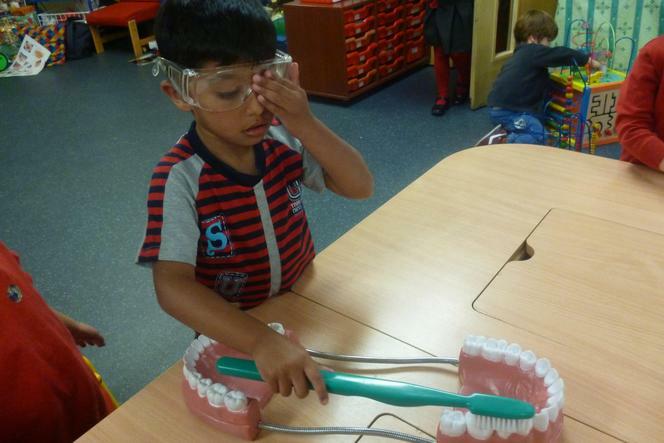 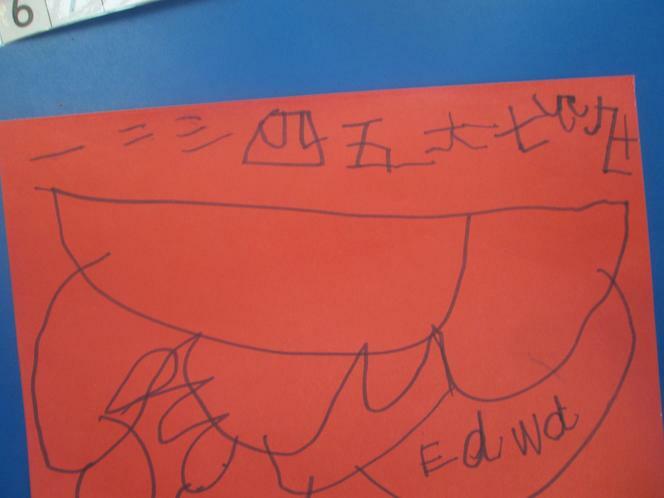 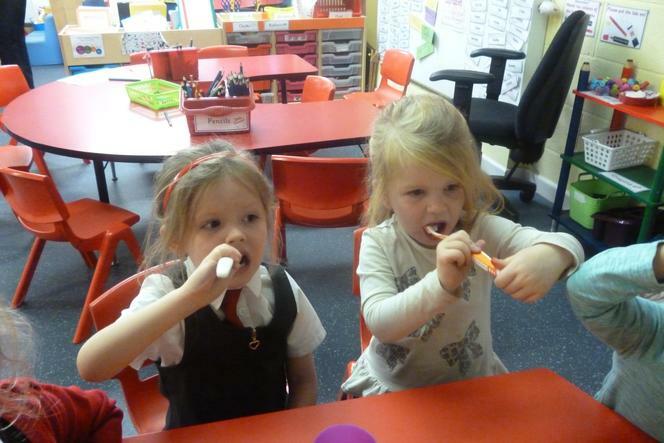 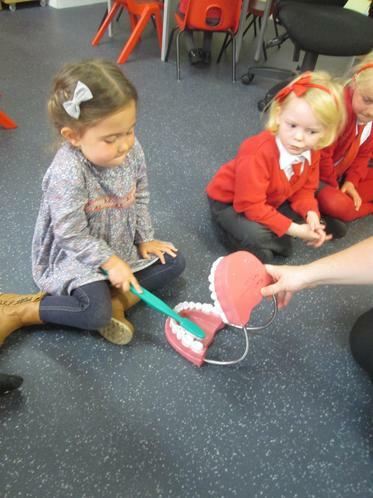 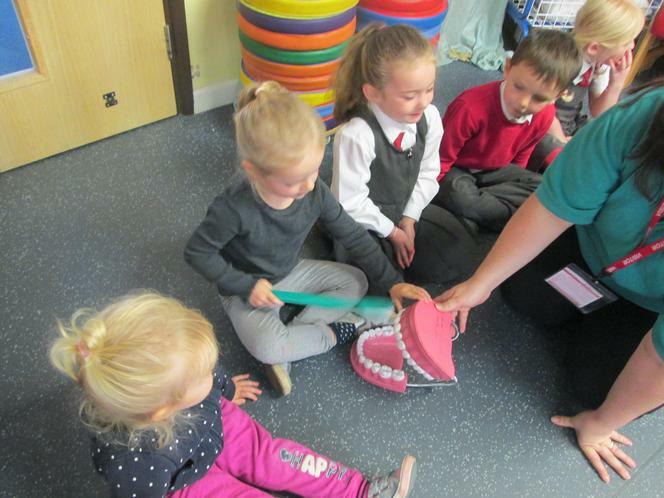 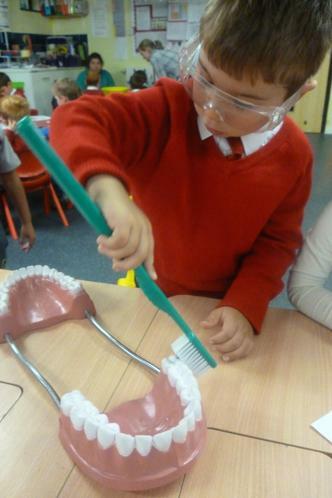 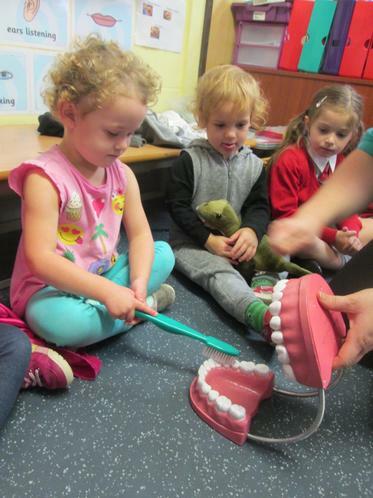 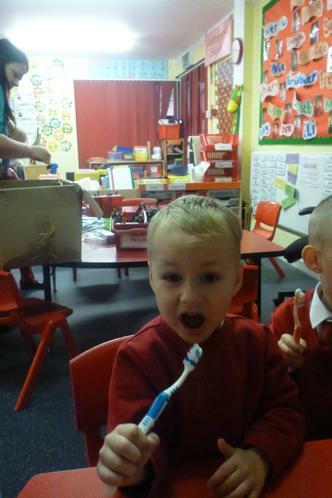 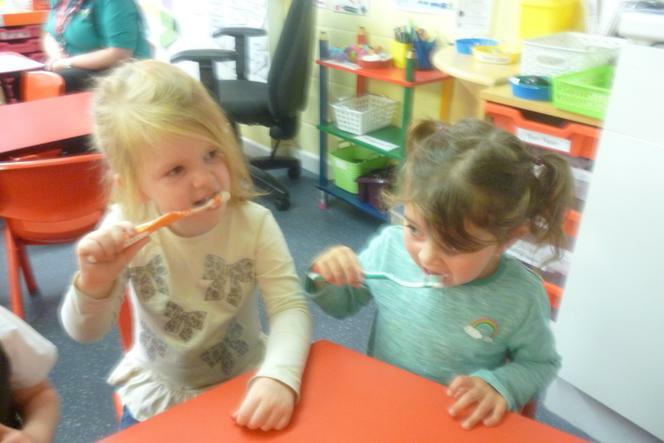 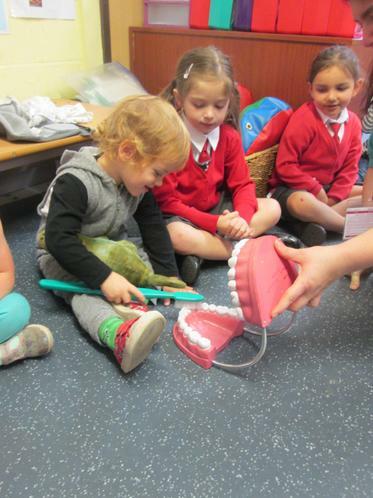 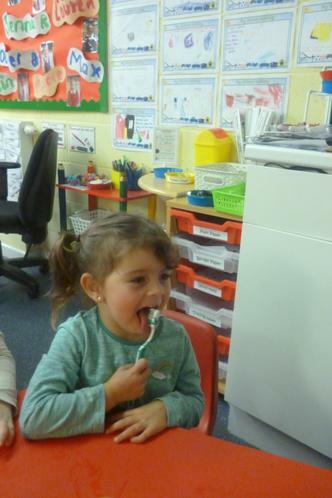 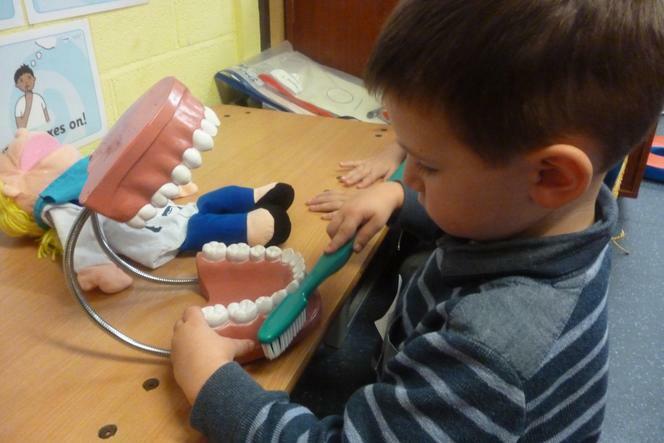 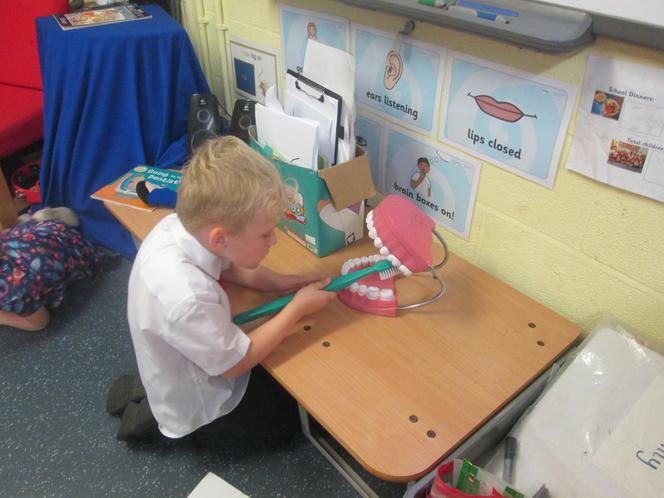 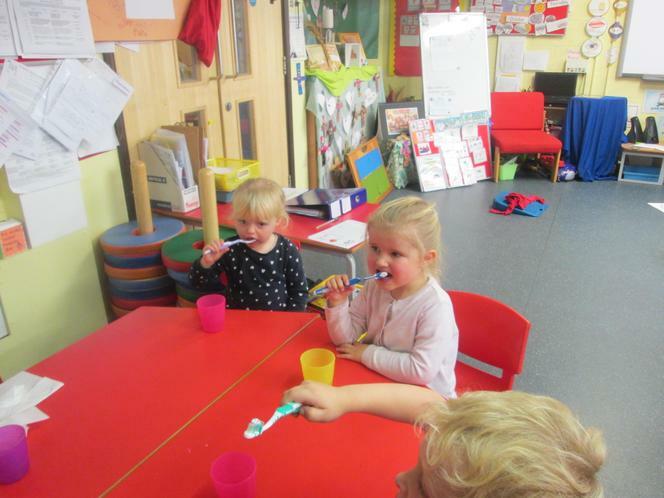 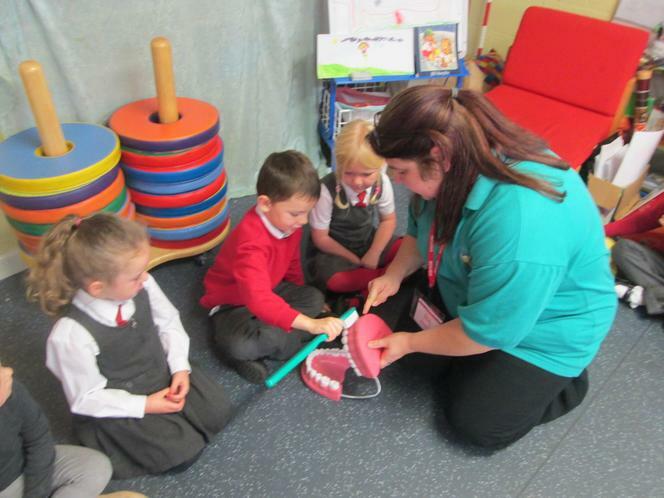 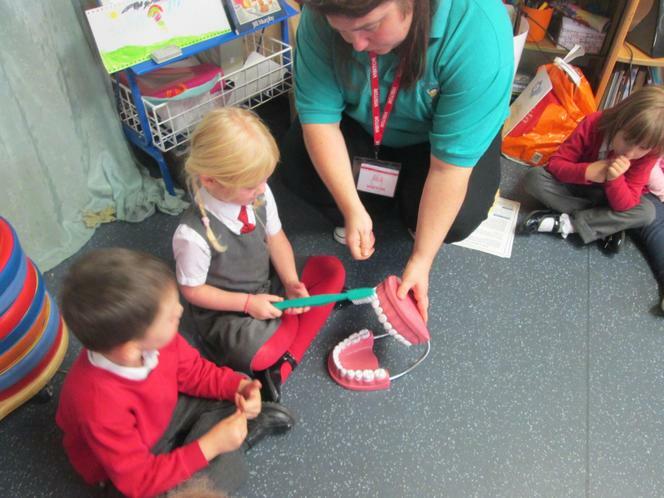 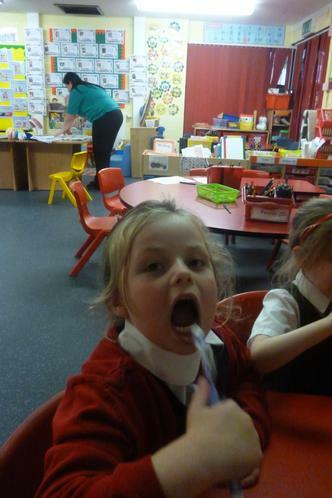 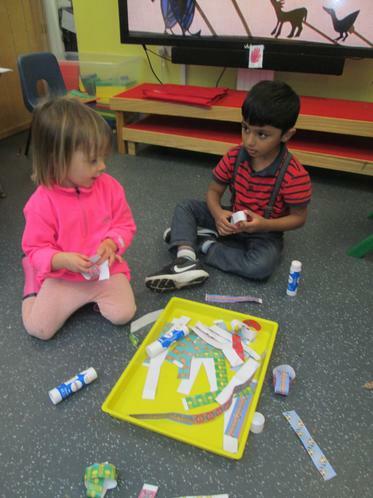 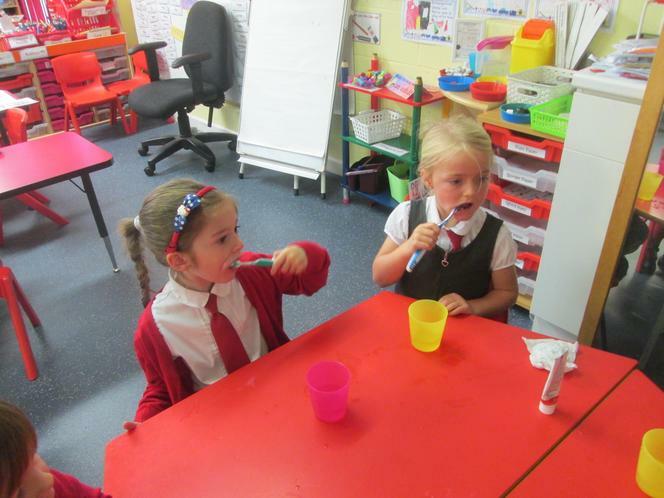 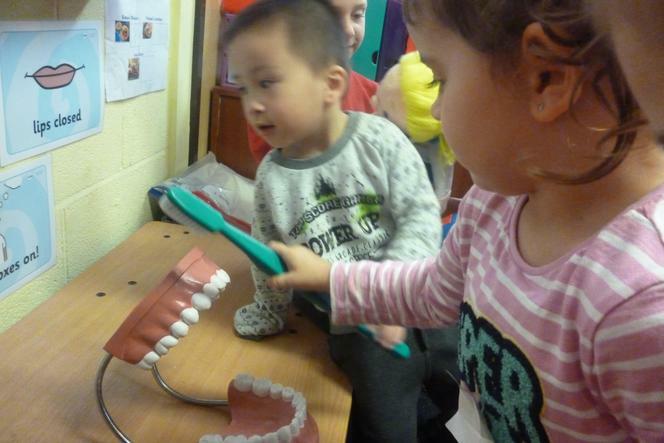 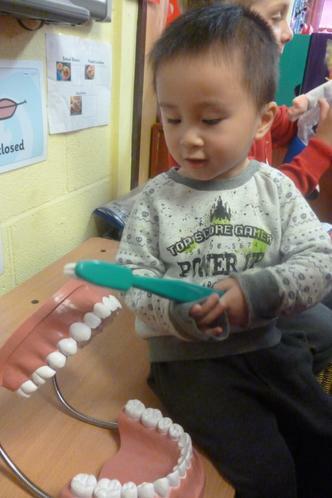 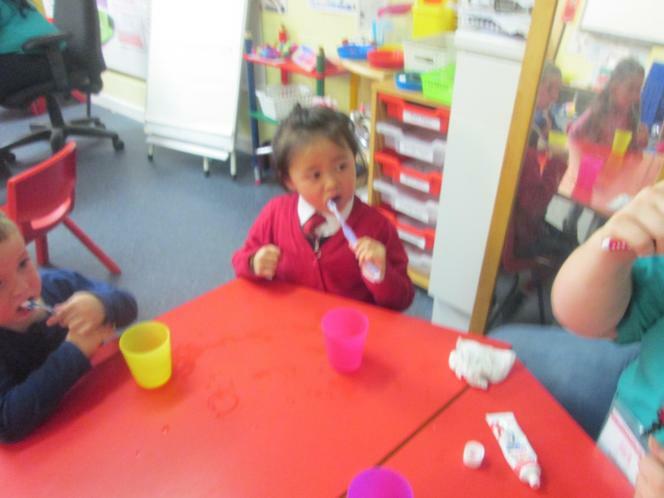 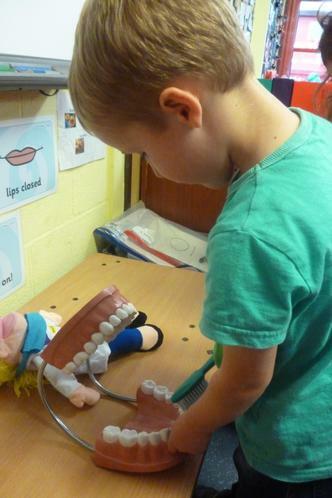 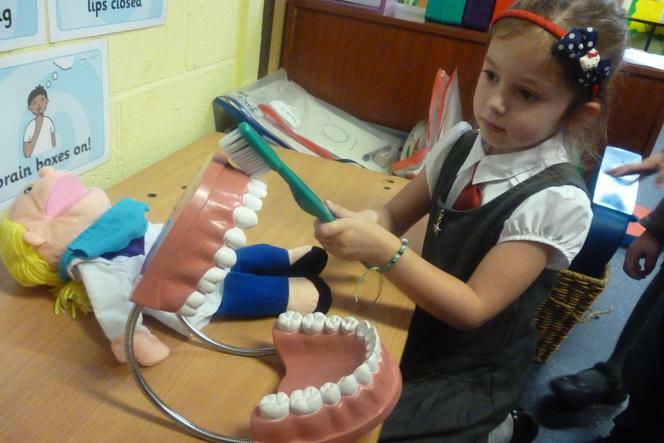 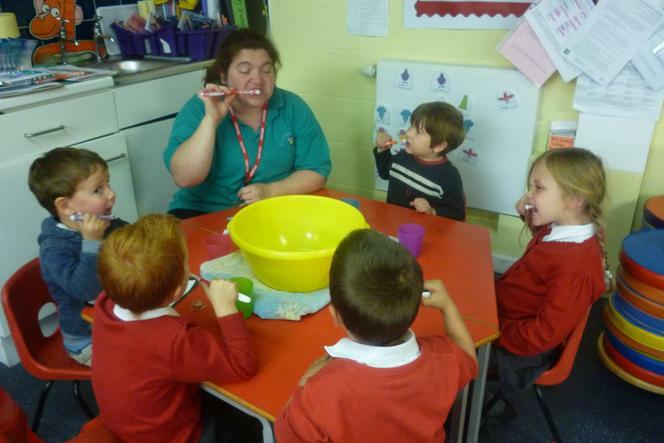 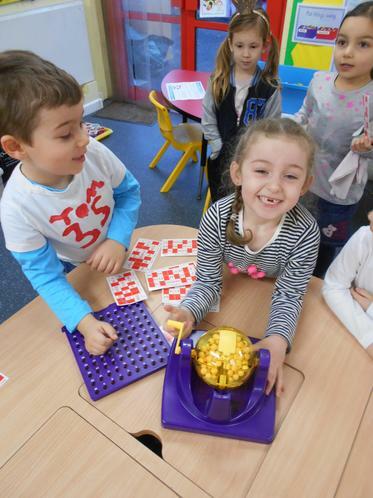 Toothtastic Fun! 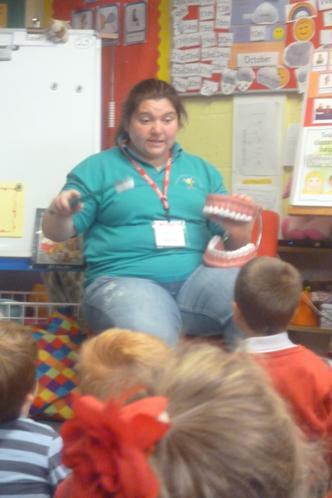 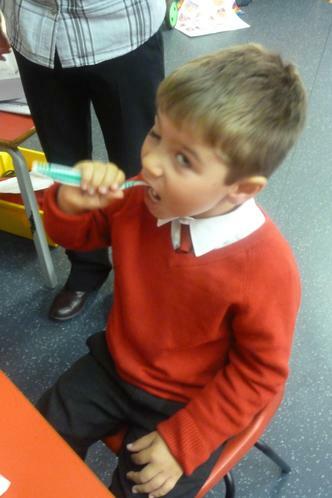 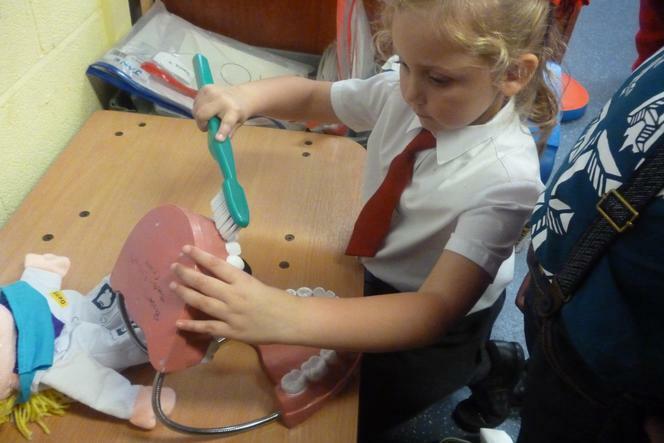 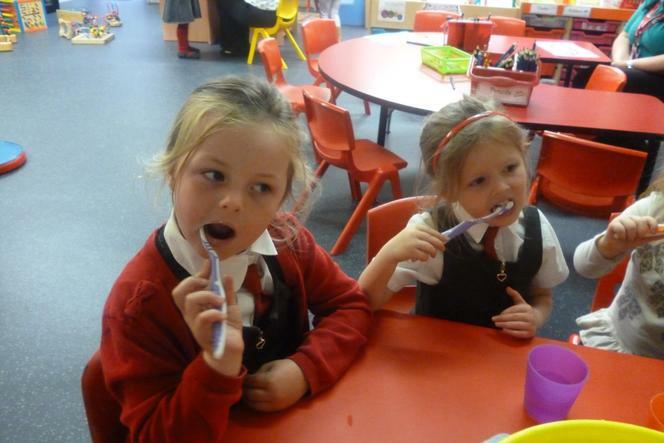 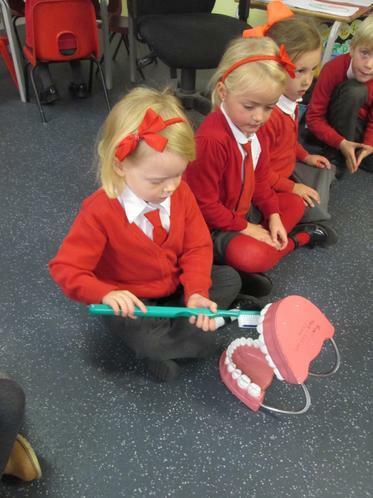 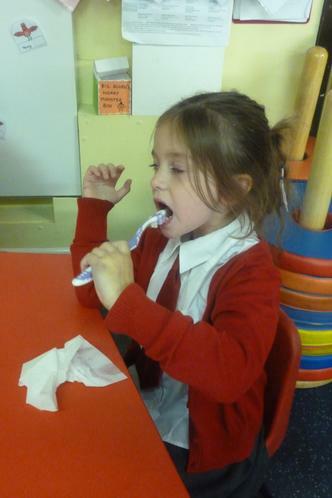 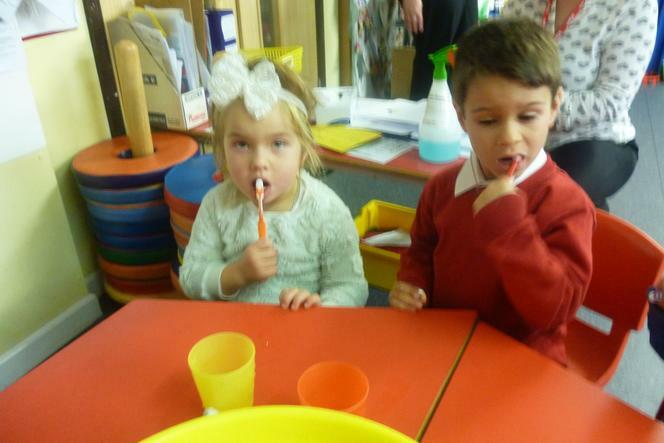 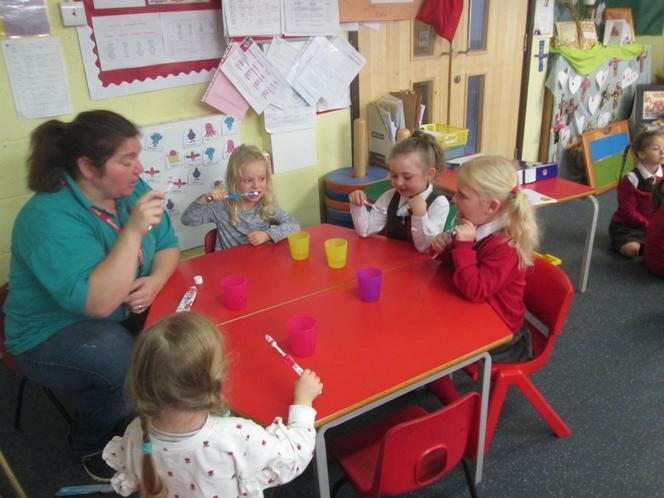 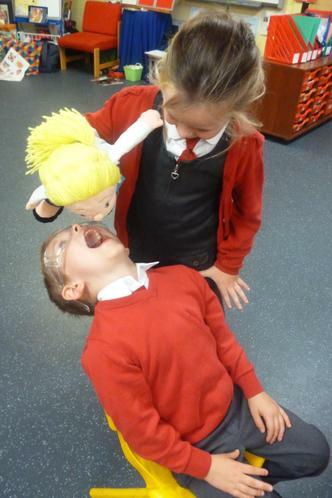 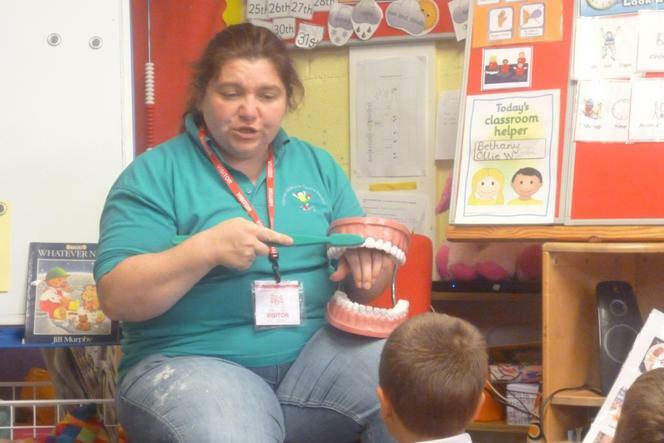 Learning about how to keep our teeth clean and healthy. 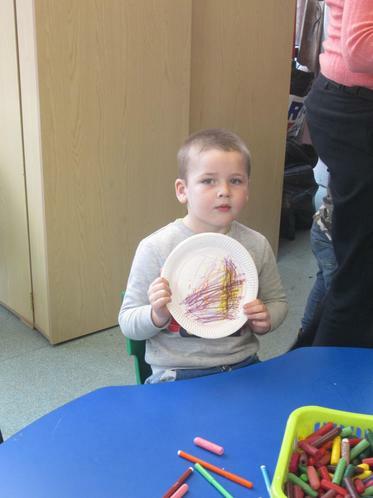 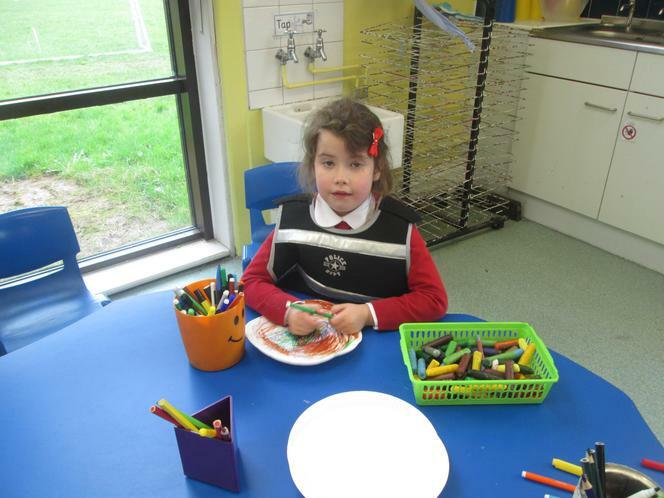 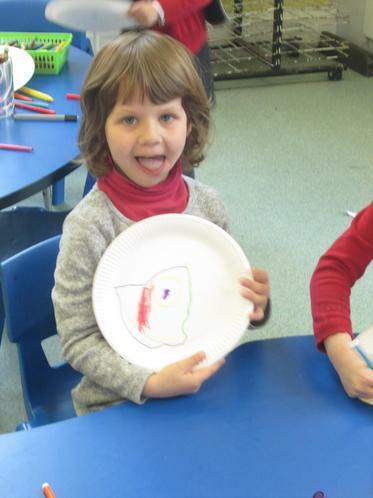 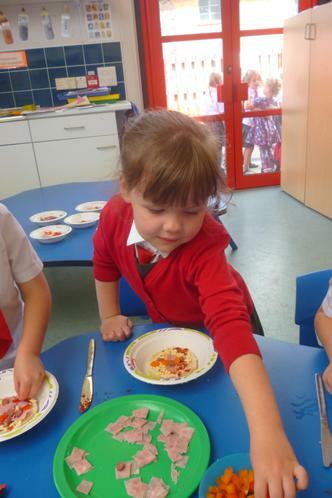 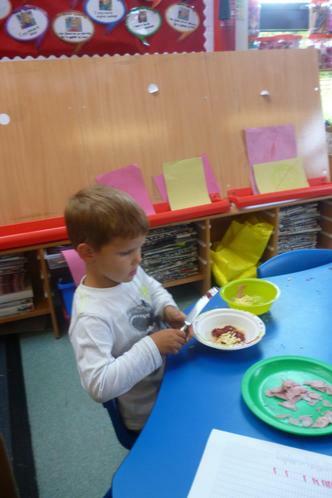 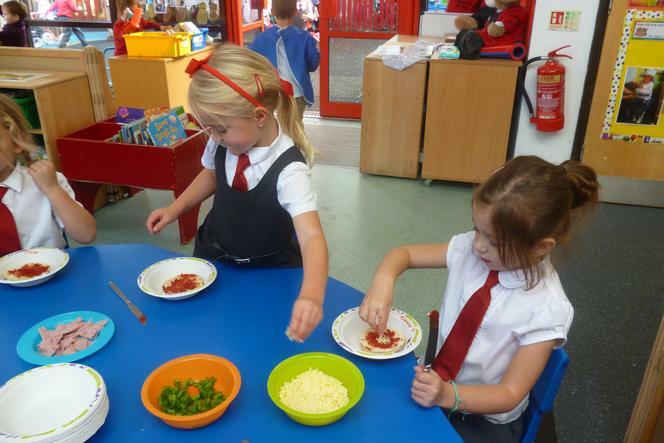 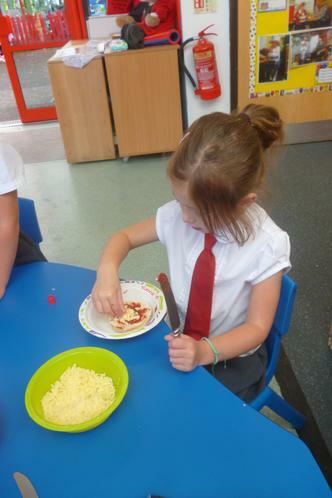 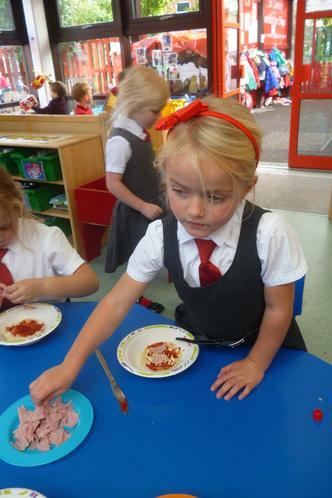 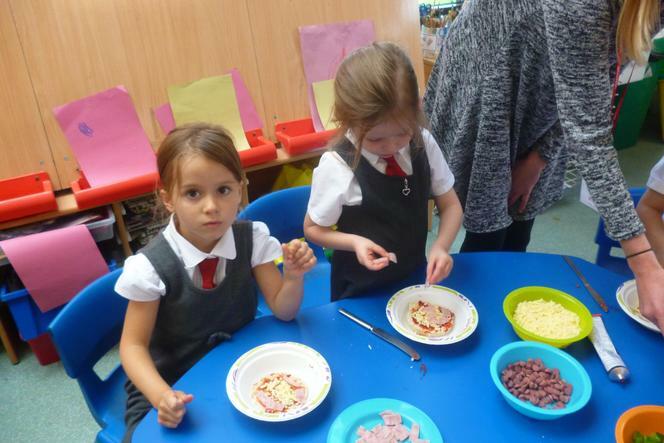 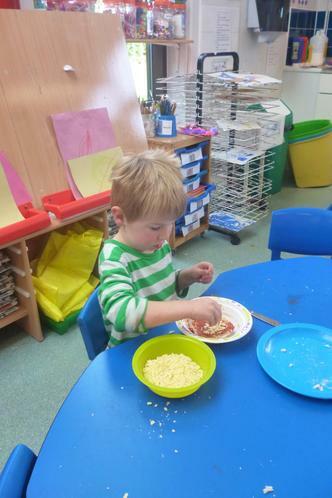 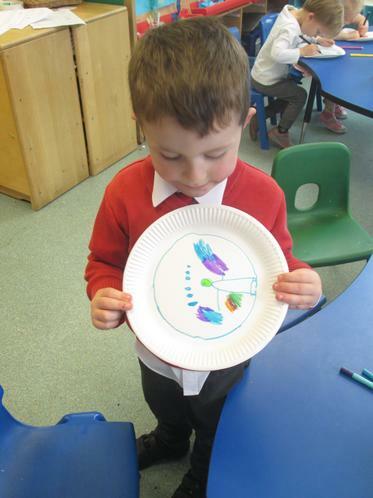 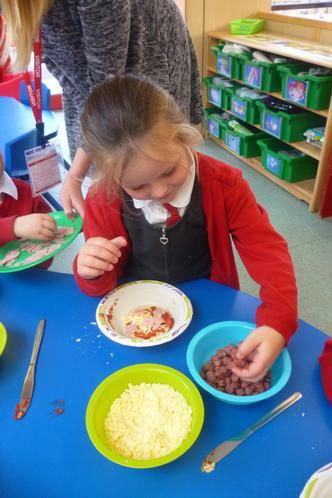 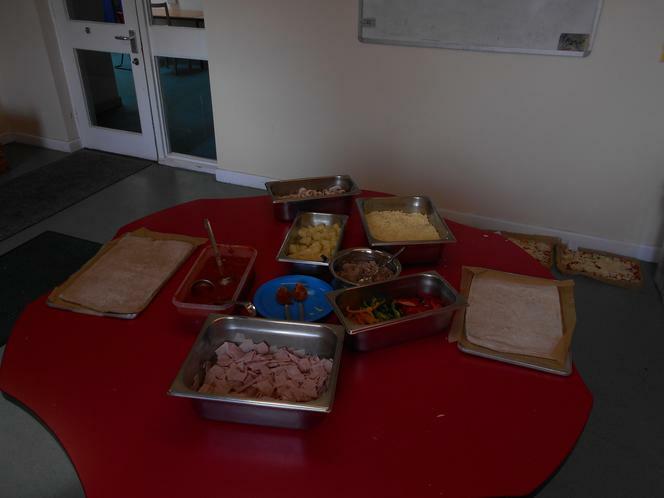 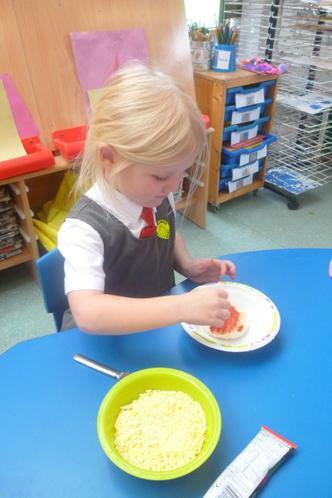 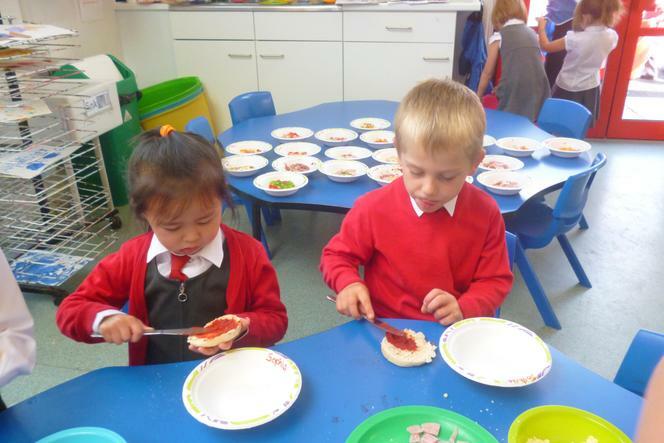 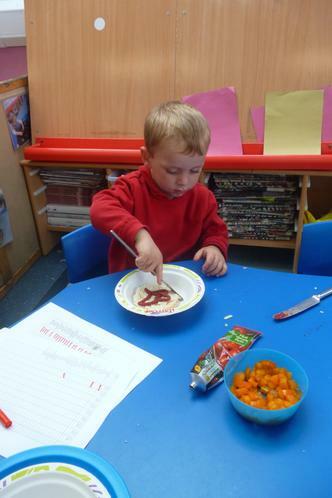 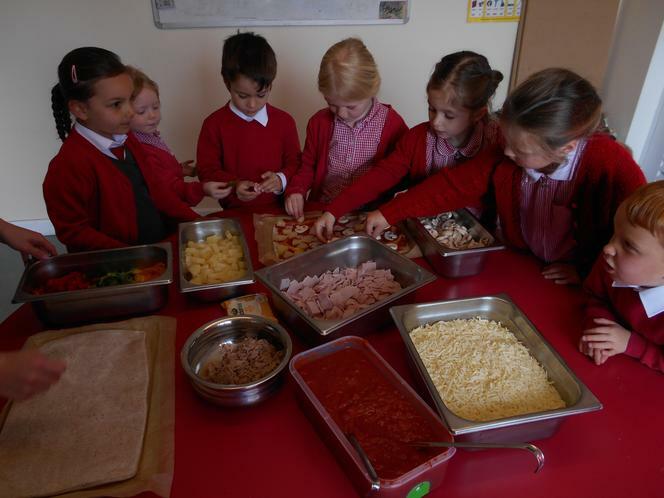 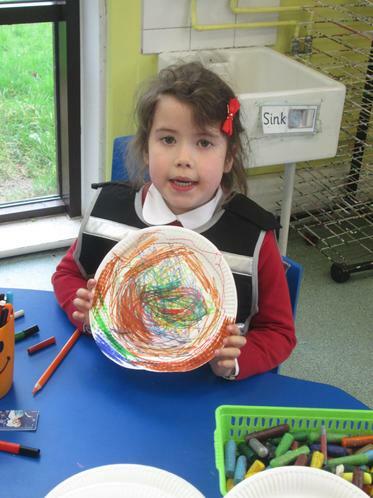 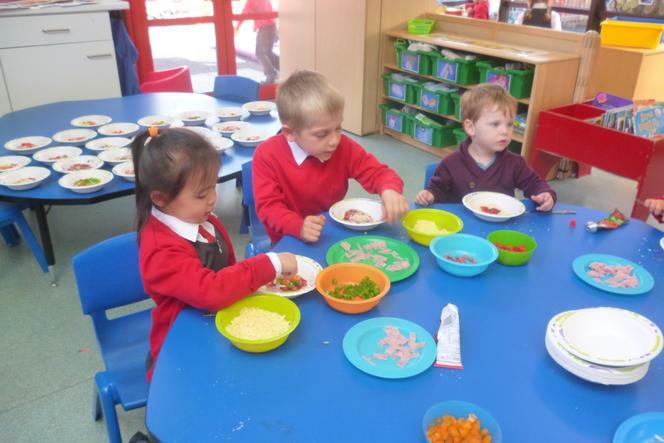 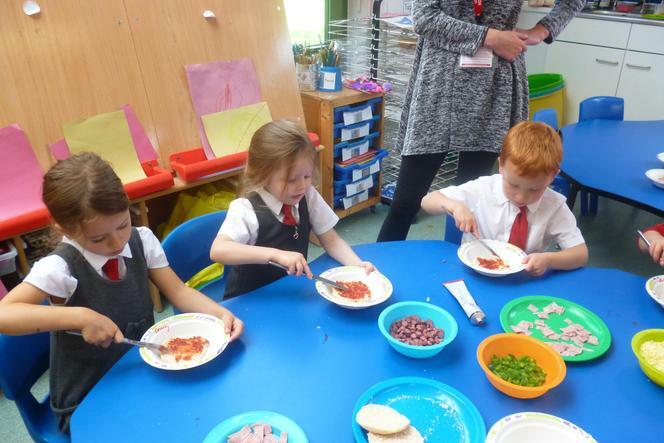 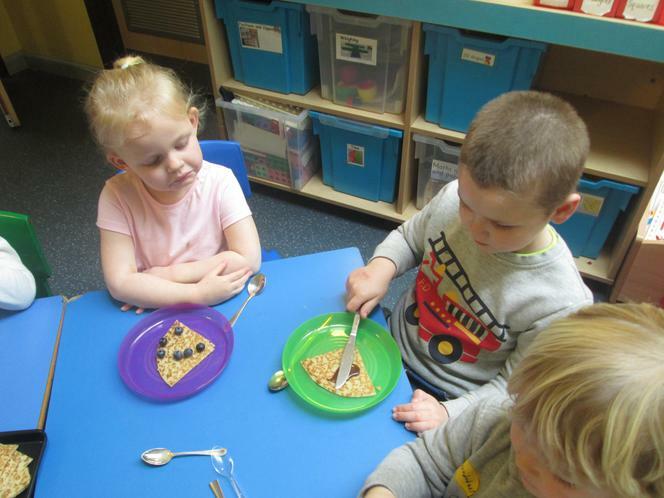 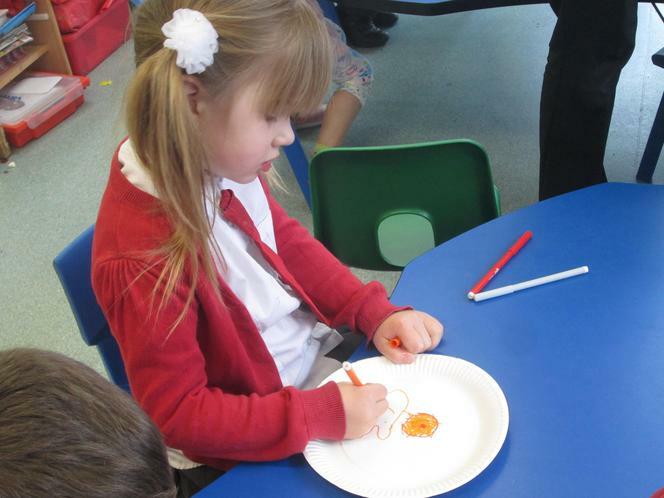 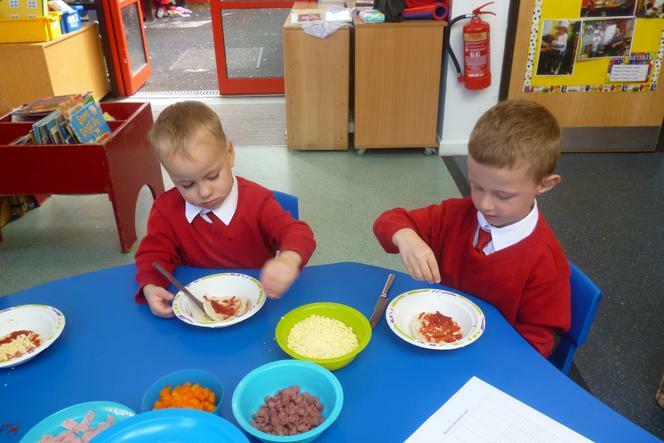 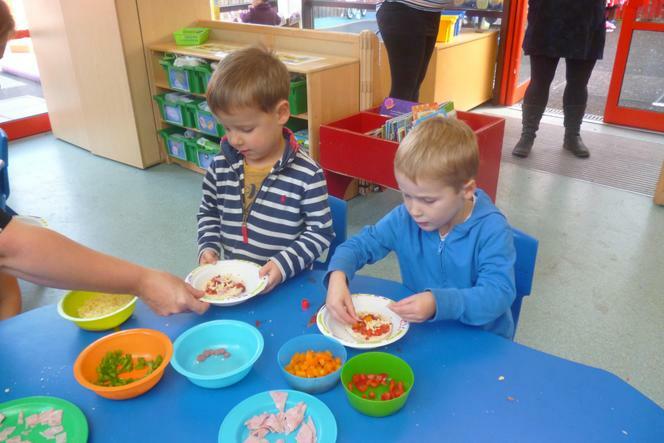 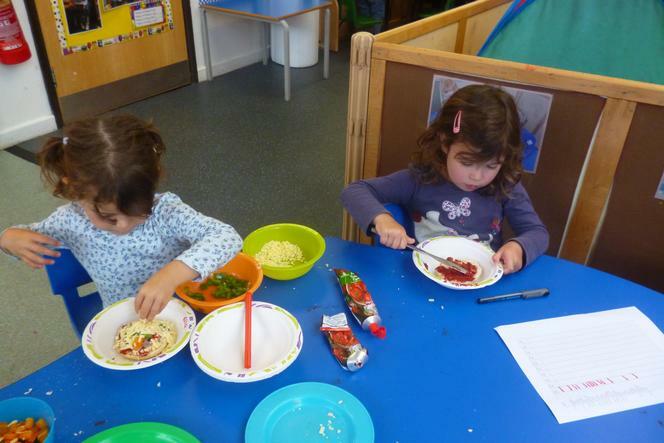 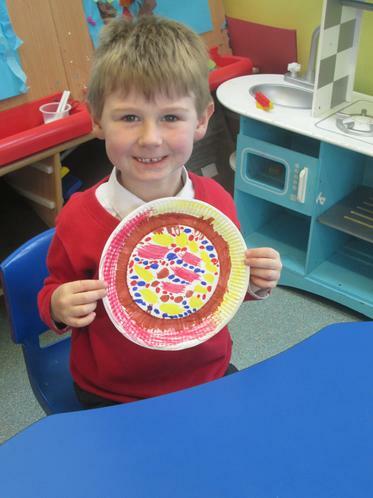 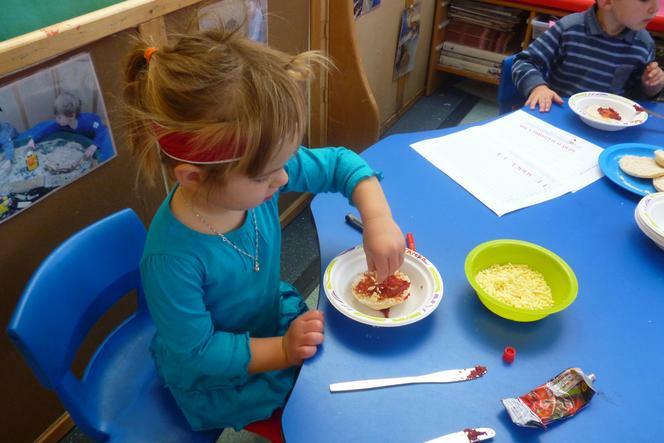 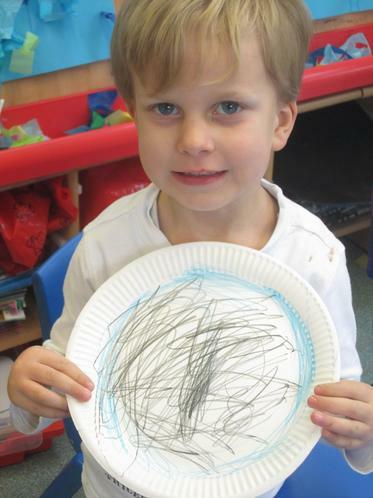 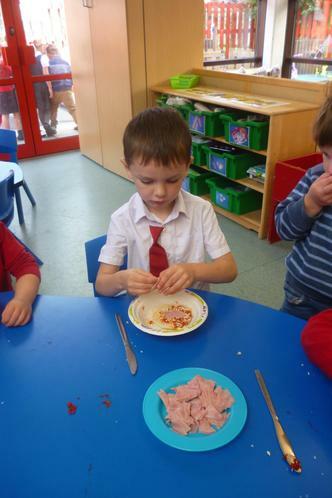 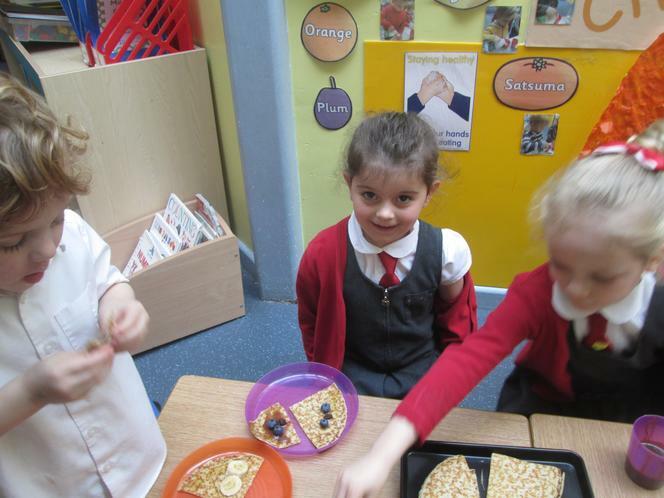 Acorns enjoyed making their own 2d shape pizzas. 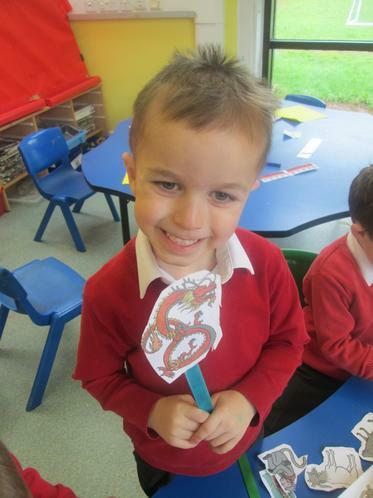 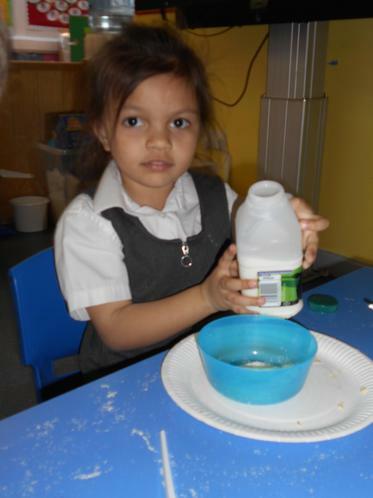 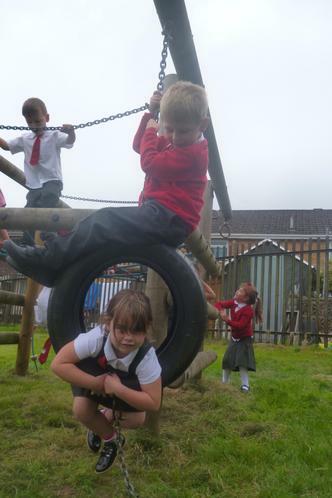 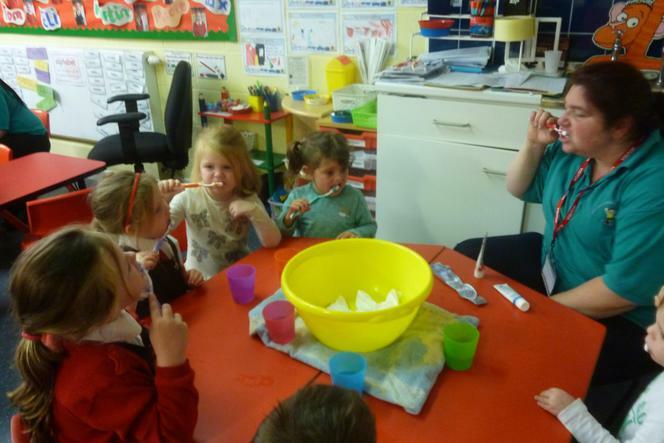 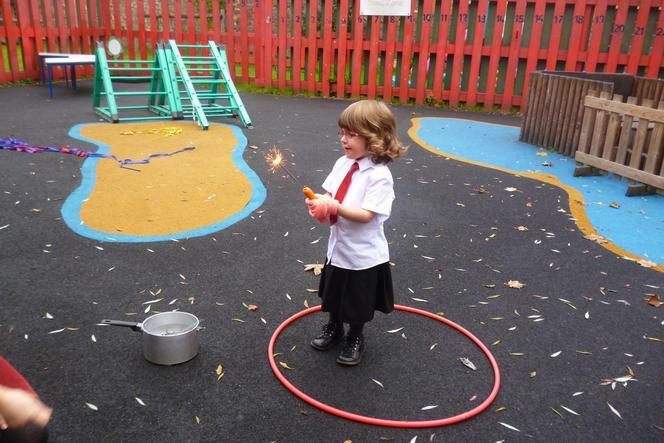 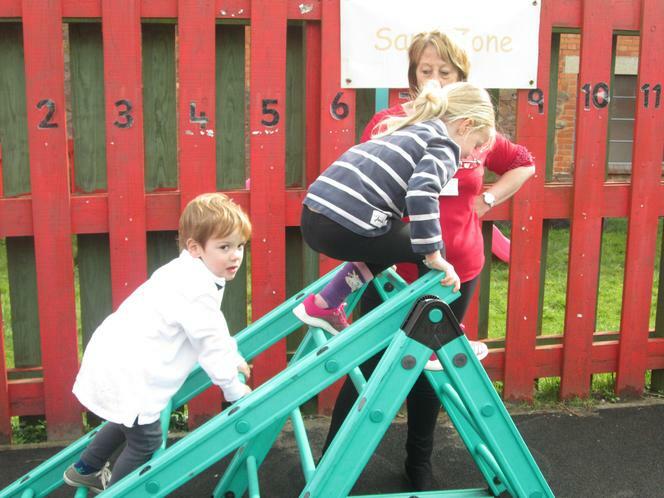 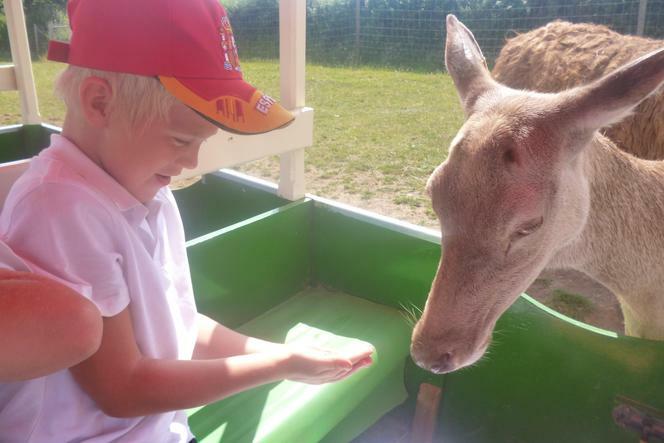 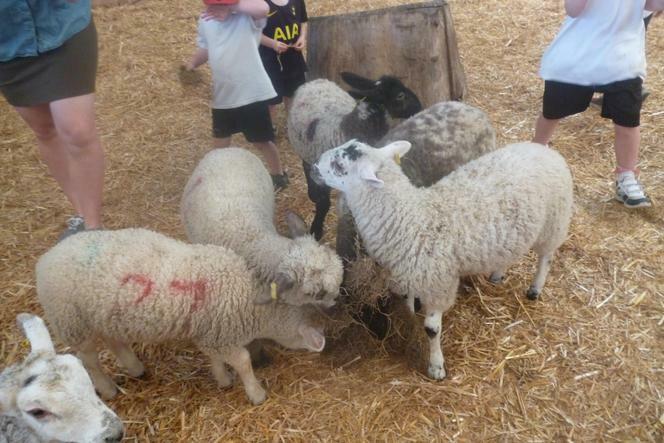 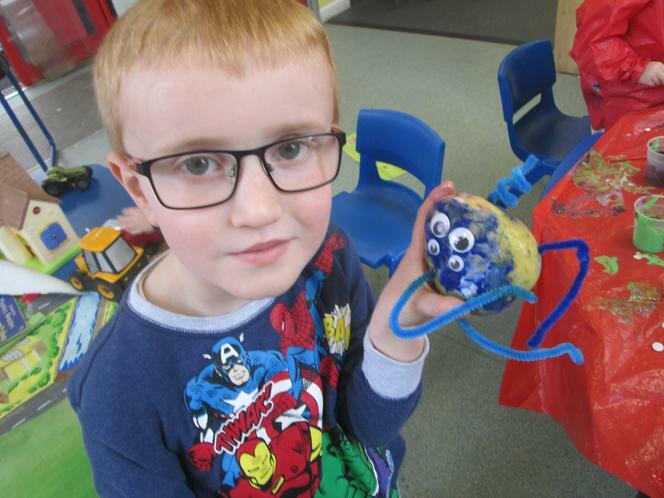 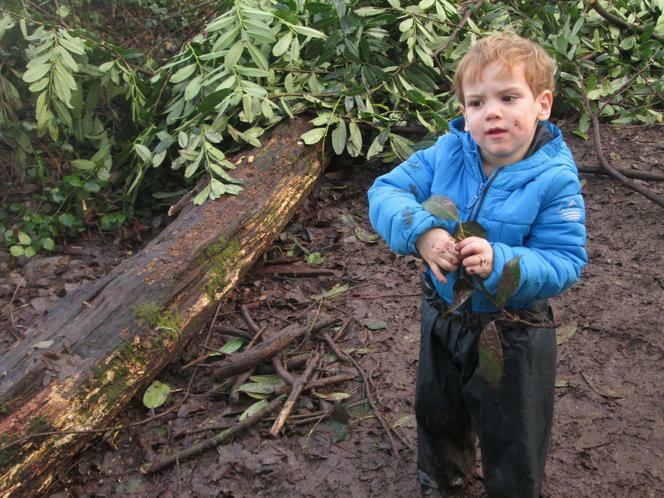 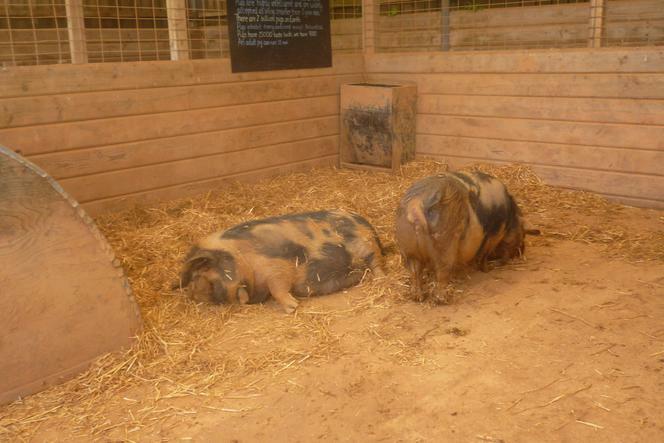 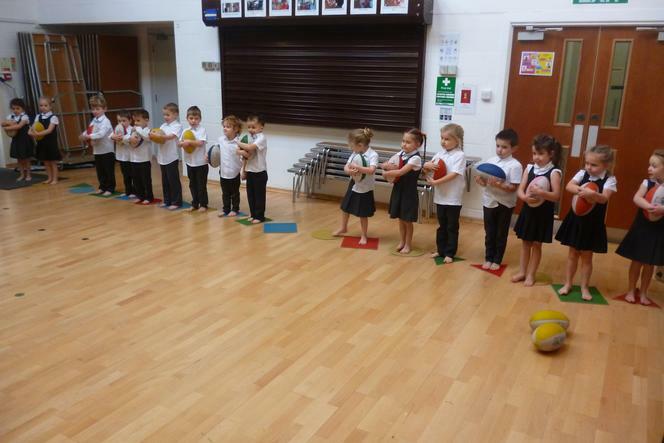 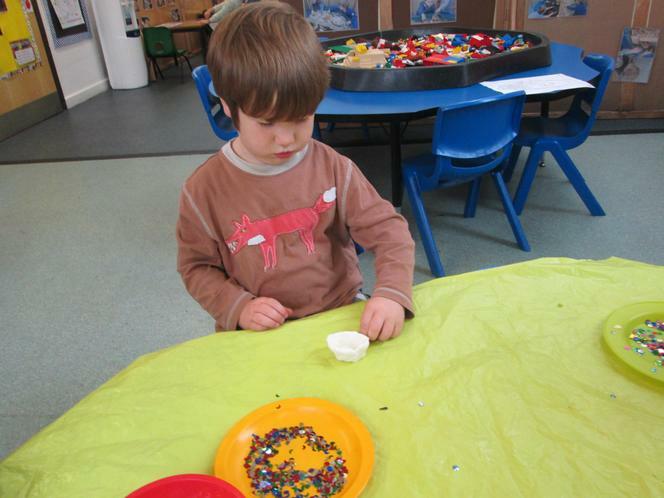 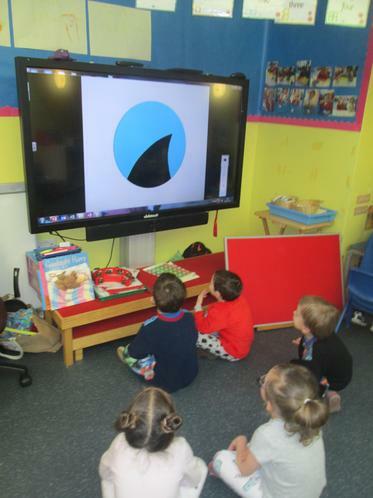 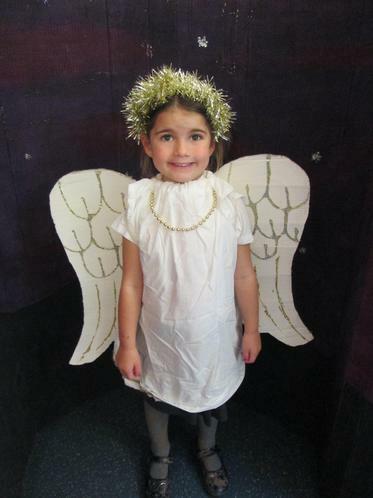 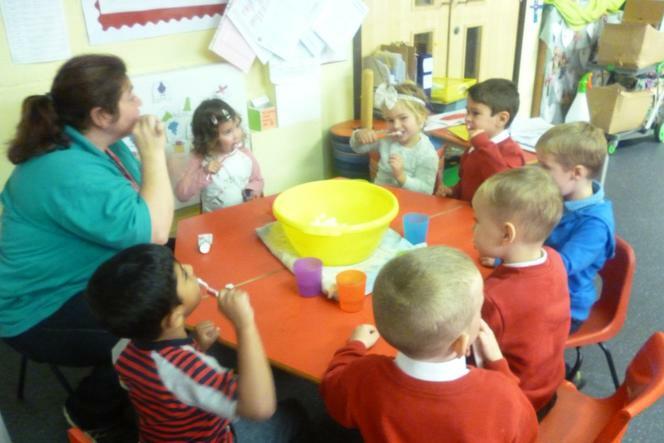 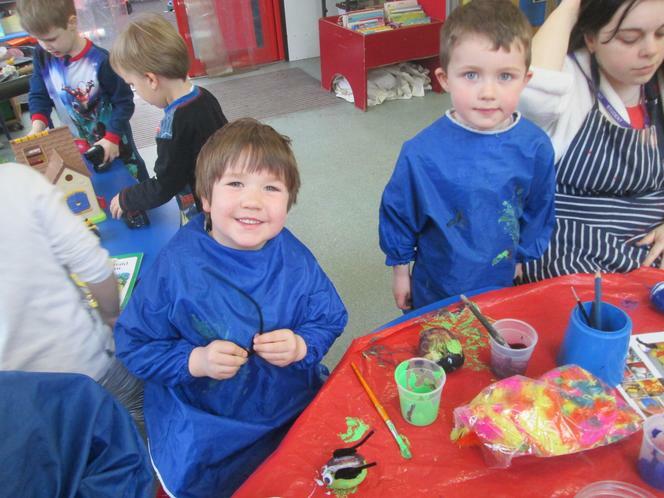 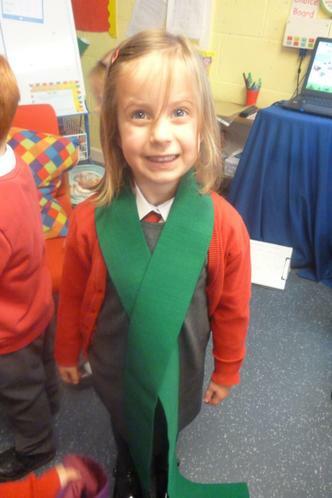 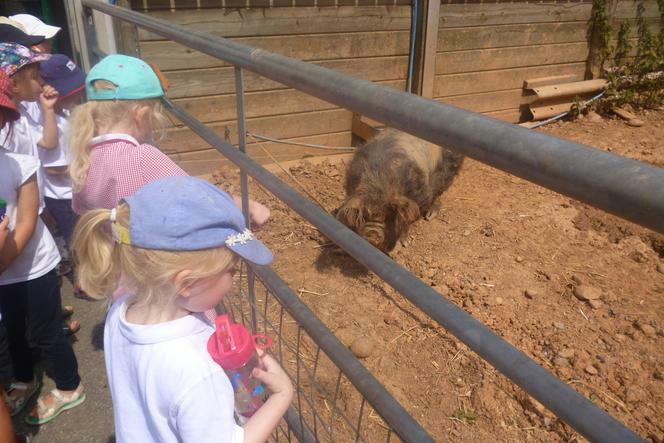 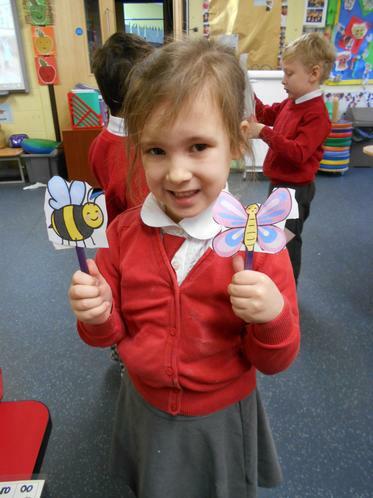 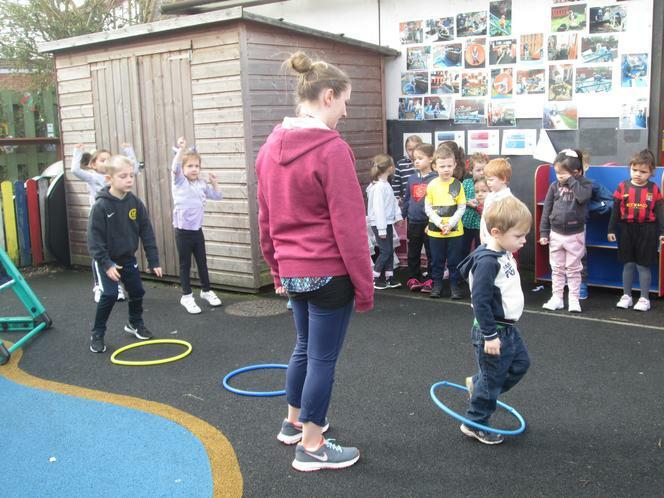 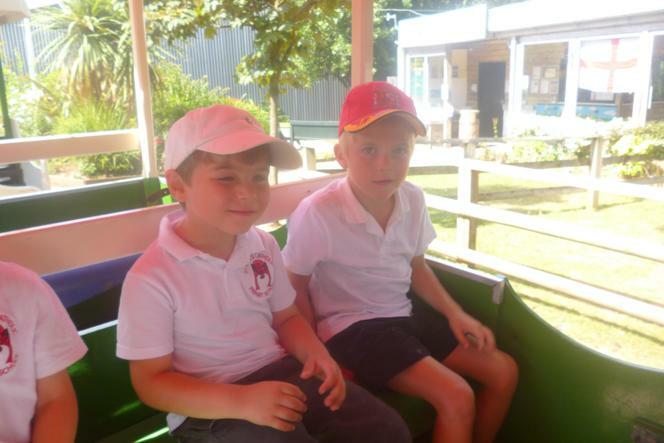 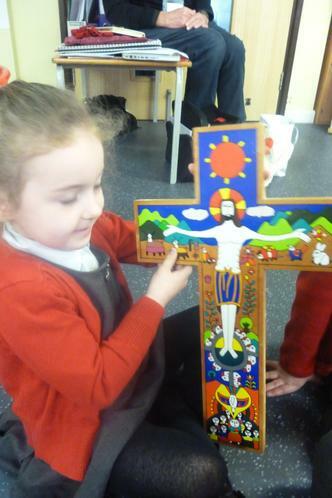 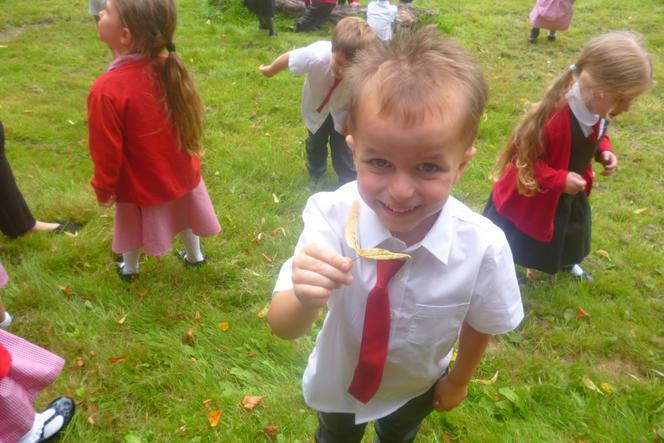 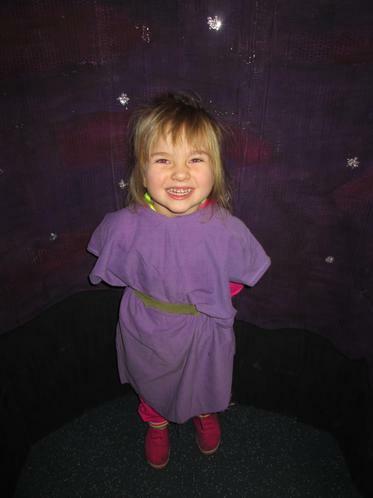 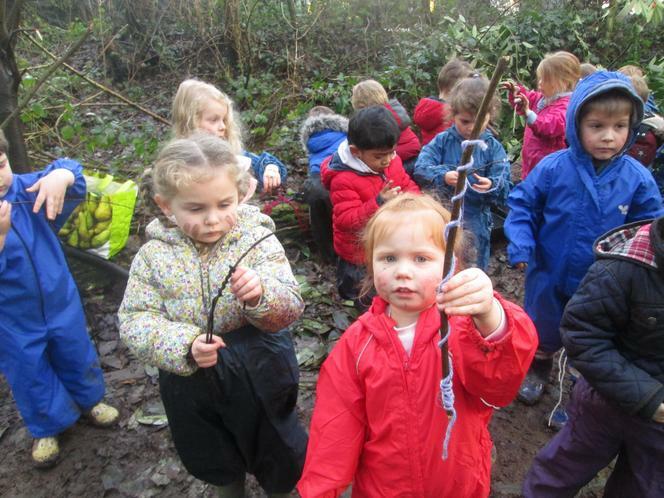 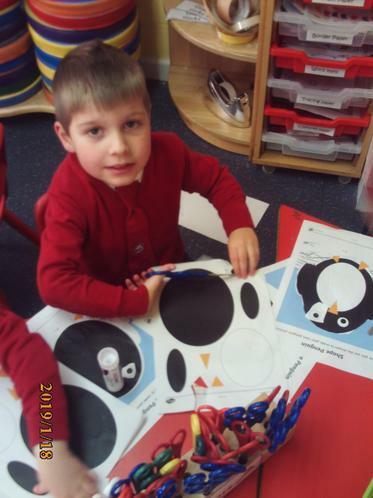 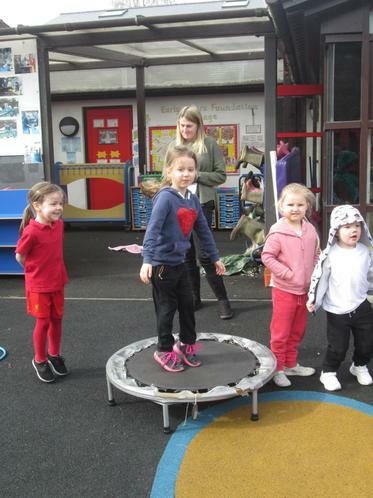 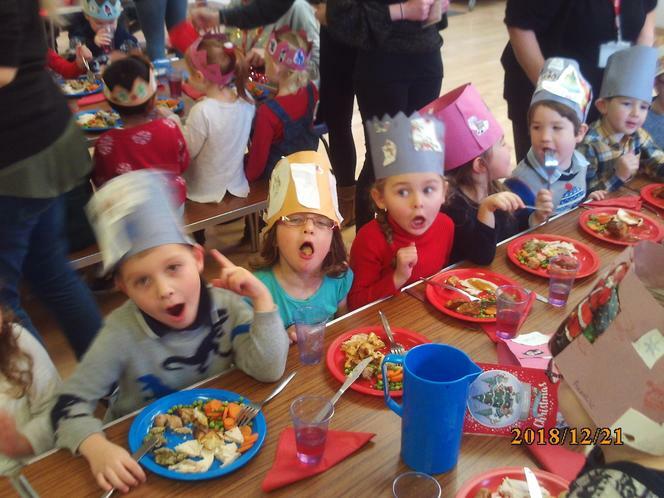 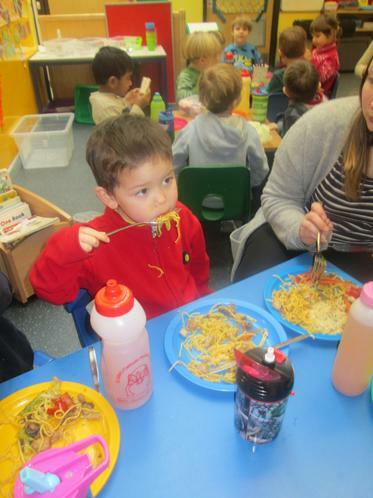 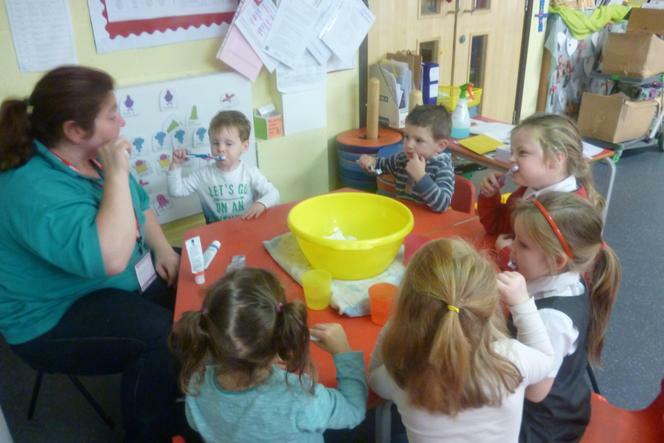 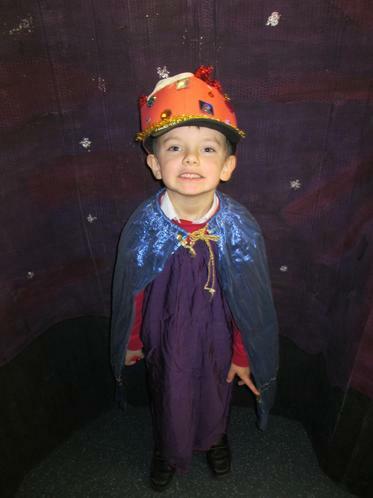 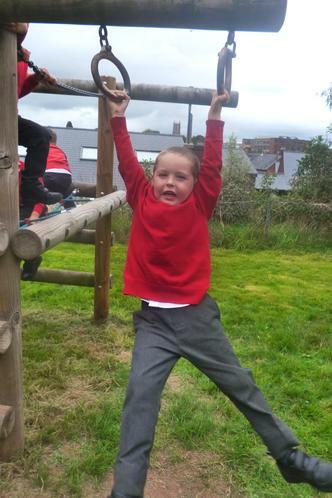 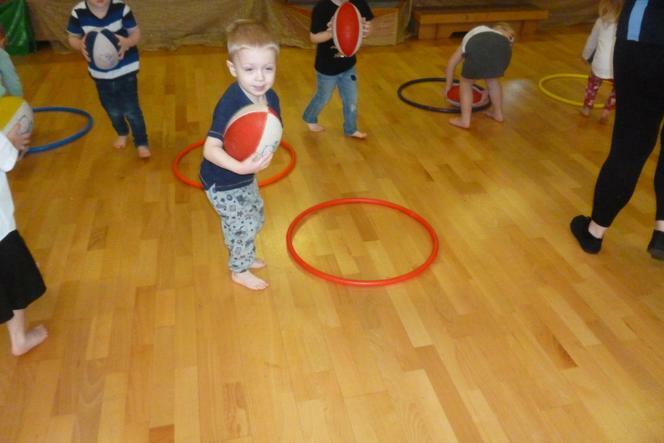 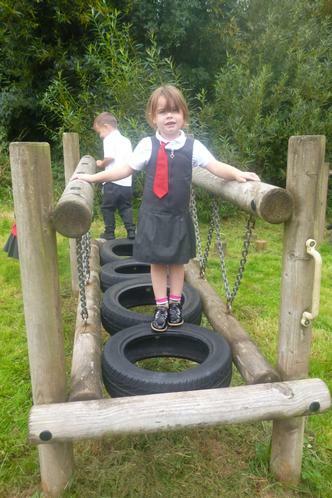 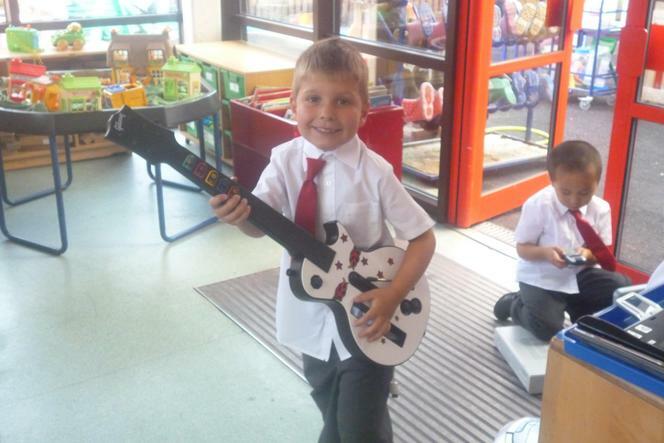 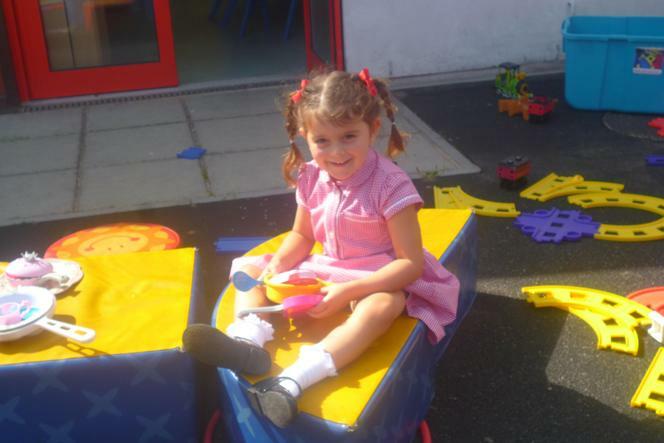 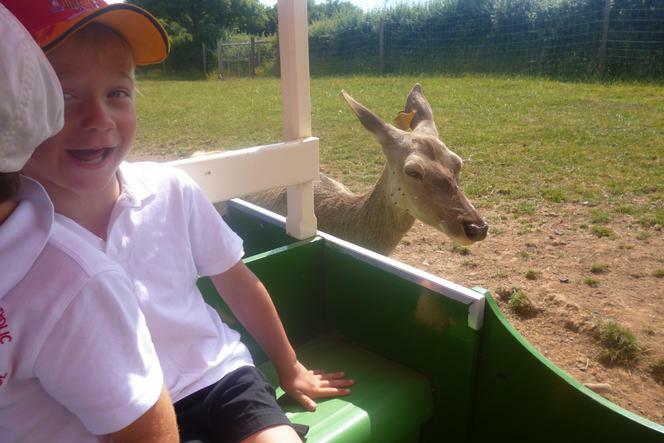 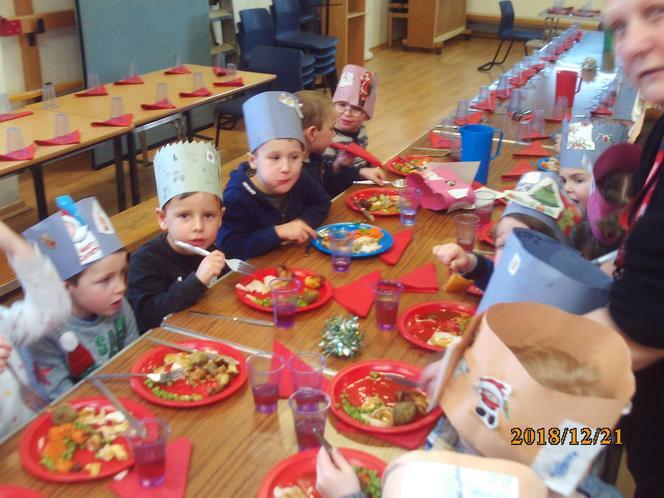 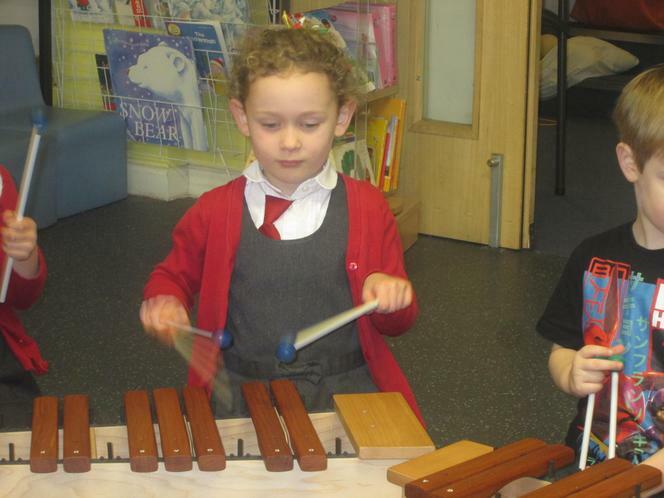 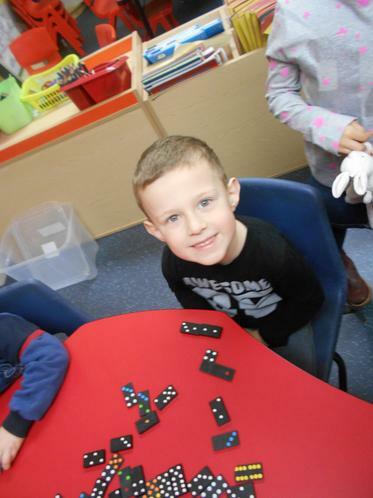 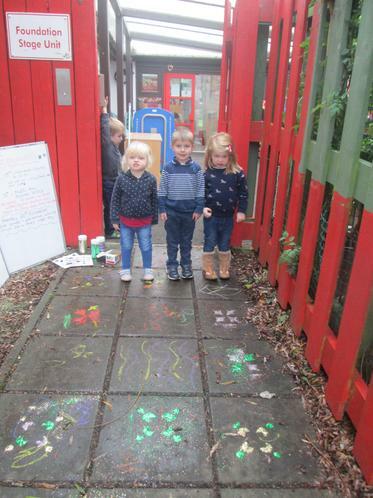 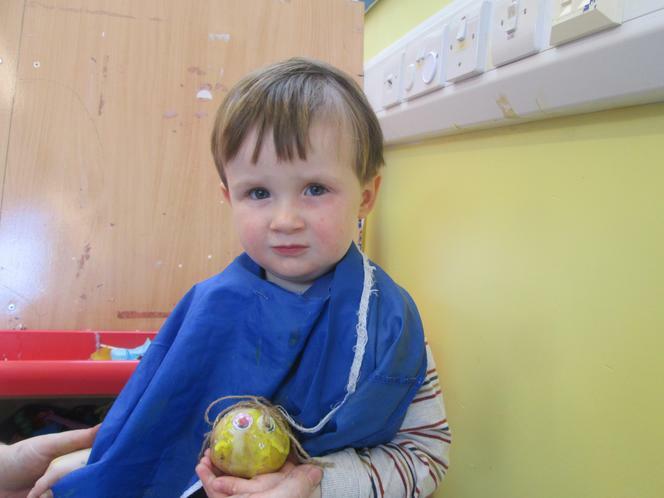 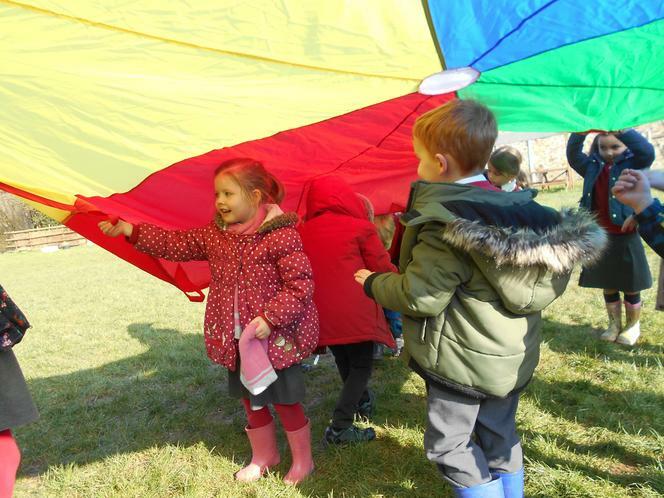 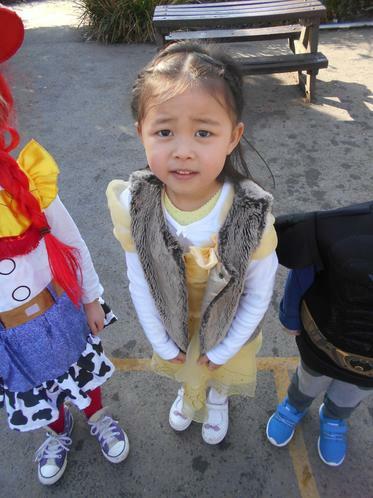 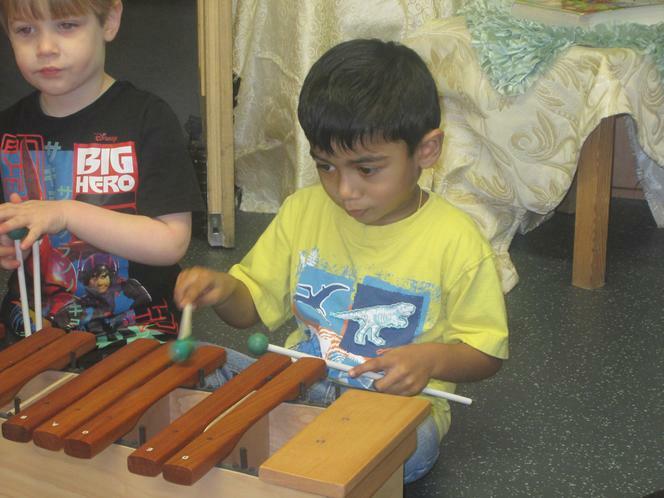 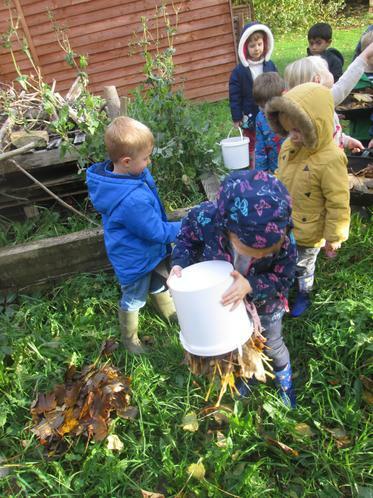 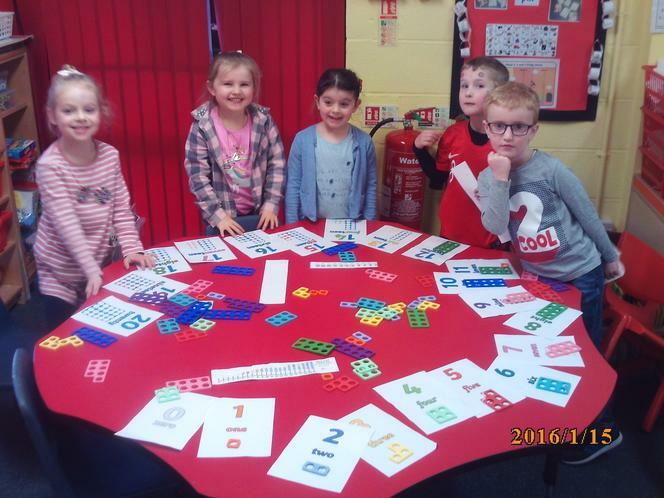 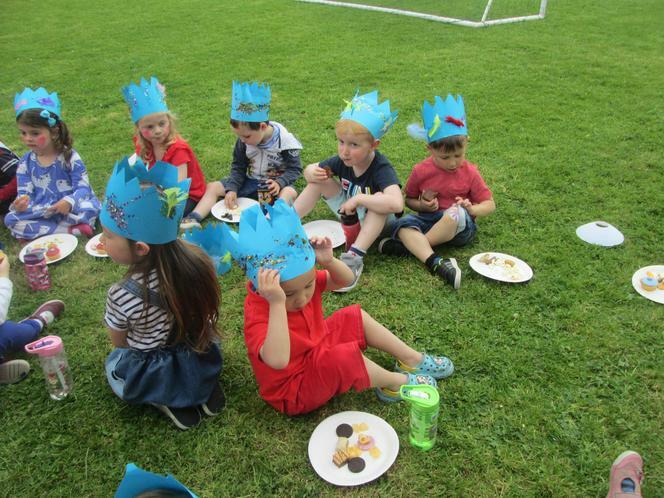 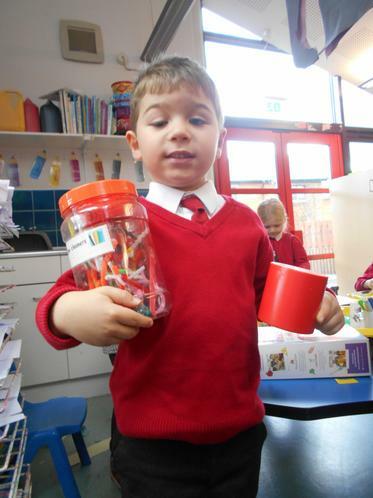 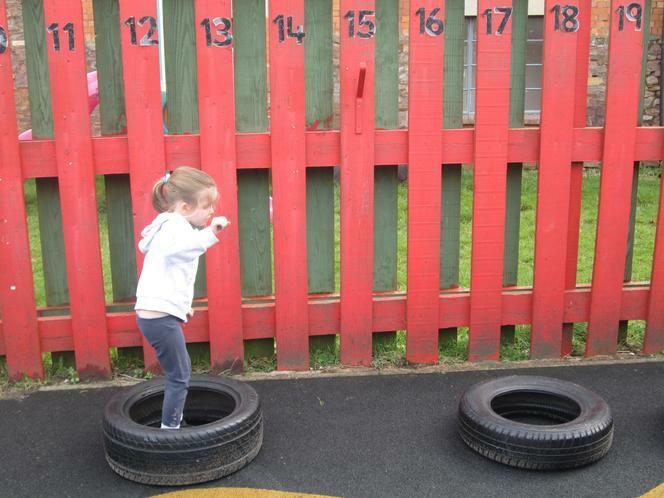 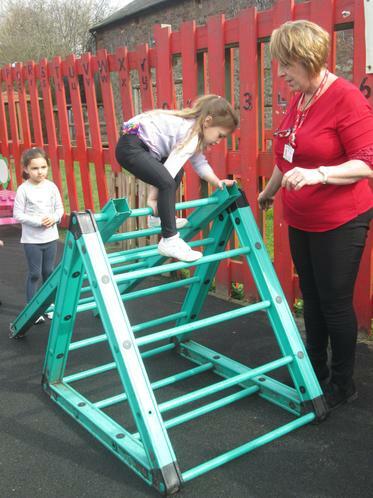 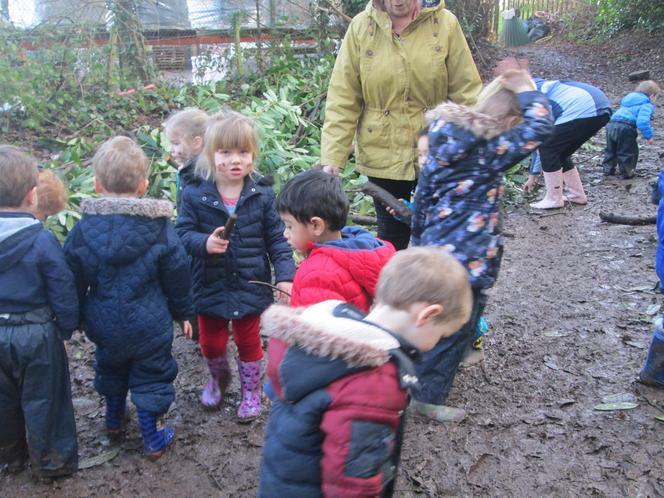 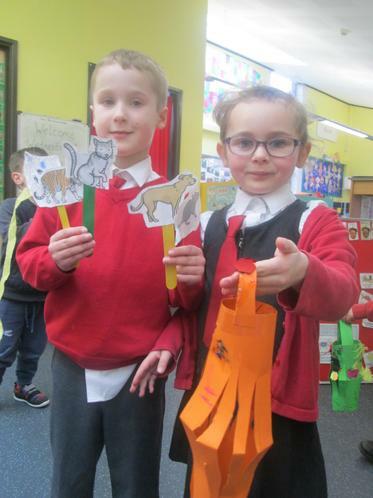 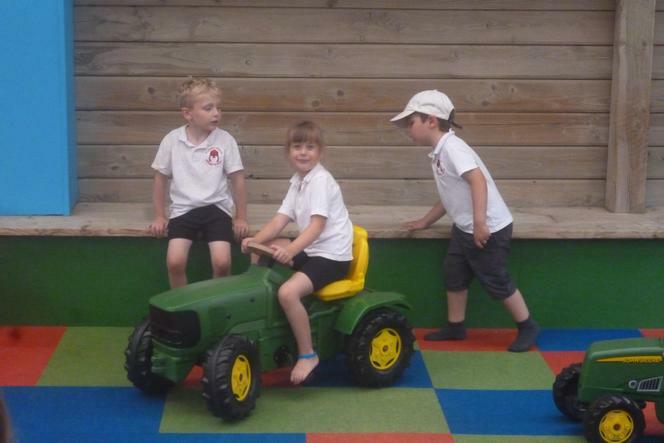 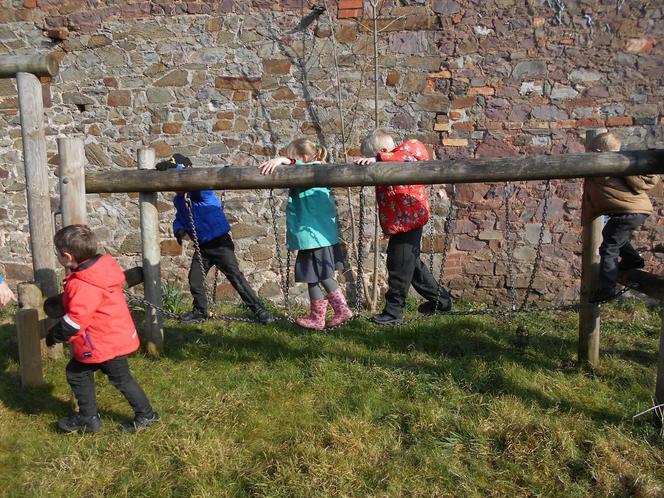 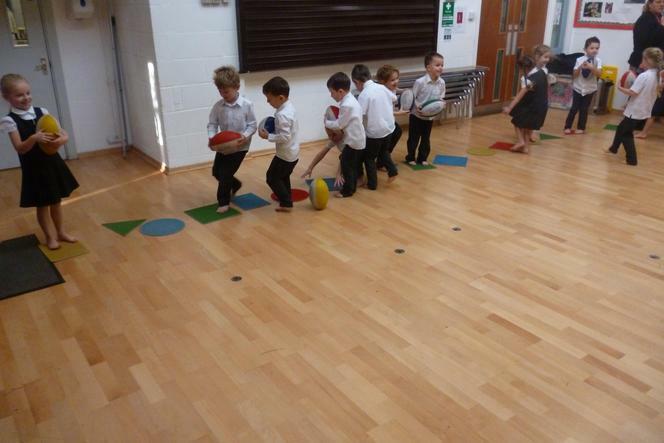 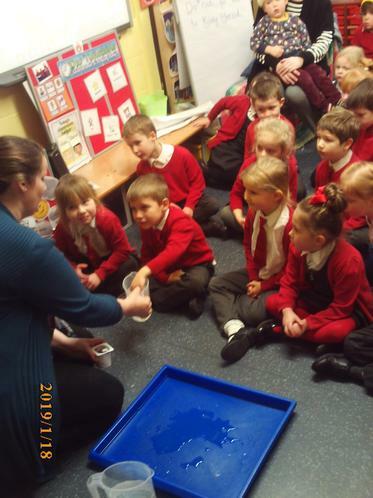 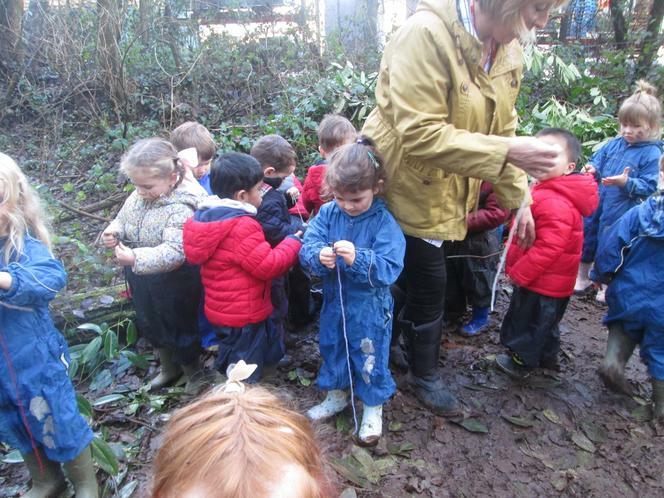 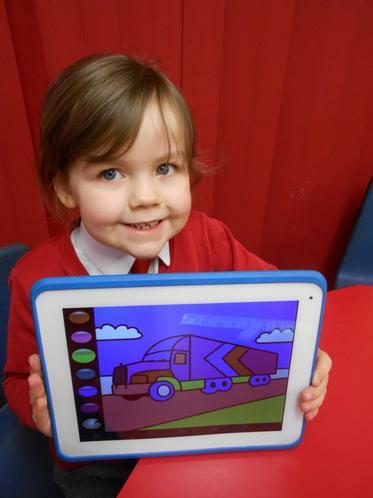 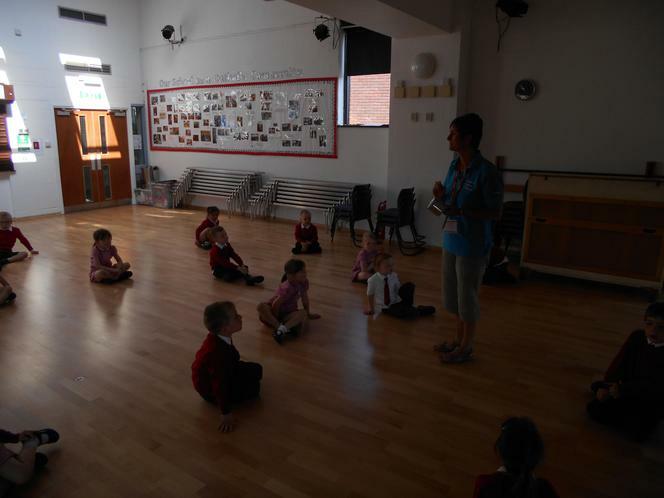 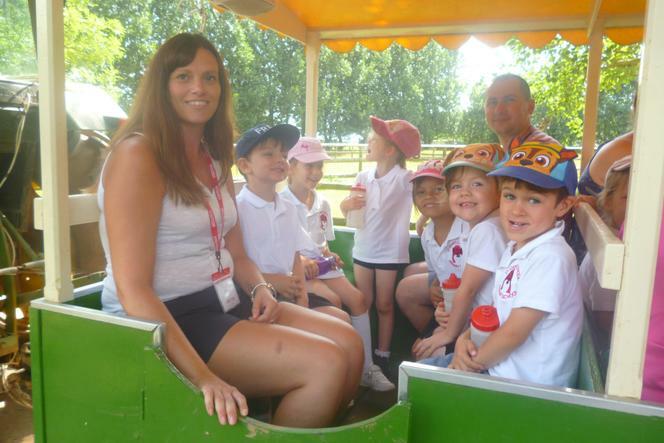 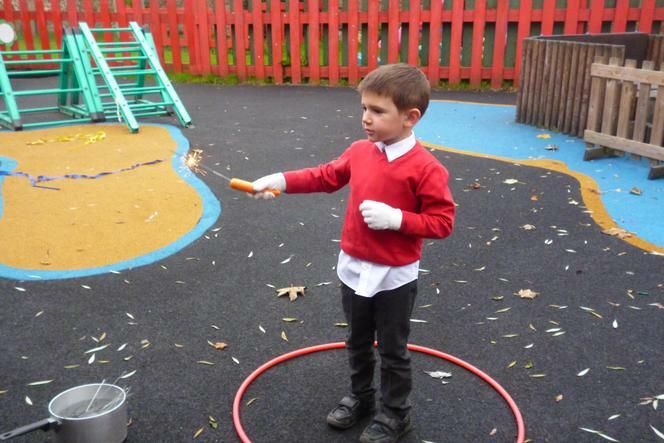 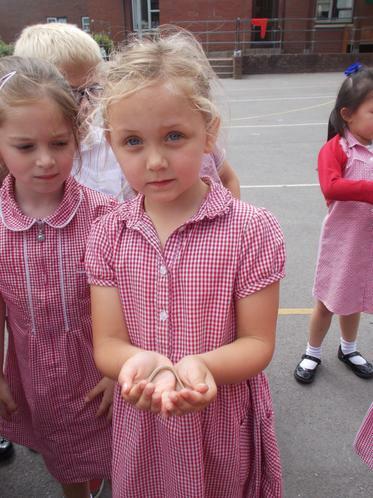 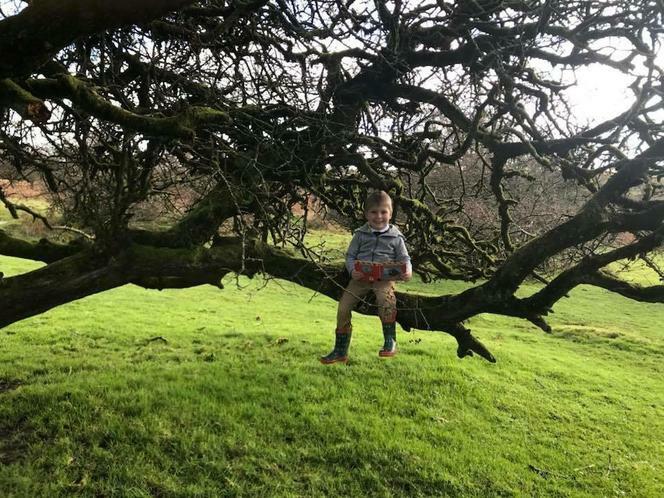 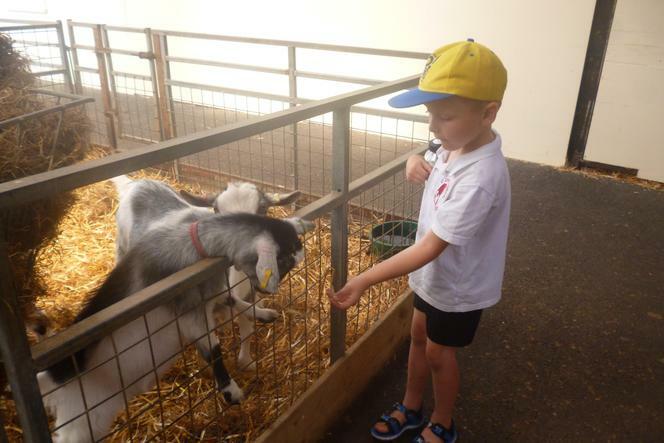 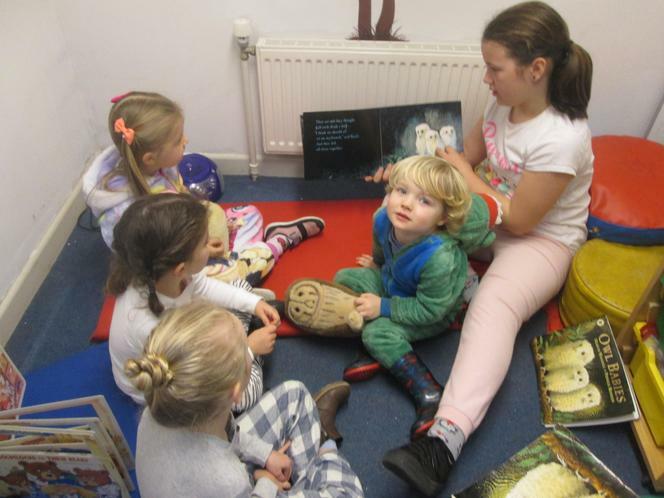 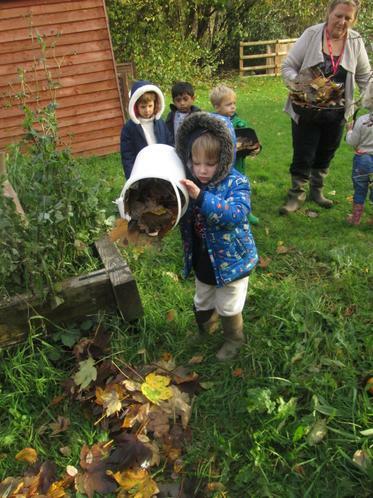 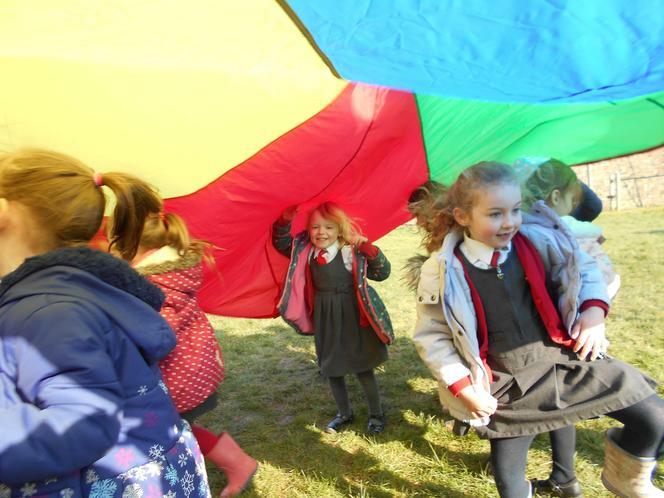 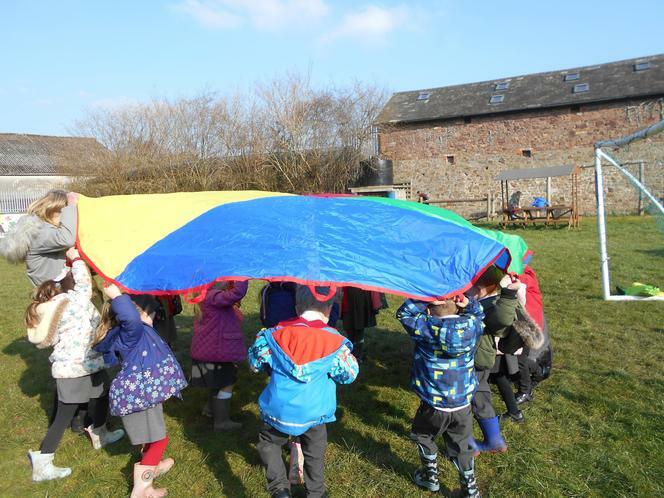 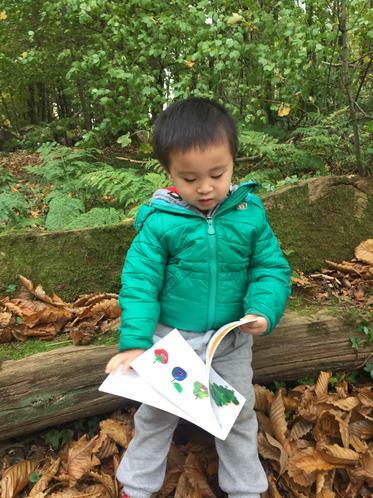 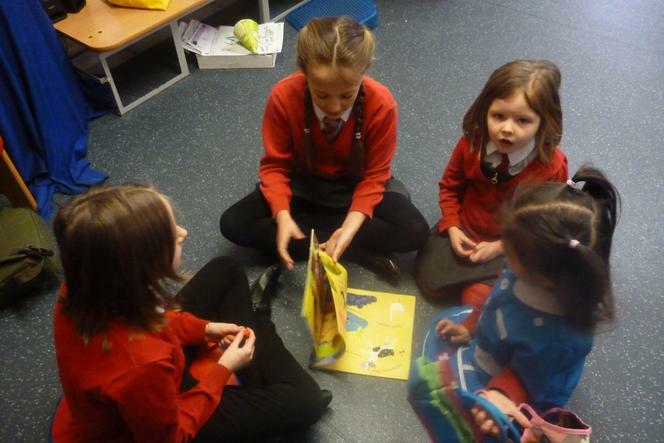 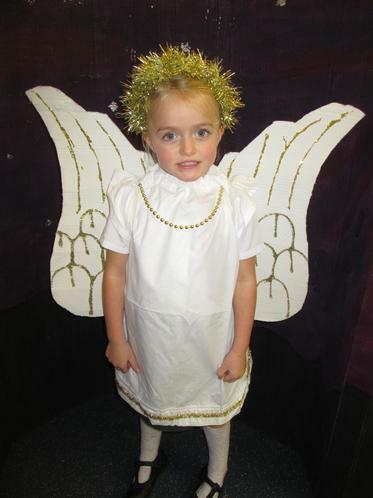 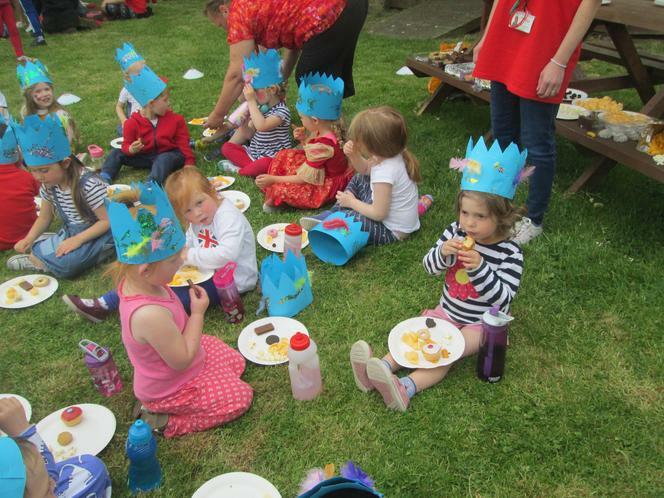 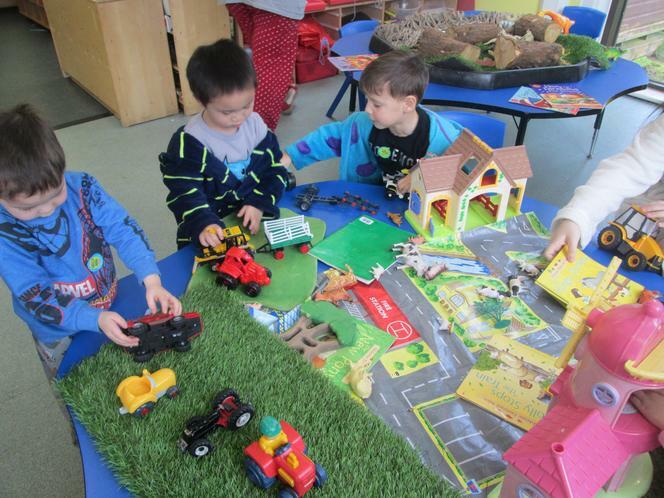 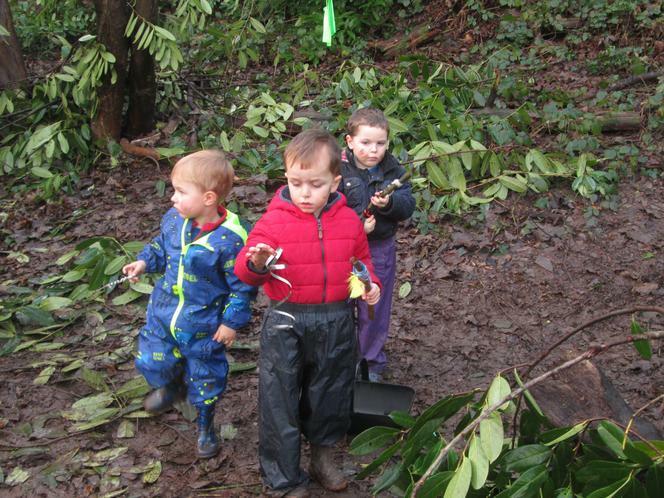 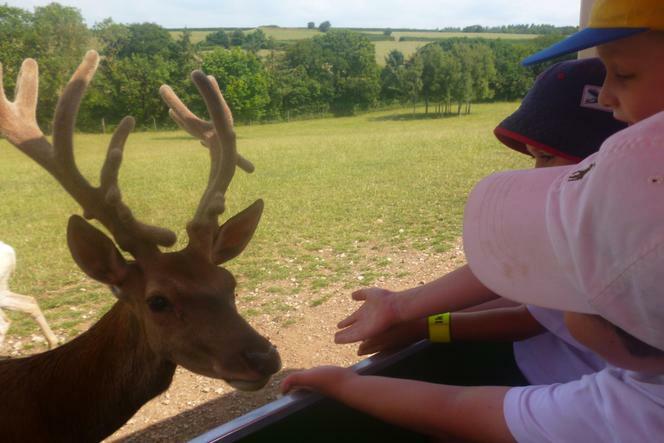 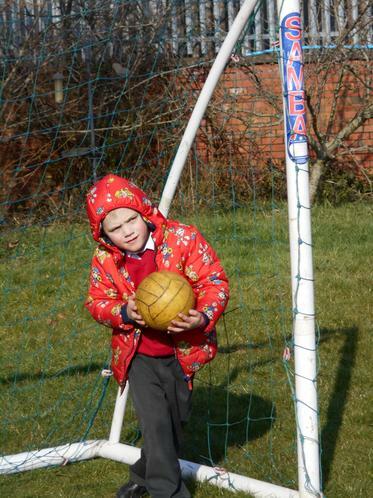 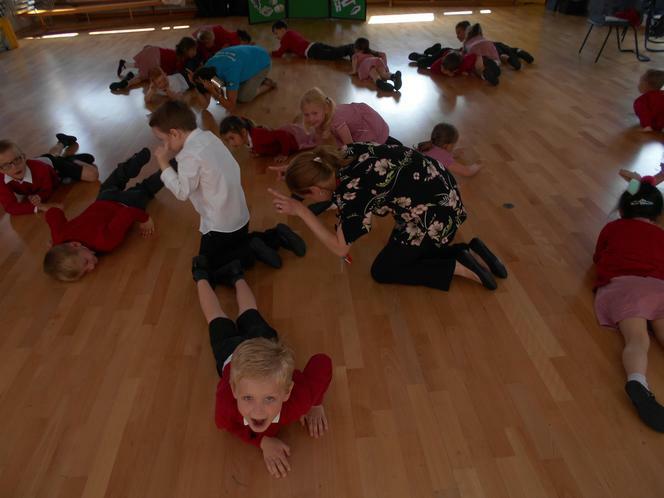 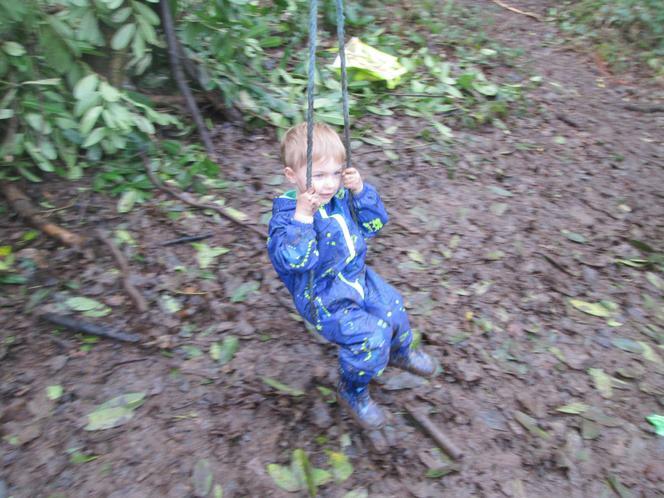 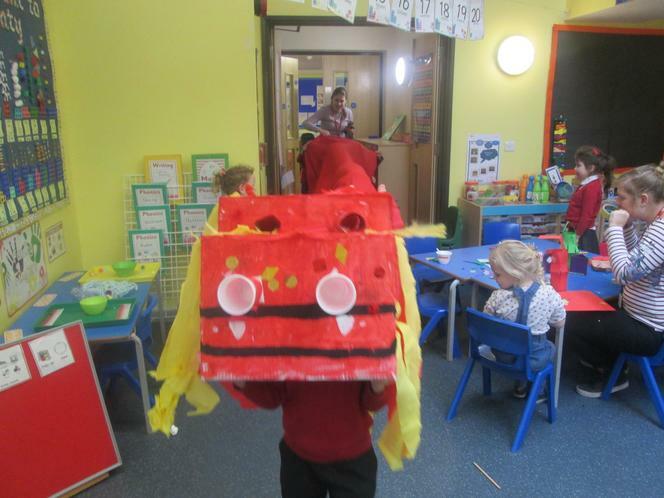 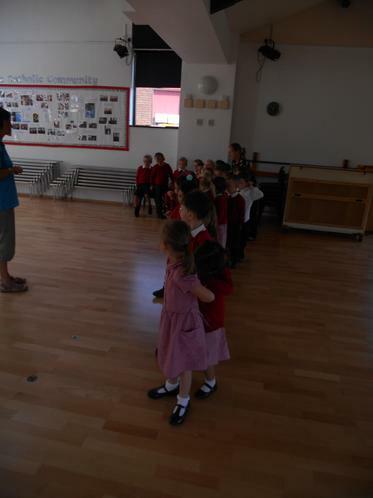 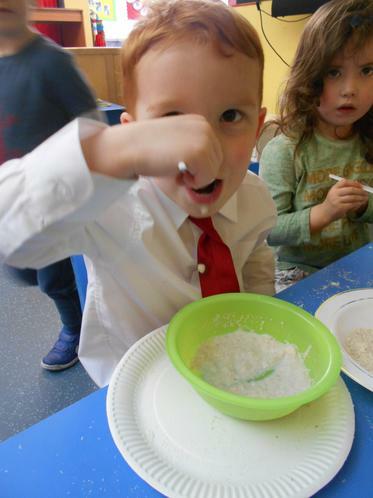 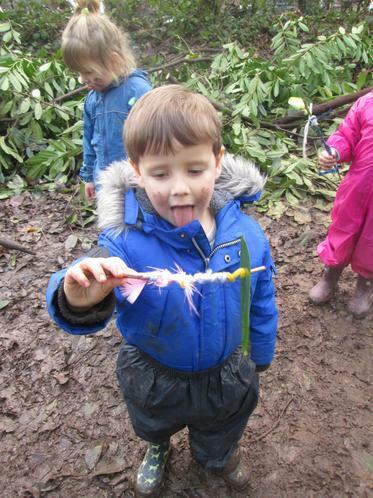 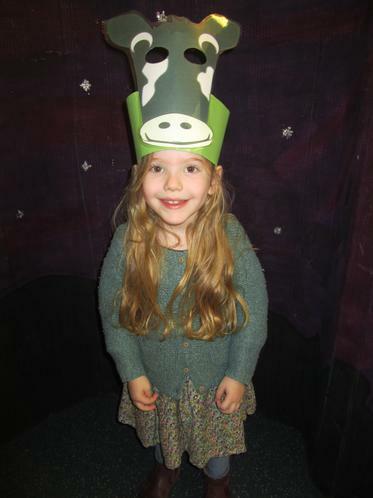 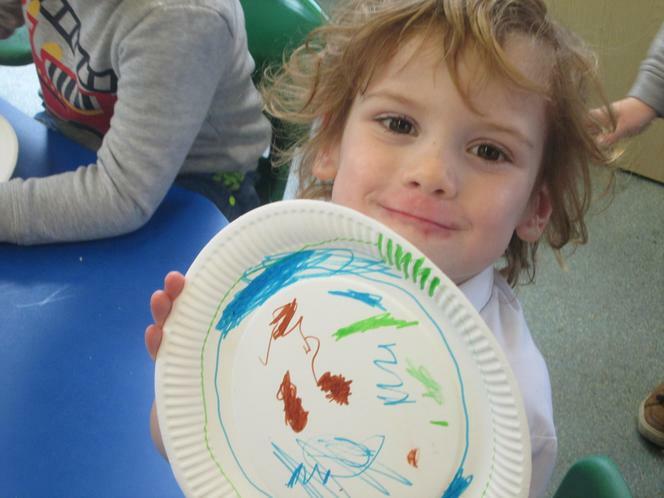 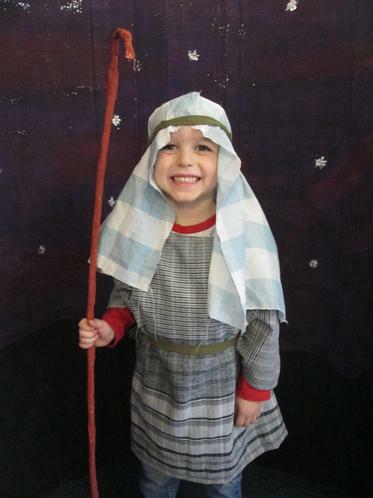 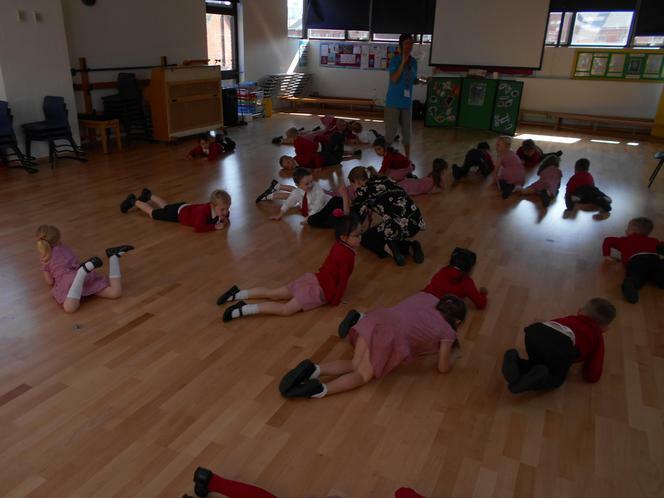 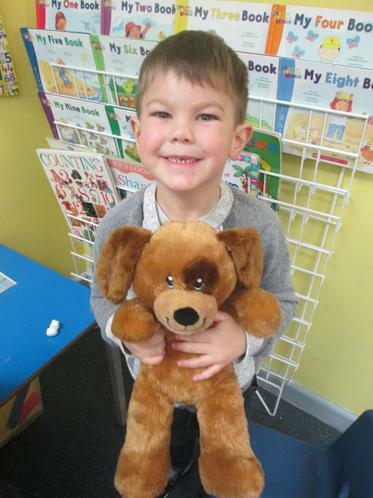 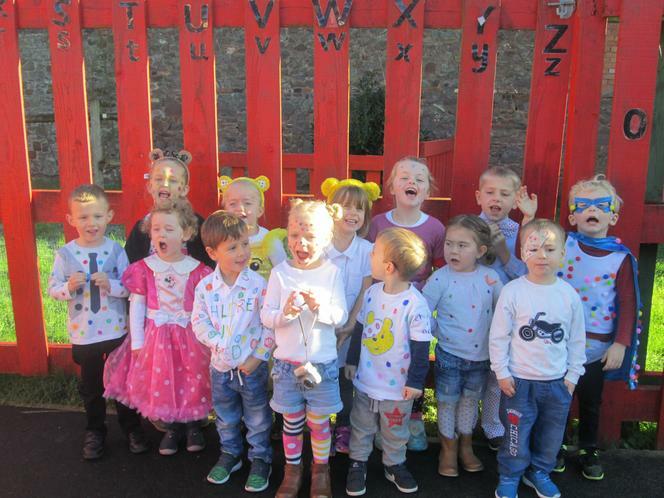 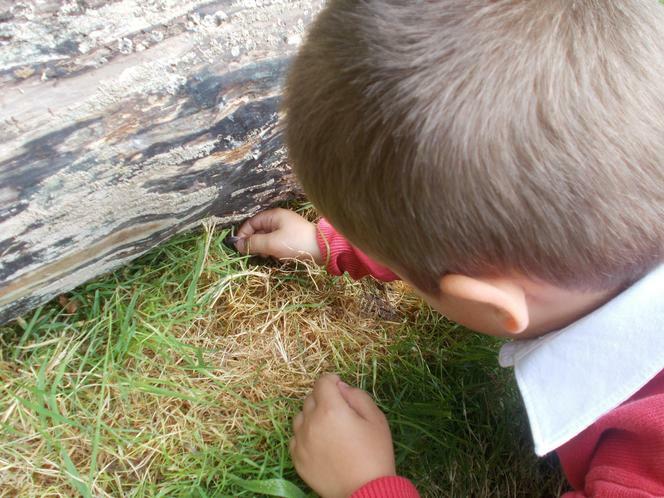 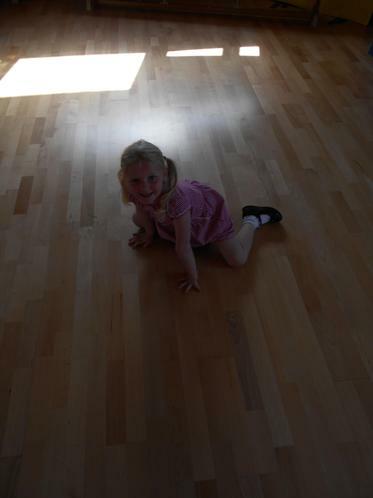 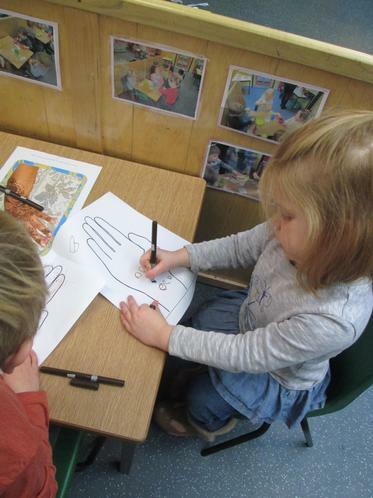 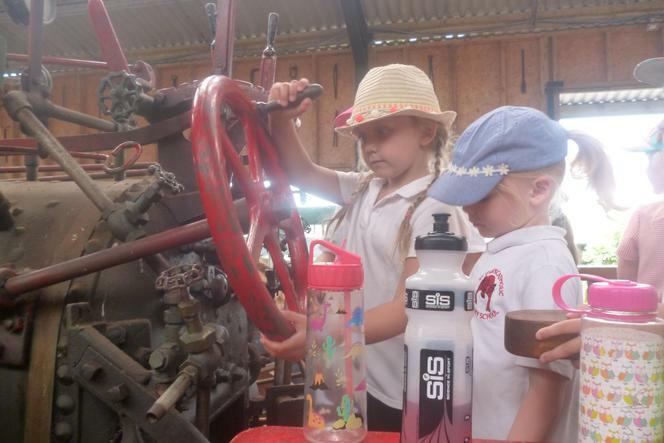 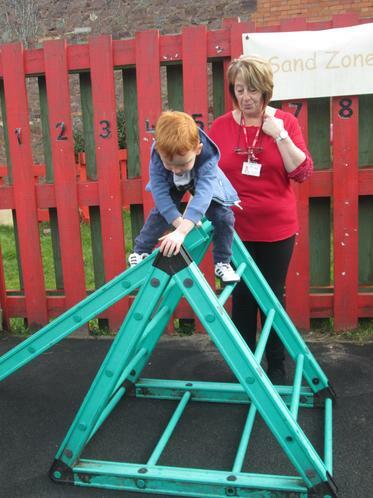 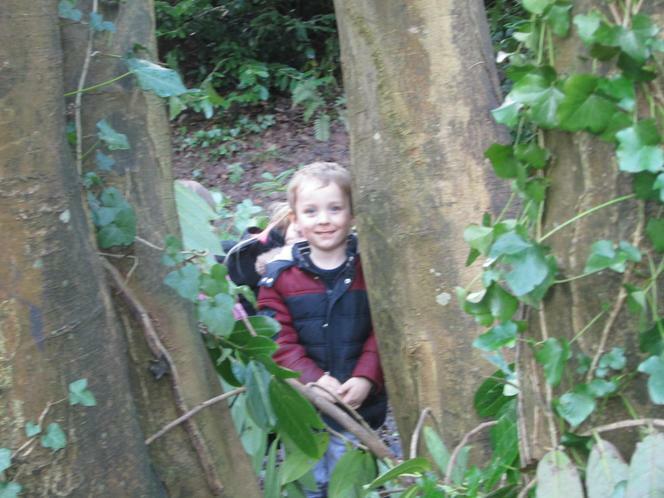 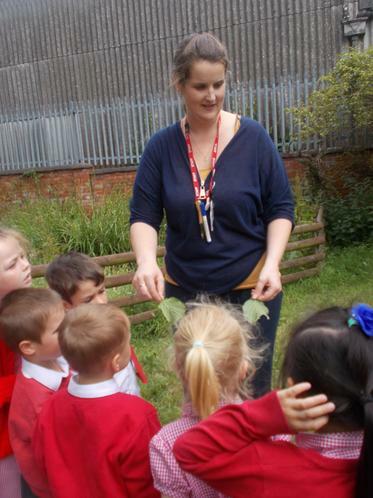 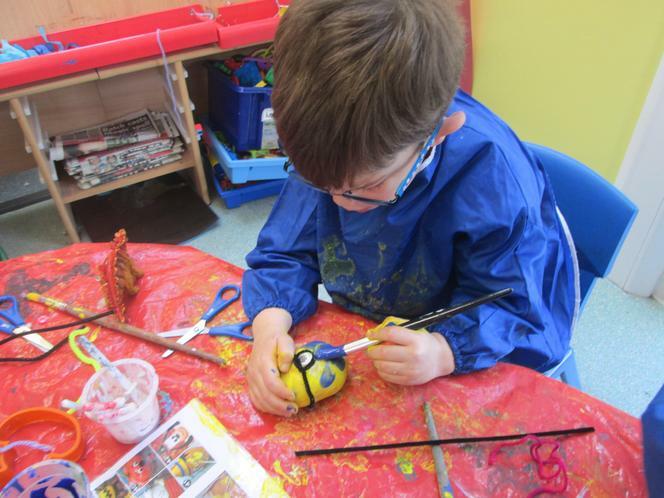 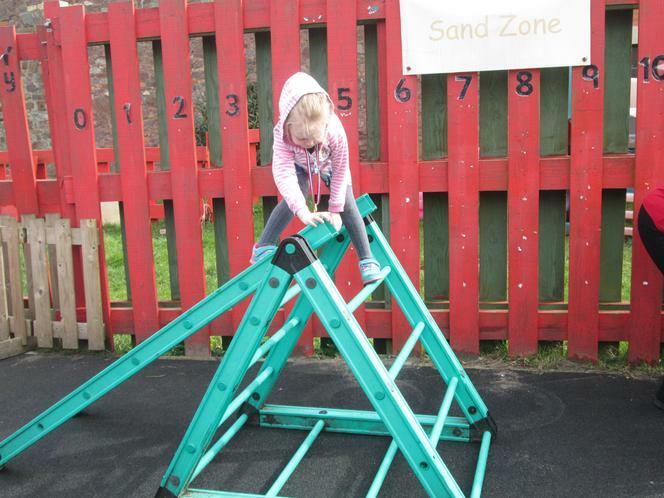 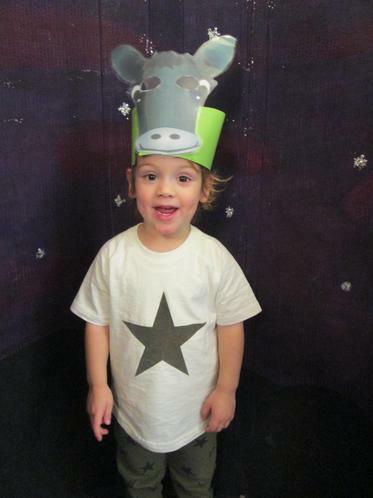 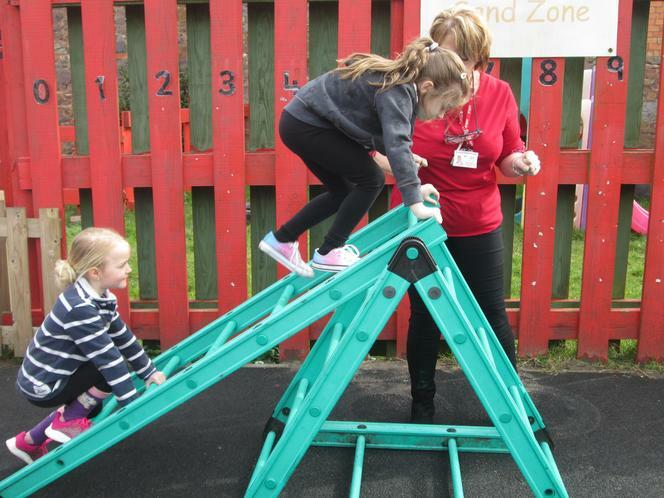 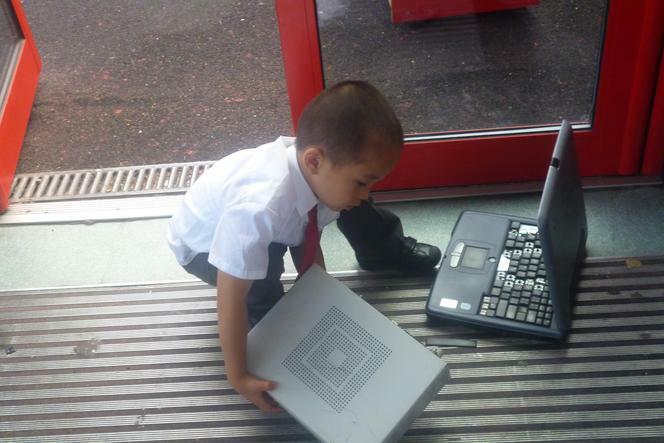 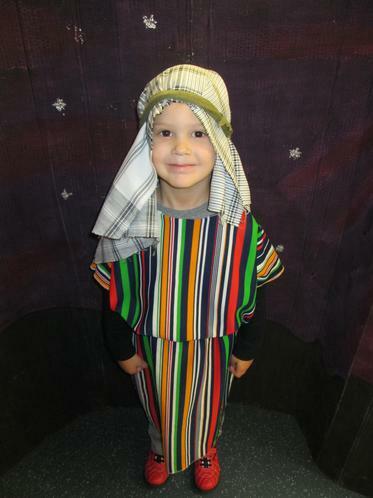 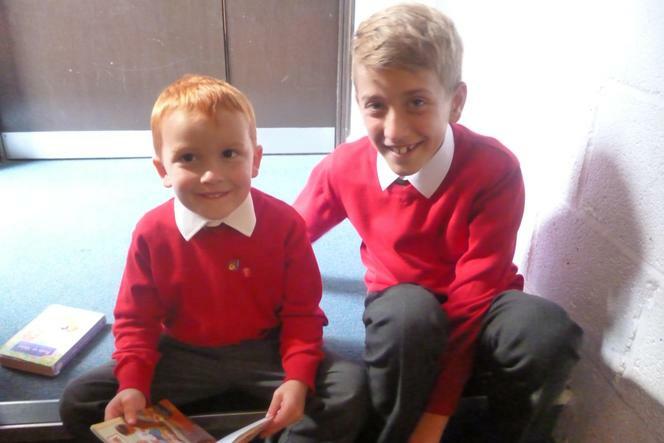 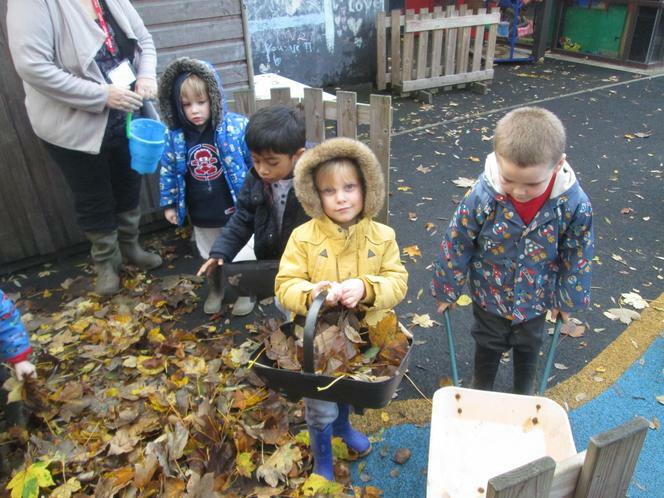 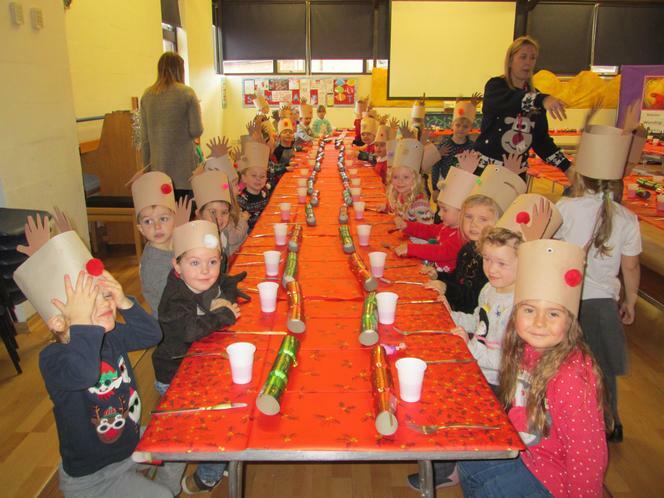 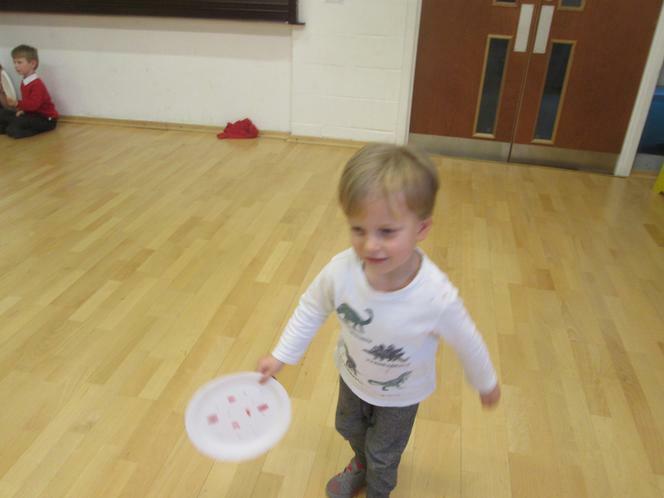 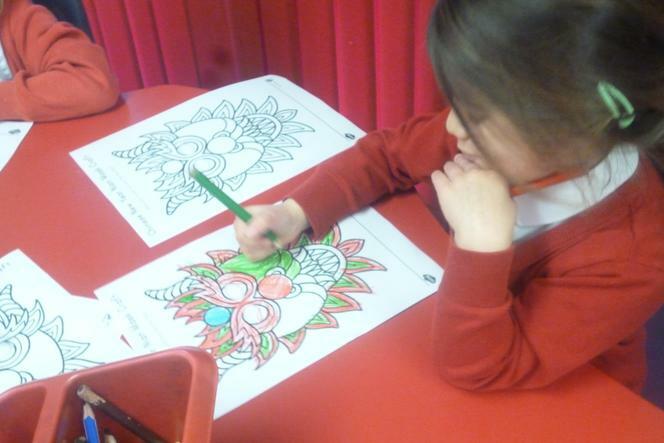 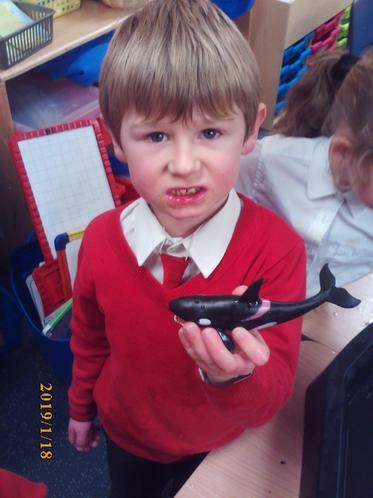 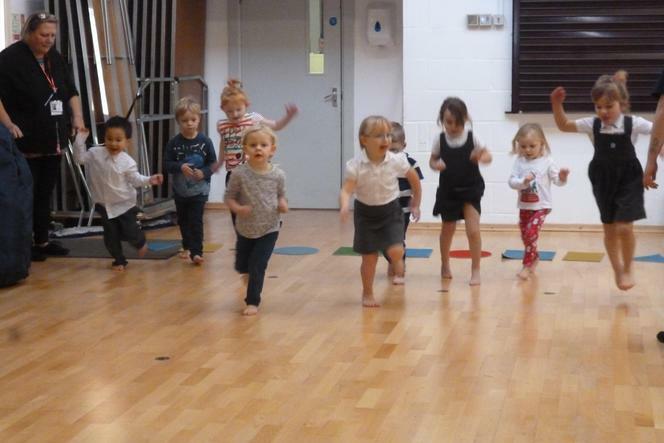 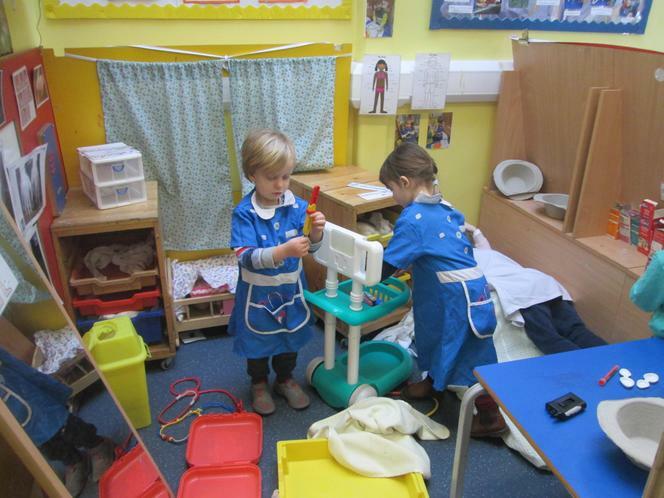 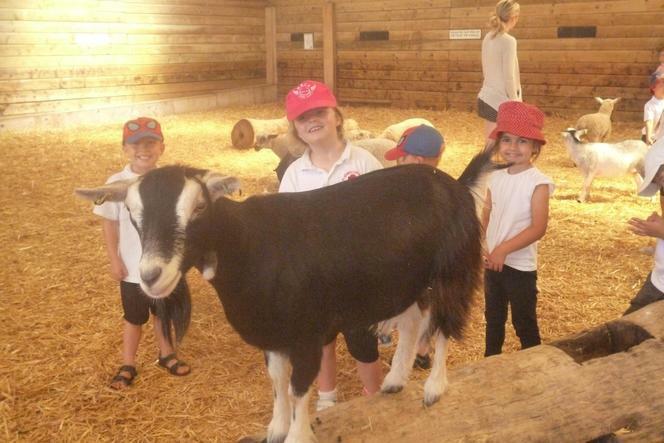 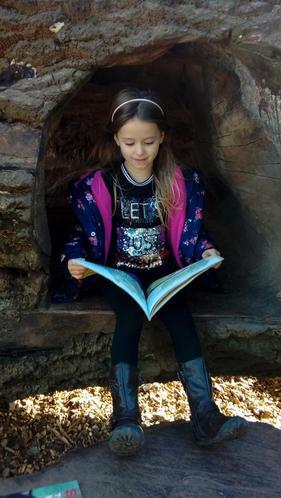 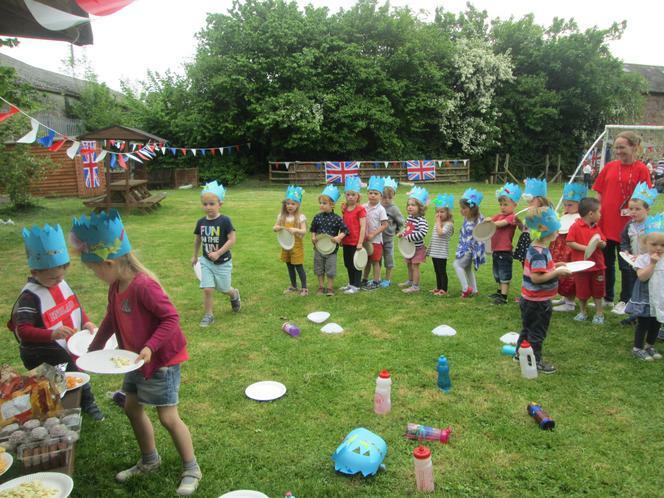 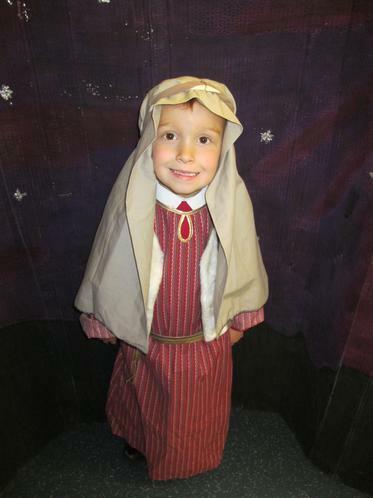 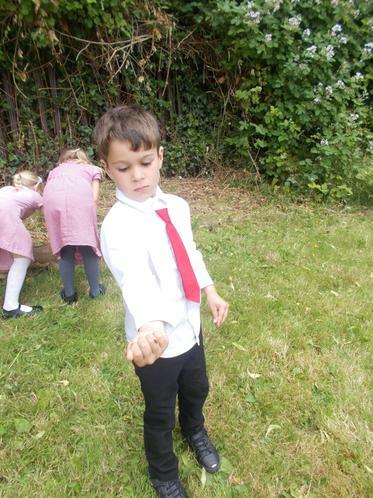 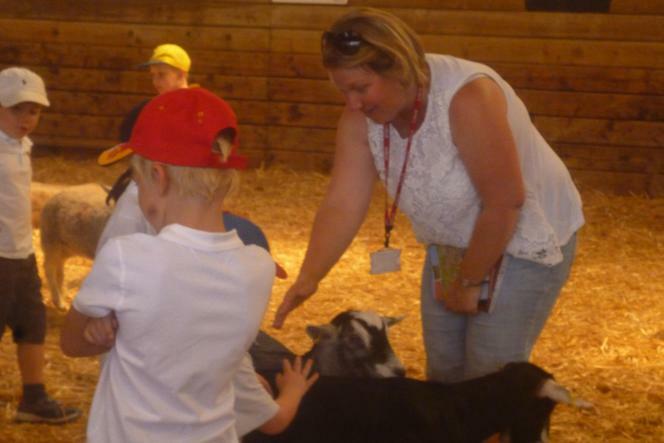 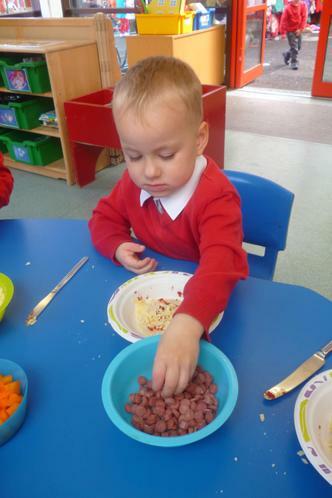 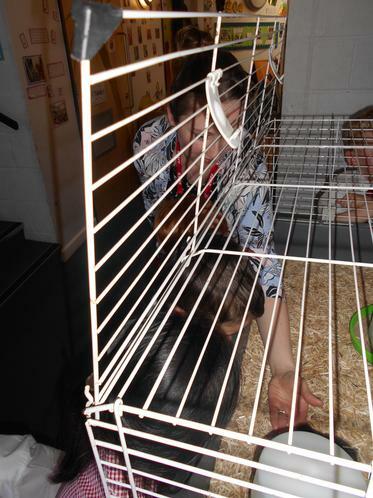 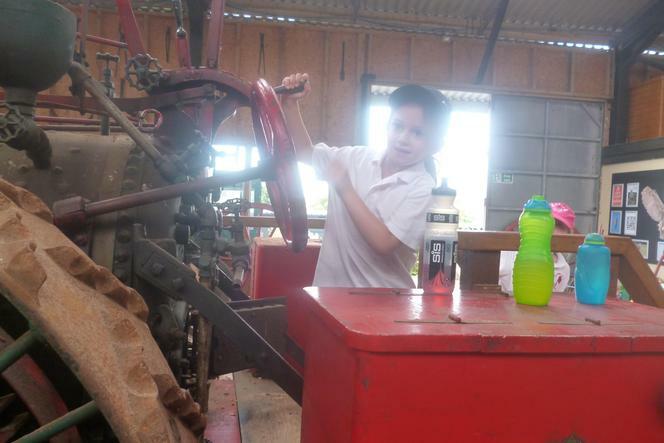 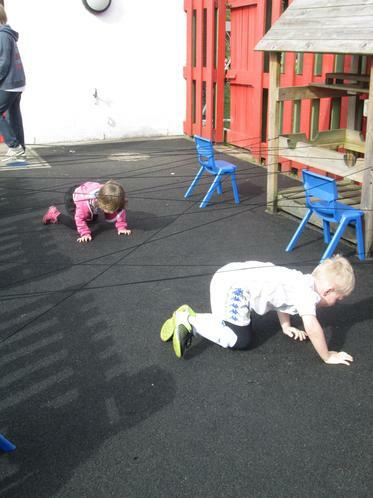 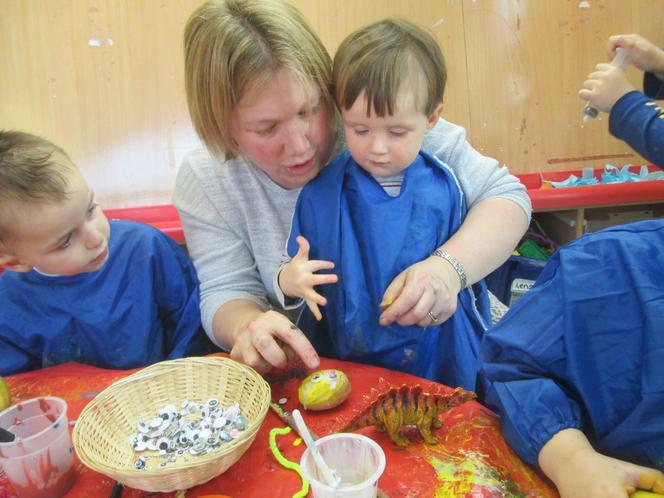 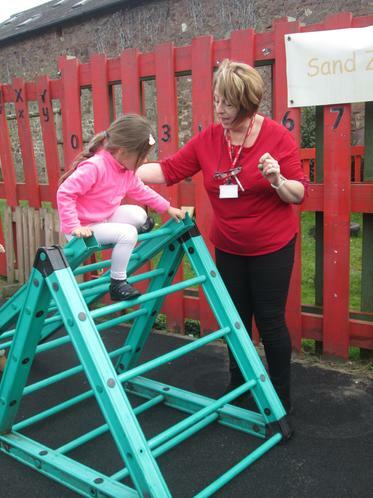 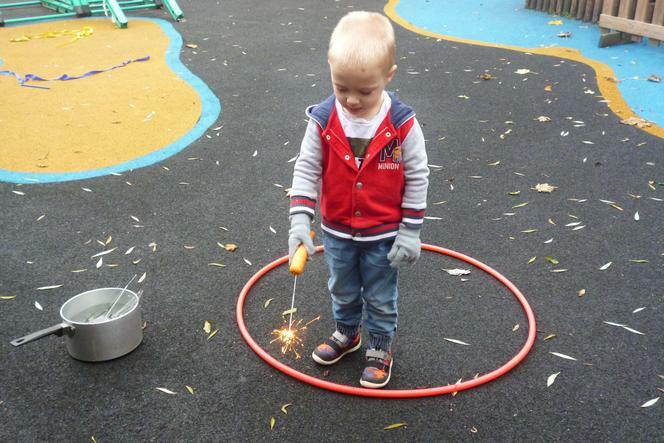 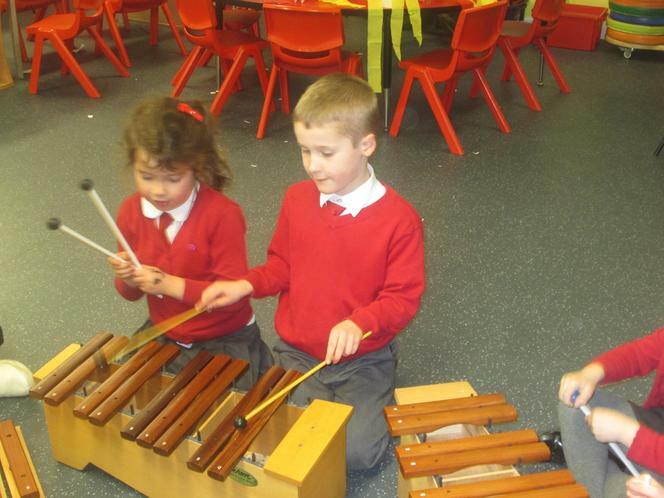 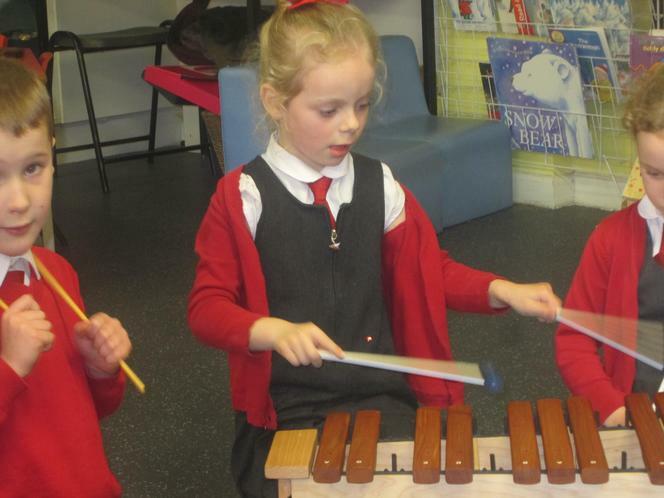 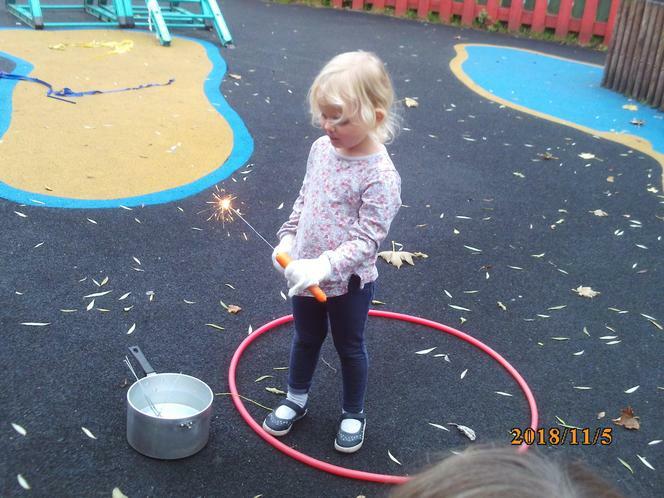 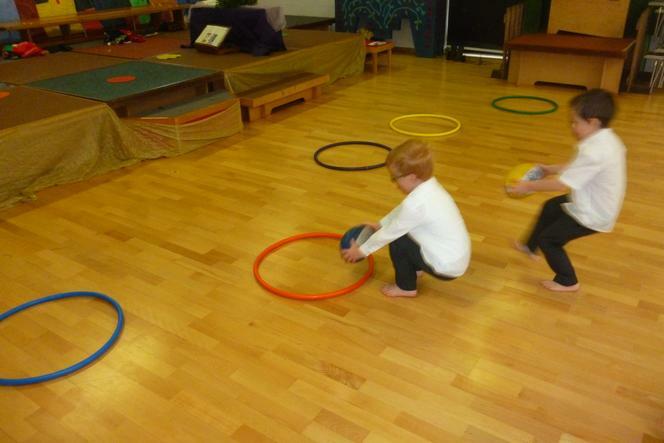 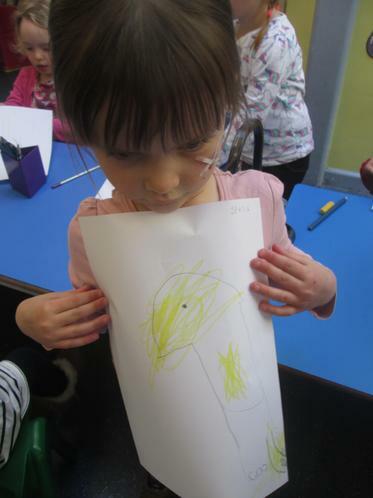 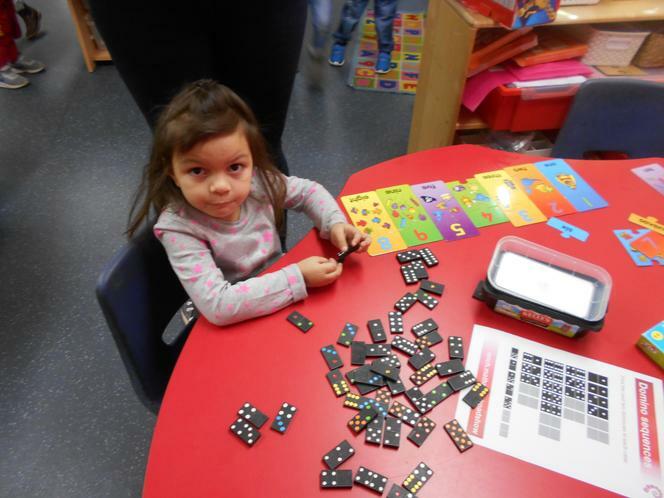 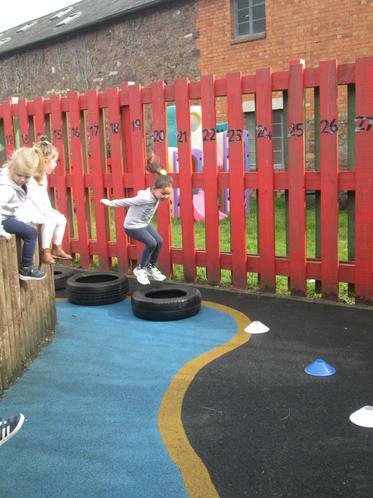 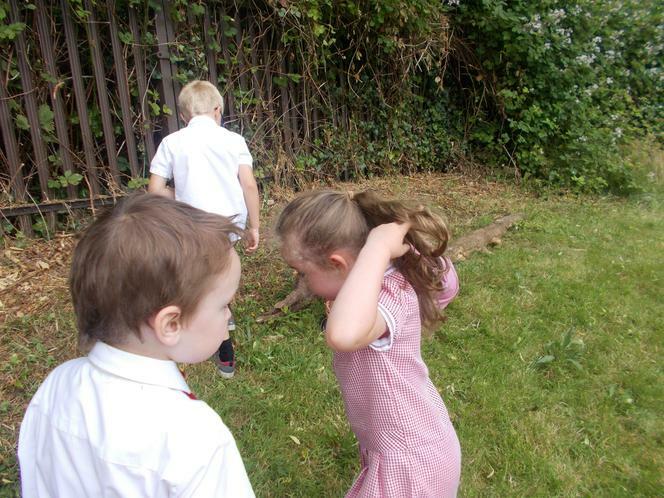 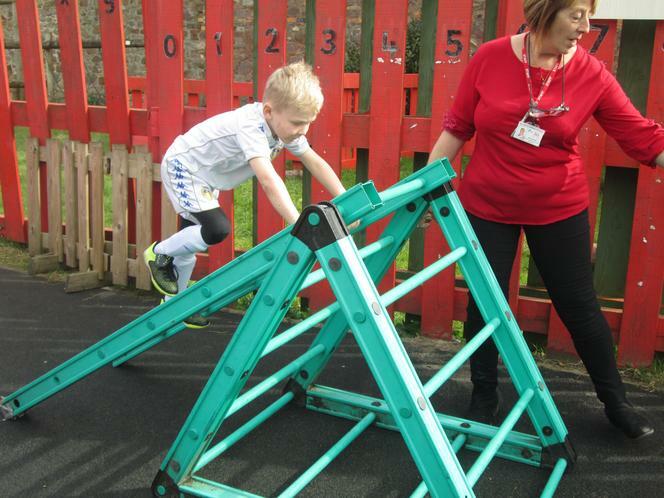 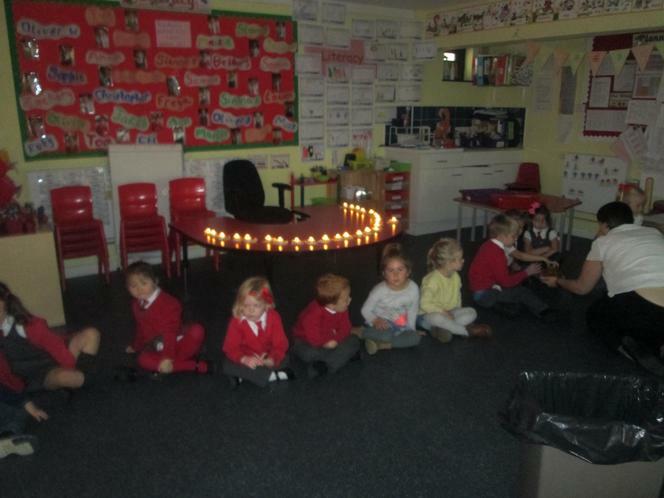 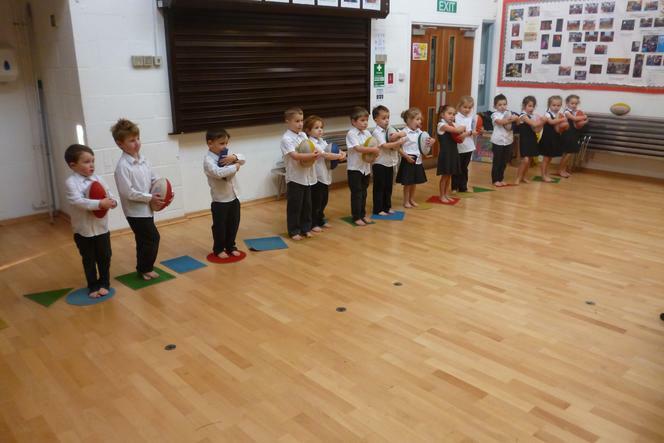 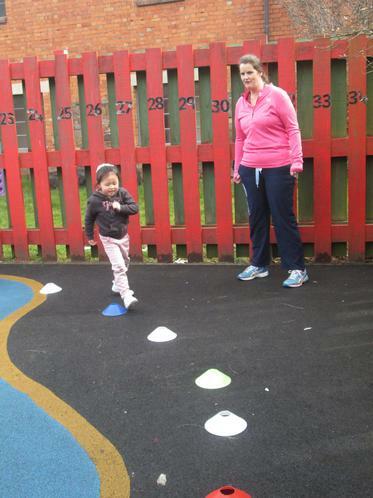 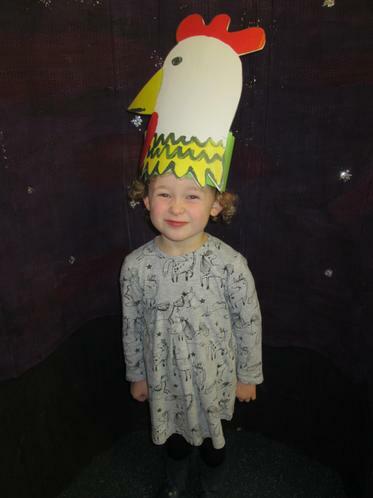 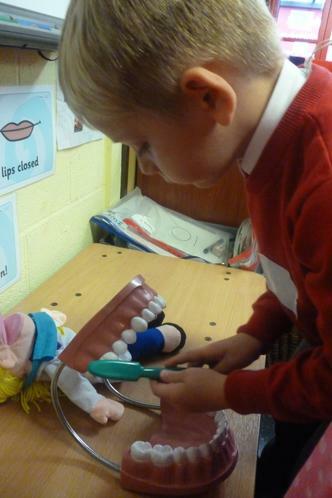 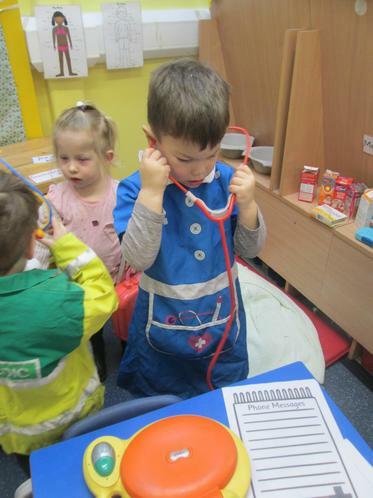 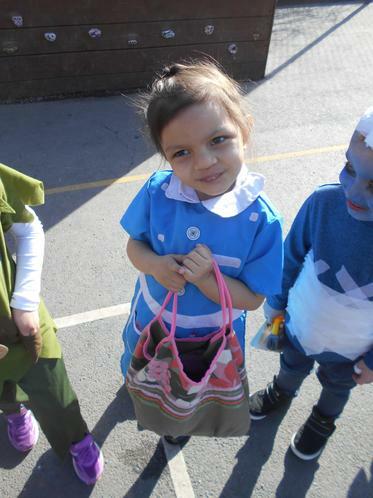 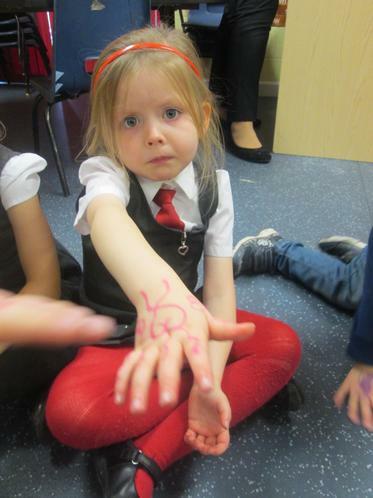 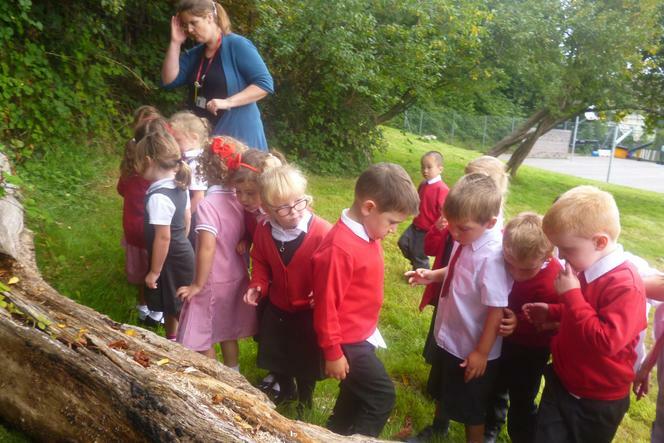 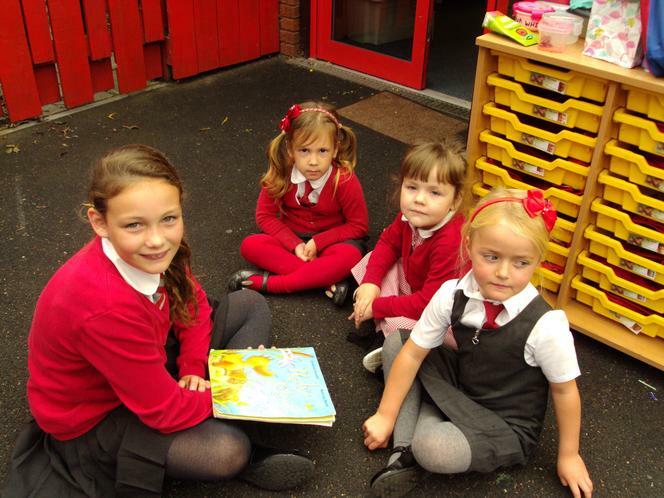 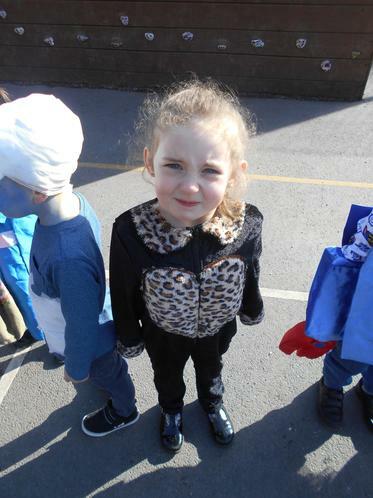 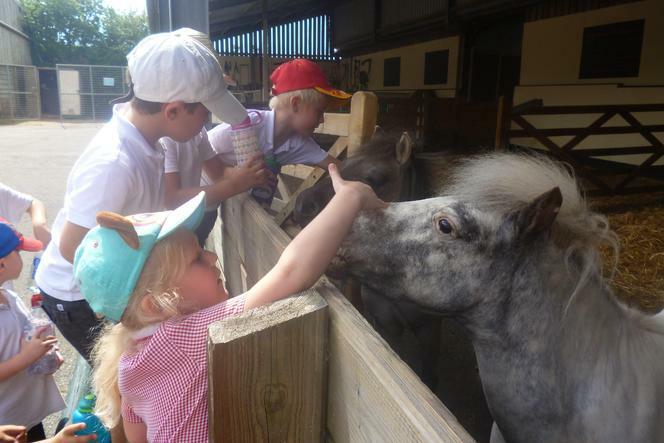 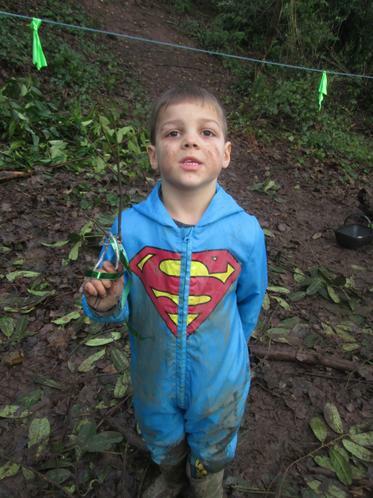 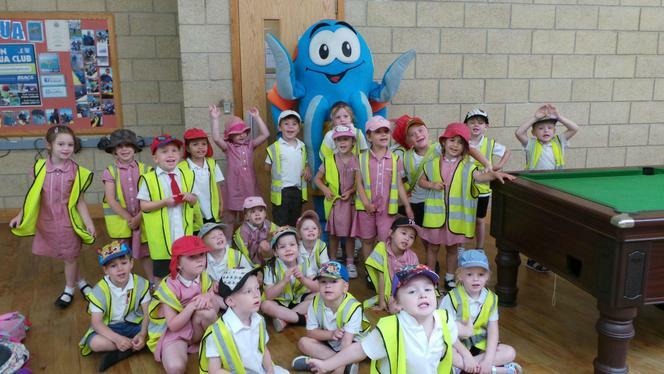 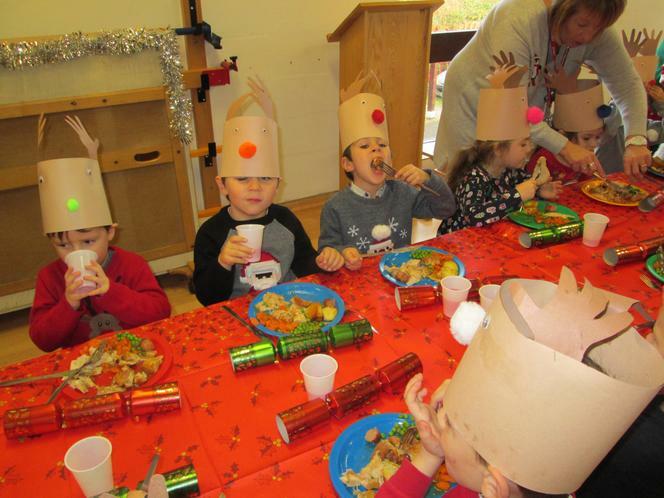 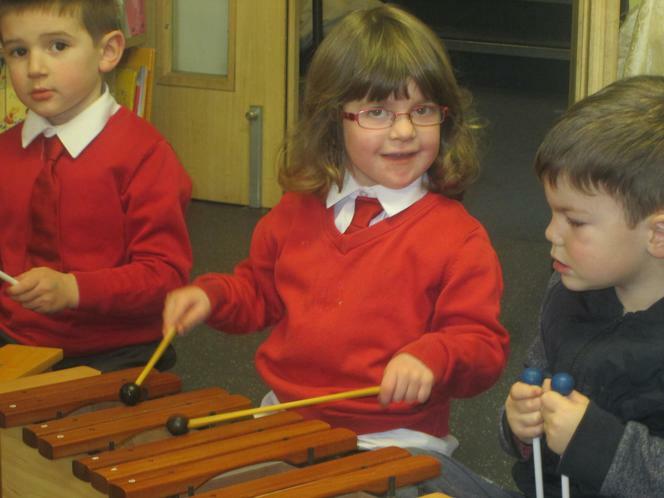 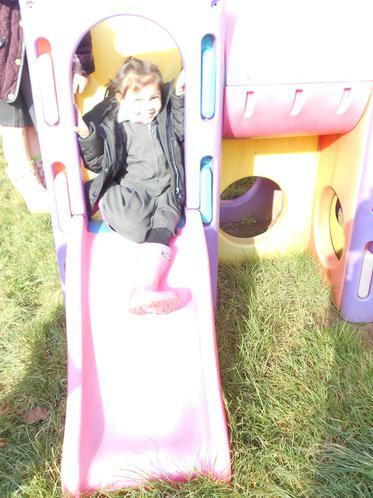 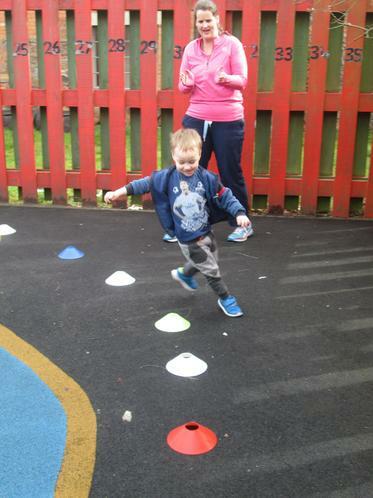 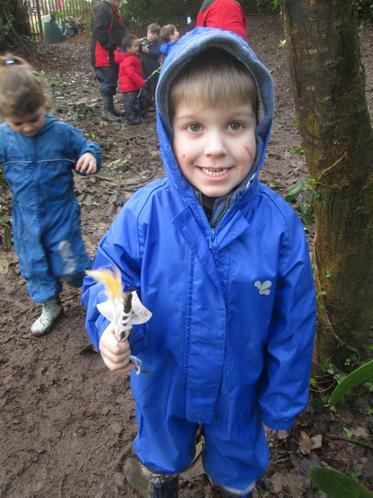 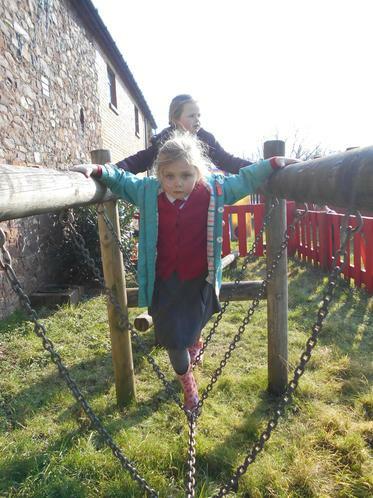 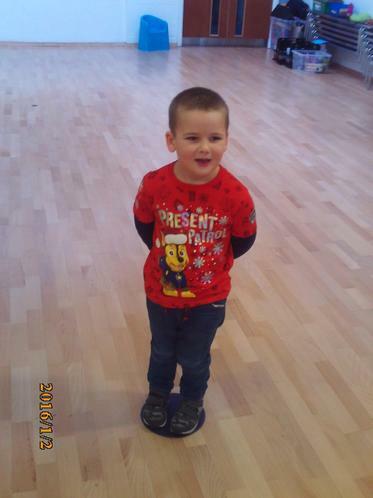 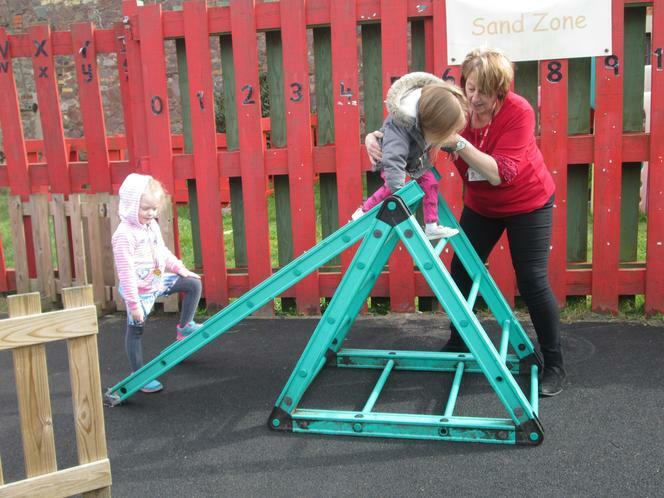 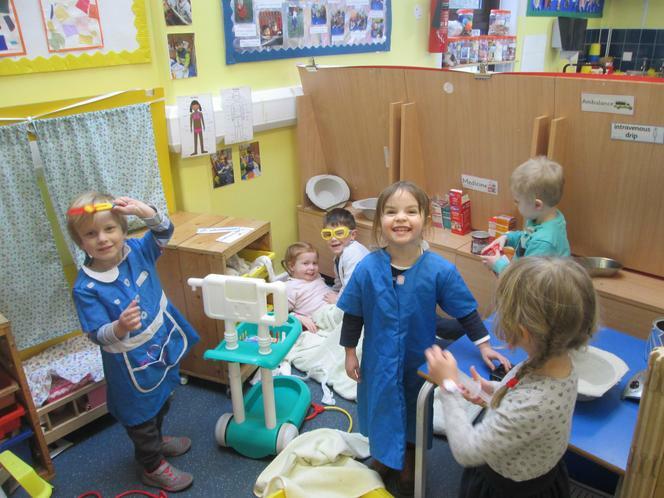 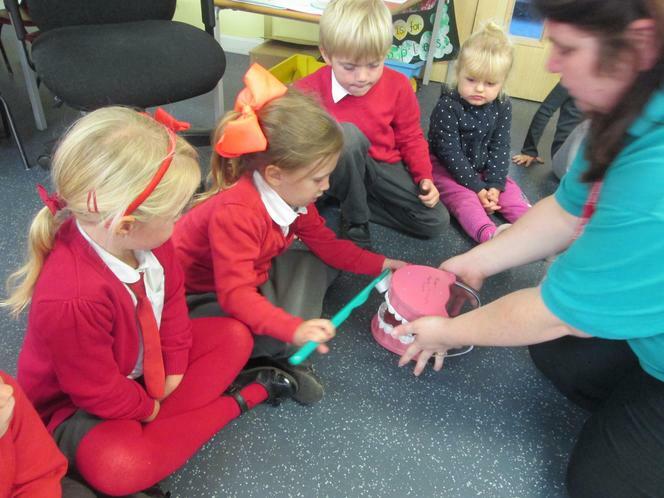 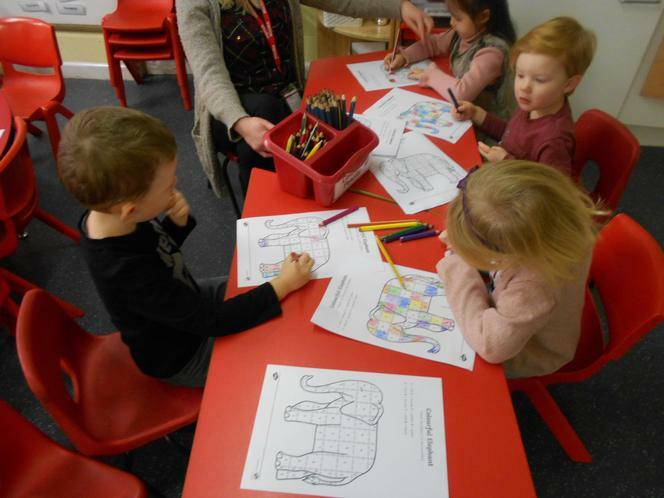 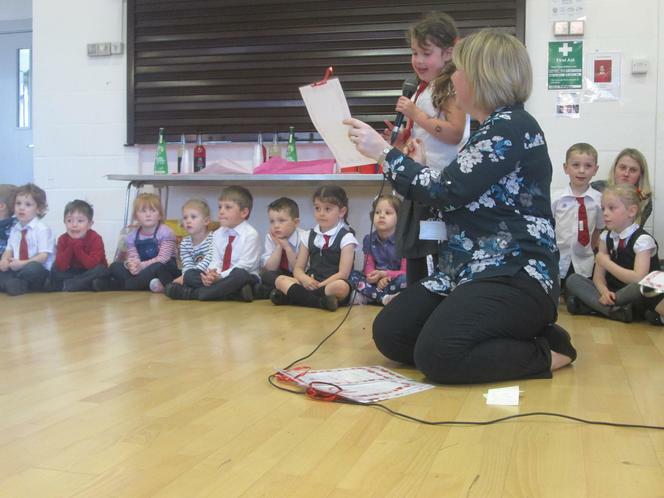 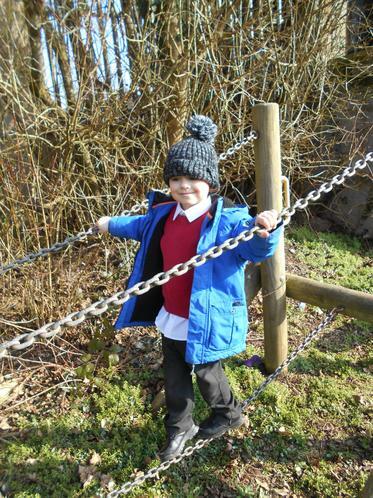 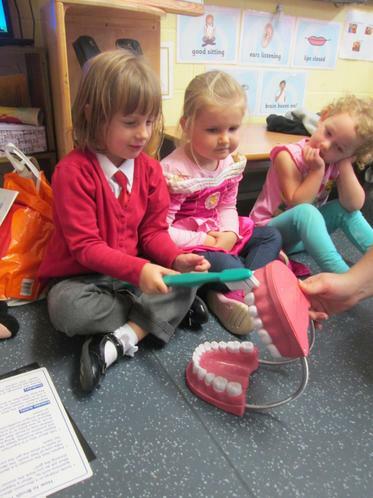 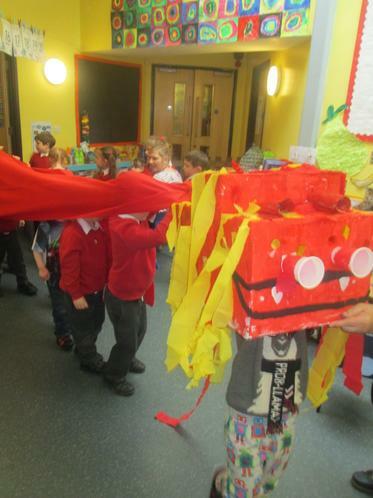 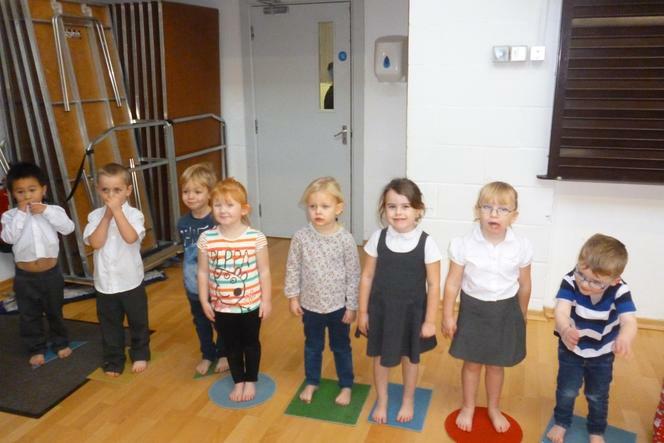 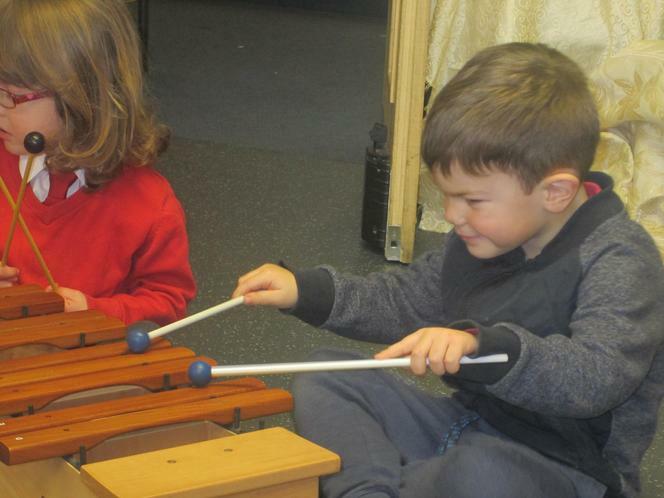 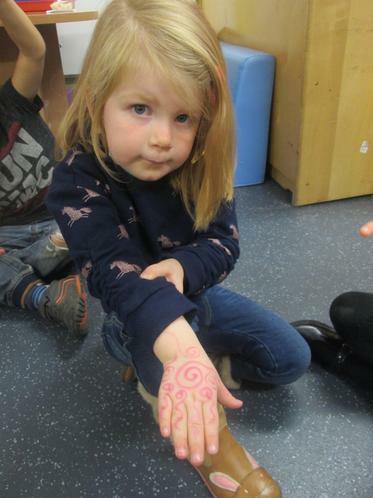 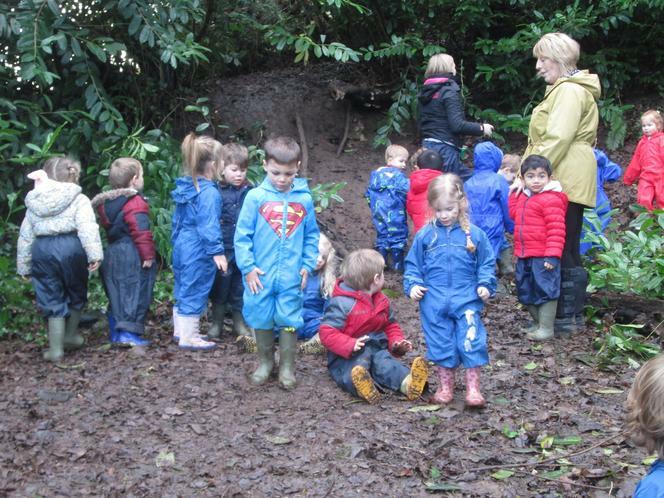 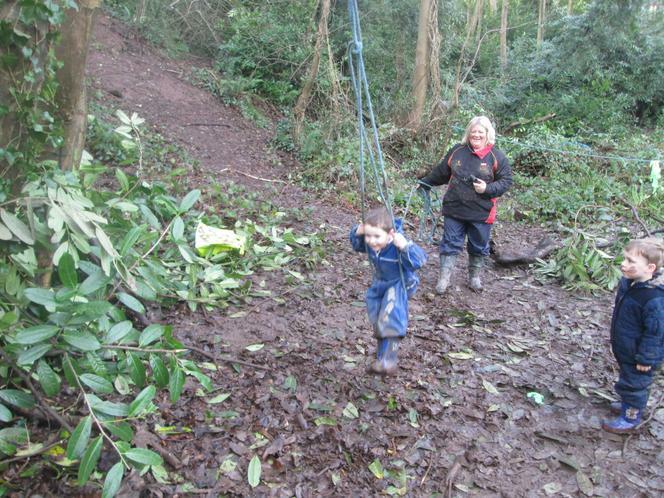 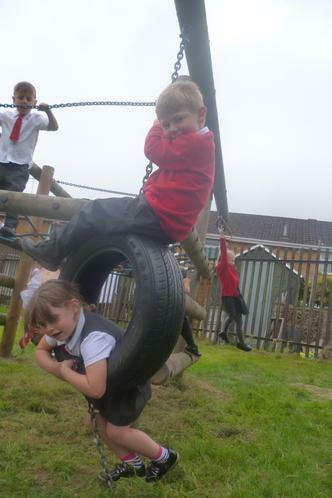 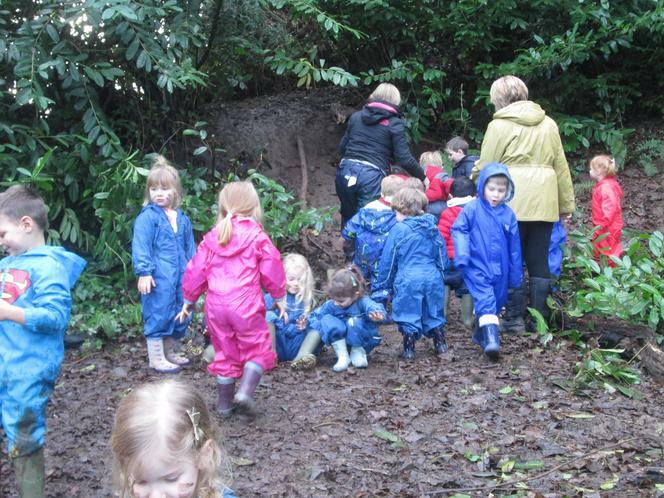 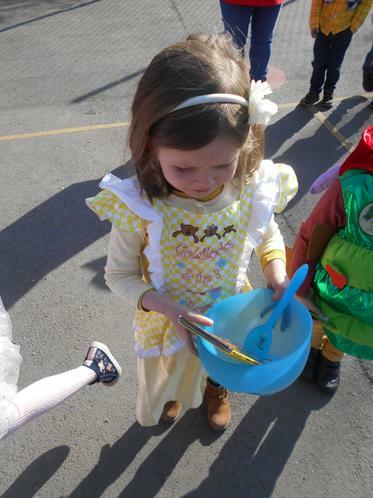 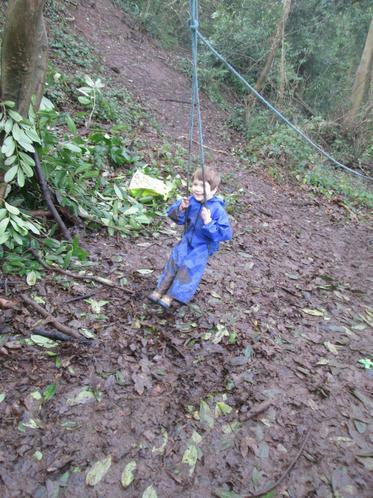 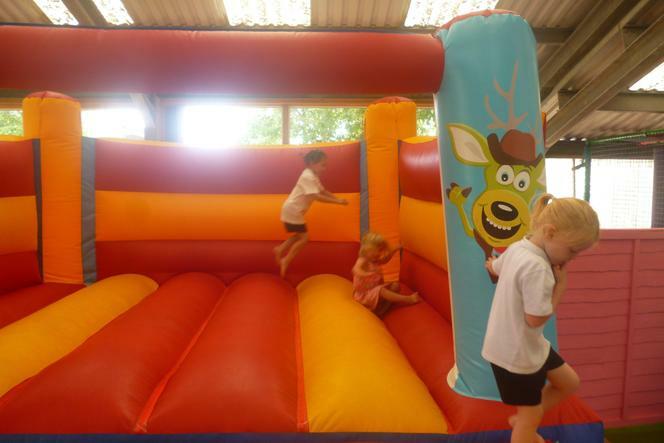 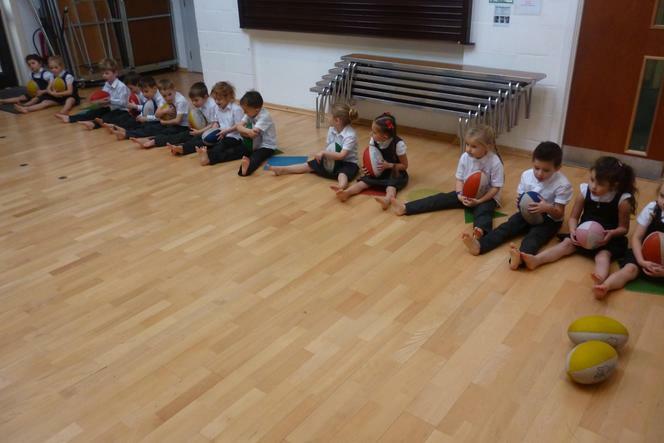 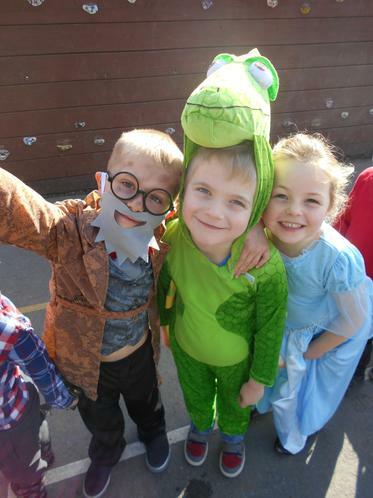 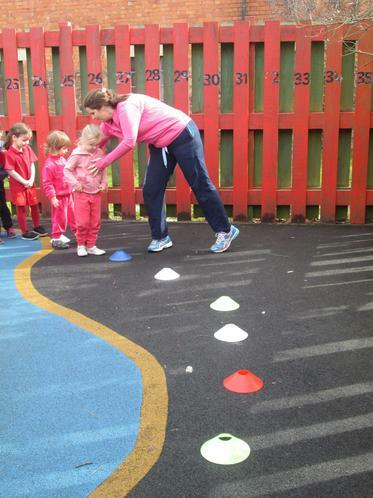 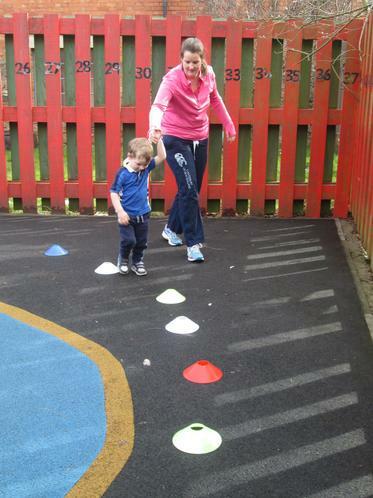 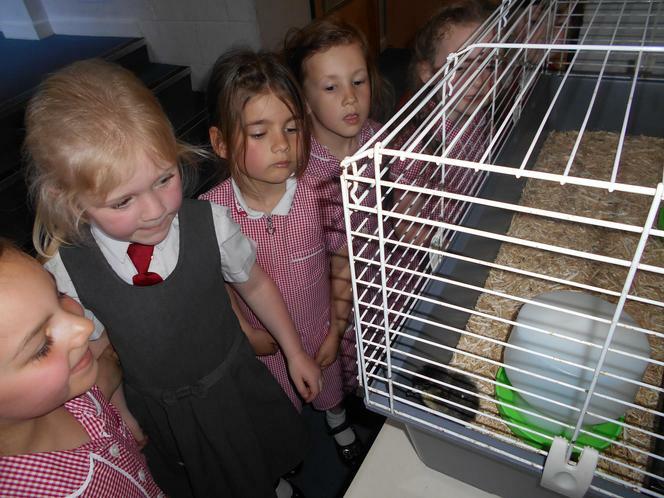 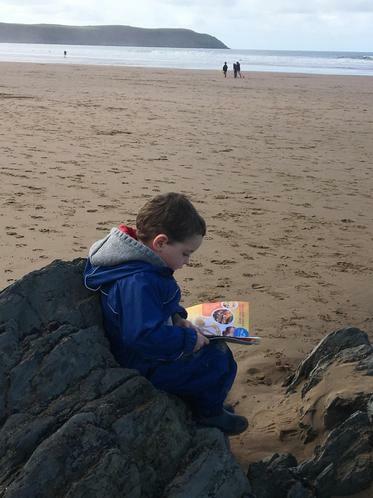 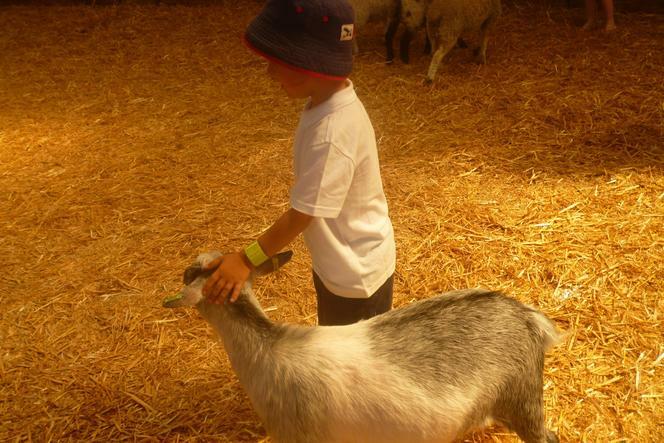 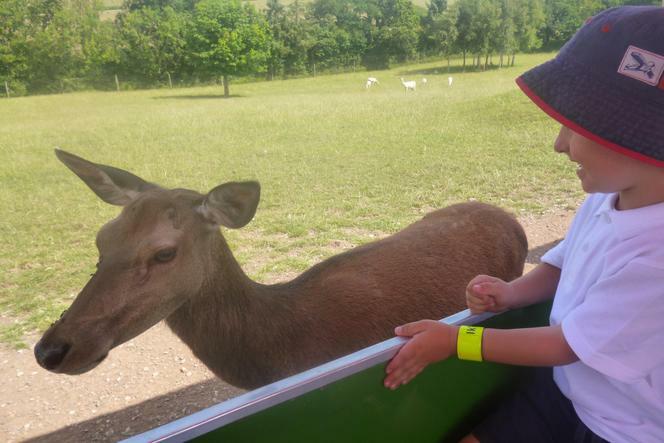 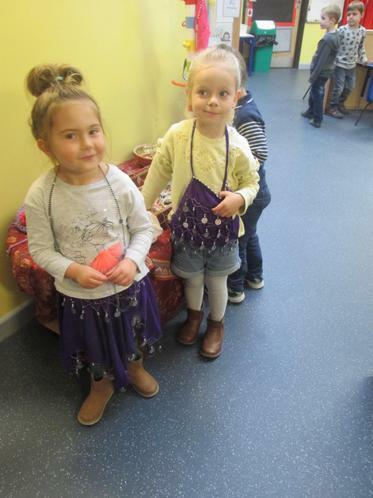 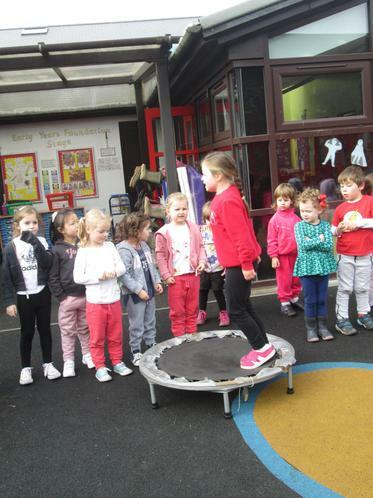 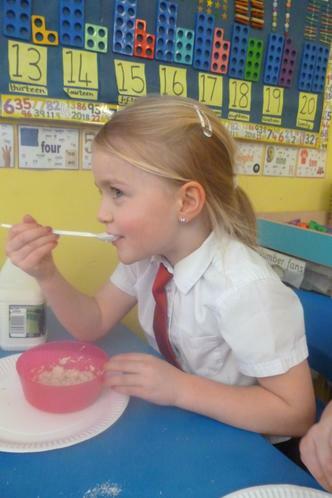 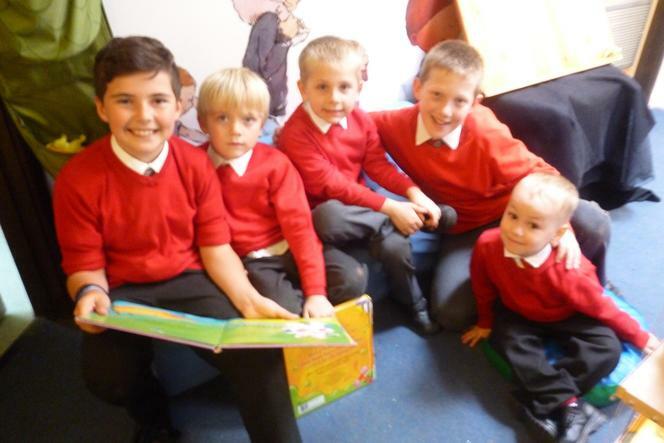 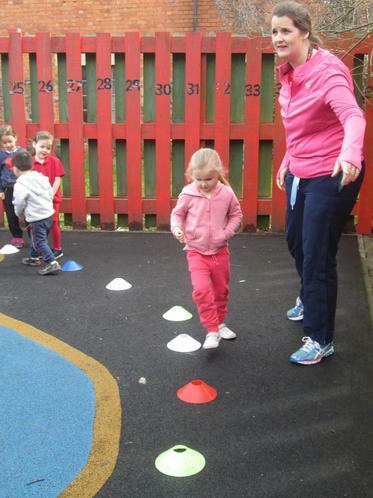 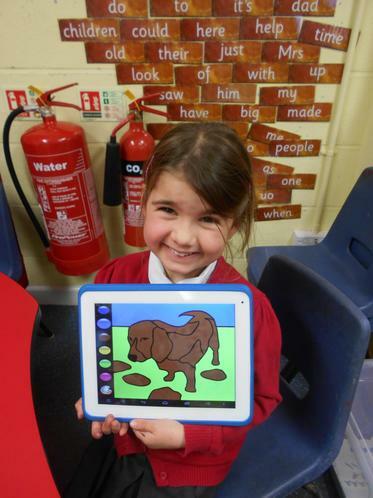 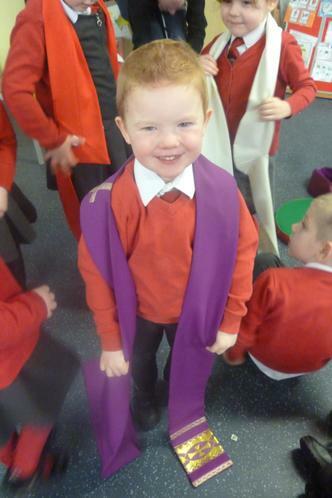 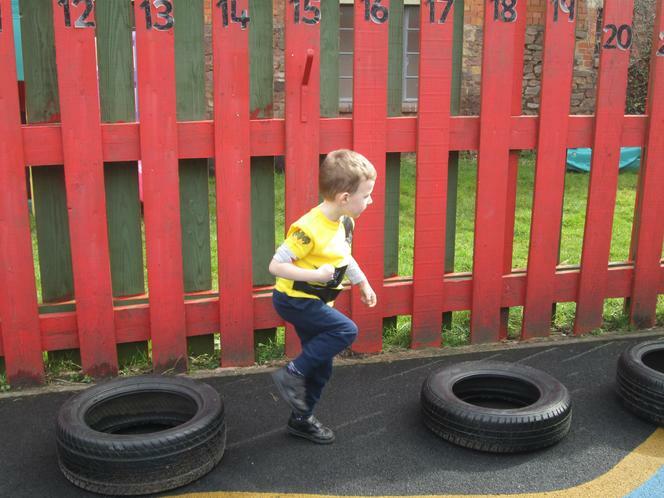 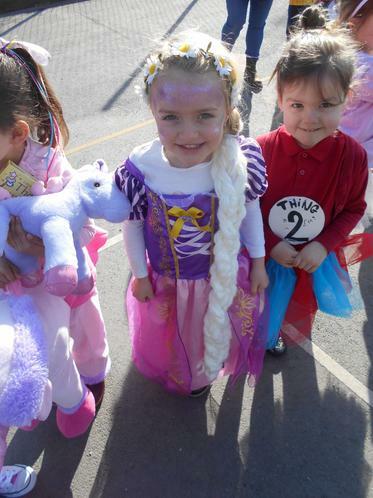 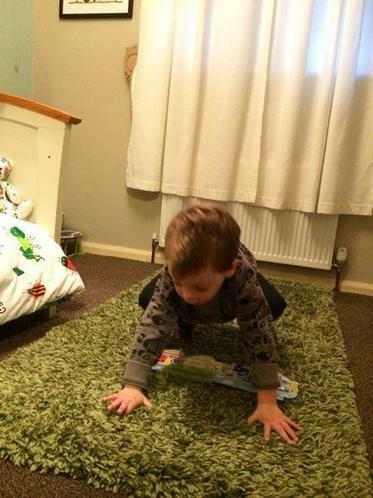 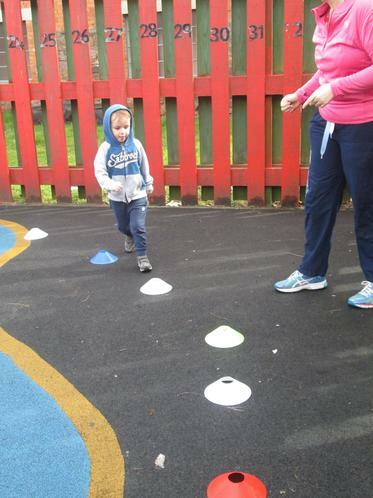 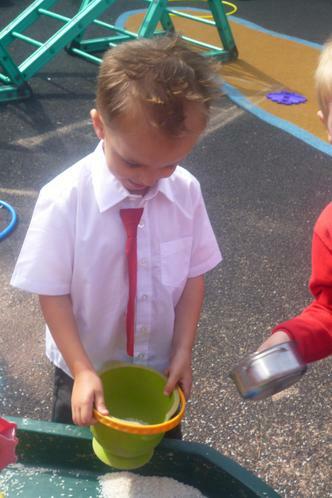 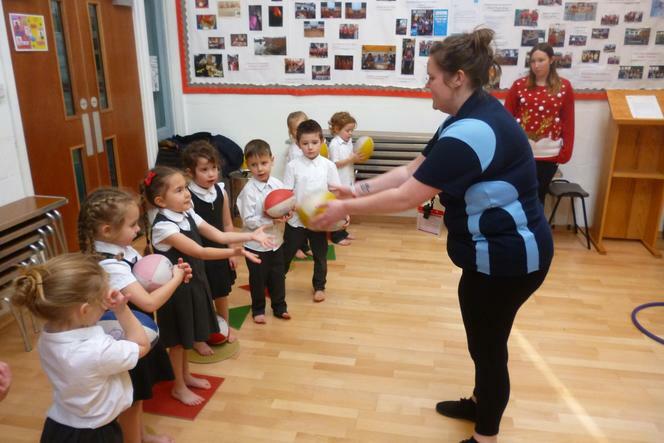 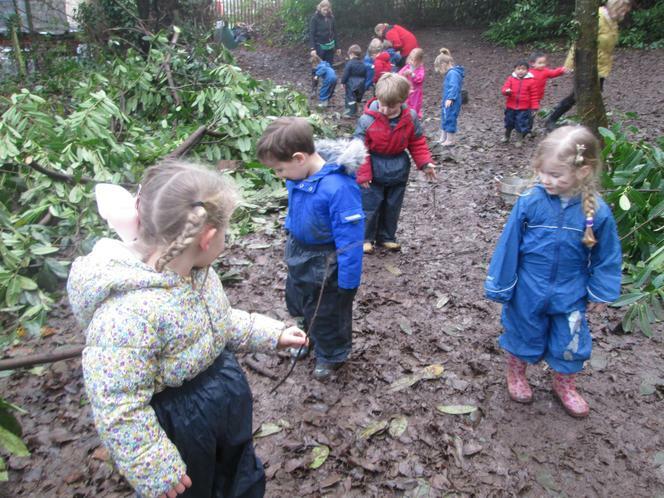 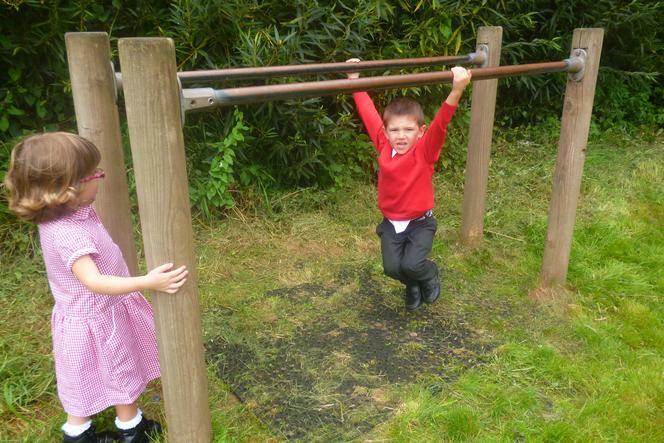 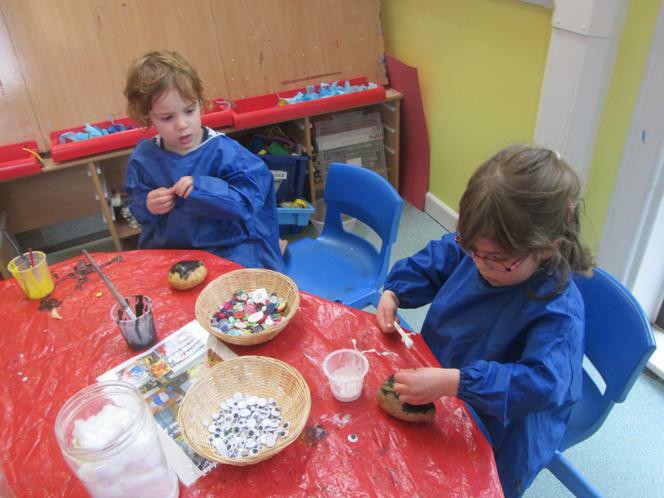 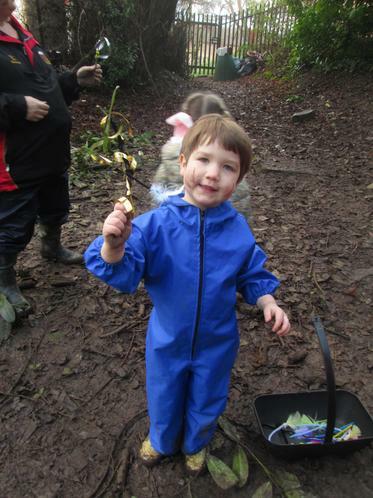 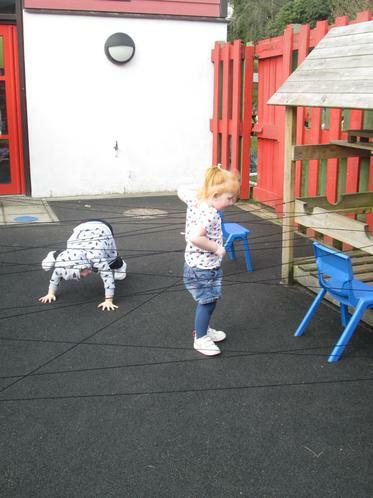 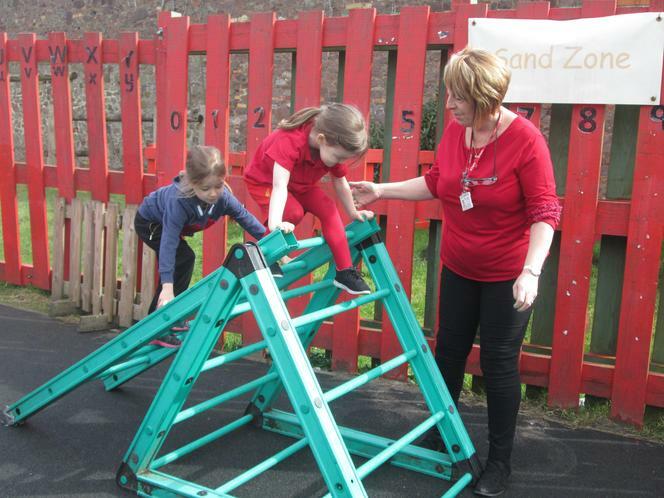 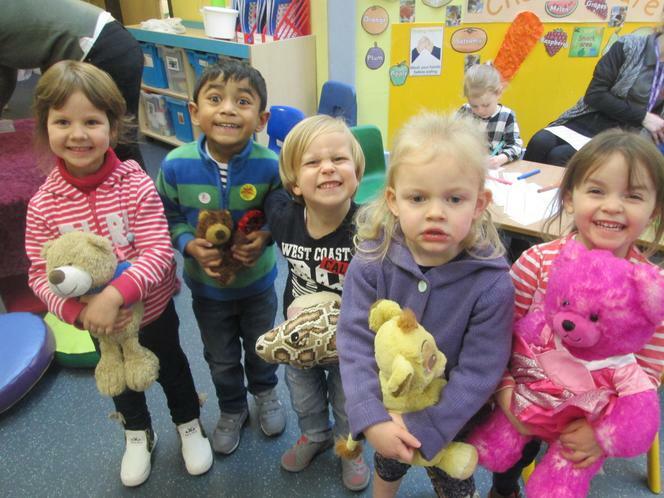 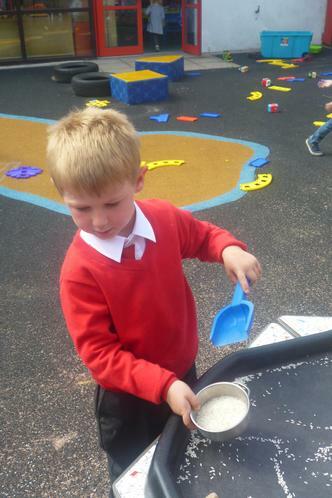 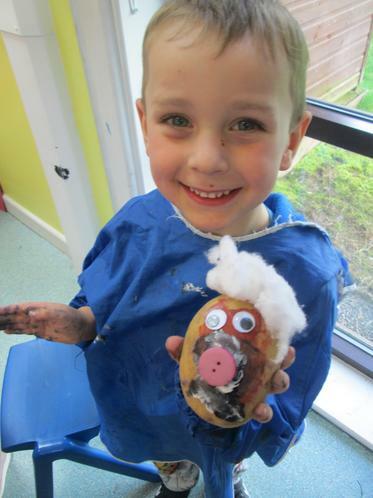 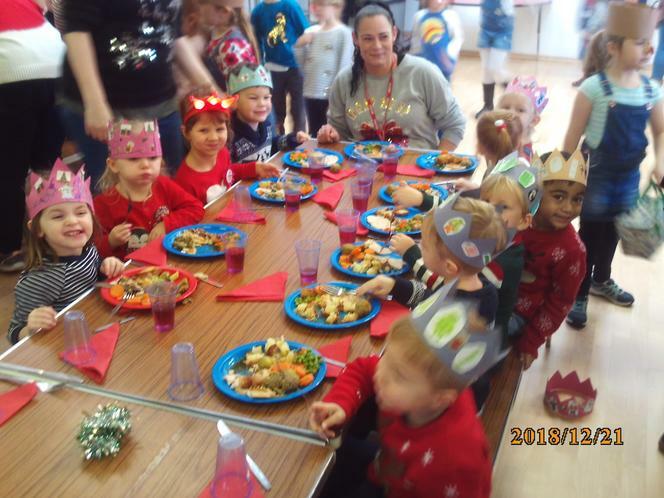 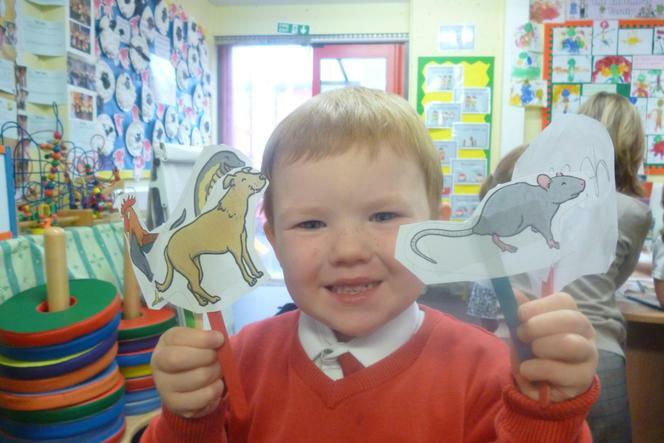 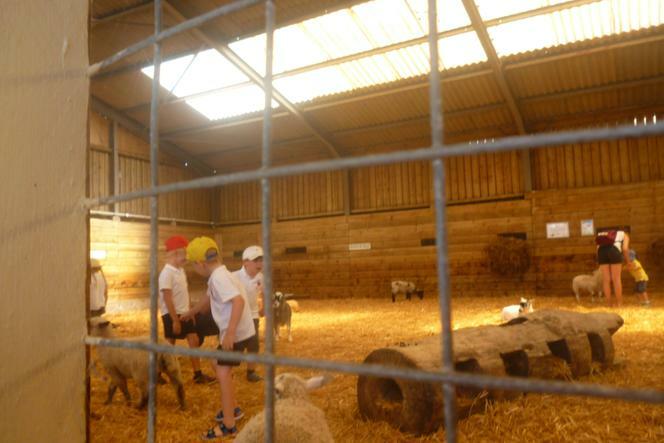 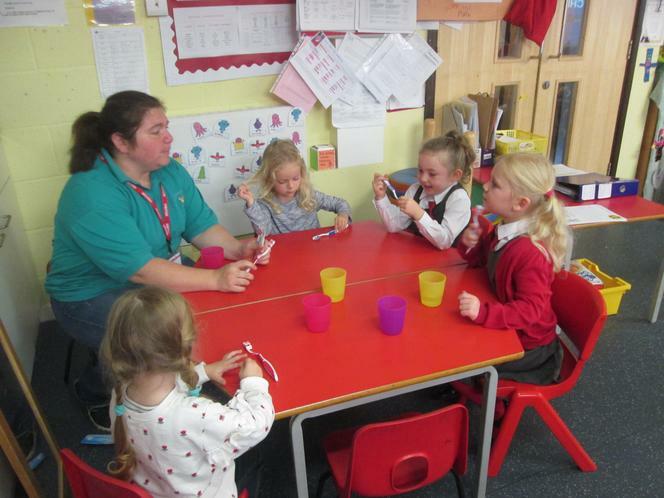 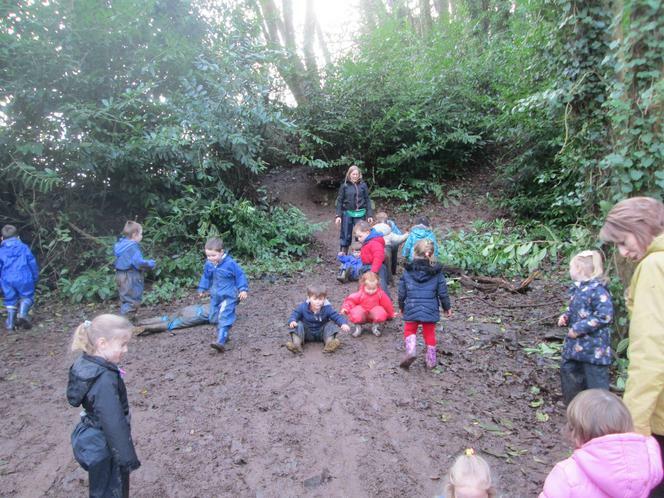 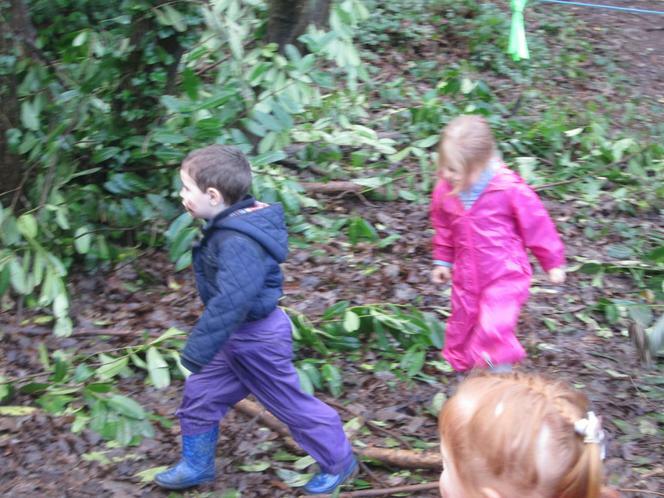 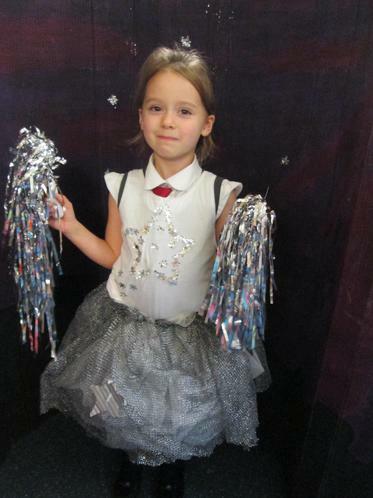 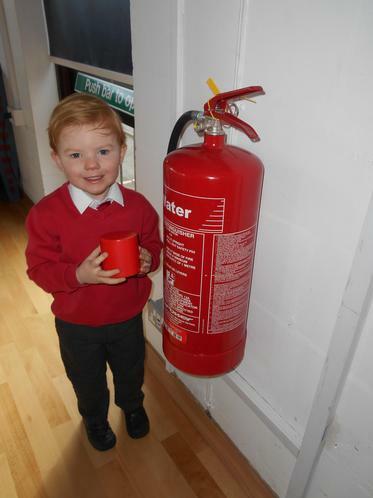 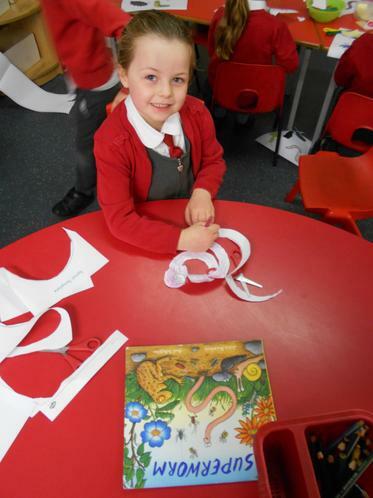 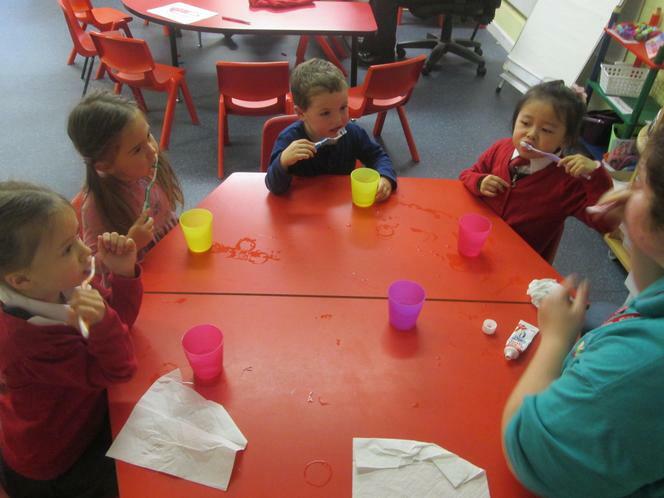 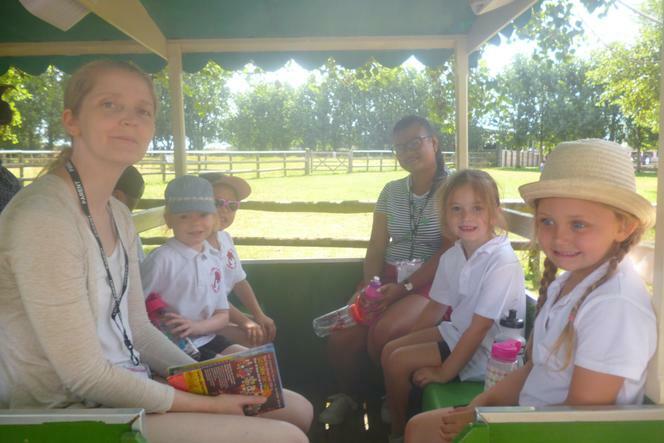 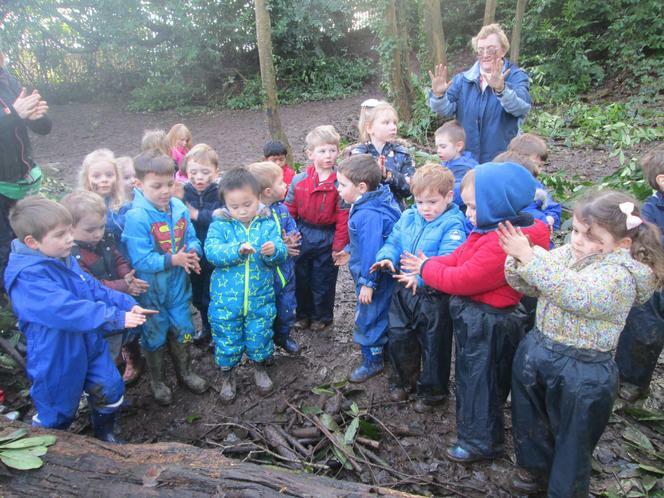 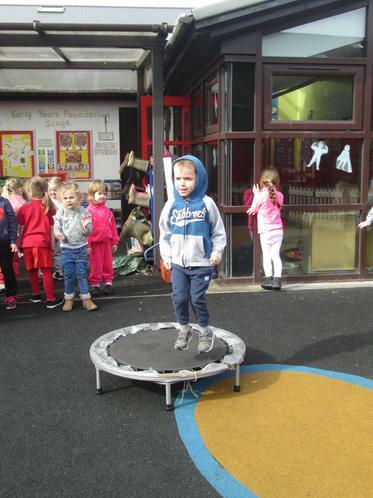 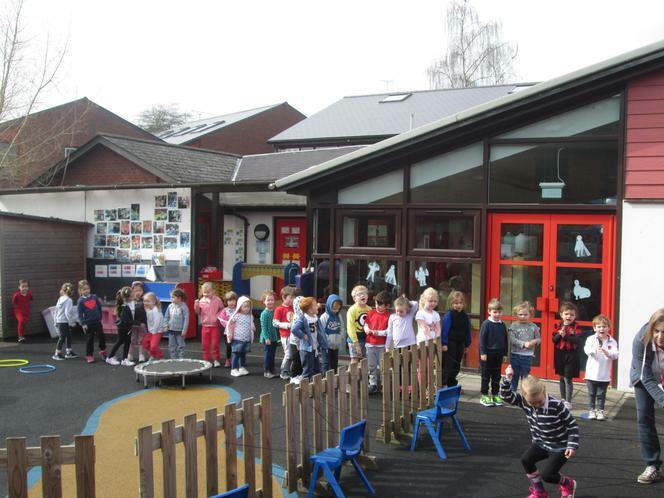 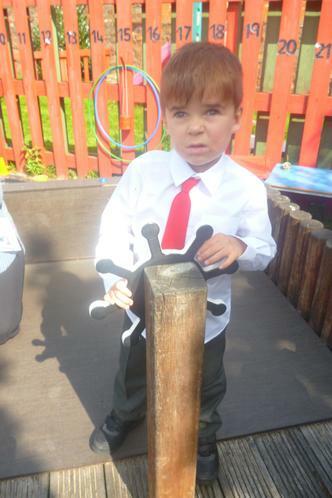 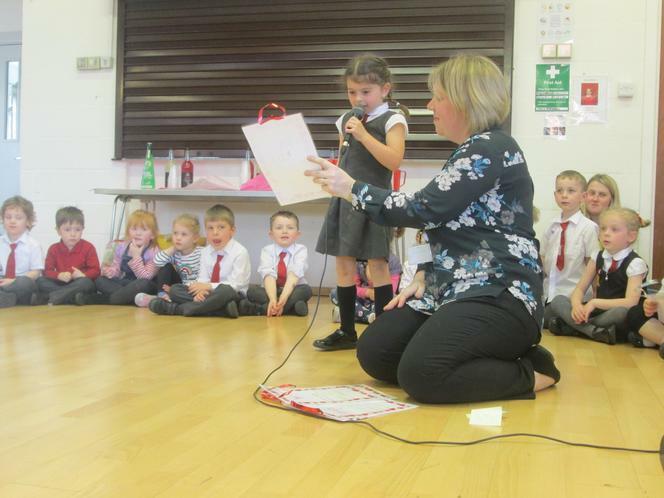 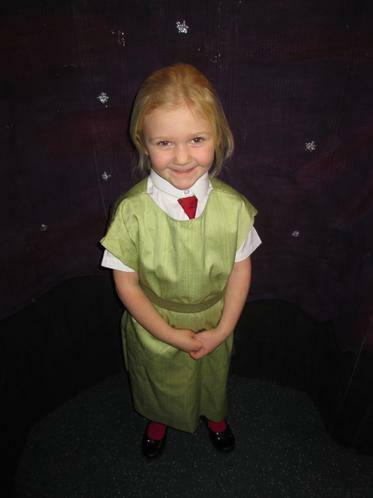 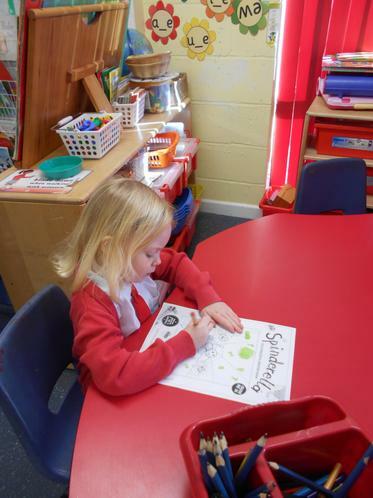 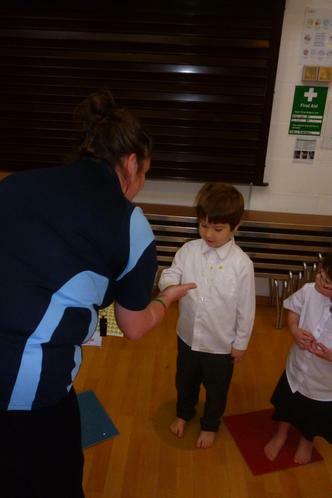 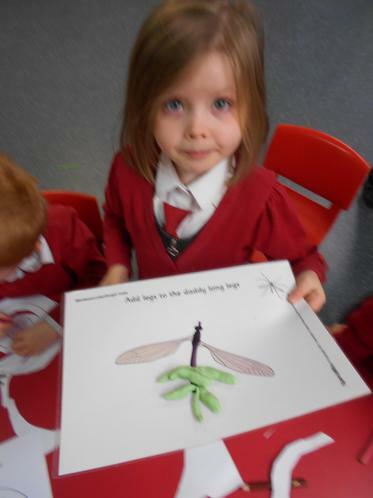 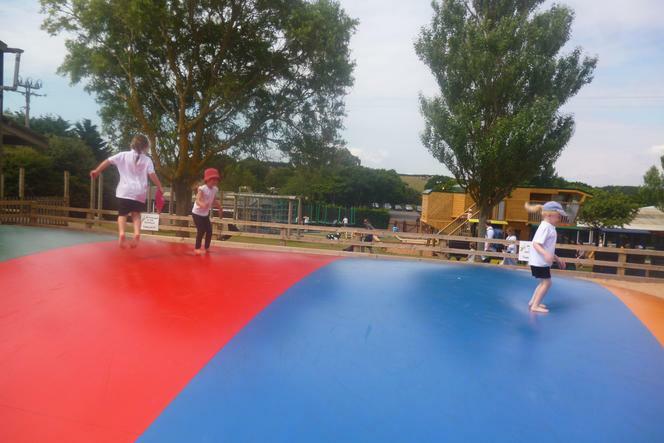 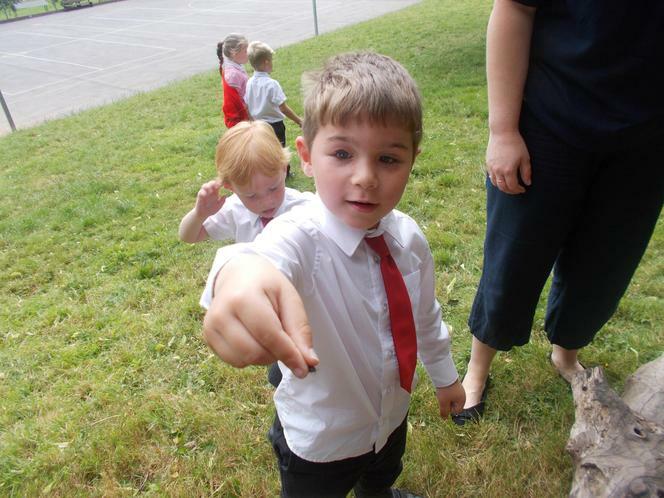 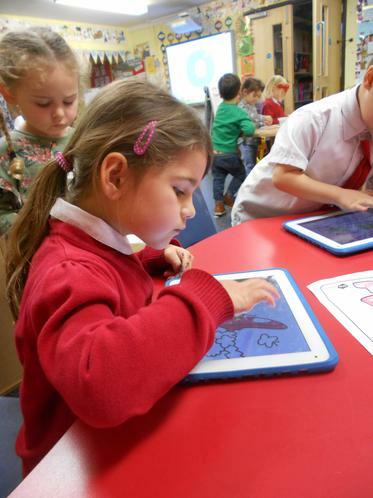 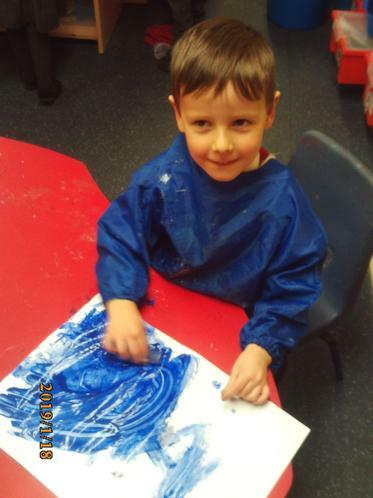 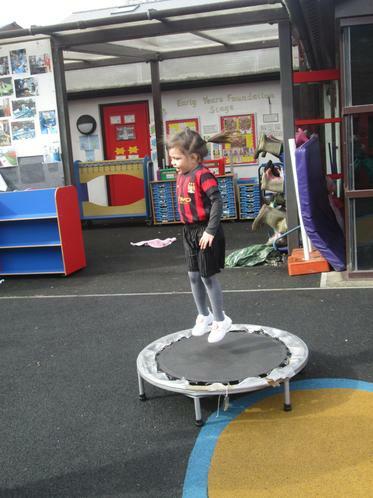 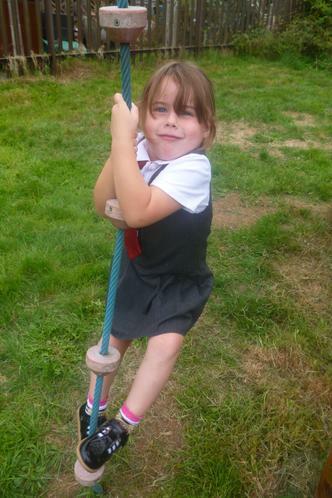 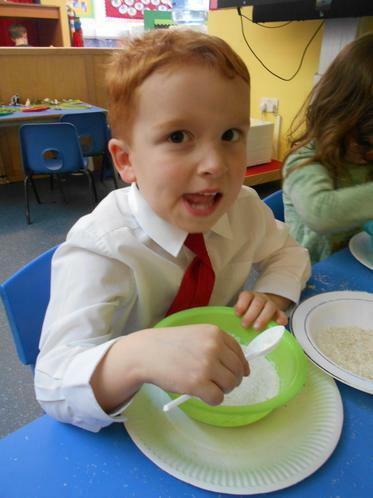 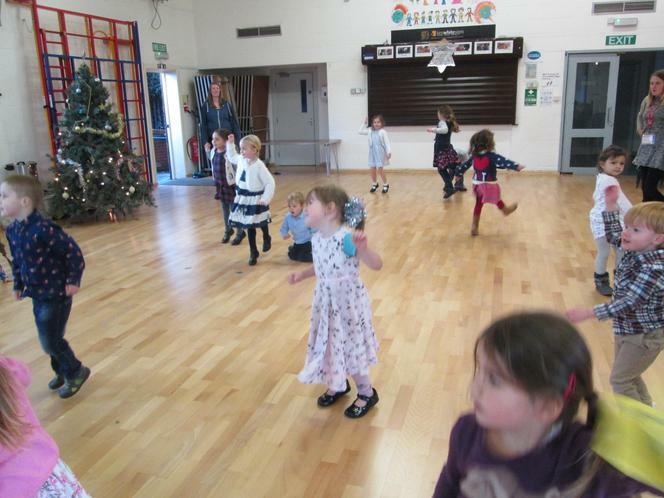 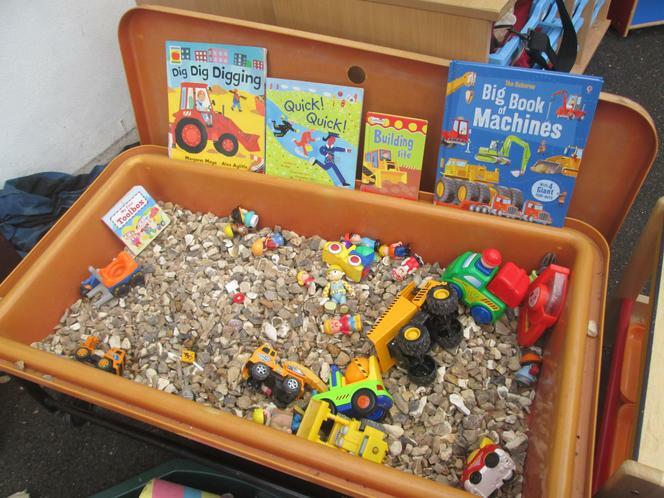 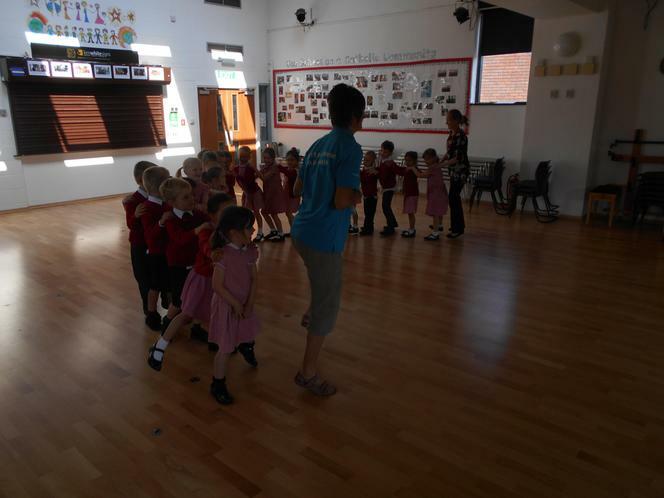 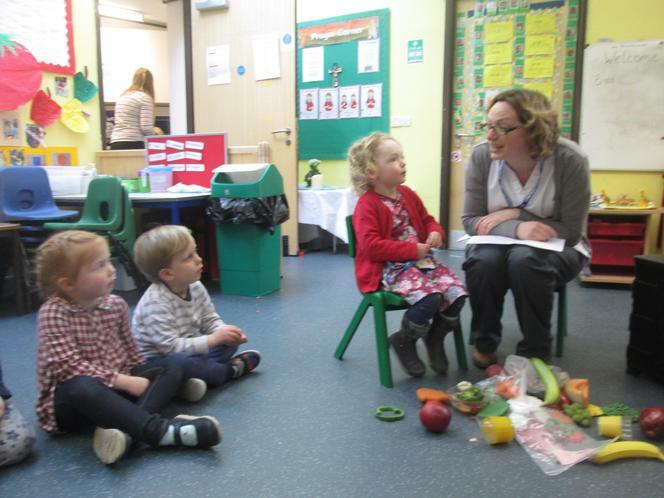 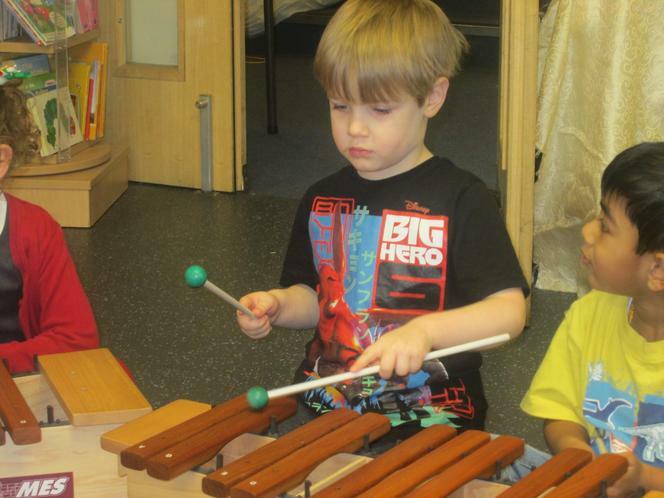 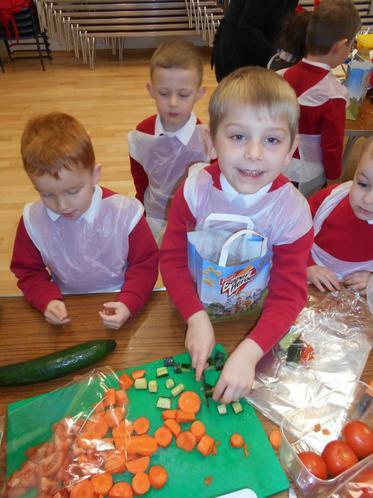 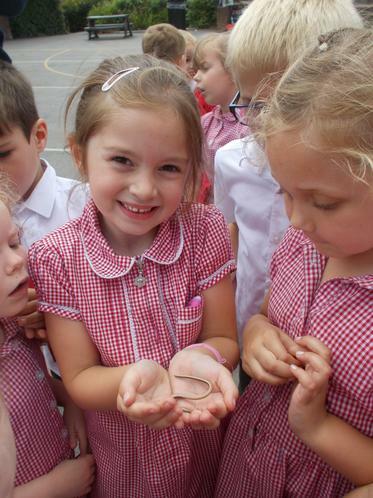 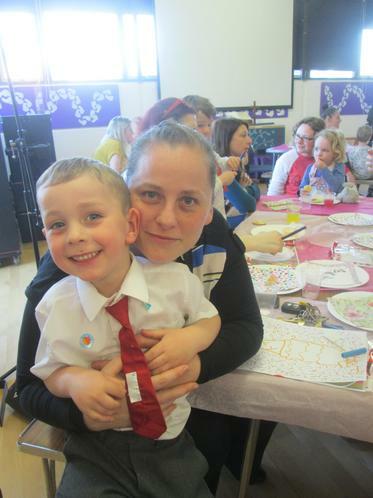 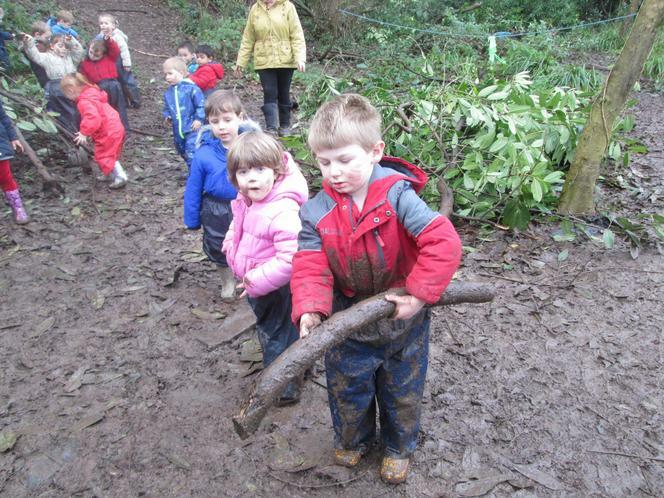 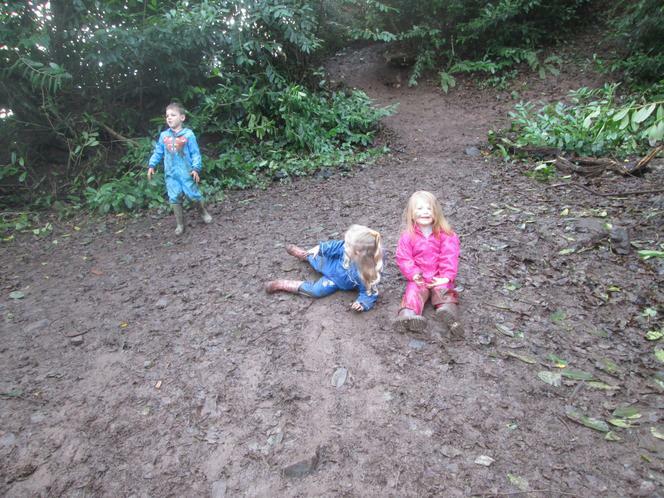 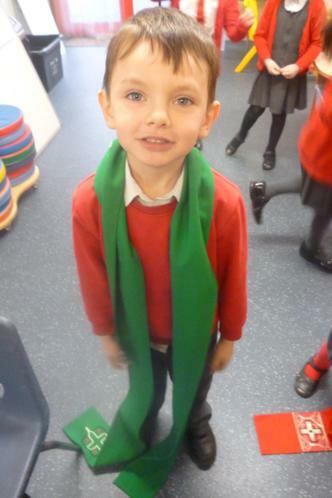 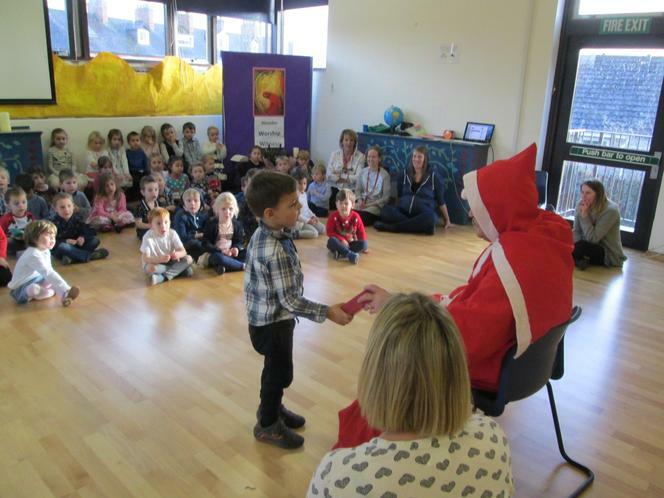 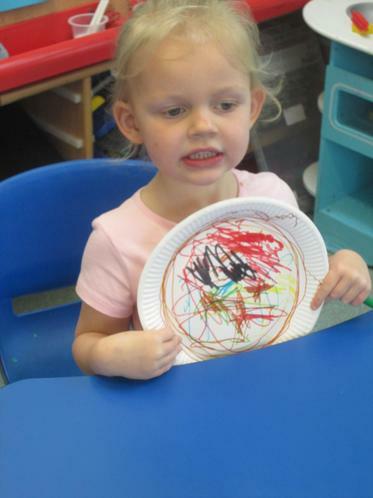 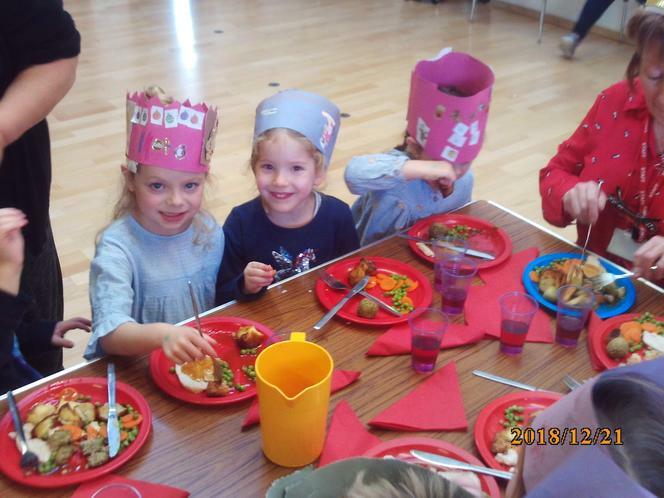 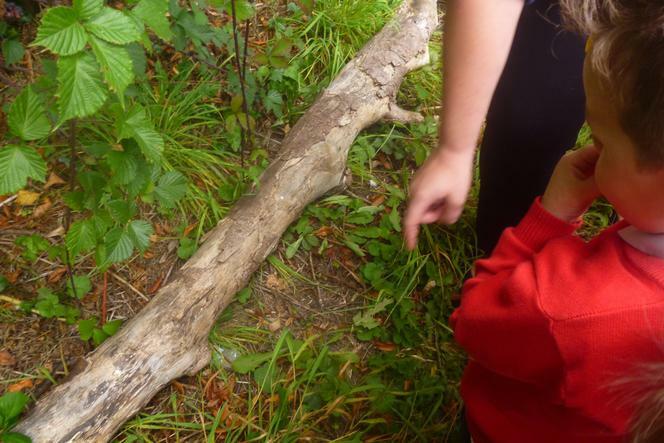 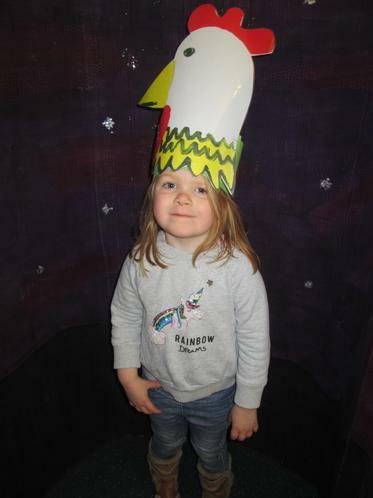 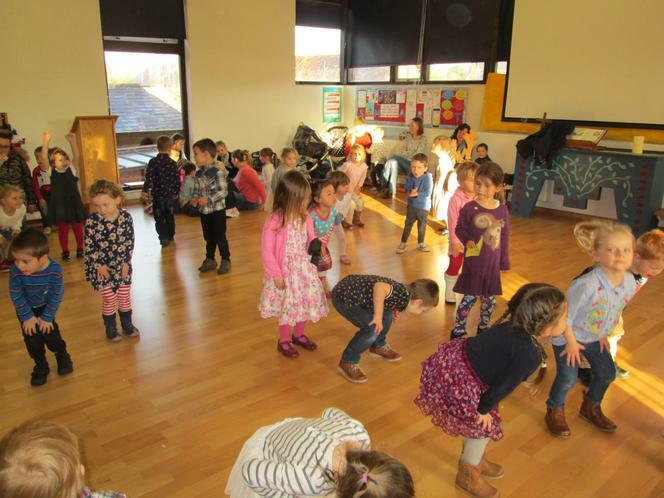 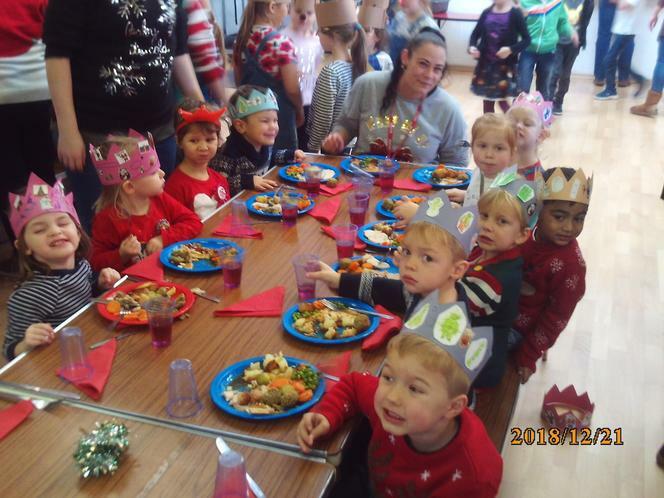 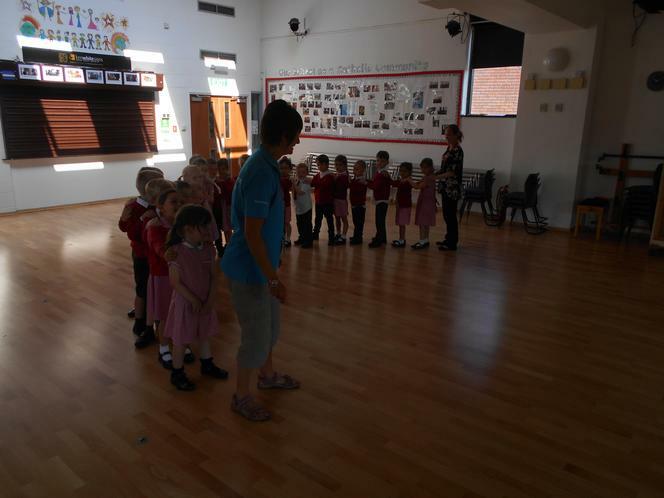 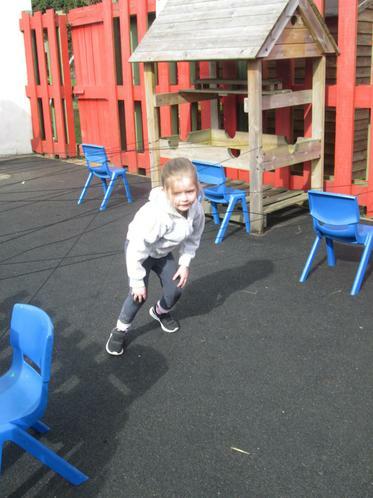 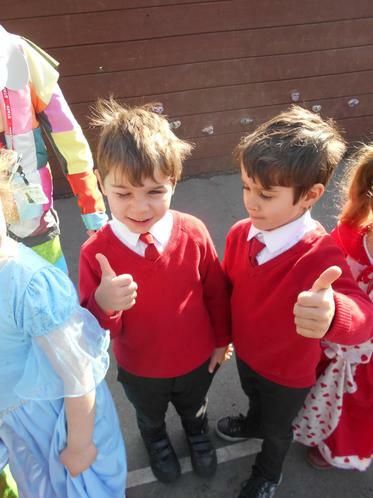 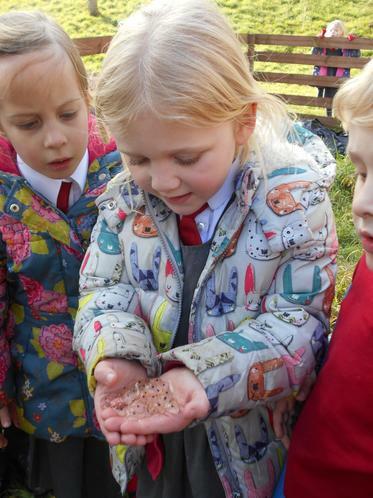 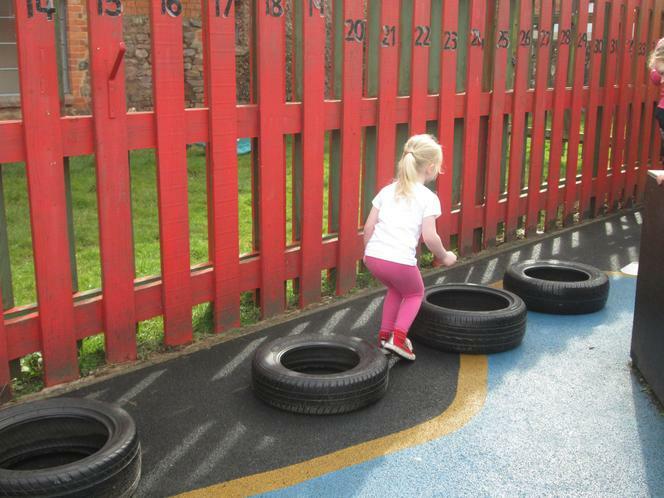 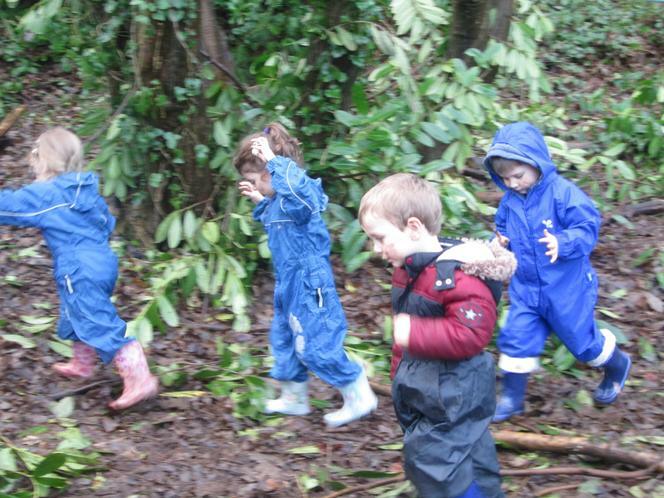 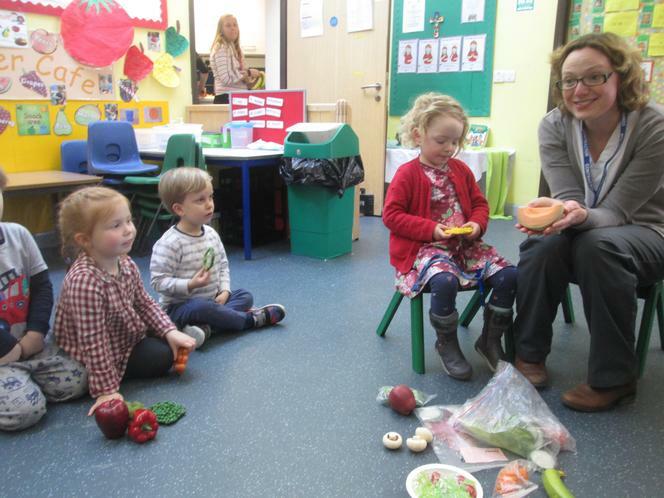 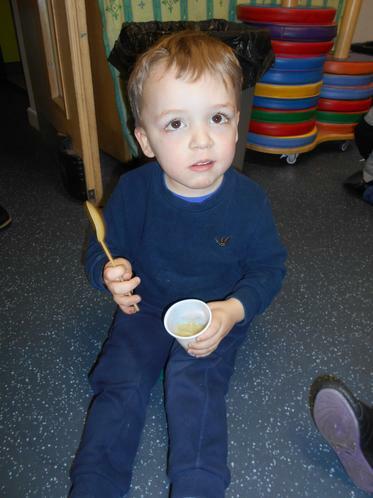 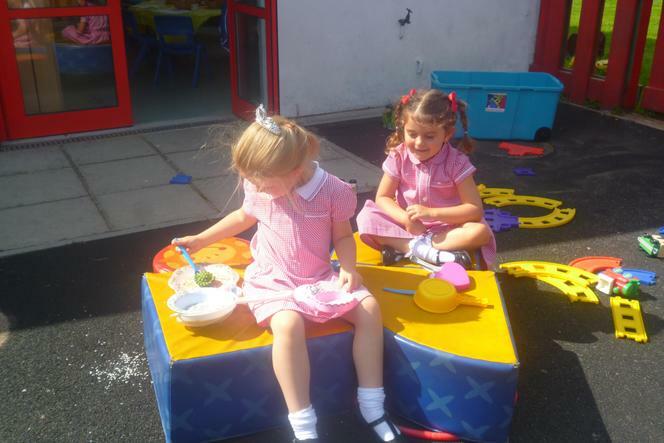 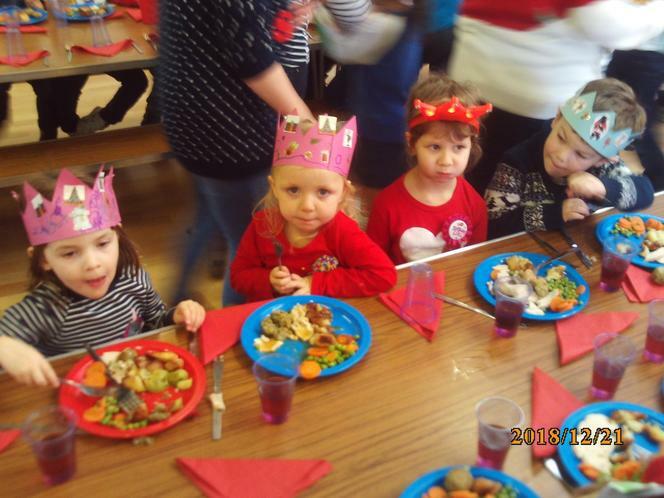 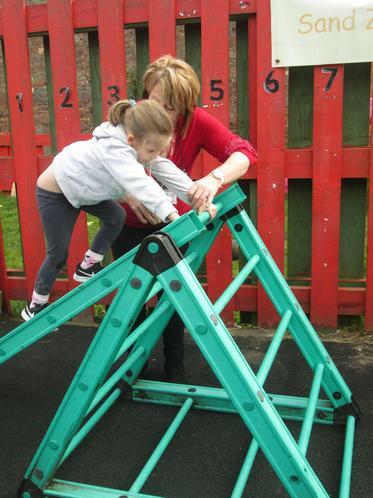 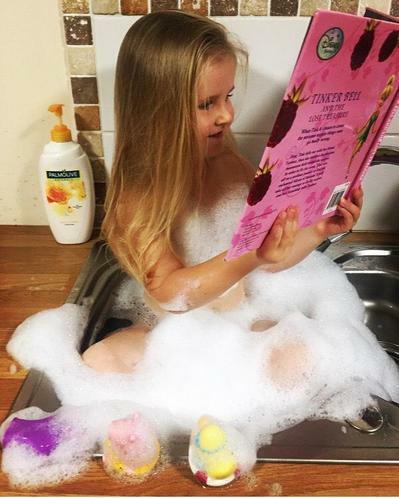 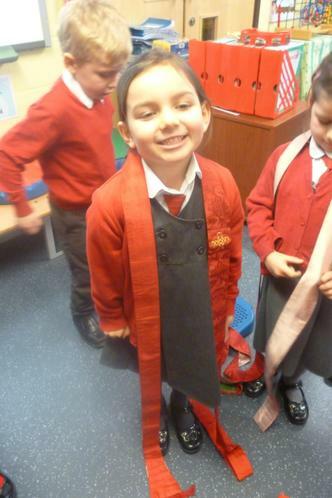 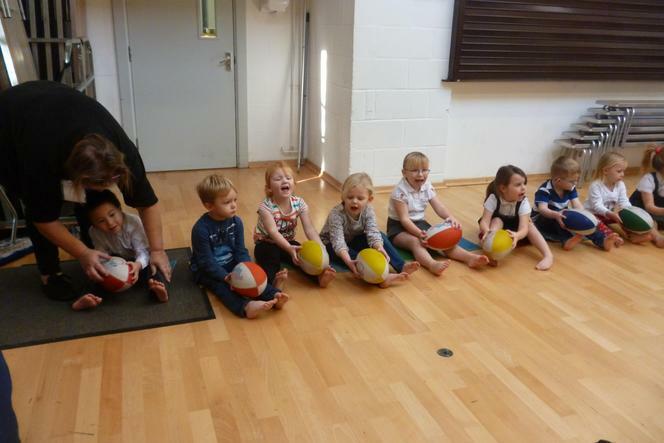 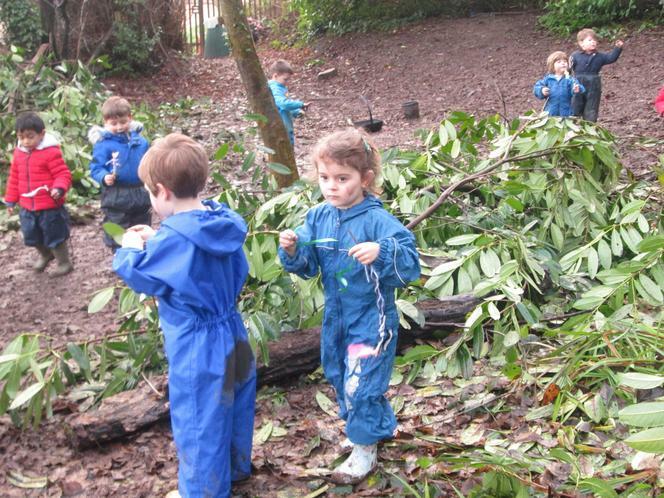 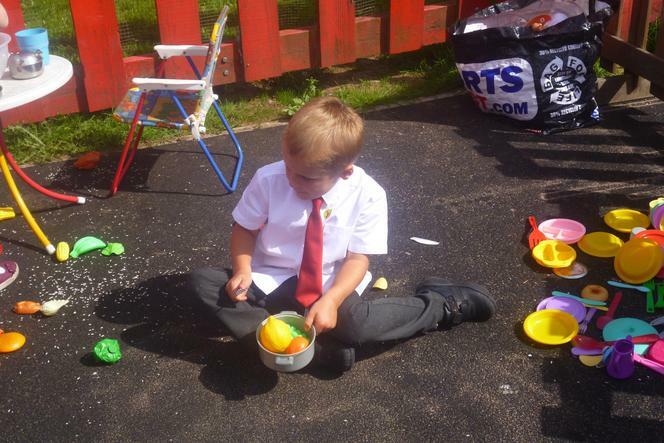 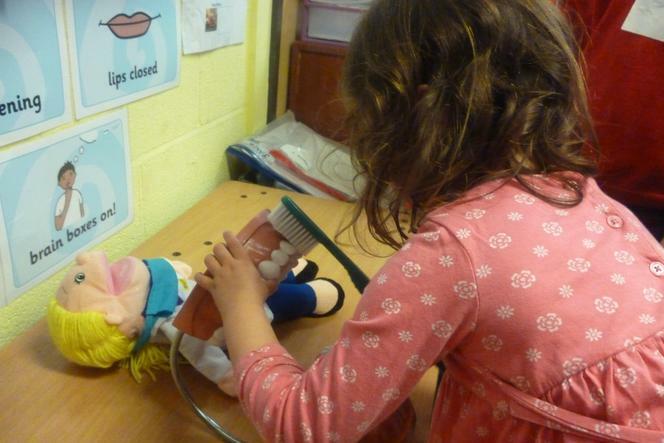 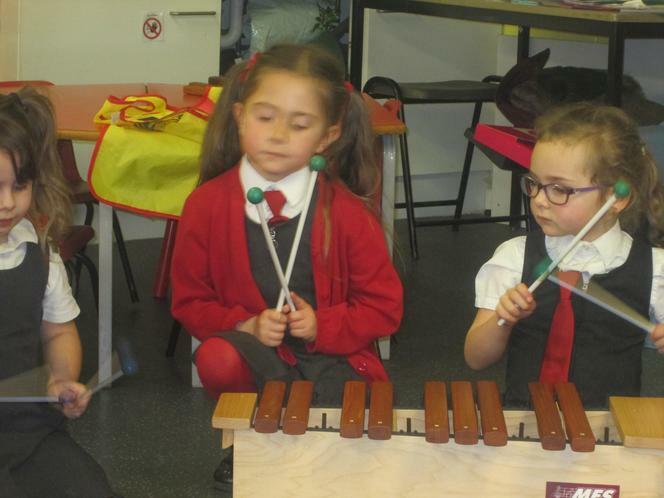 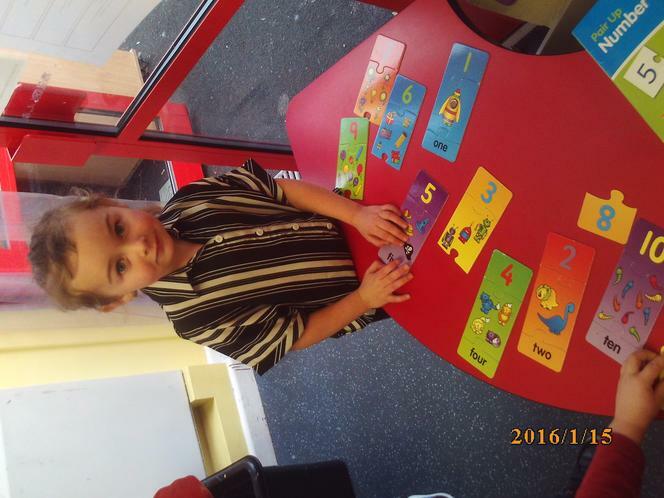 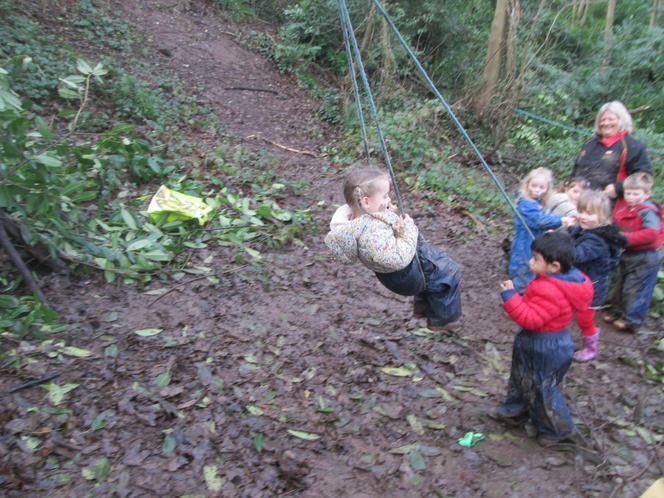 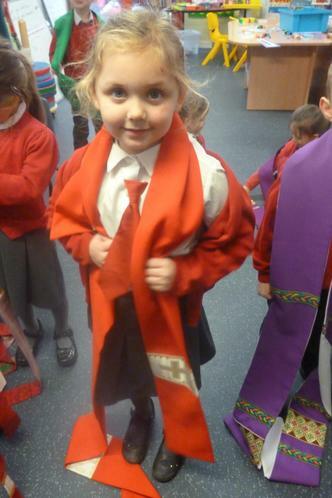 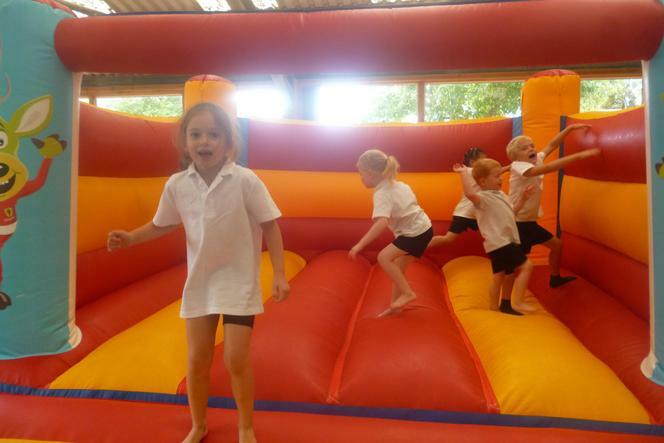 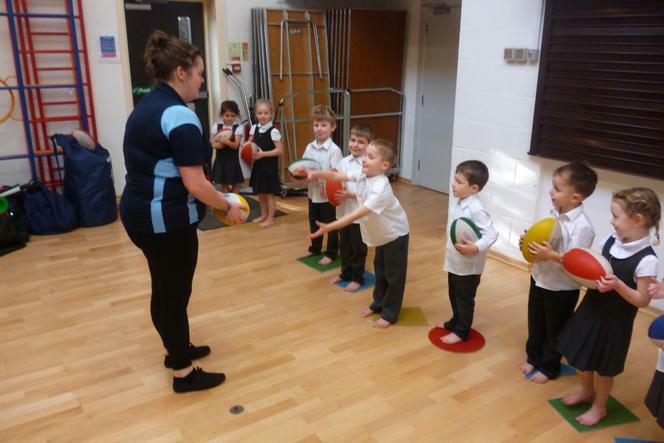 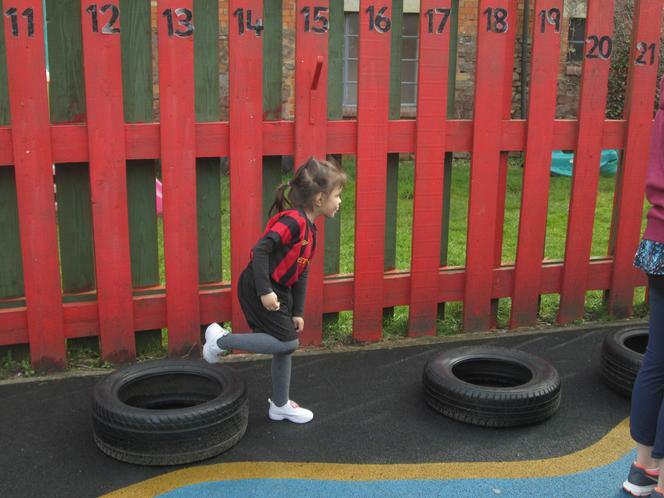 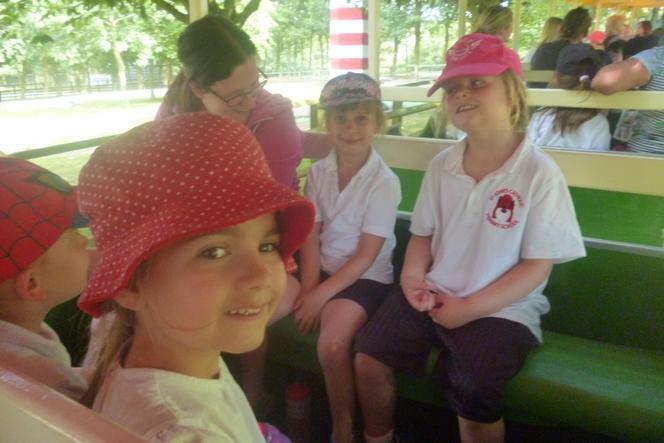 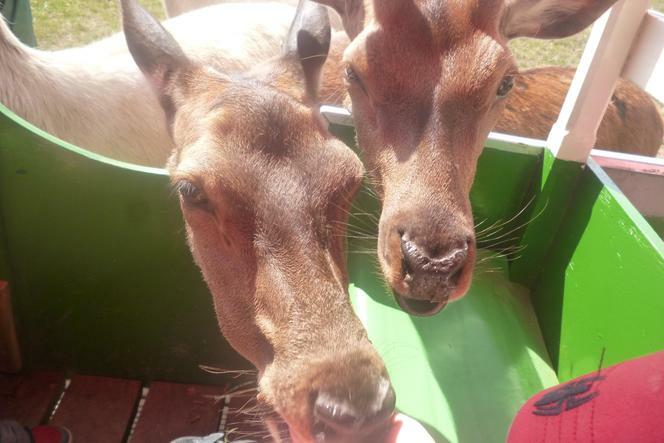 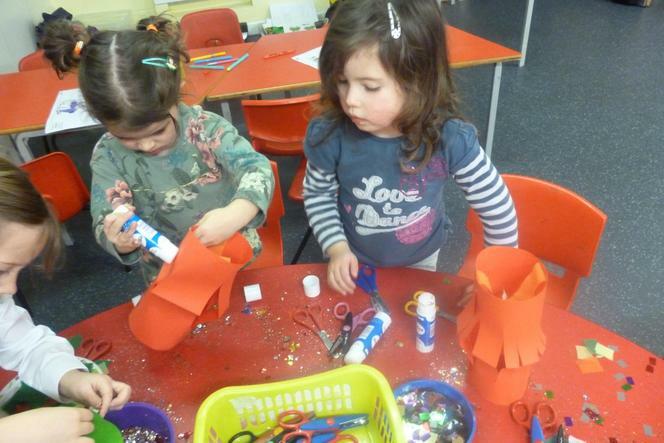 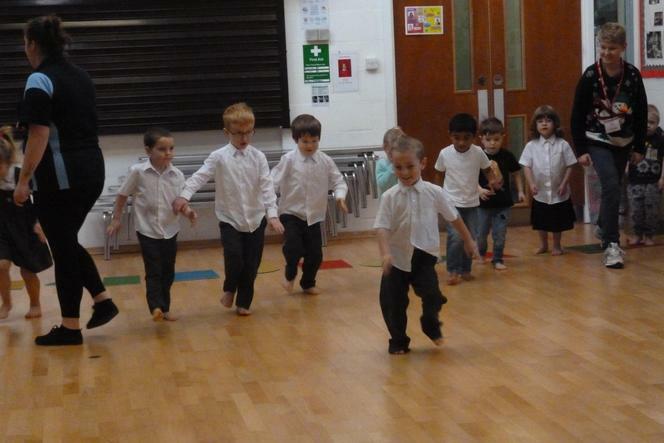 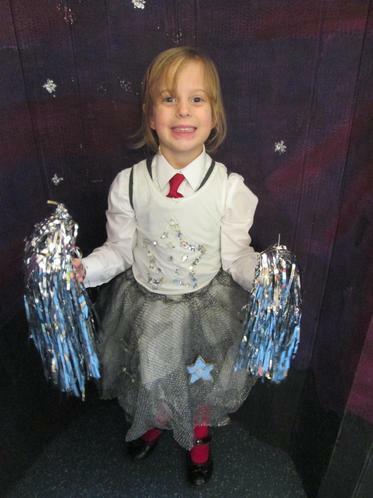 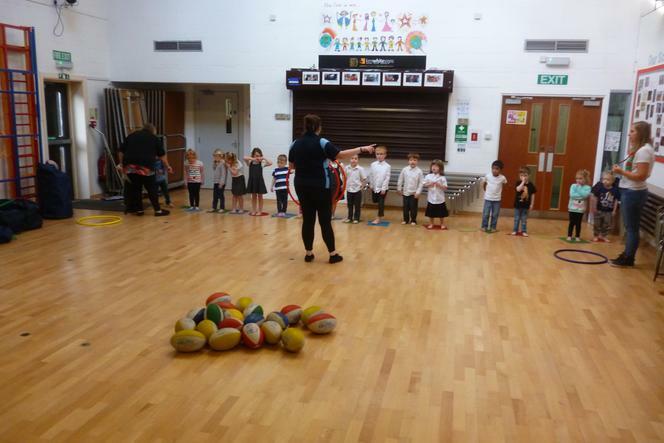 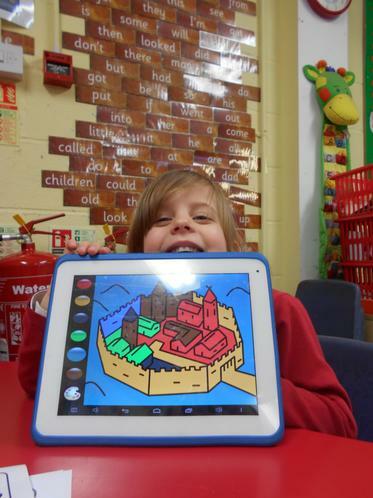 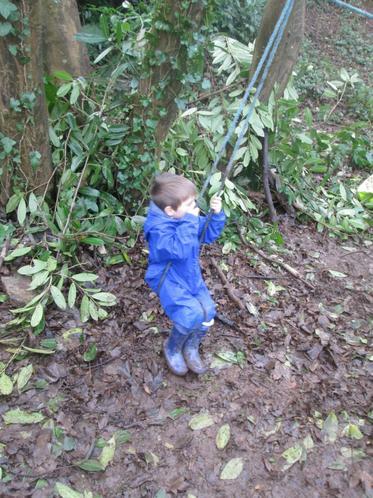 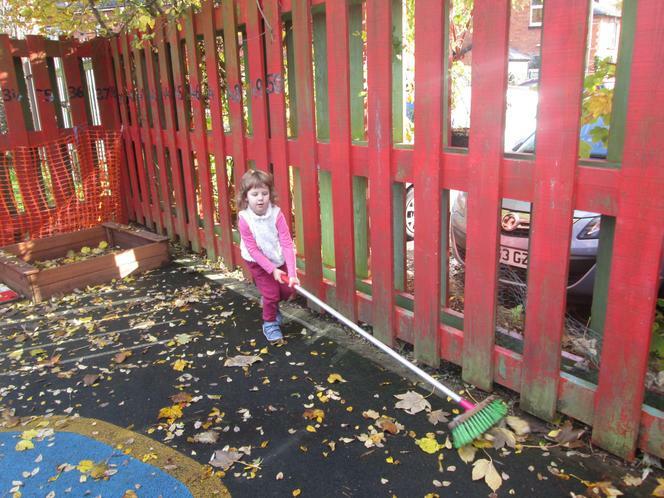 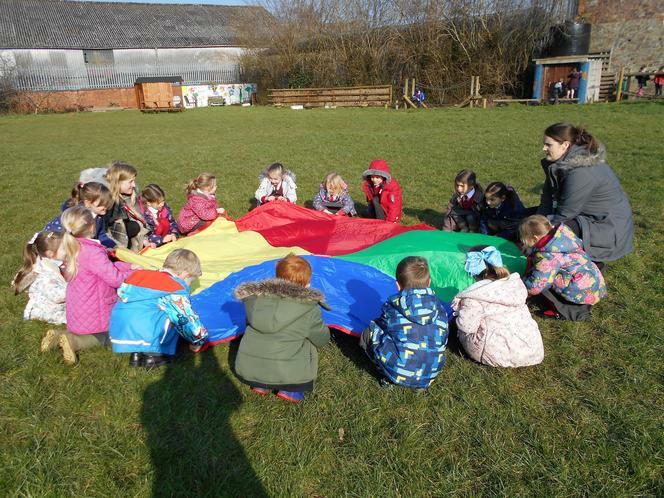 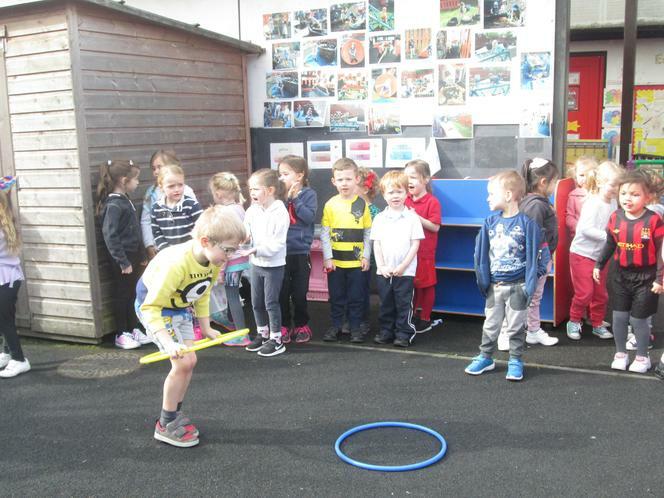 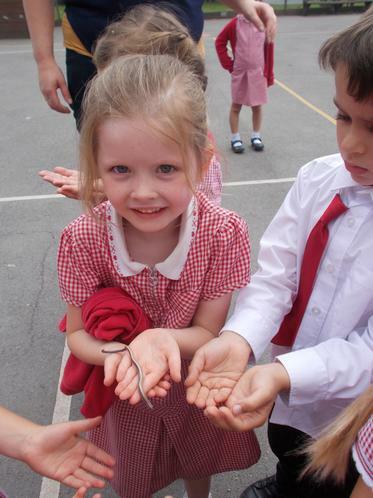 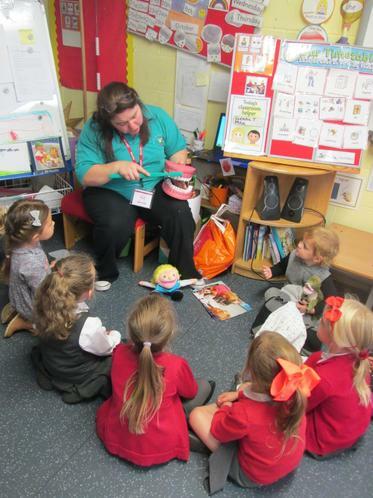 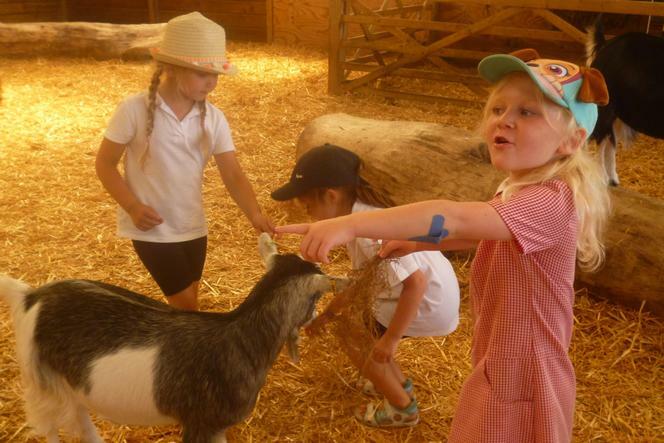 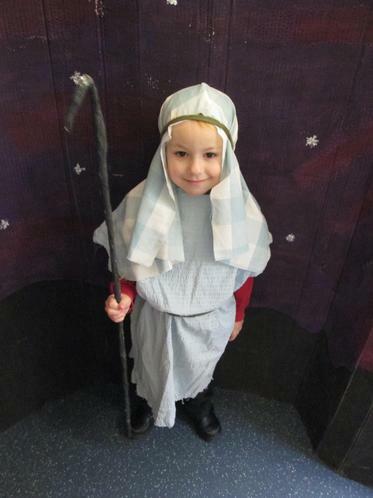 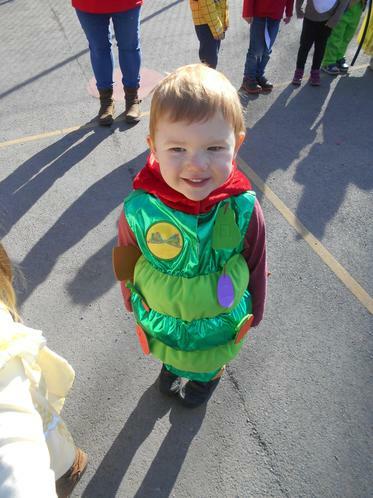 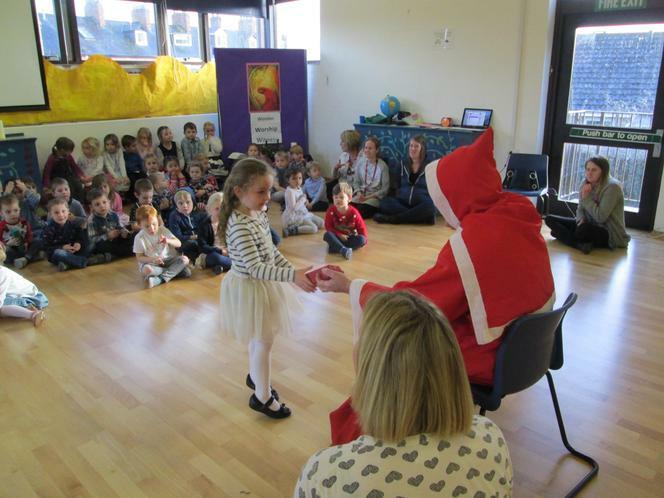 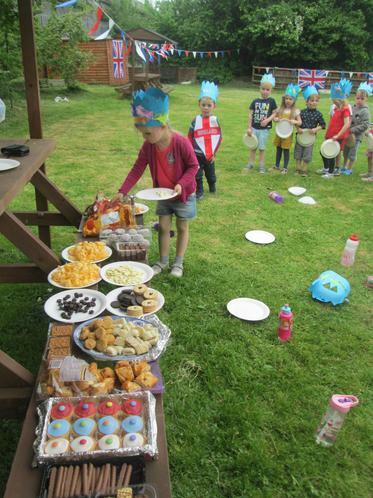 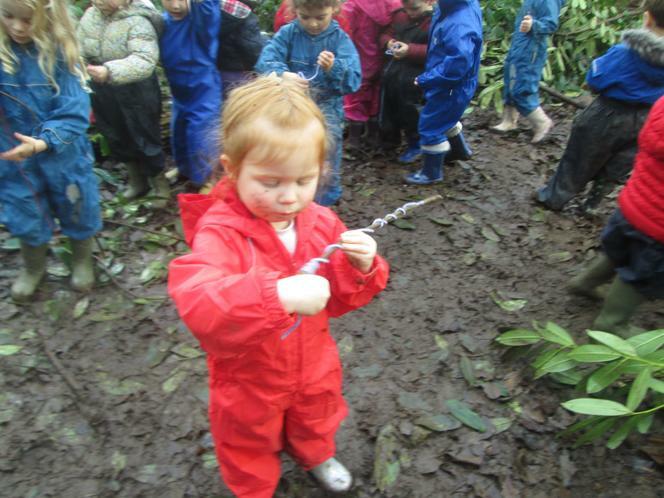 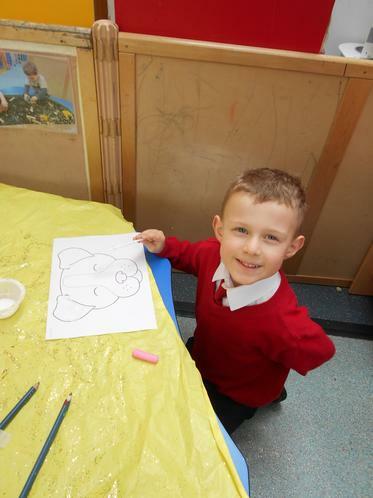 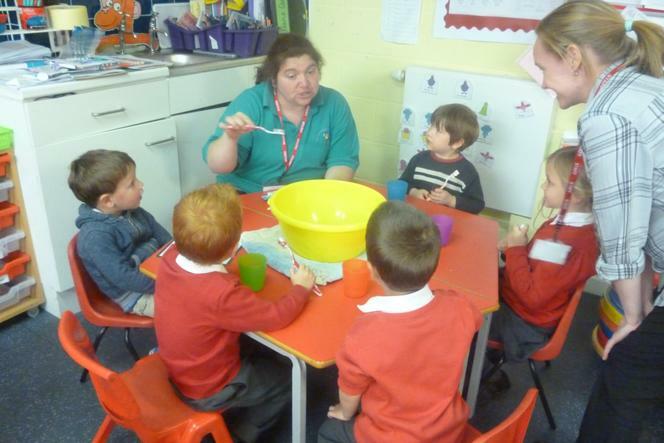 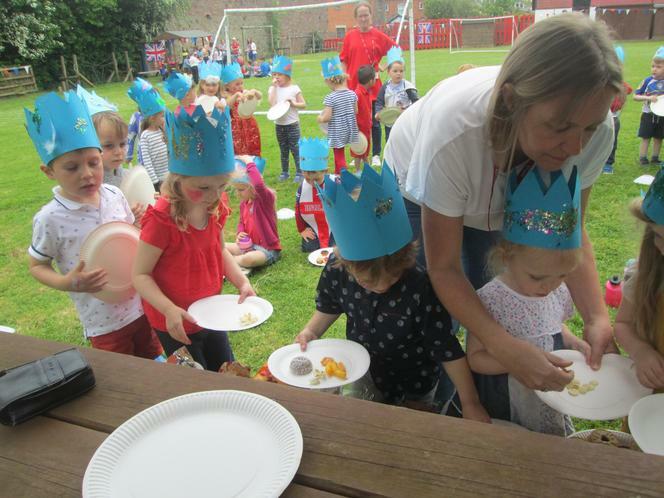 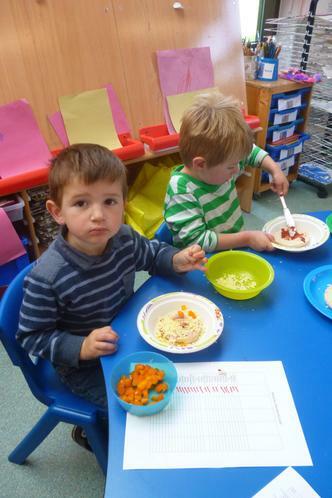 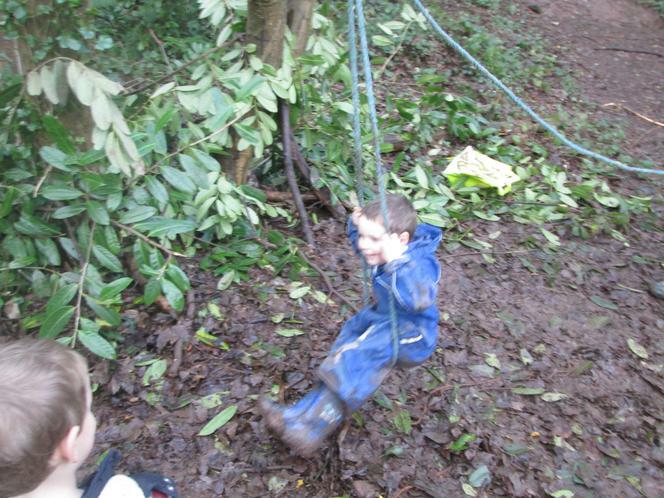 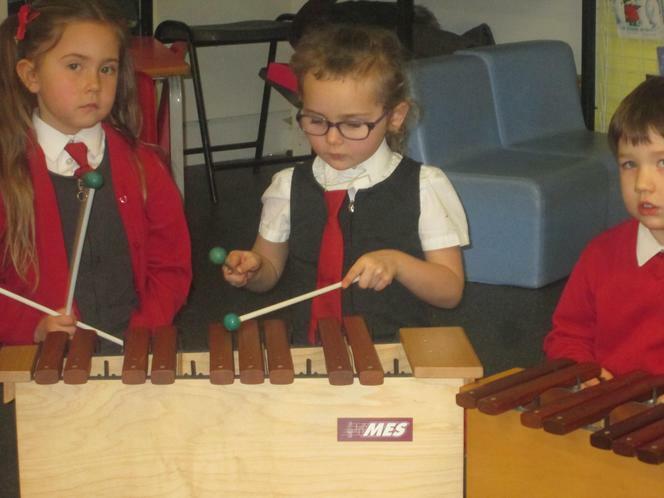 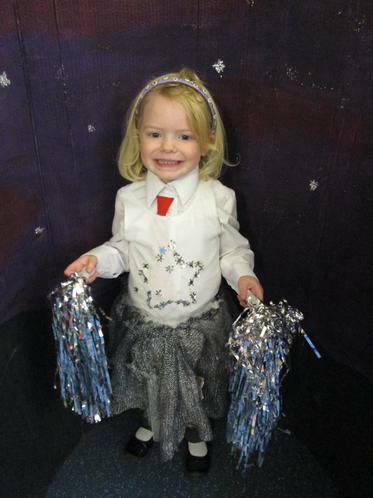 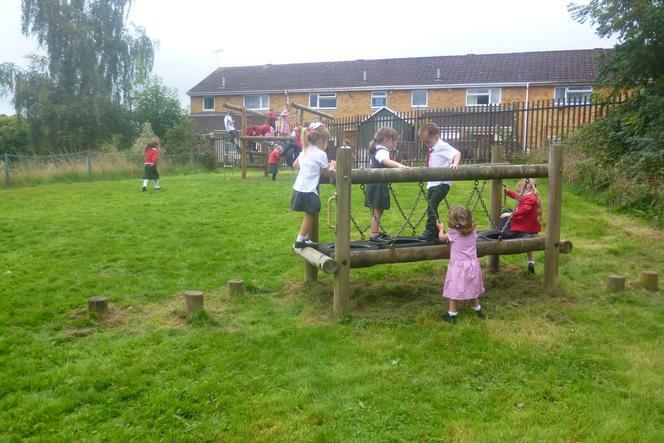 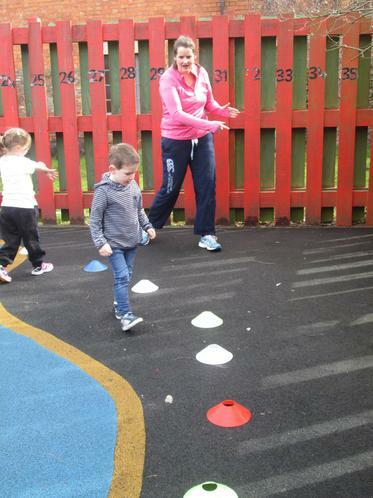 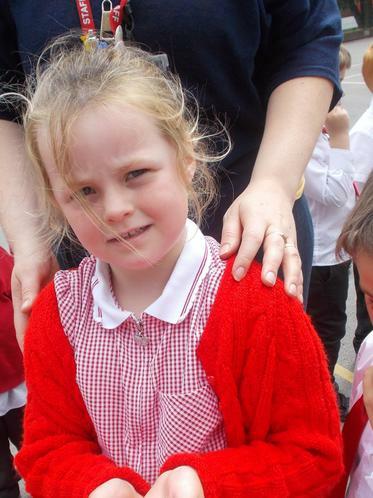 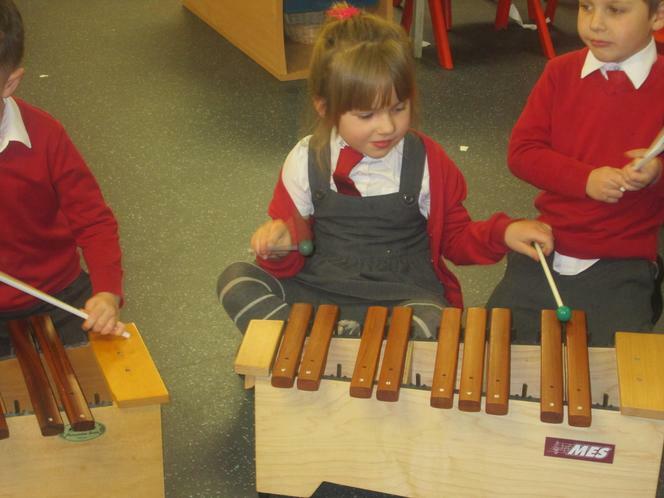 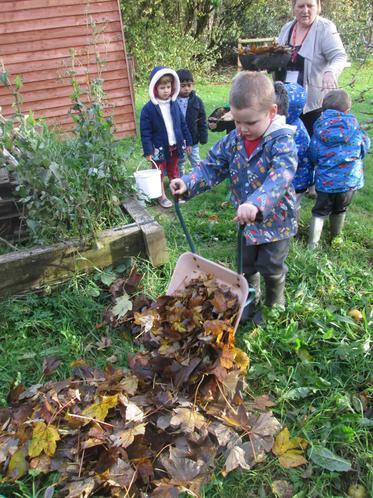 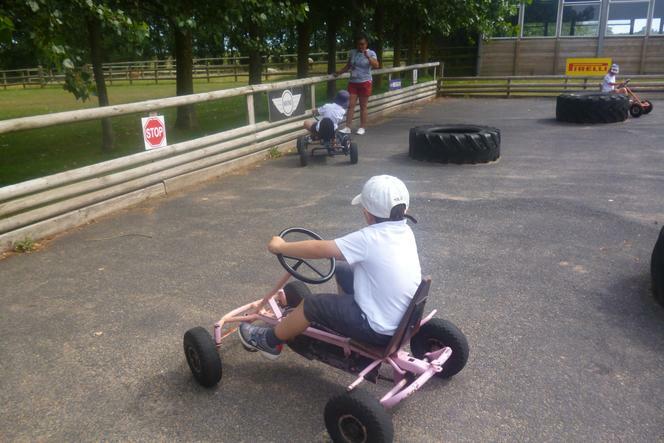 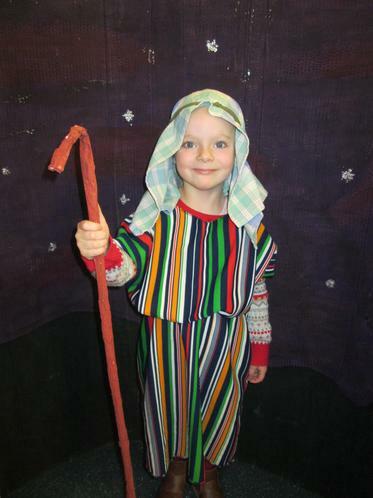 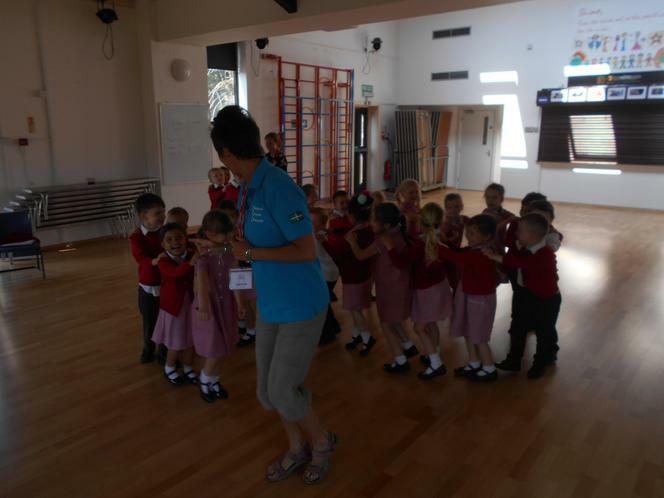 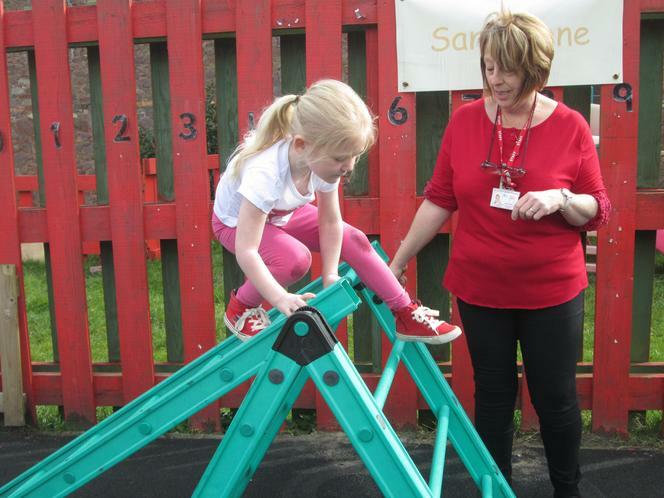 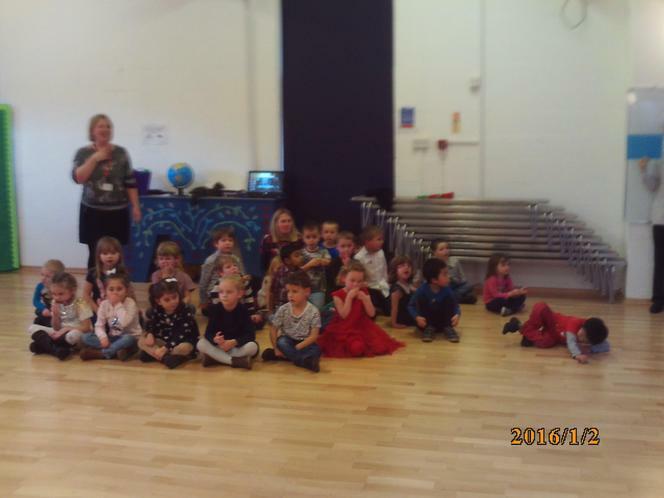 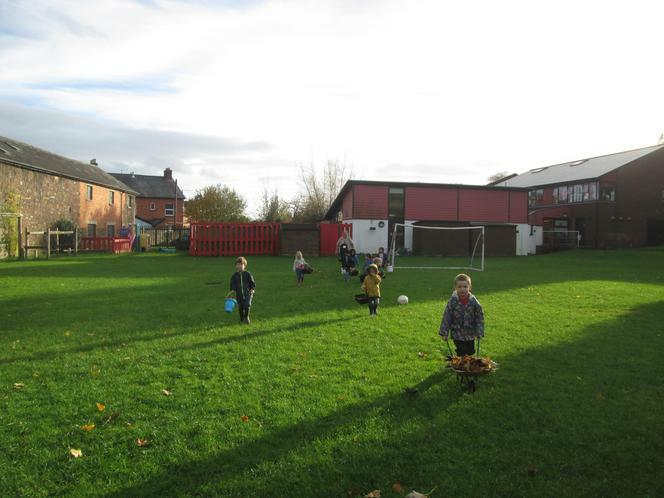 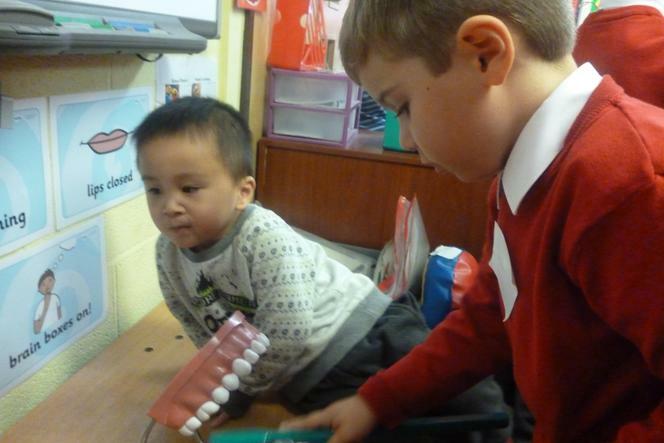 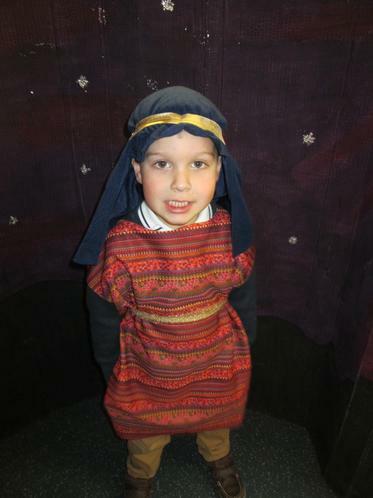 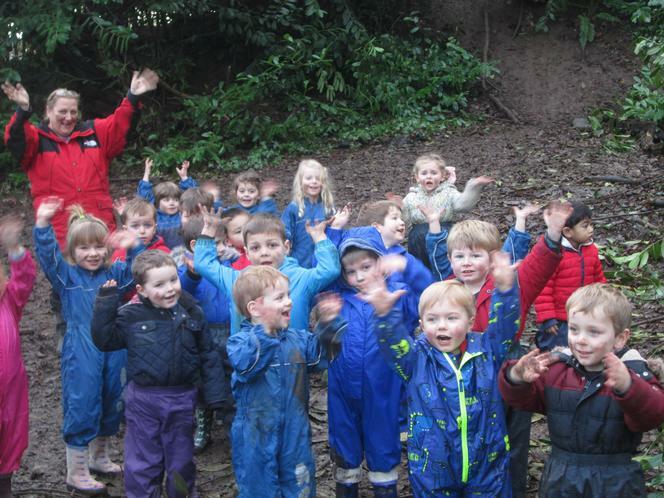 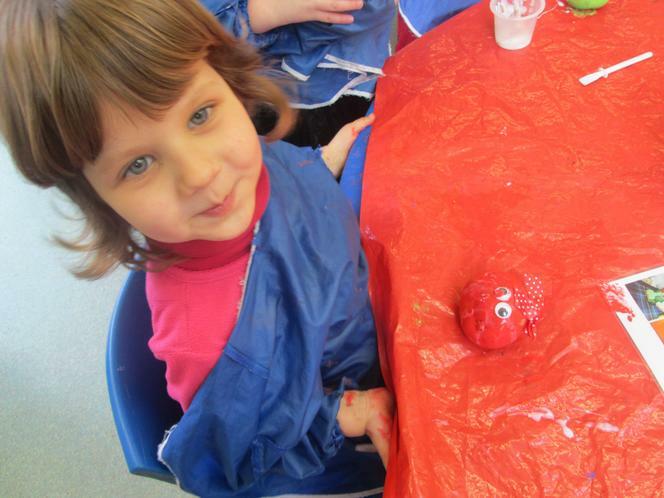 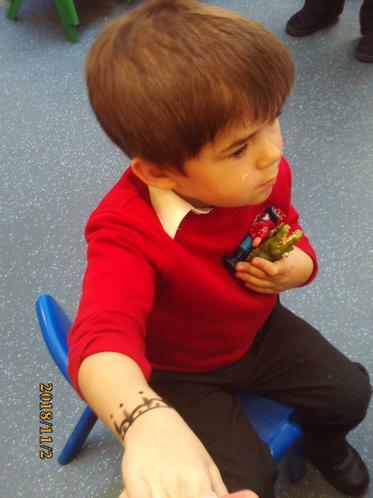 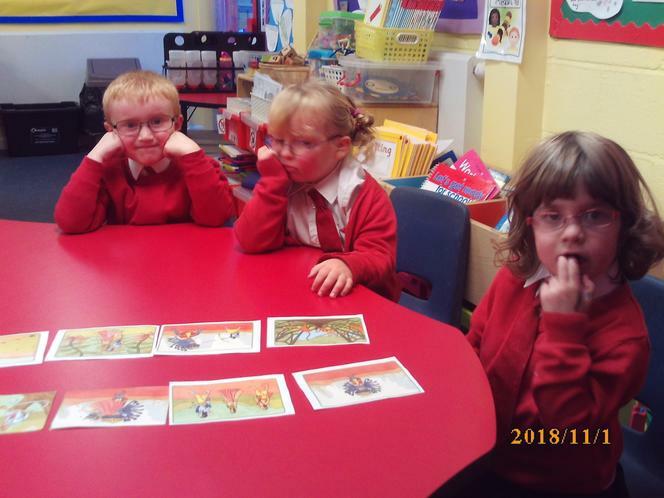 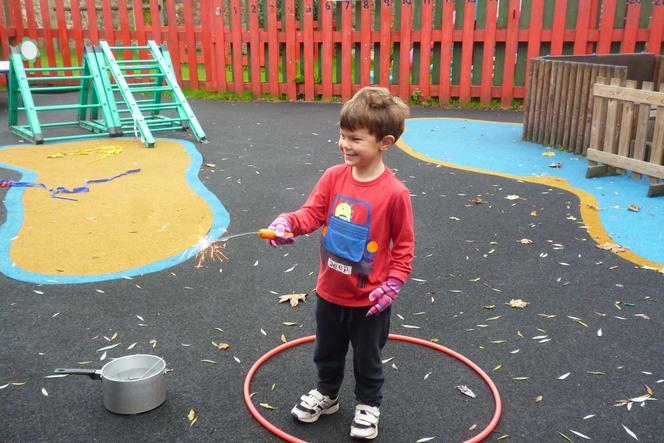 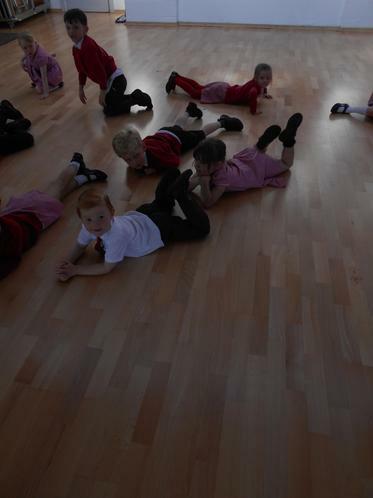 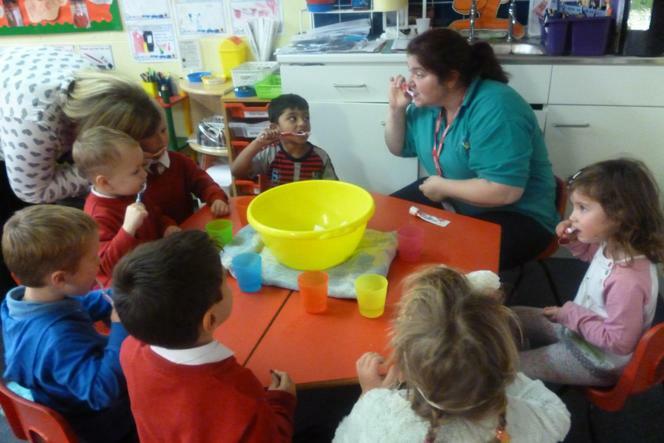 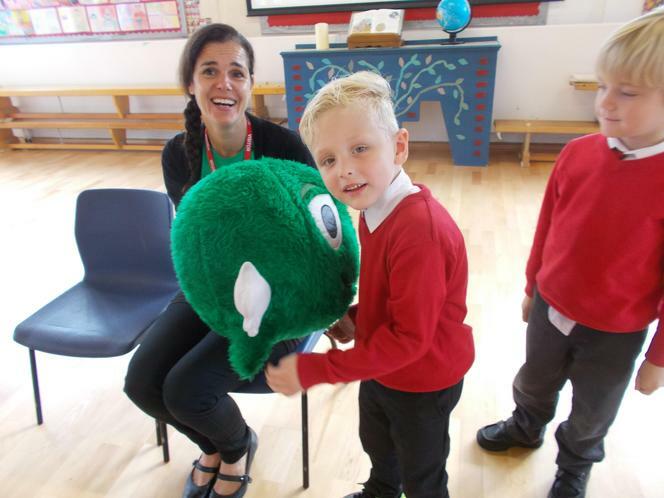 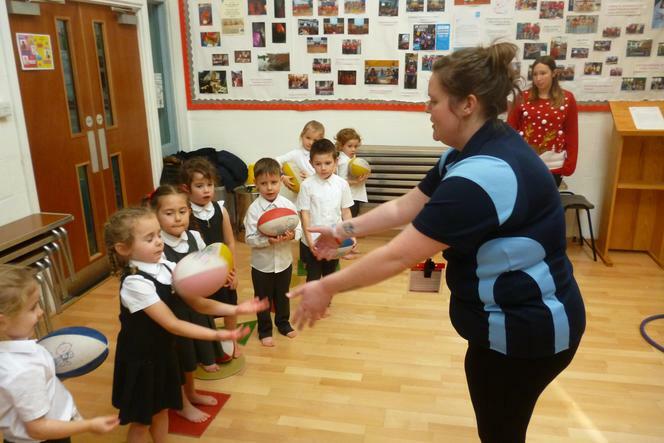 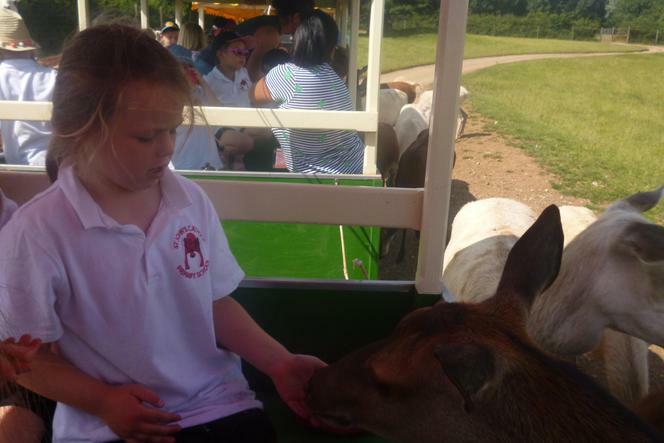 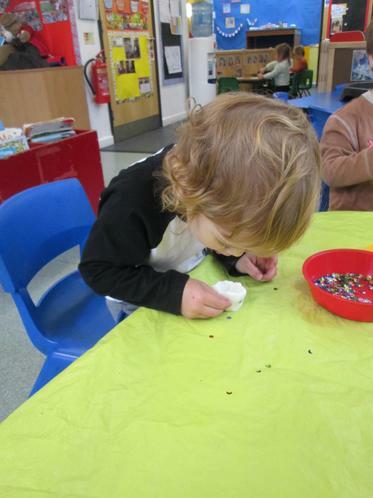 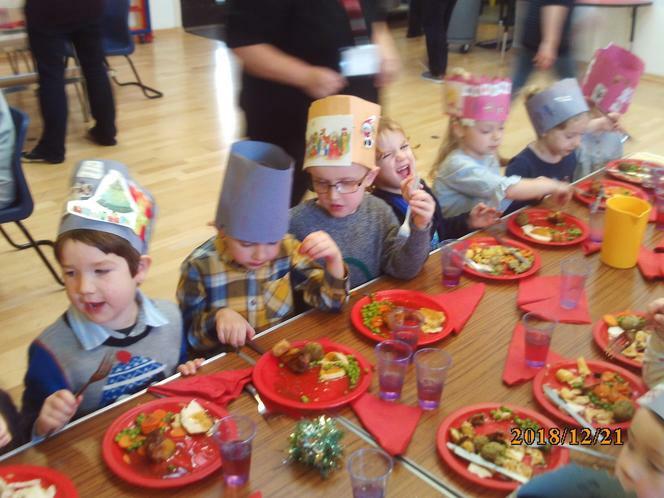 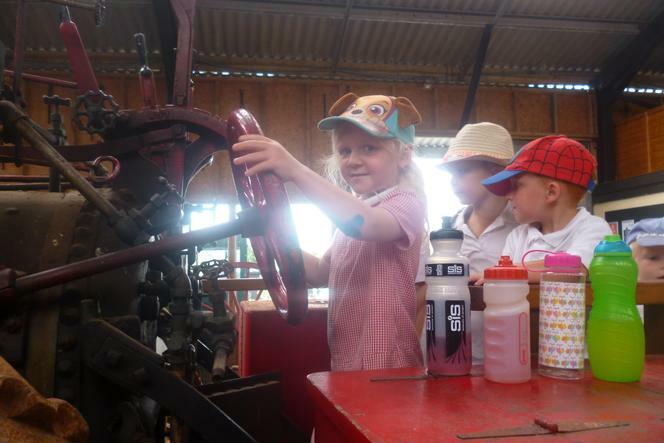 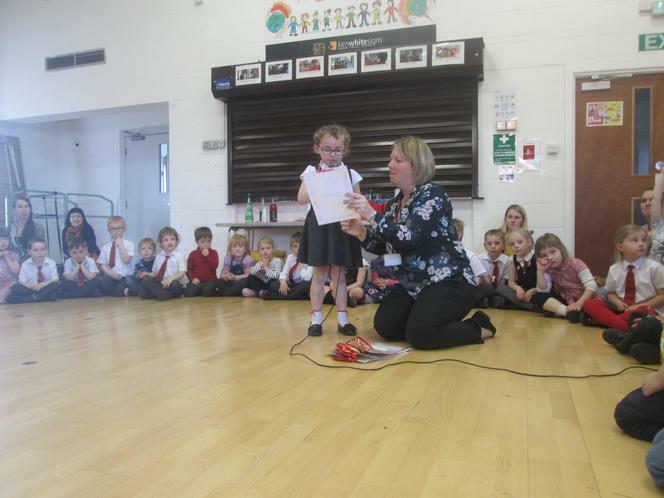 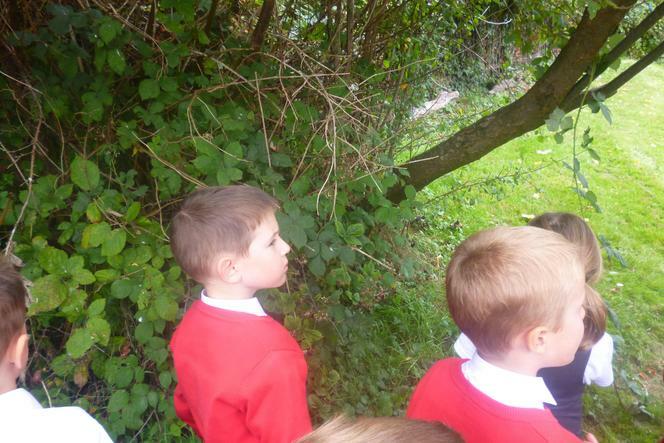 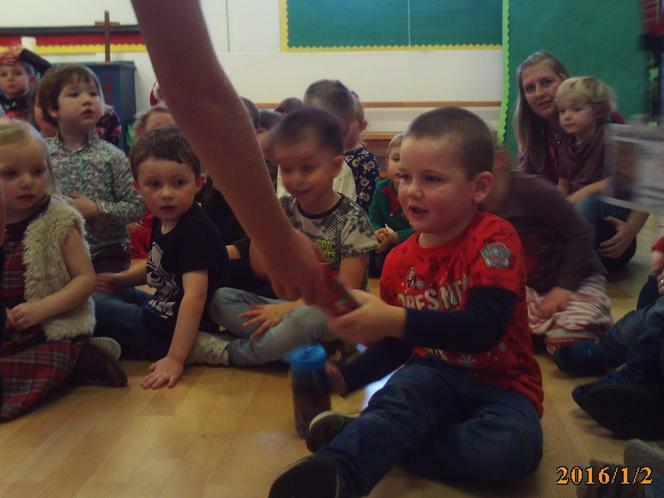 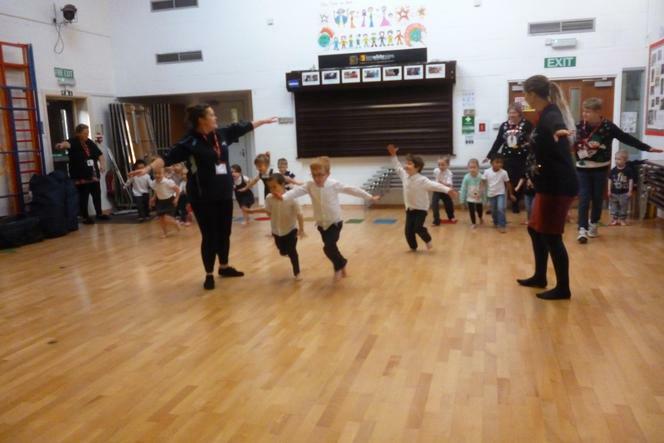 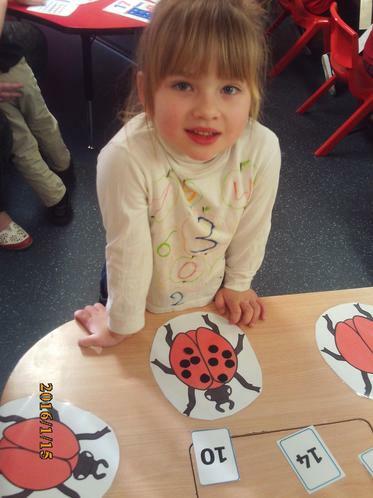 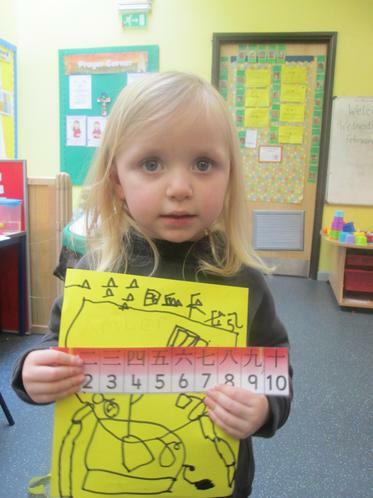 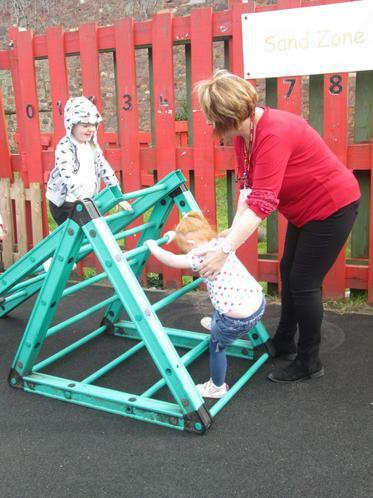 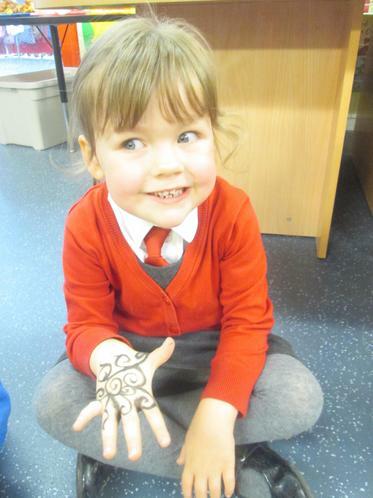 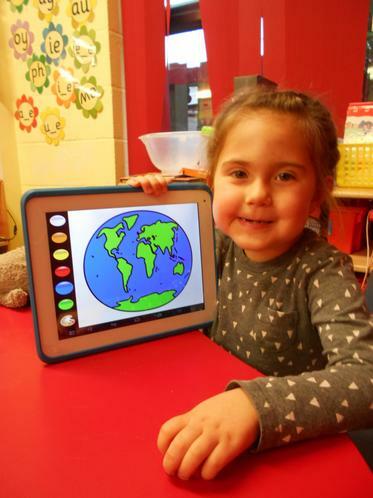 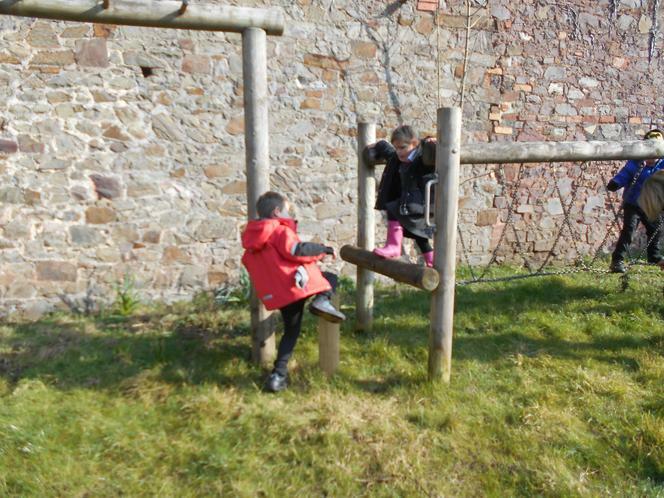 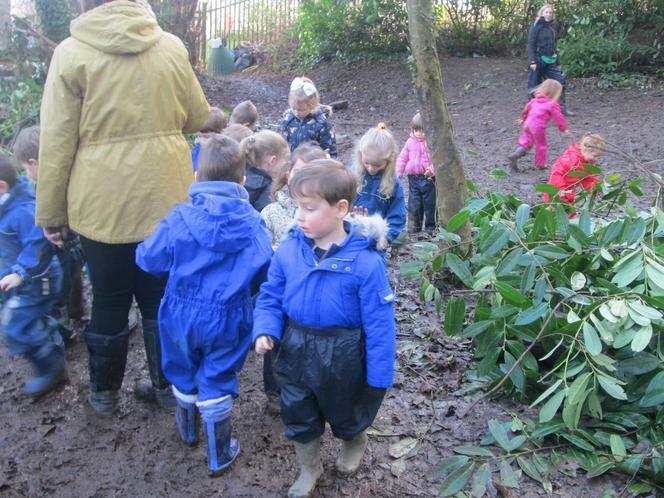 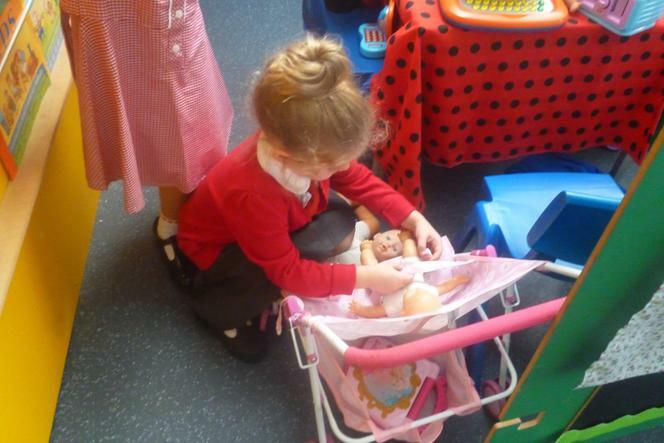 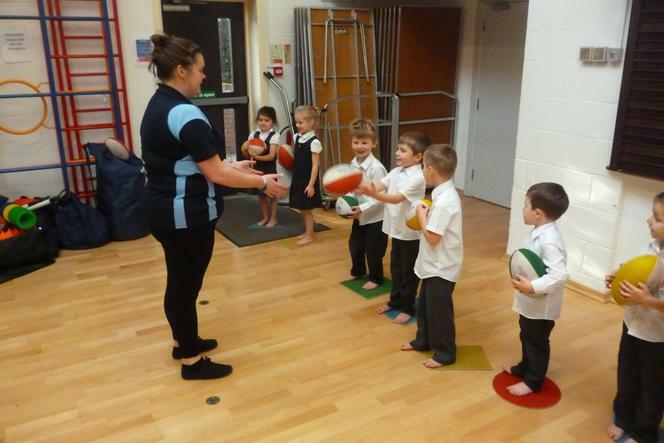 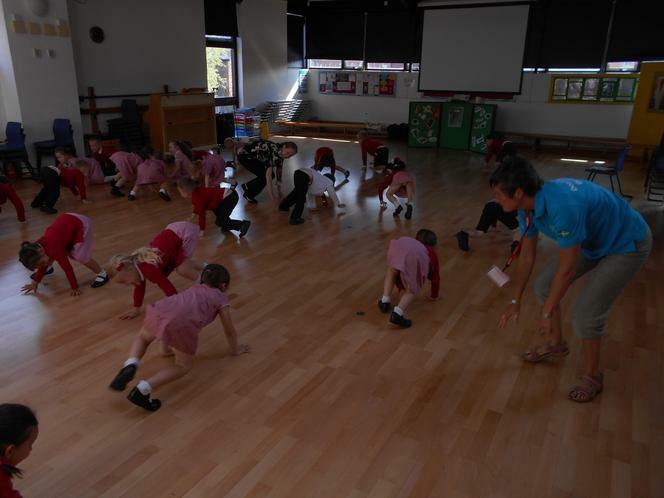 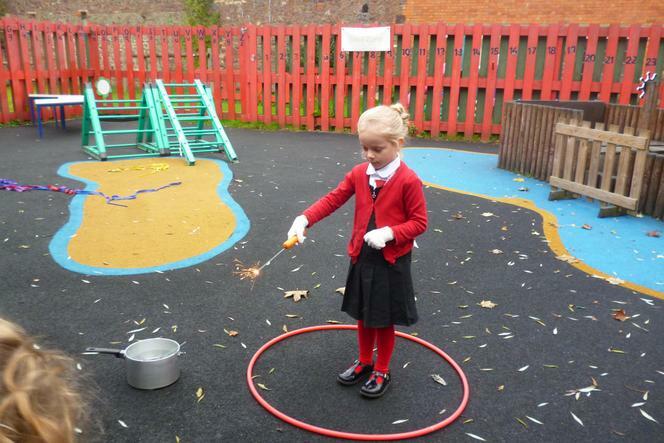 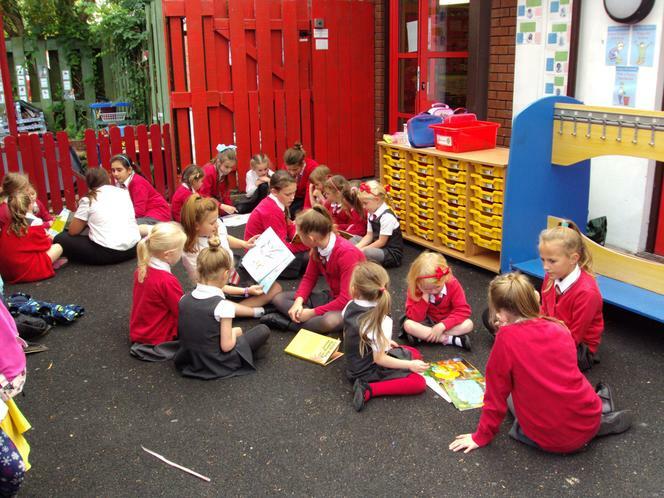 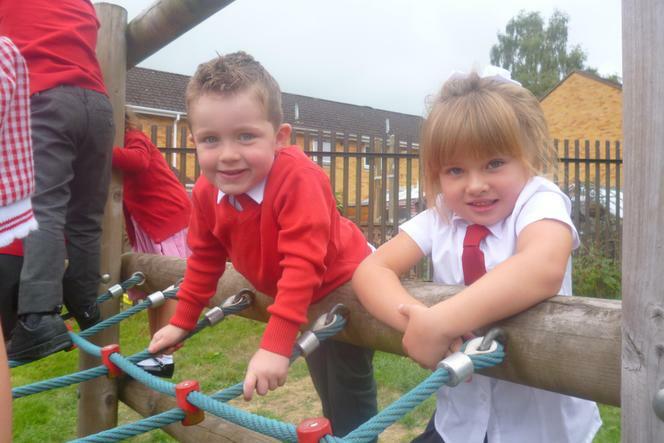 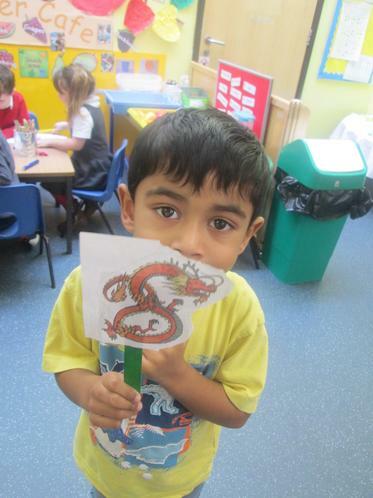 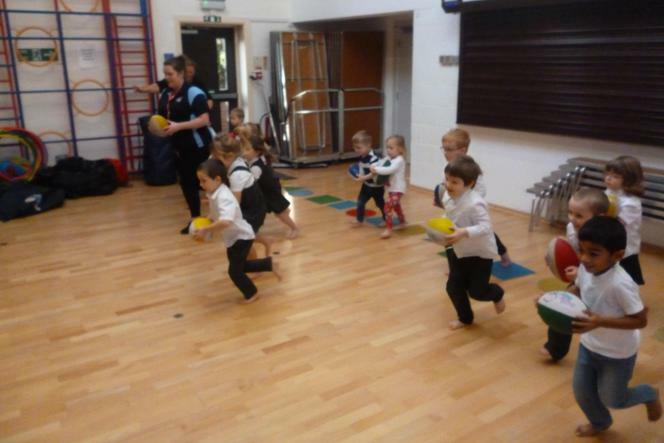 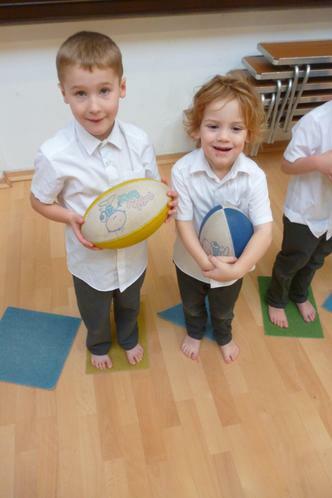 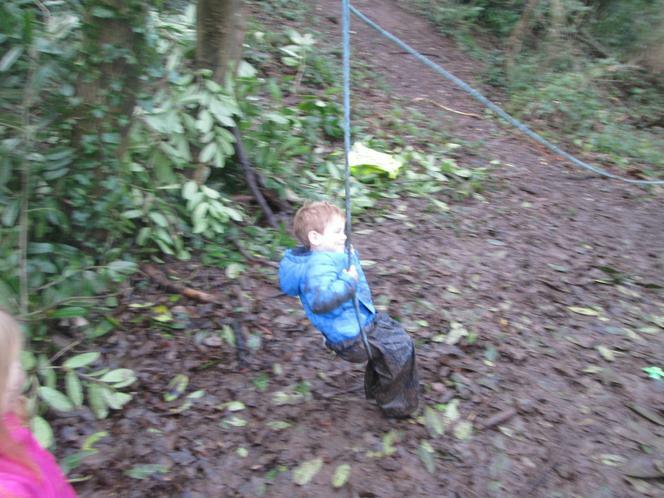 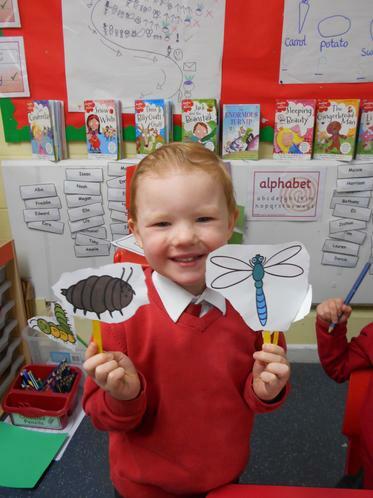 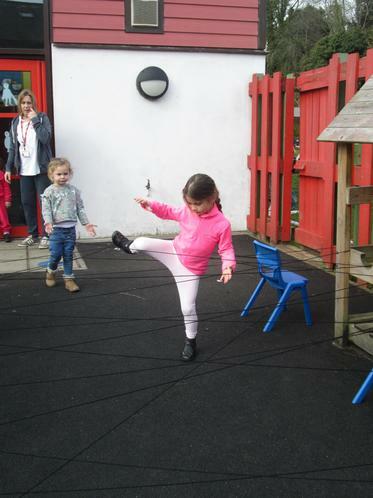 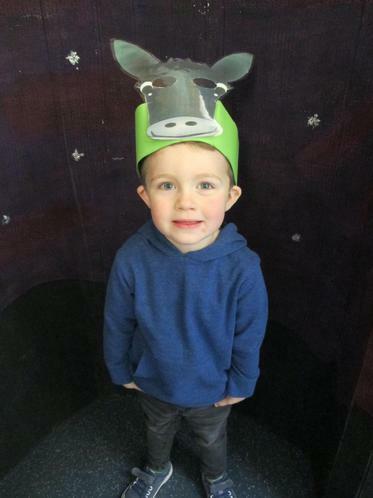 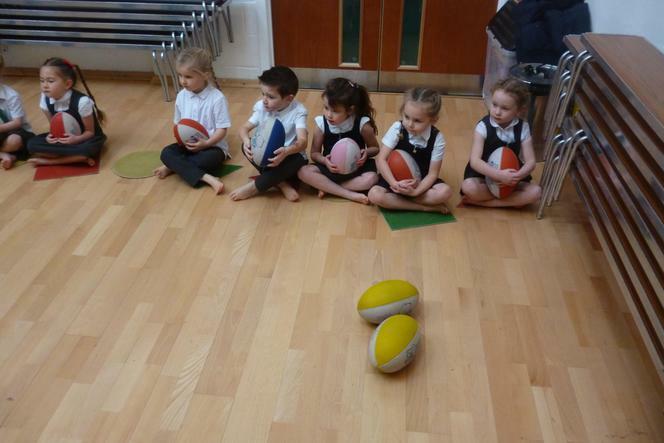 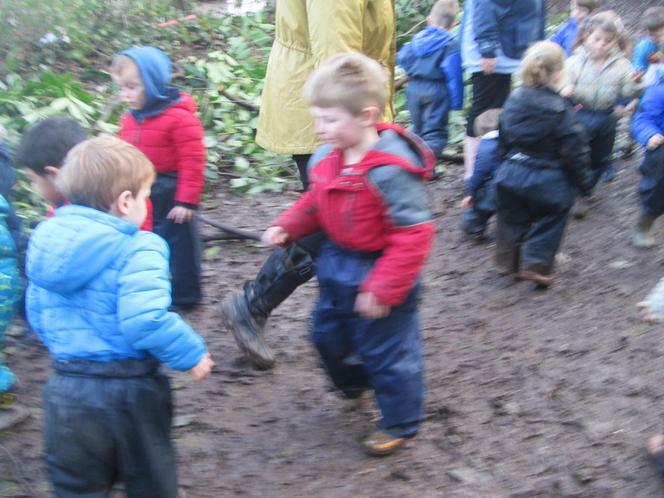 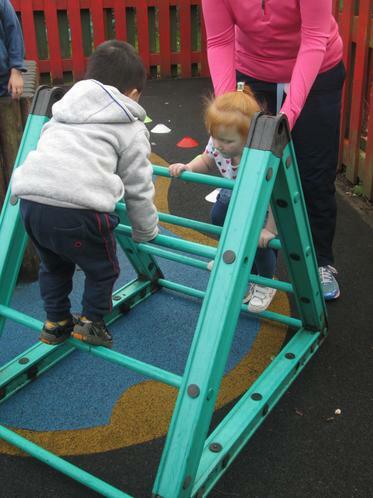 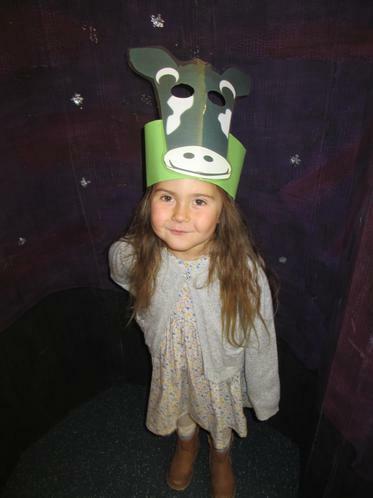 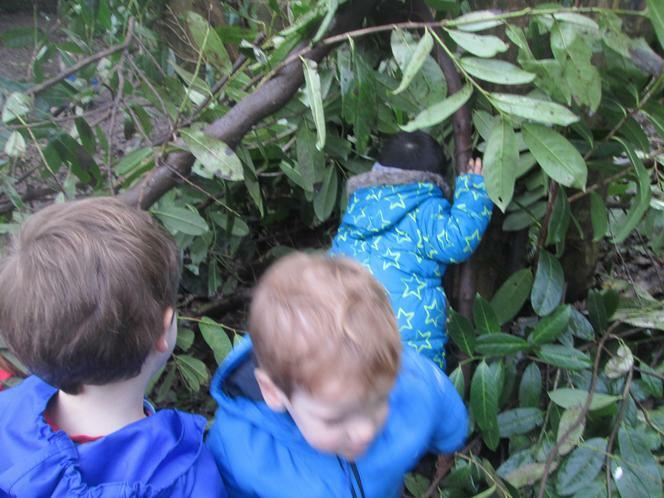 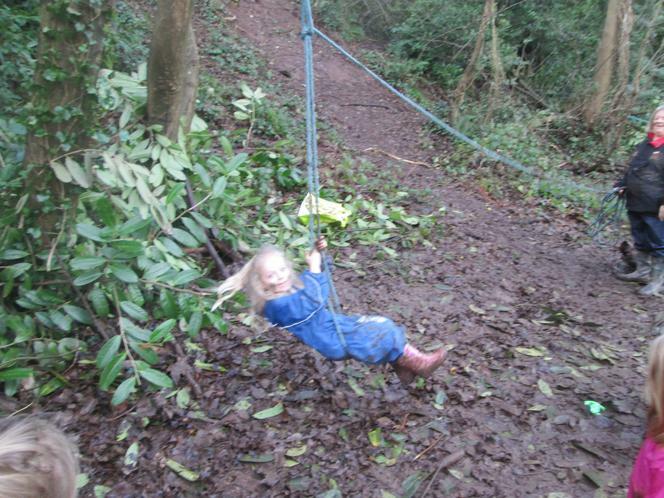 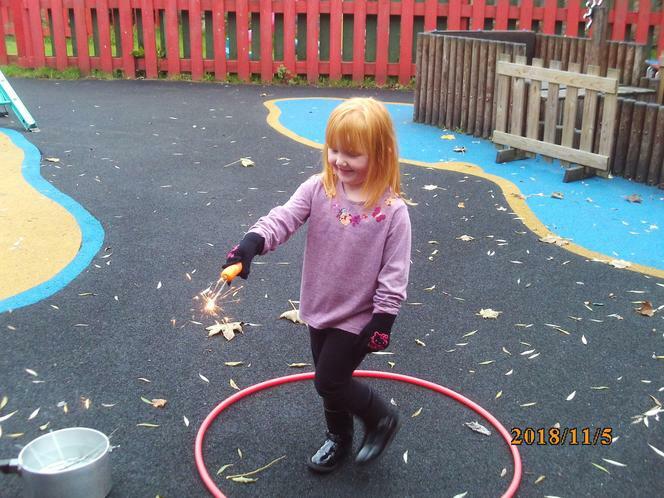 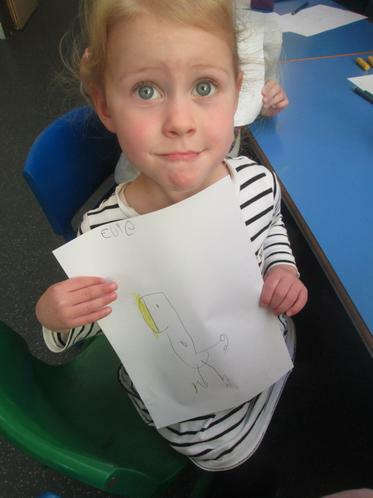 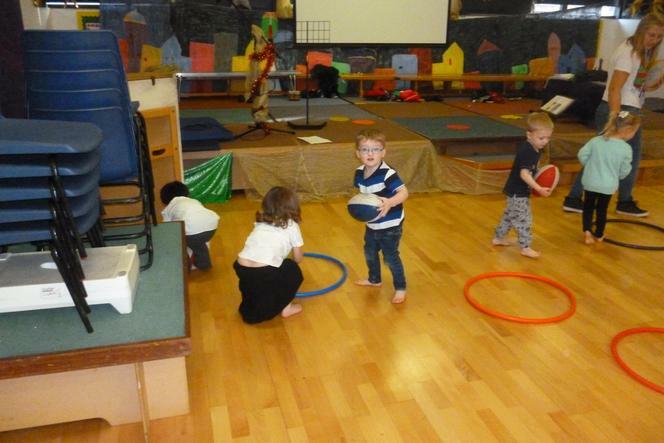 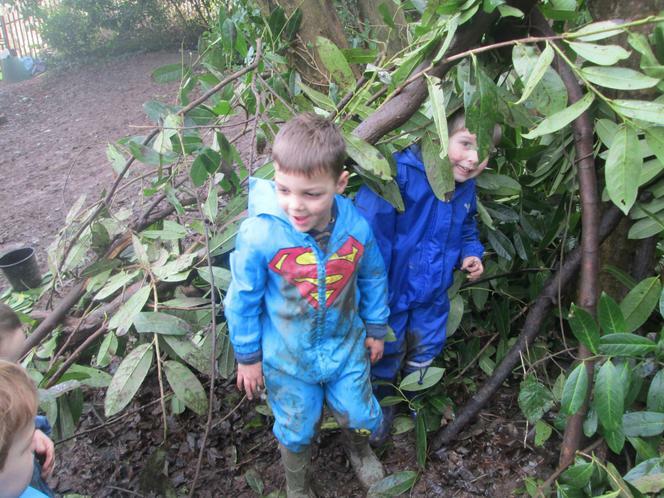 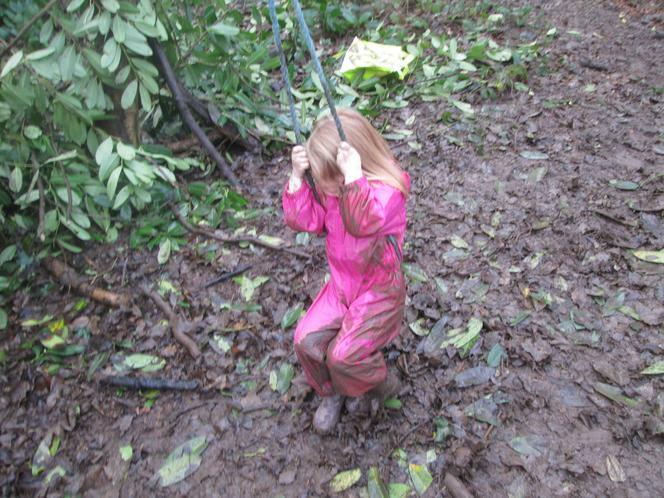 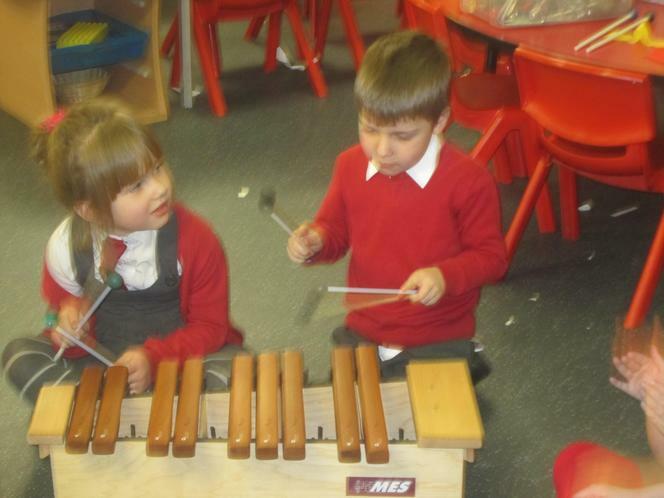 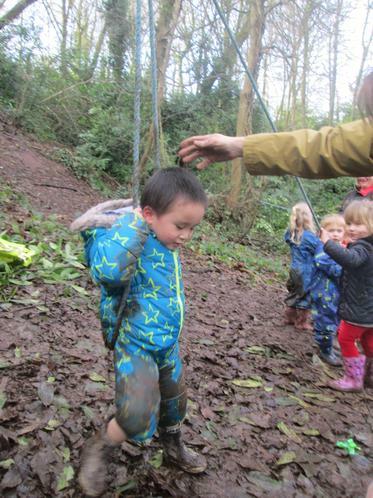 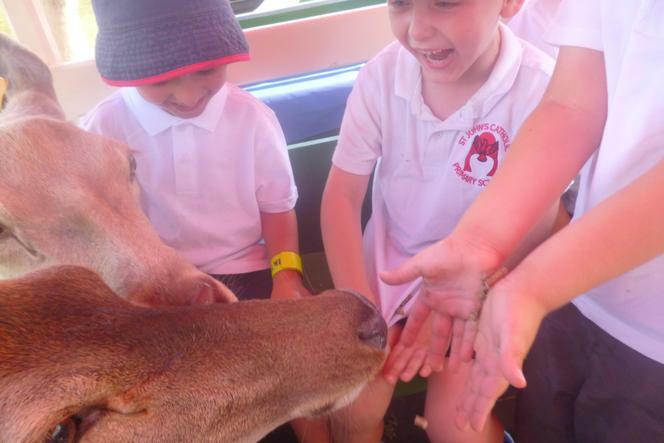 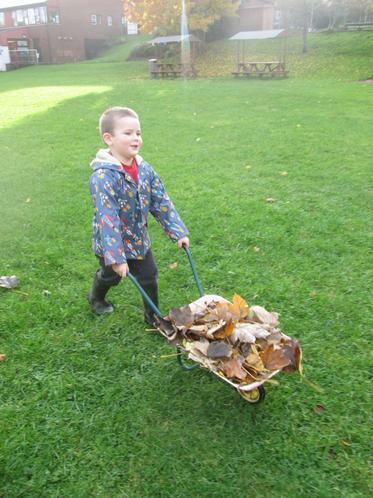 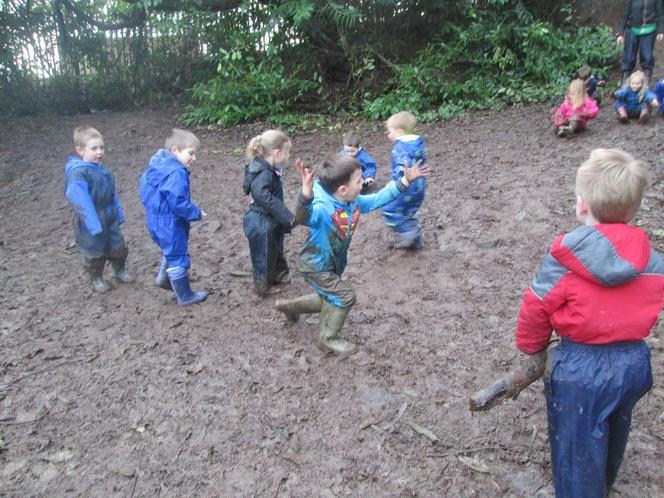 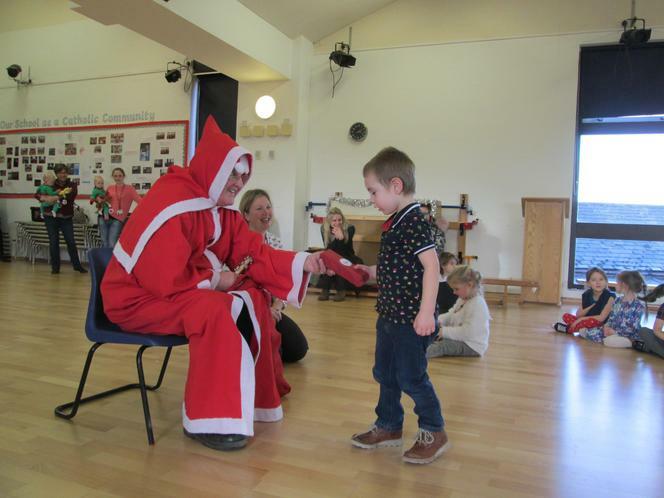 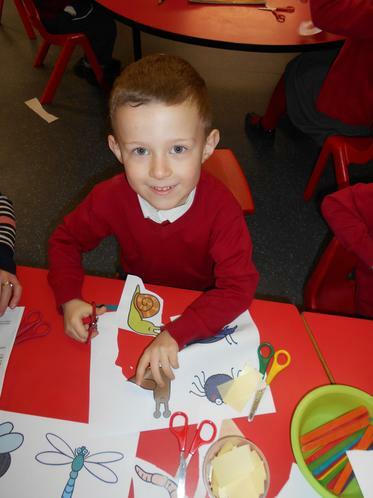 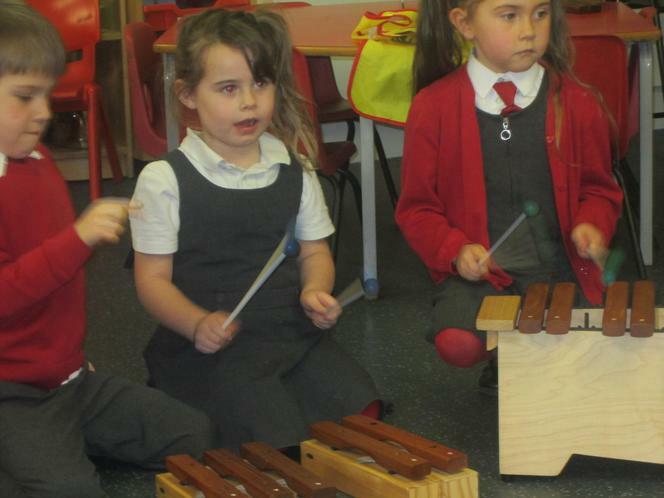 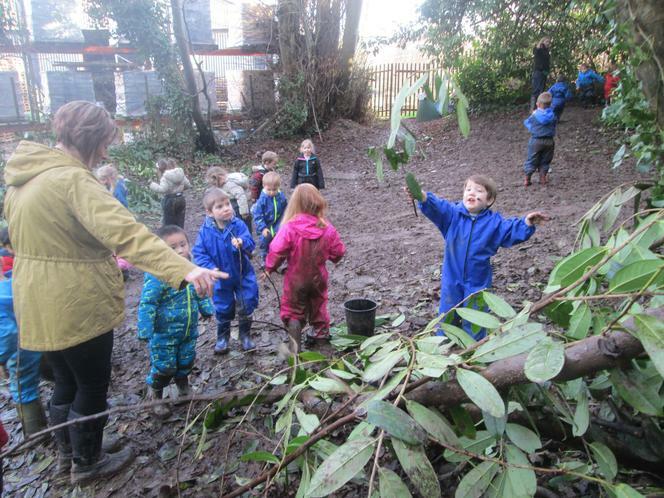 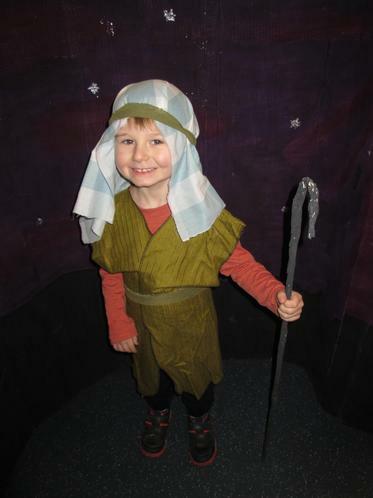 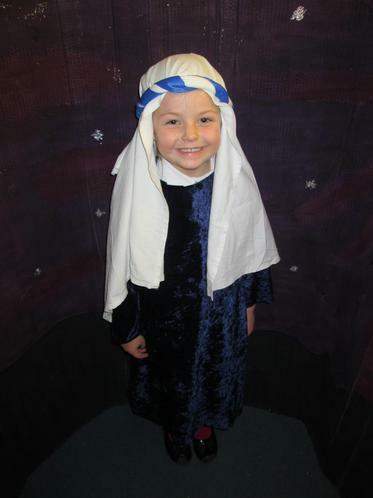 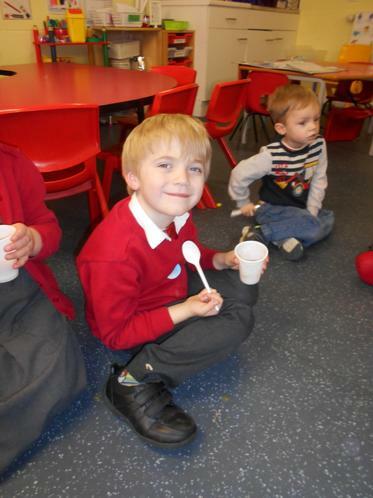 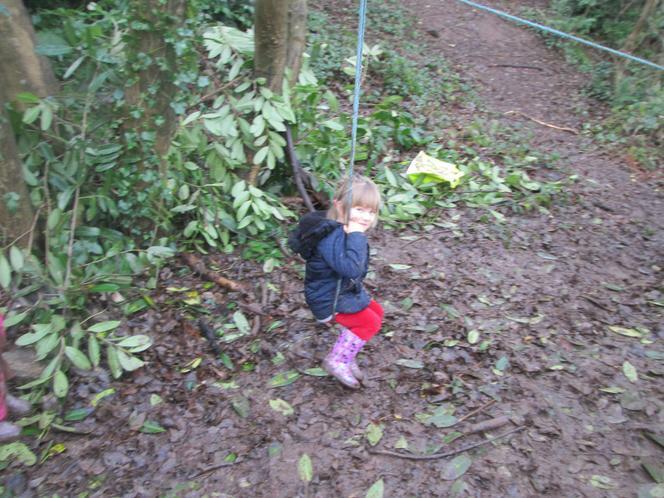 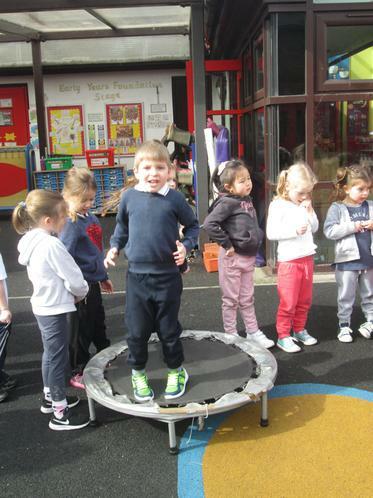 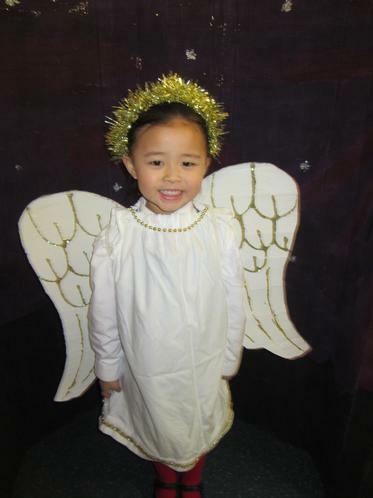 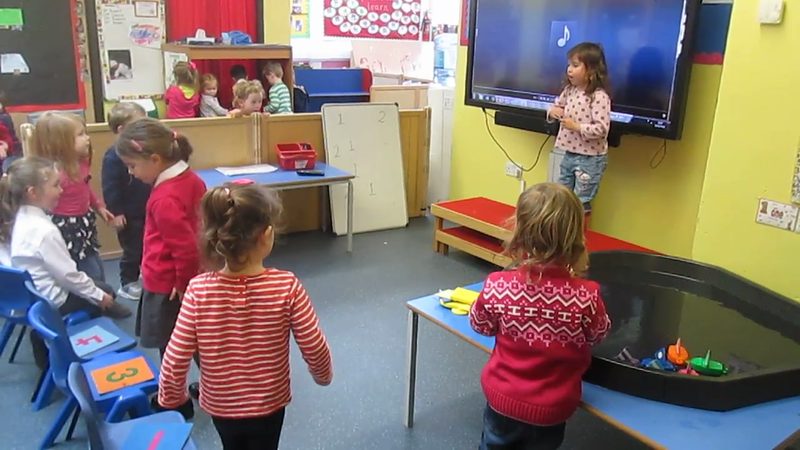 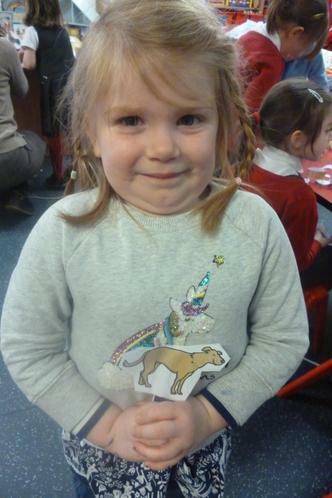 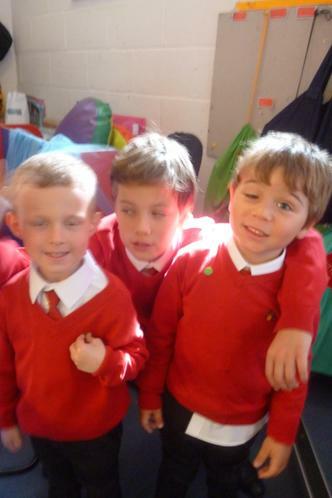 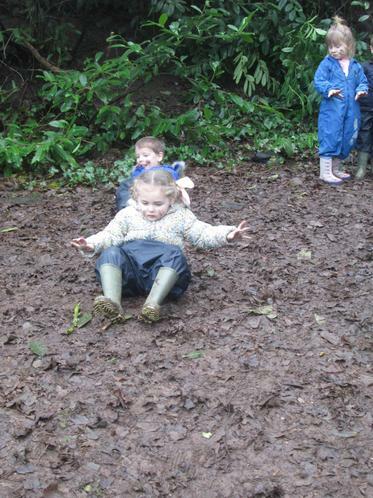 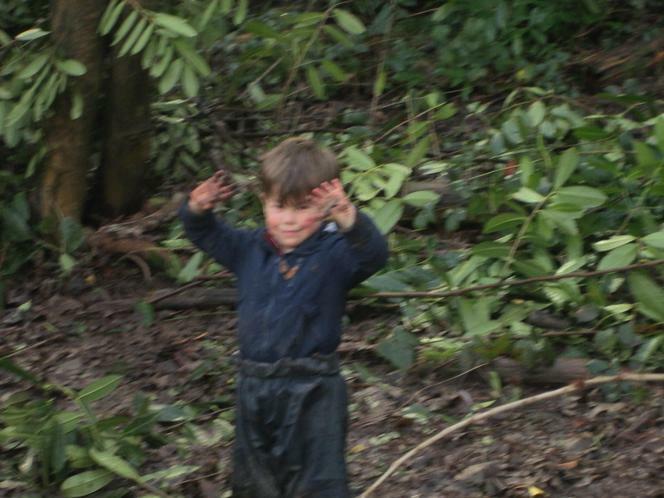 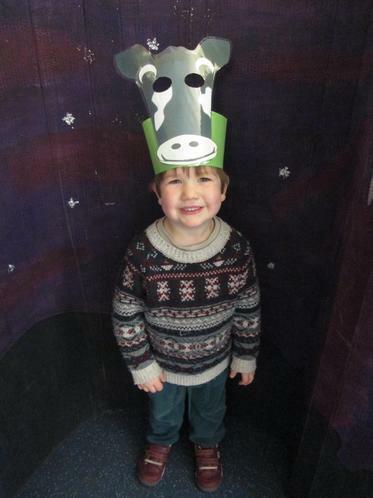 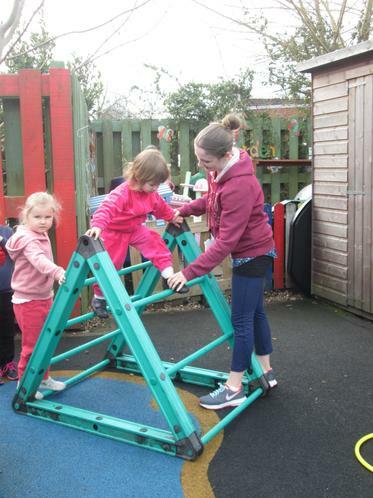 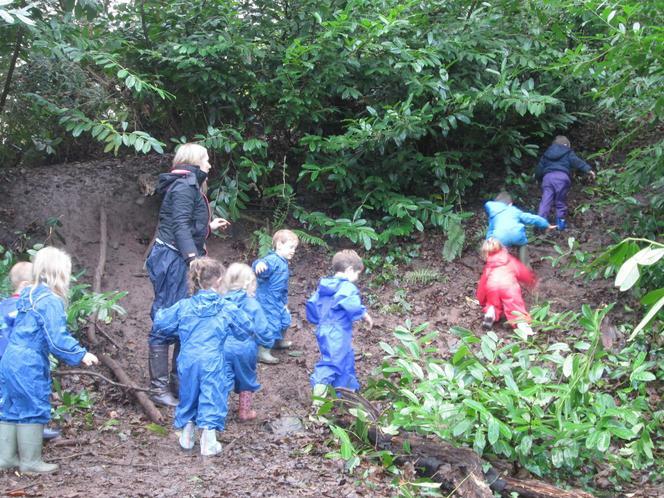 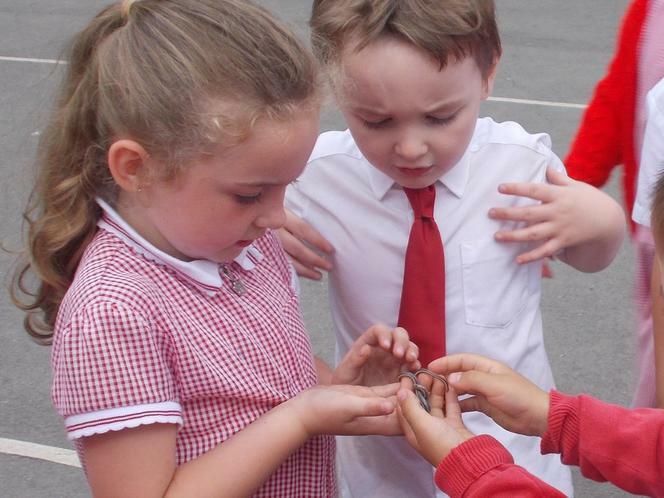 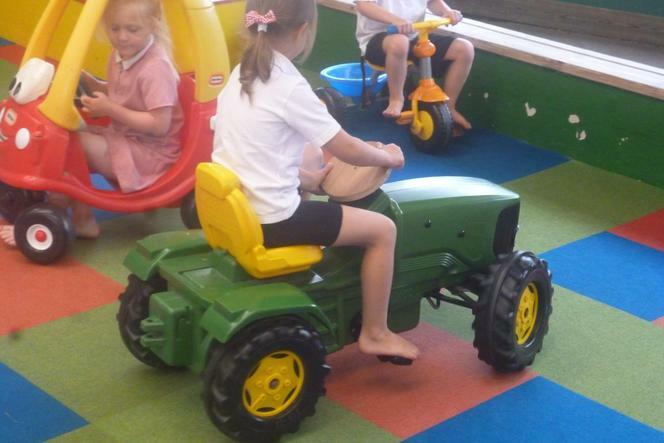 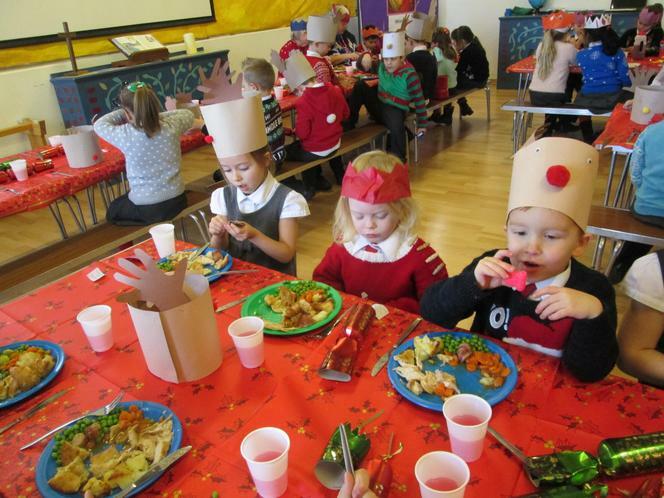 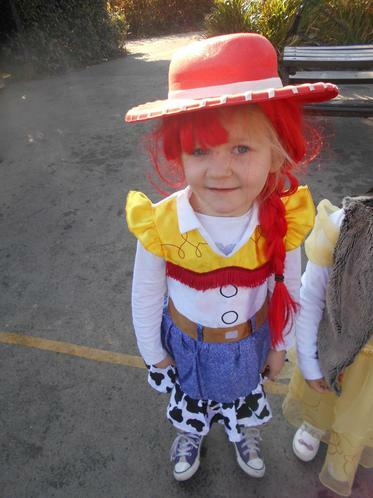 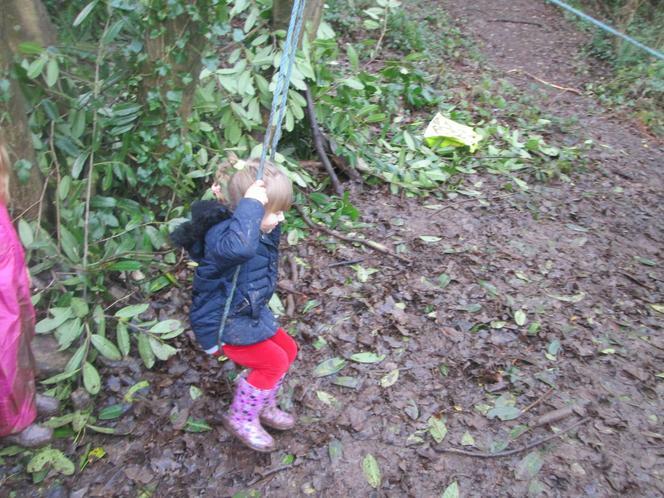 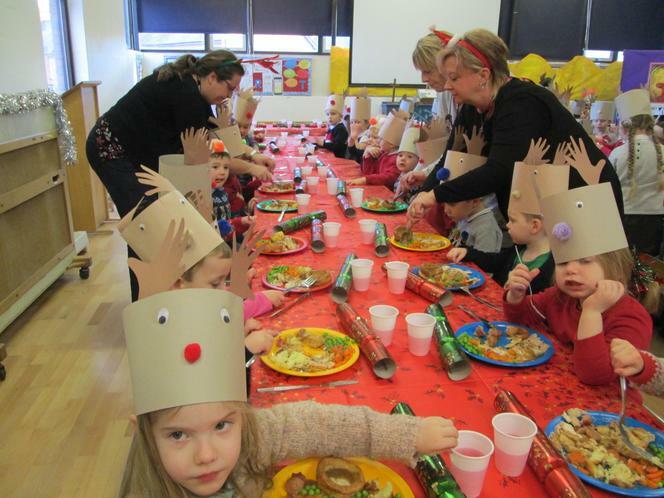 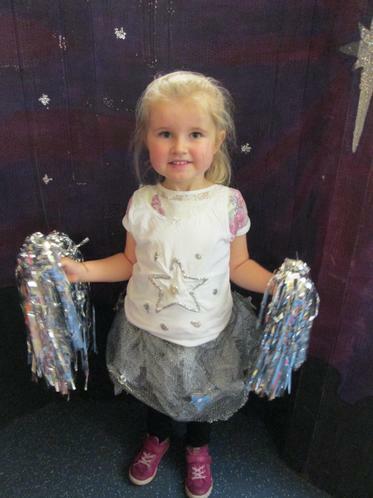 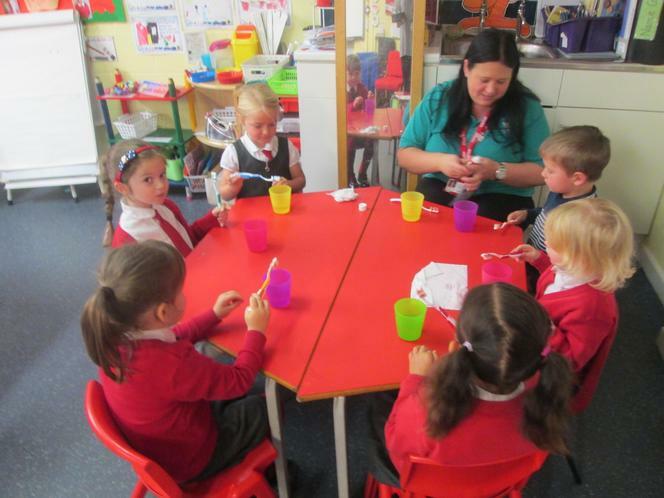 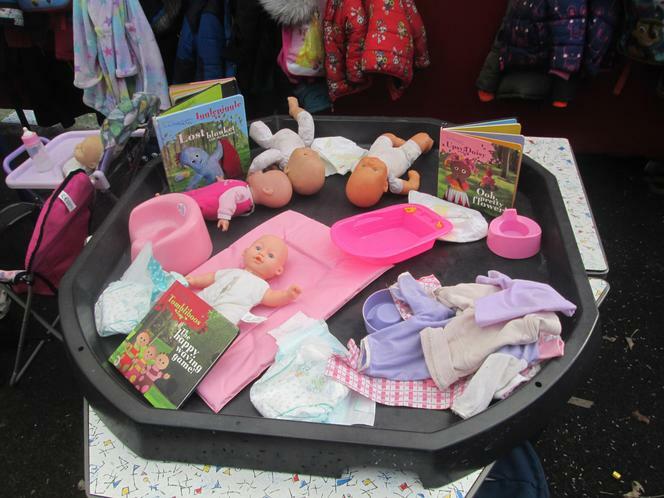 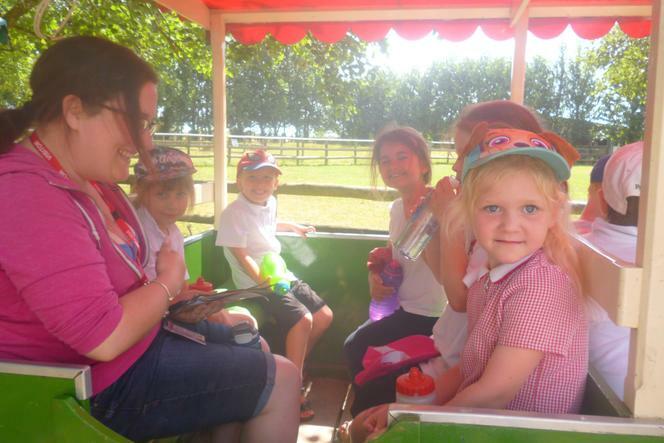 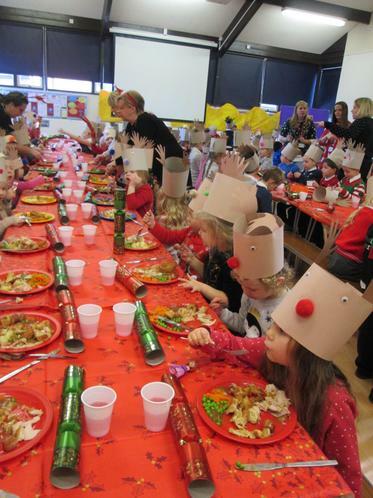 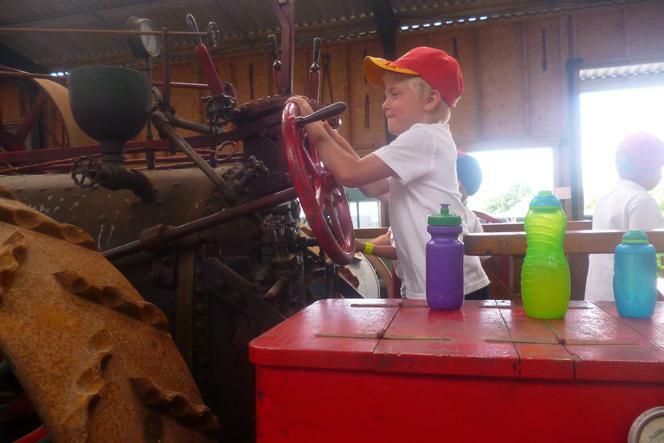 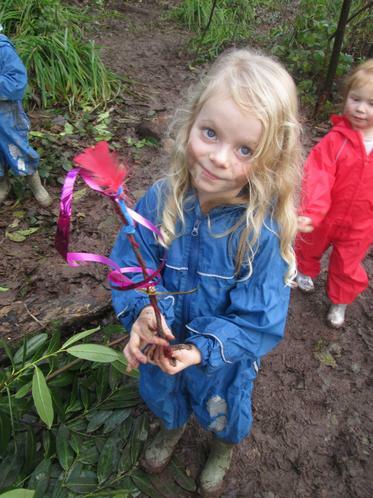 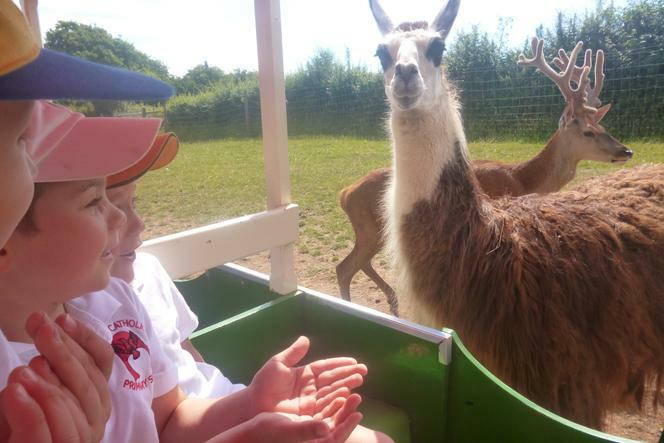 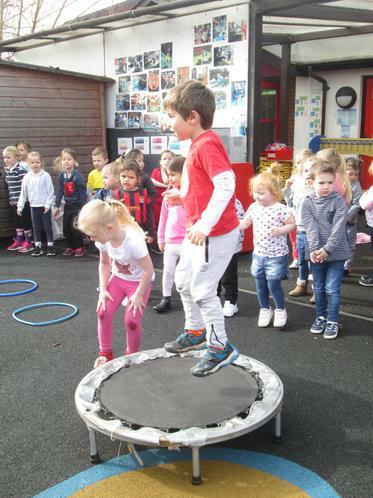 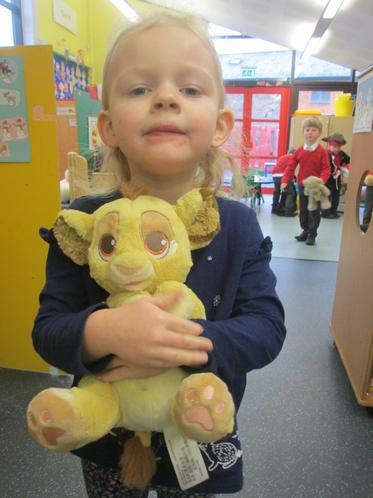 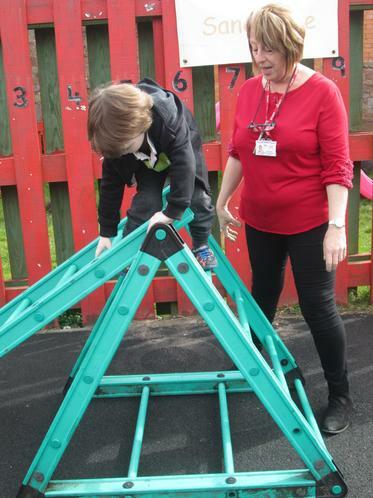 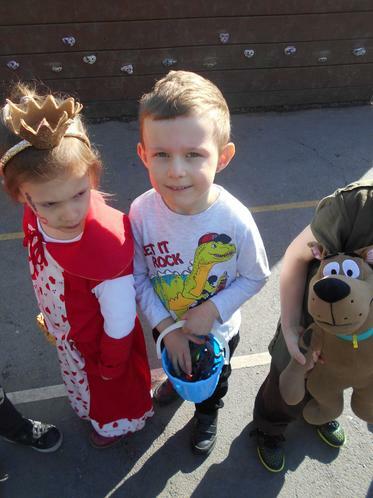 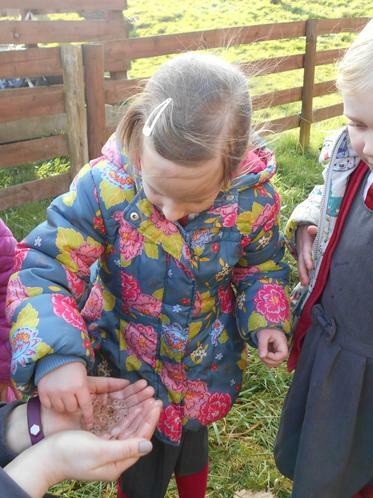 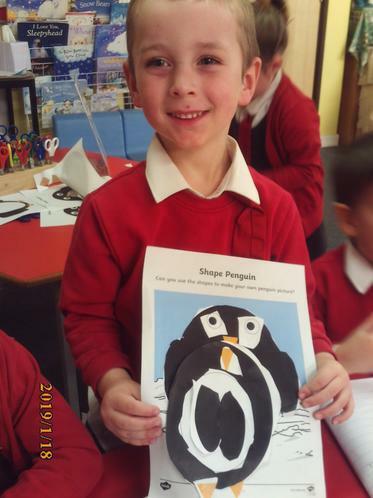 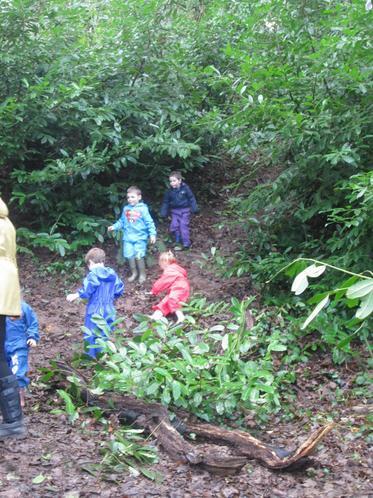 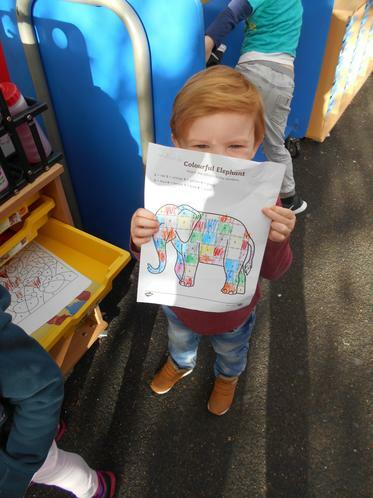 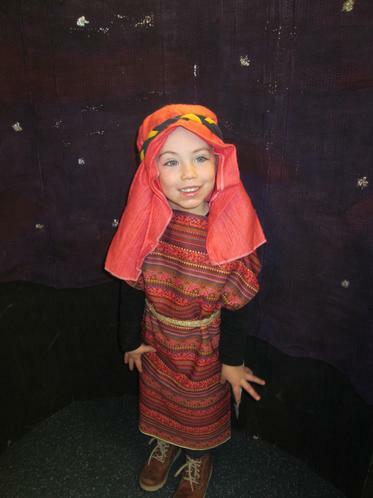 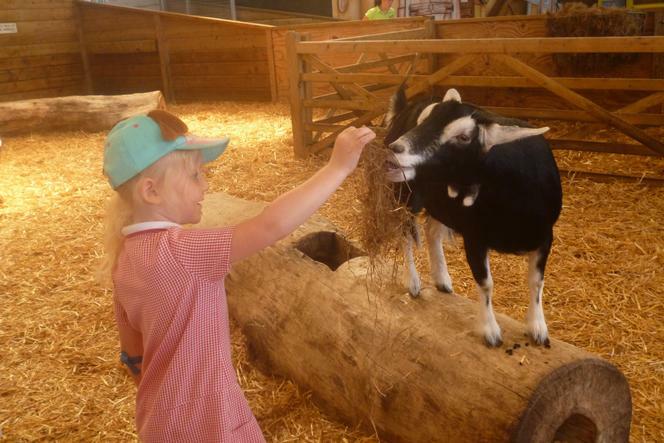 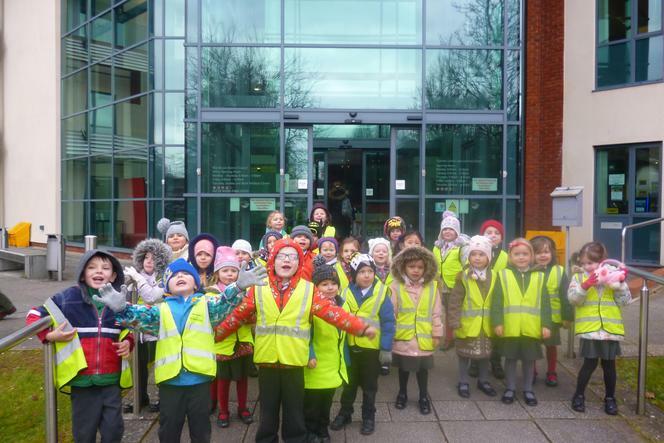 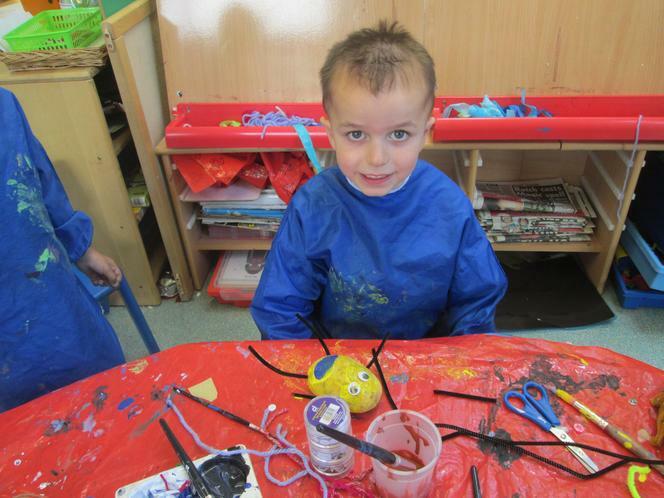 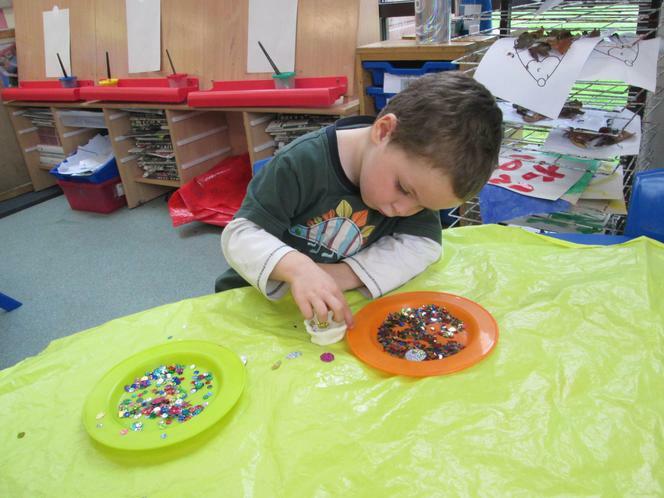 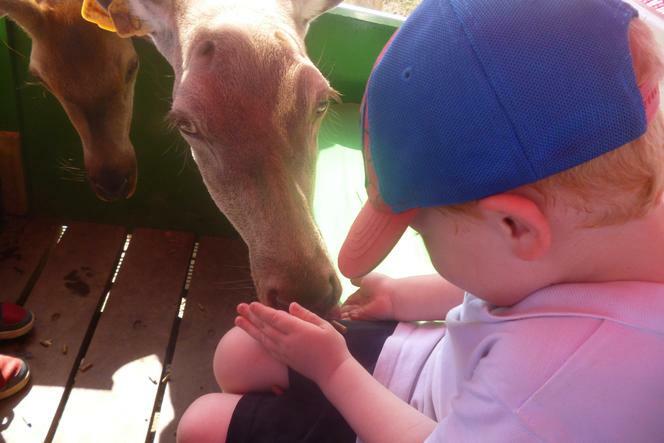 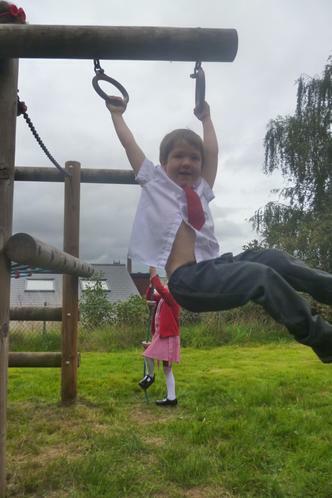 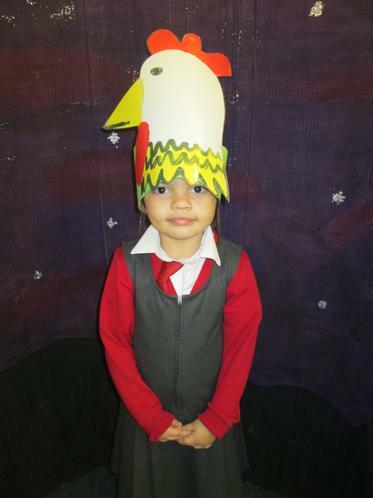 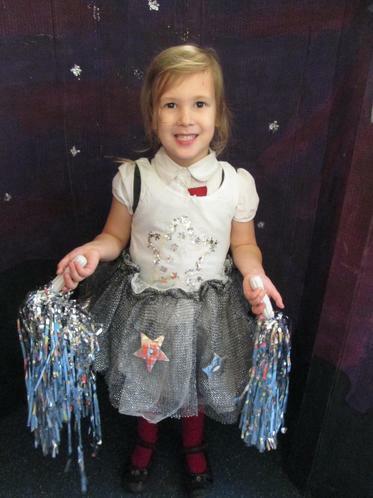 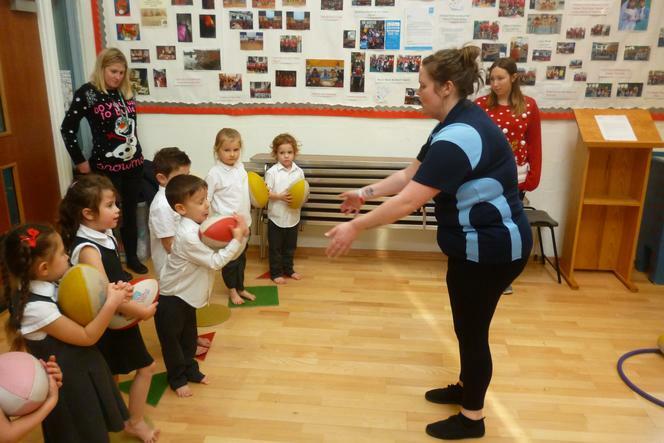 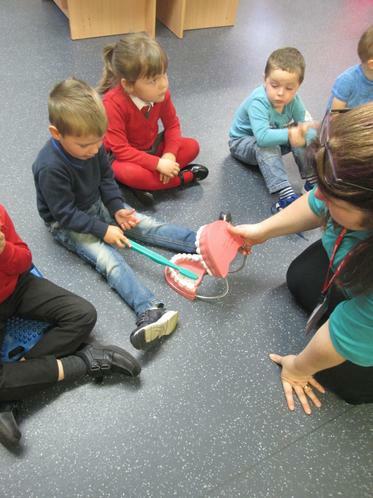 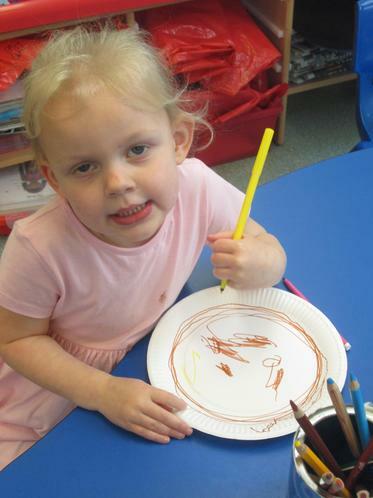 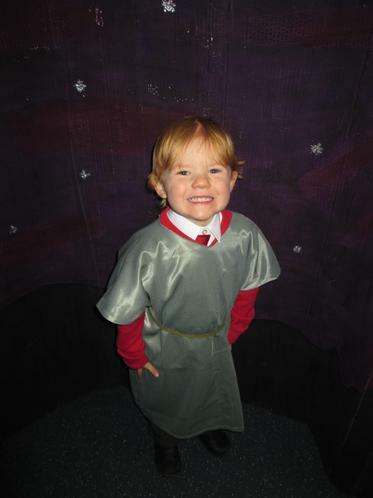 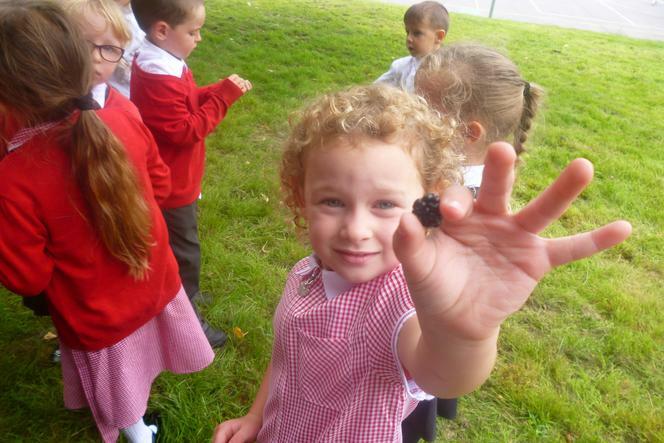 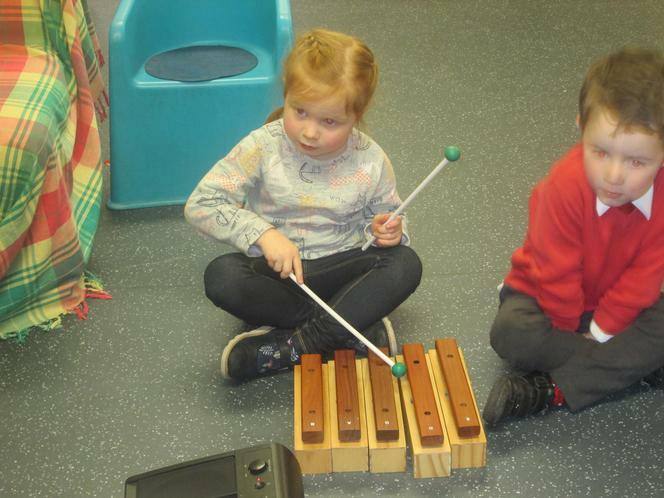 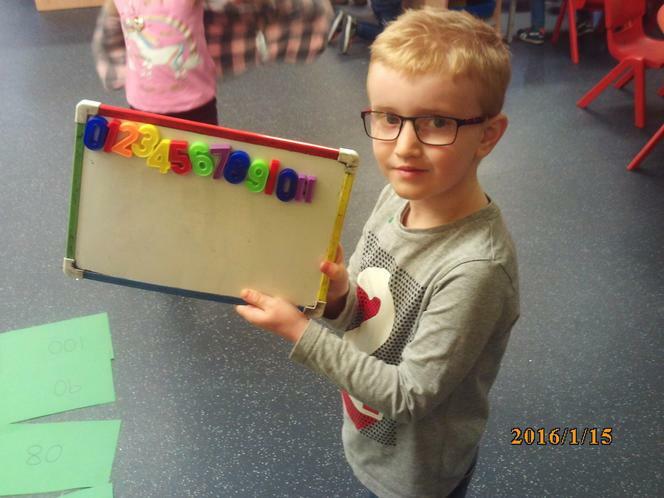 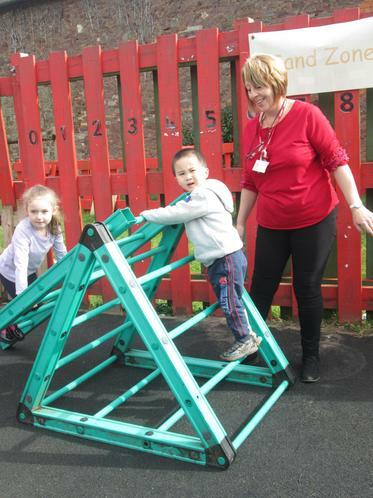 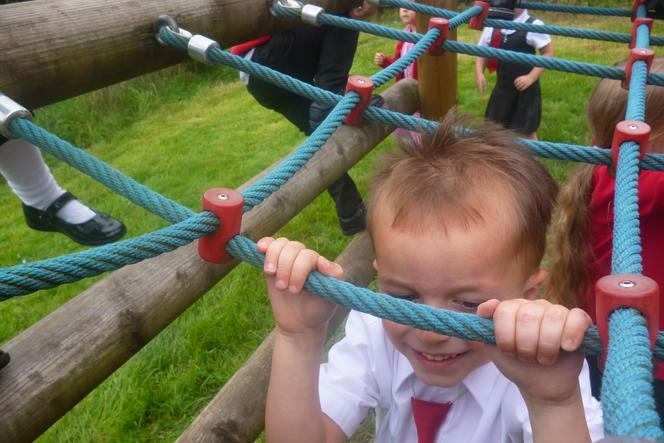 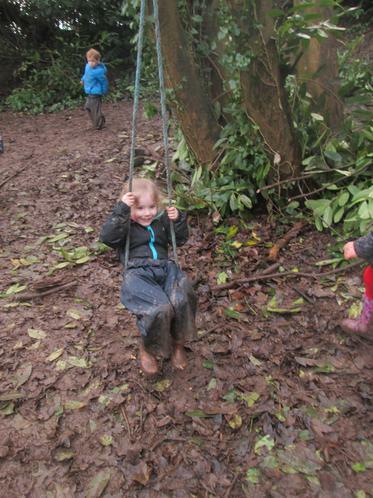 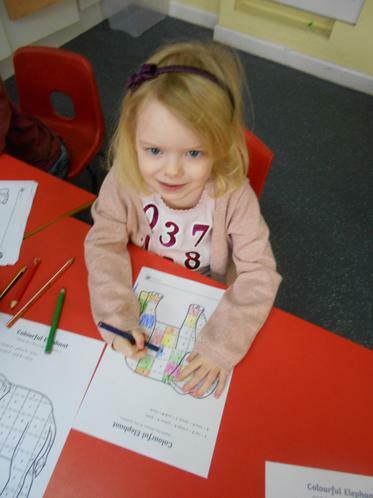 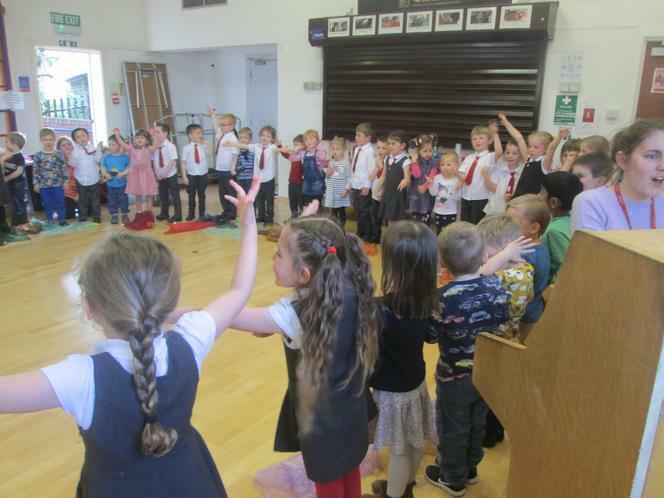 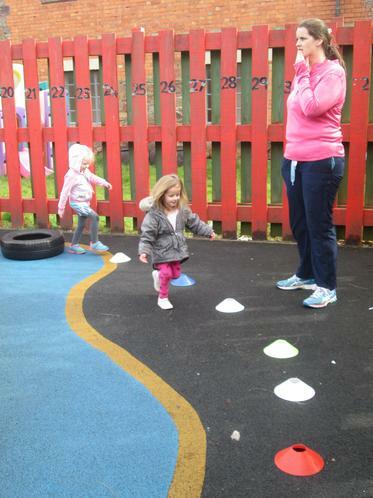 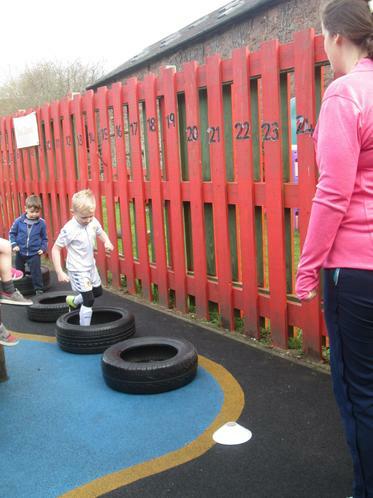 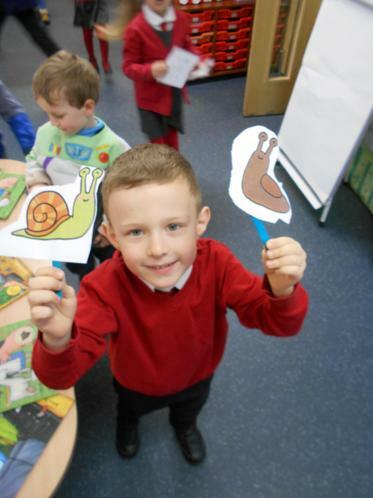 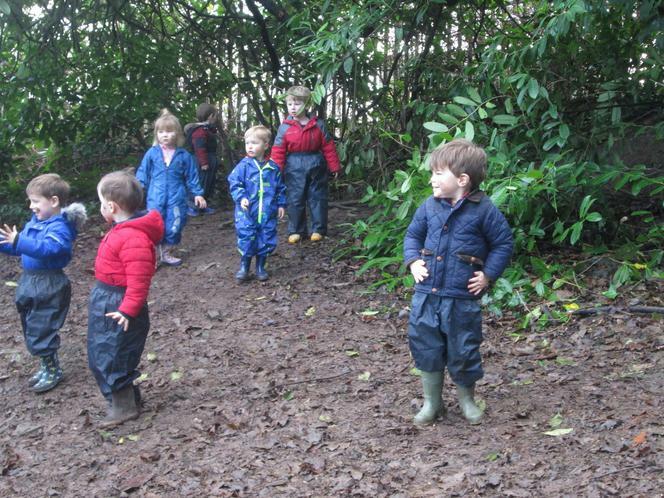 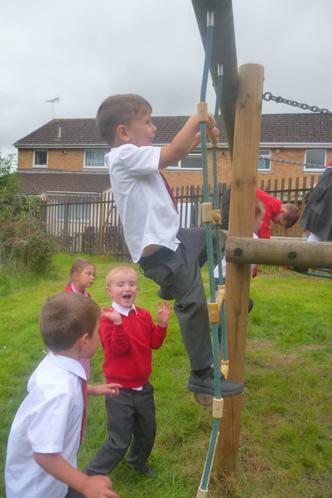 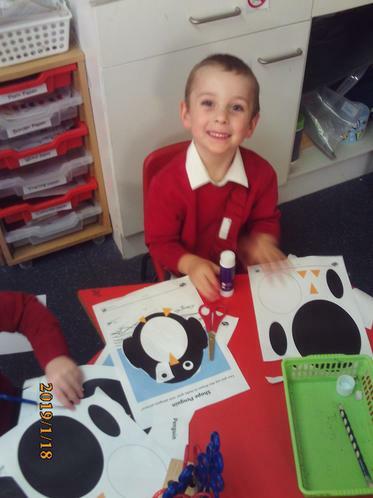 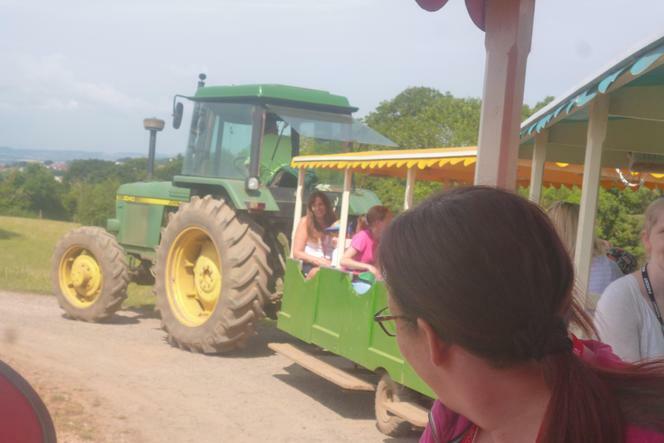 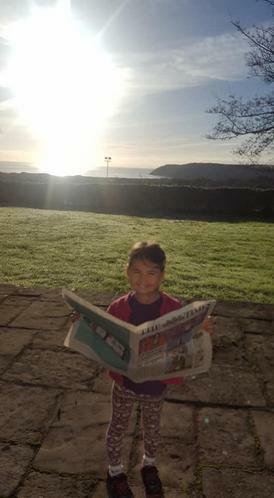 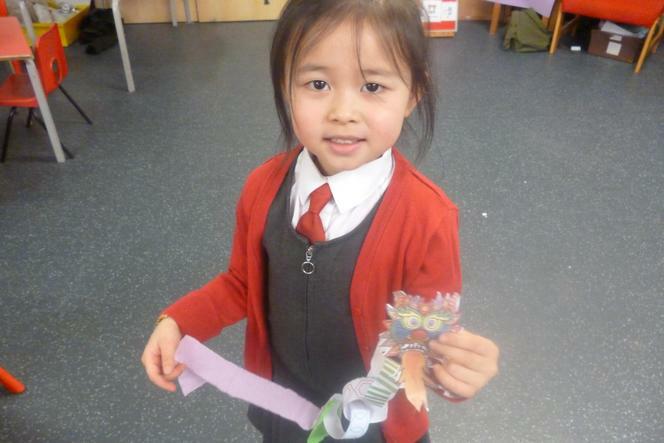 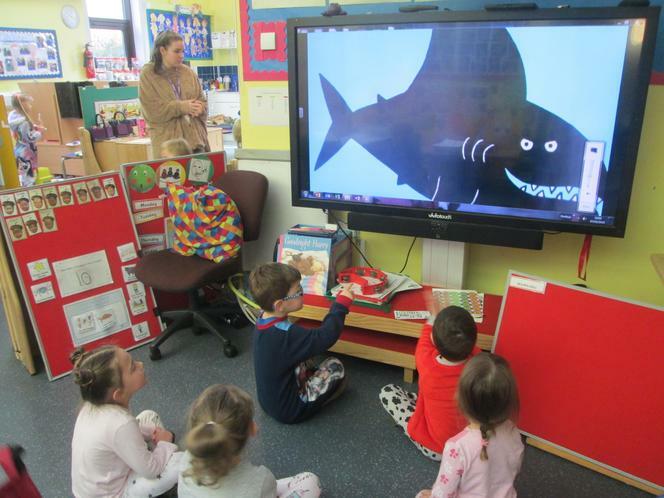 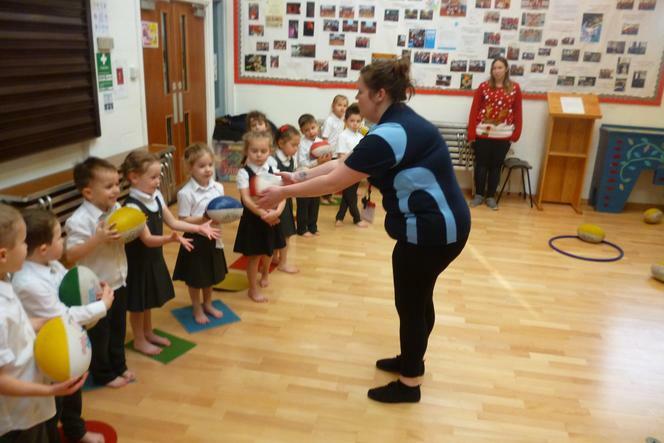 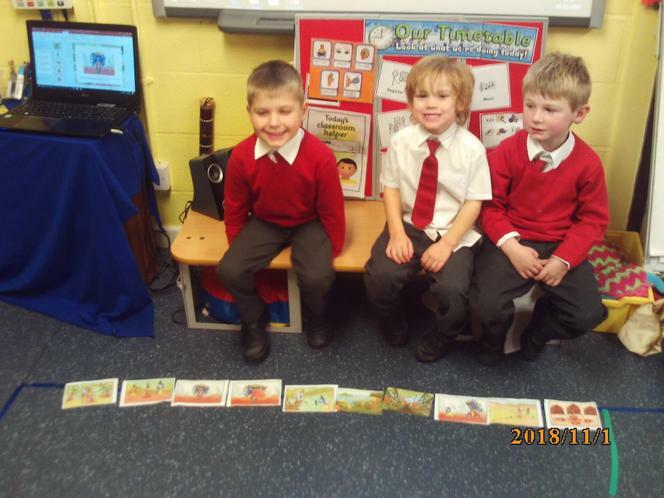 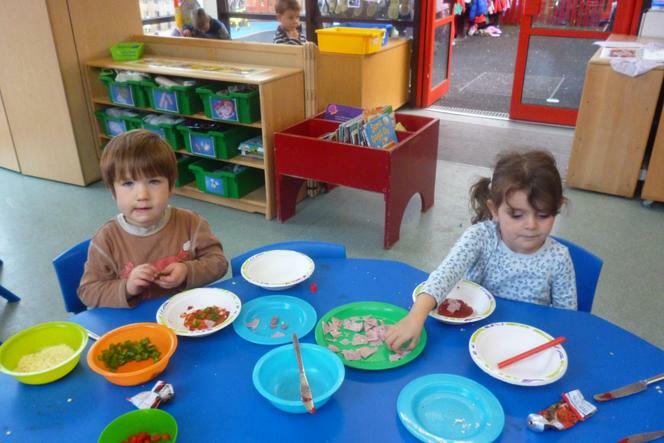 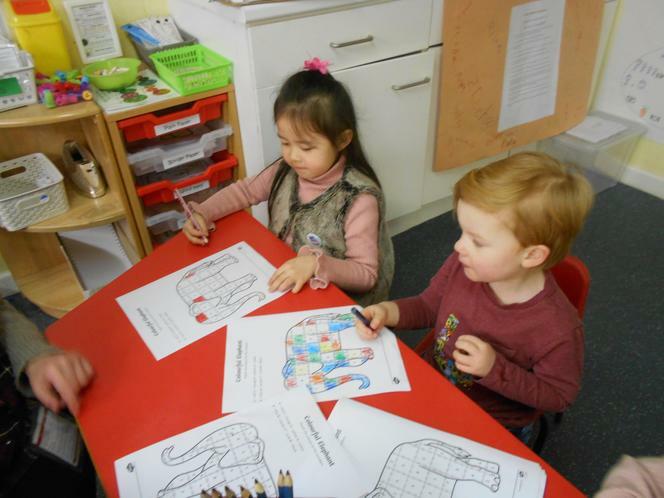 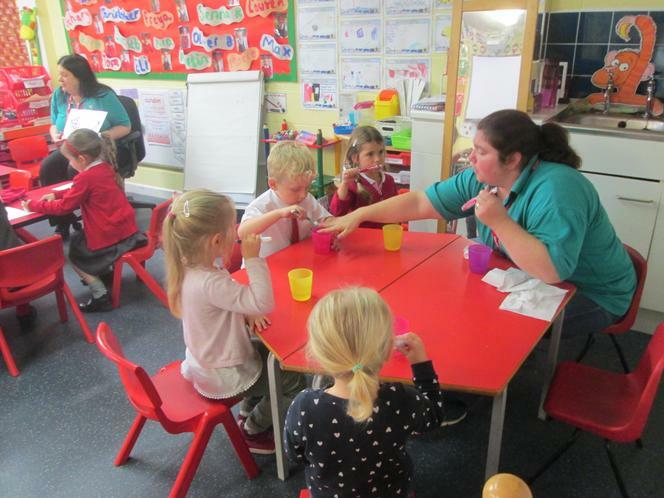 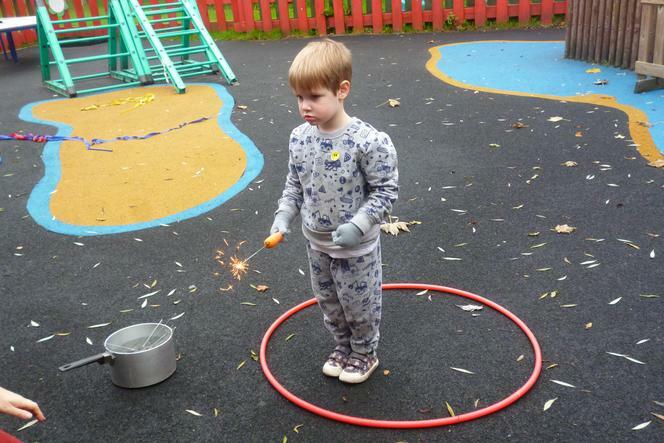 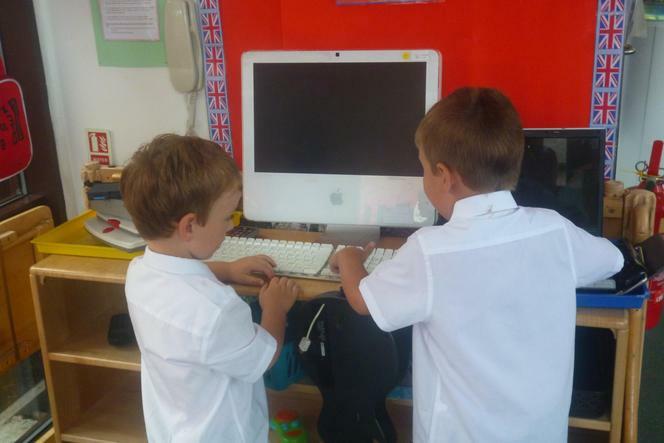 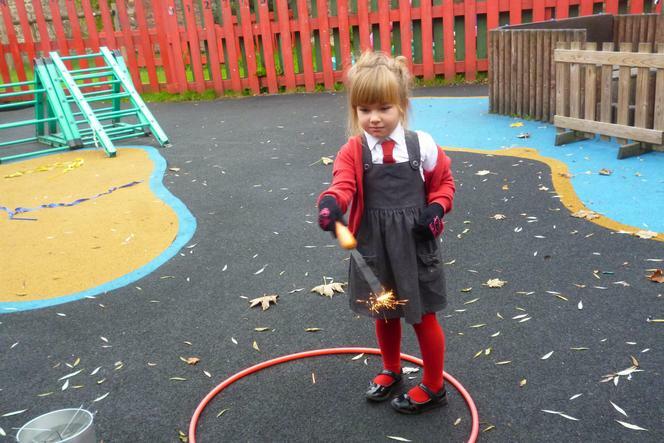 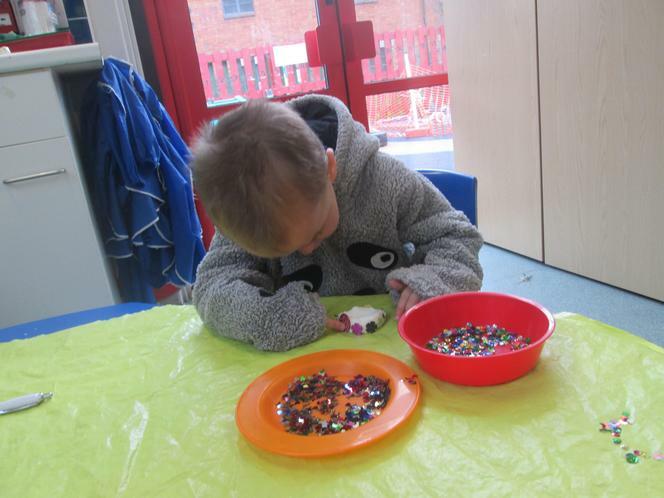 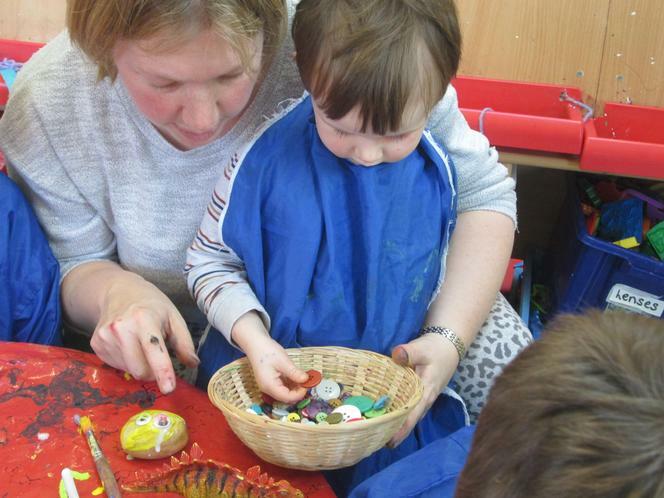 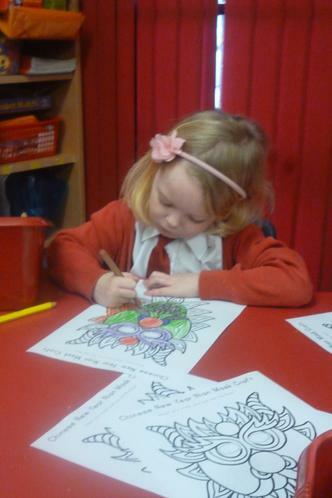 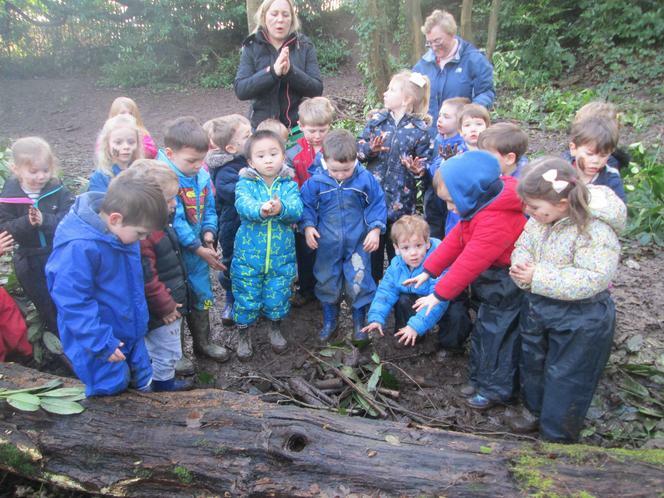 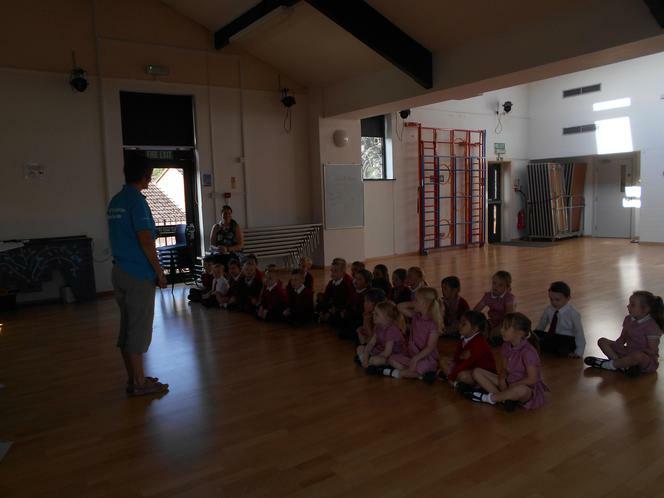 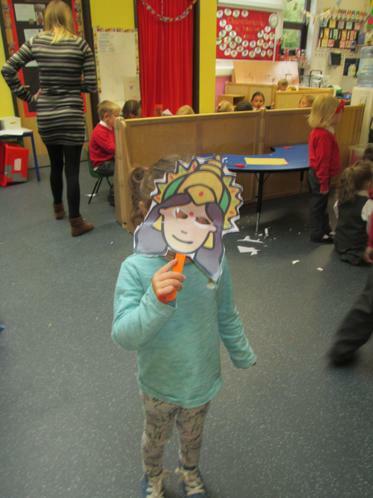 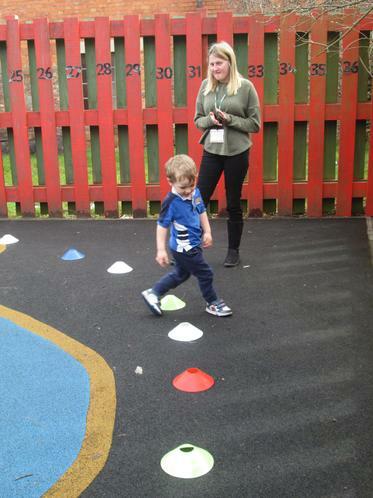 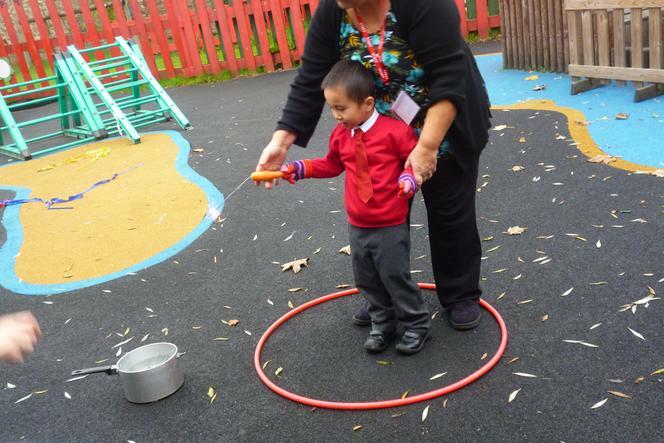 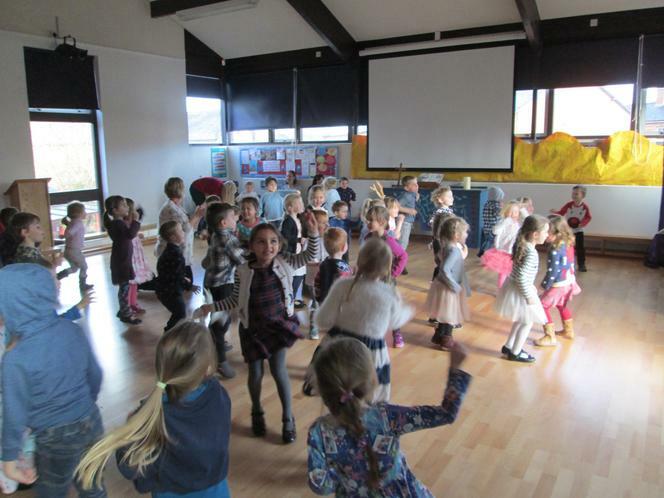 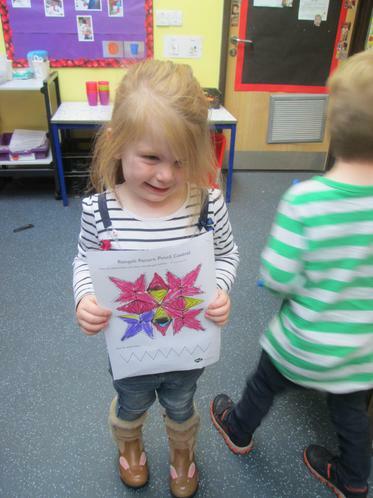 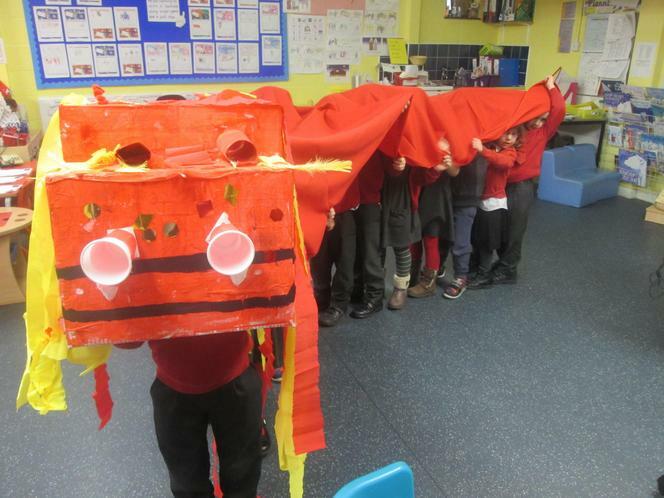 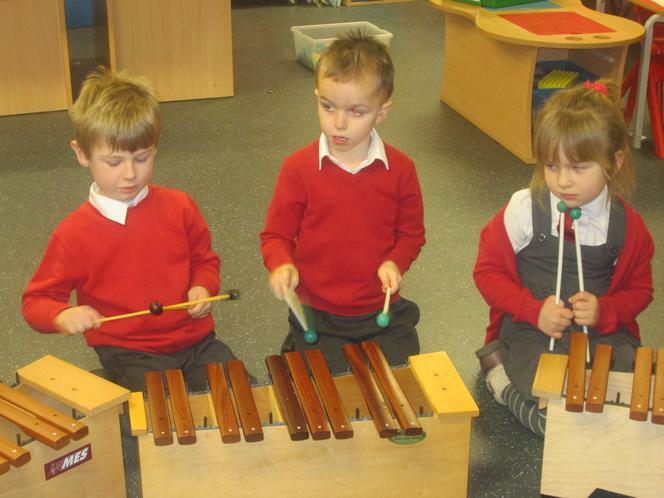 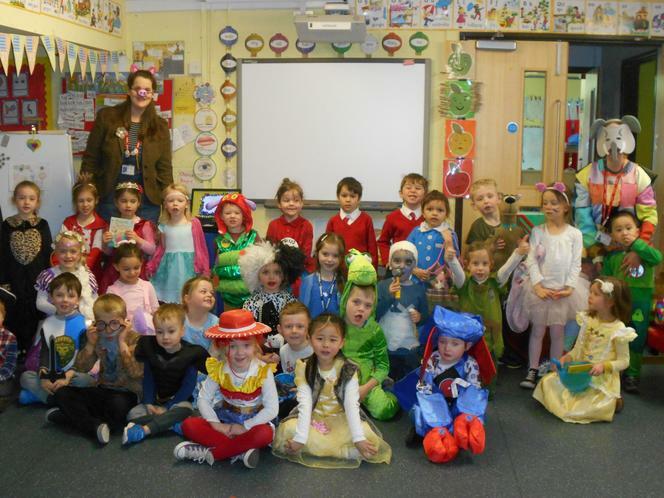 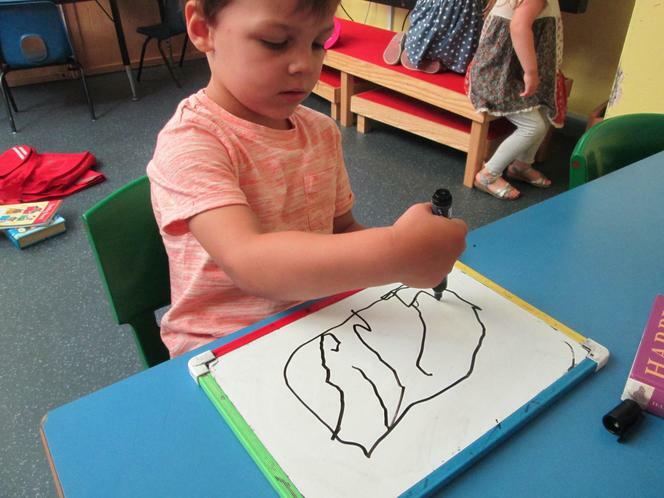 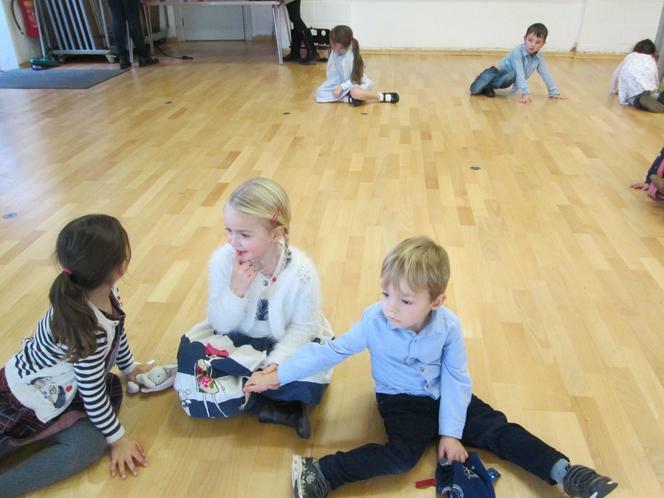 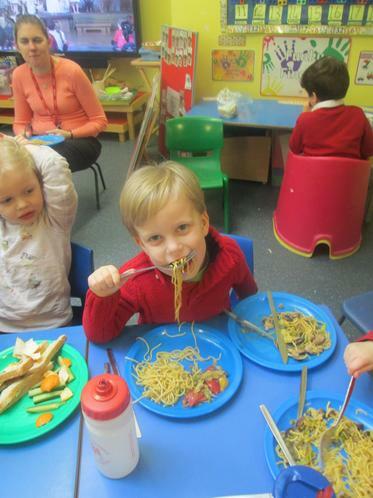 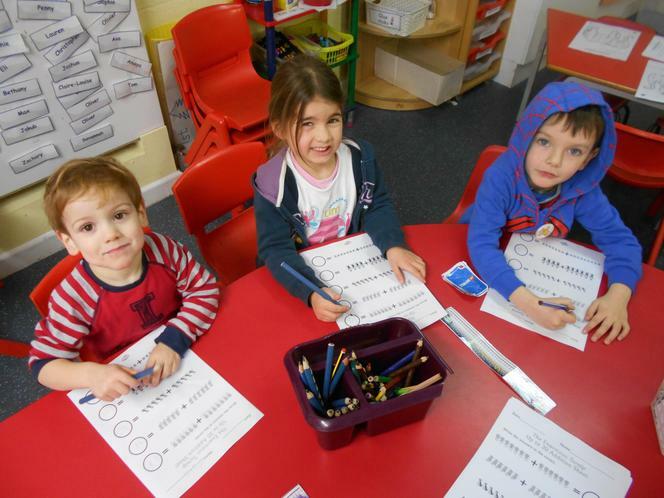 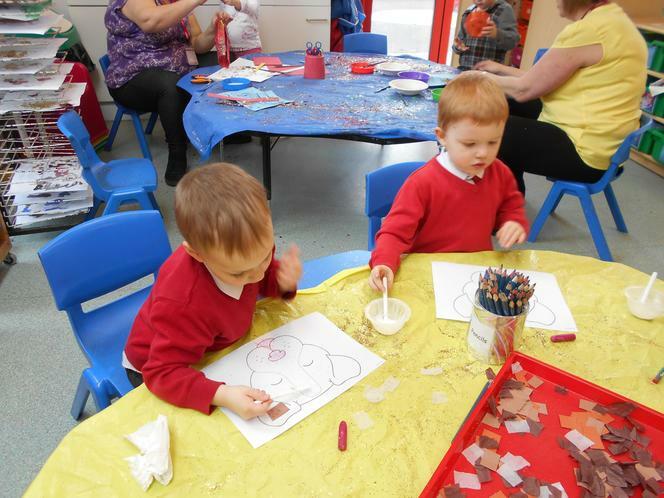 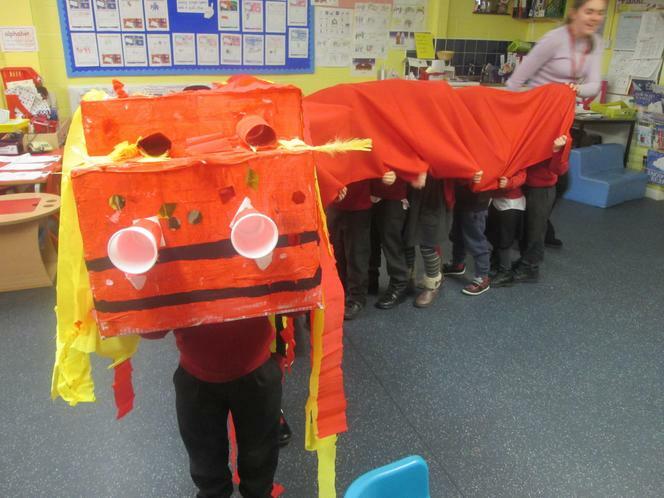 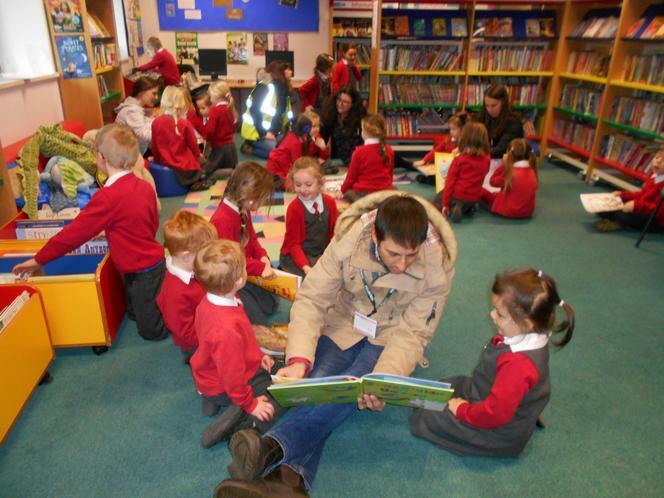 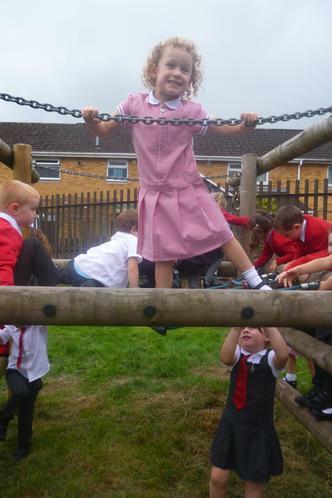 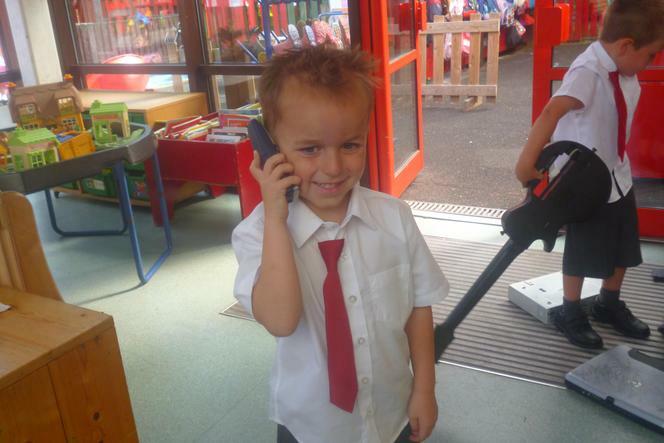 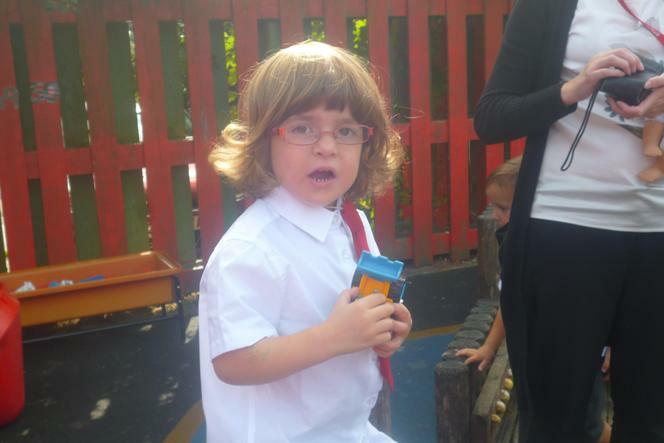 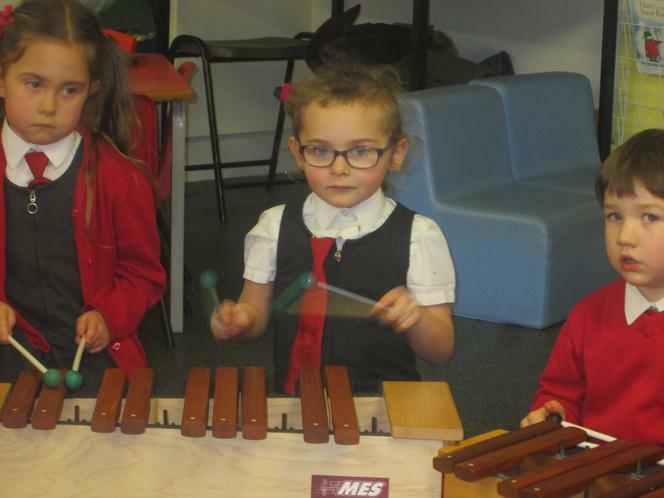 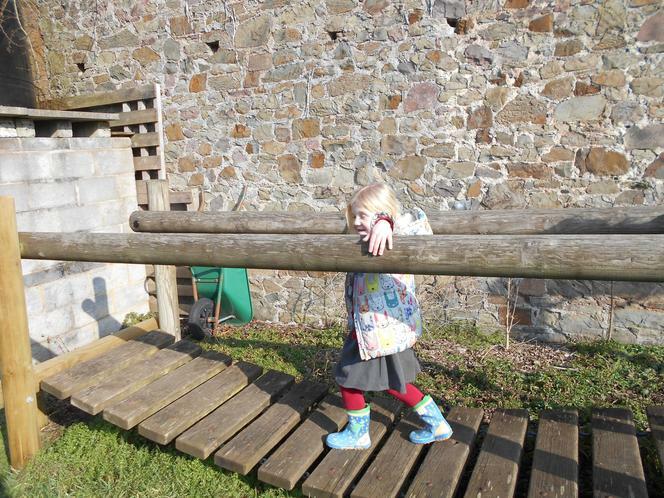 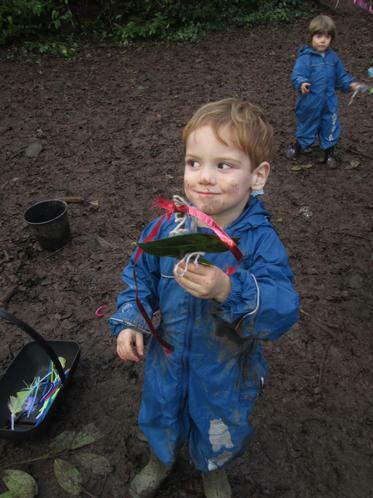 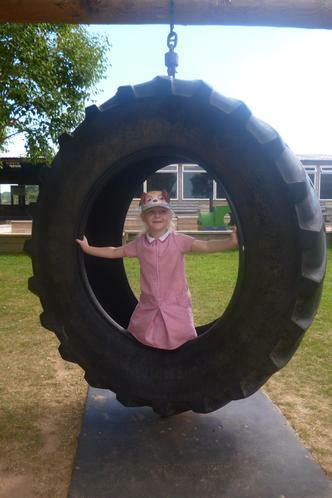 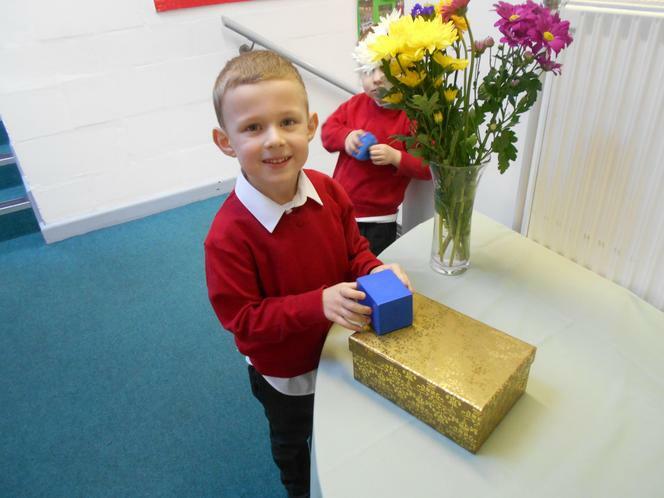 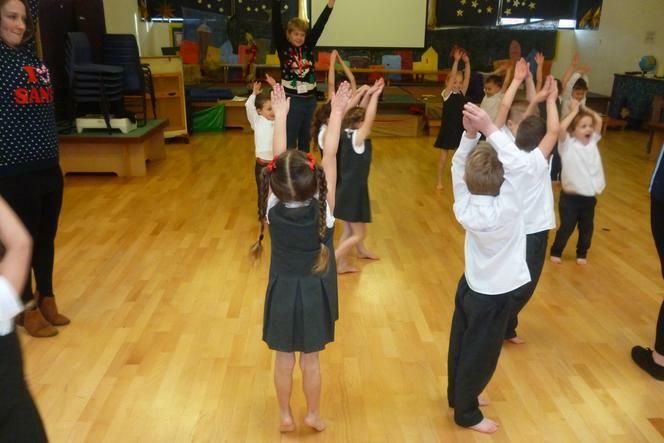 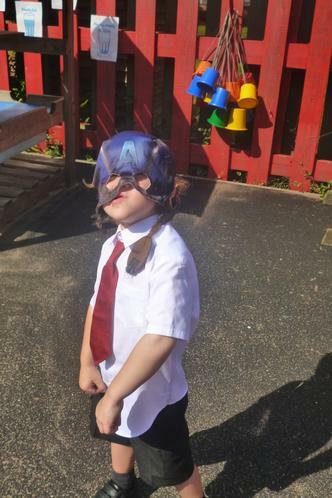 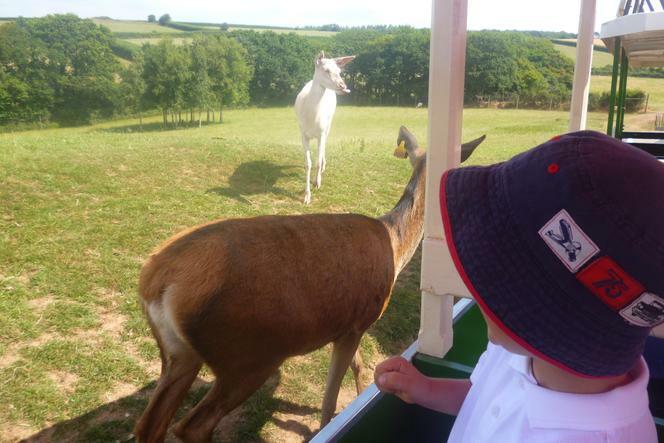 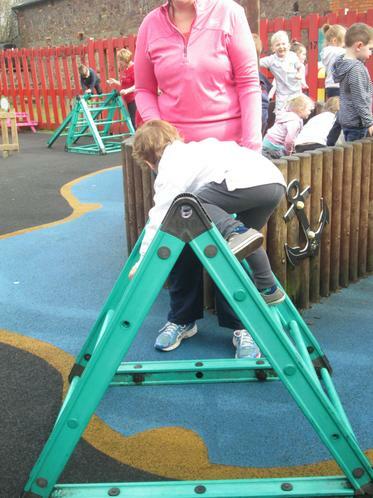 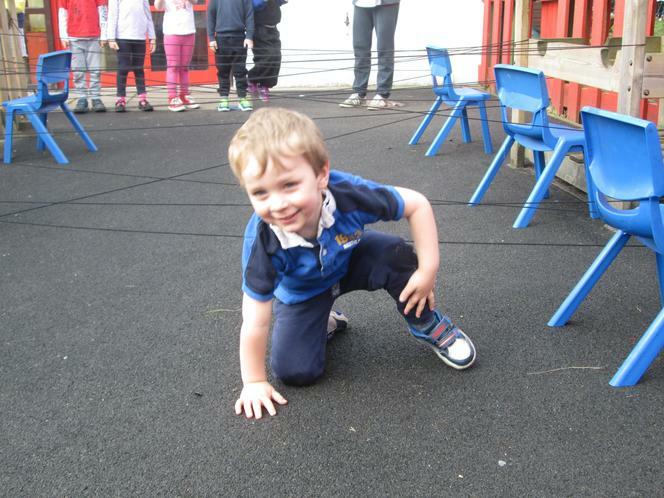 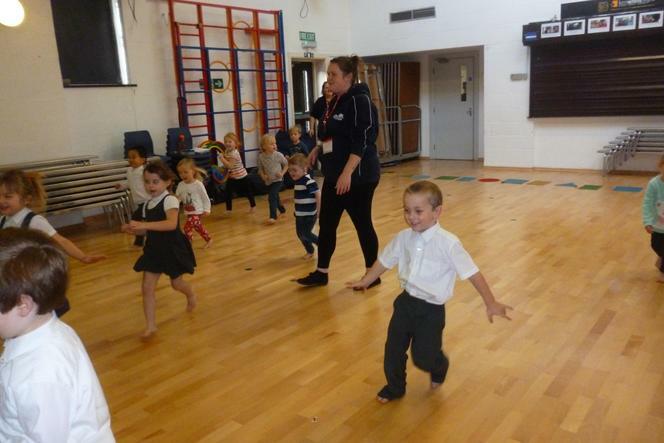 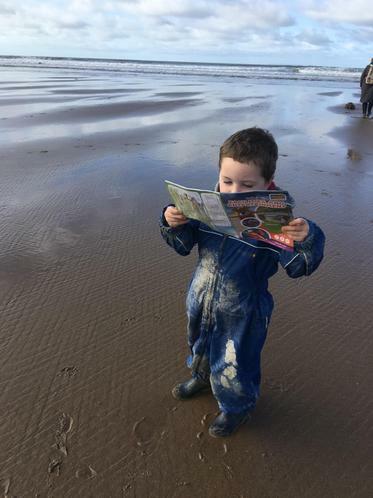 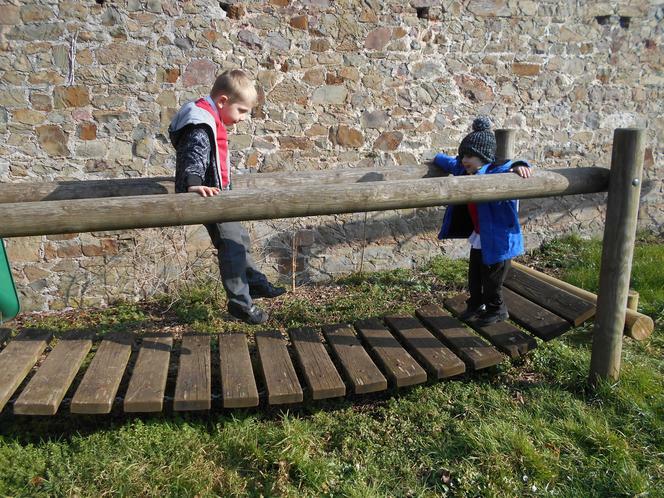 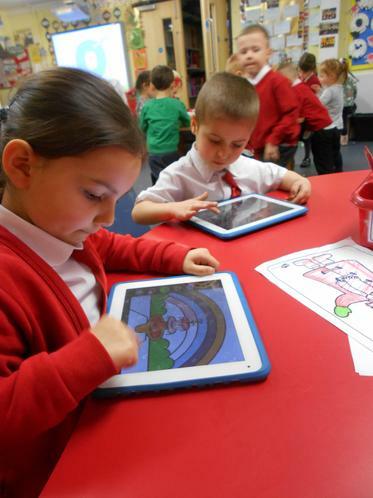 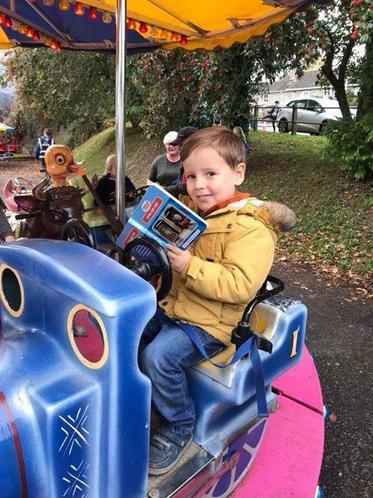 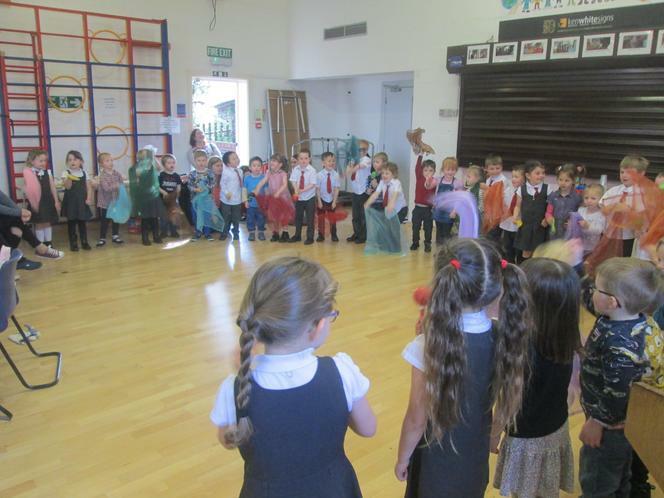 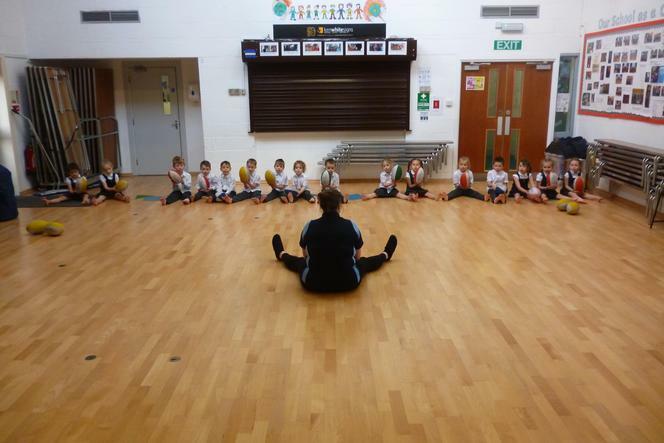 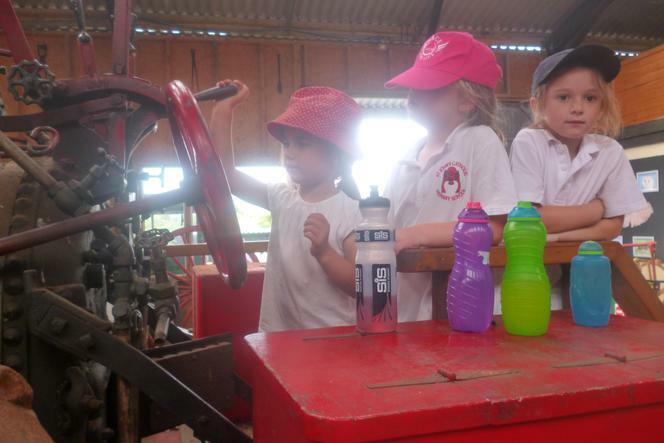 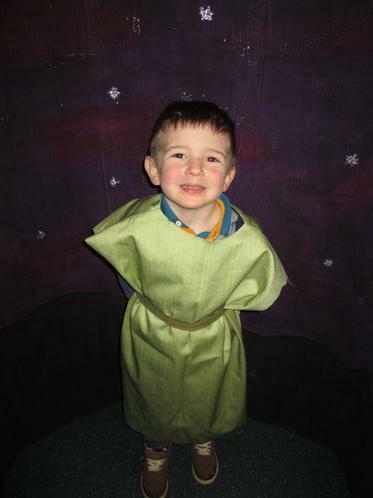 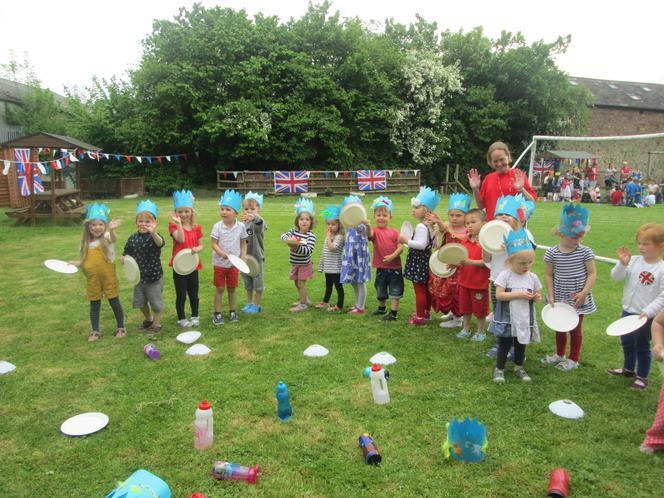 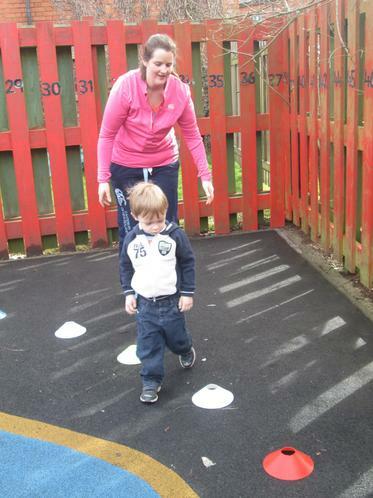 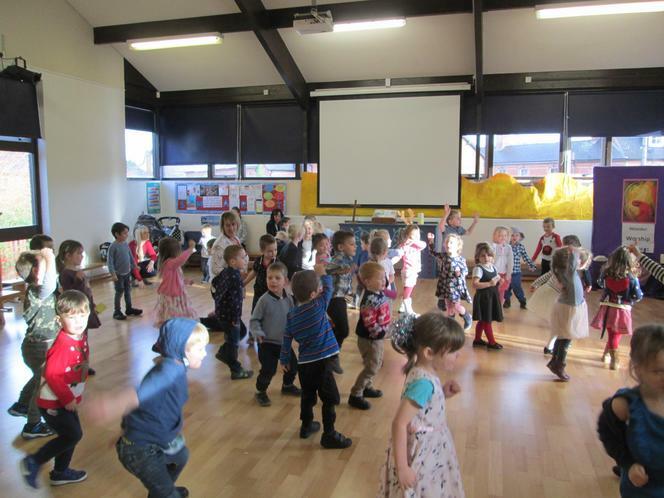 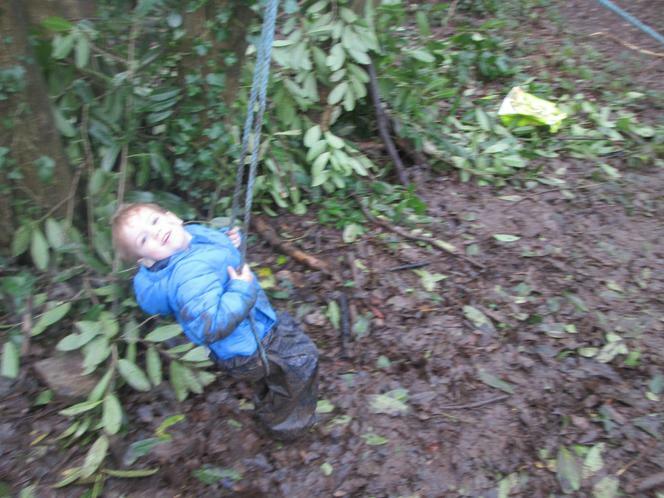 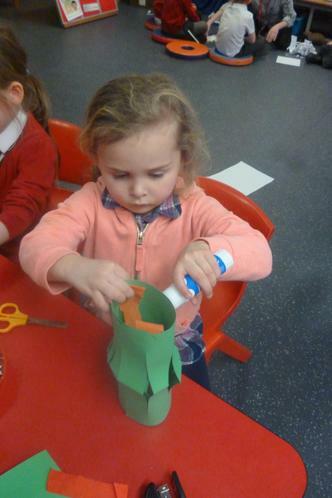 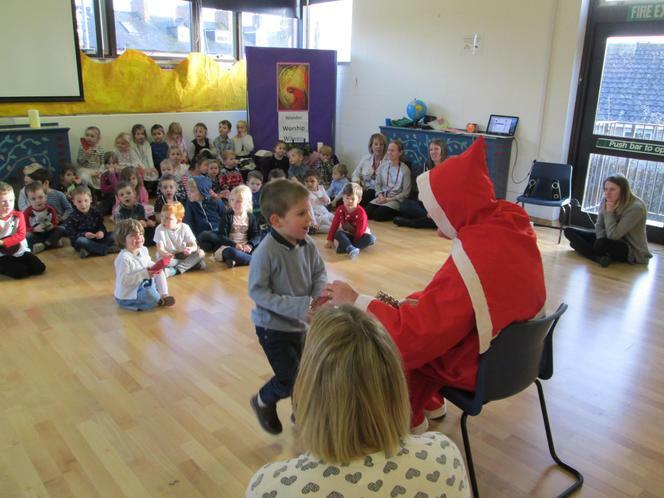 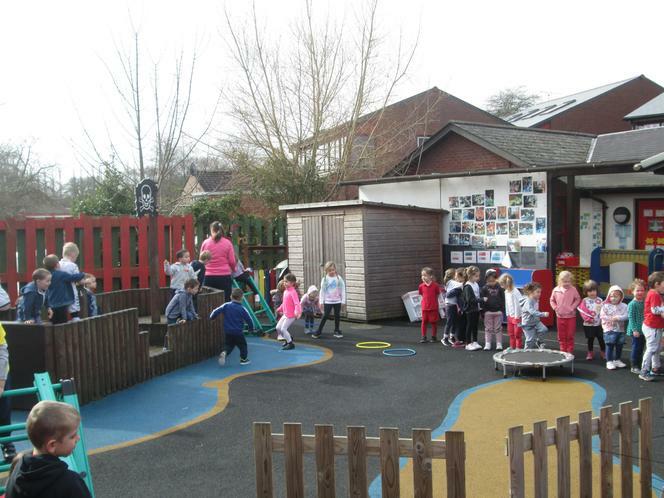 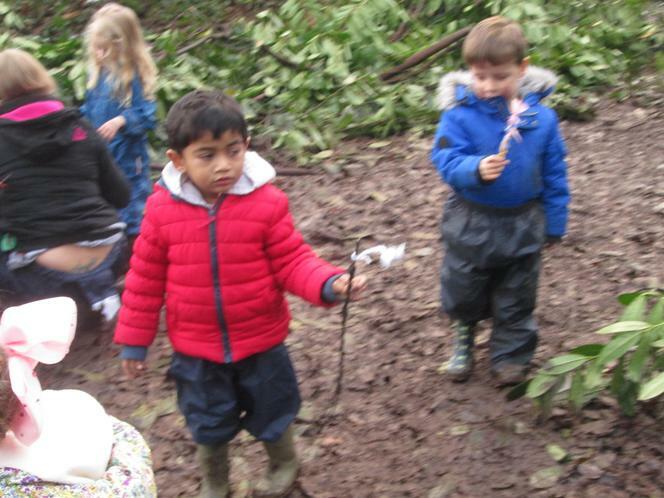 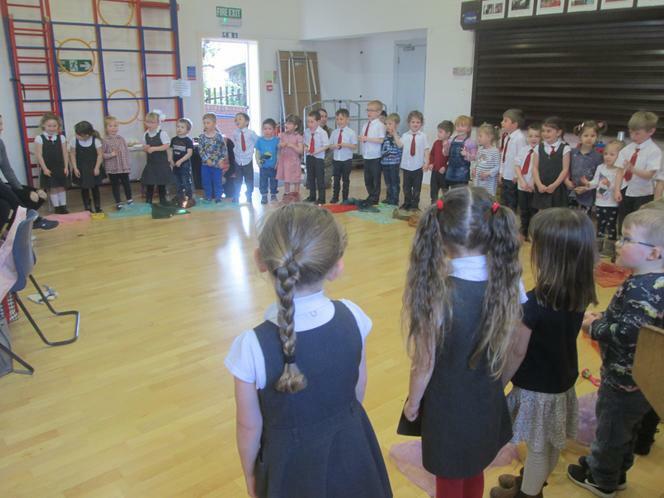 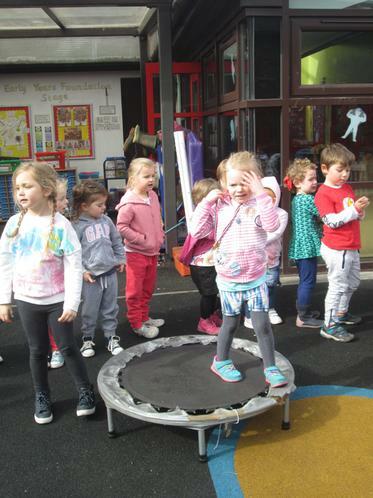 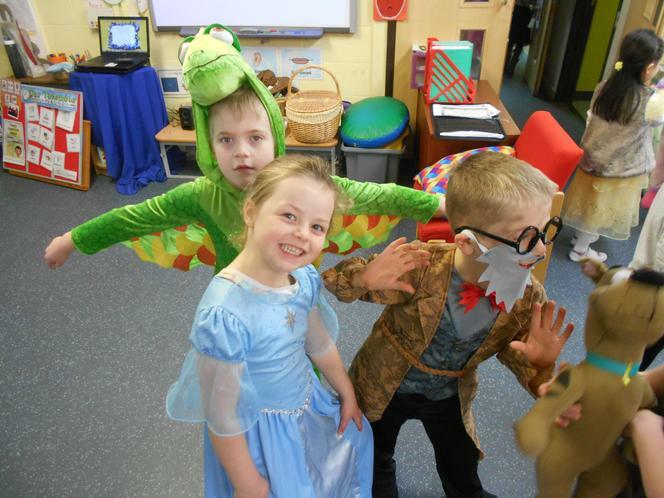 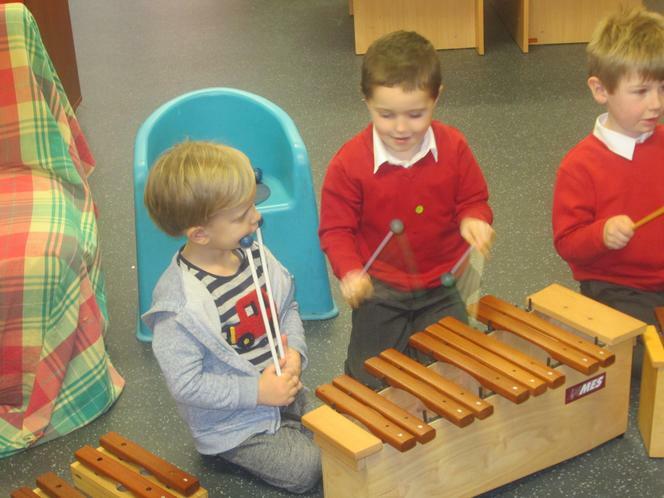 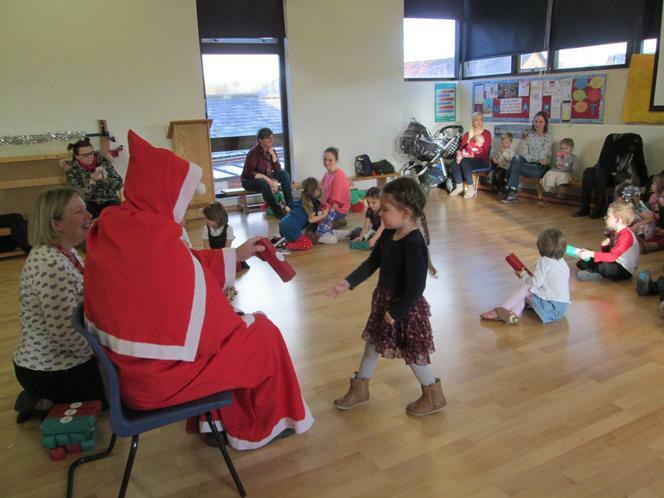 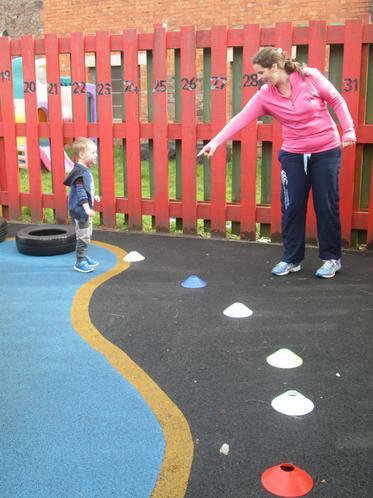 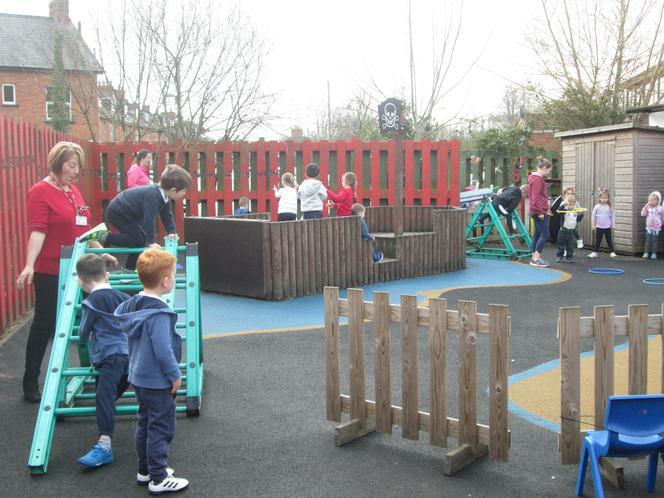 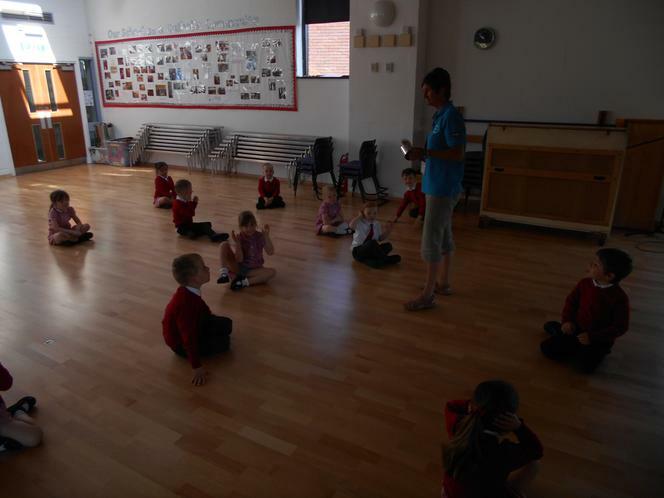 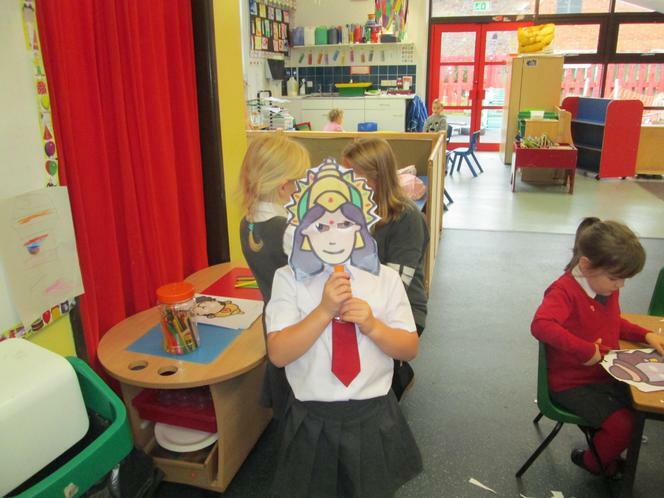 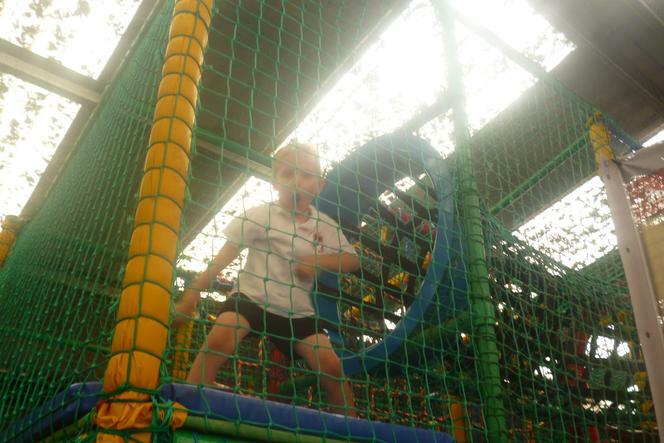 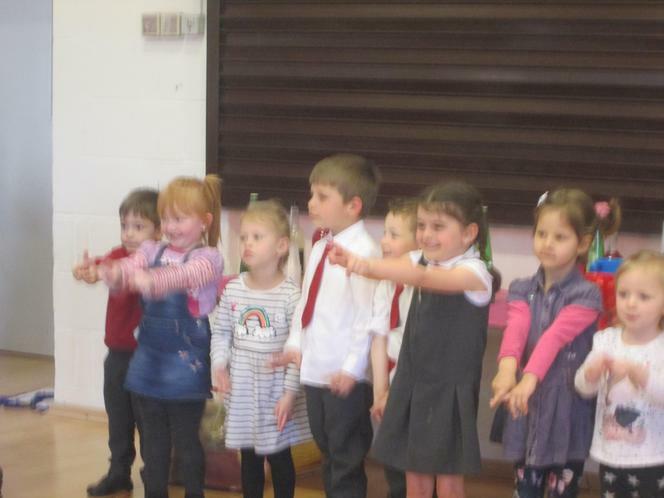 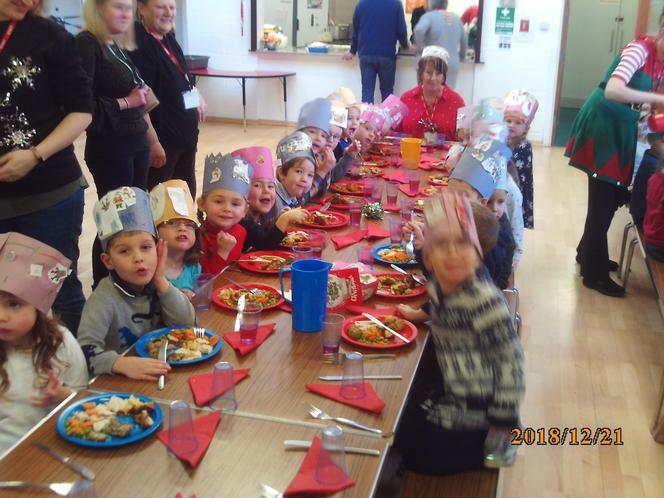 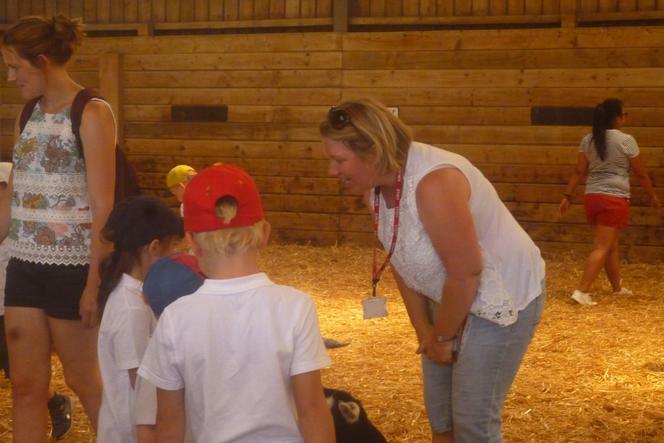 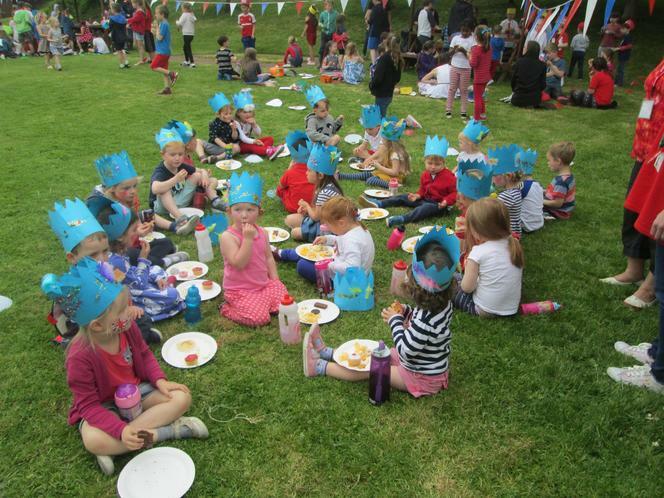 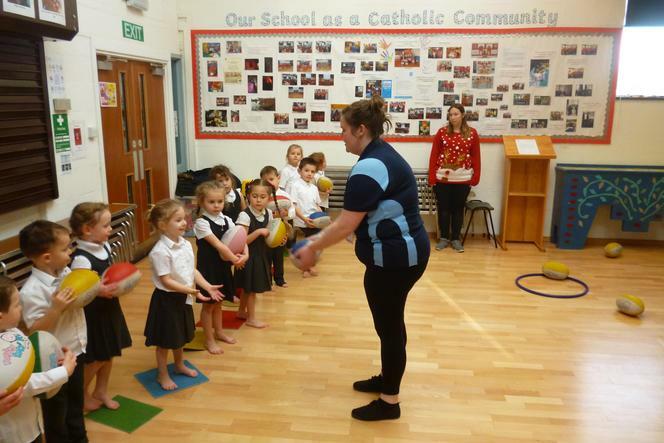 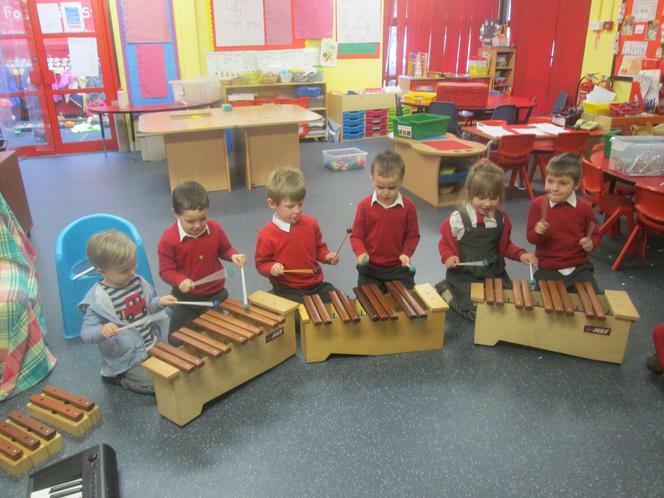 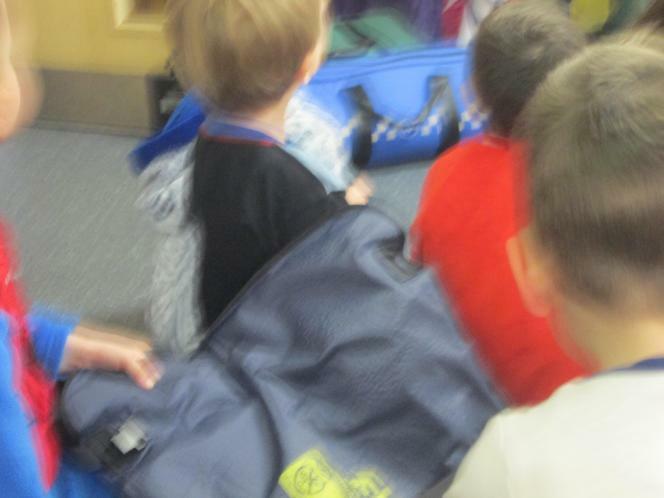 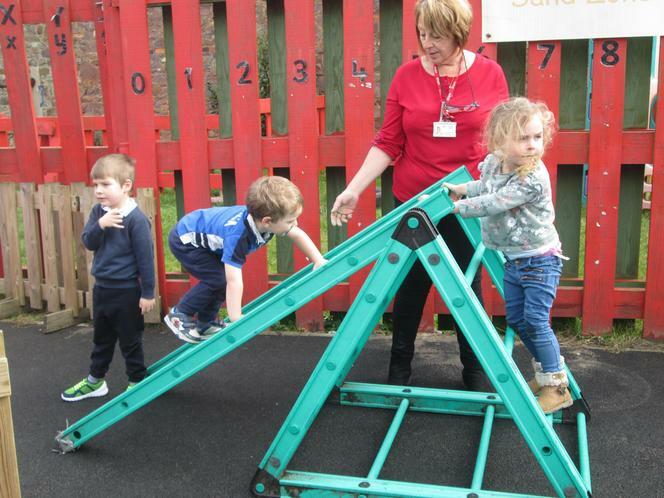 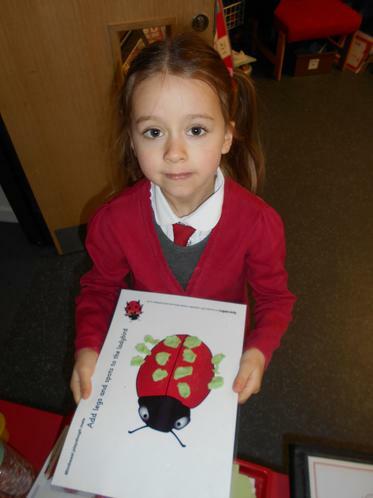 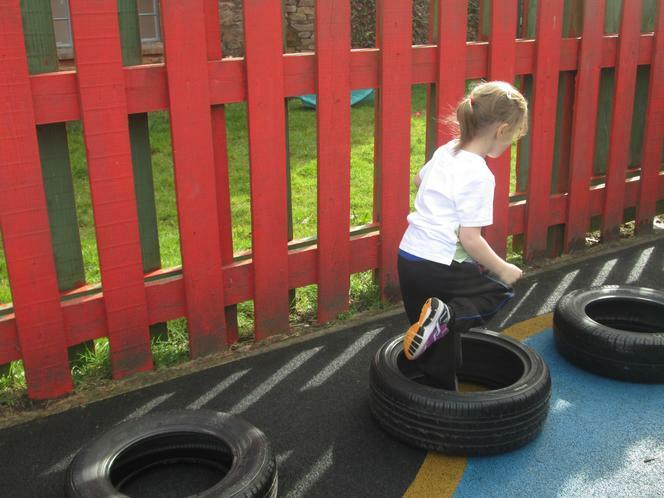 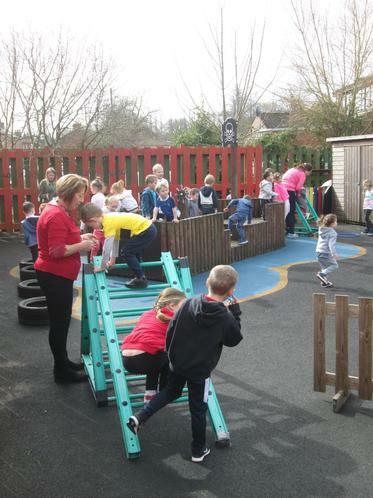 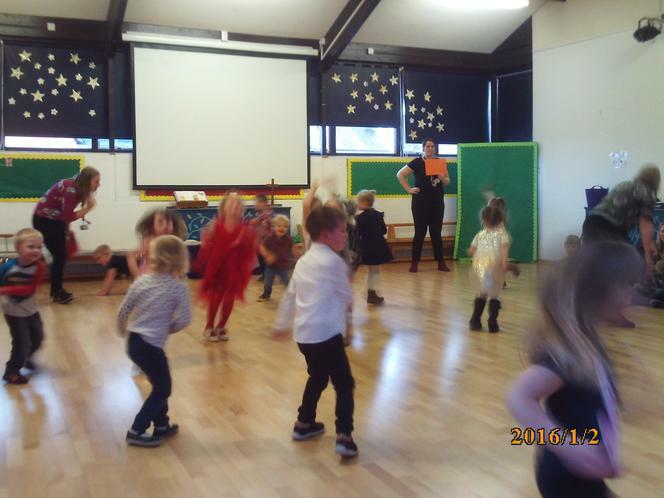 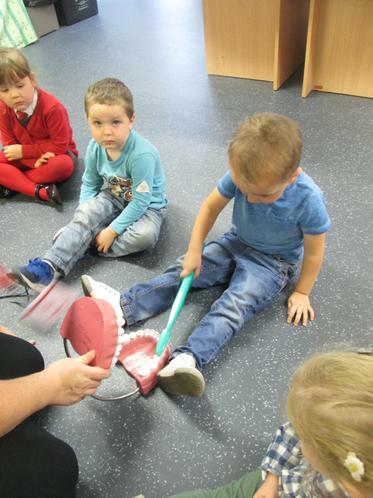 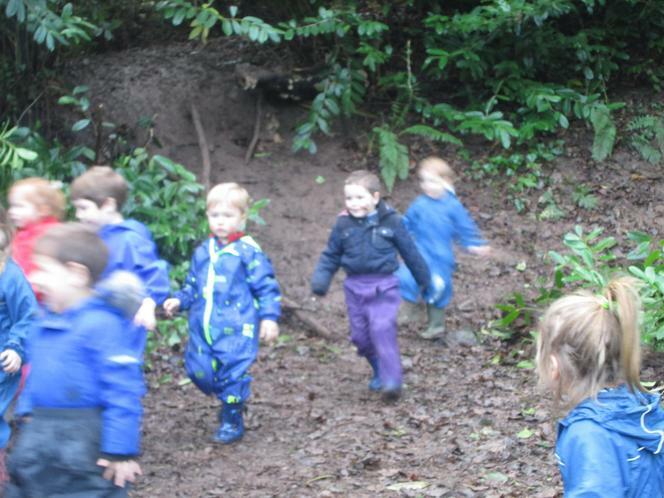 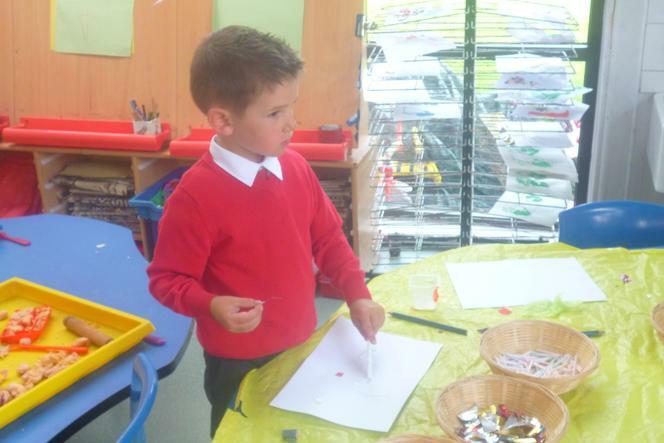 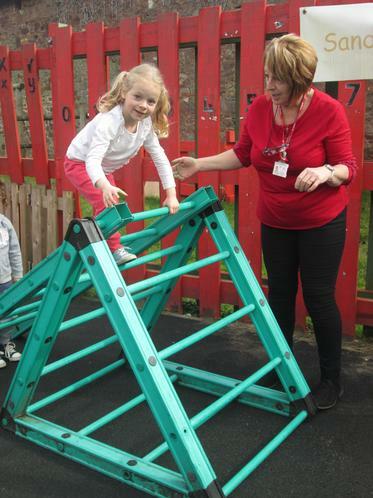 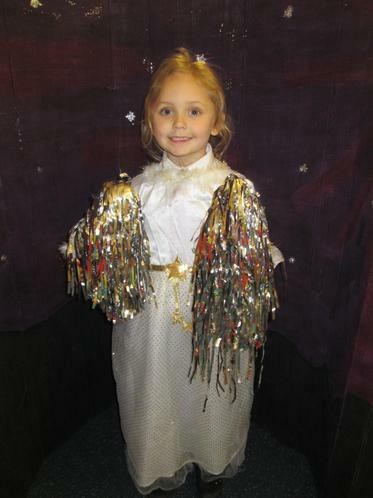 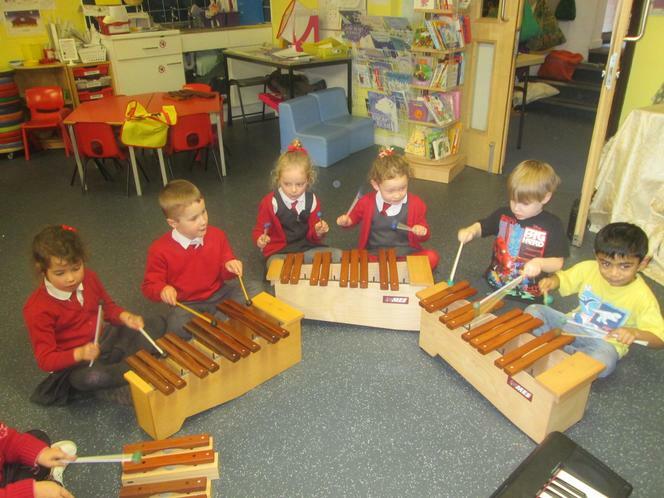 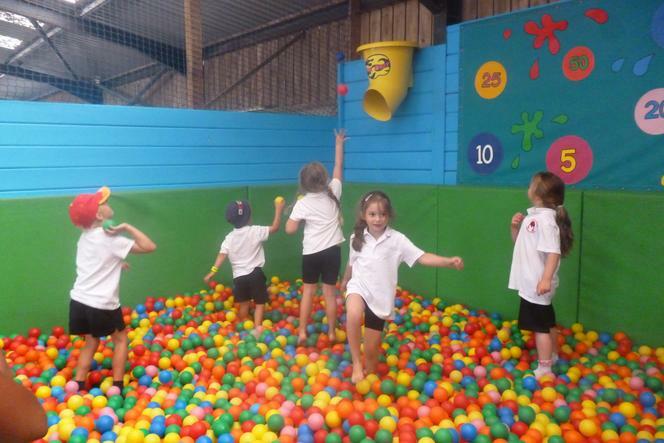 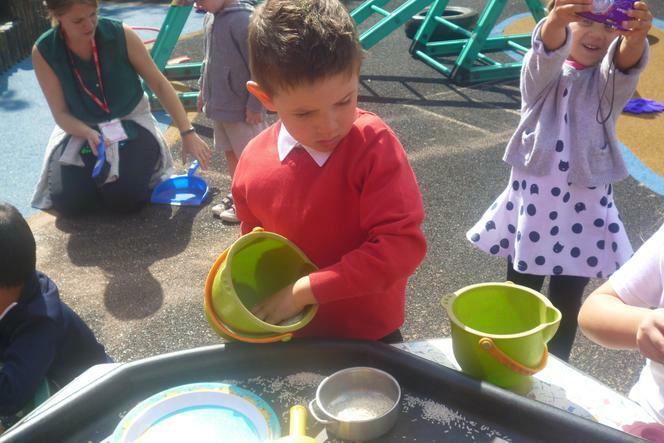 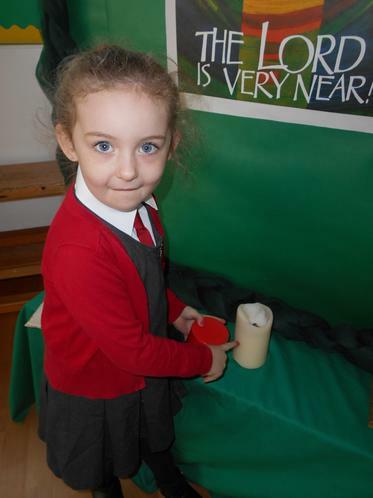 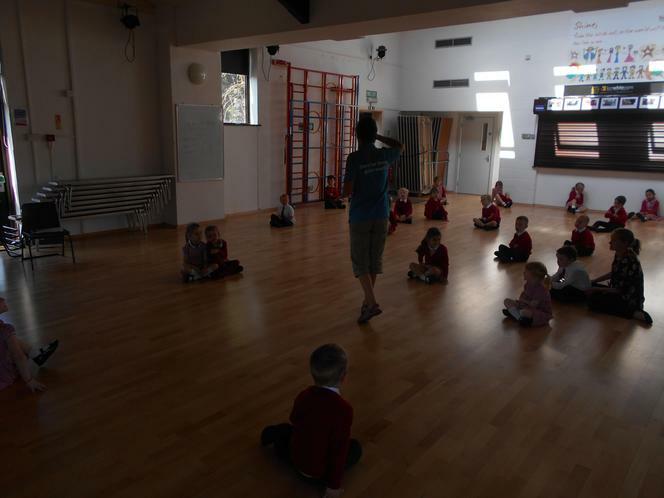 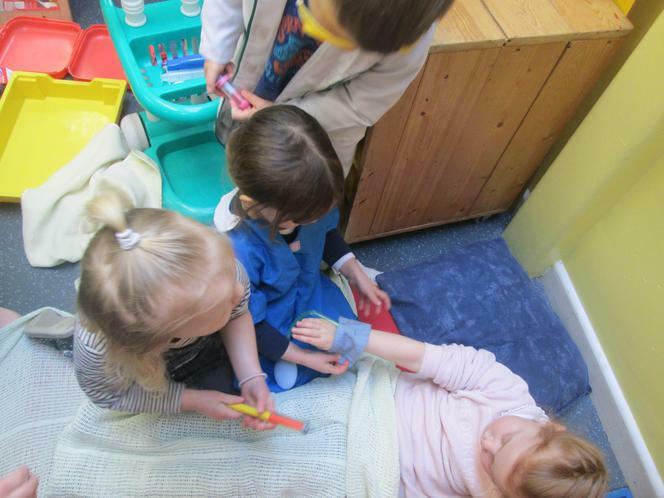 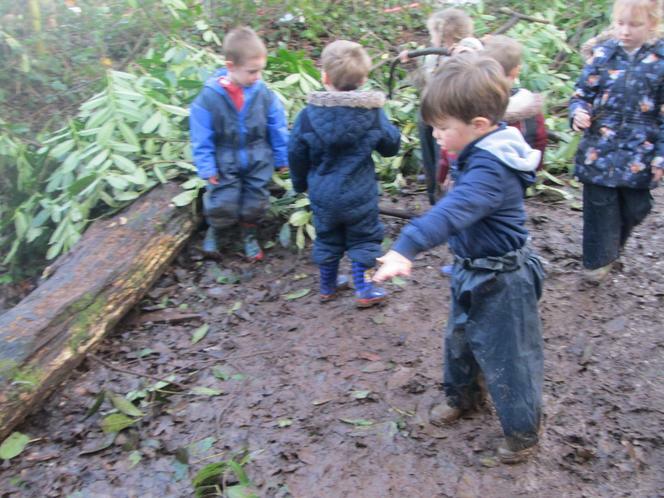 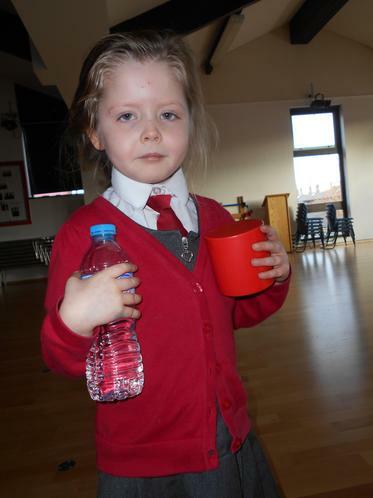 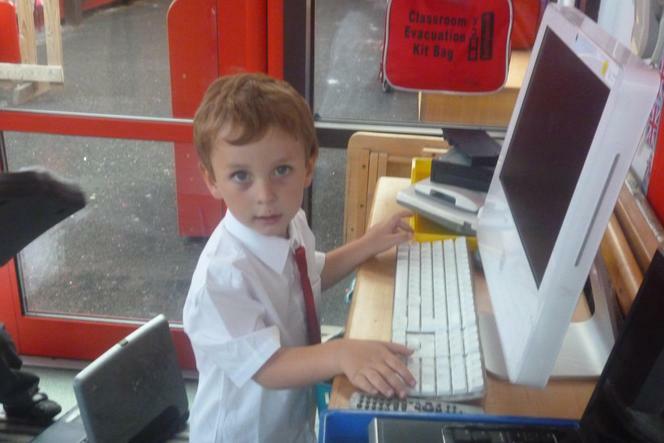 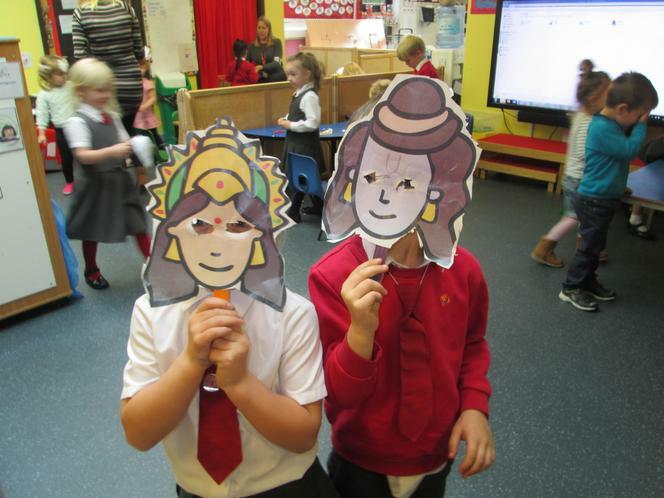 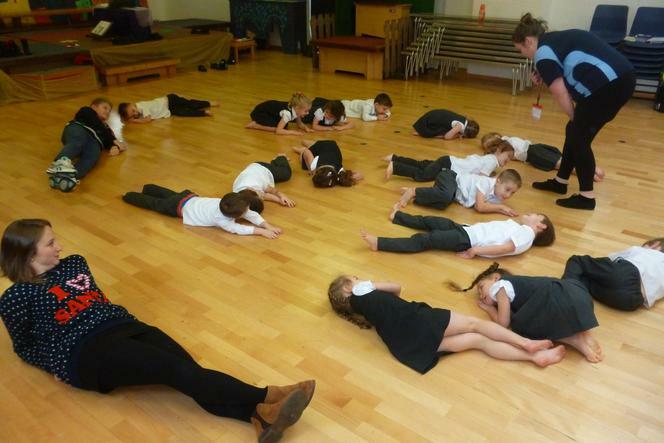 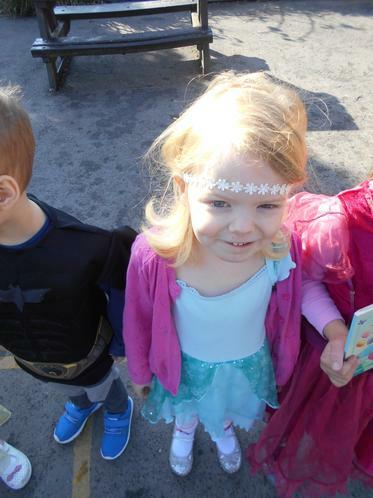 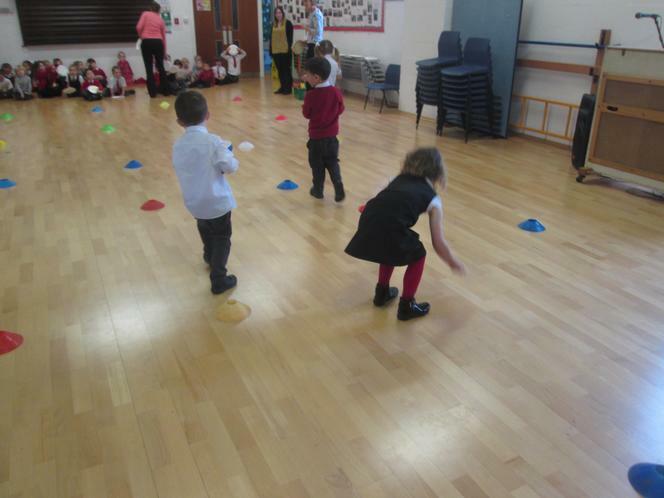 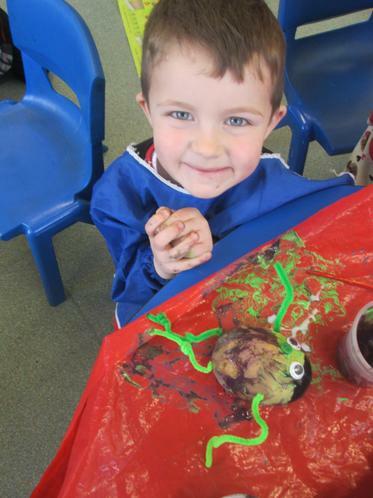 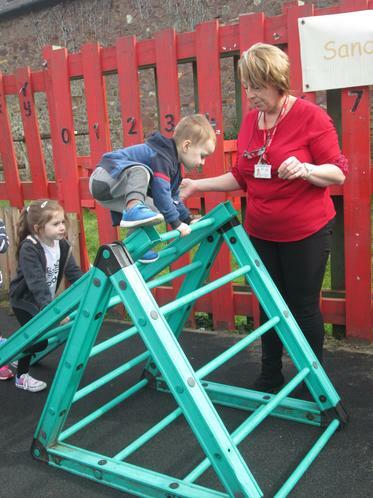 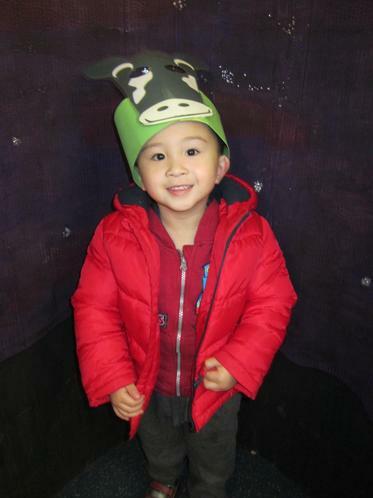 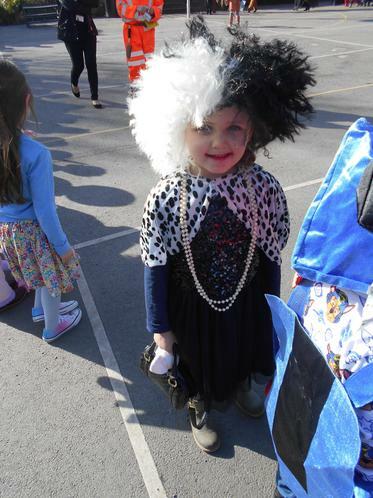 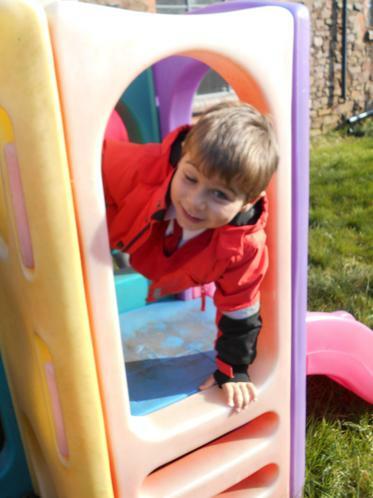 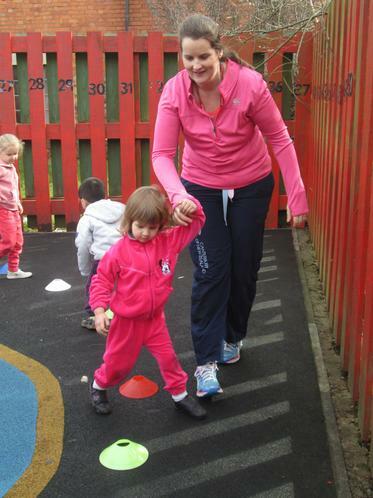 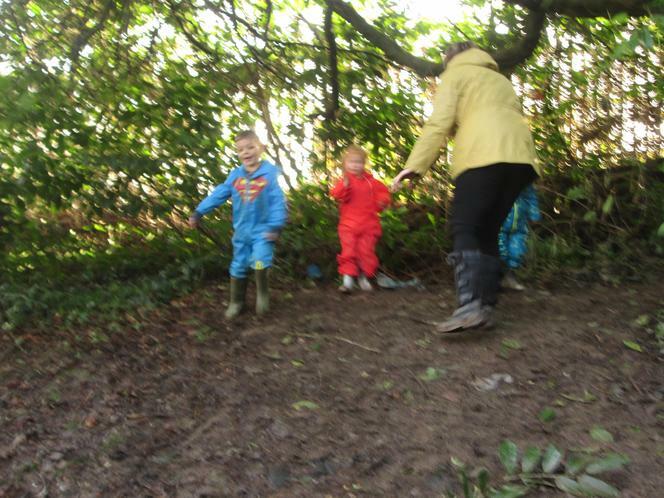 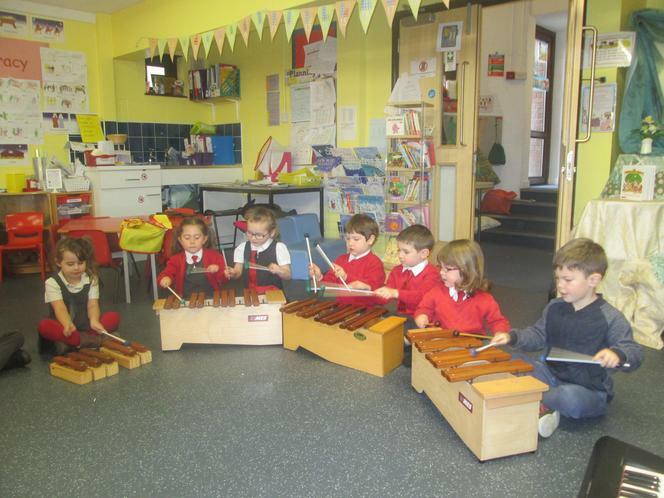 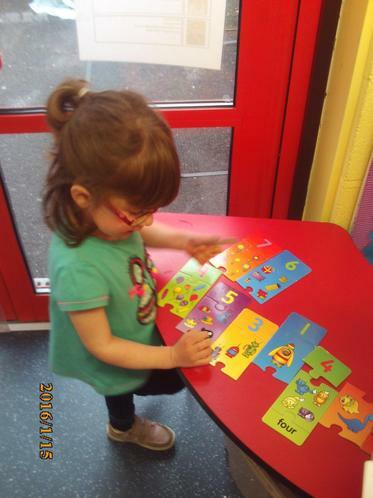 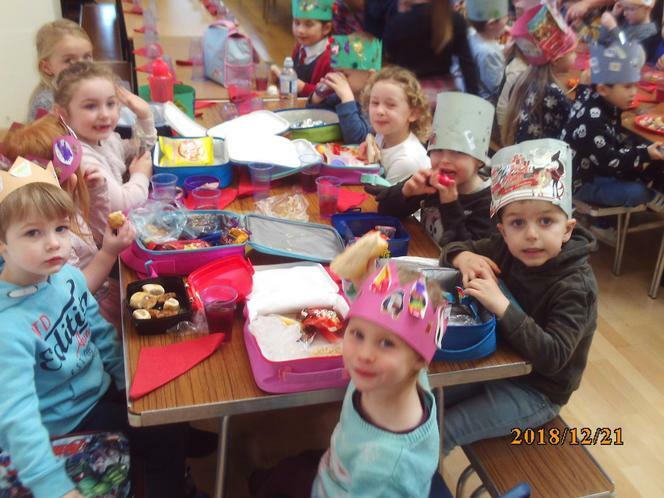 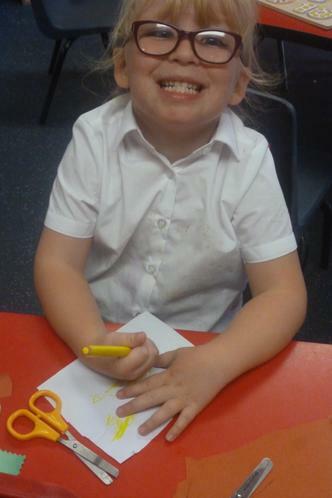 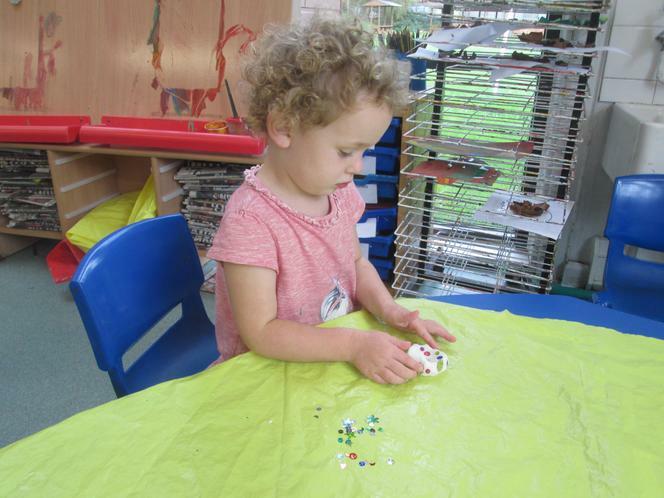 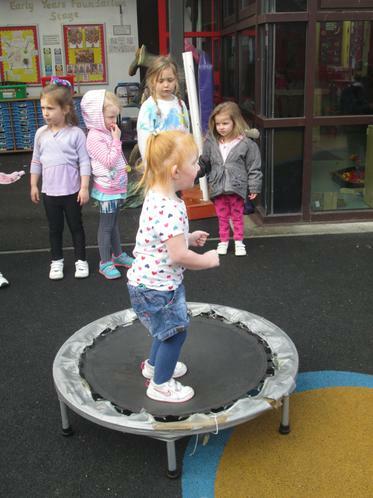 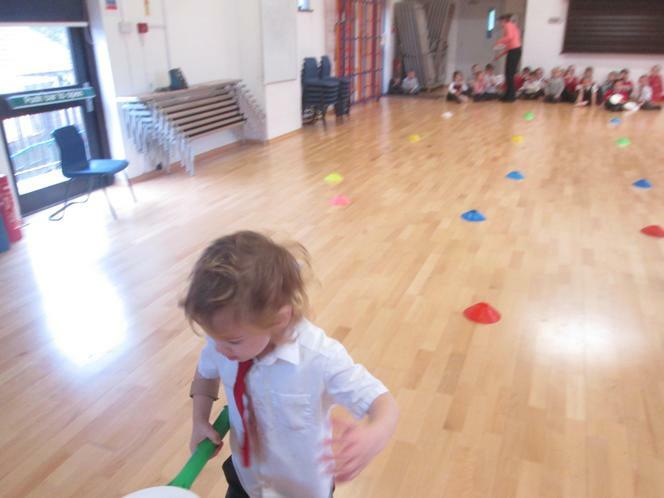 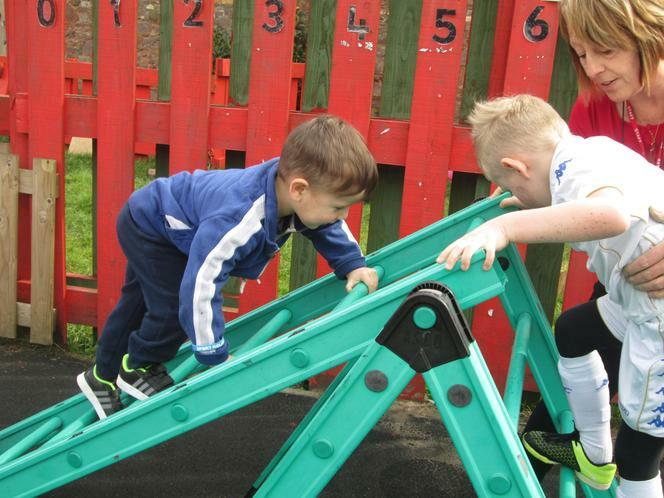 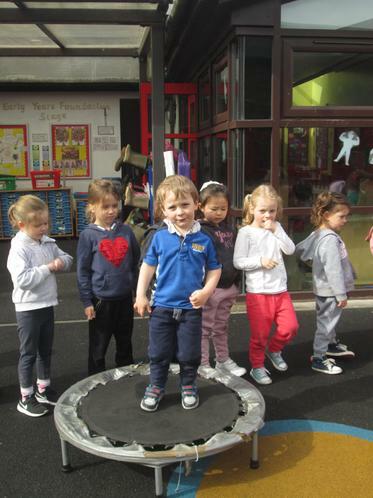 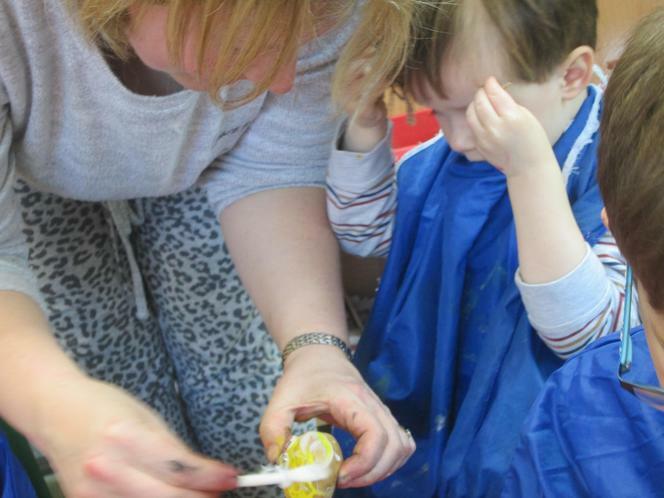 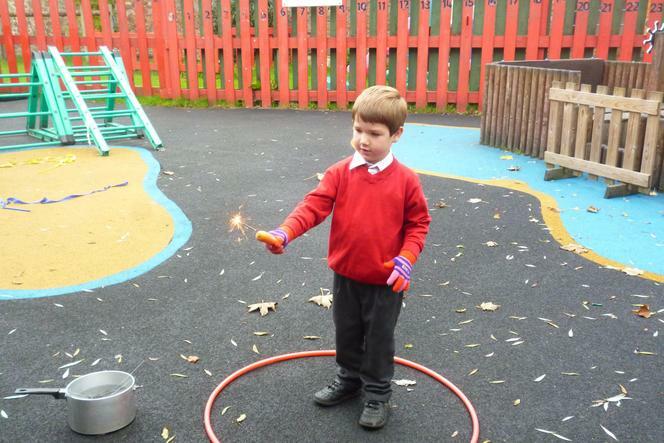 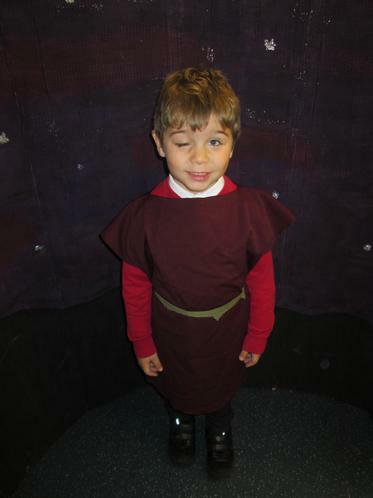 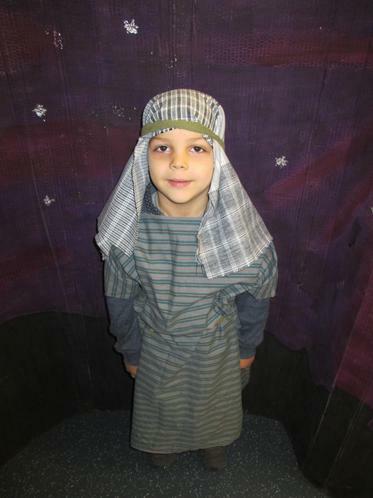 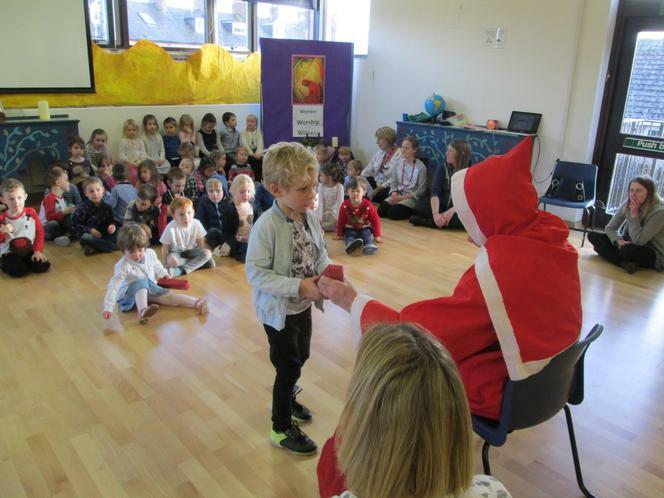 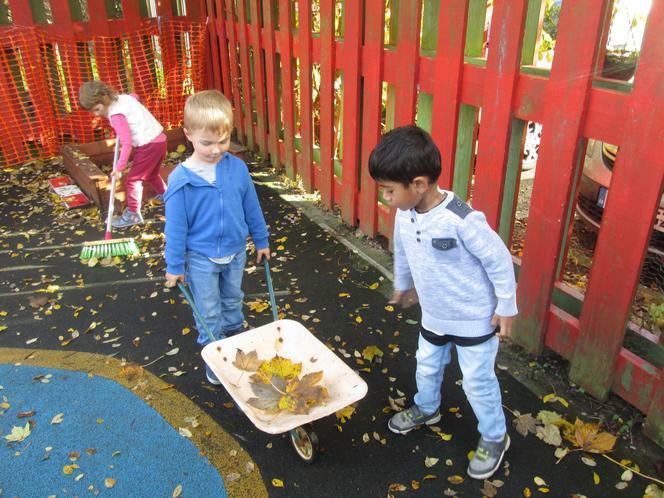 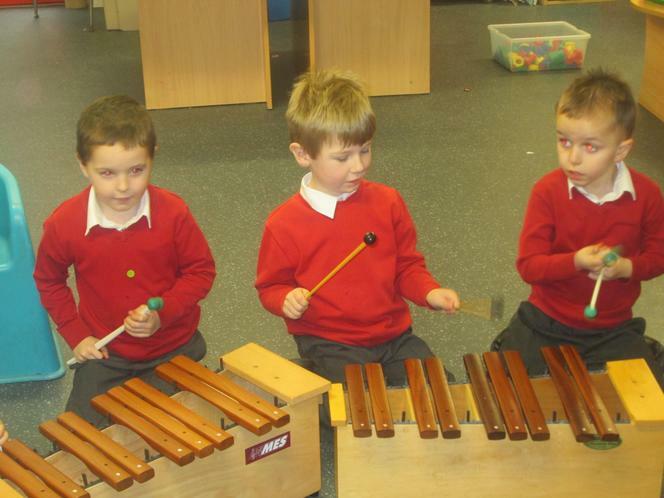 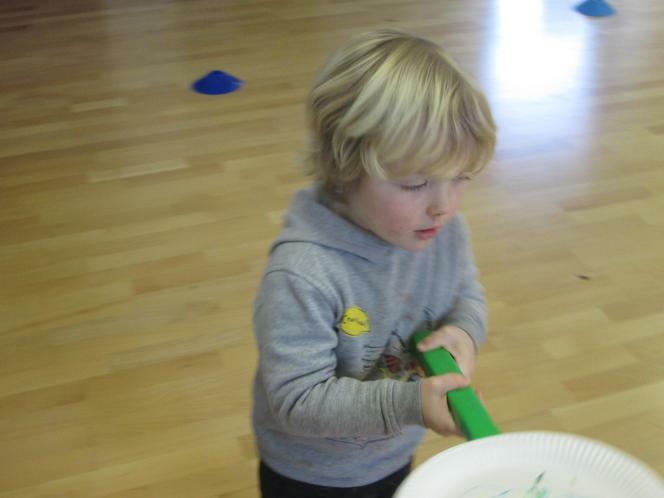 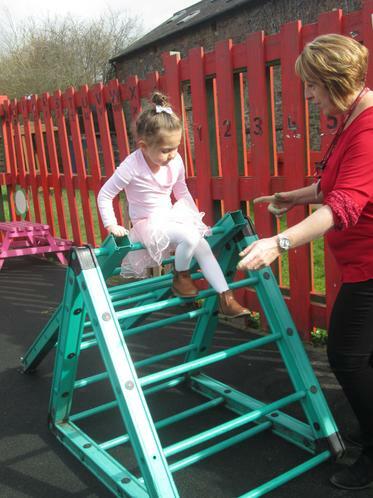 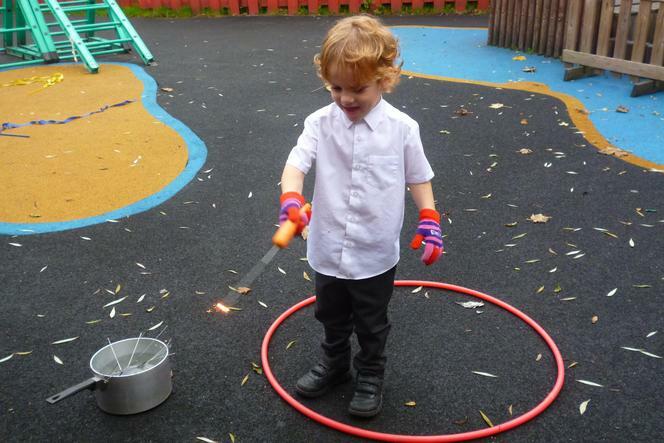 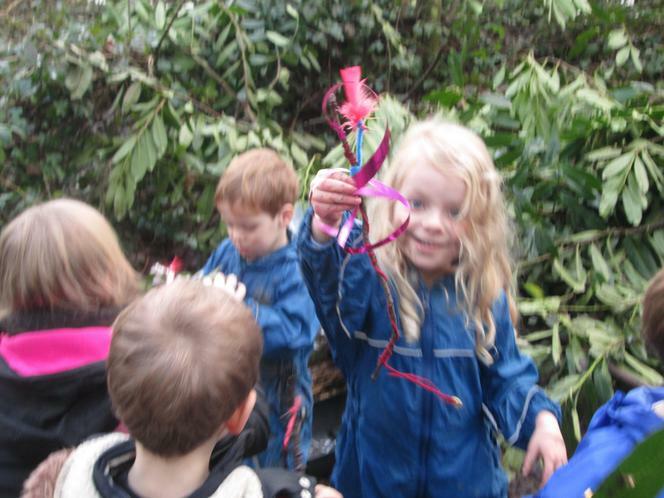 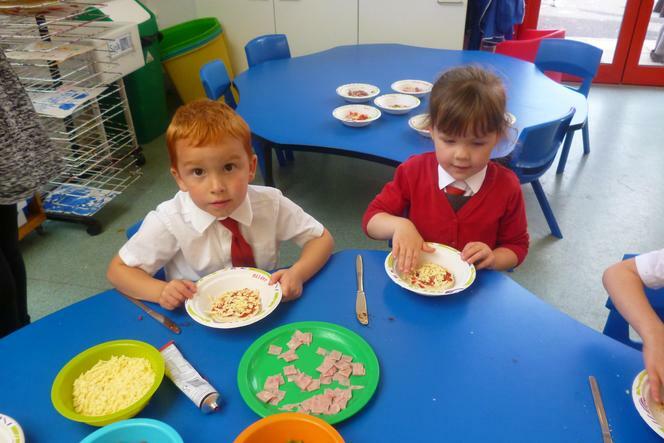 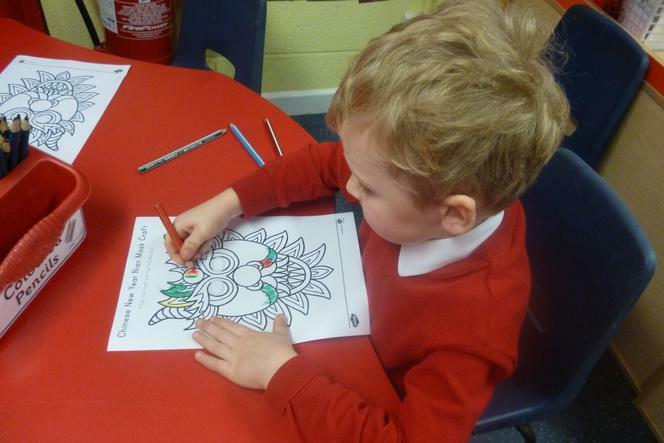 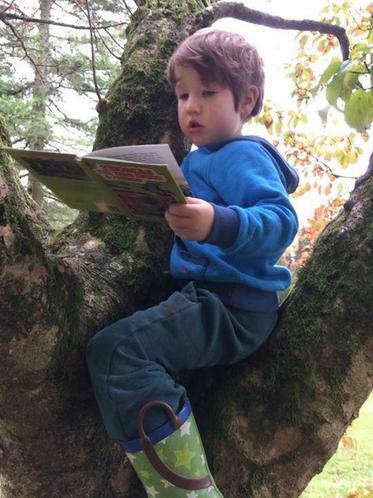 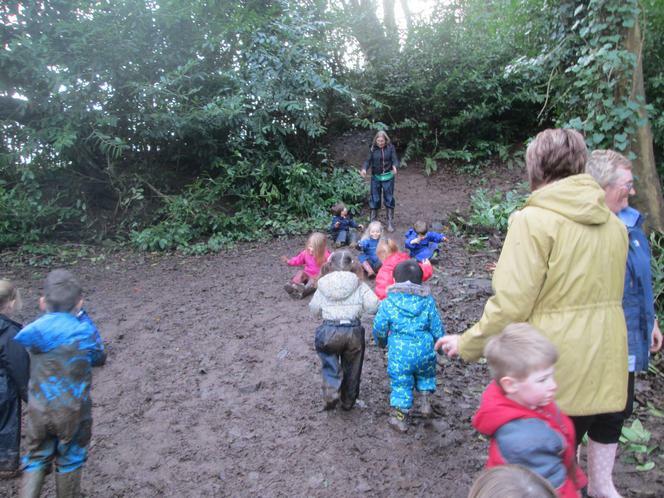 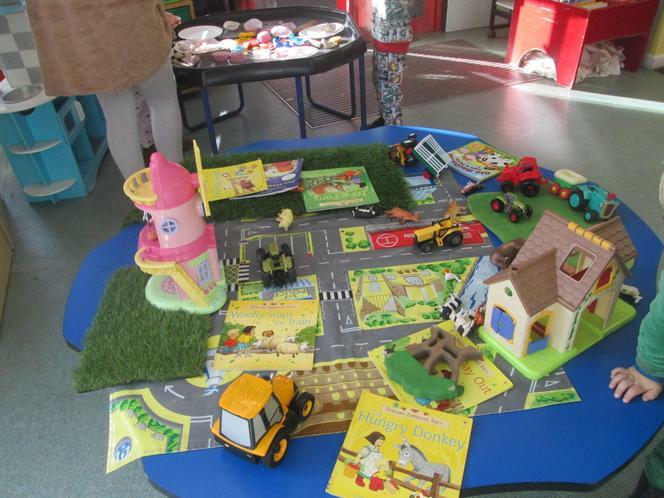 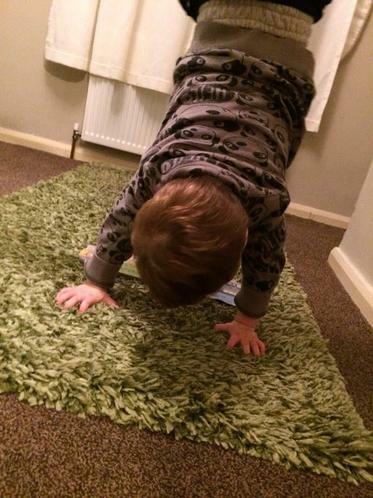 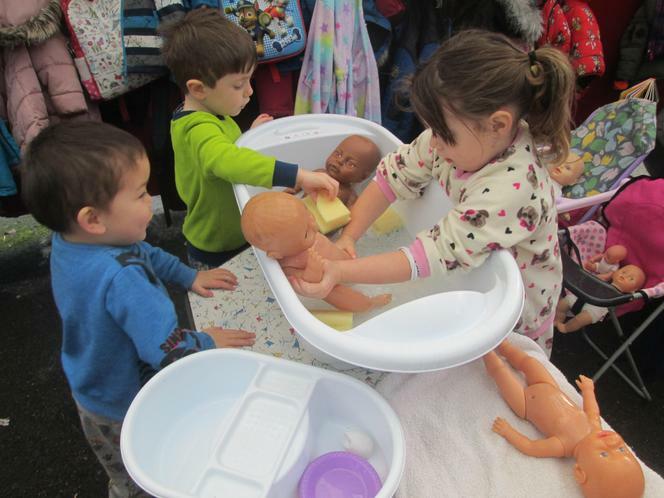 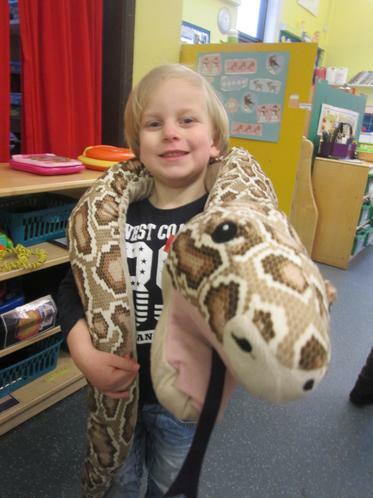 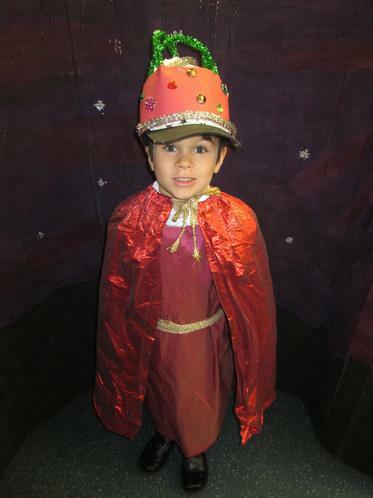 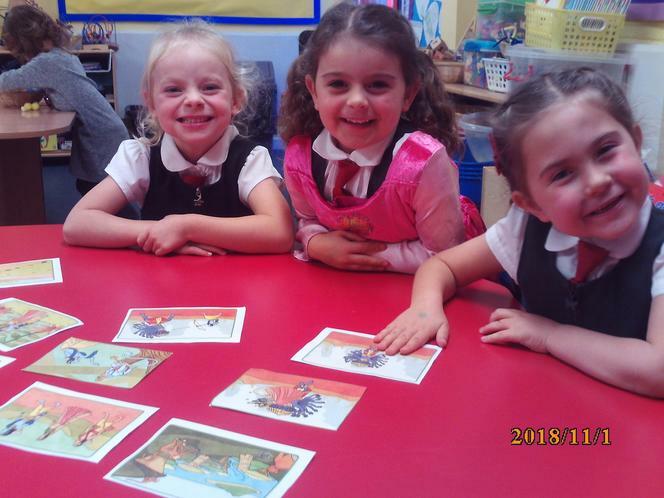 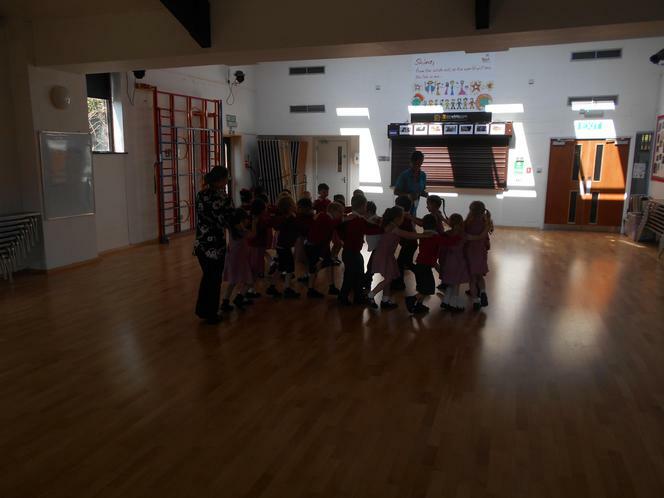 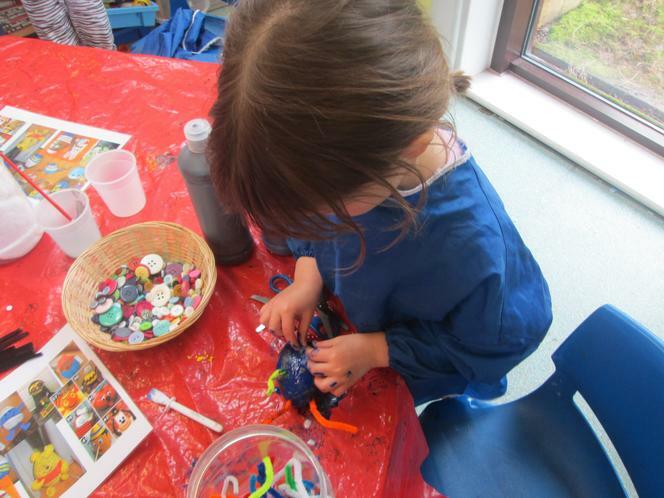 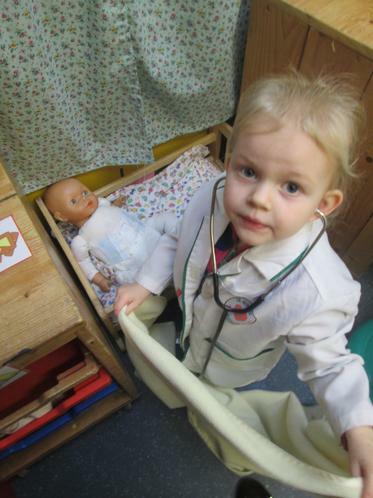 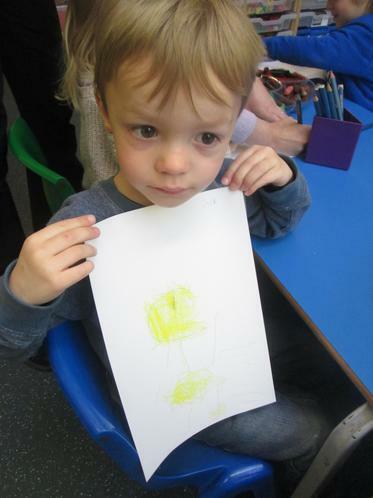 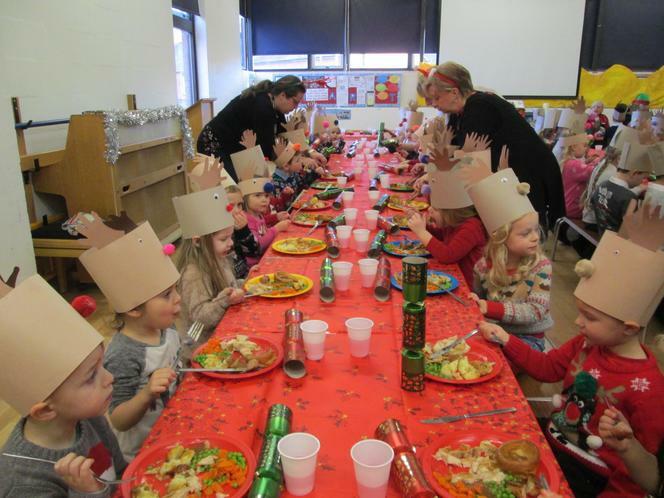 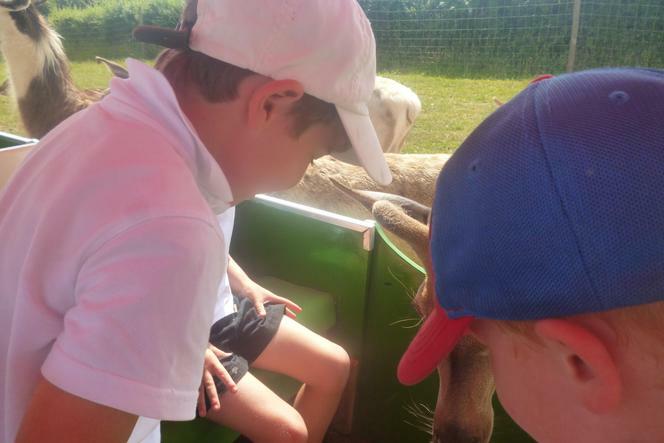 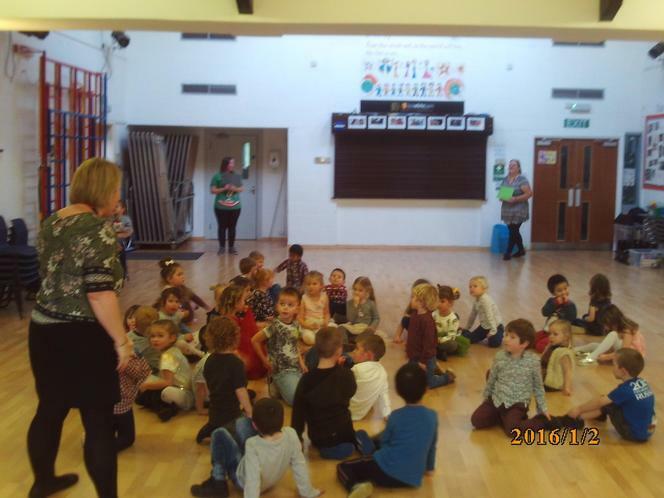 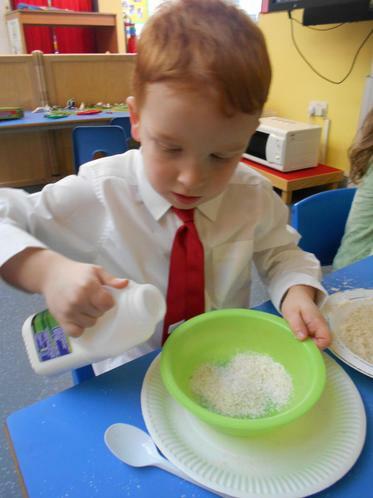 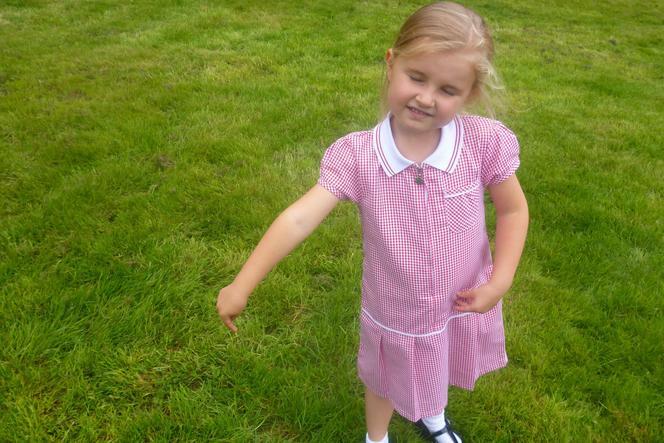 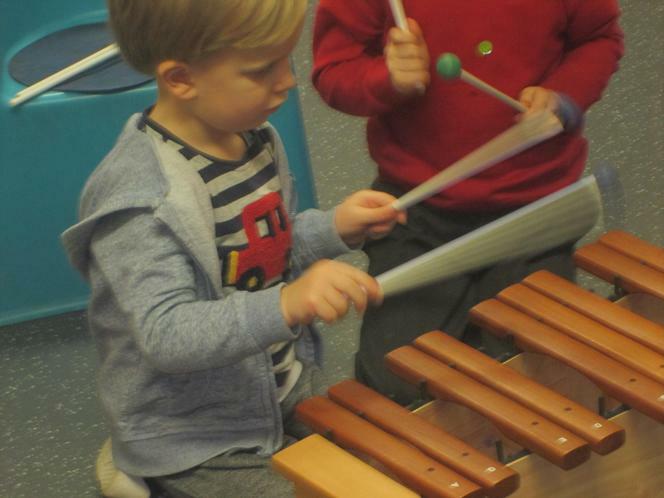 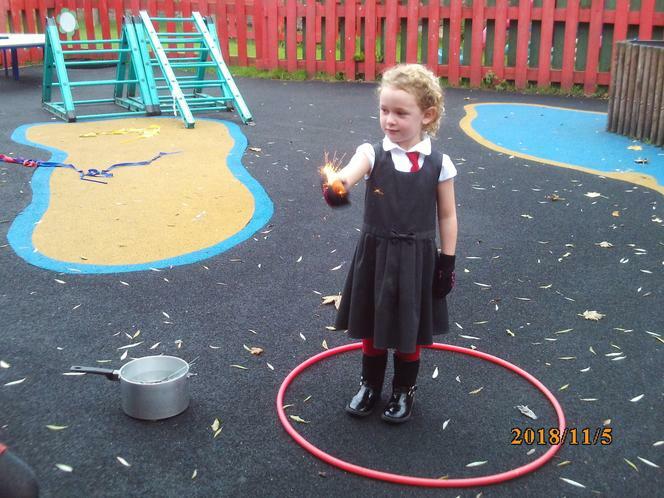 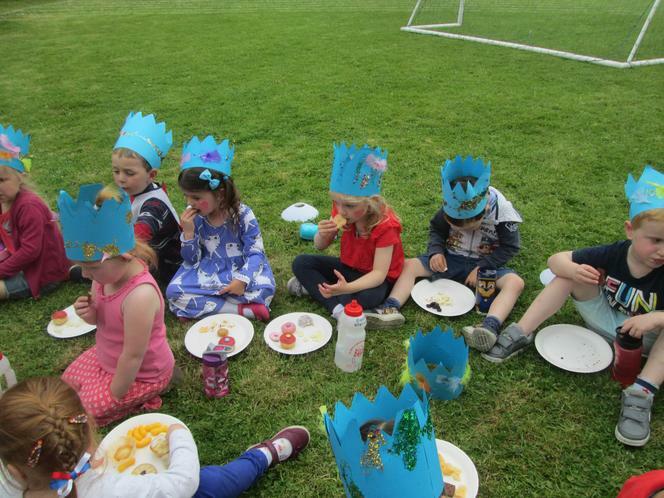 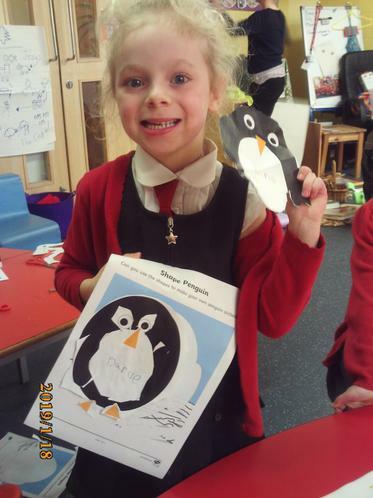 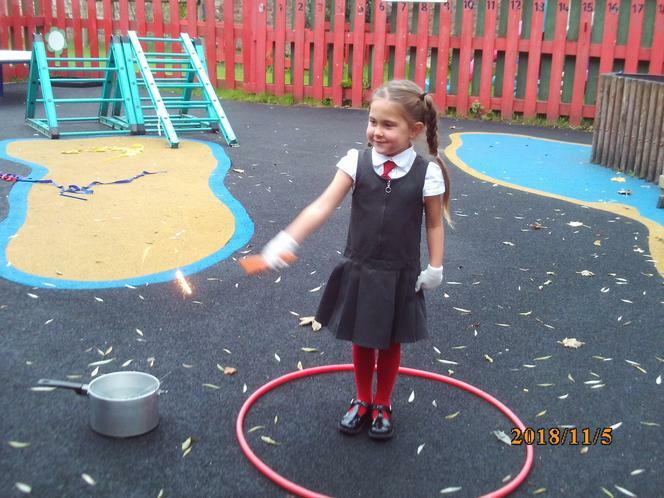 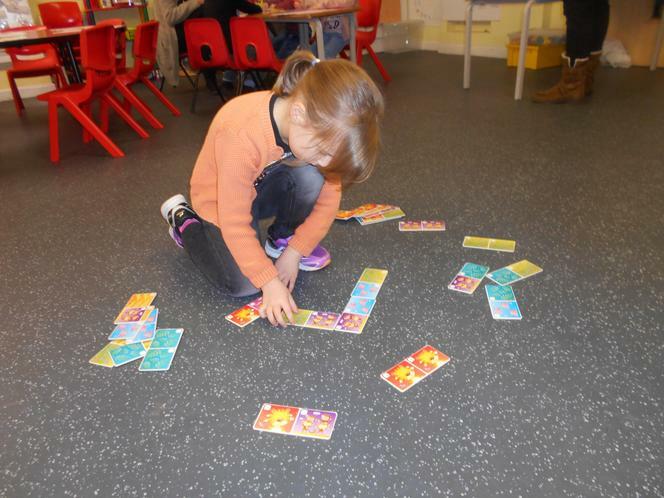 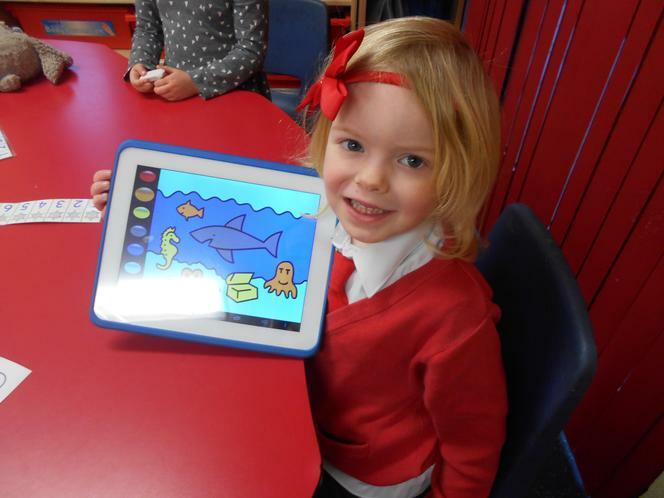 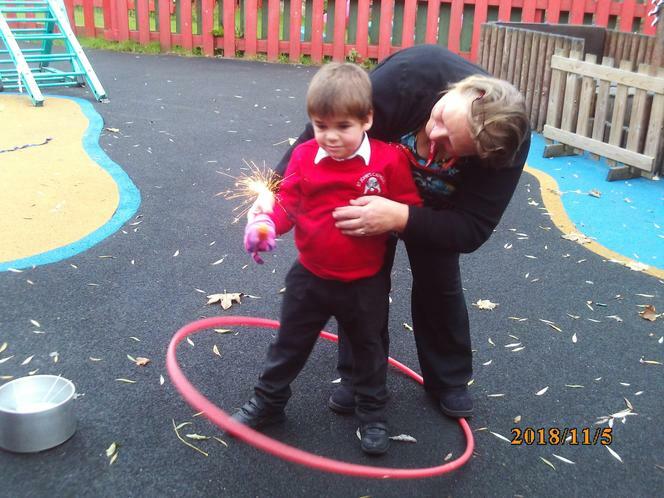 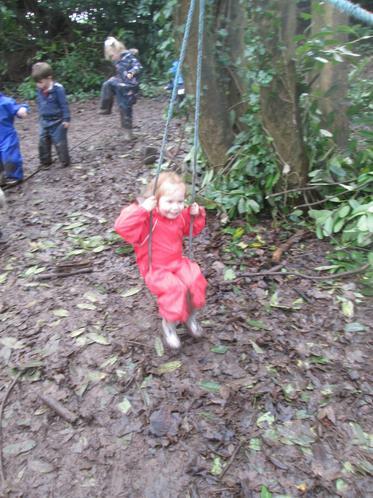 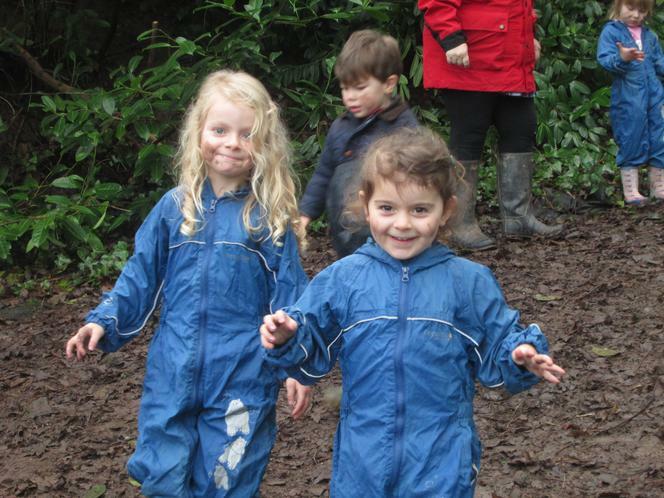 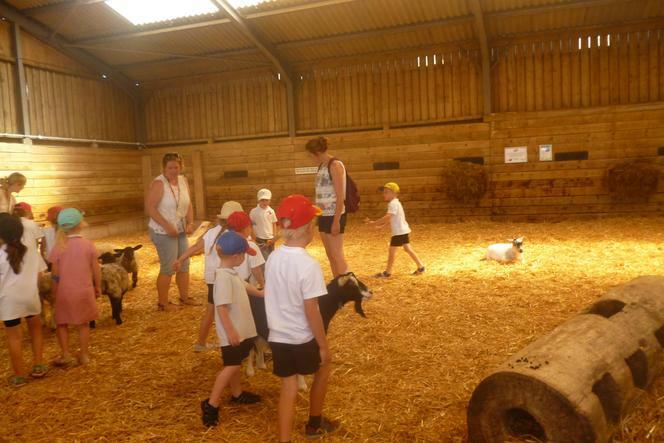 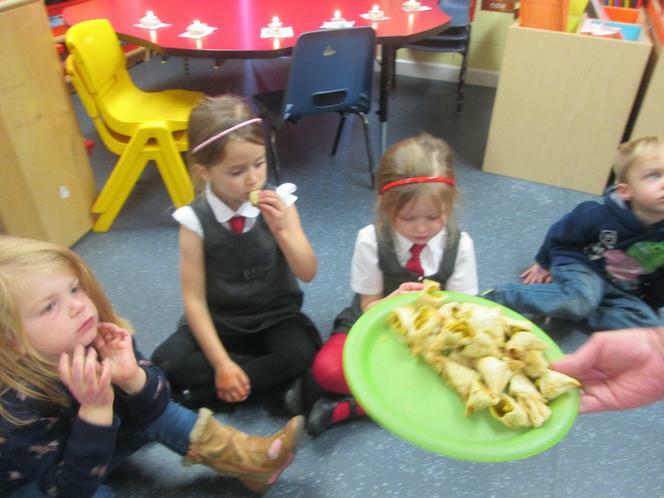 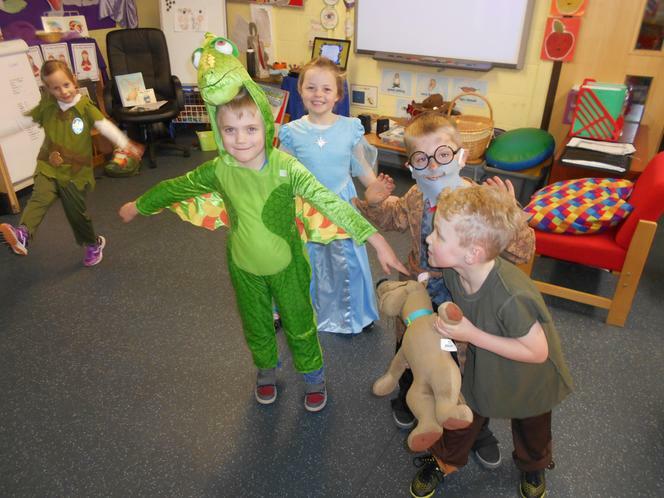 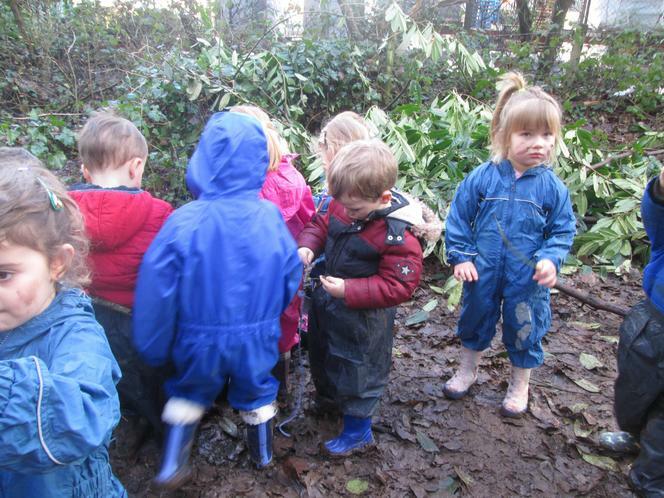 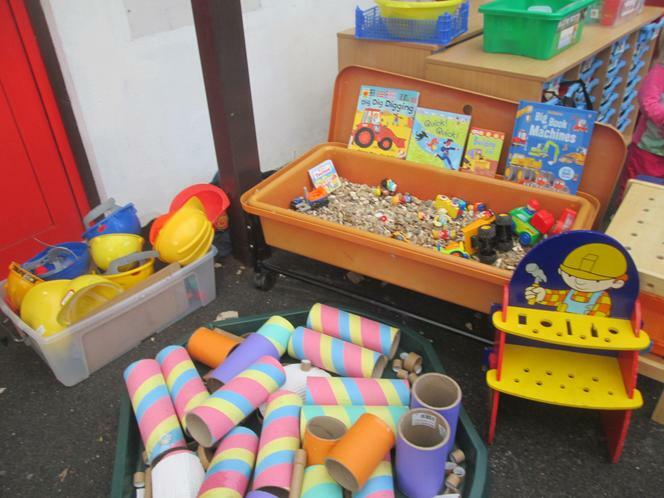 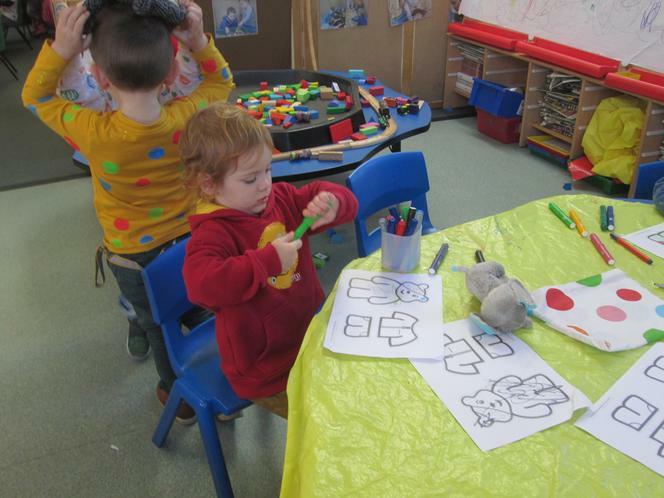 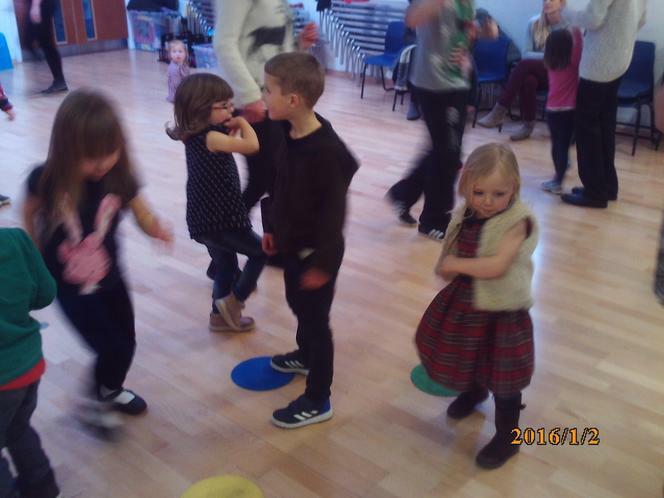 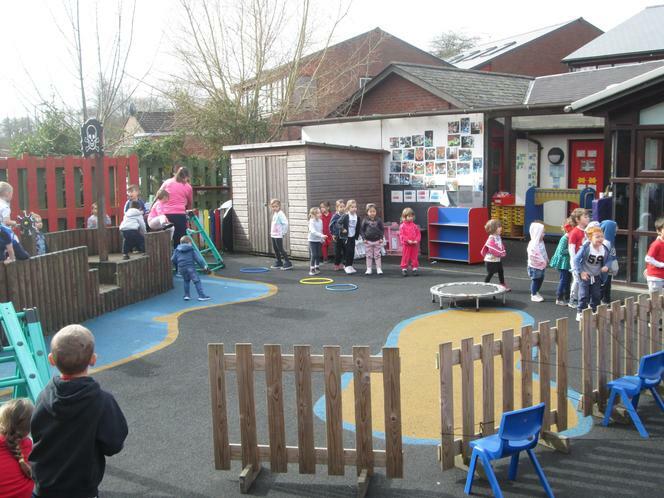 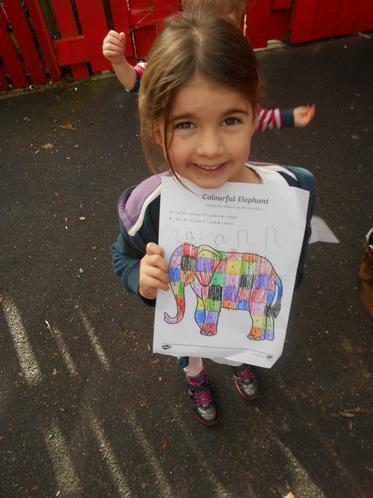 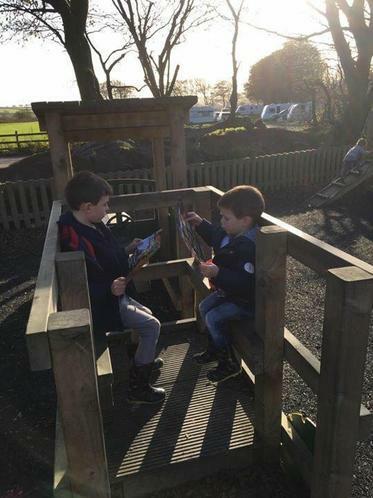 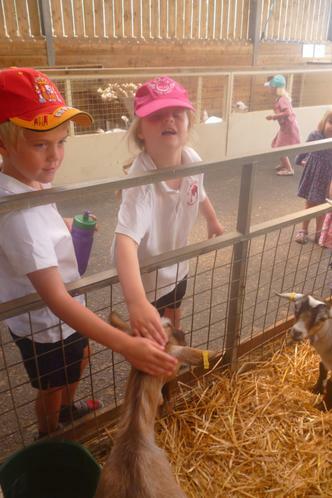 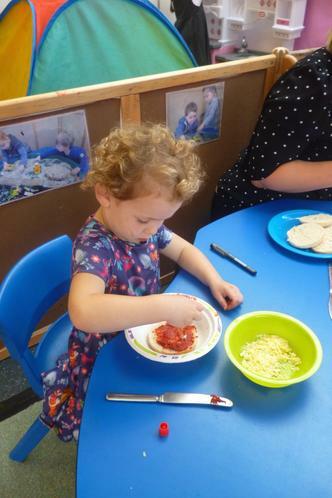 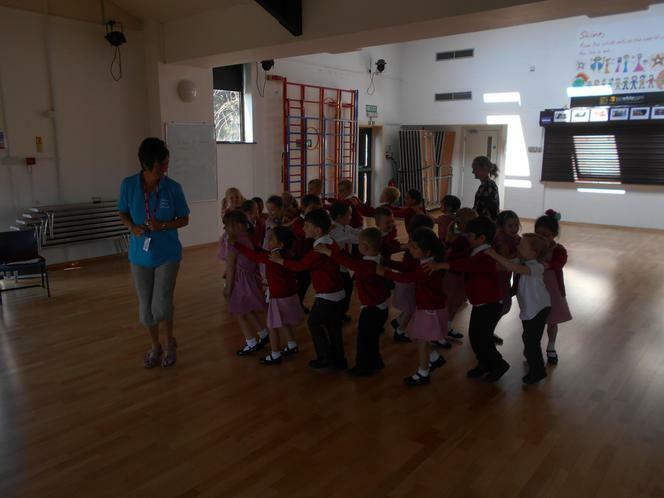 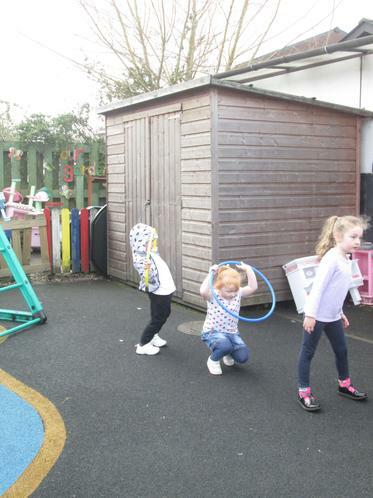 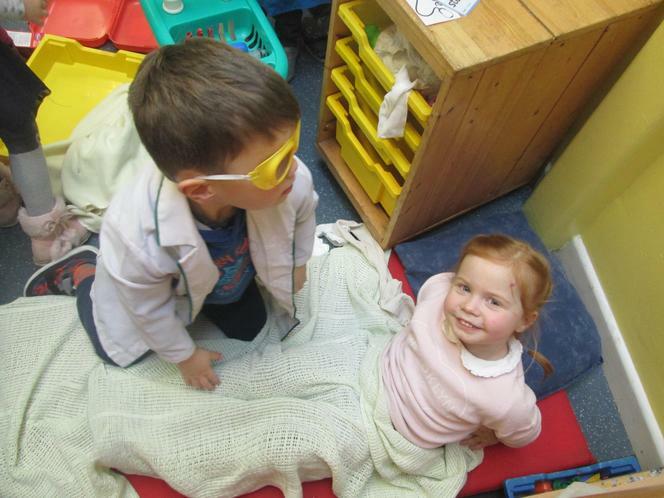 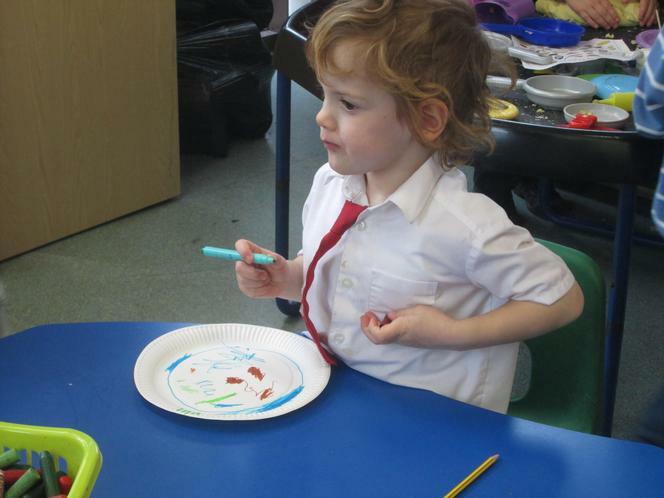 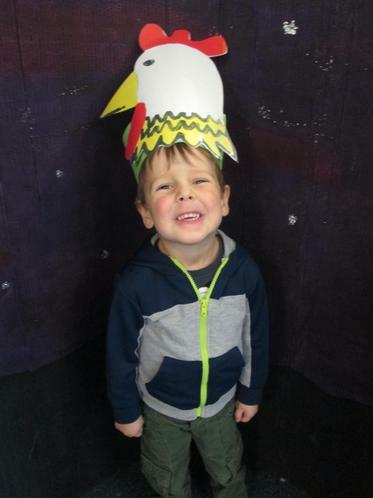 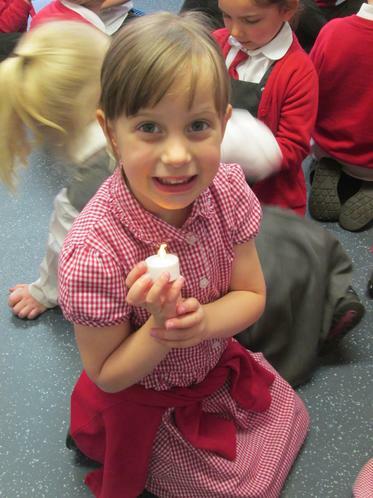 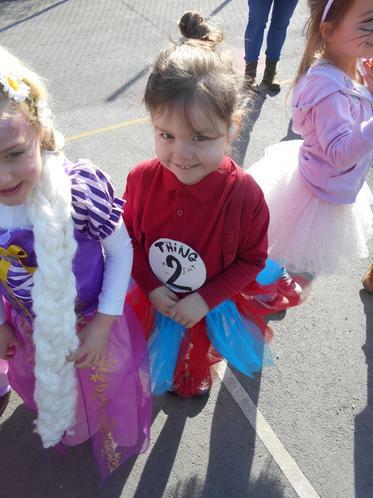 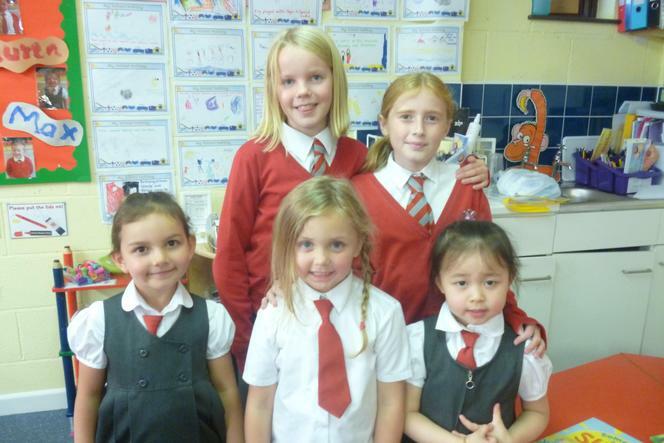 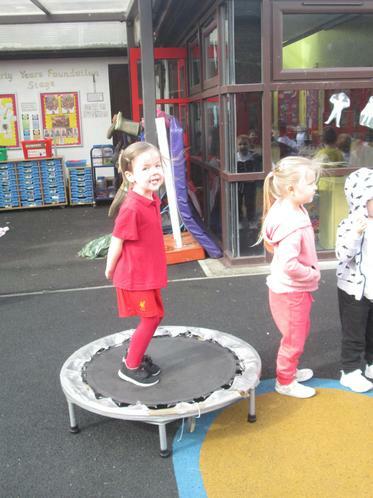 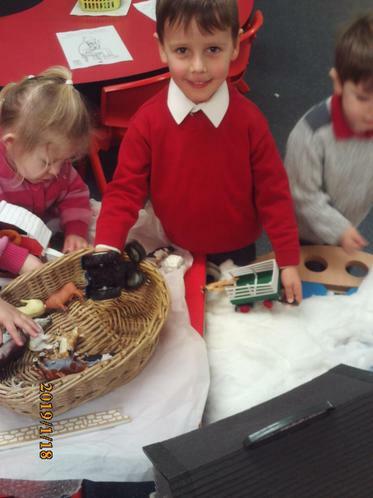 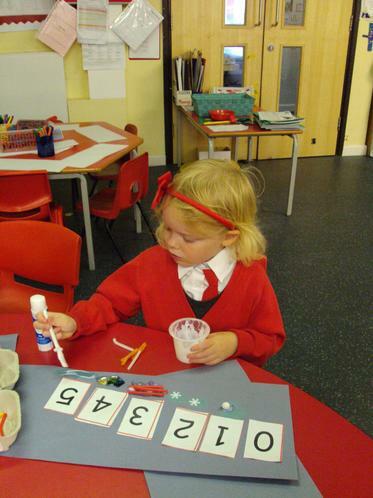 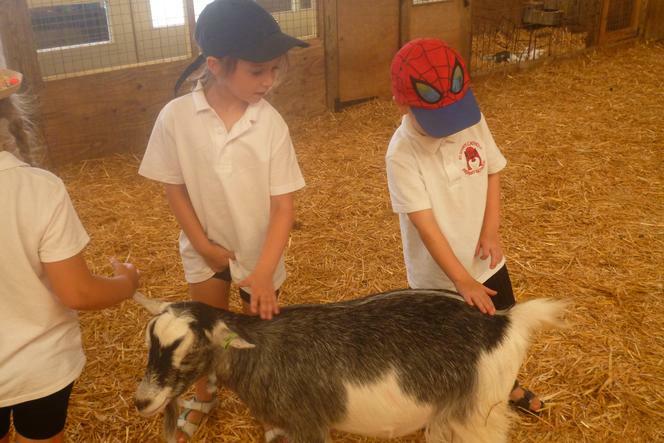 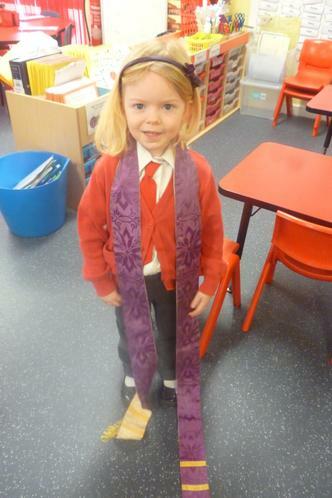 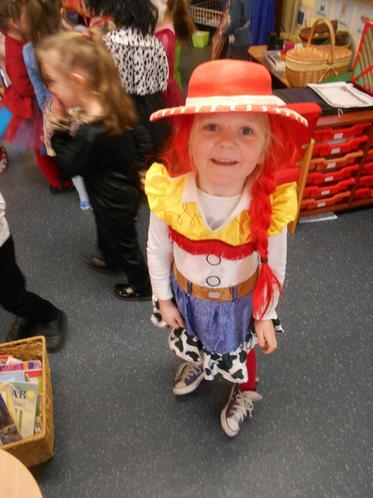 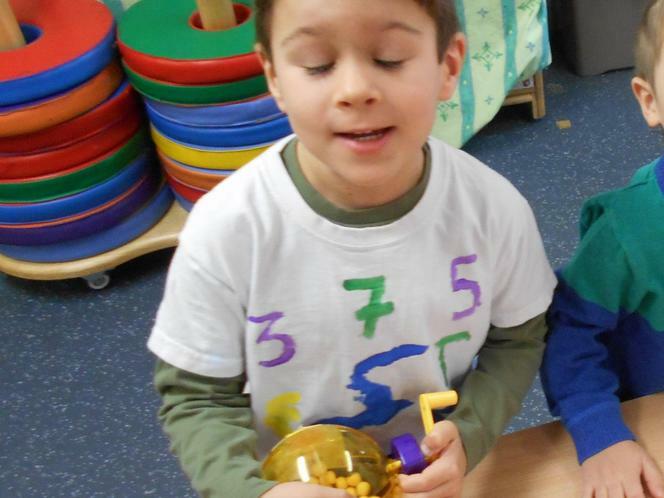 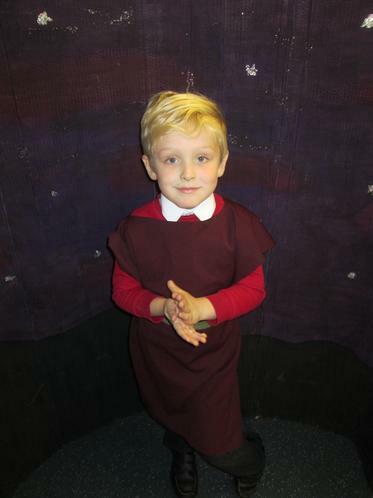 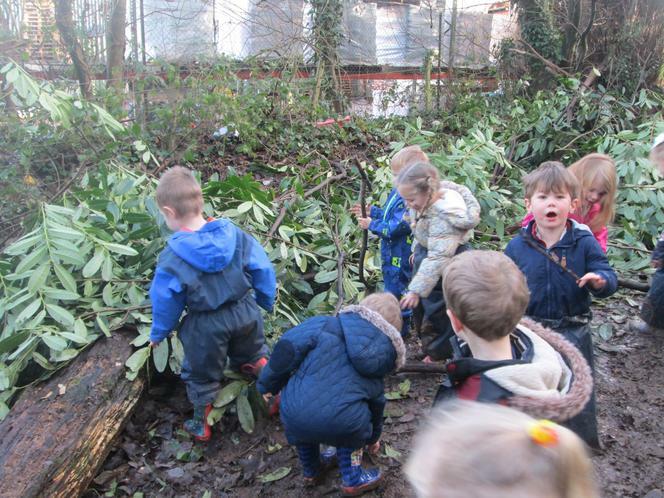 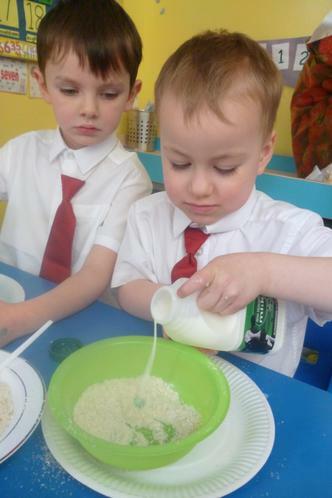 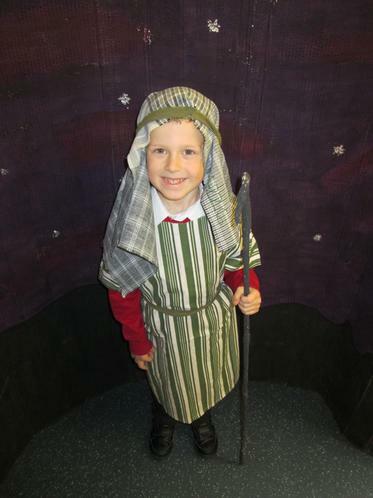 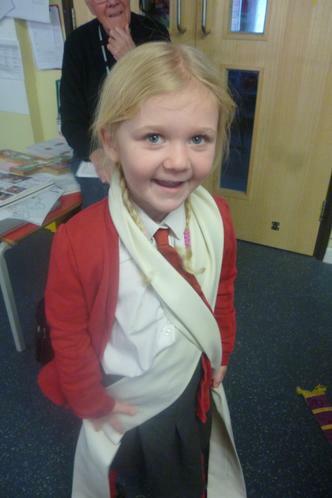 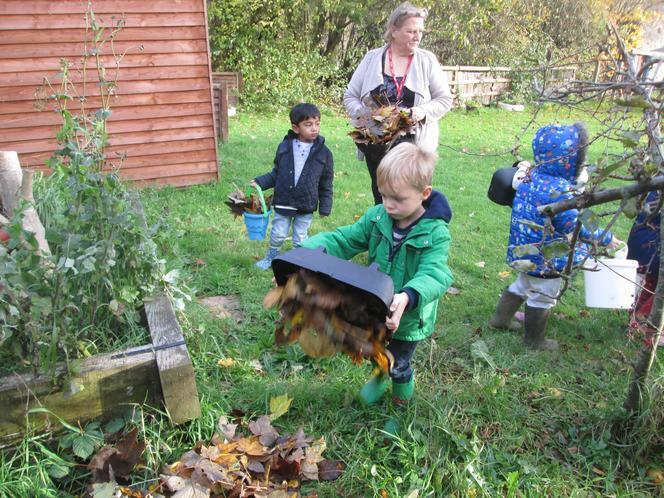 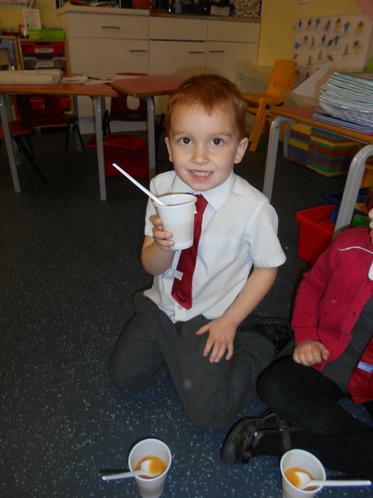 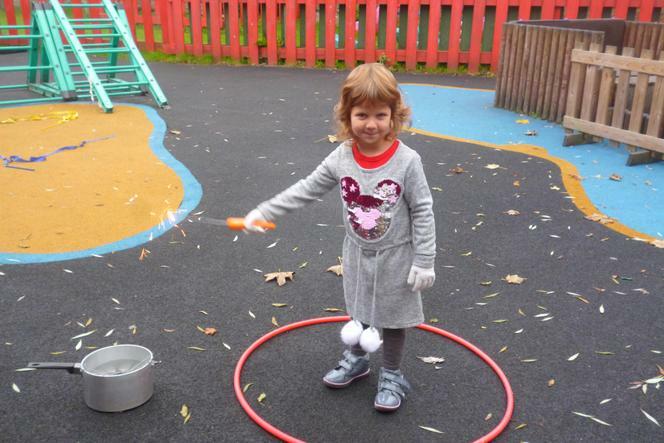 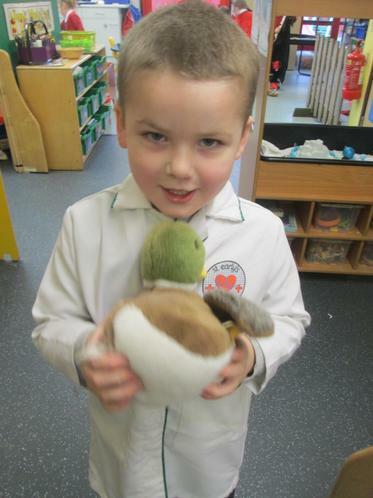 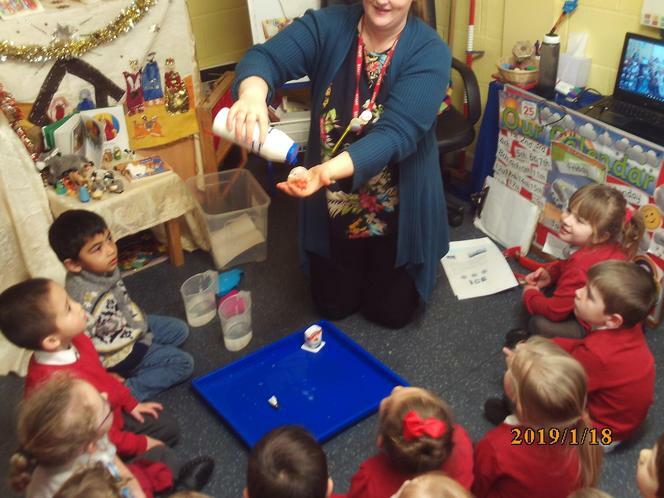 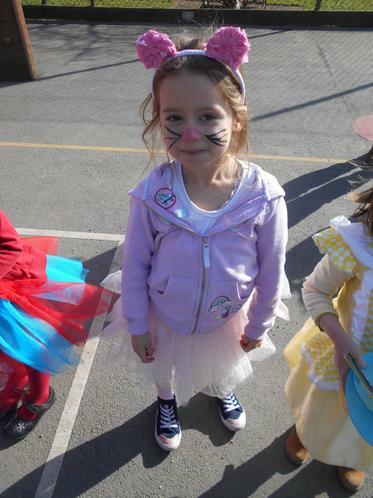 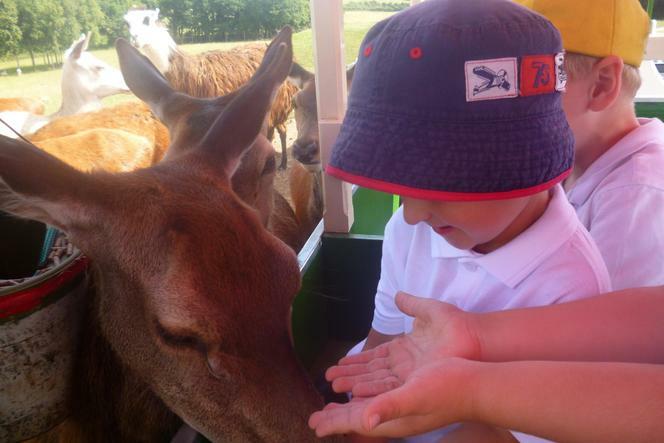 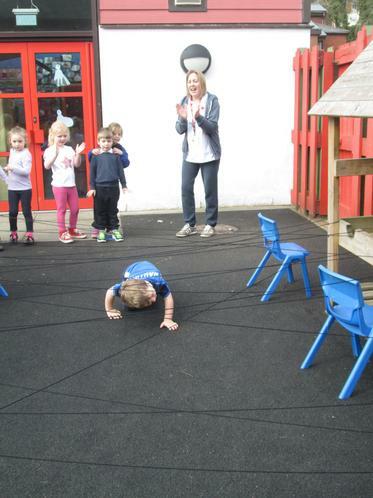 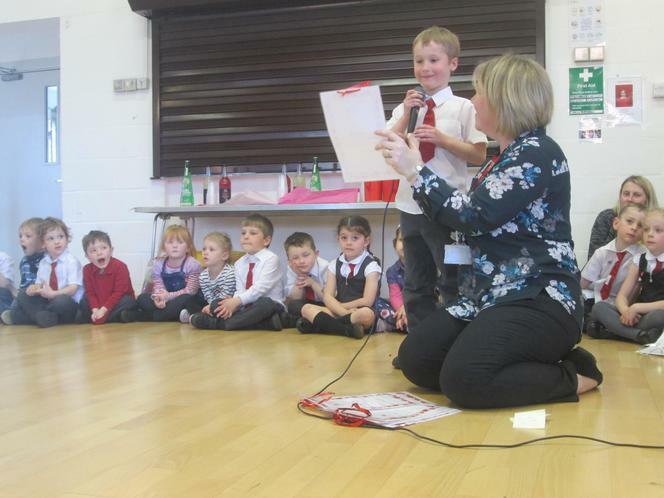 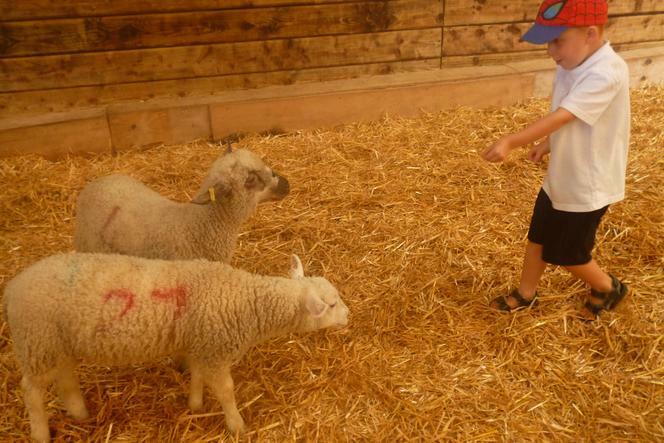 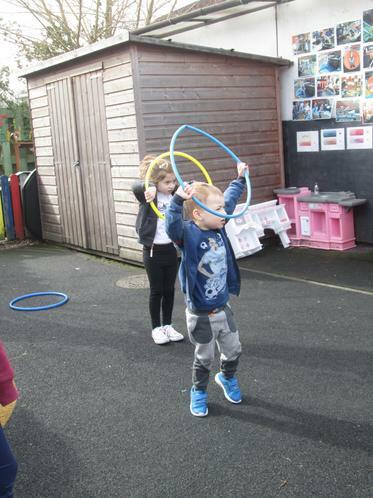 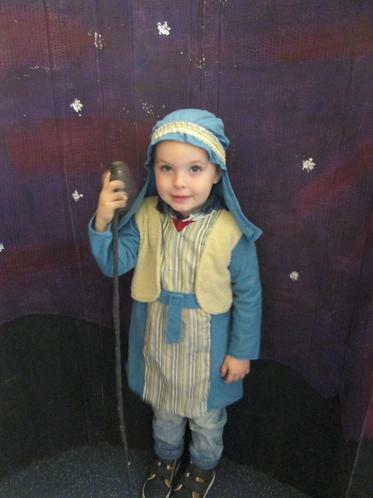 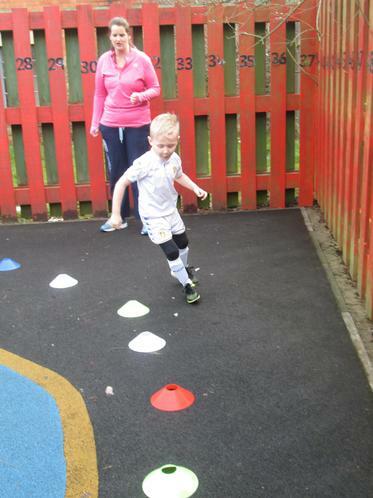 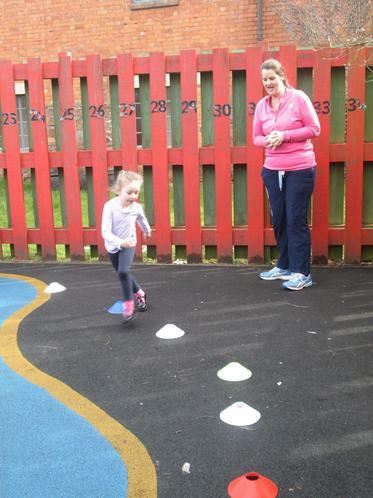 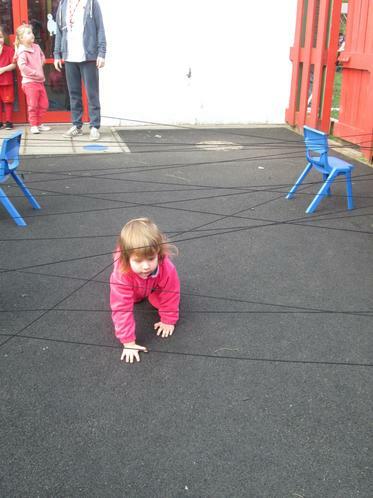 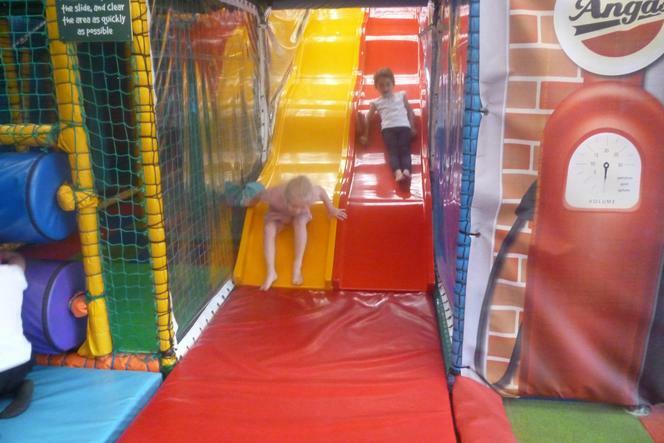 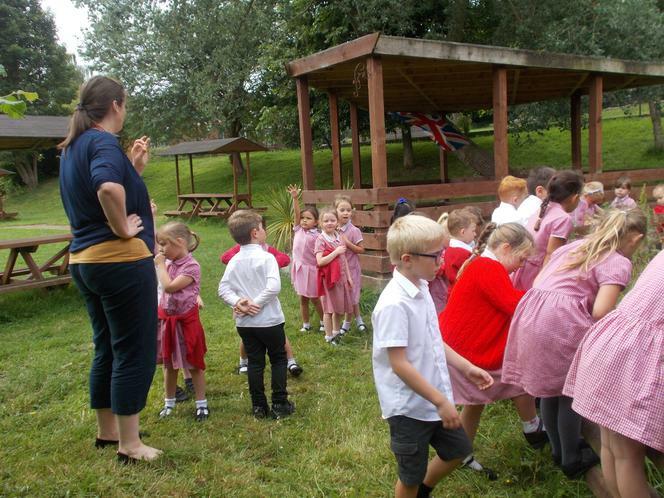 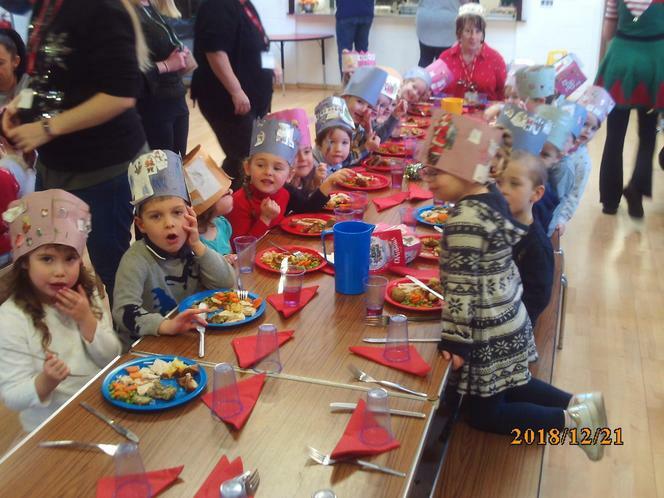 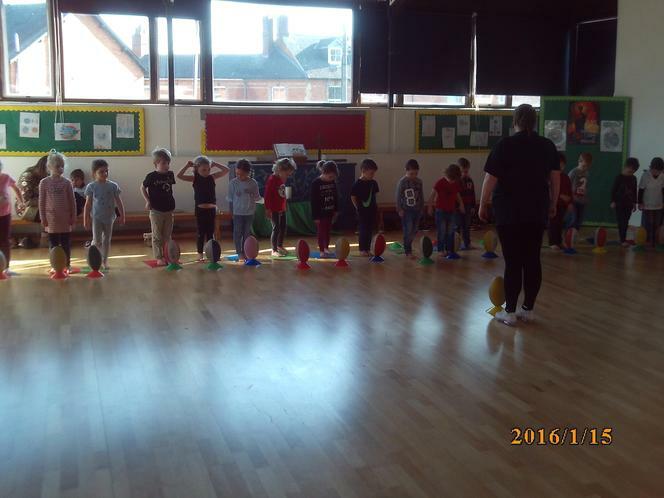 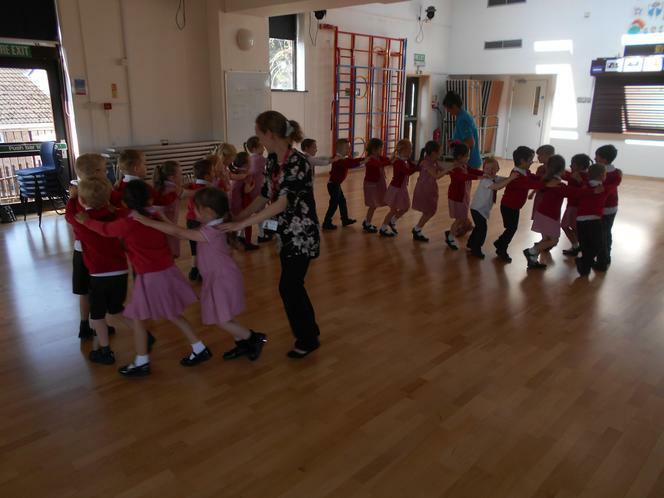 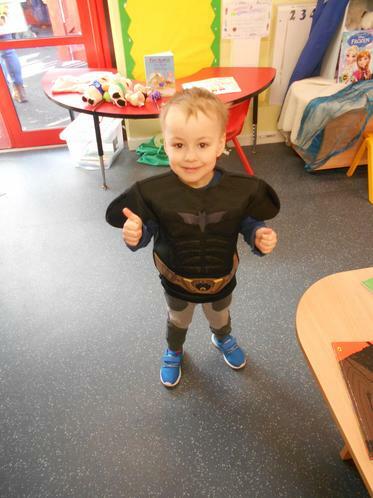 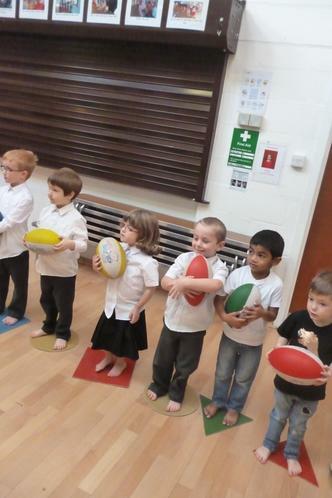 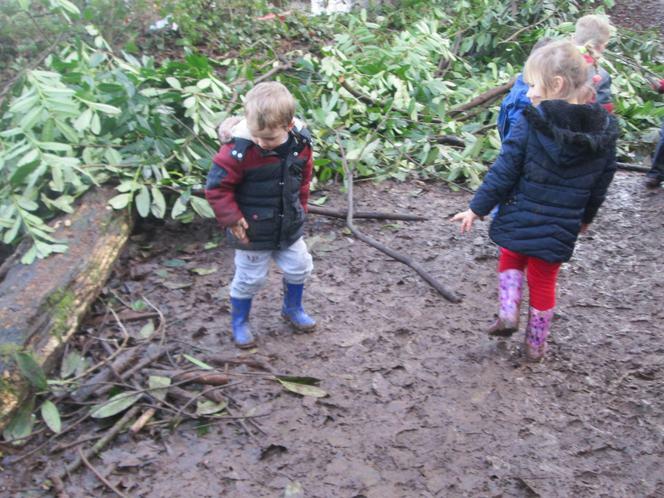 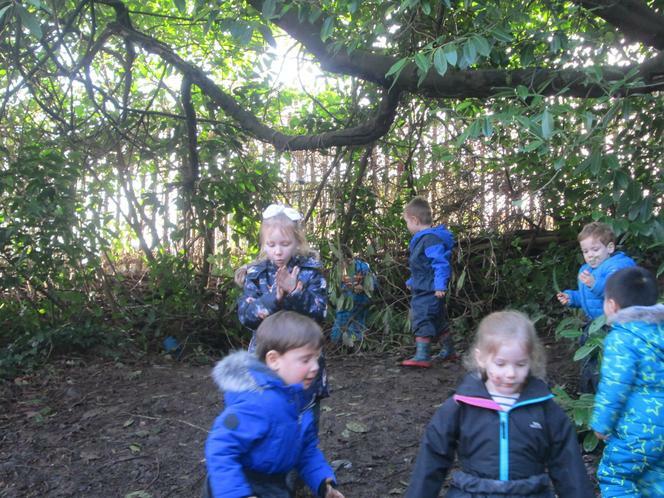 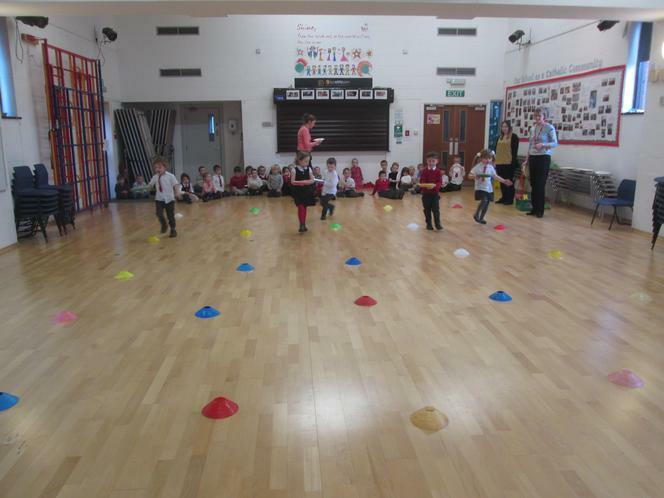 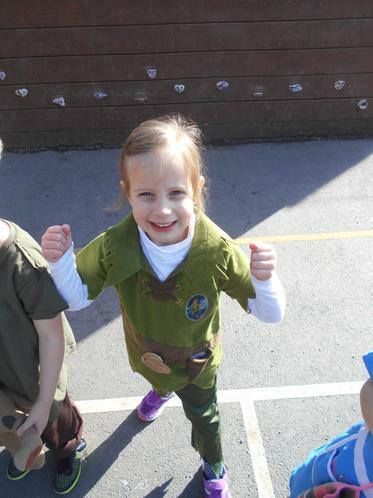 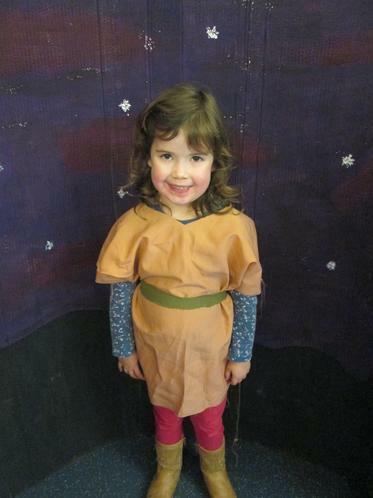 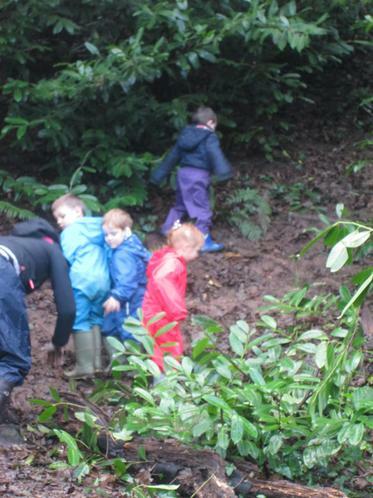 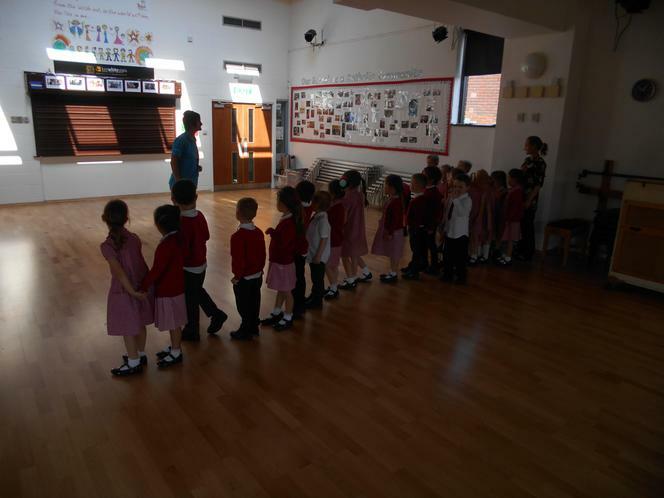 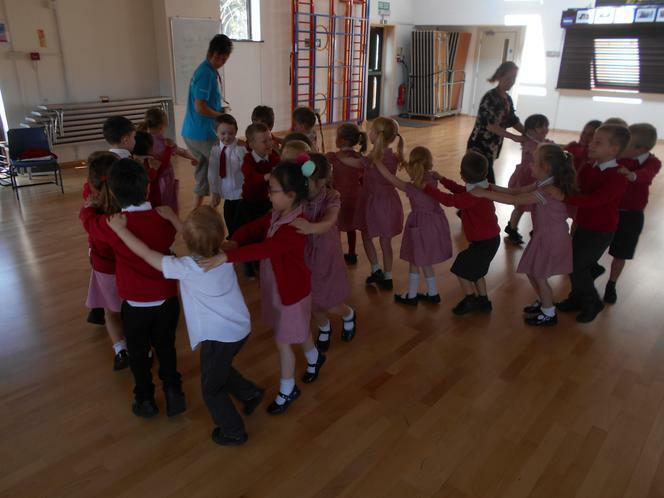 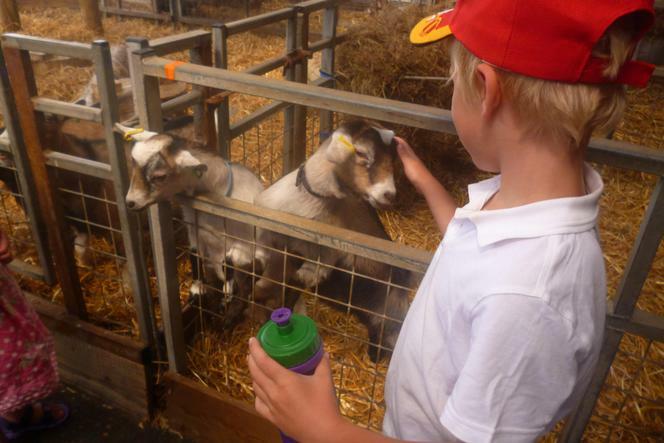 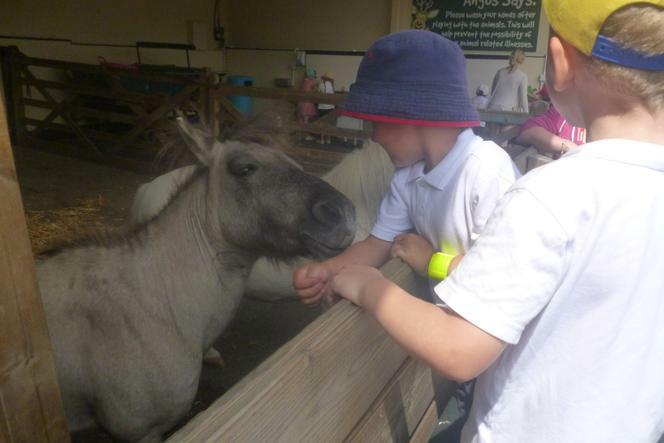 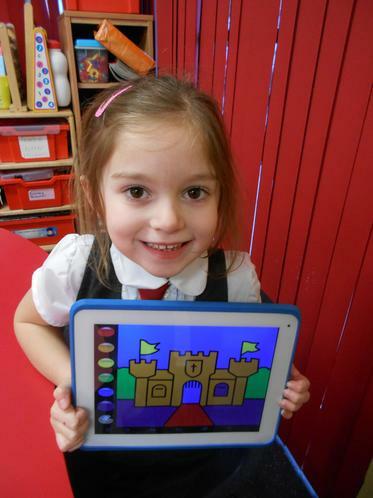 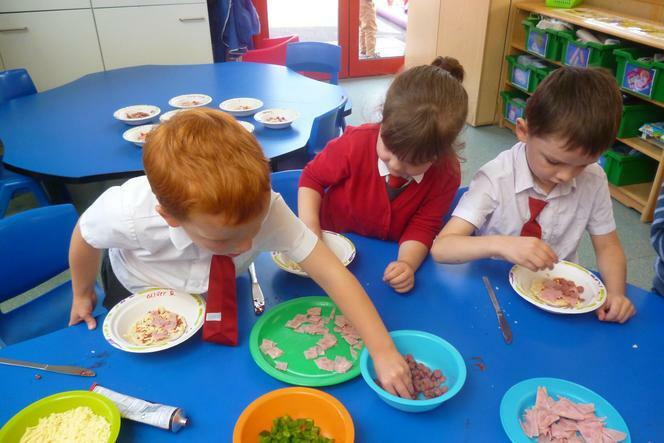 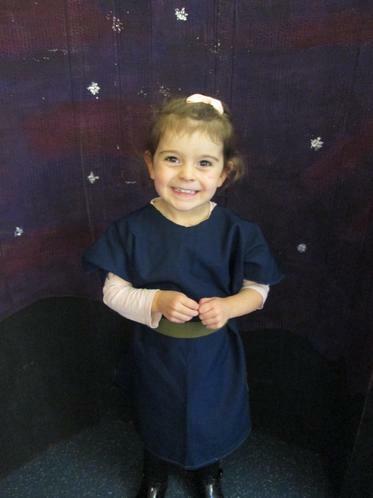 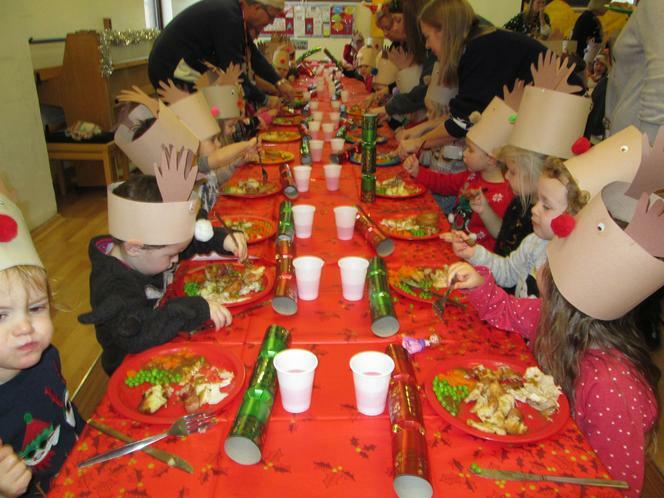 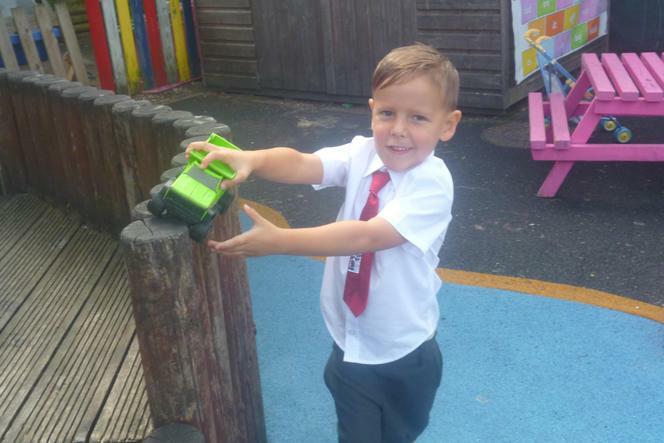 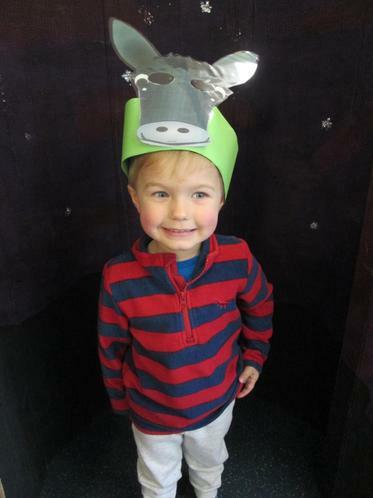 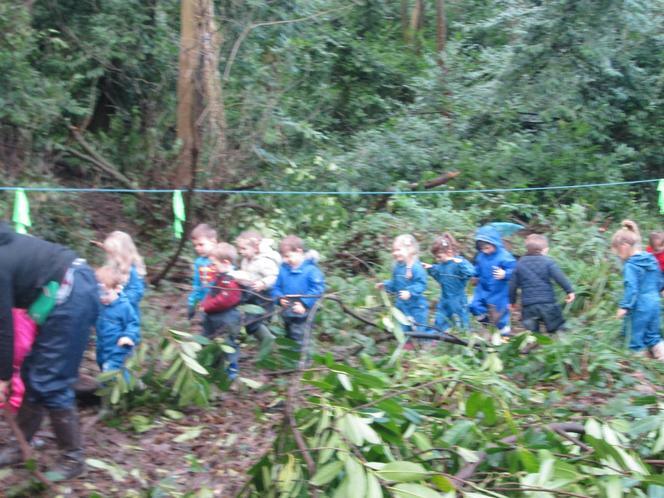 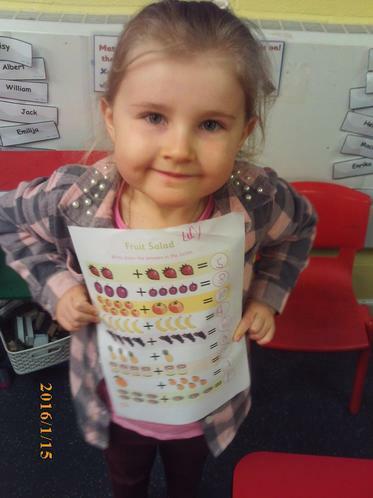 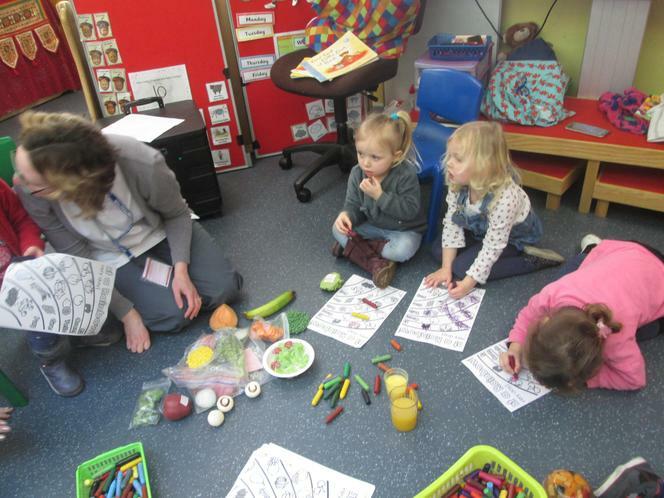 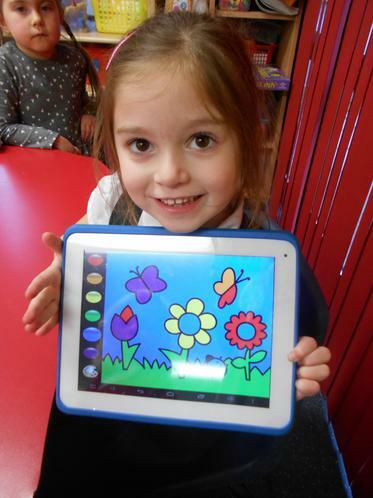 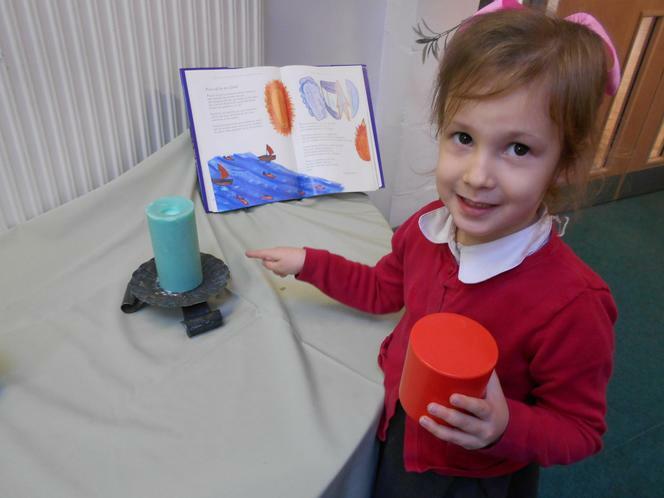 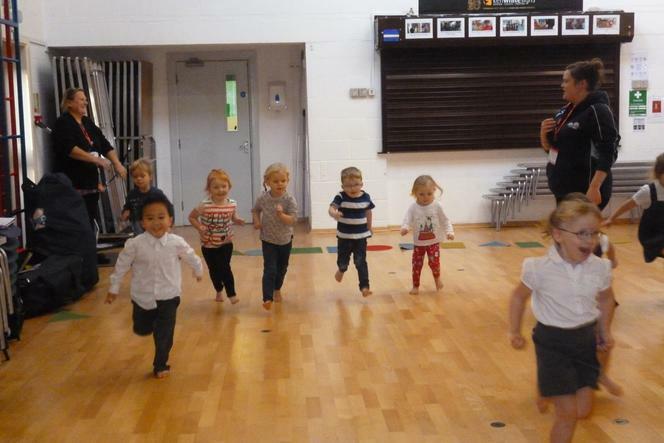 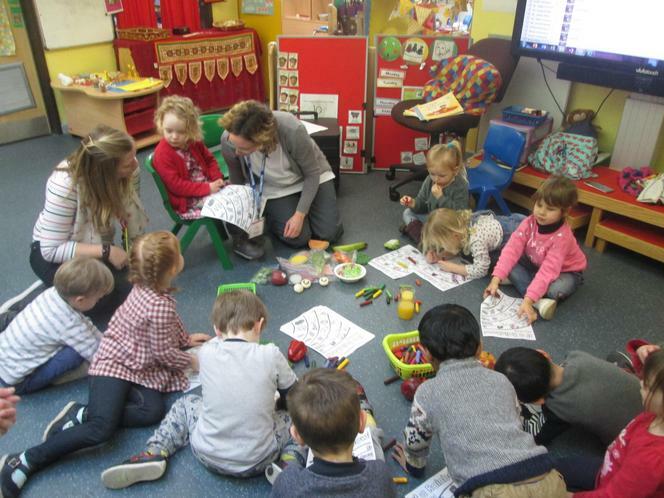 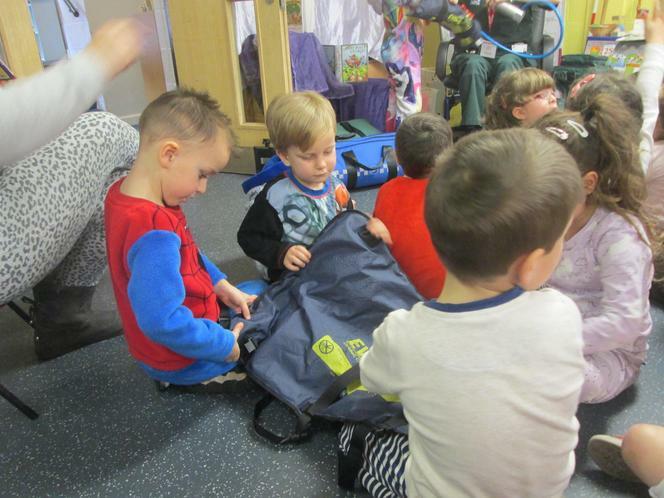 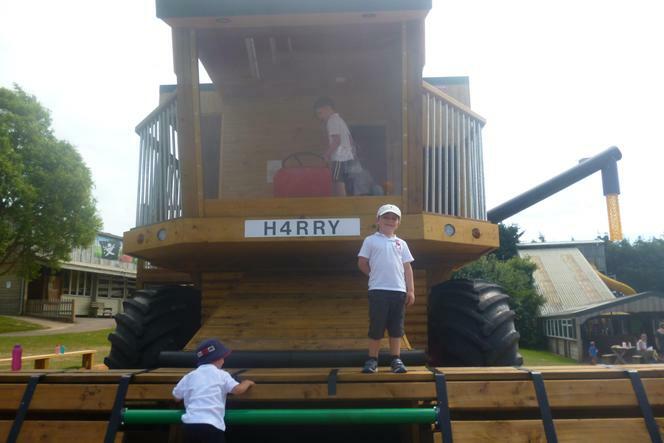 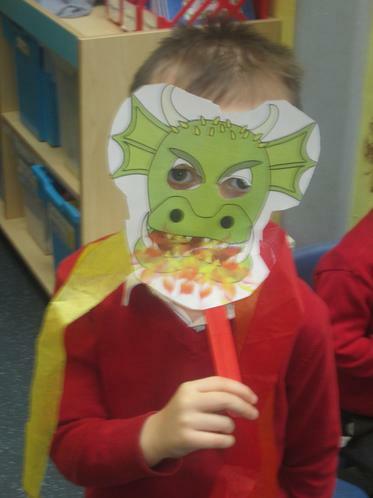 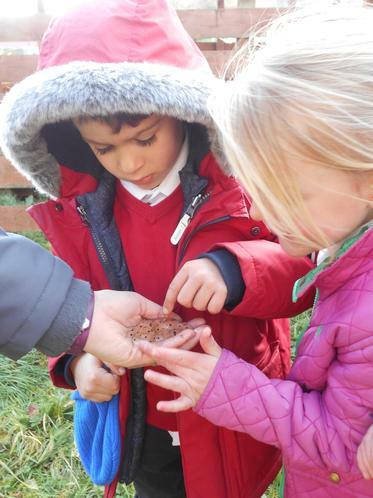 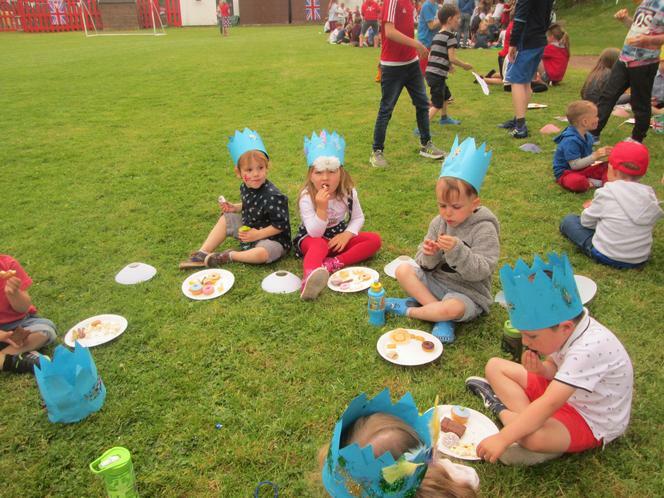 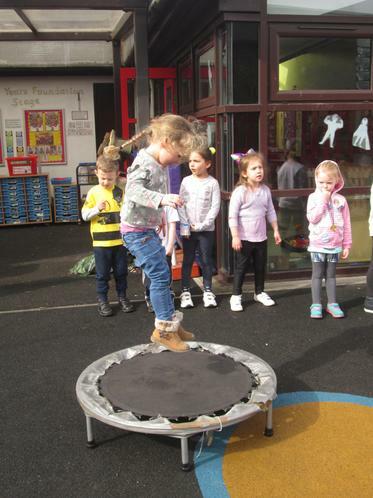 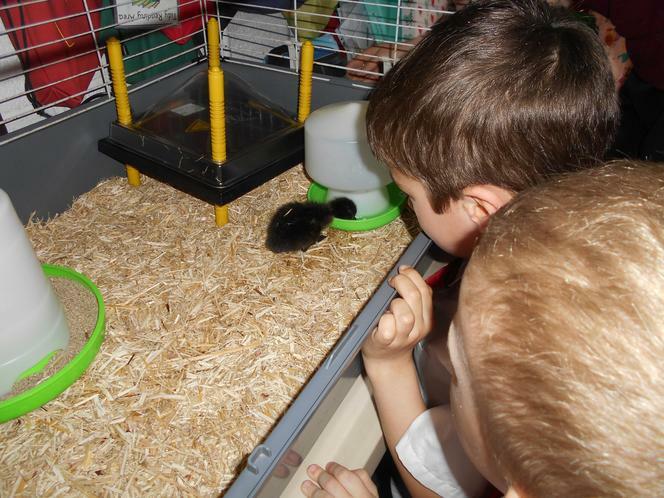 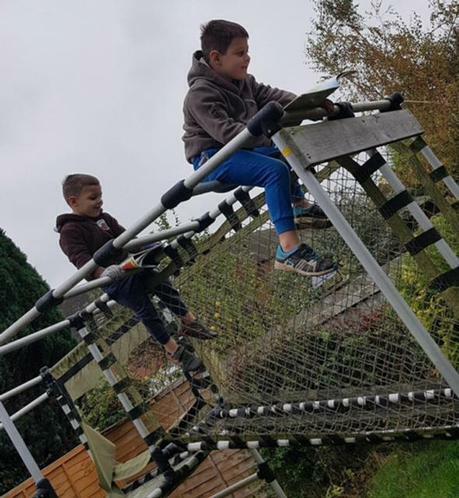 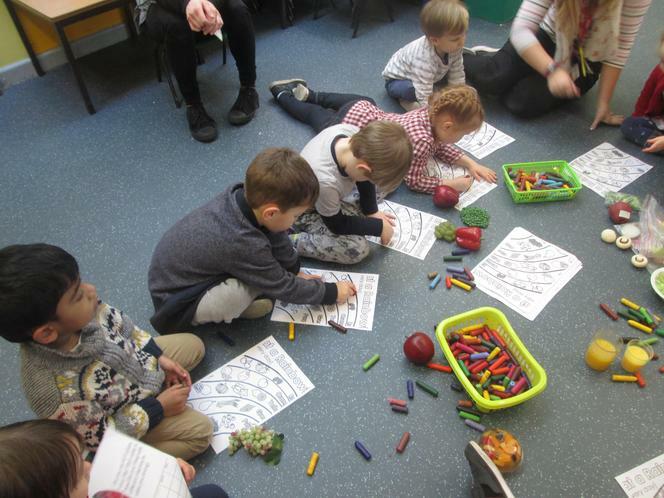 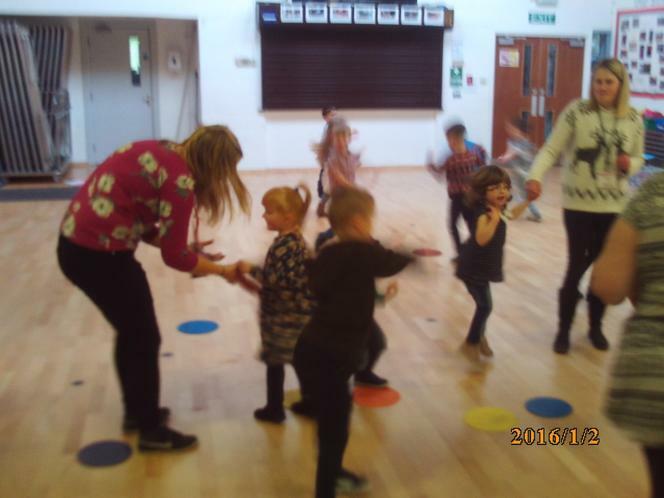 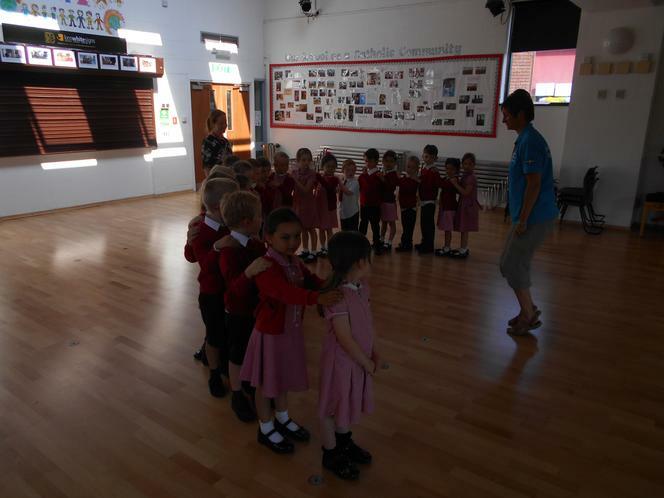 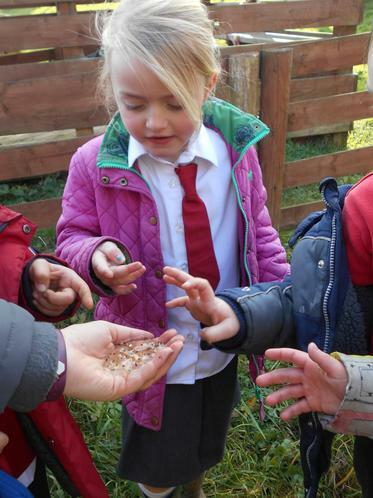 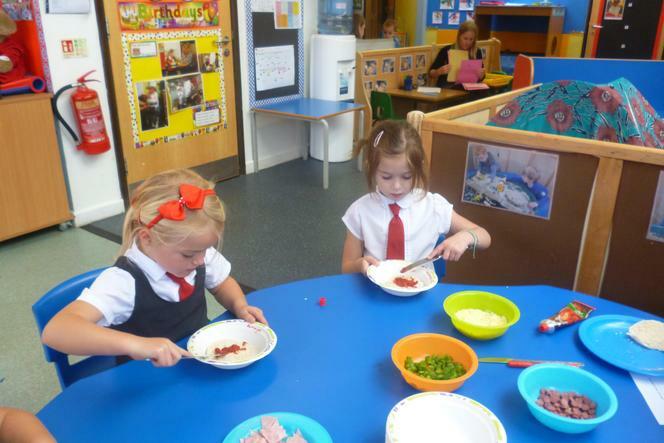 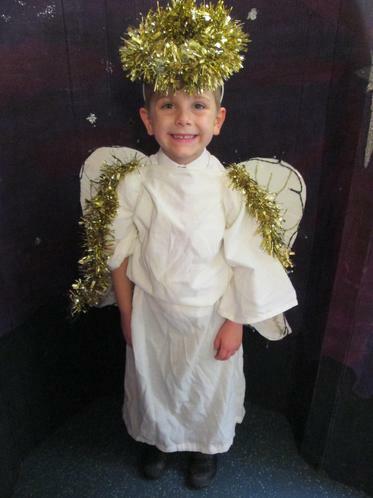 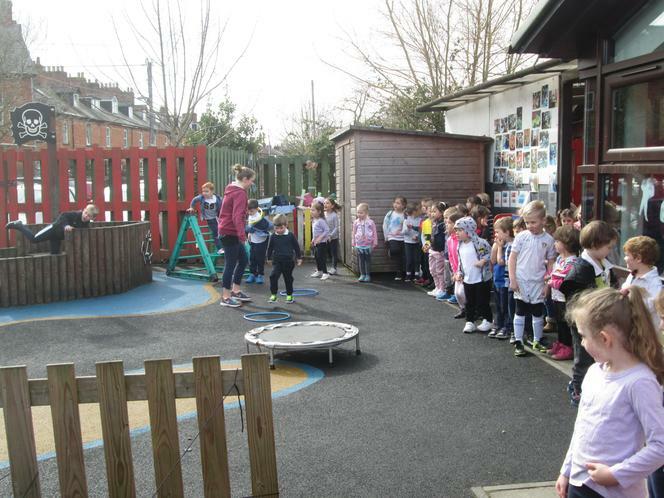 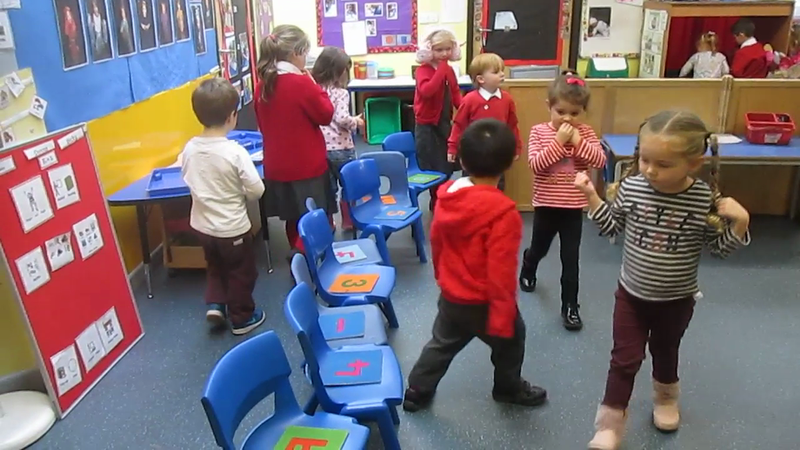 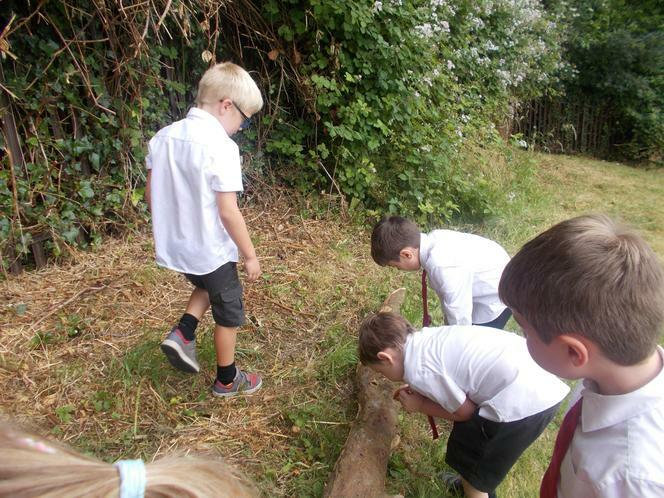 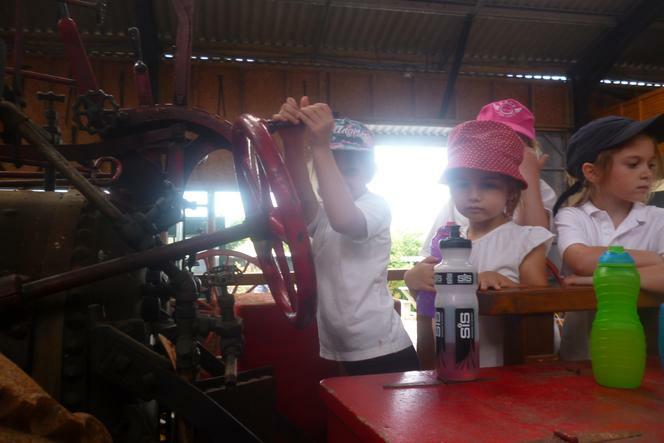 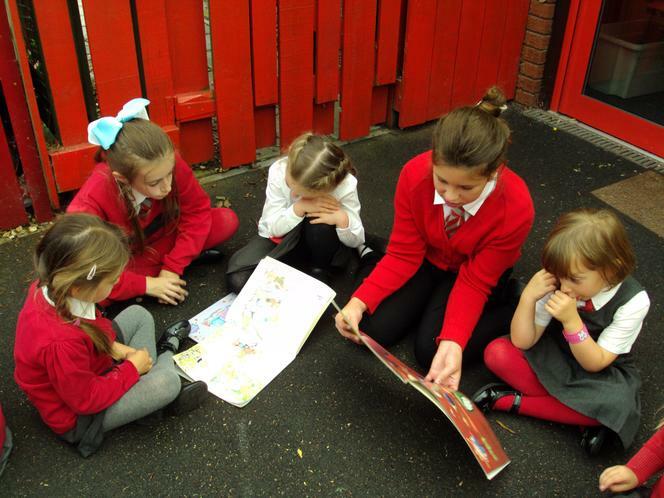 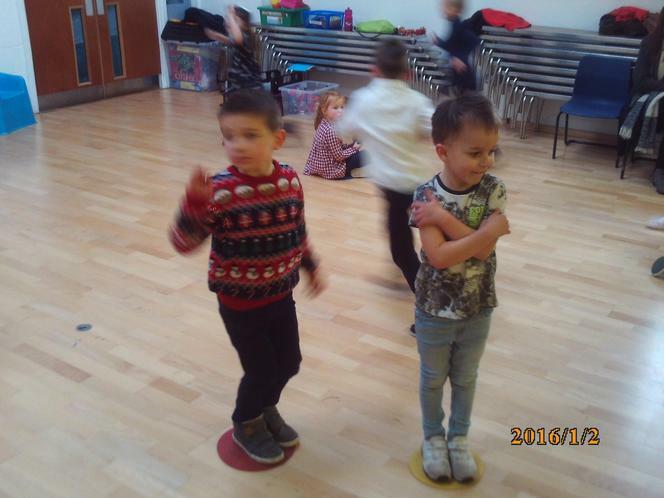 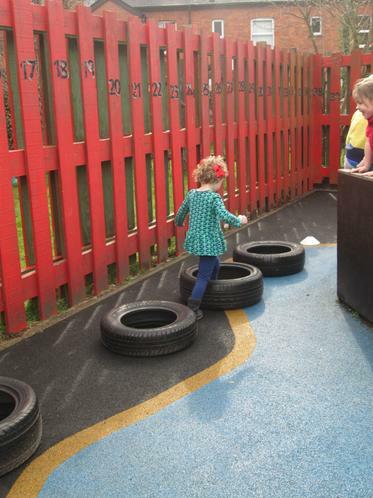 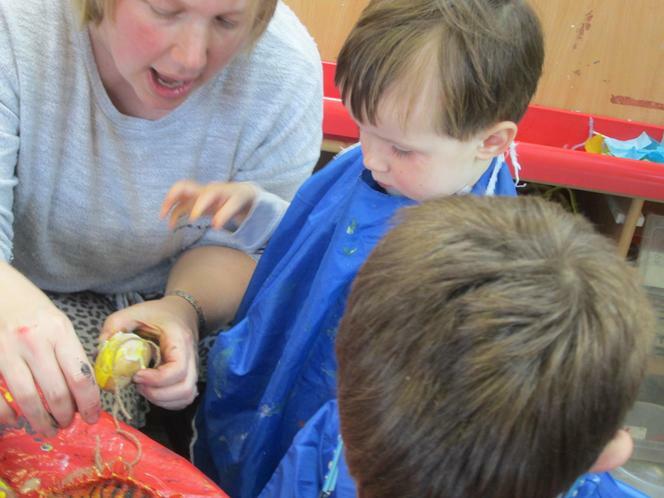 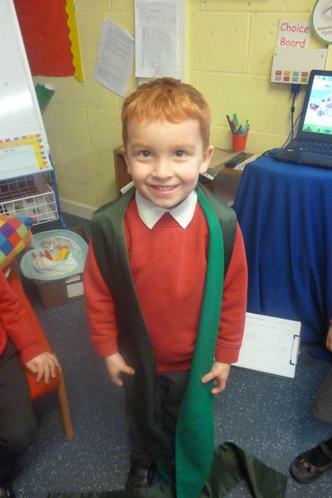 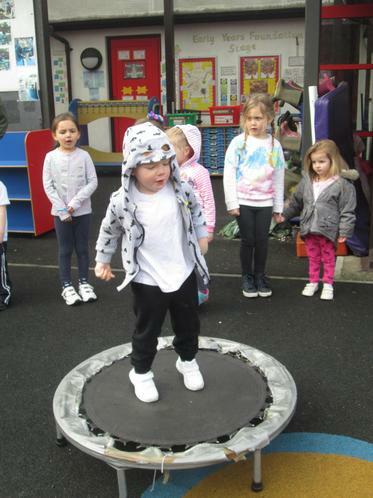 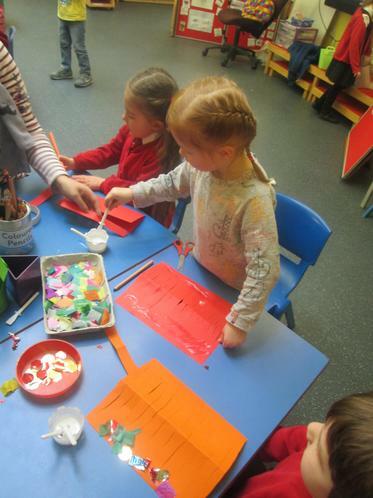 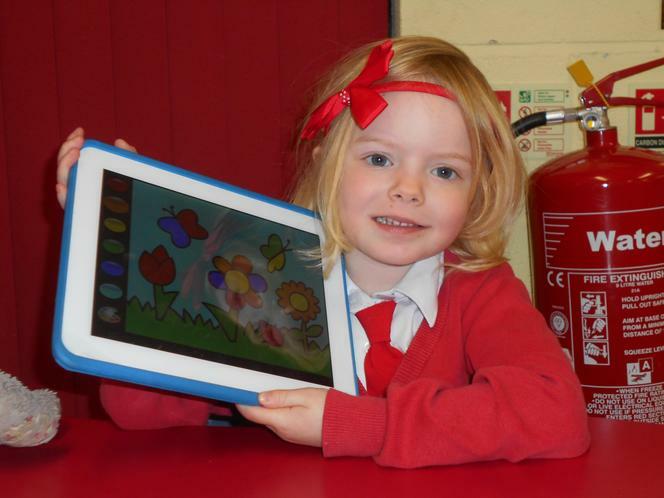 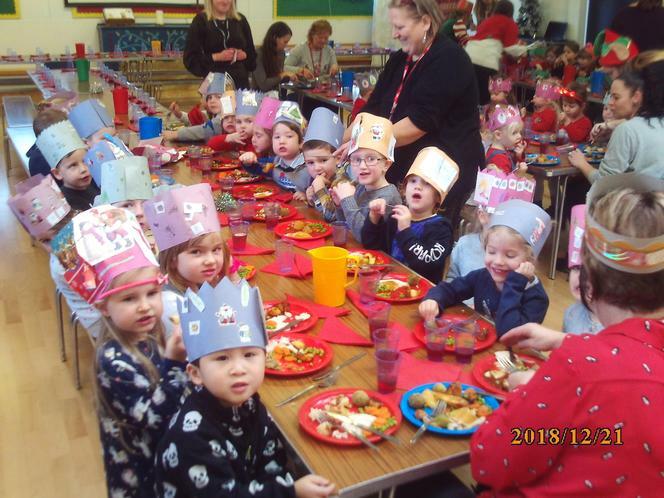 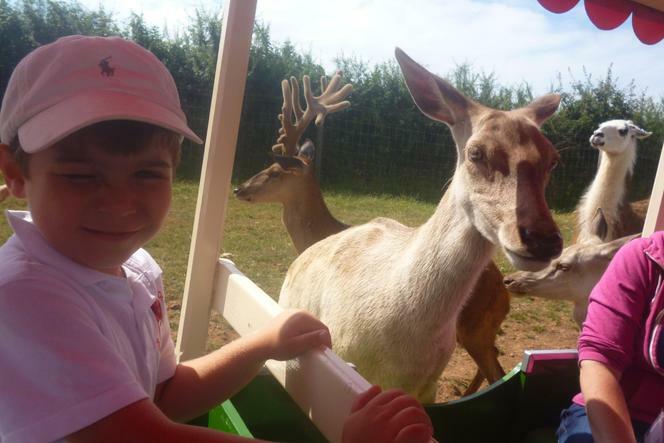 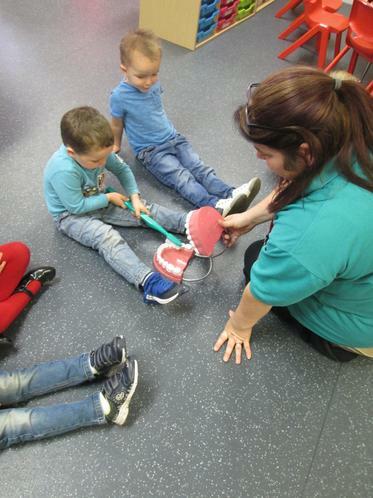 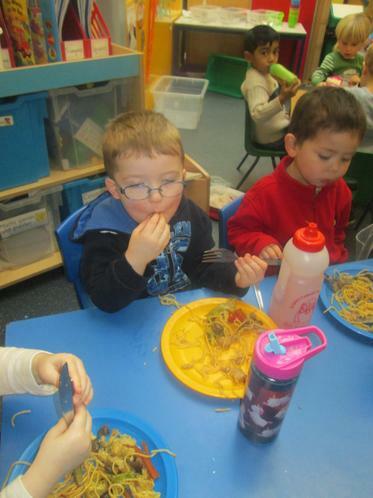 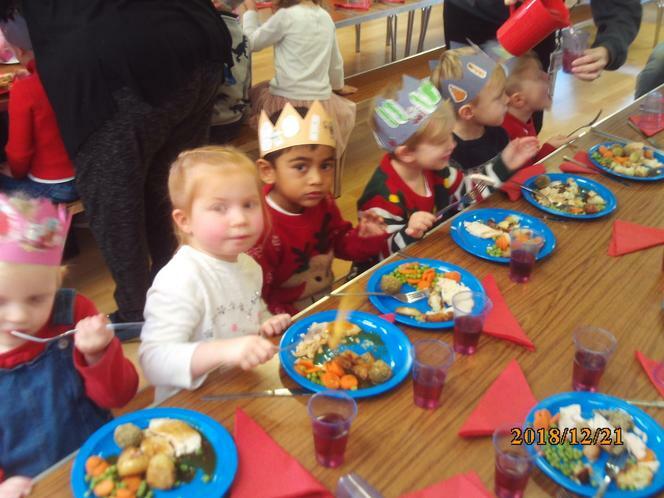 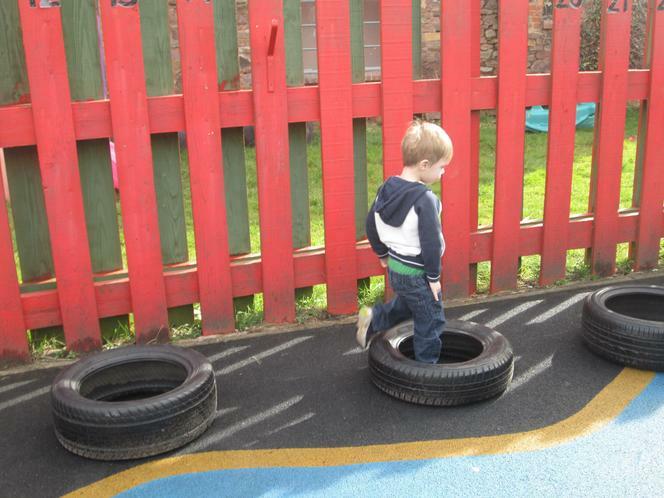 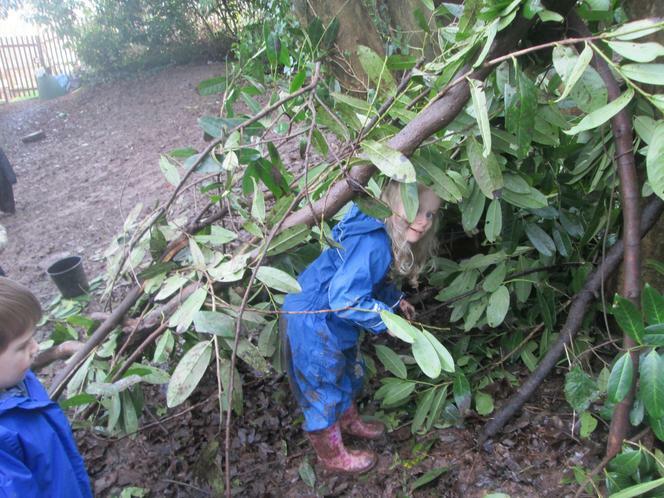 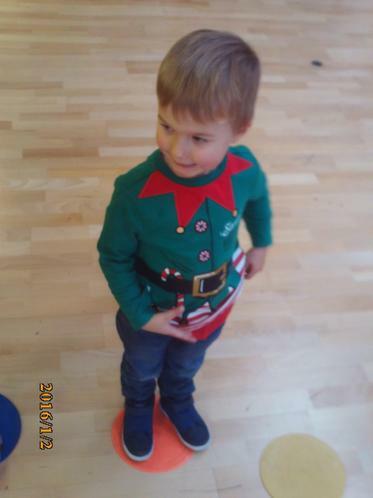 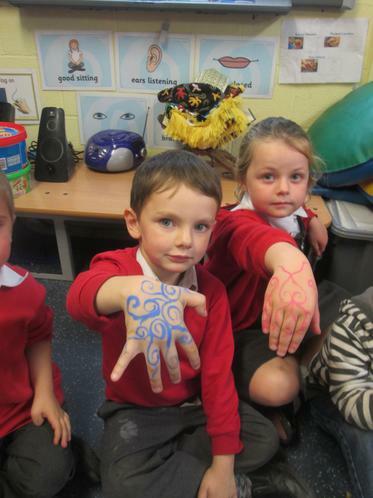 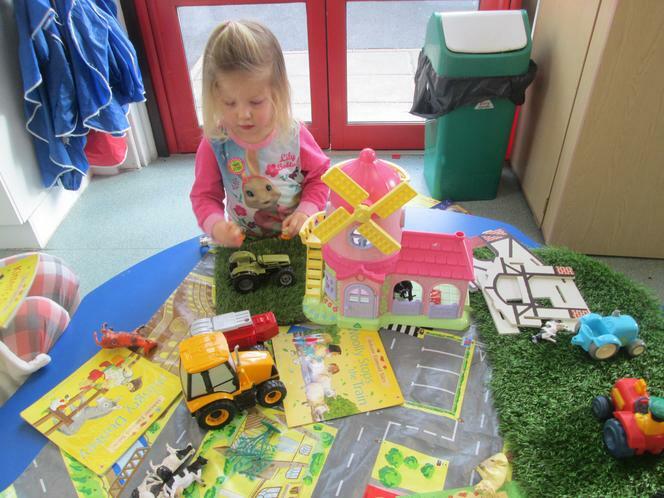 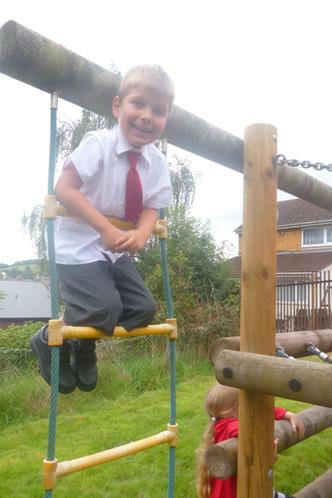 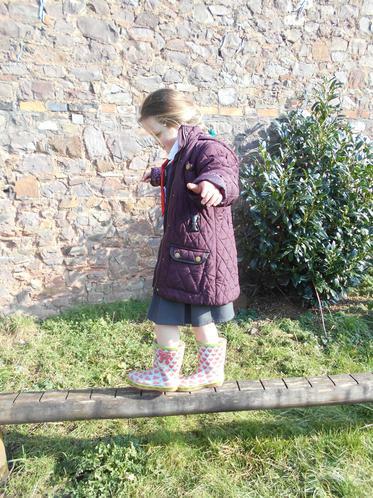 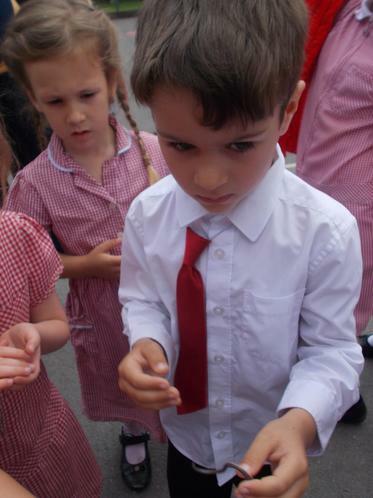 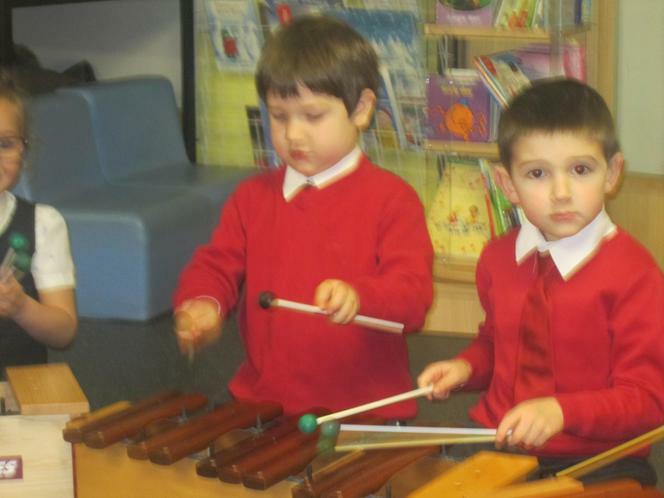 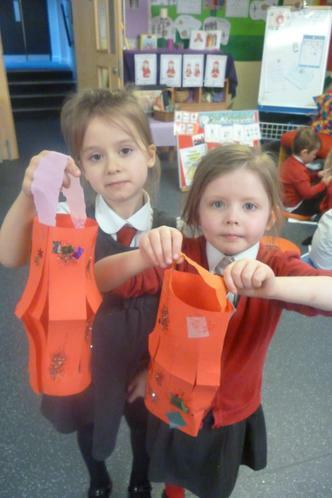 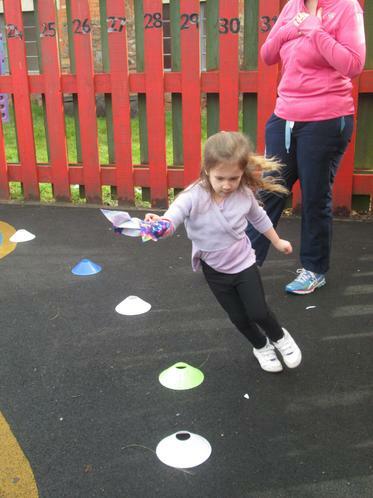 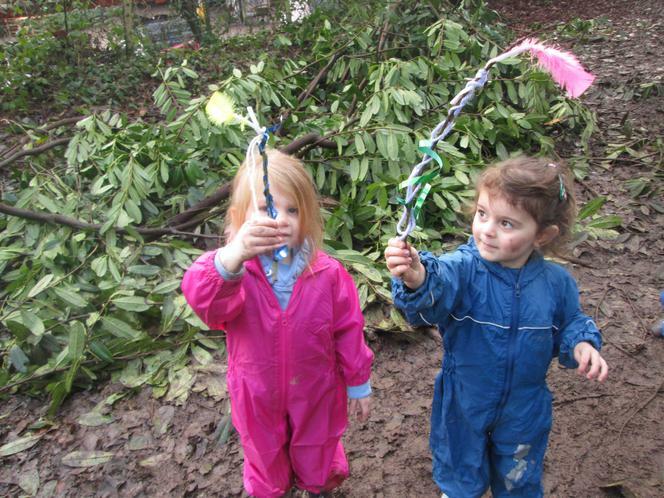 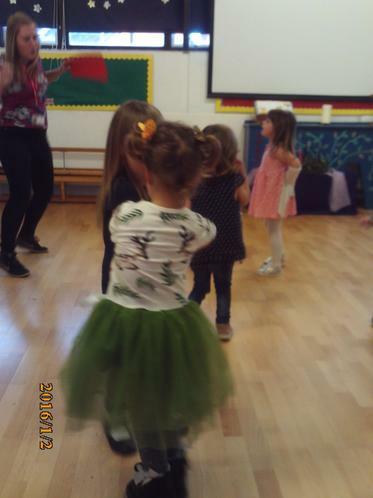 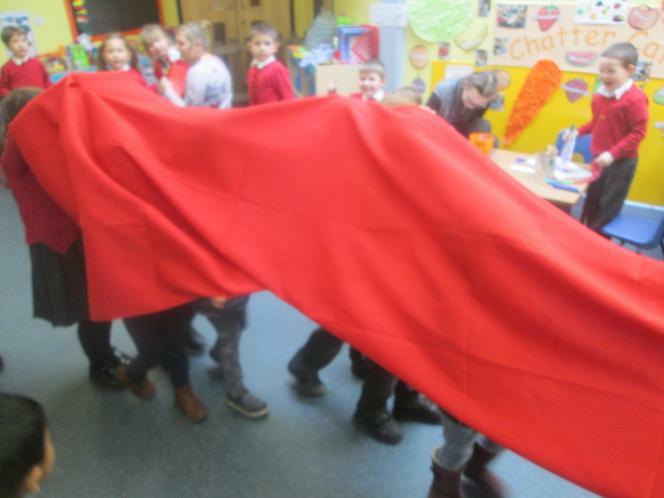 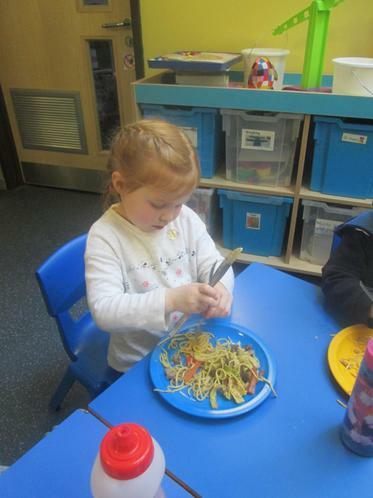 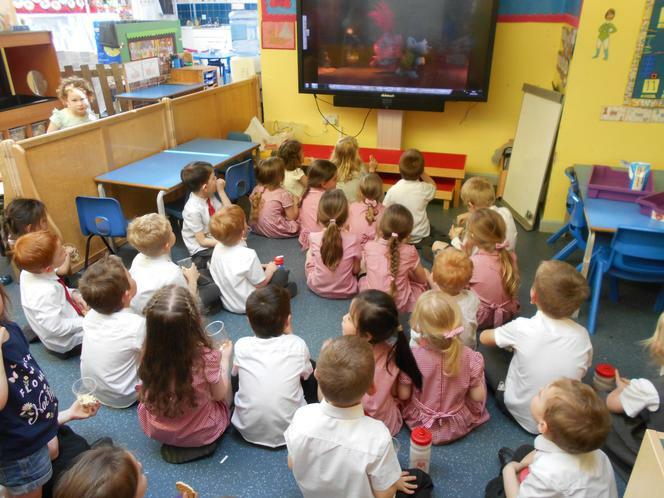 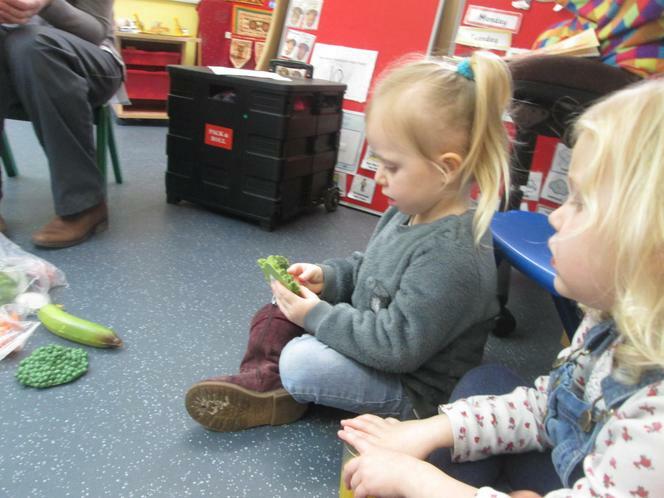 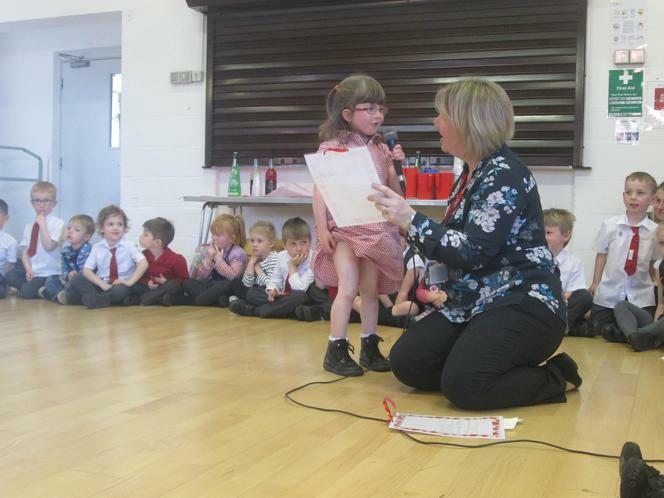 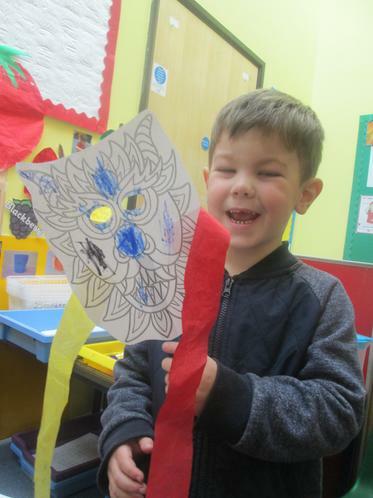 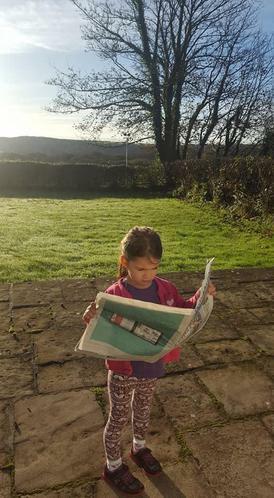 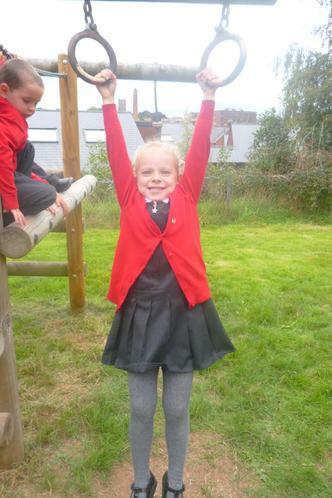 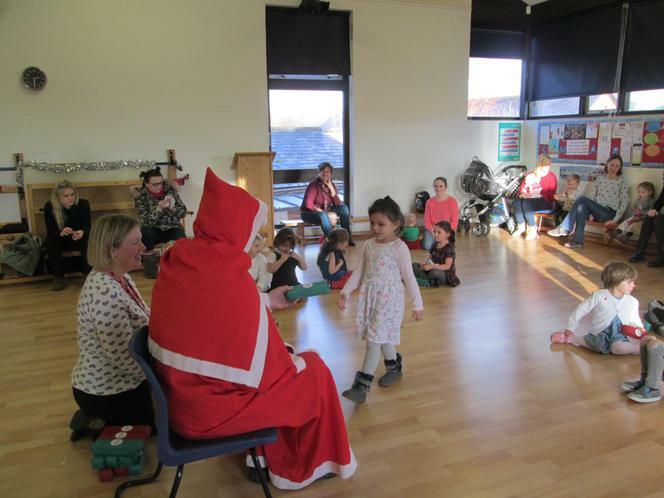 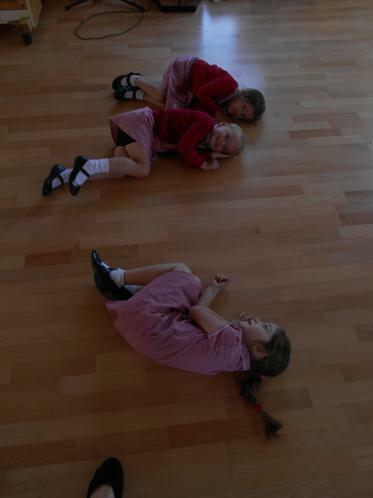 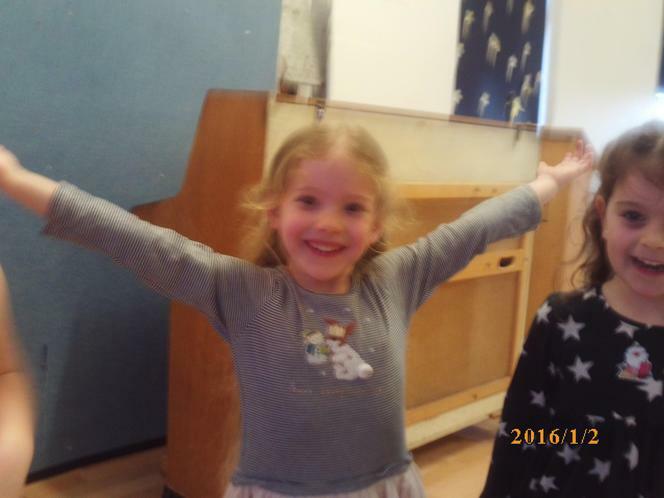 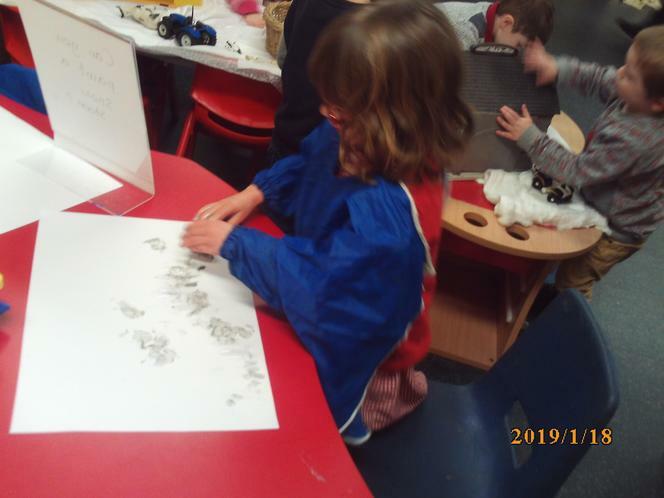 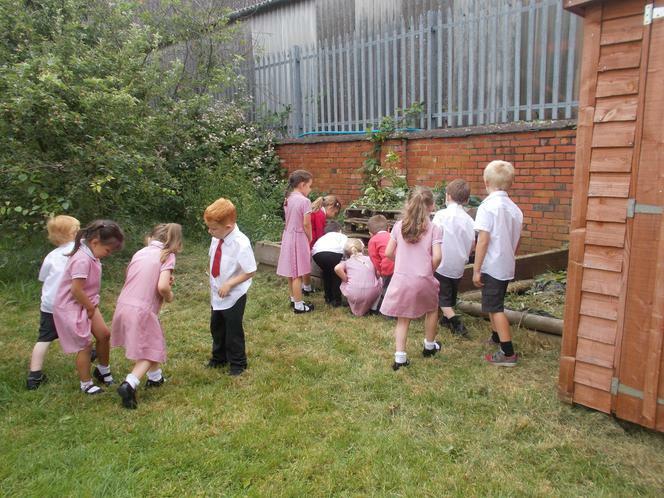 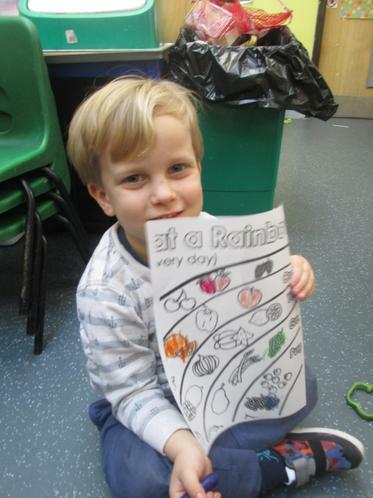 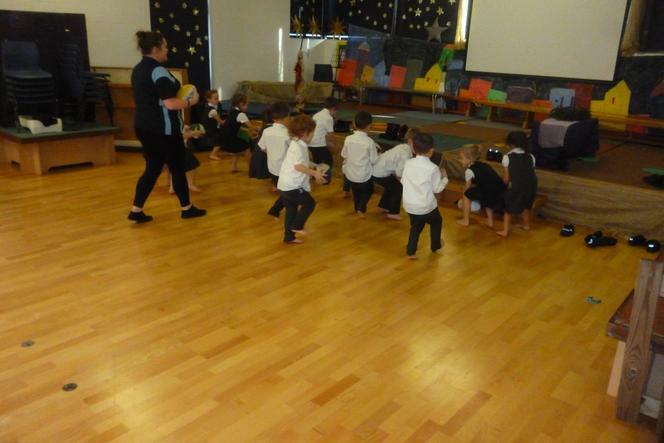 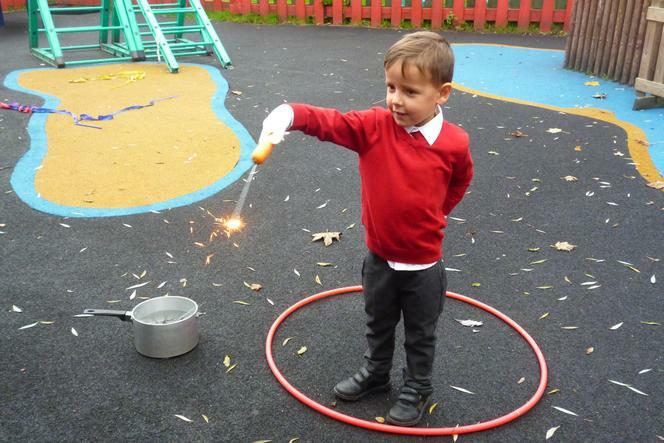 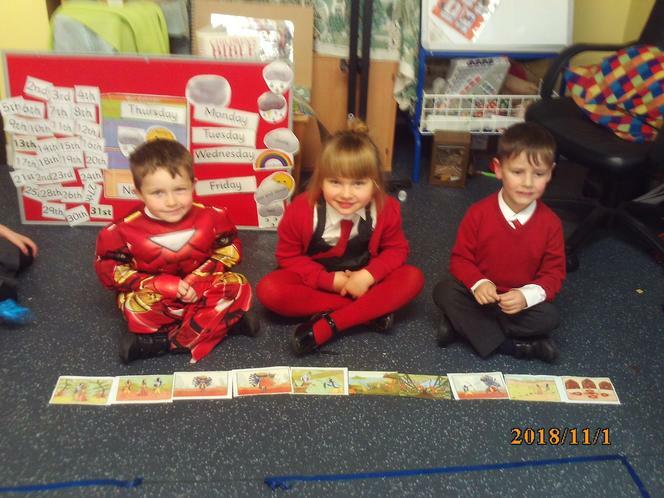 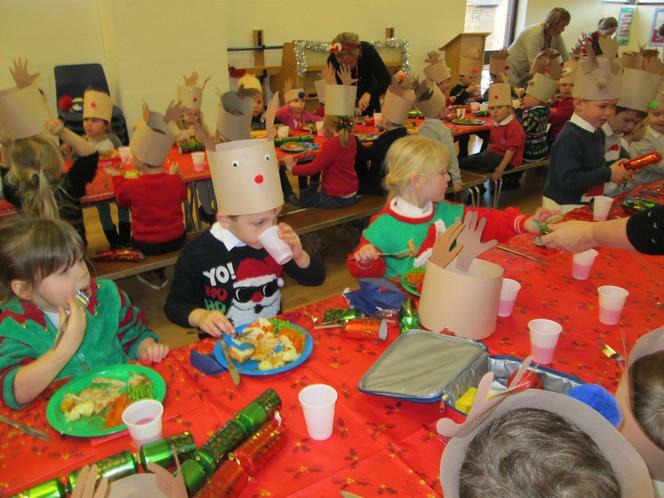 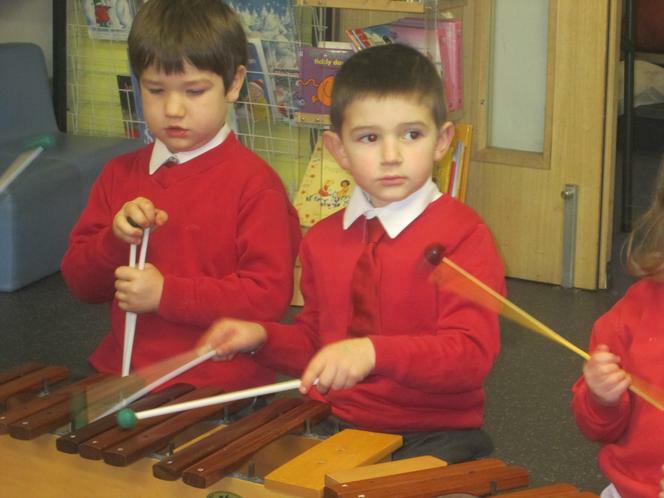 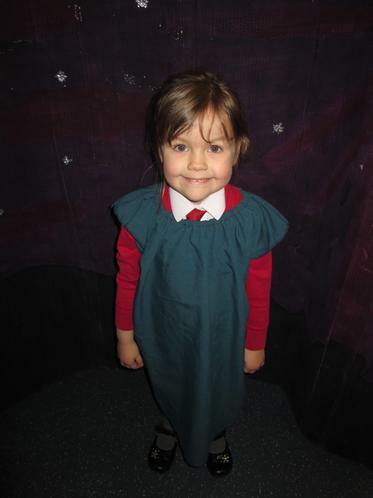 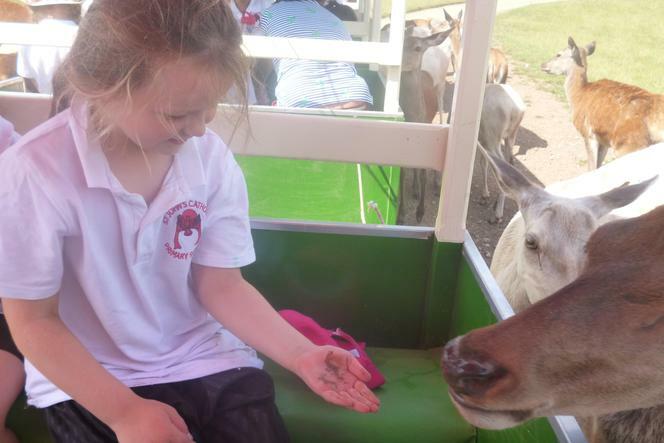 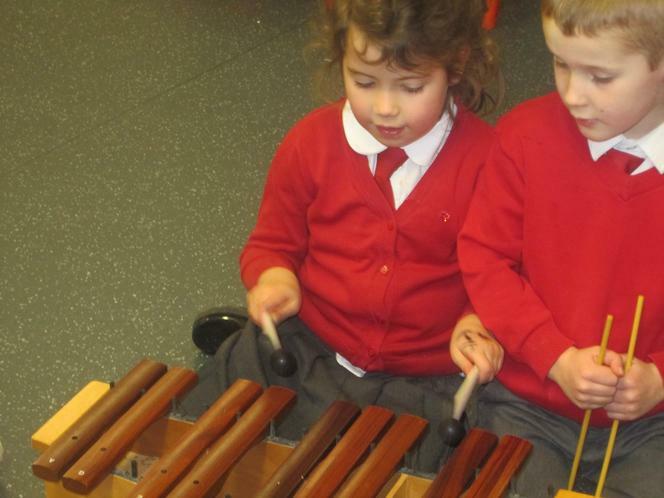 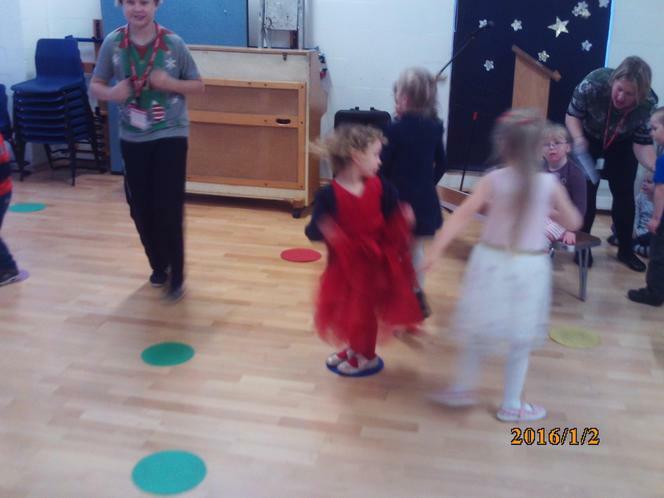 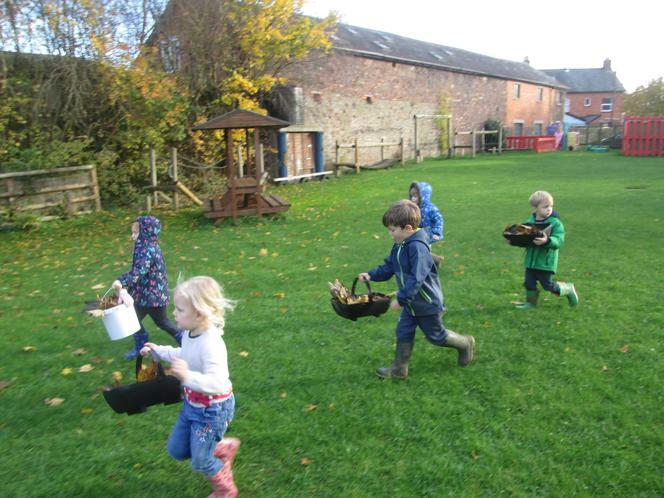 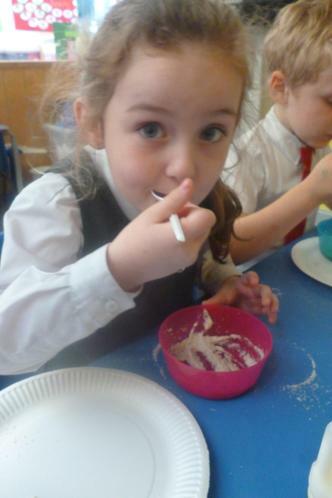 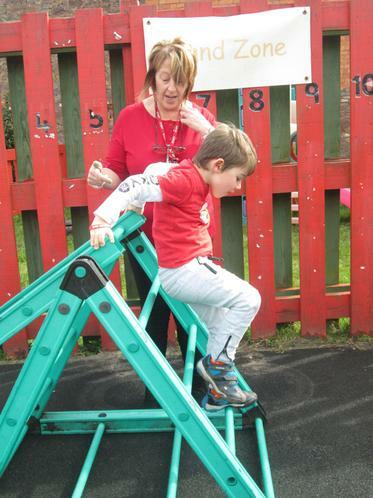 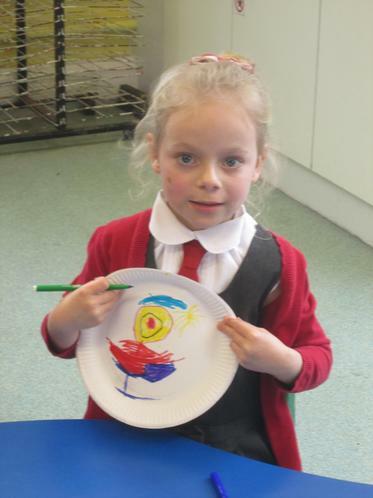 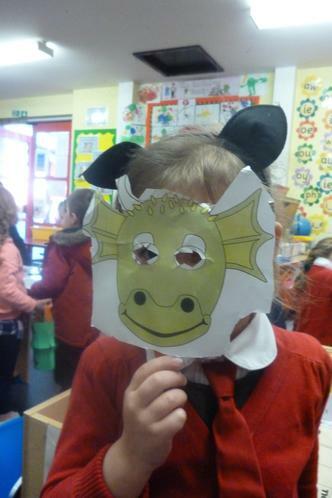 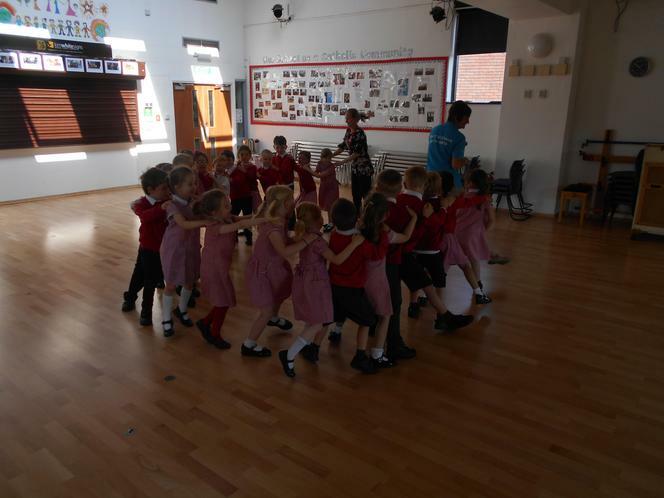 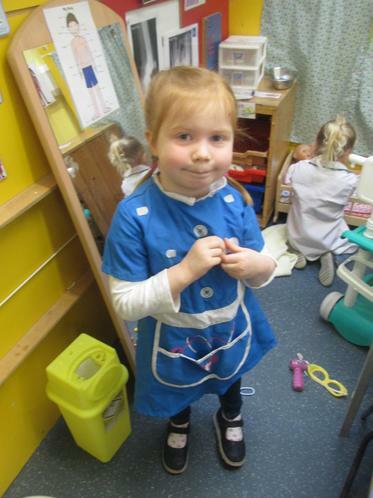 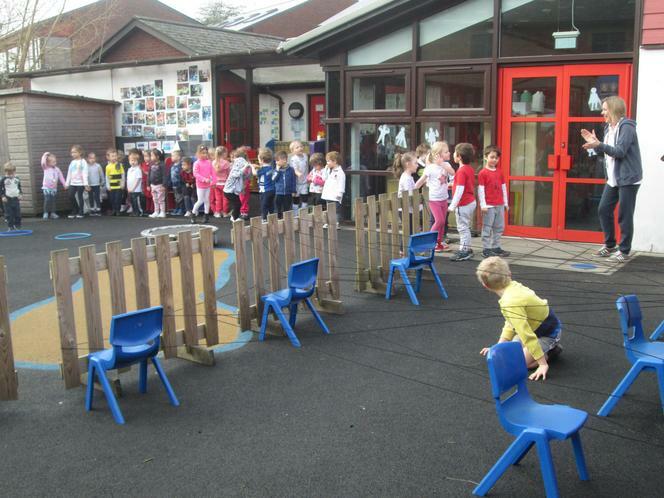 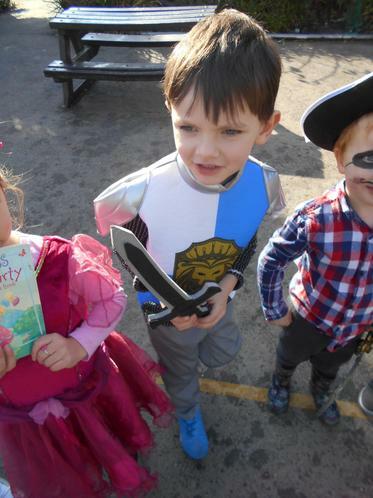 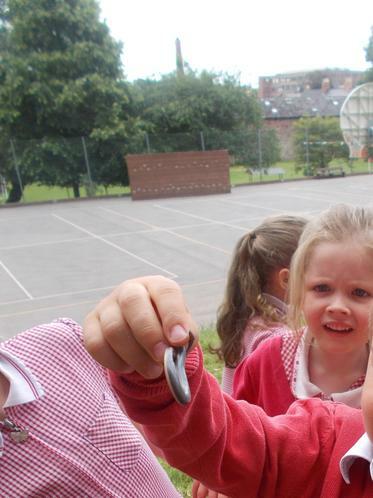 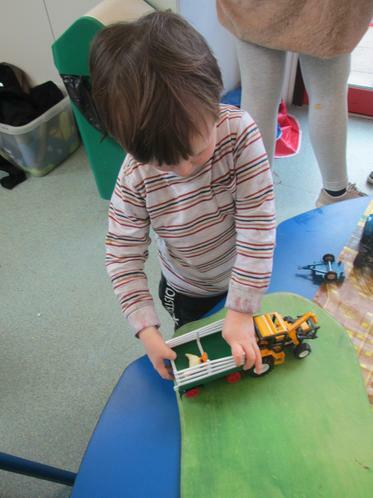 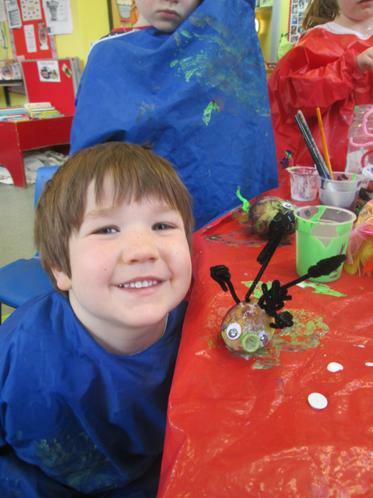 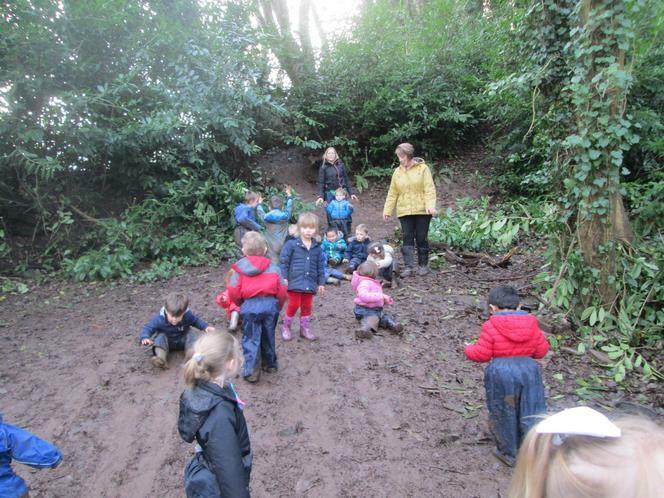 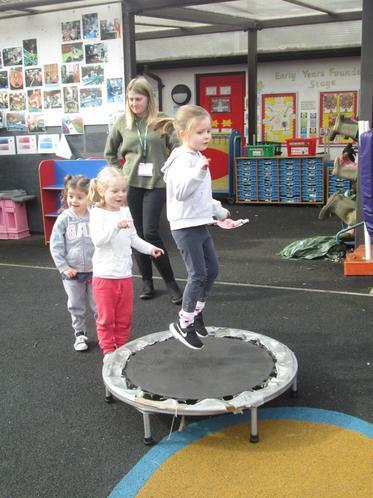 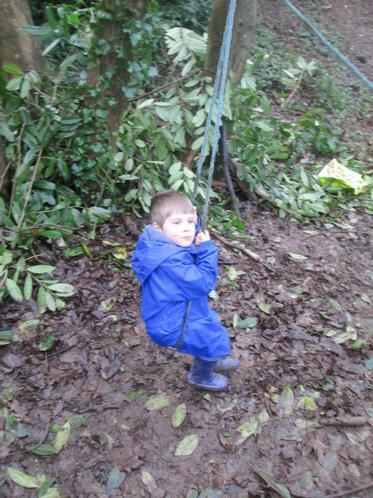 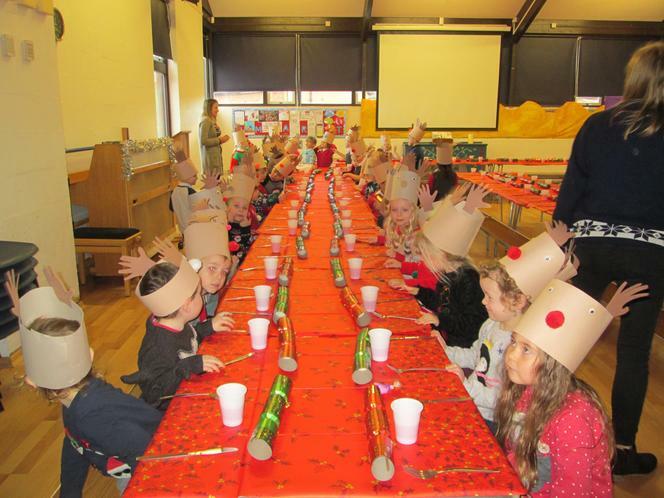 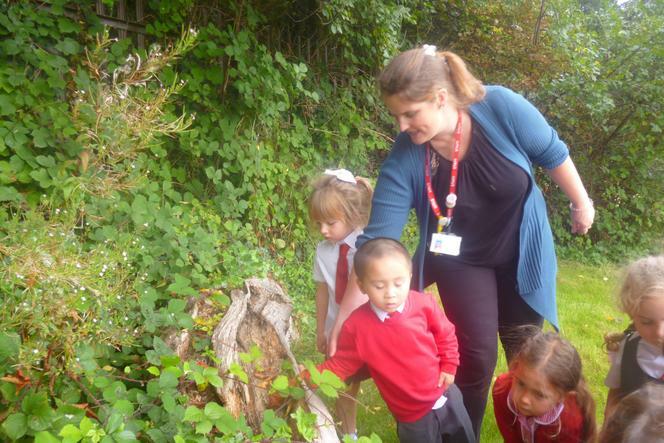 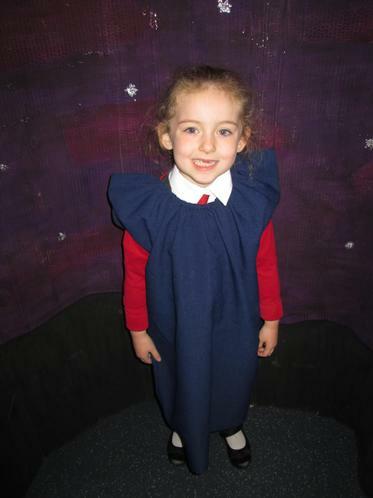 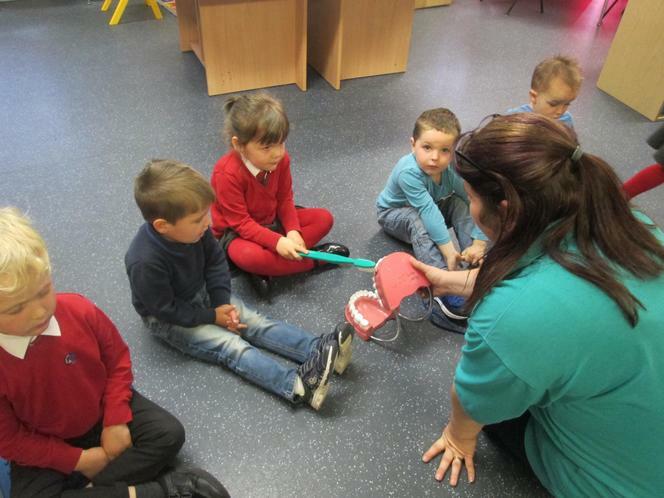 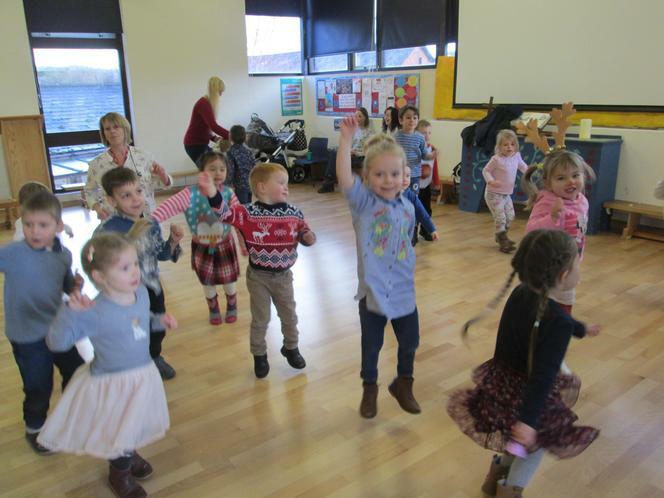 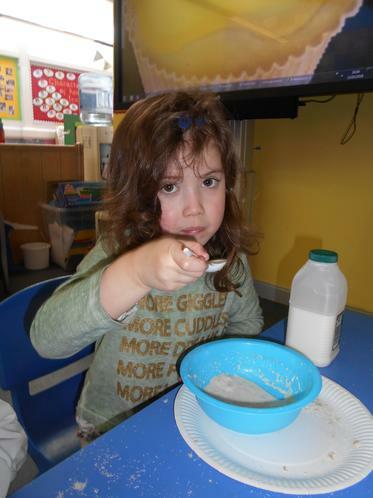 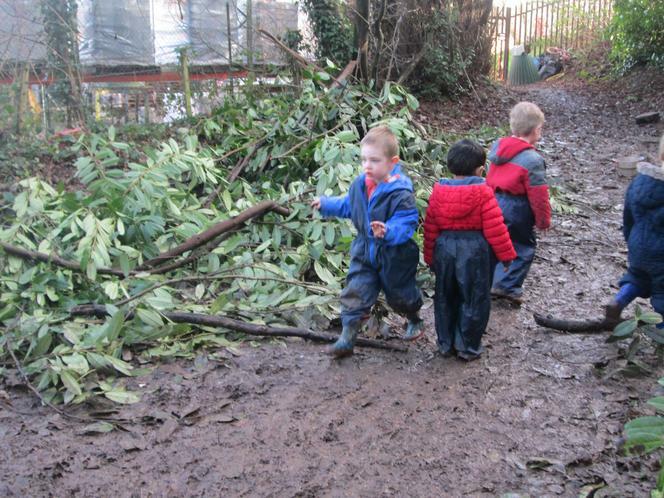 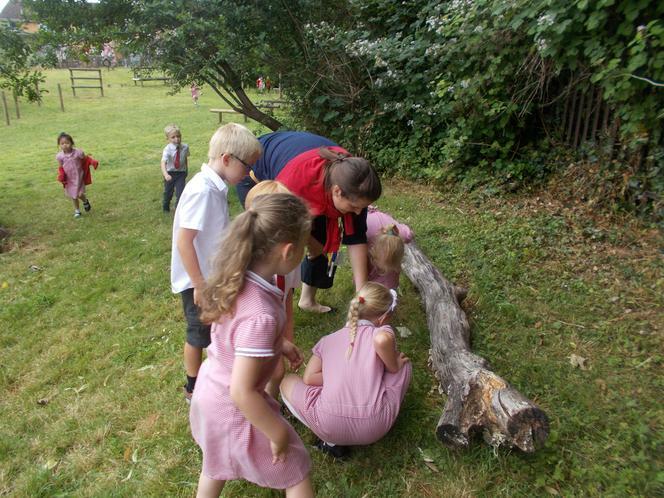 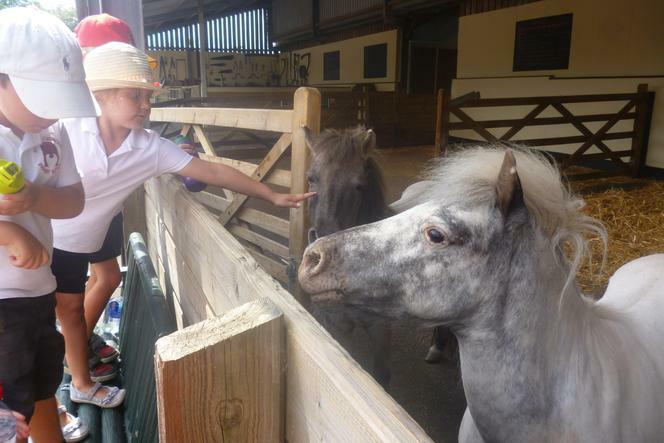 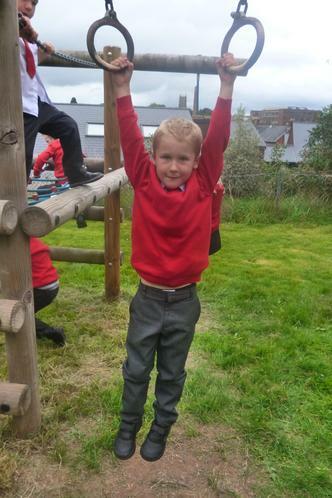 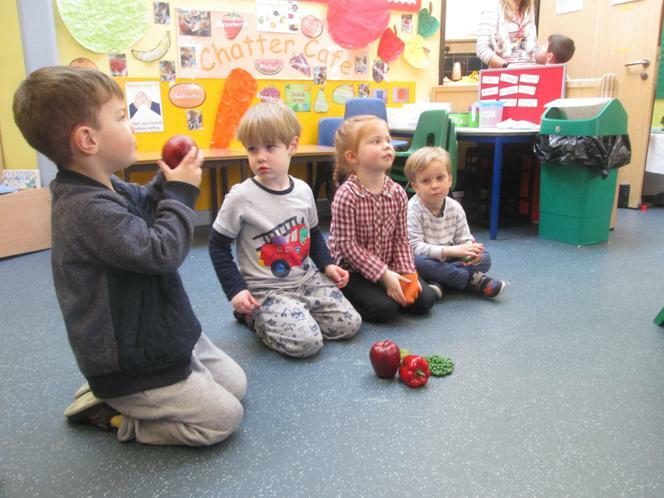 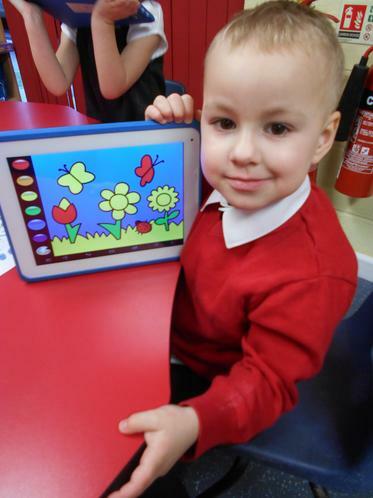 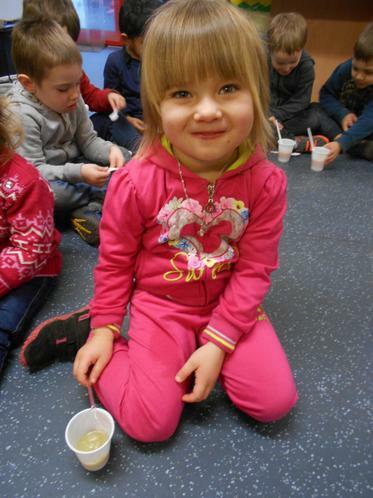 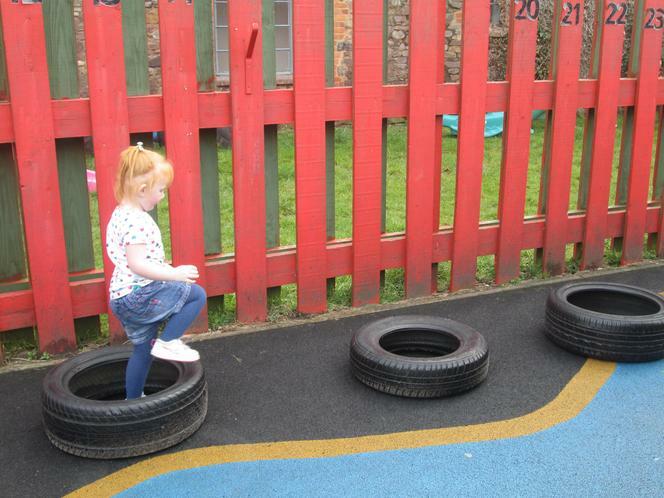 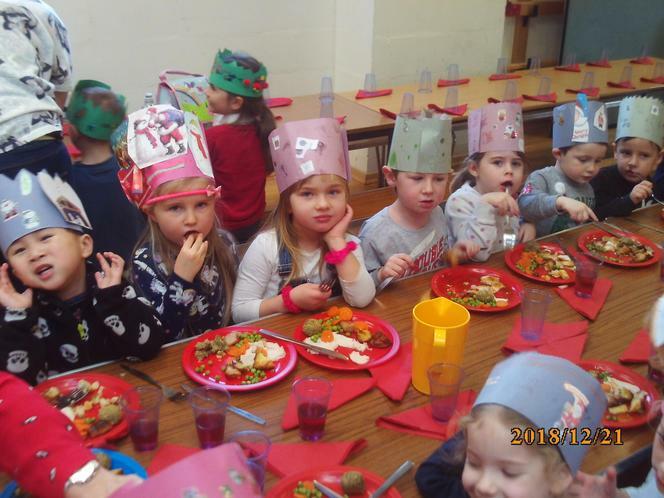 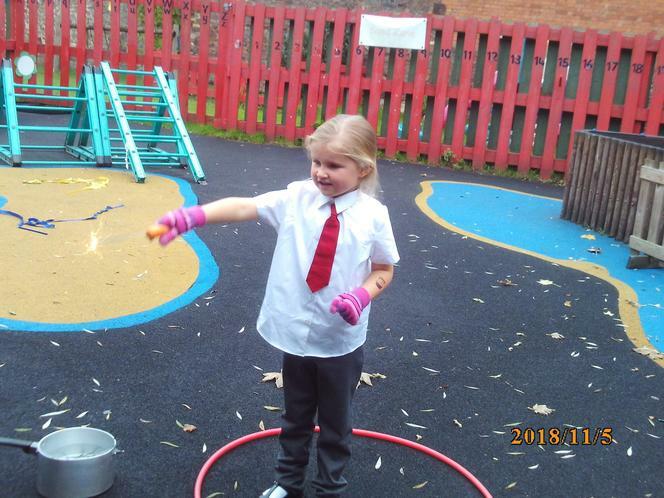 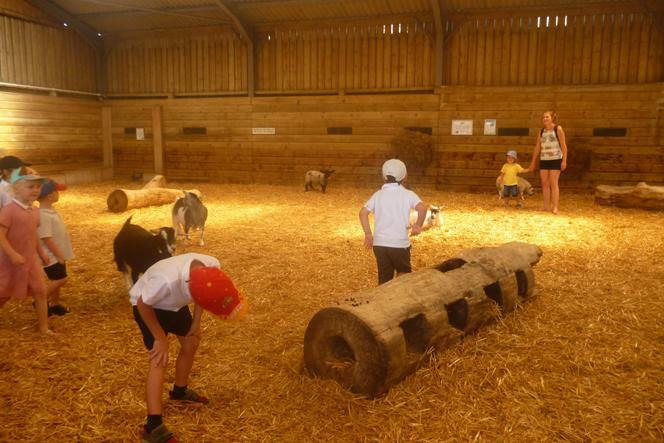 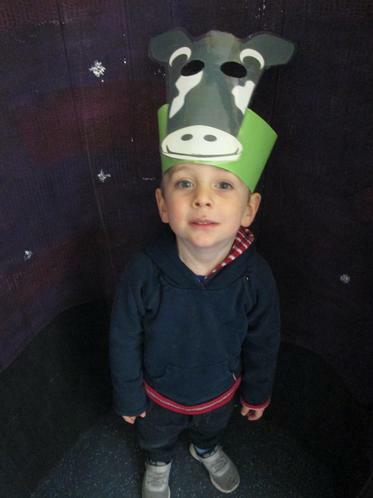 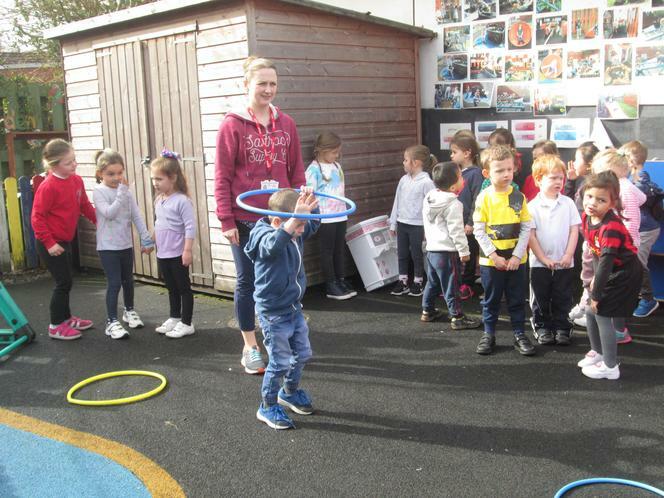 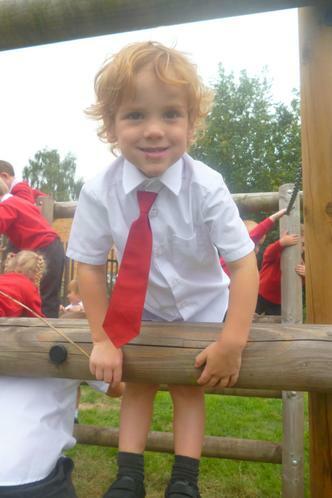 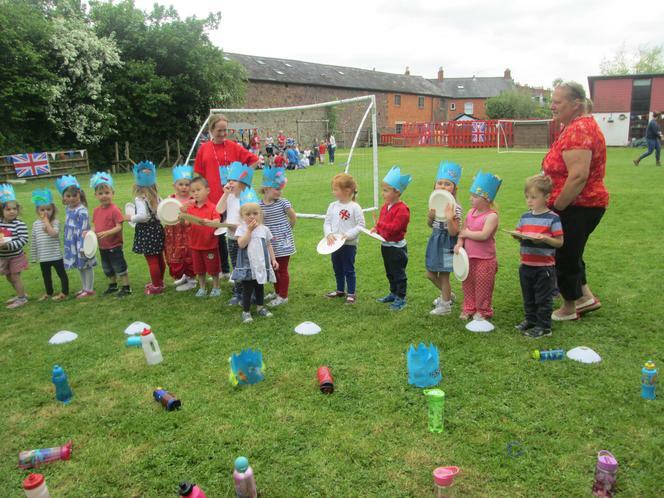 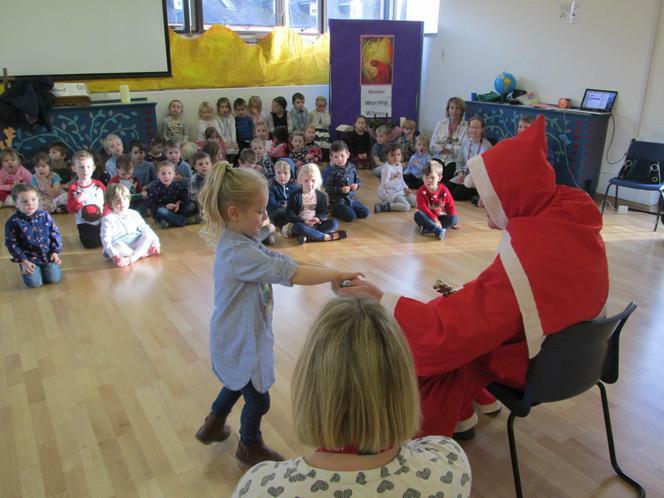 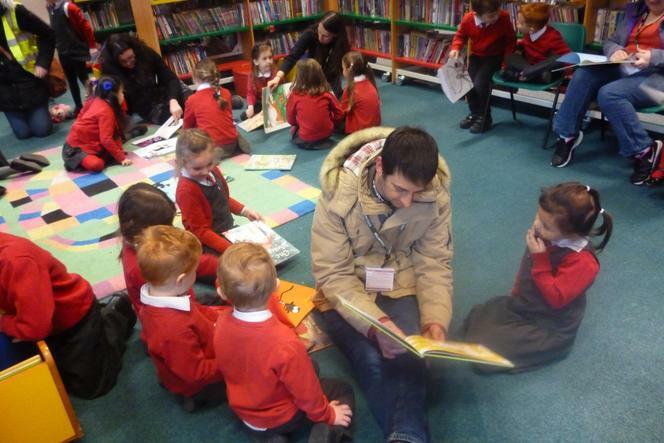 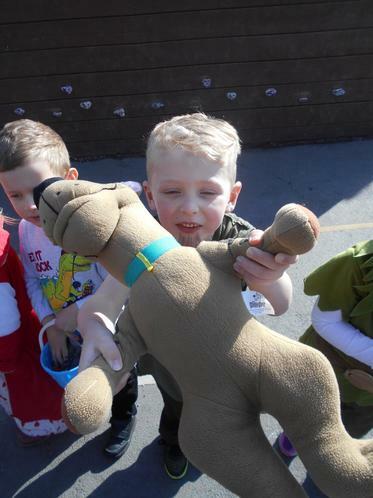 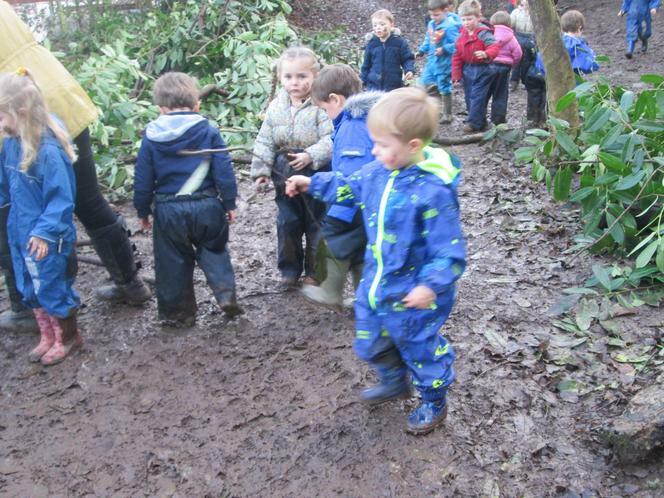 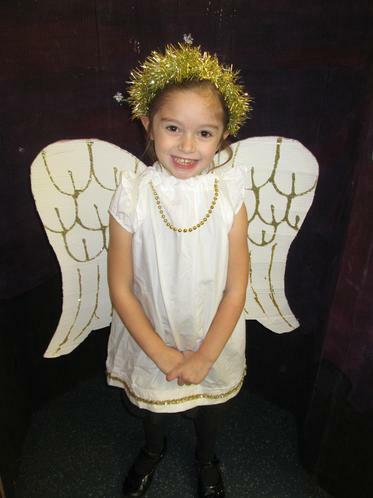 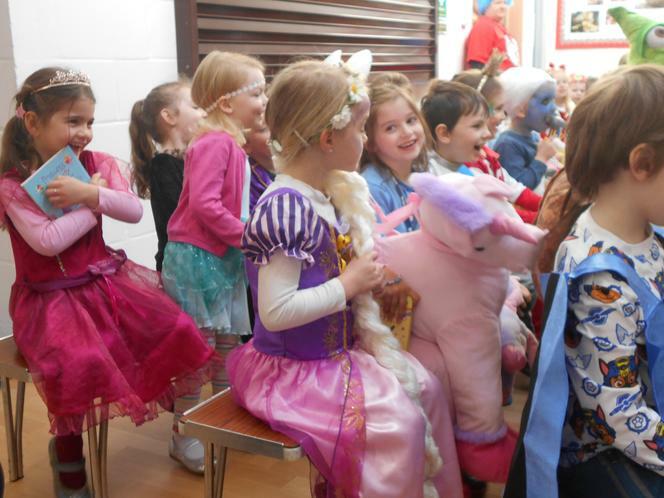 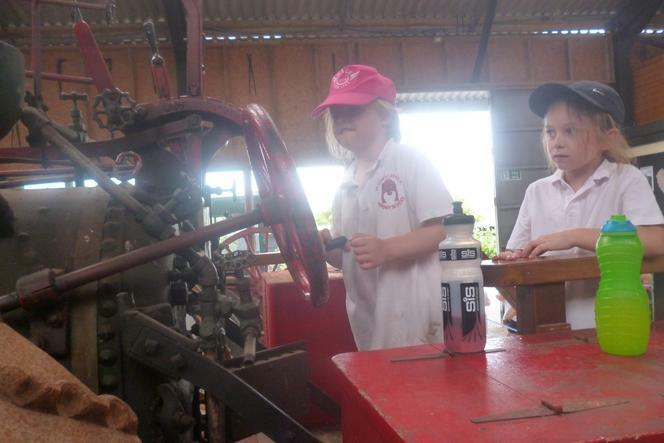 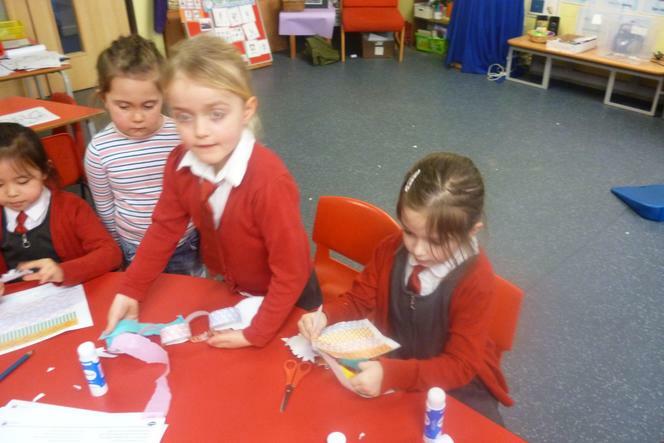 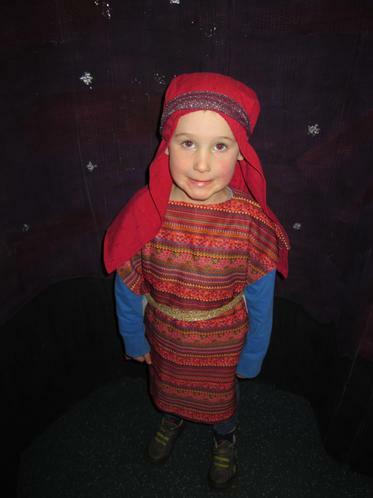 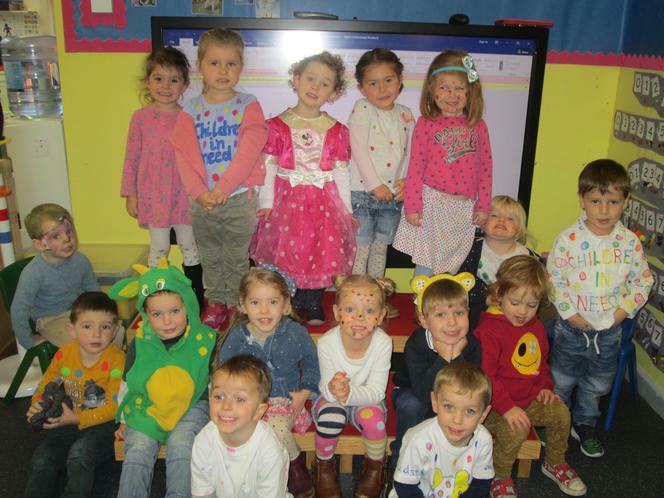 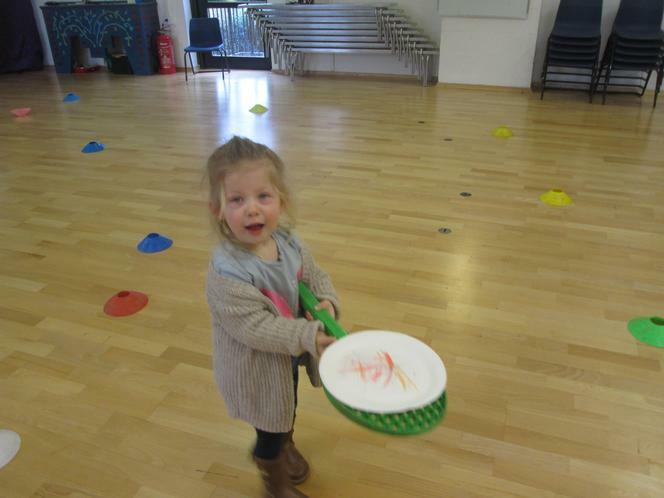 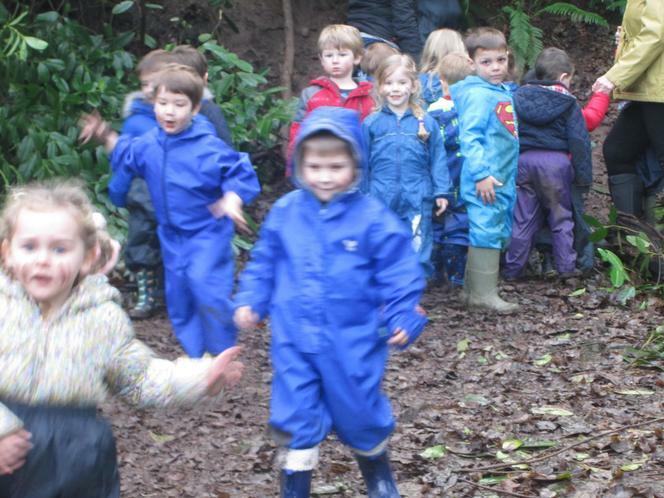 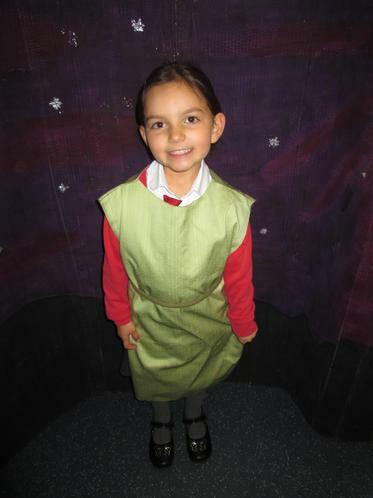 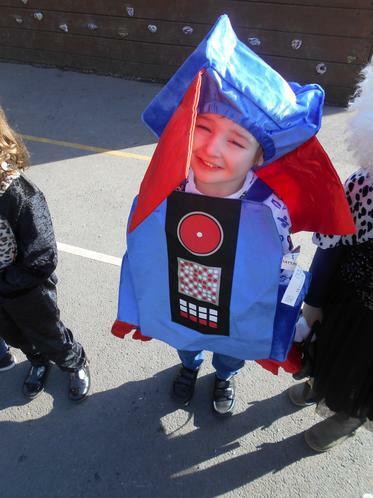 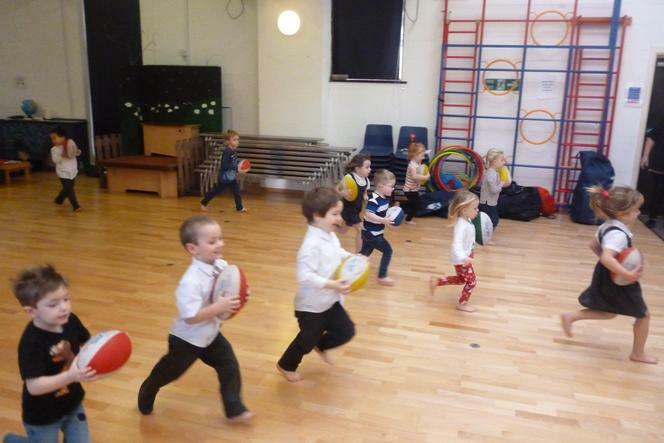 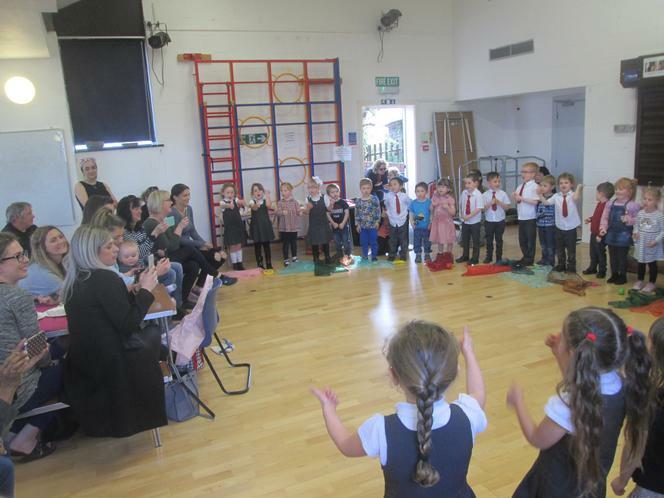 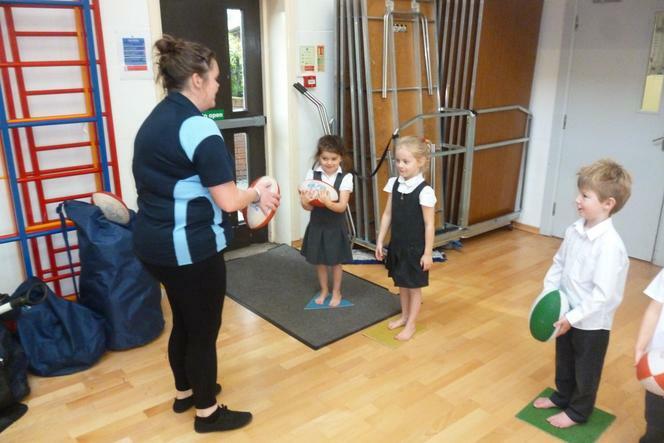 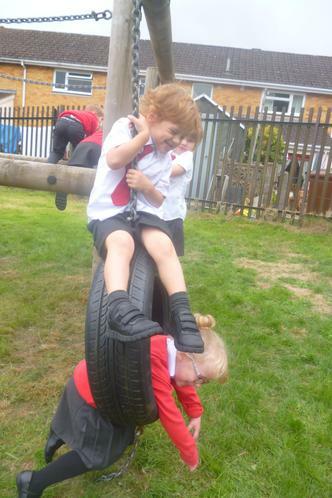 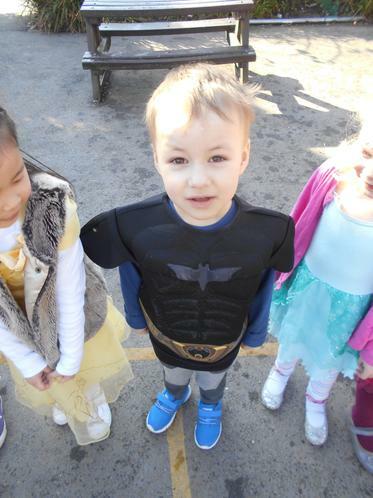 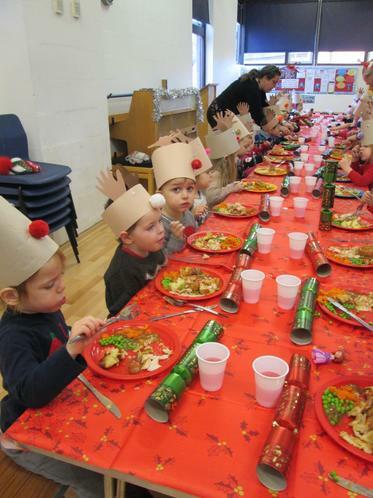 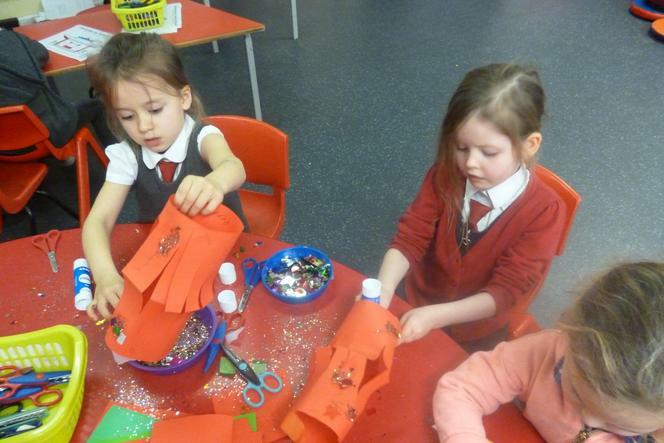 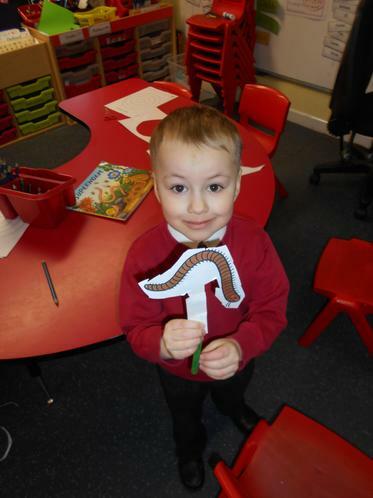 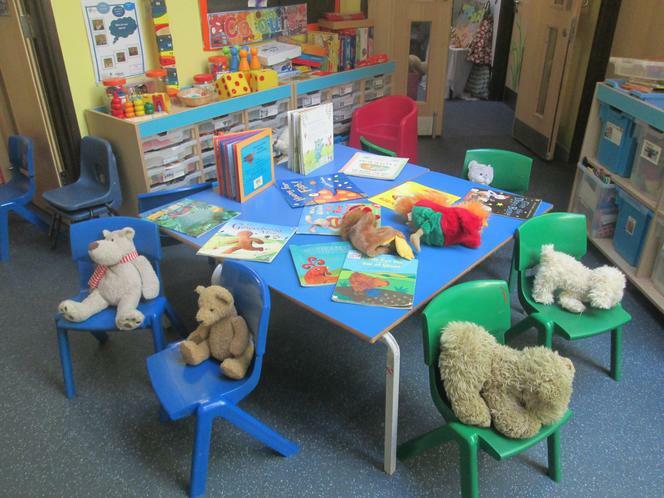 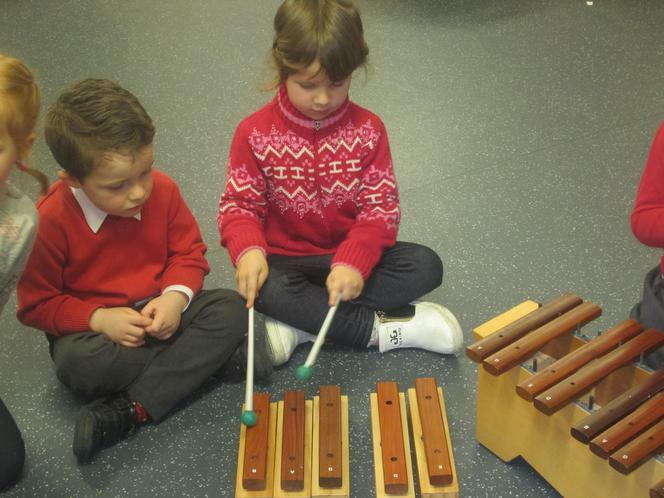 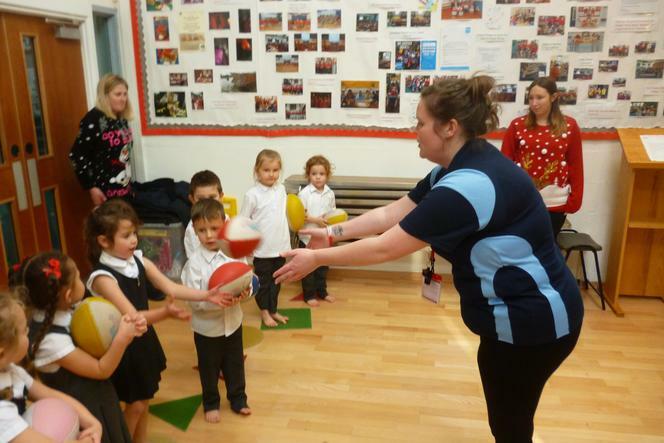 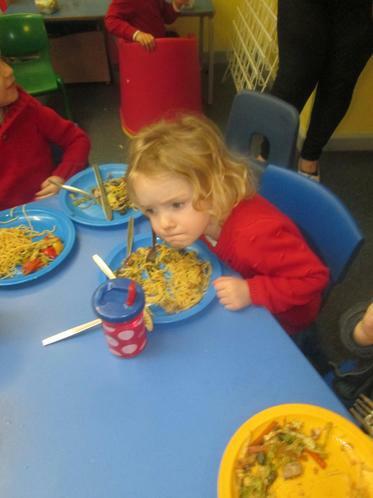 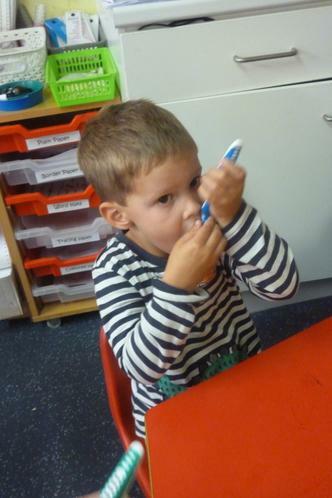 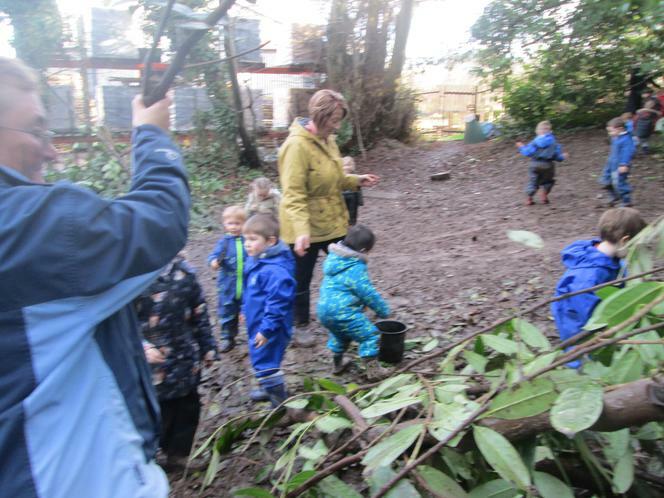 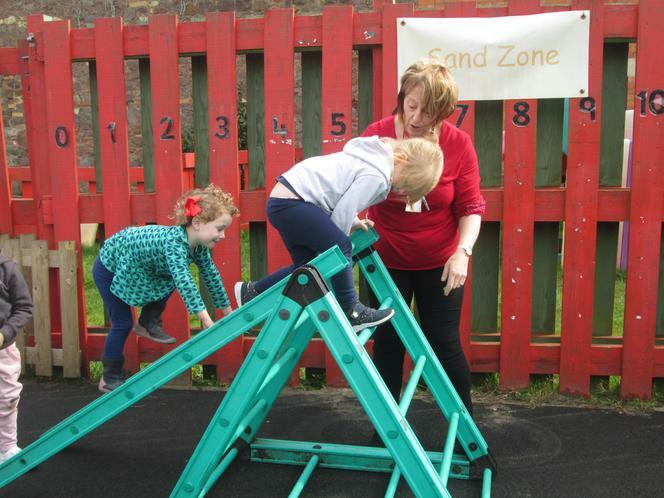 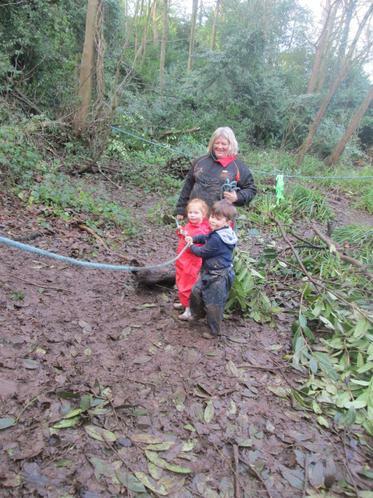 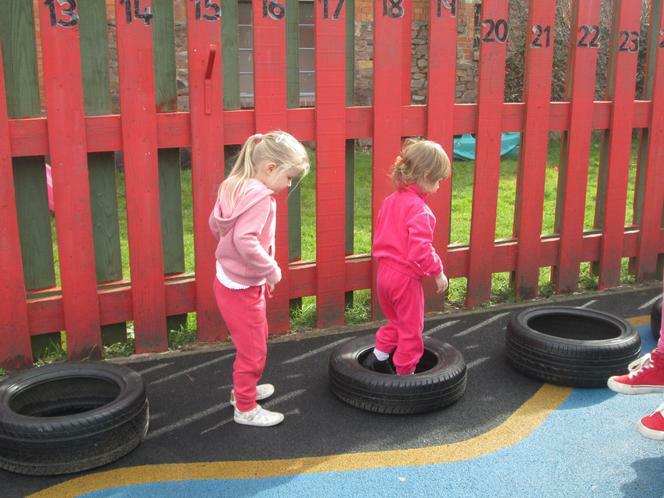 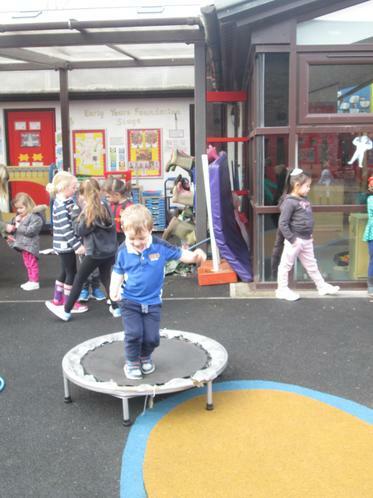 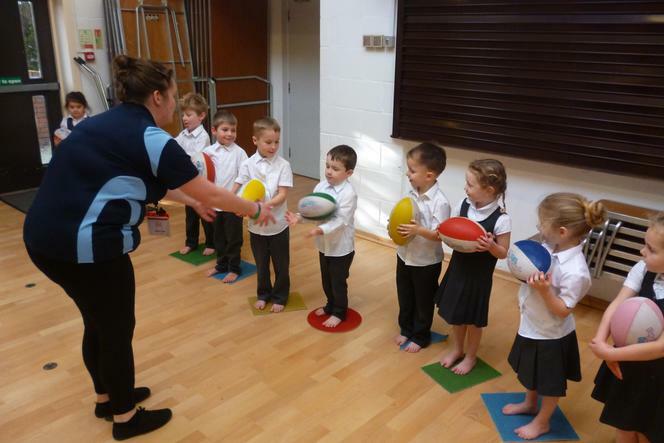 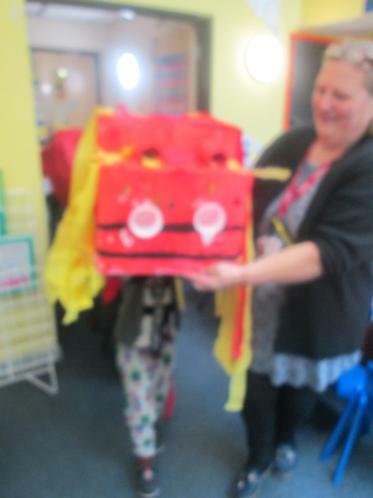 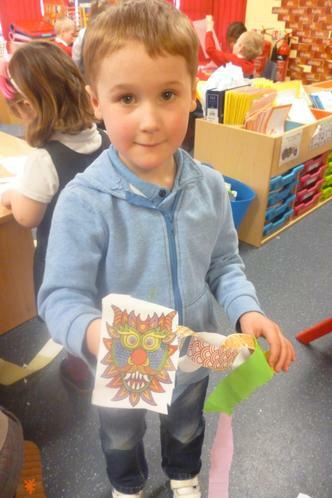 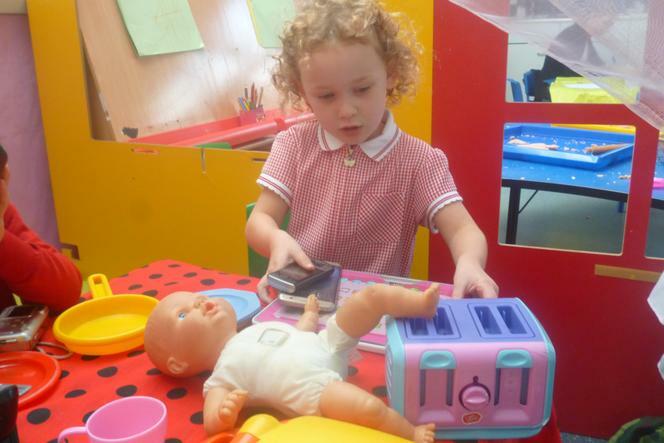 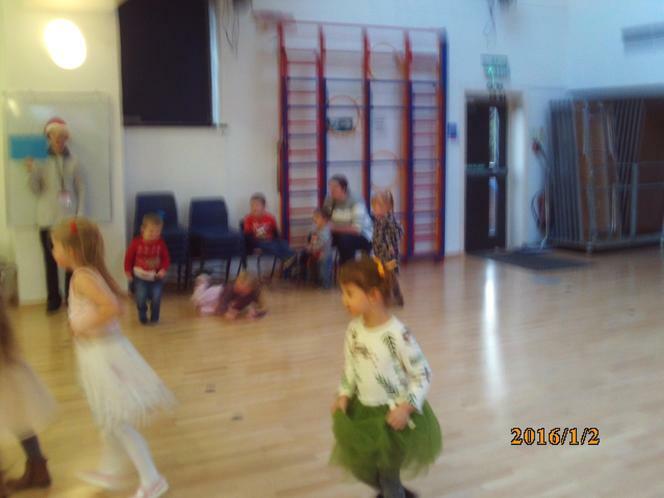 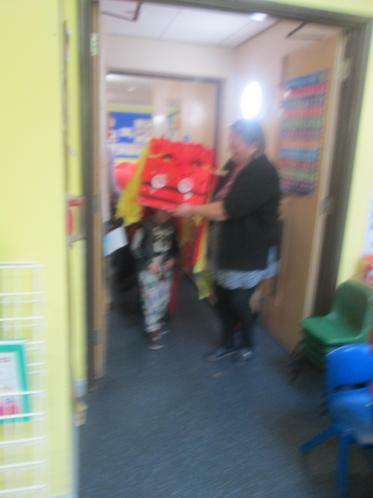 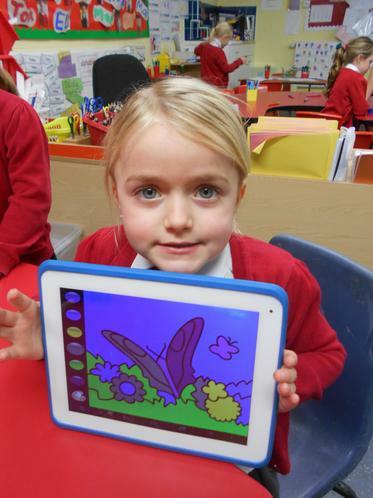 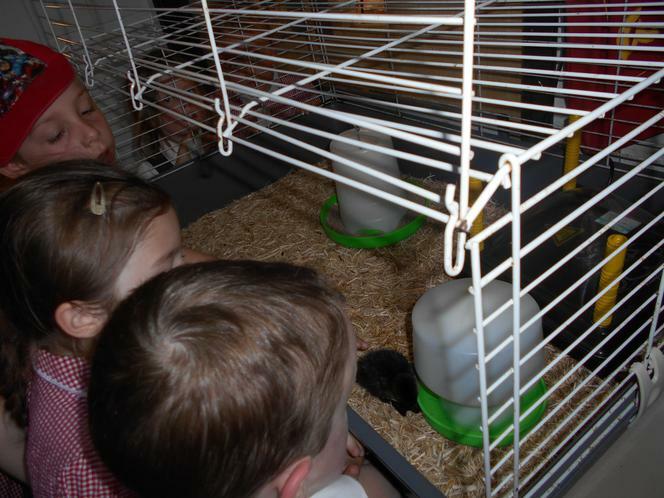 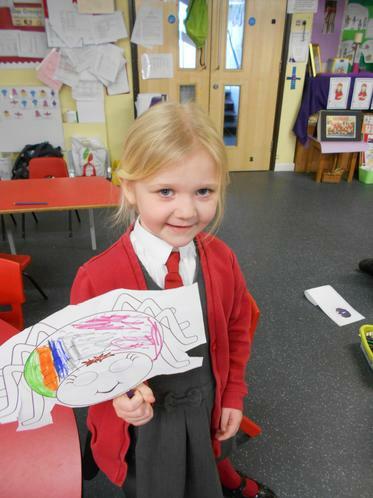 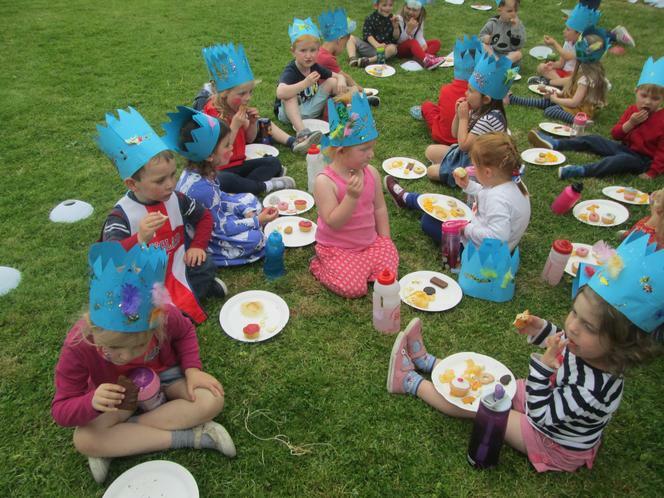 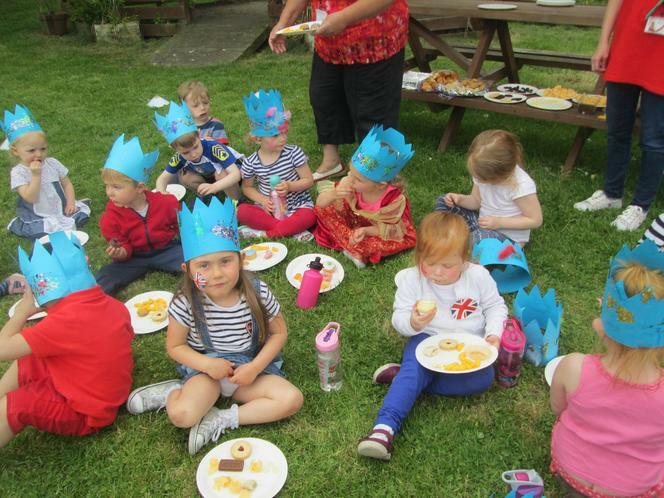 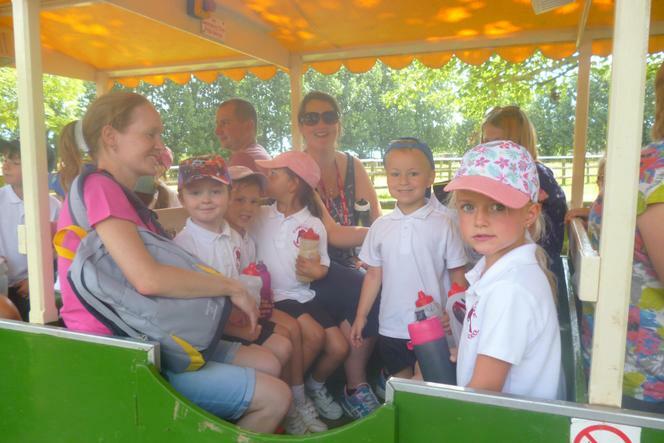 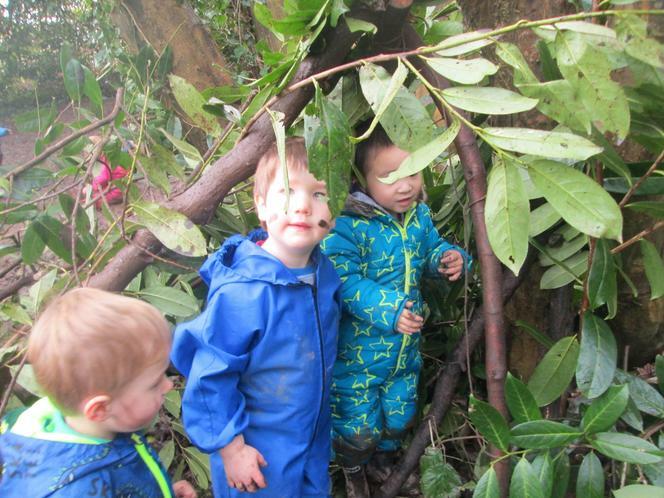 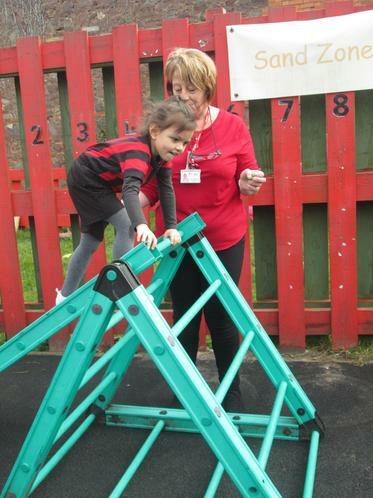 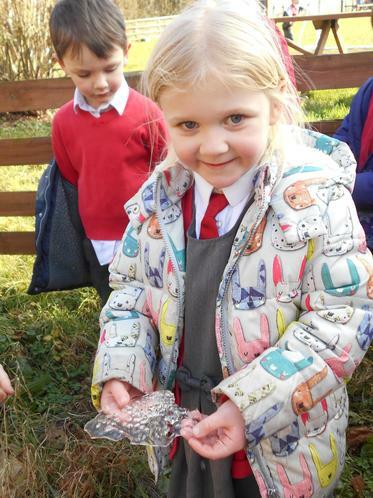 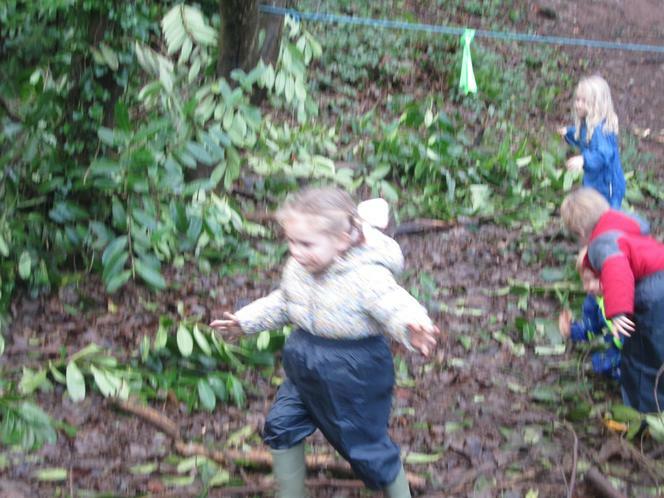 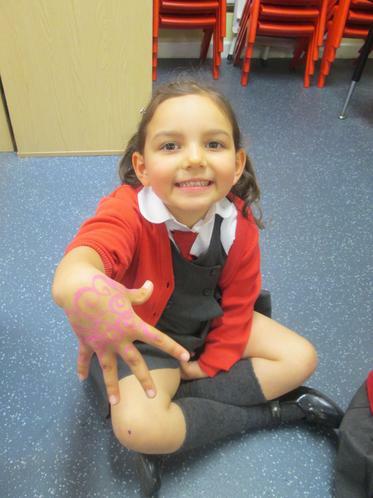 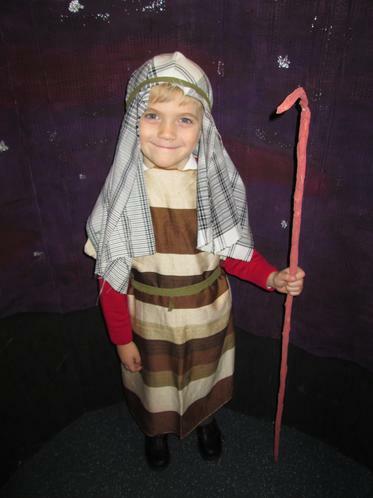 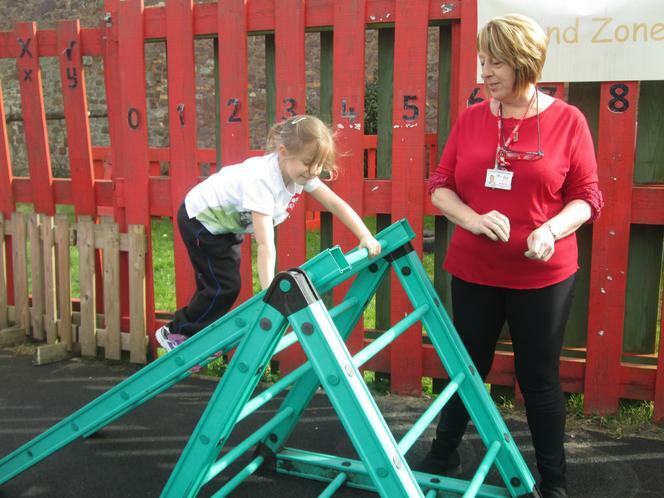 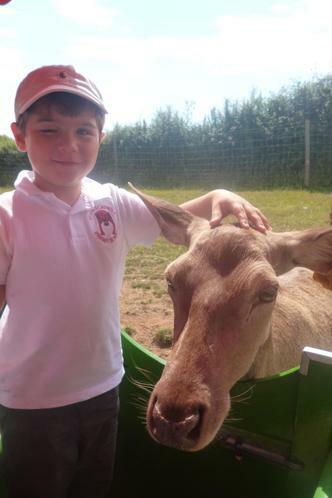 Follow the link below to see St John's Big Acorns class. 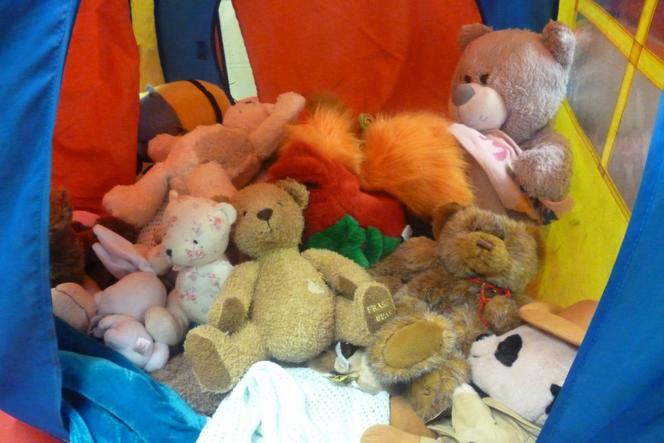 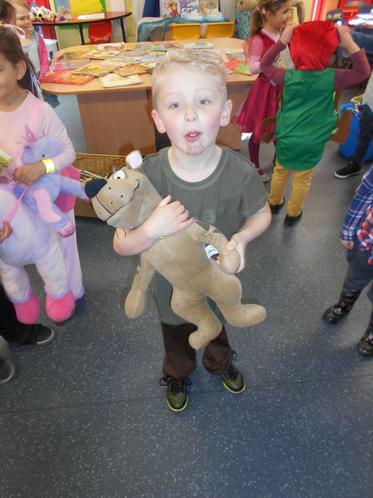 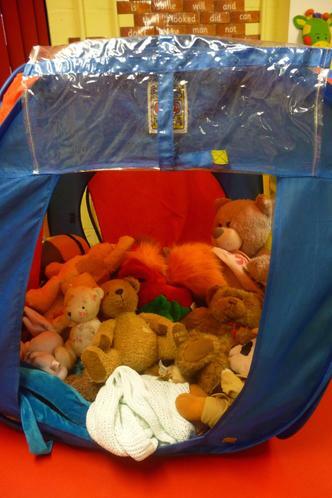 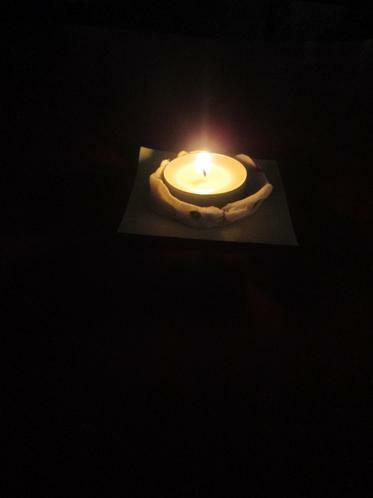 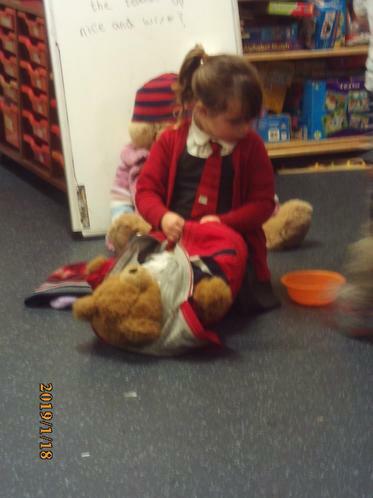 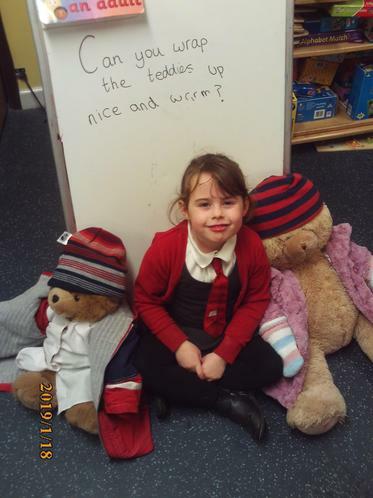 Big Acorns held a Teddy Bear Sleepout raising money for CHAT (Churches Housing Action Team).